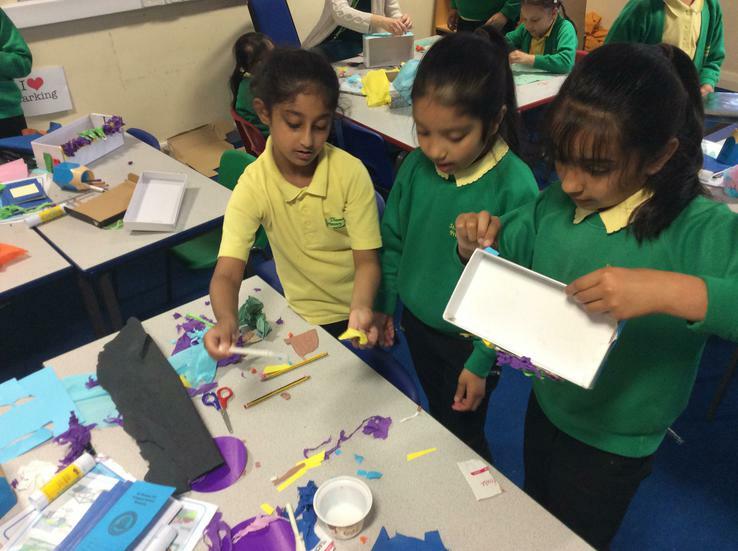 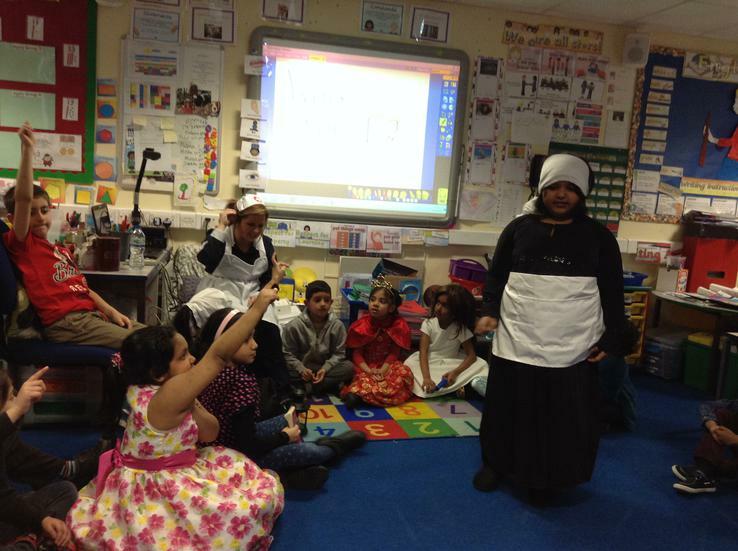 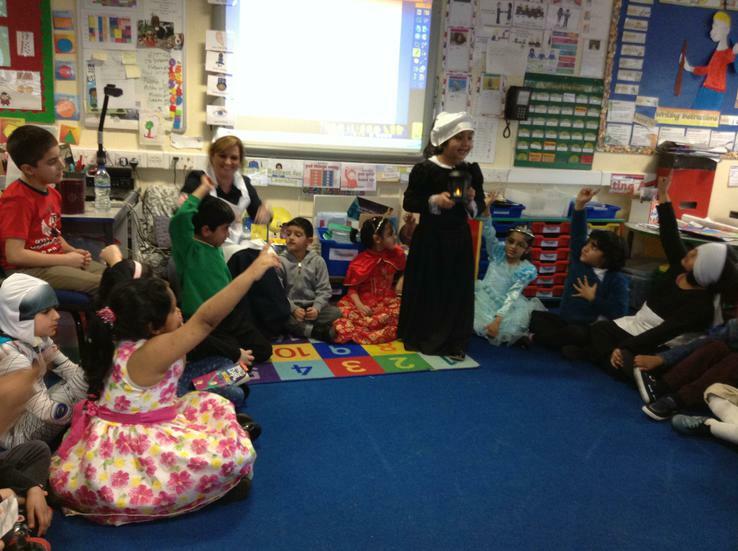 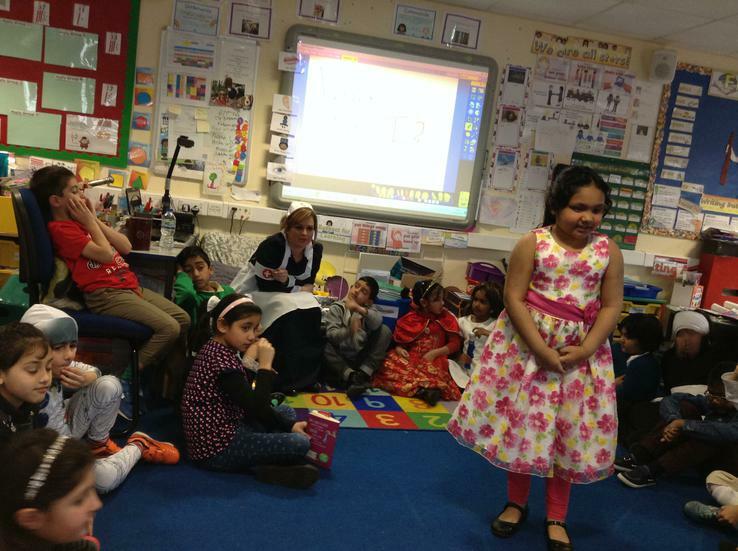 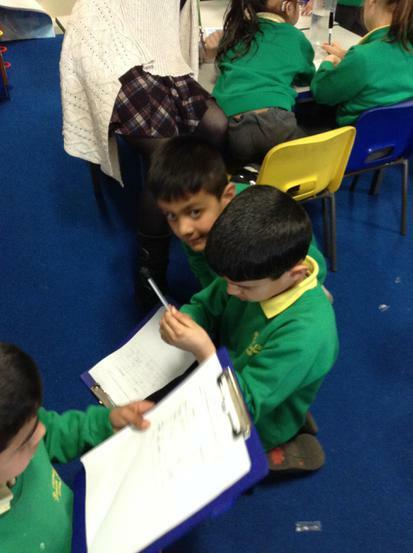 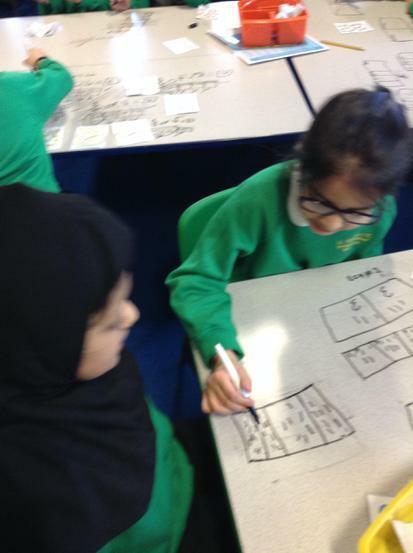 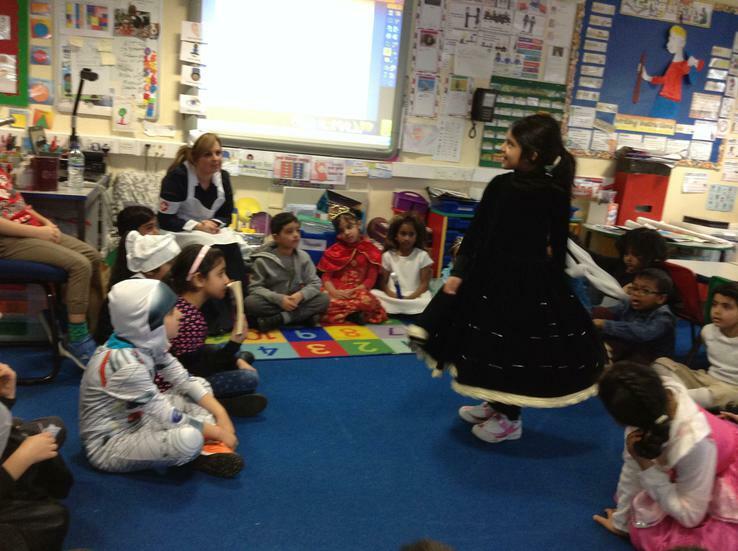 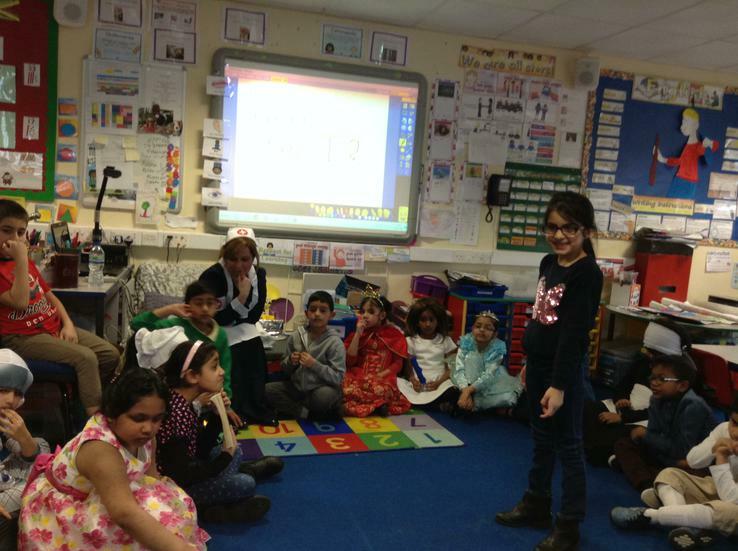 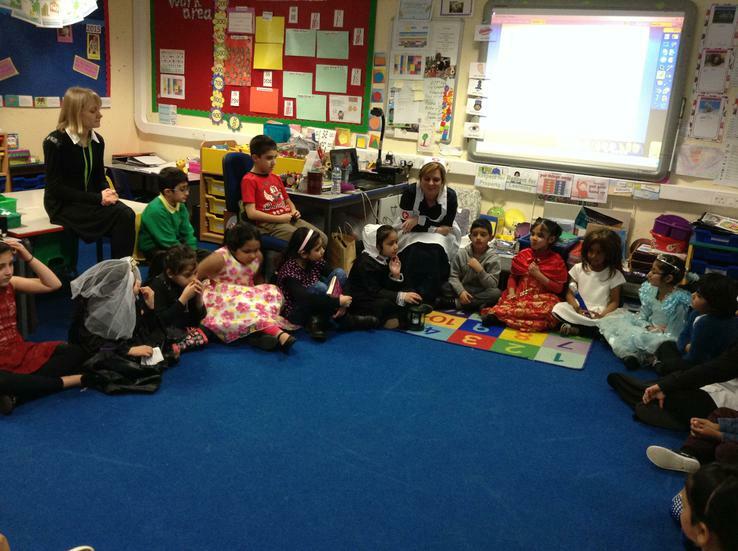 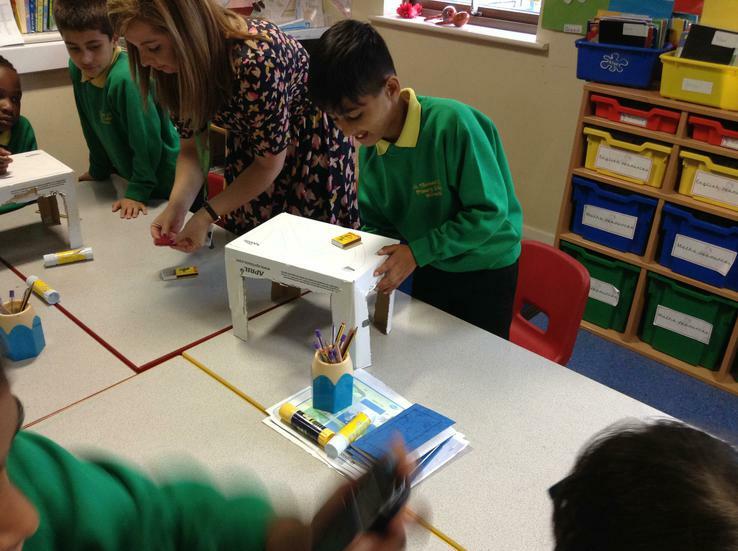 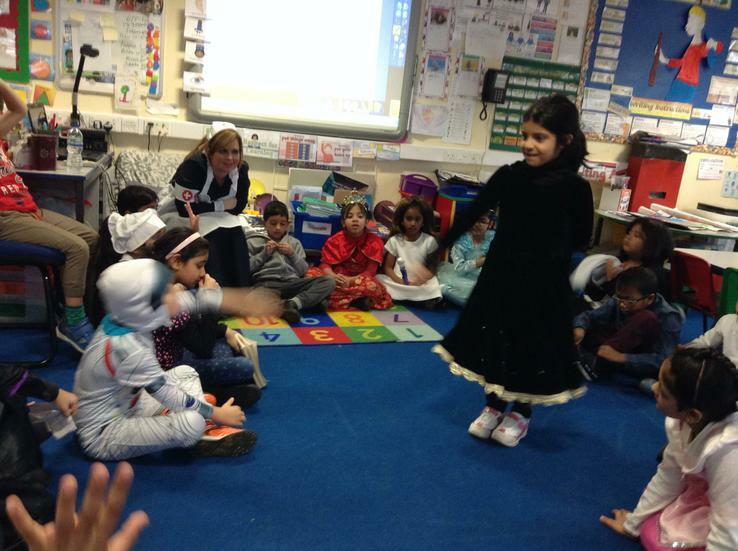 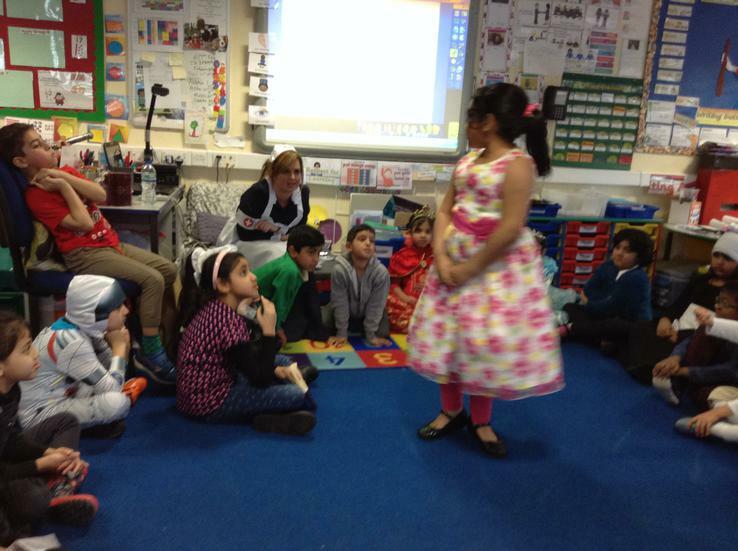 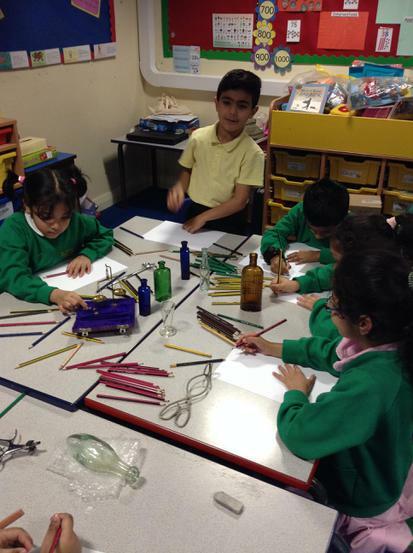 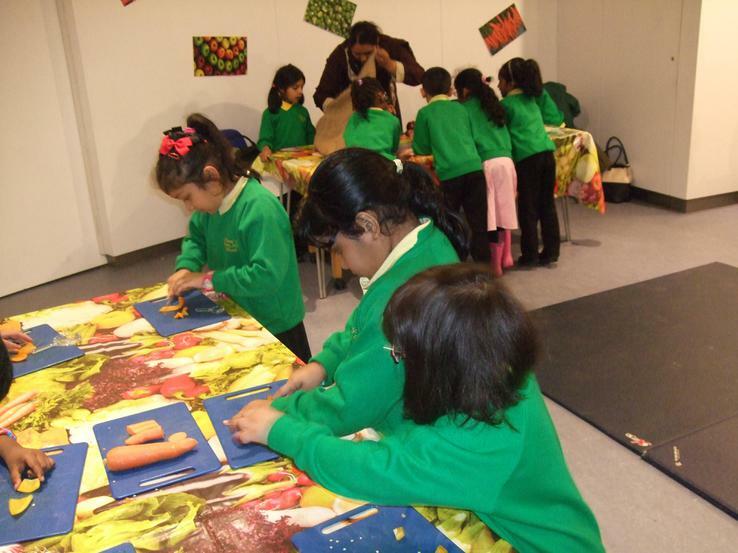 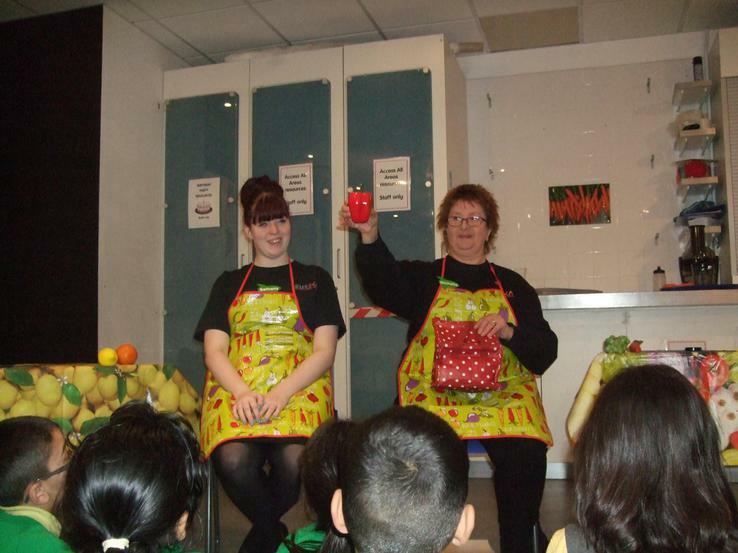 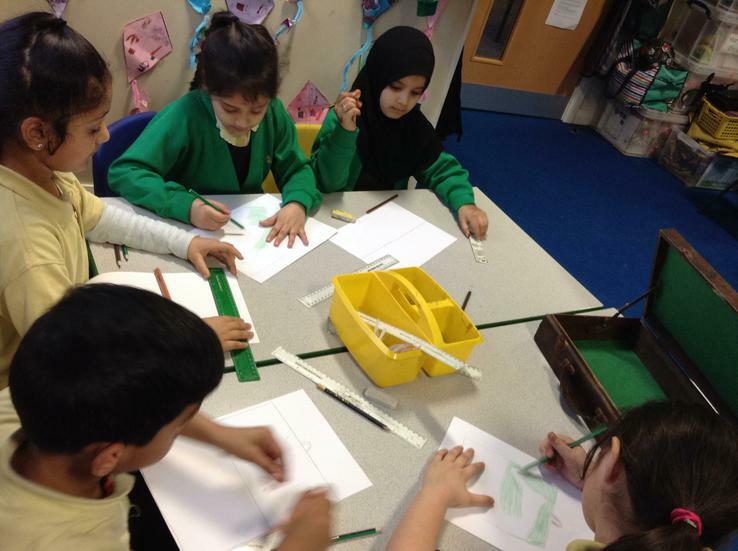 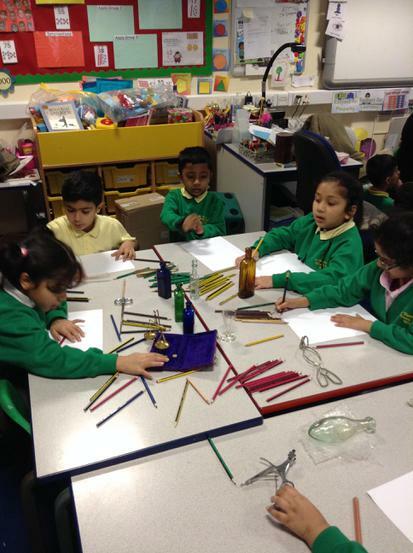 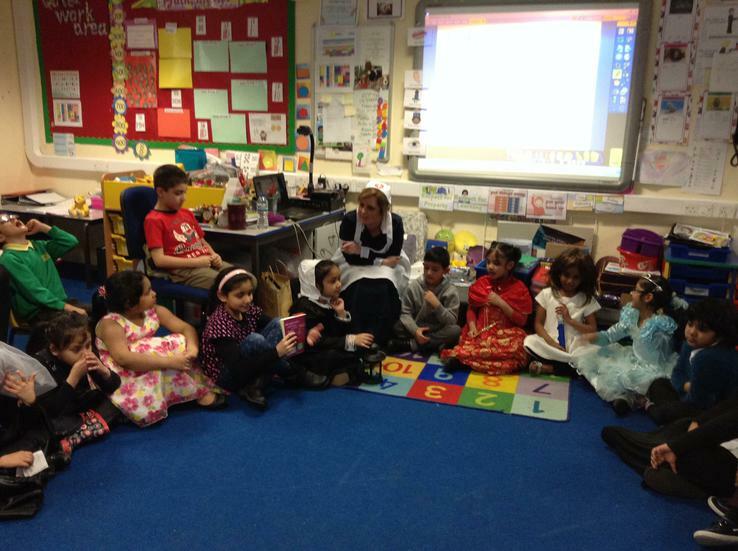 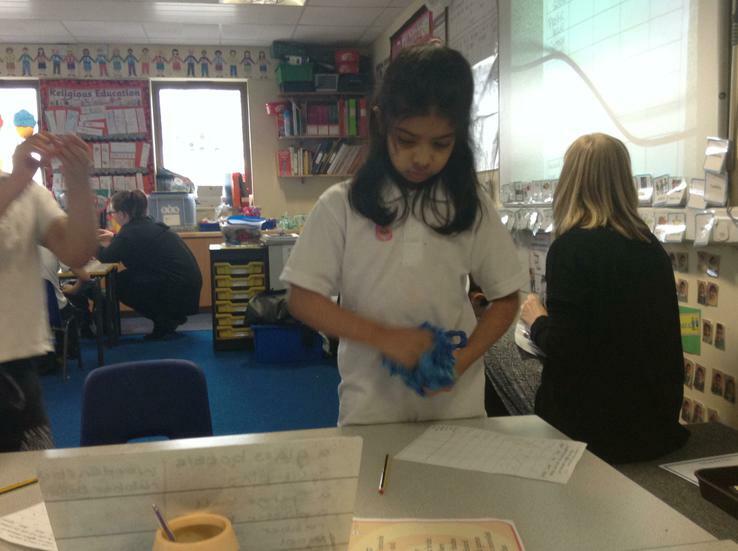 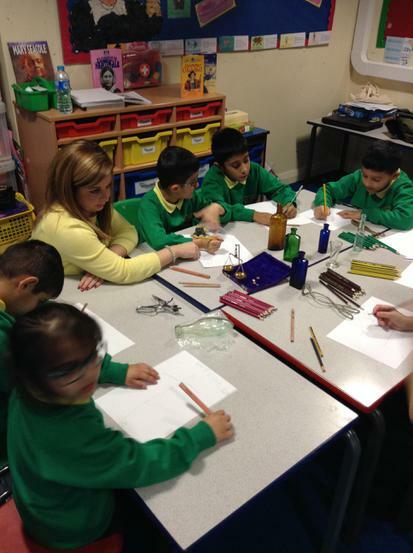 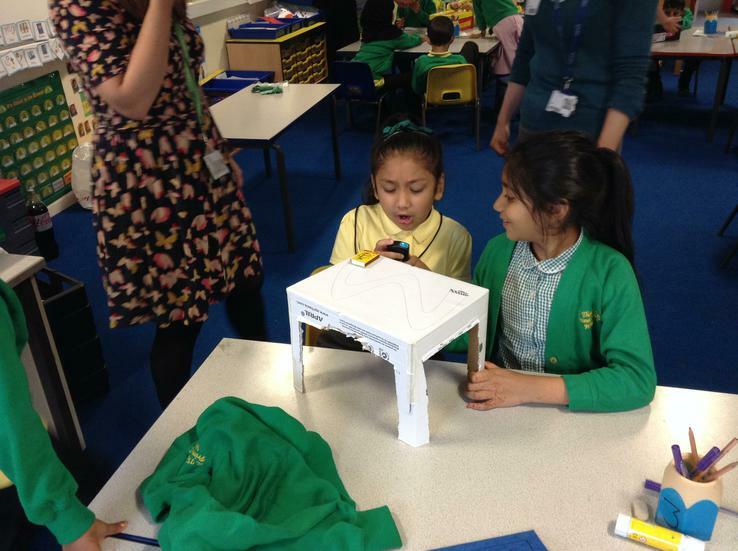 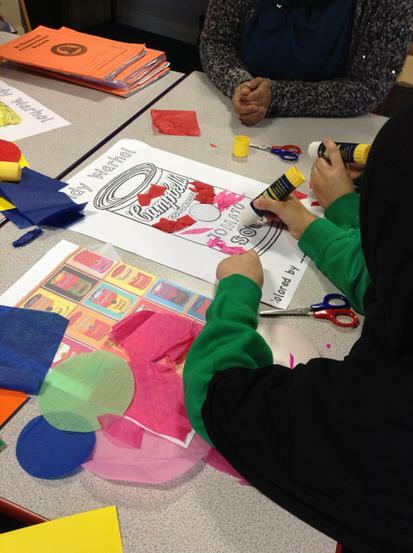 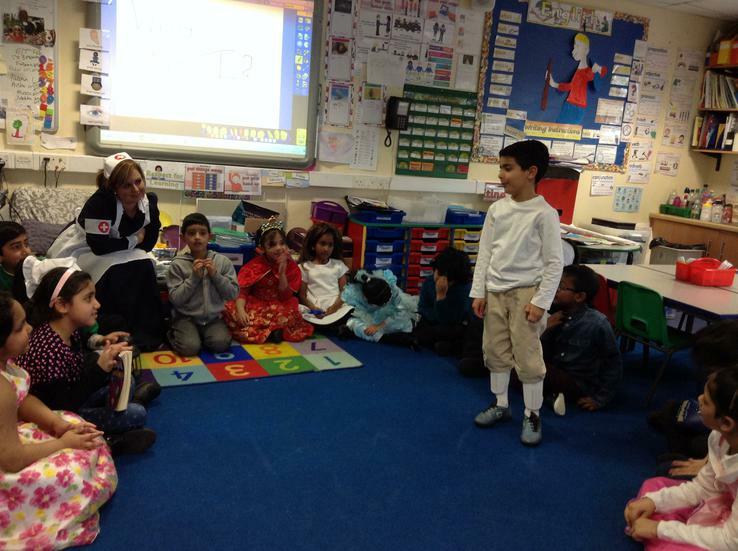 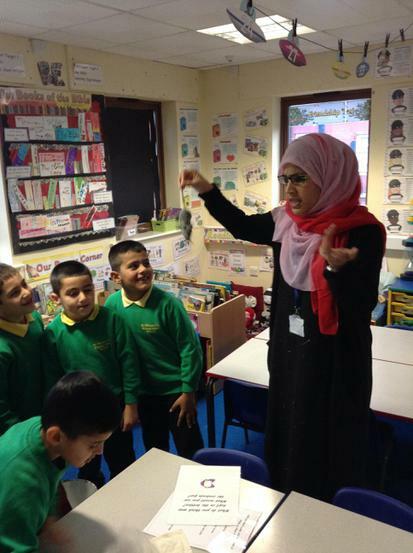 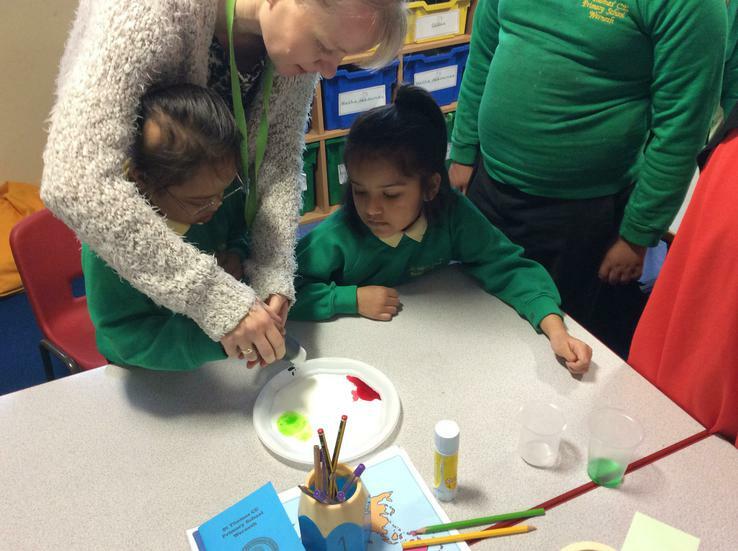 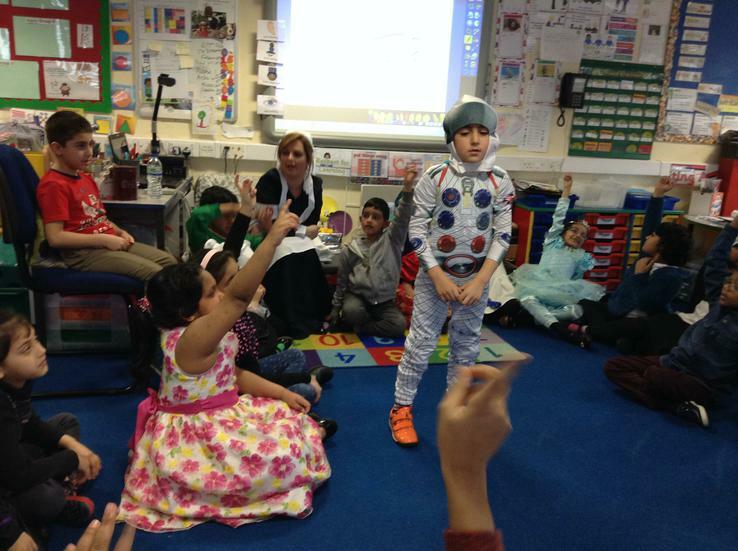 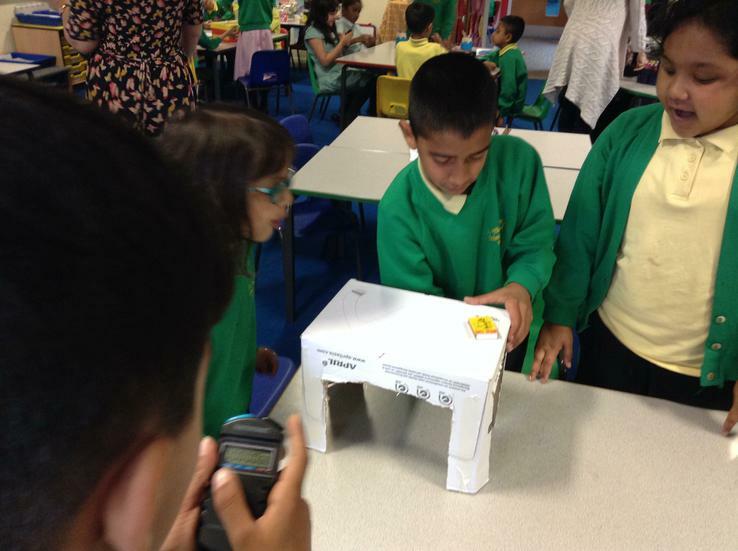 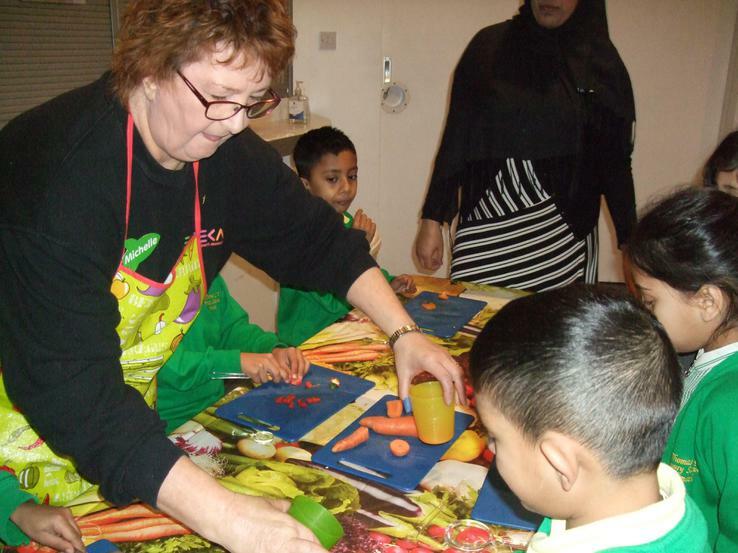 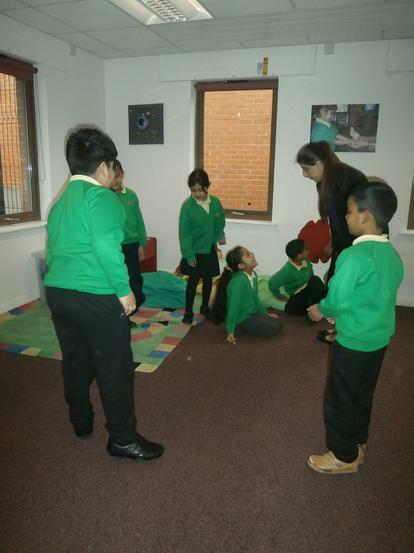 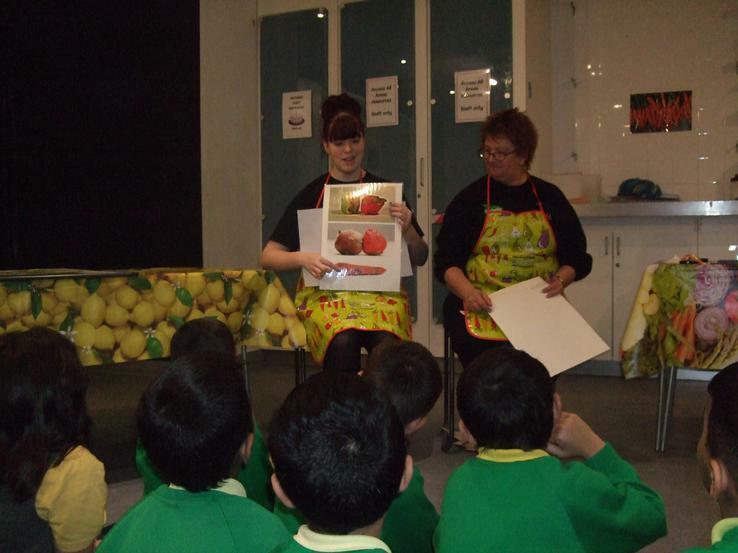 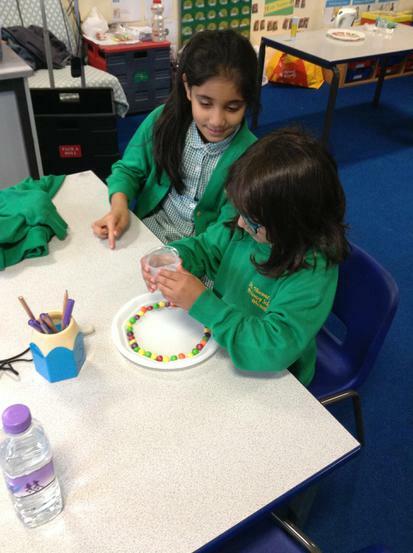 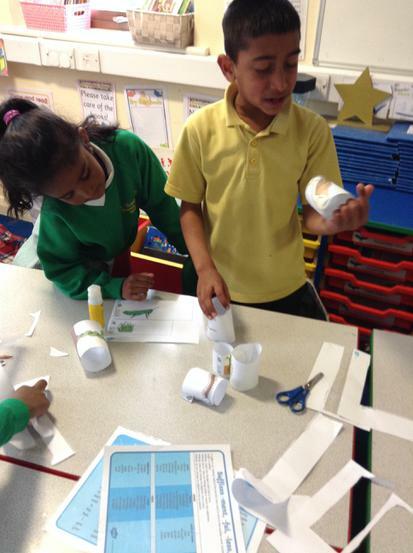 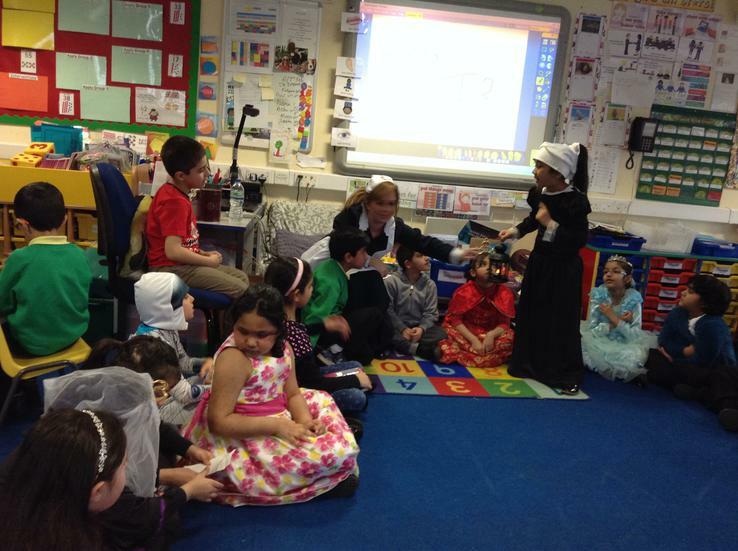 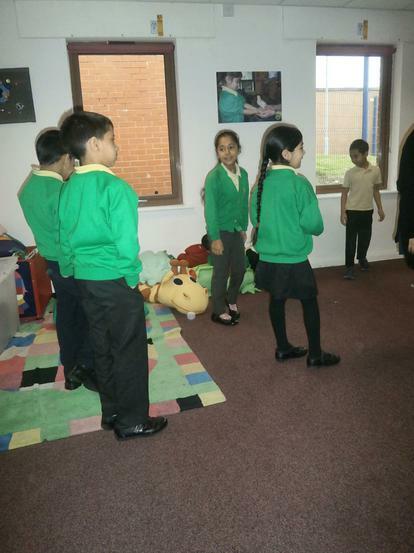 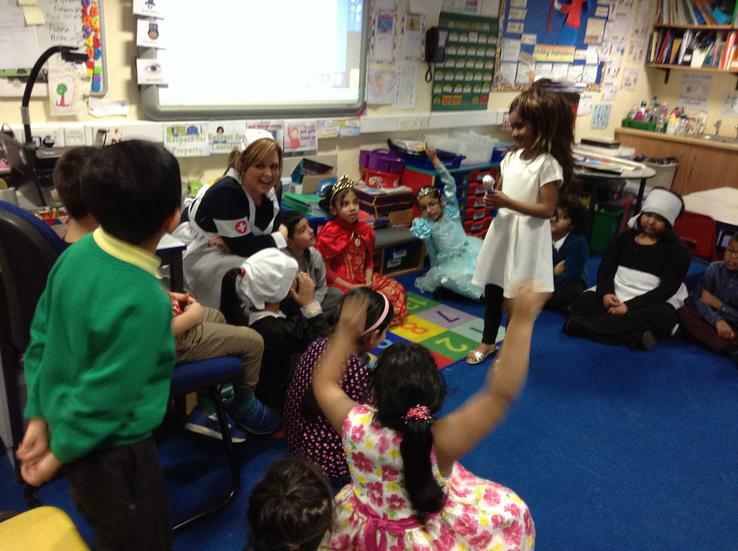 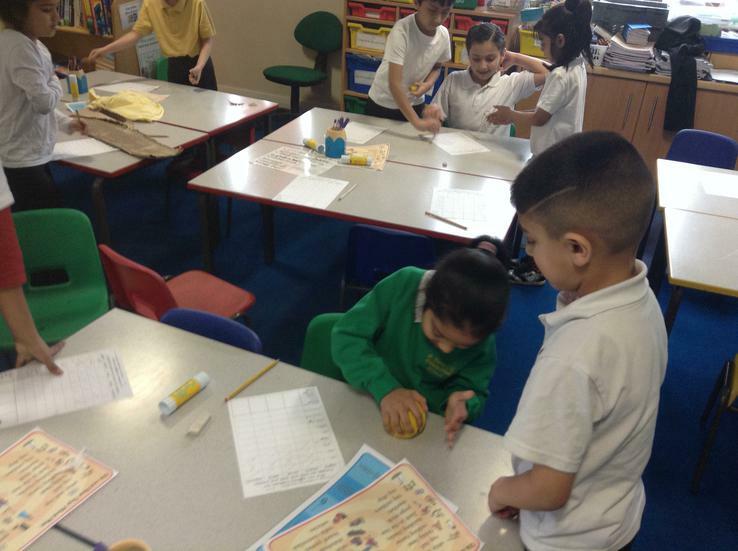 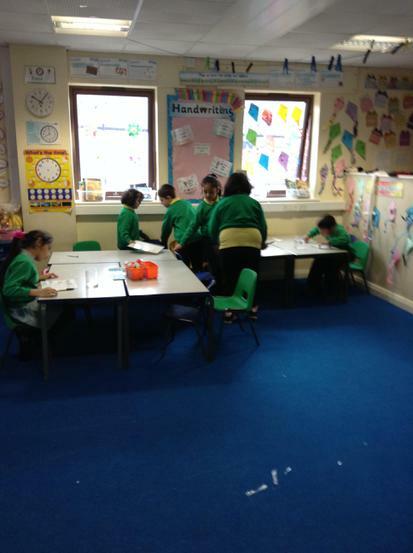 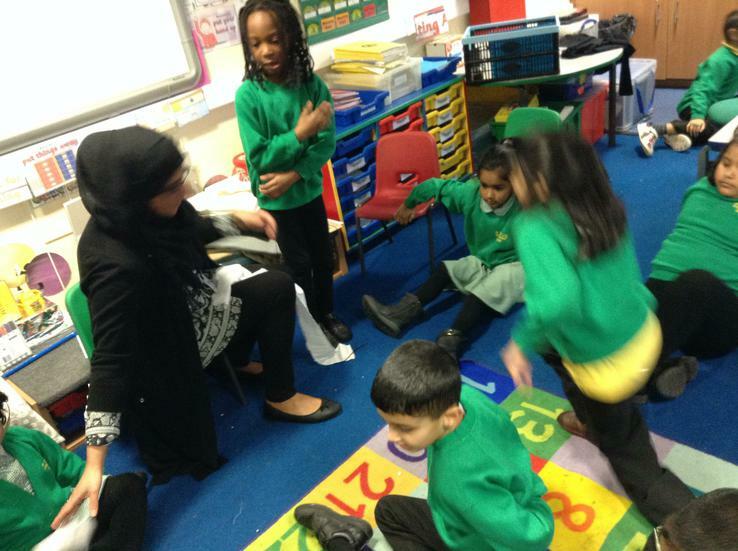 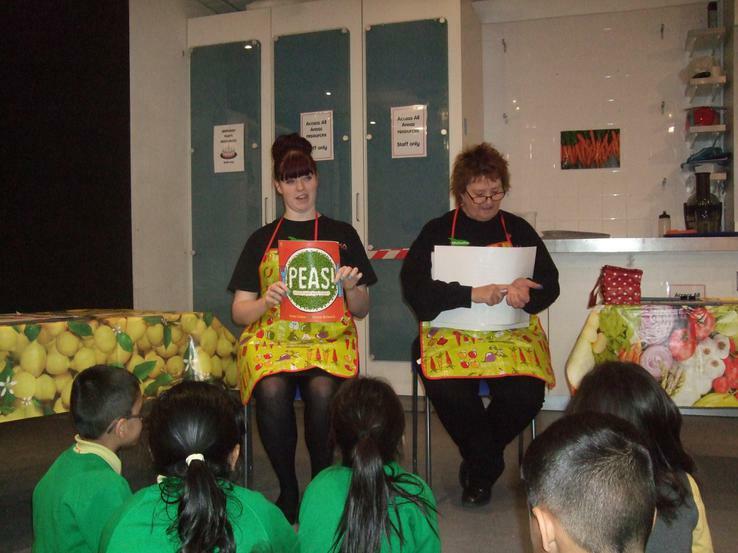 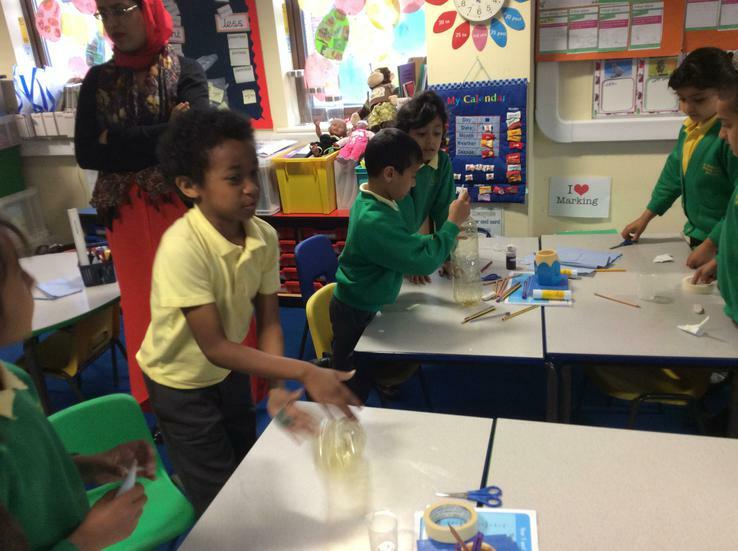 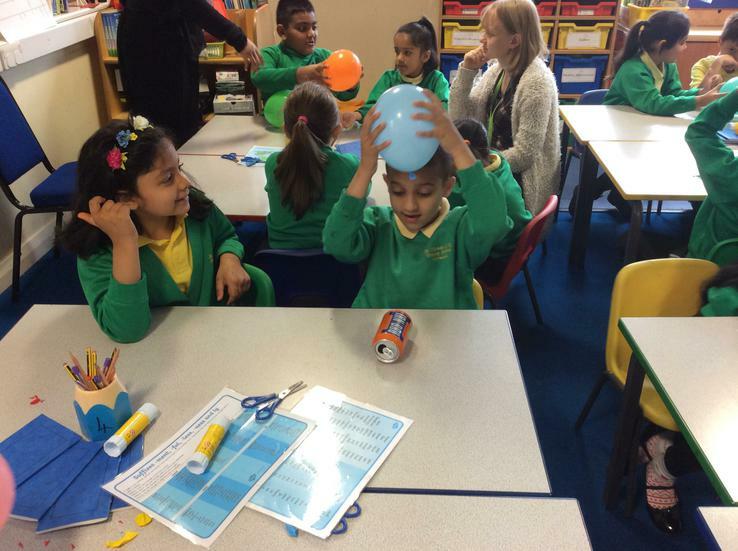 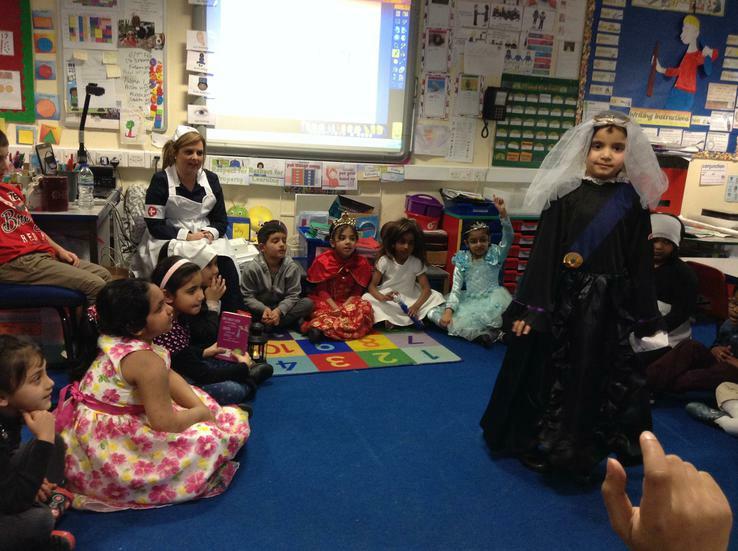 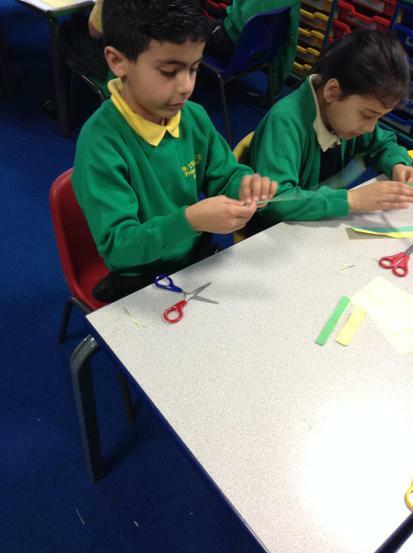 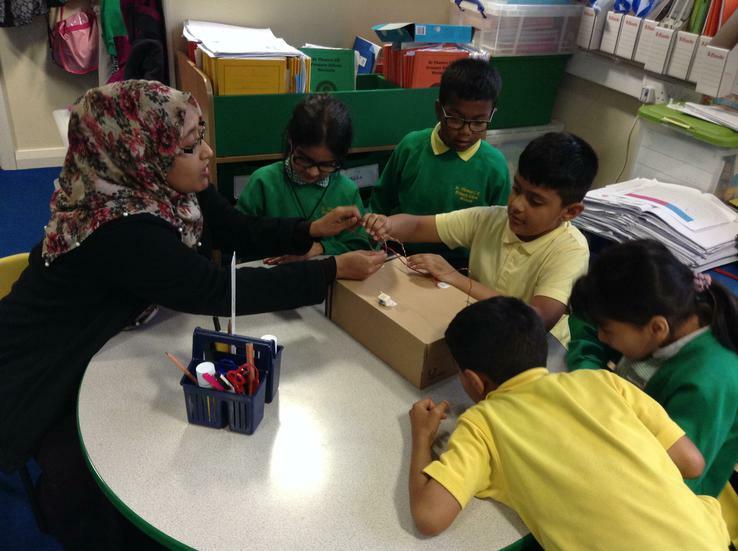 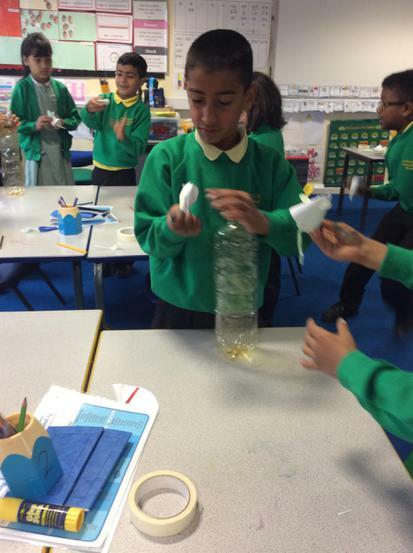 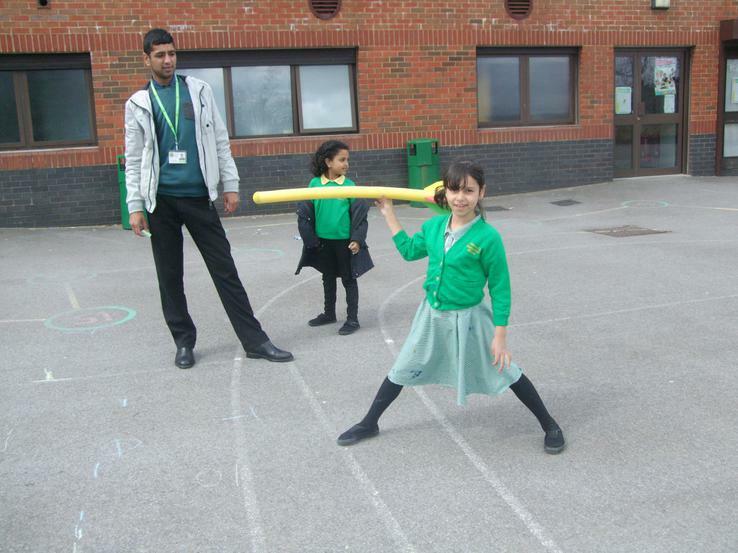 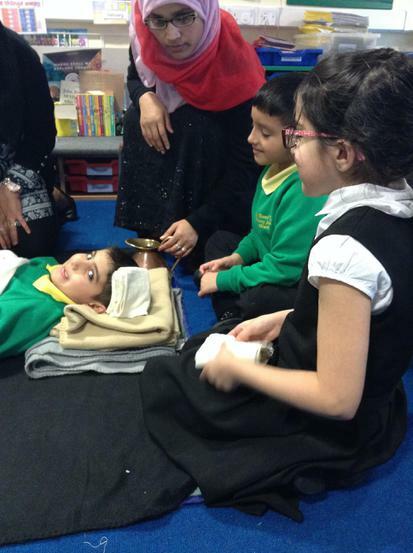 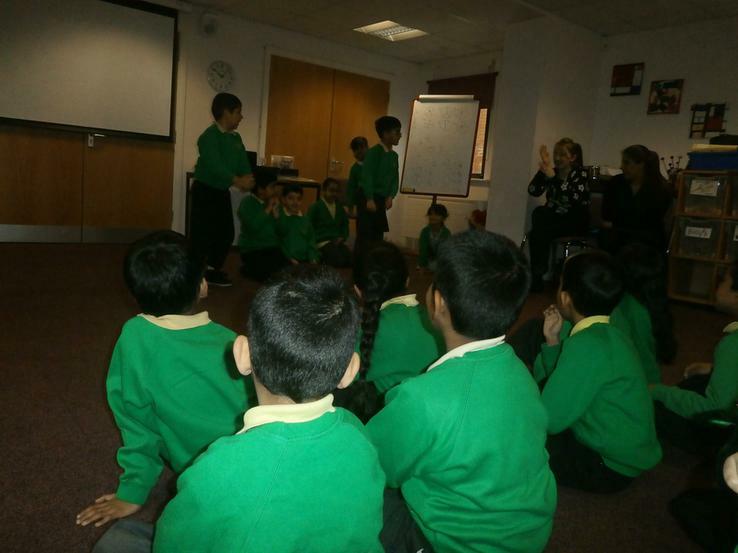 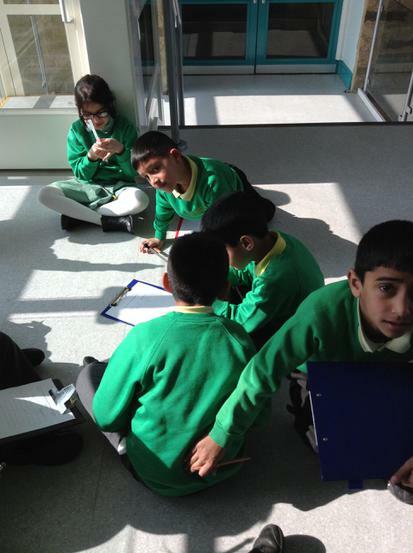 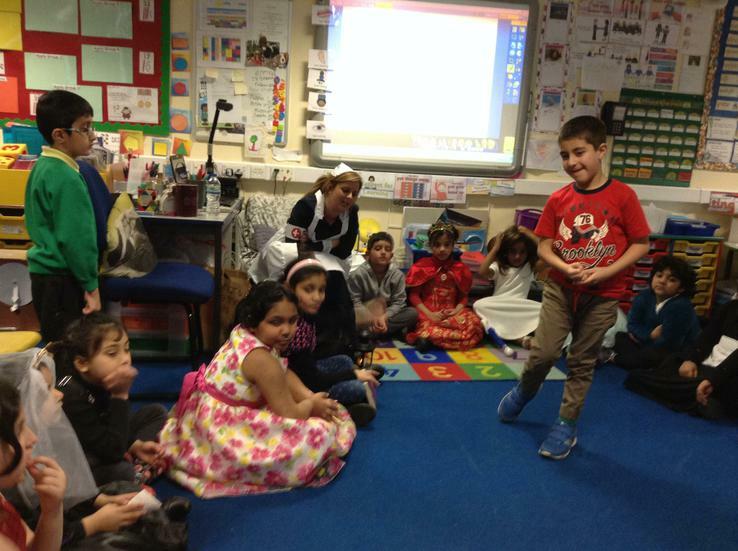 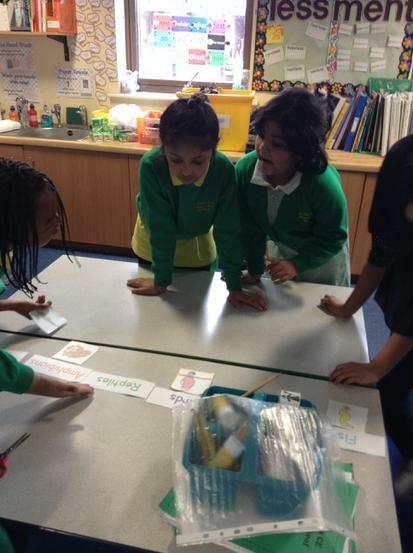 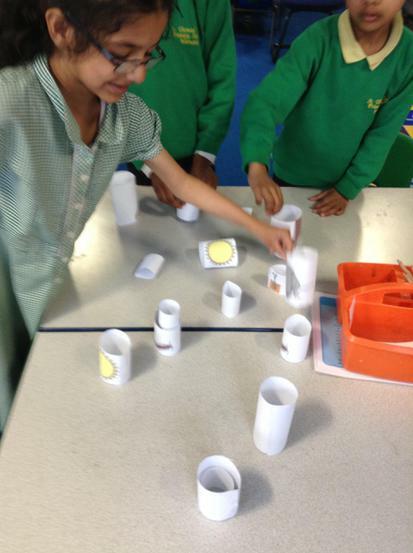 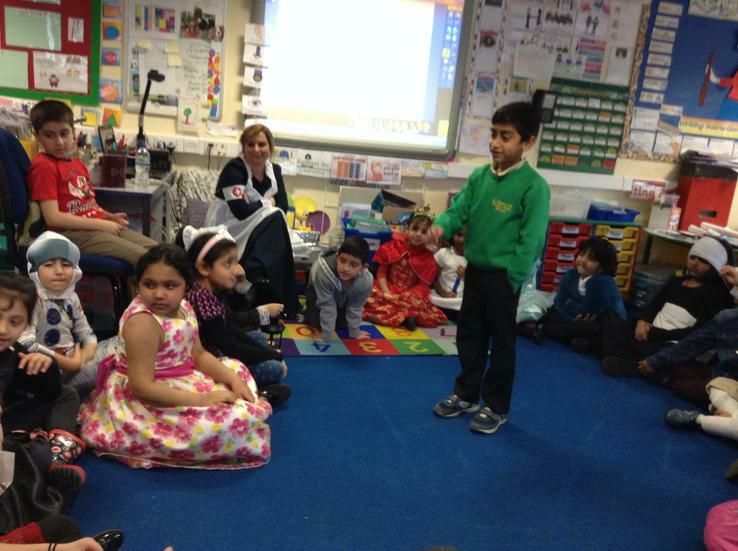 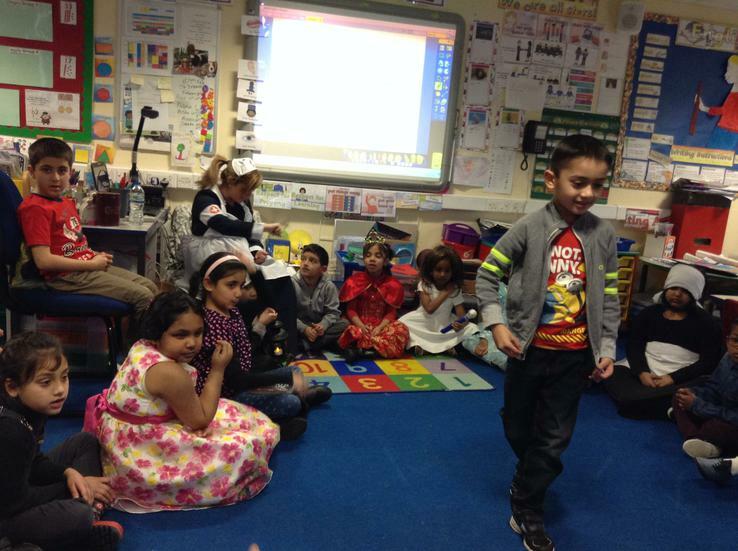 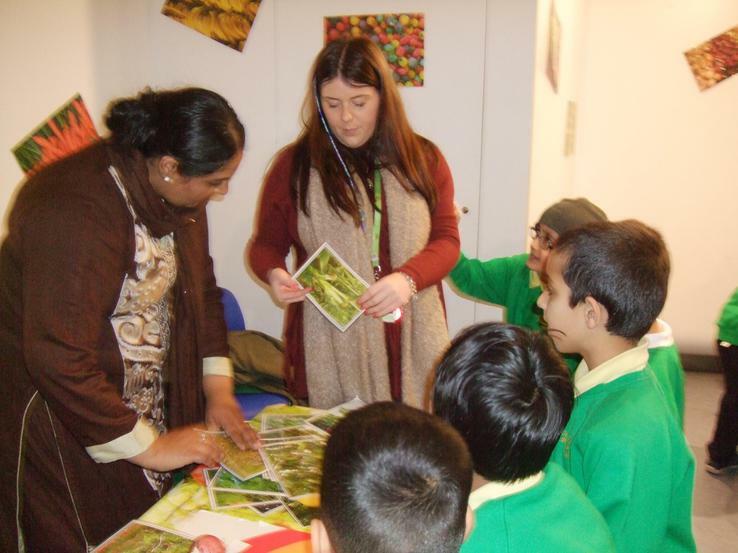 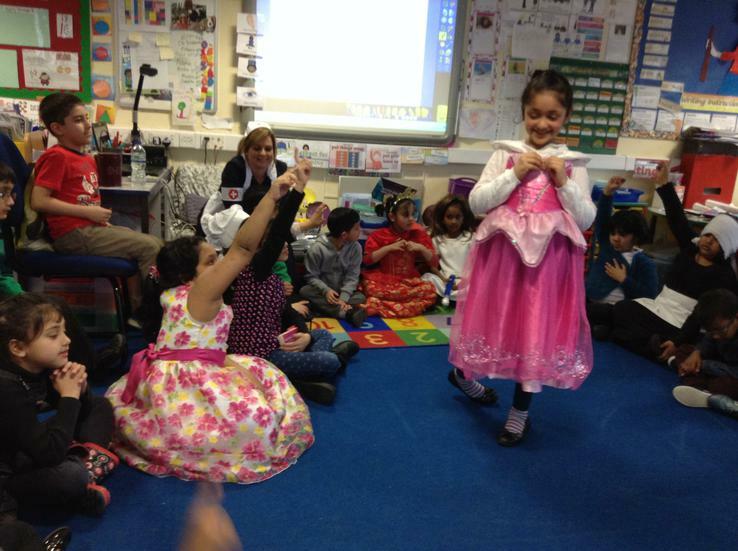 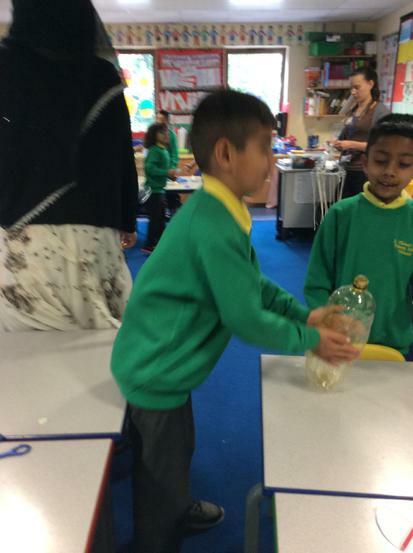 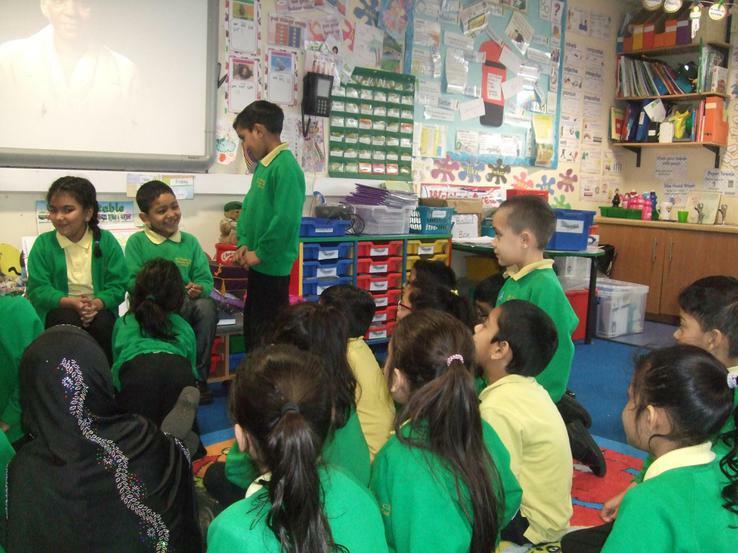 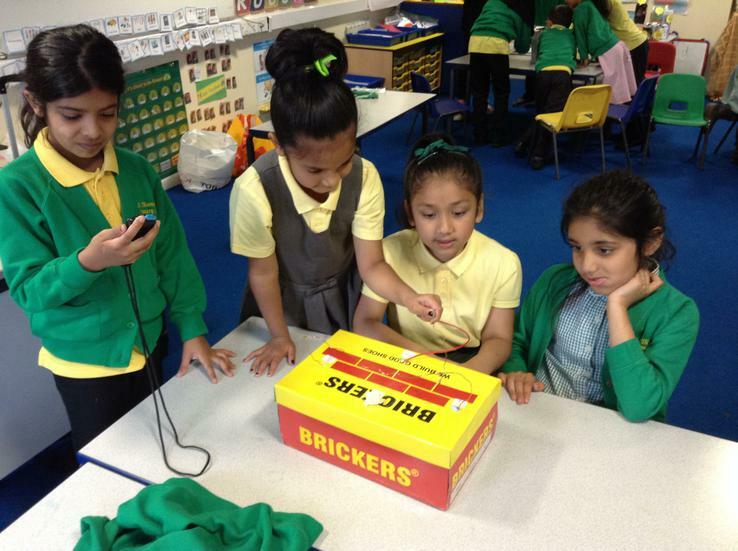 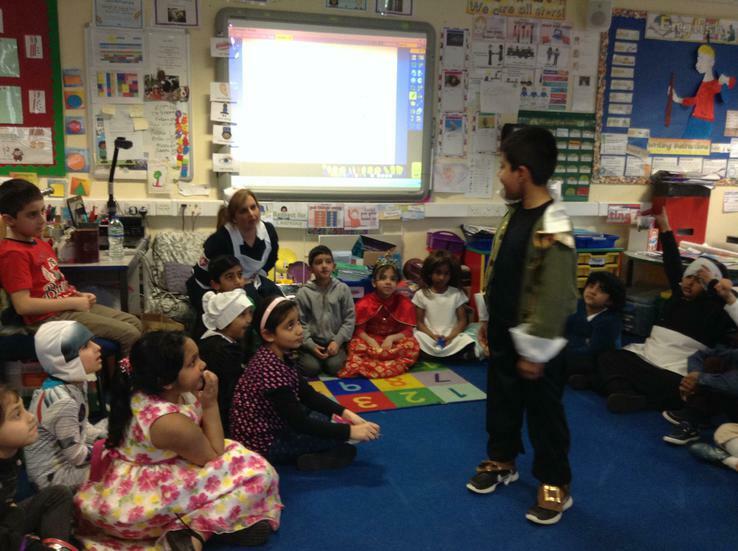 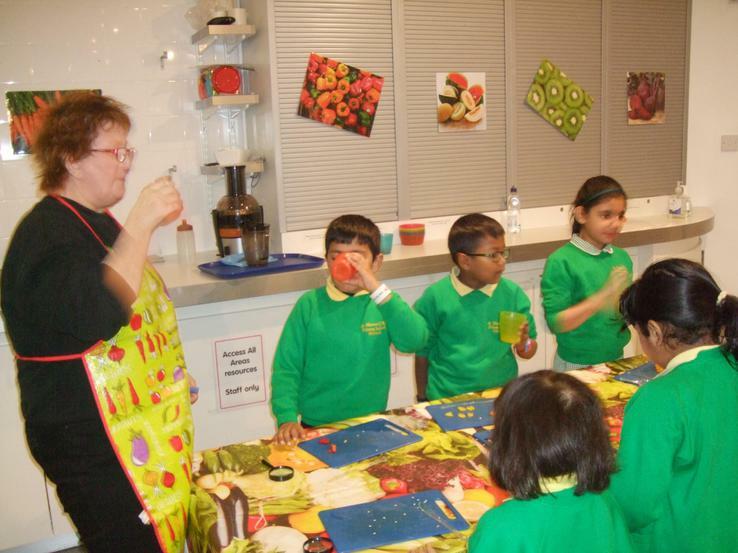 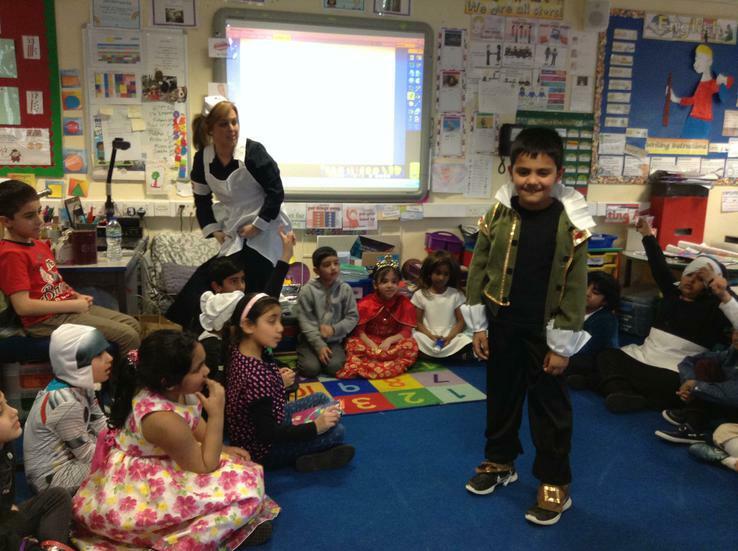 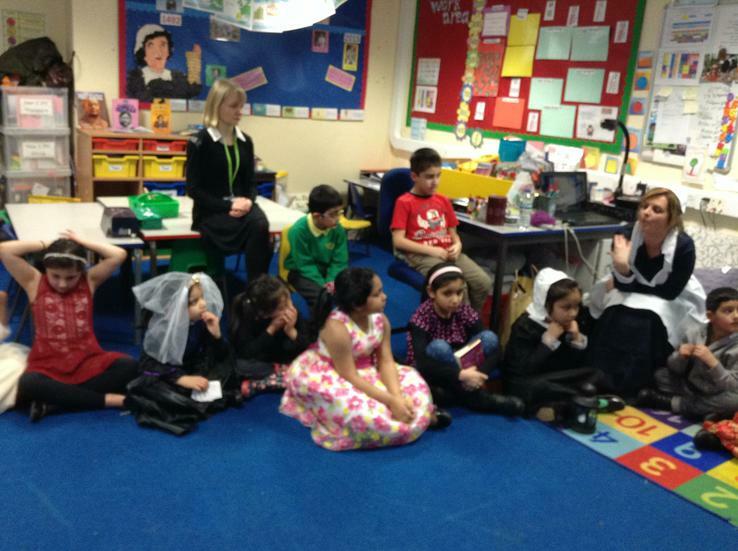 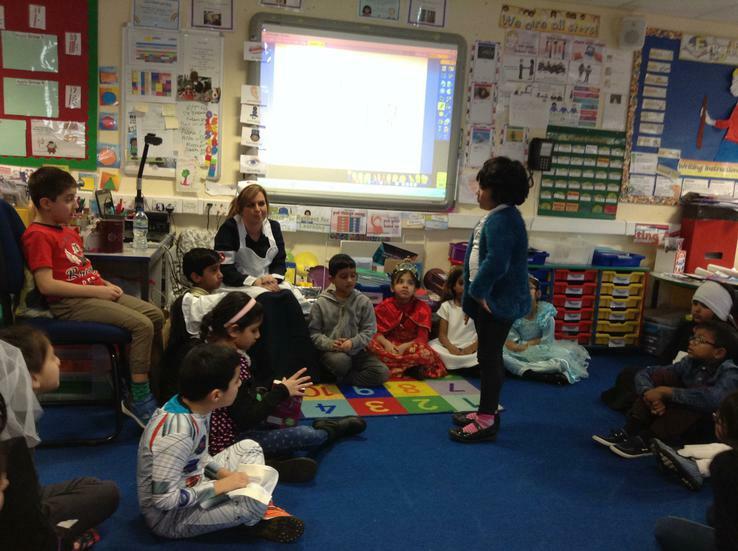 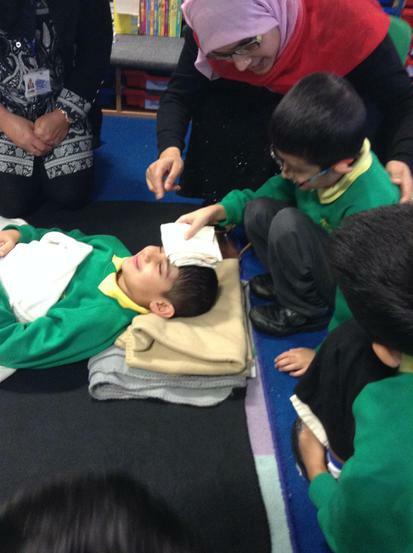 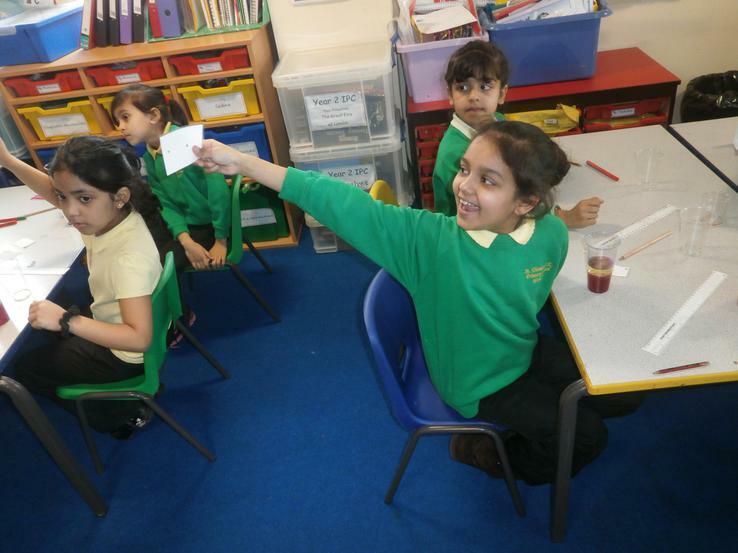 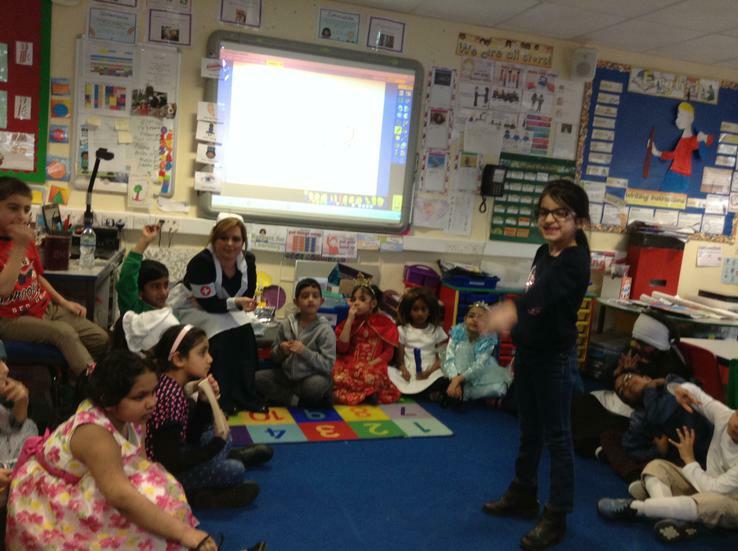 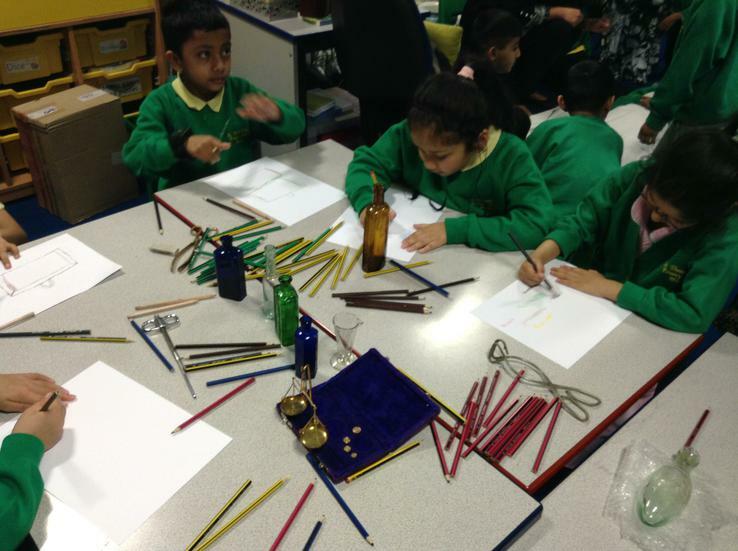 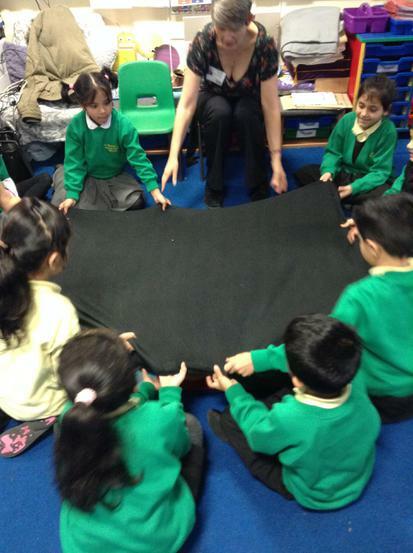 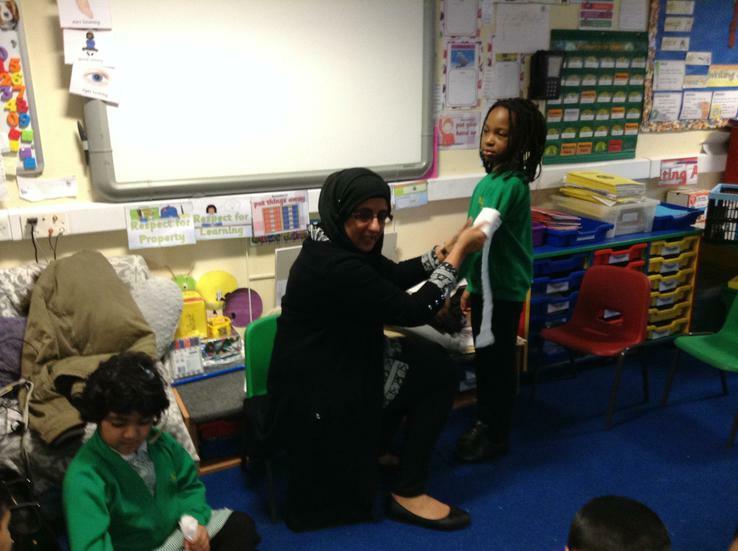 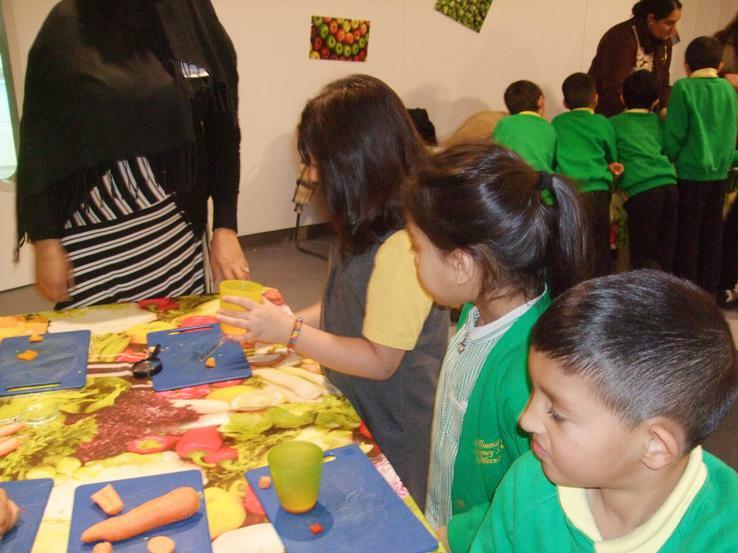 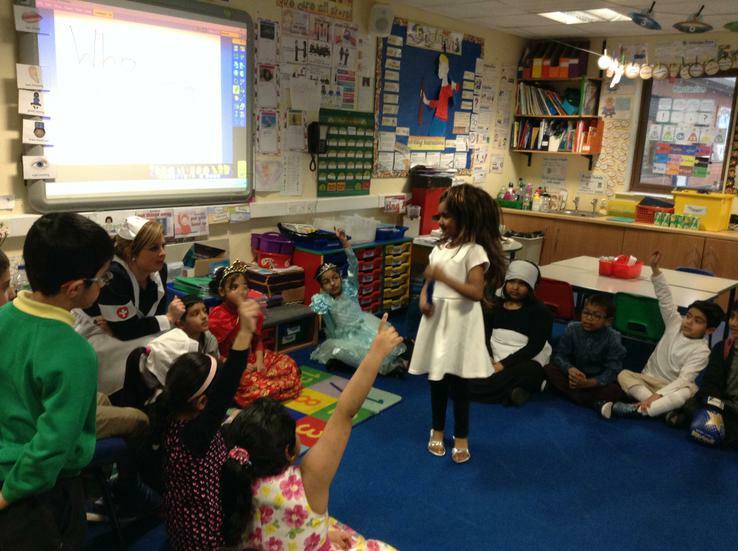 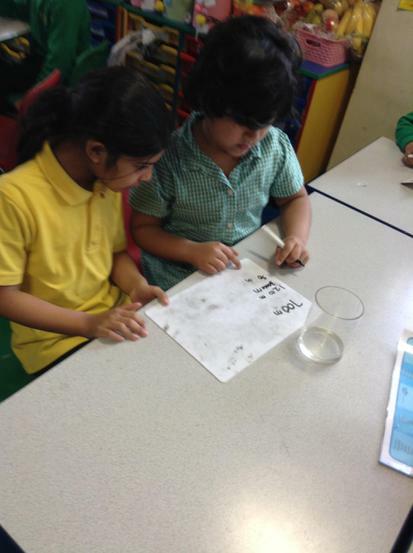 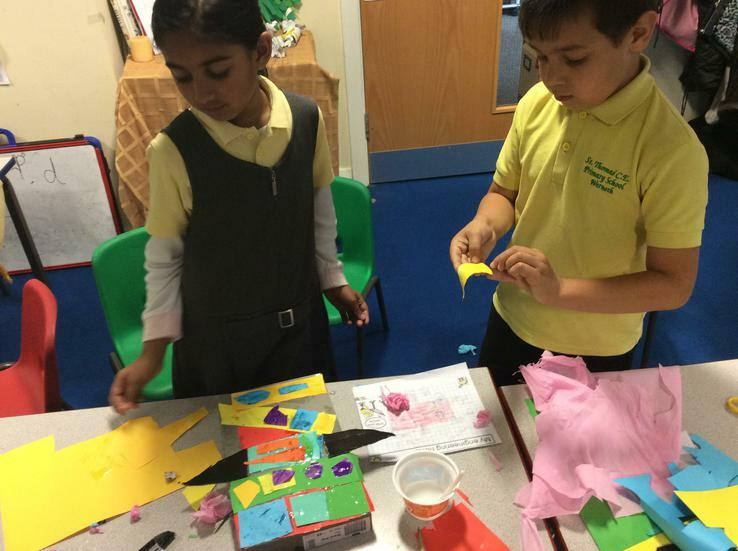 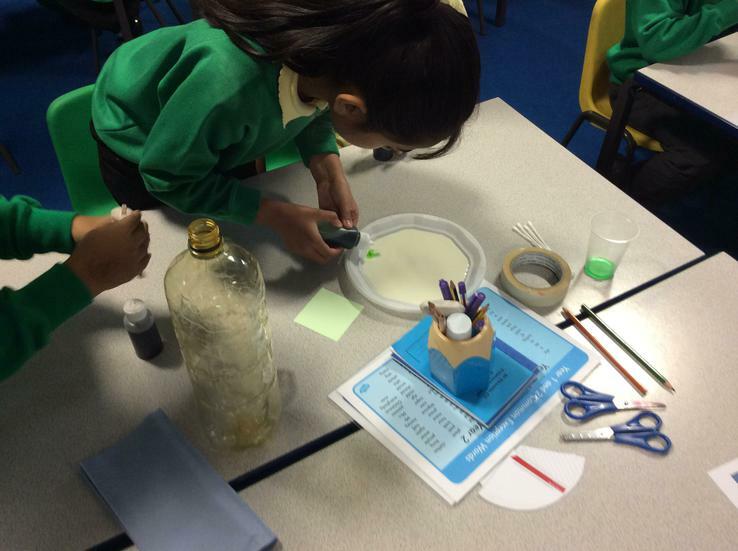 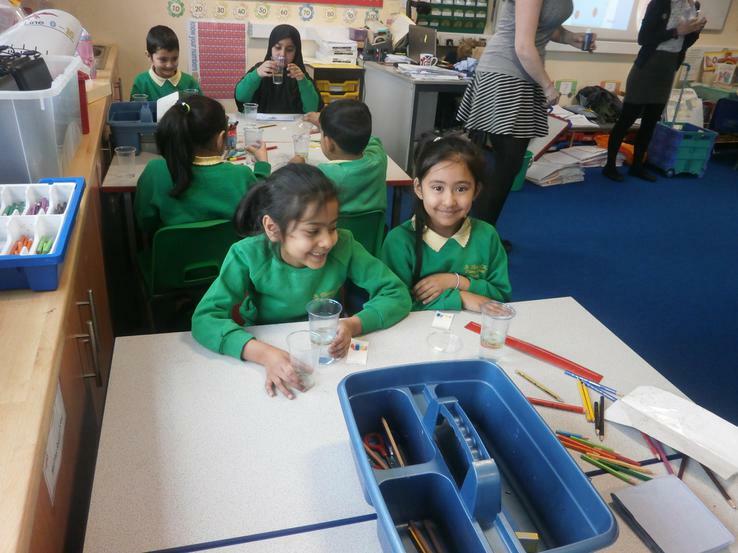 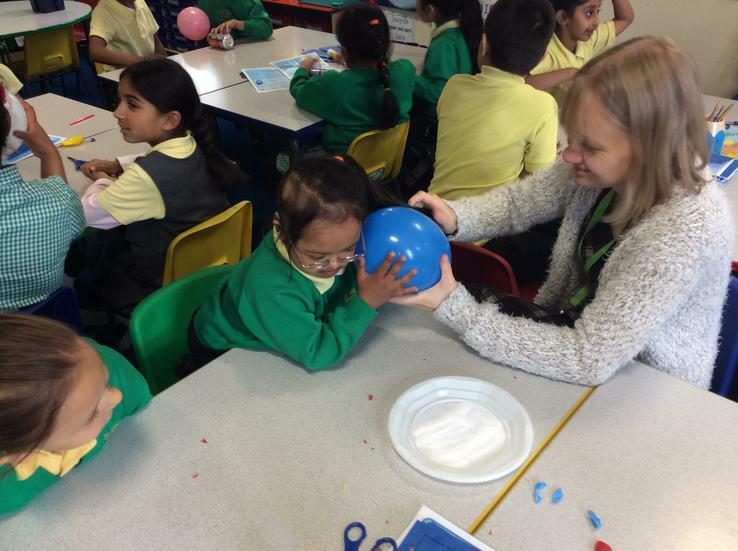 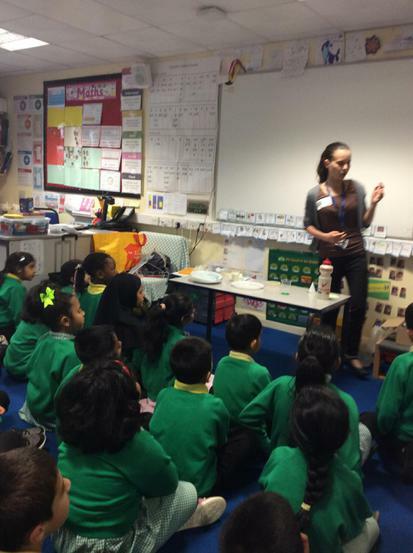 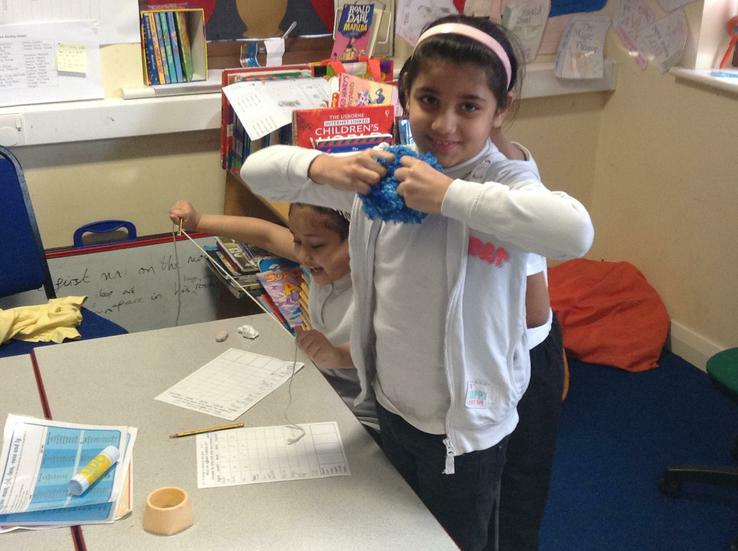 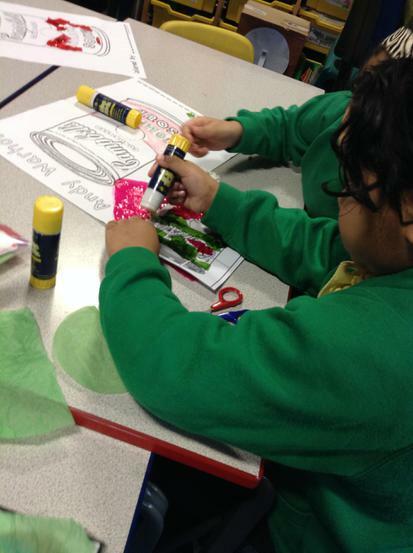 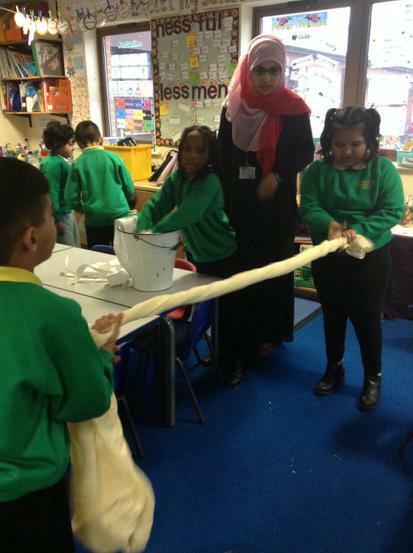 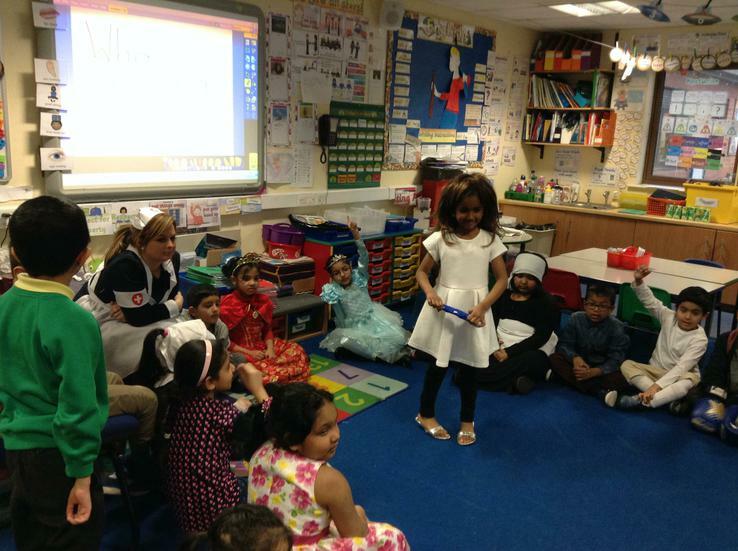 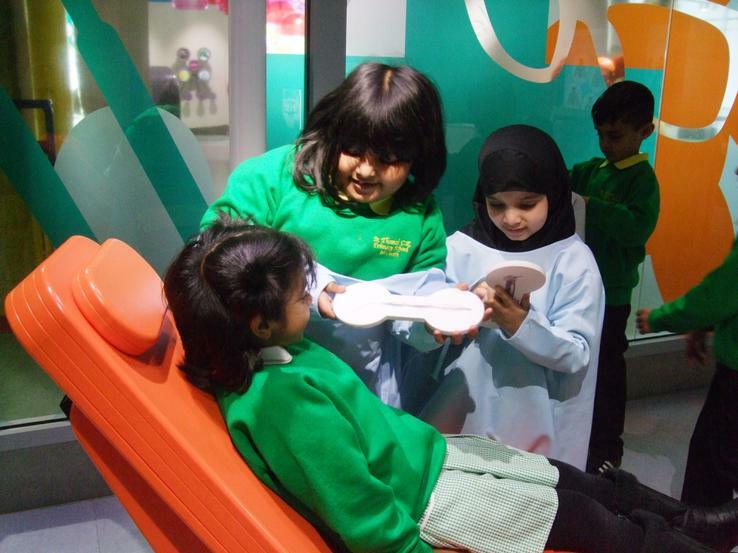 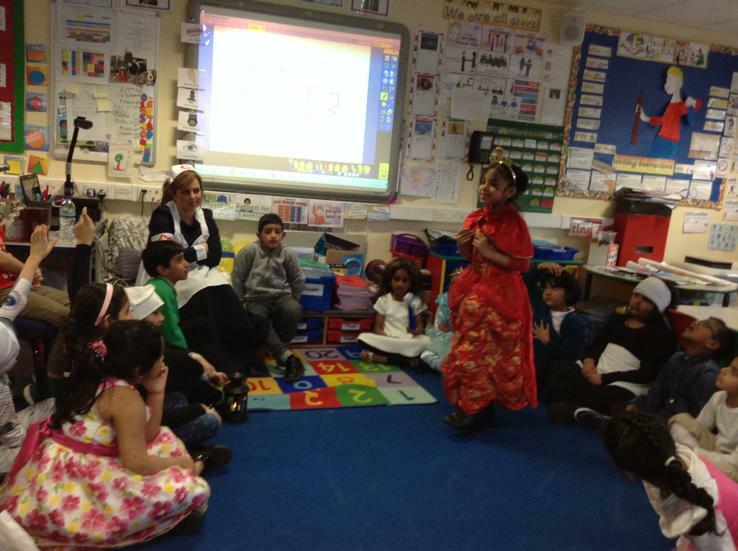 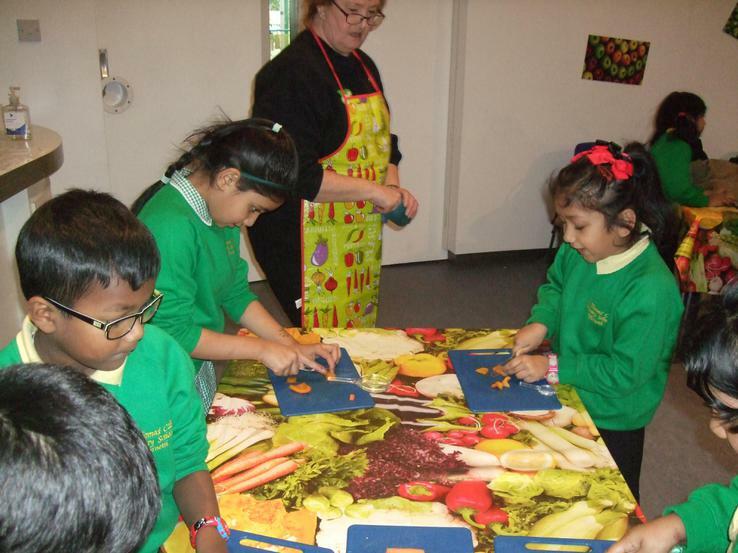 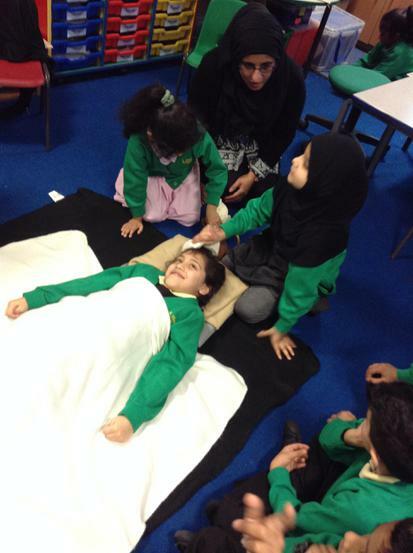 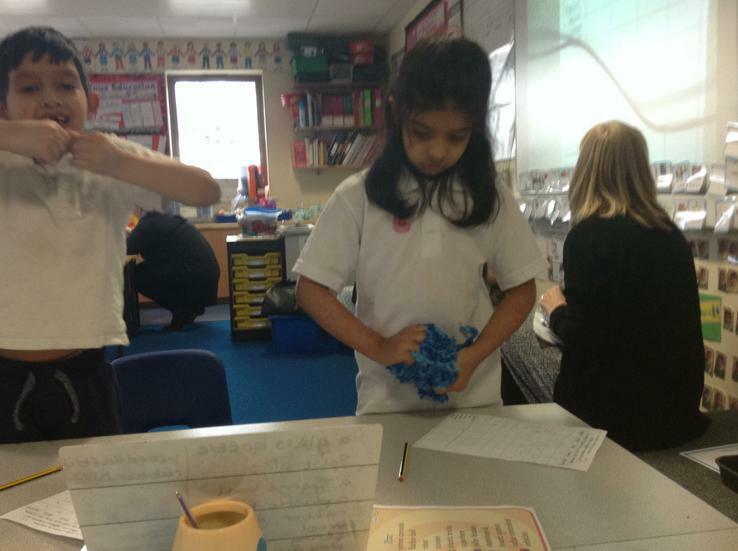 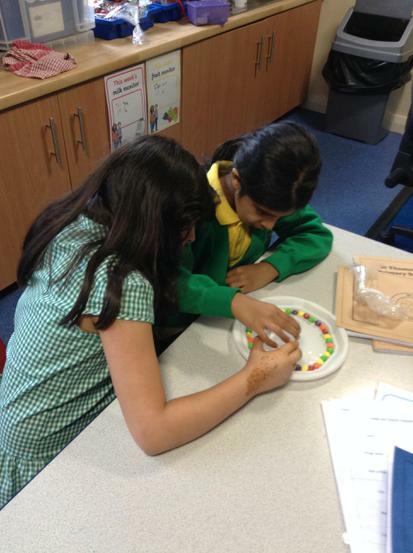 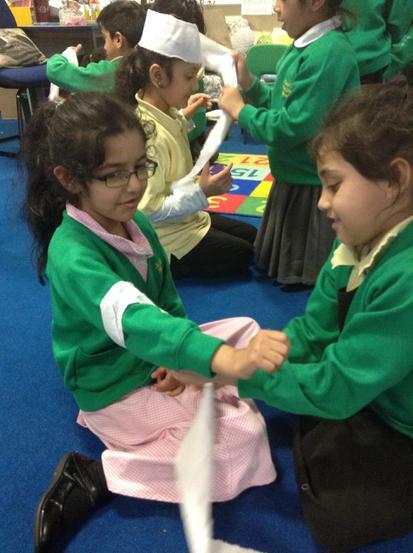 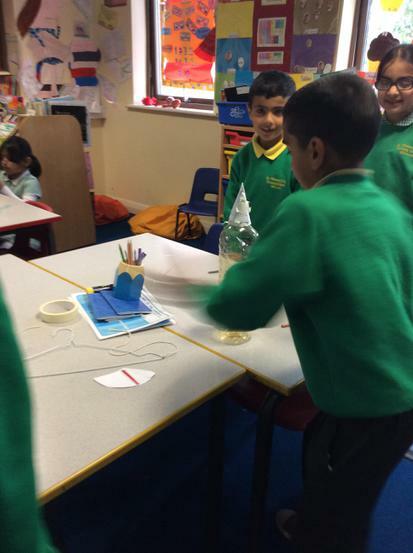 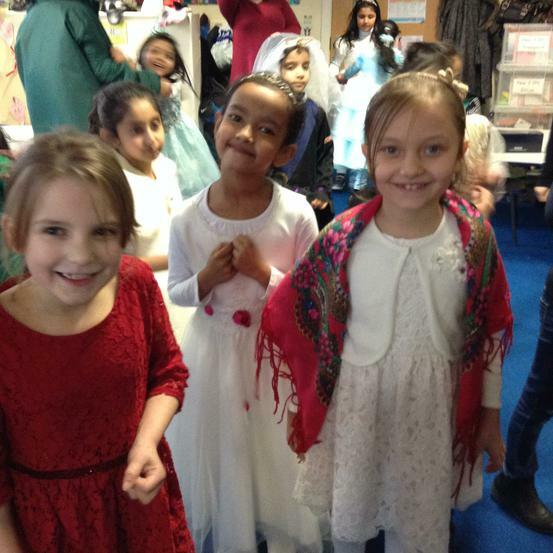 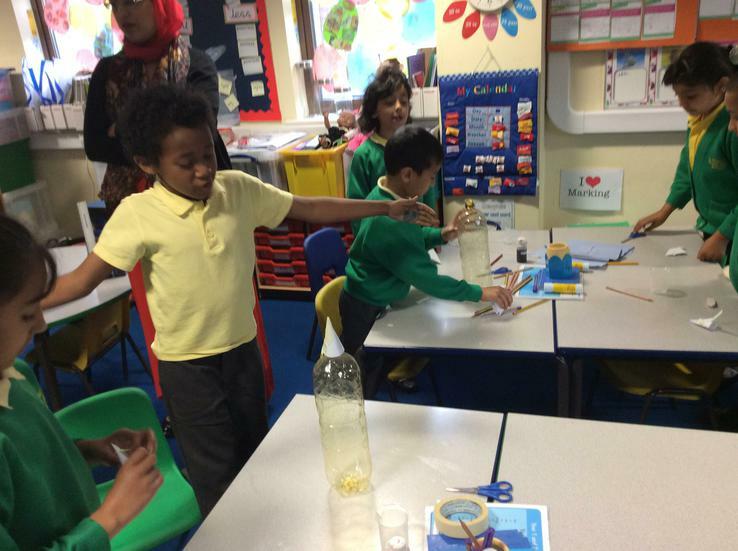 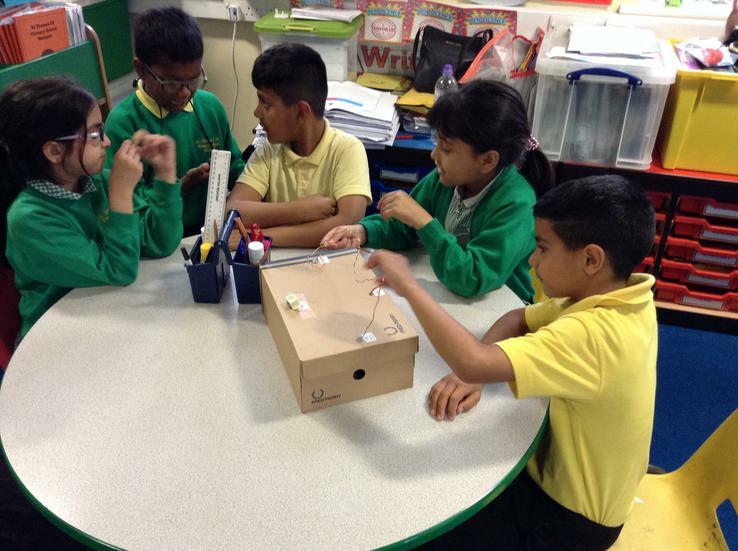 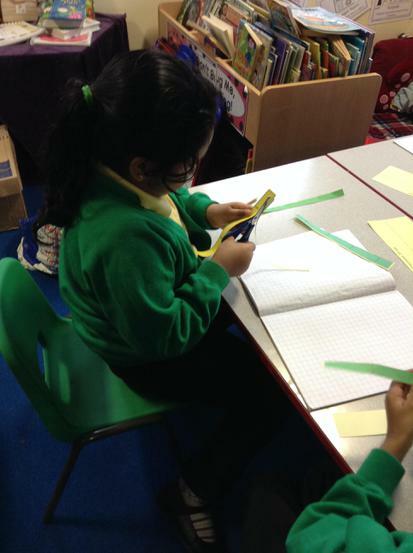 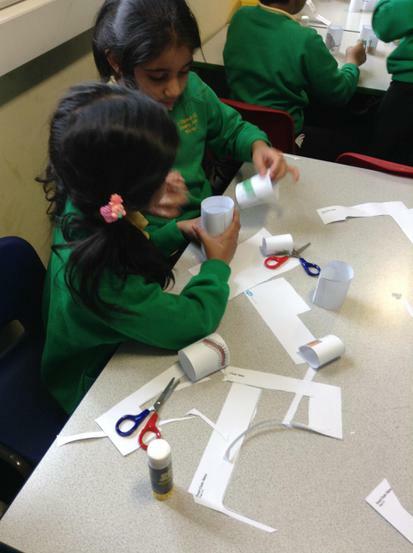 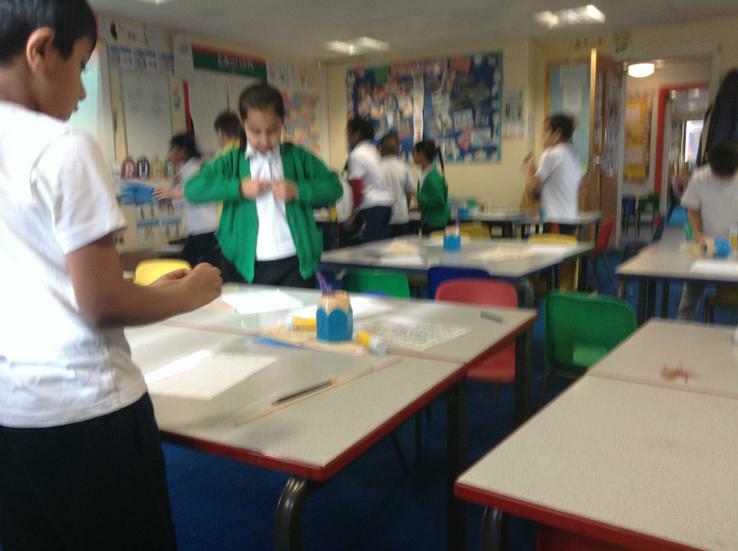 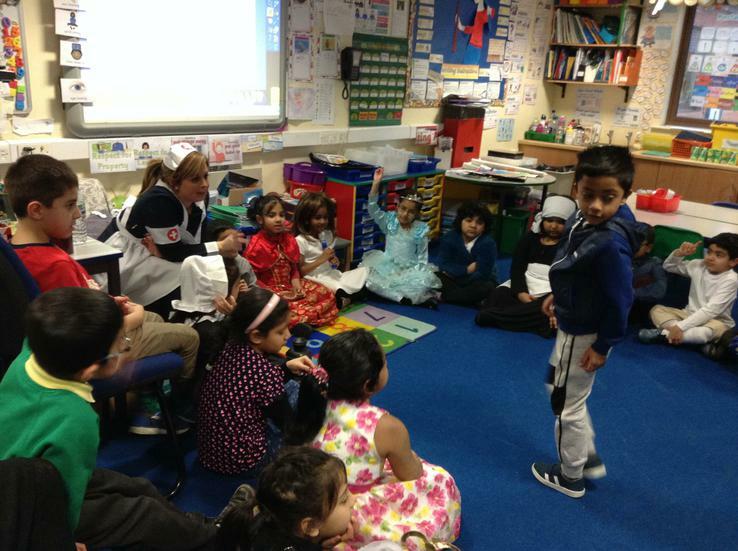 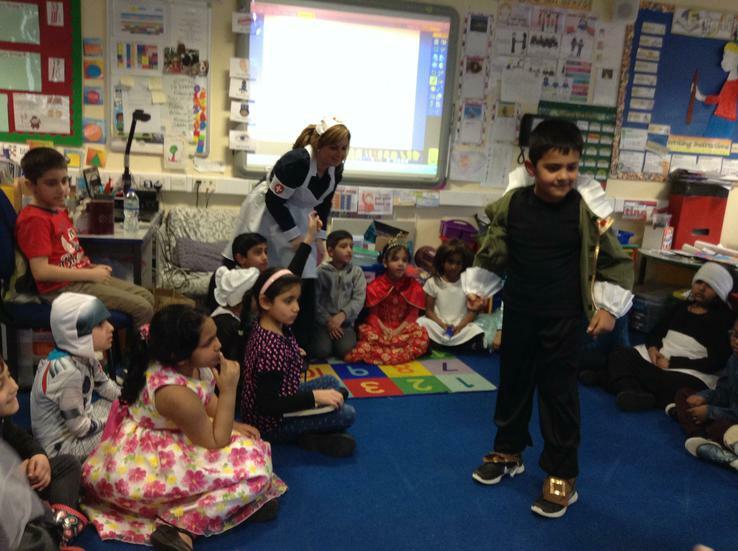 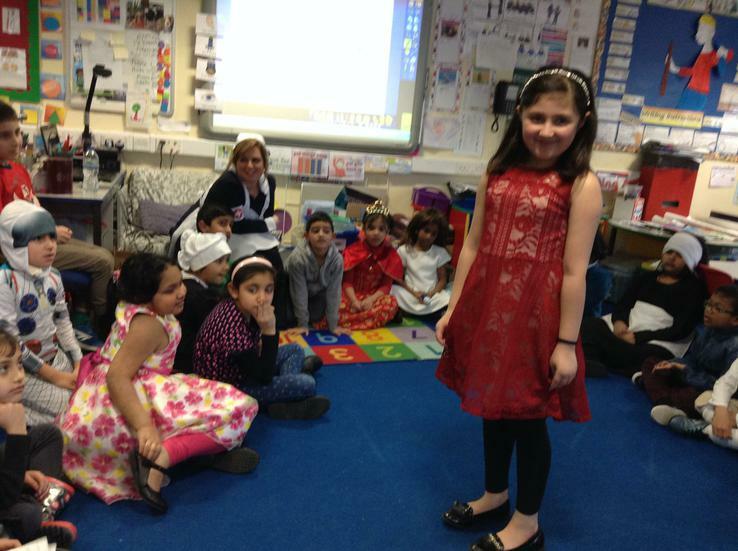 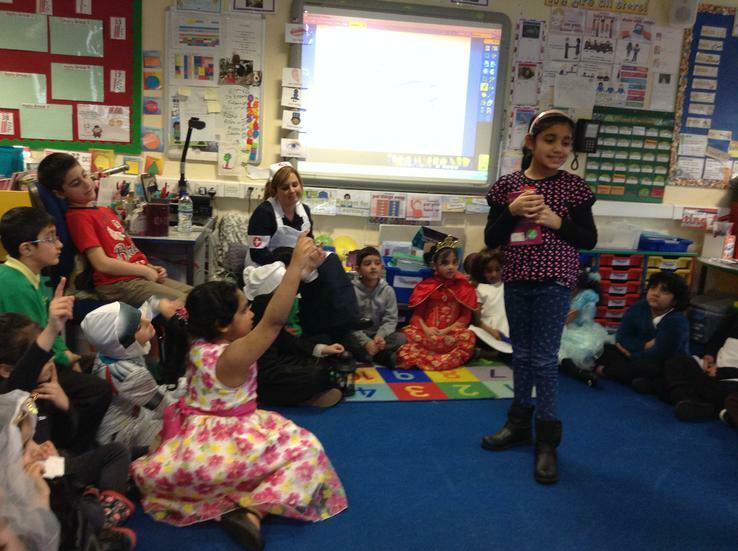 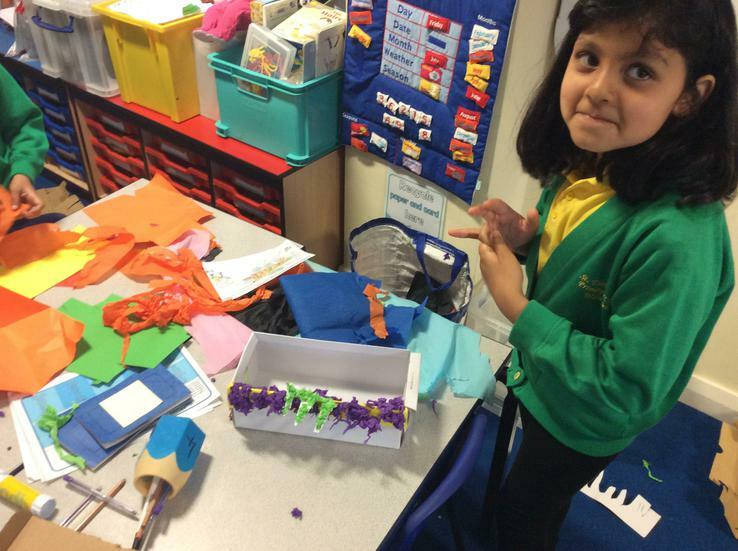 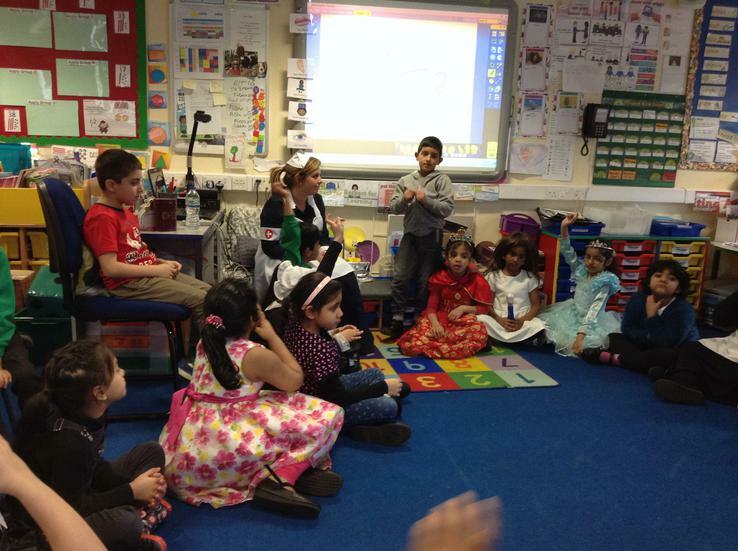 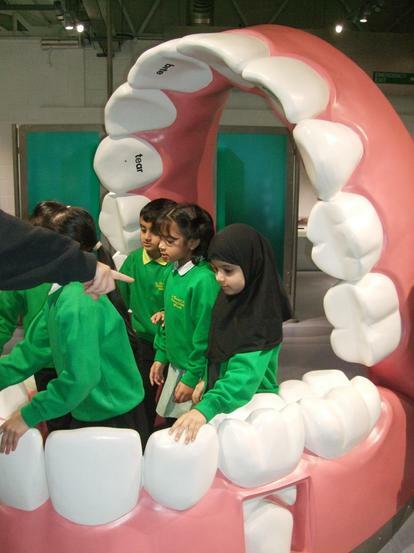 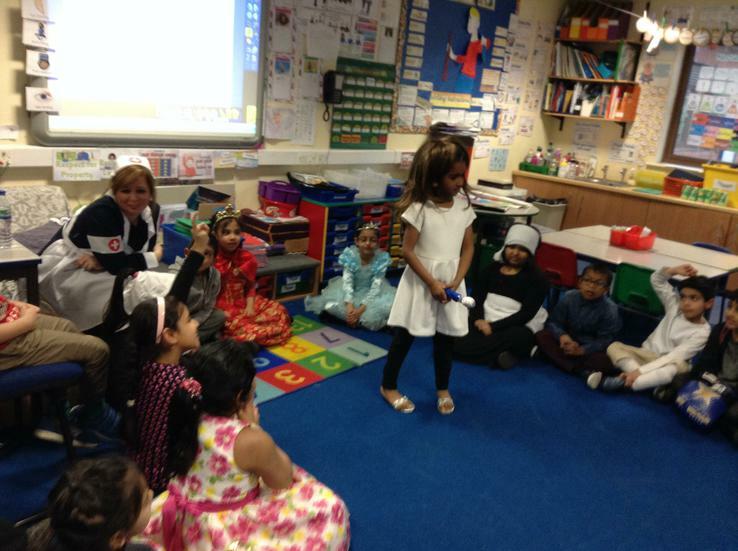 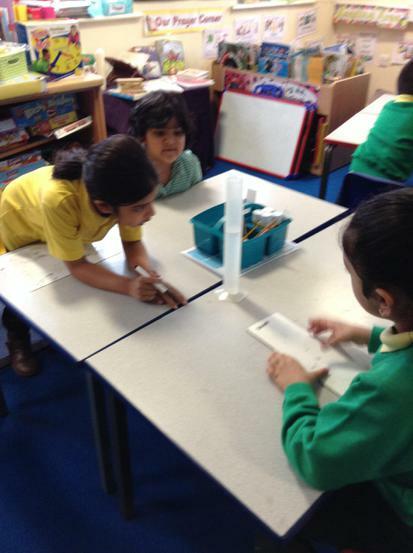 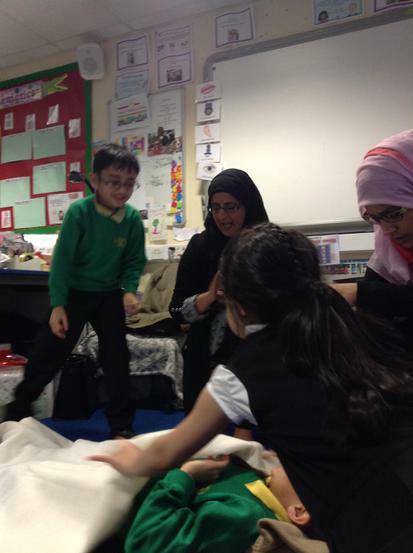 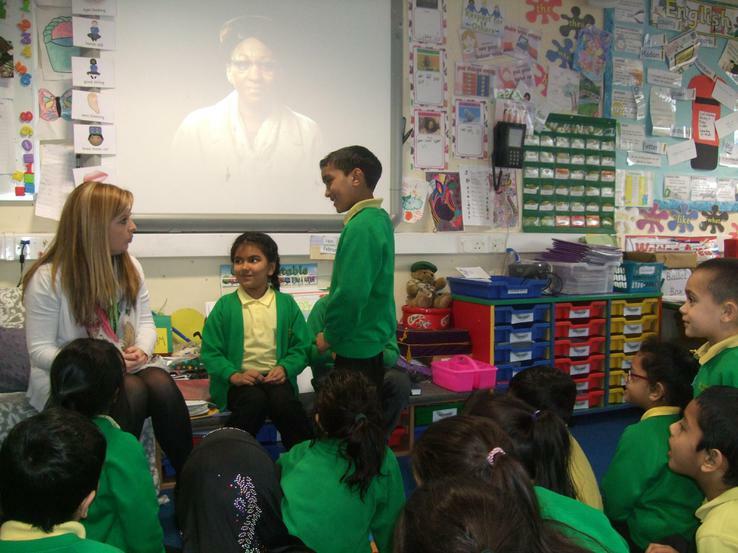 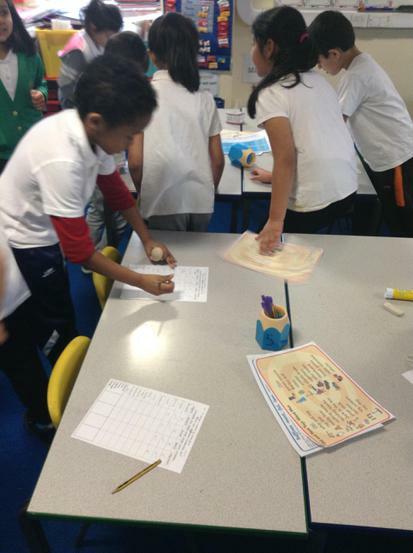 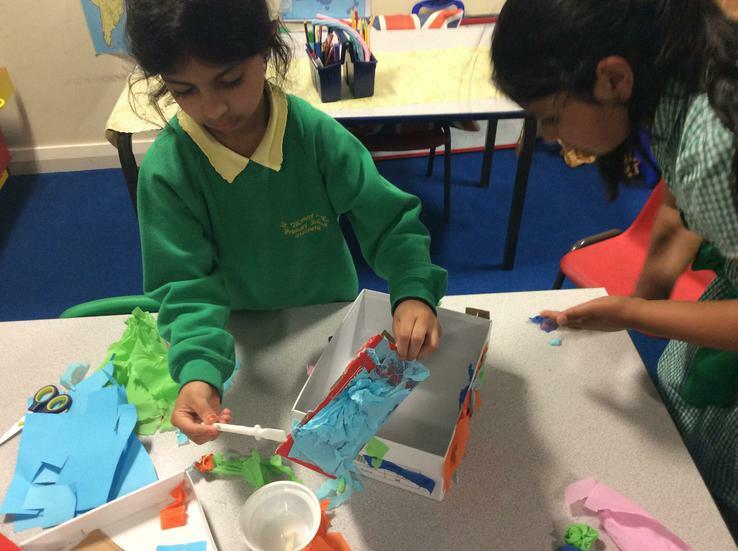 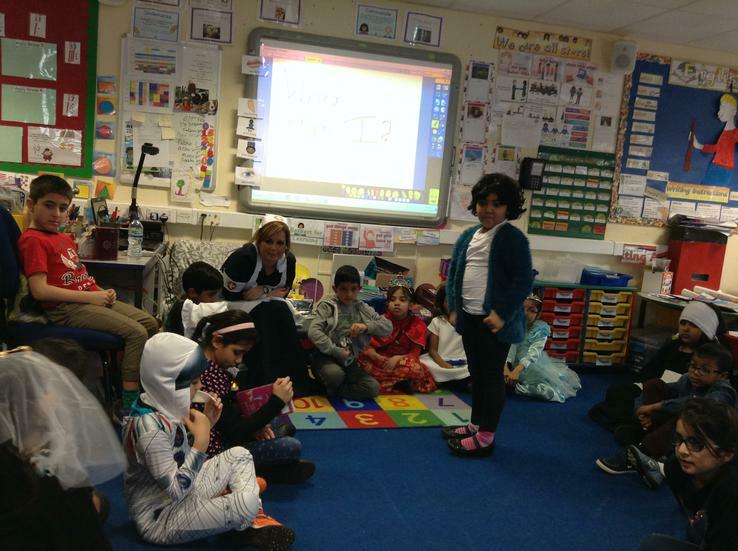 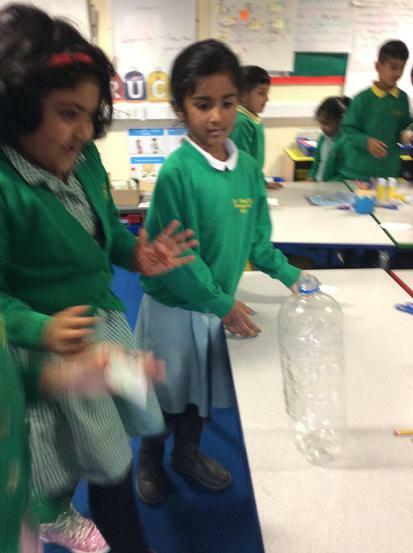 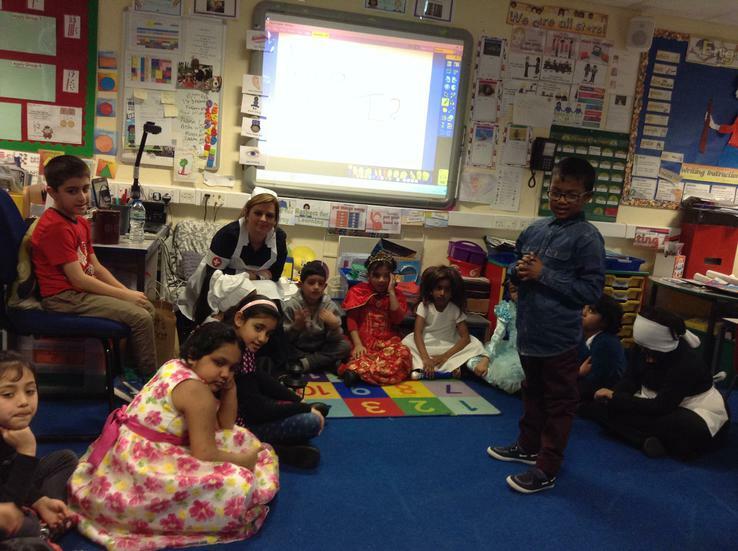 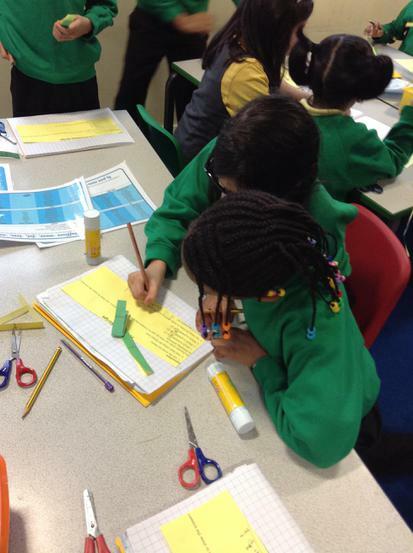 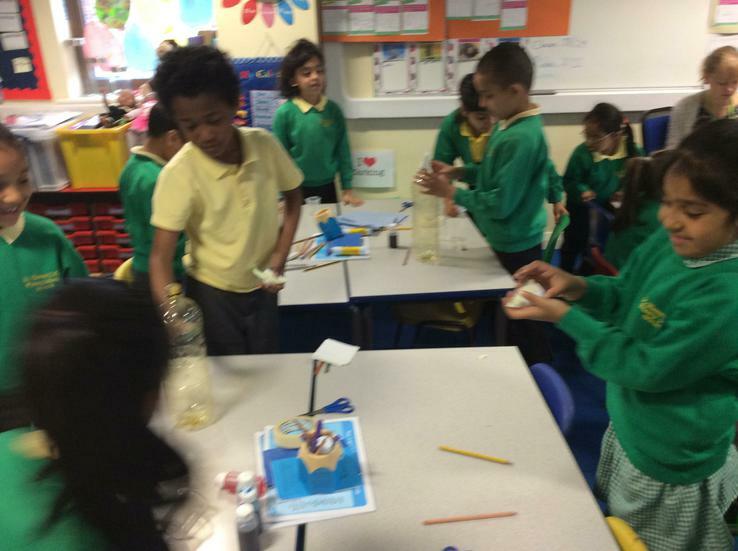 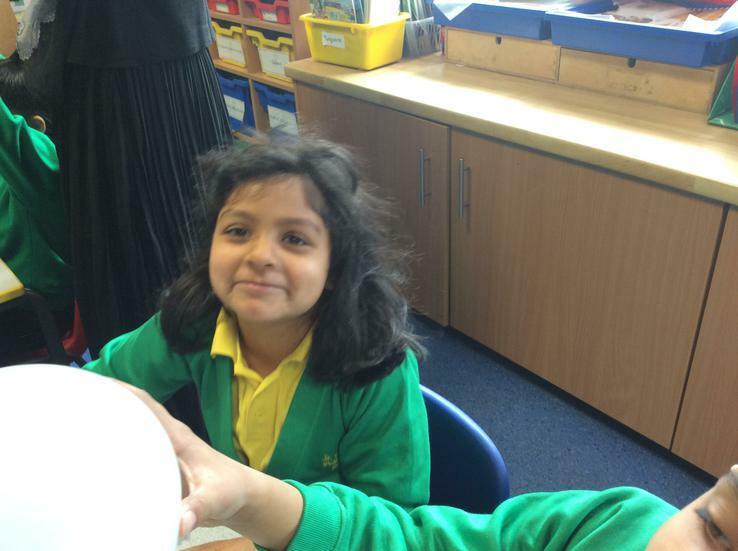 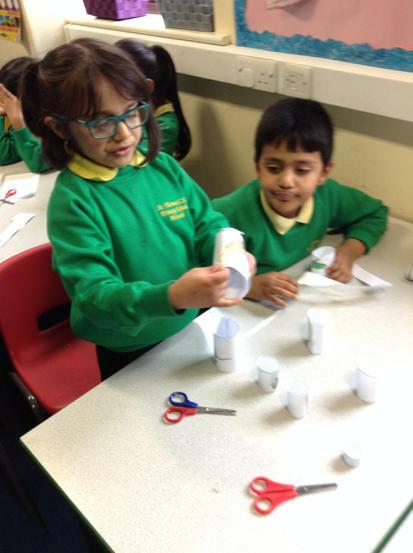 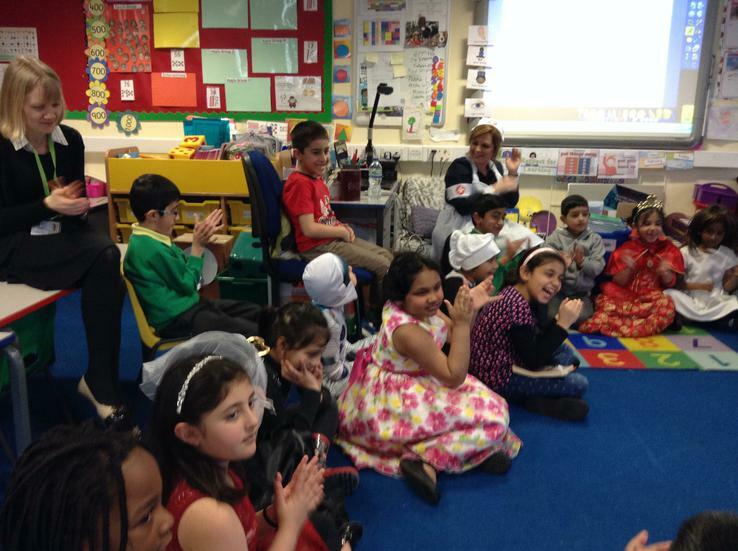 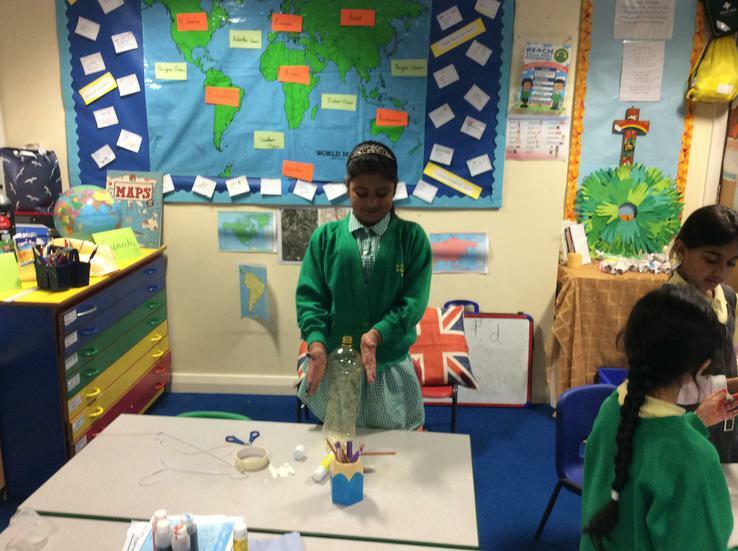 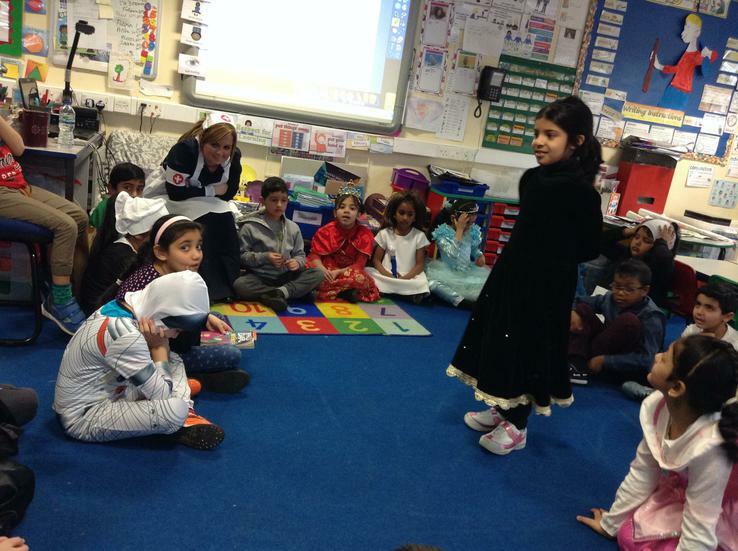 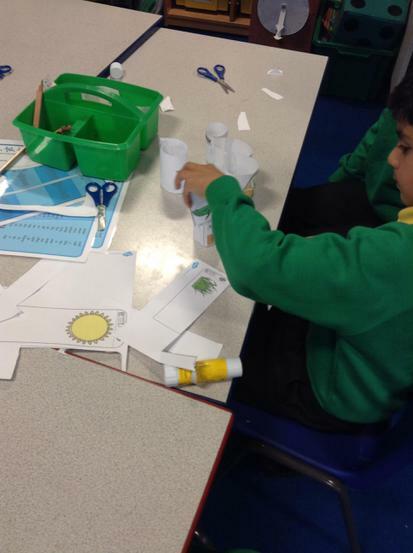 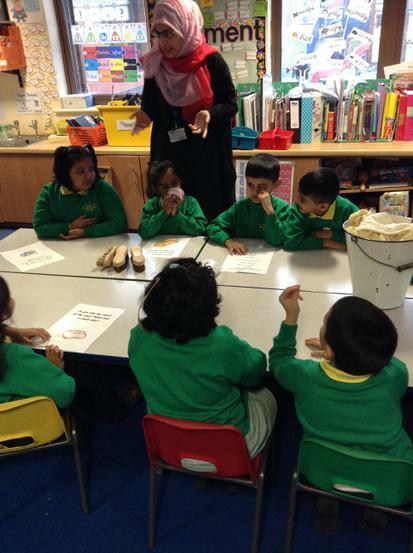 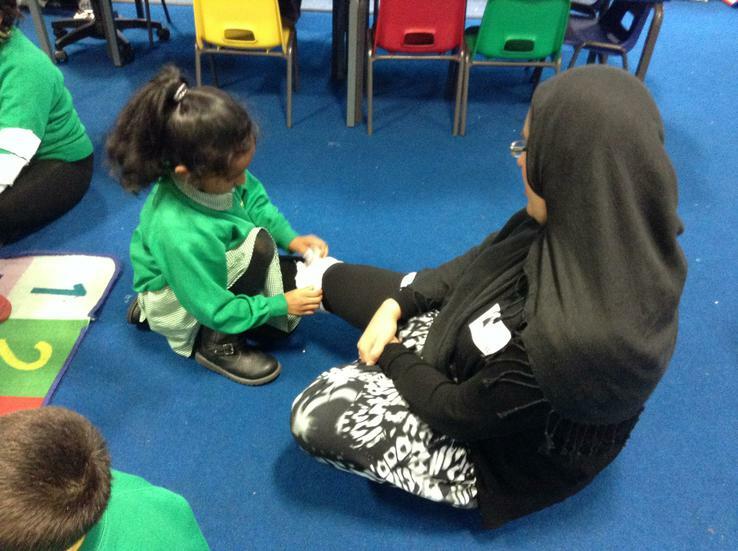 Miss White, Mrs Latham, Mrs Miah, Mrs Begum, Miss Mehnaz and Mrs Mahmood work alongside the class teachers. 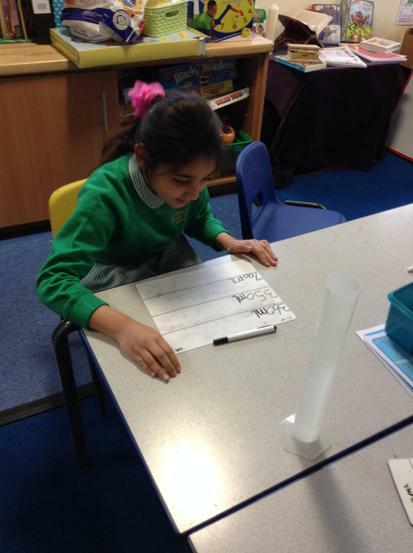 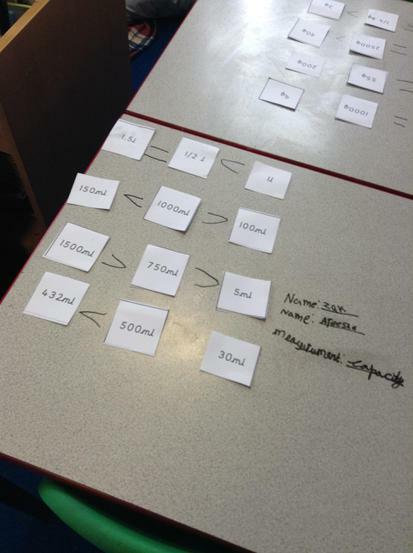 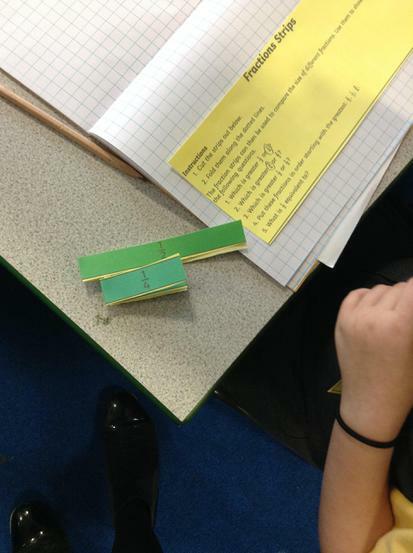 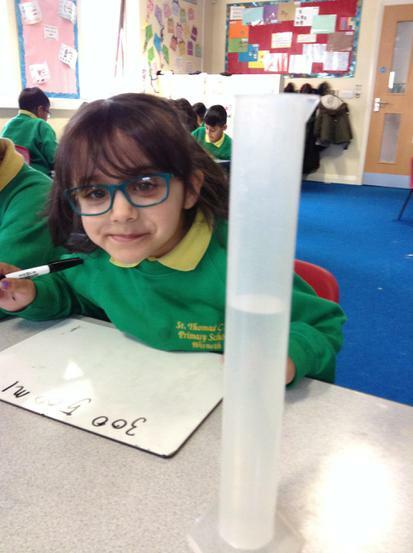 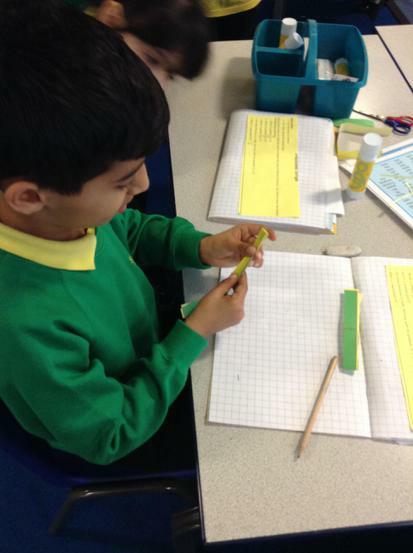 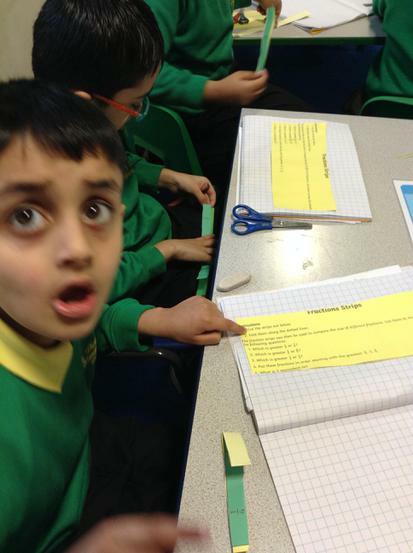 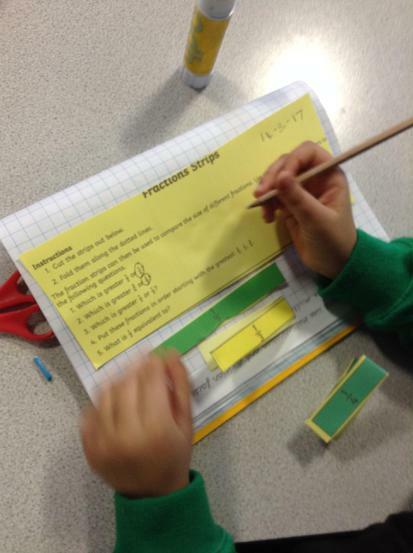 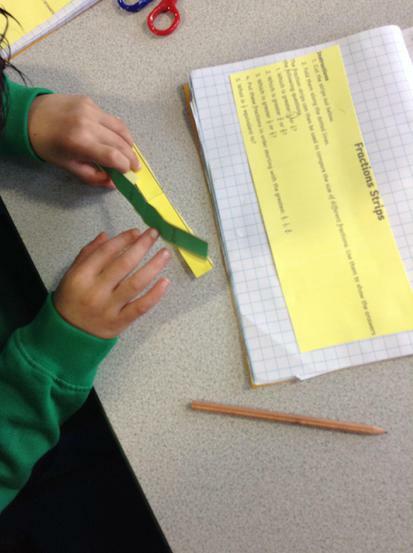 This half term in Maths we are focusing on Measures. 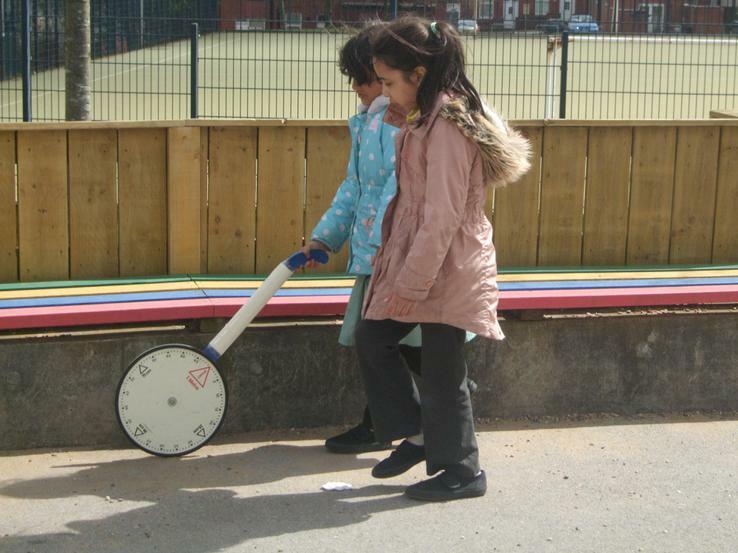 We will be reading and telling the time to the nearest 5 minutes and learning the different units of measure, comparing them using < > and =. 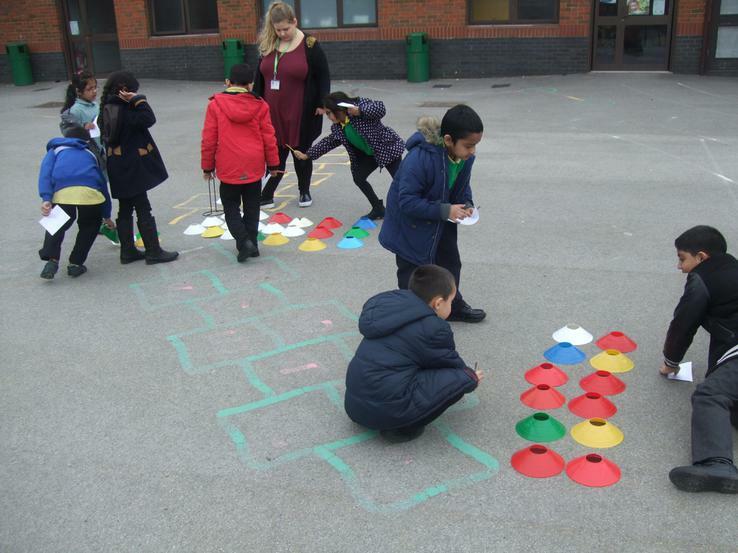 Also we are learning about data handling and direction and position, linking this to our curriculum topic, 'From A to B'. 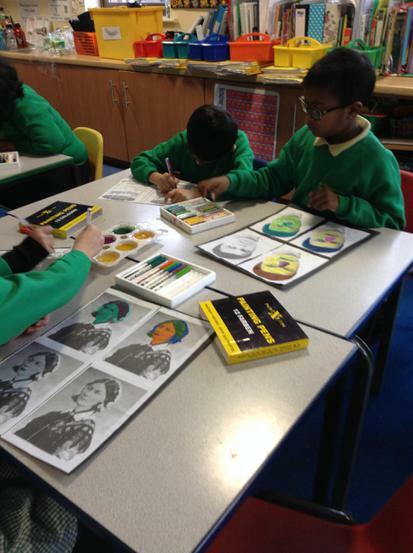 In English, we will be starting the new half term off with looking at stories by the author Oliver Jeffers. 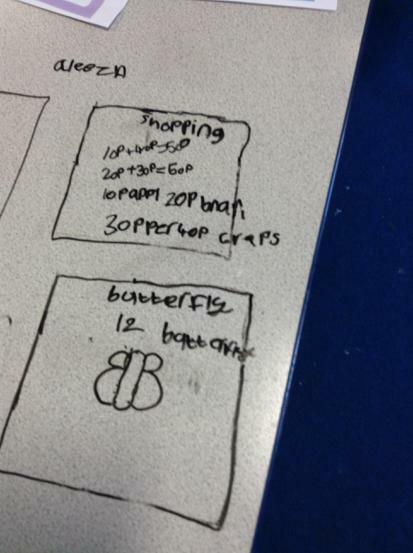 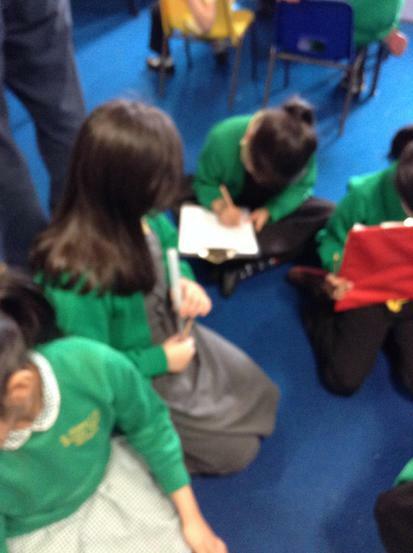 We will be looking at the story Lost and Found and rewriting the story making our own changes. 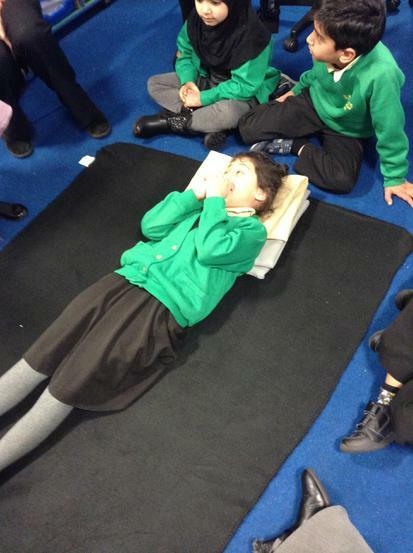 We will be comparing this story to other books by Oliver Jeffers including the 'The Way back home' and 'Up and Down'. 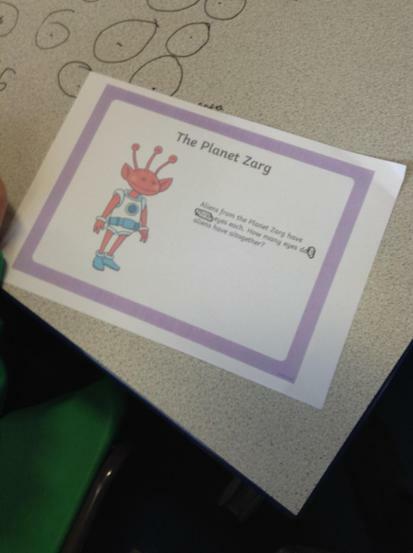 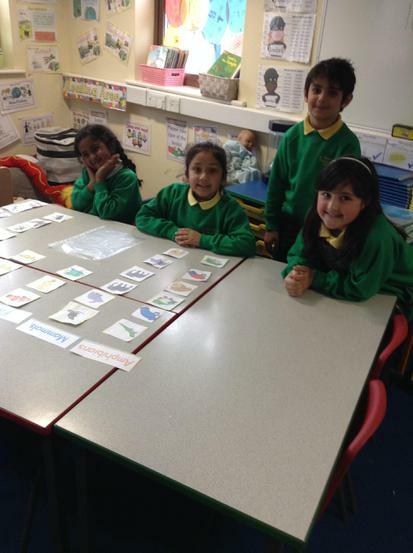 Our new geography topic 'From A to B' will help us to learn the names of the seven continents and oceans around the world. 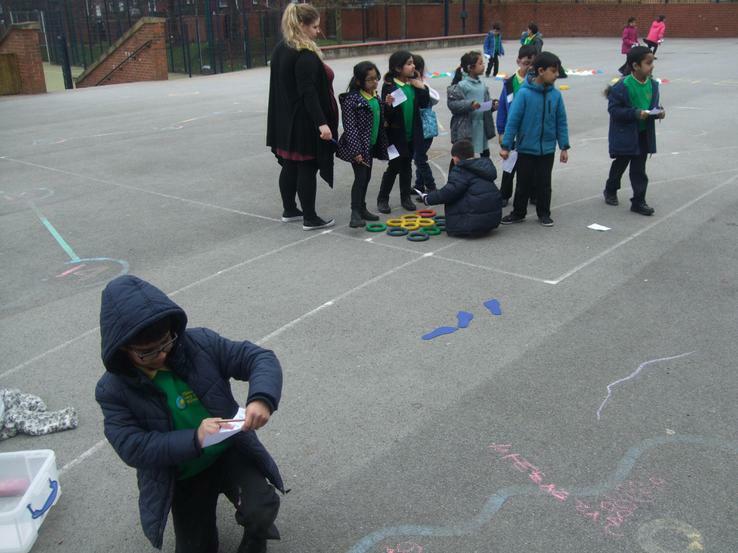 We will be identifying capital cities and landmarks within Britain and using maps to understand different geographical features. 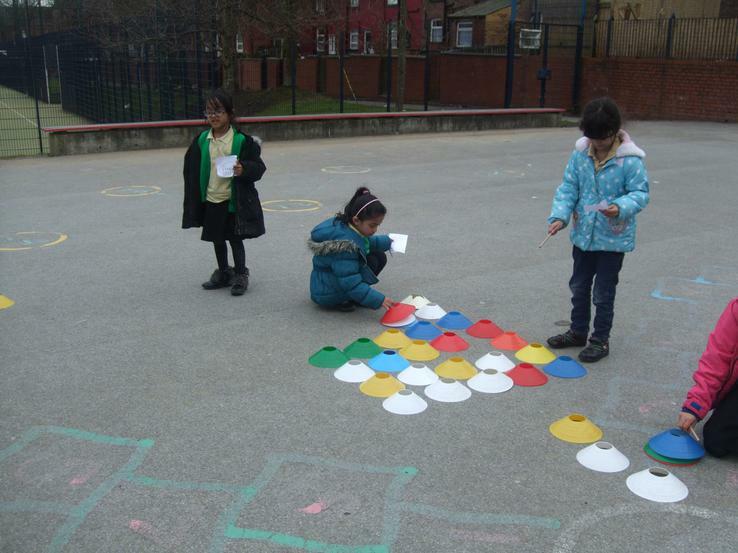 We will be creating our own maps using a key with physical and human features. 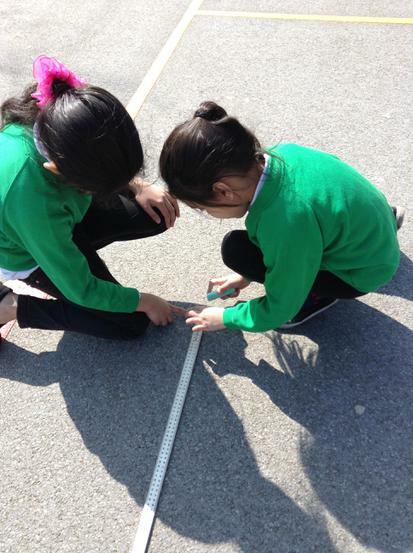 We are learning to use compass directions correctly. 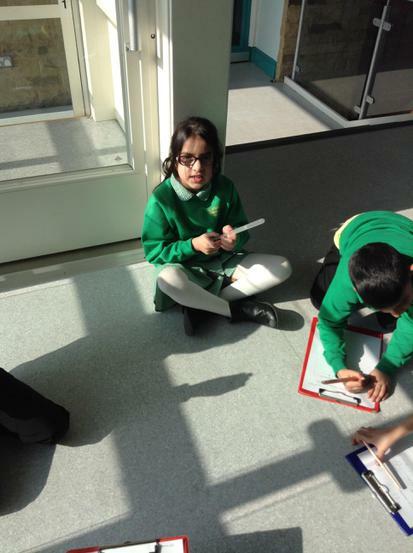 We will discuss the seasonal changes and why some countries in the world are hotter than others. 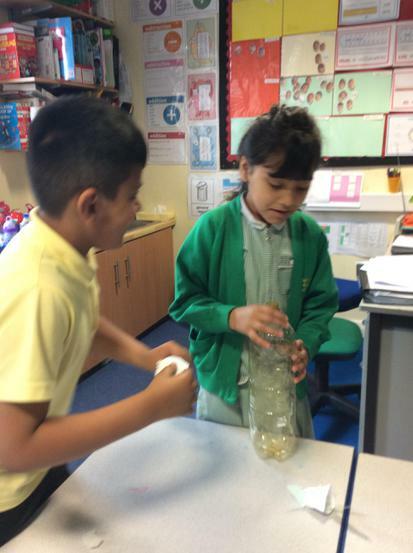 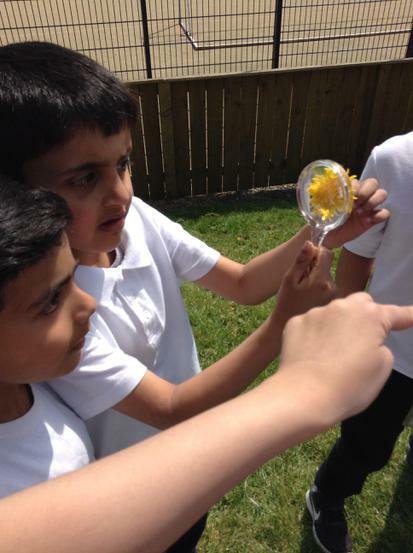 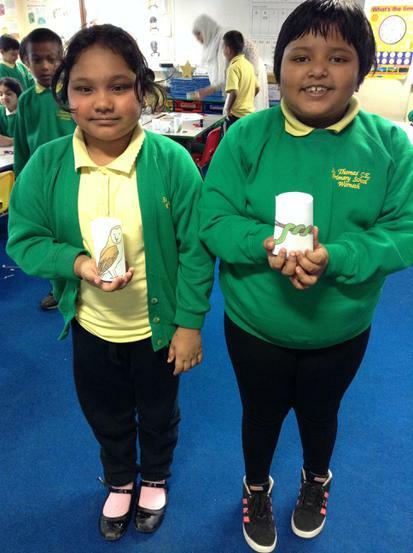 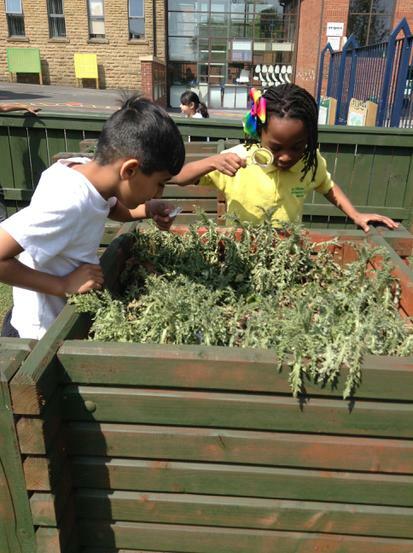 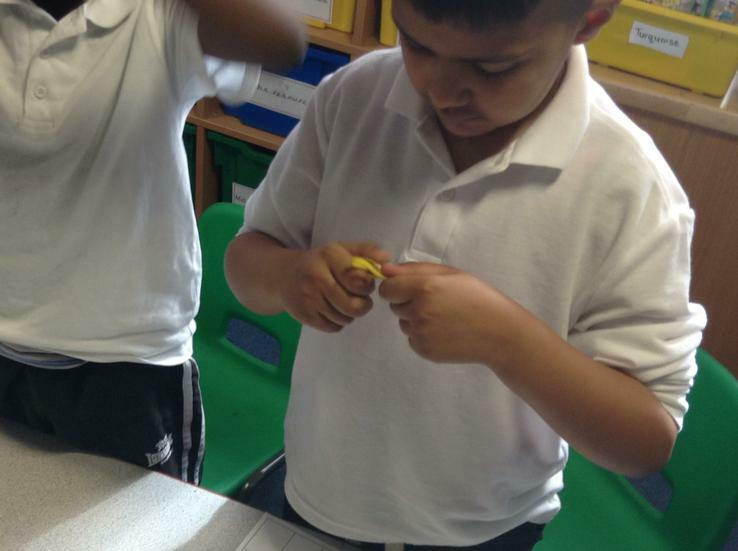 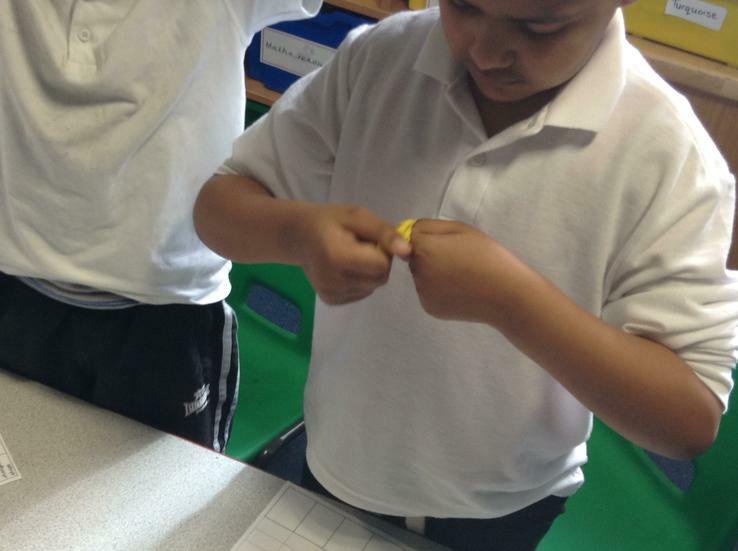 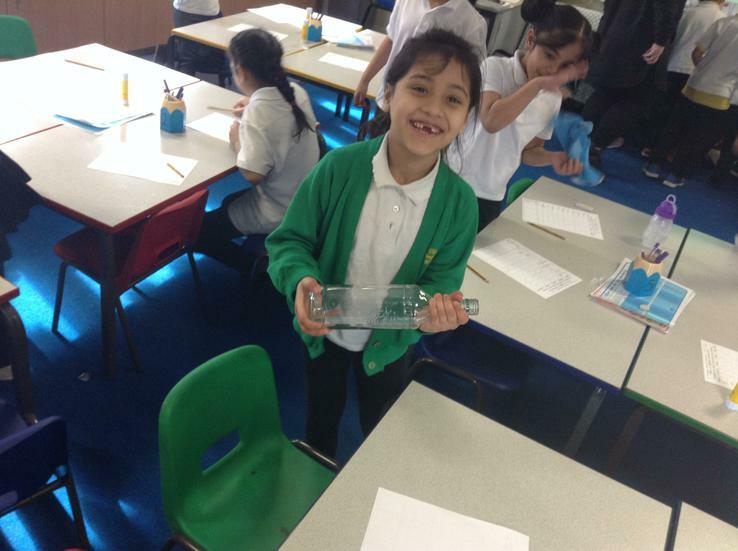 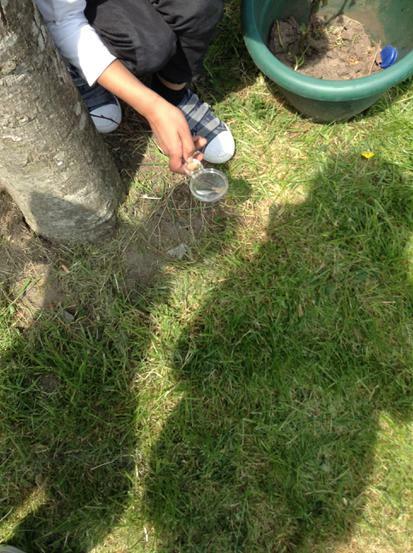 In Science, we have grown our own sunflowers and took part in an investigation to determine how cress grows best. 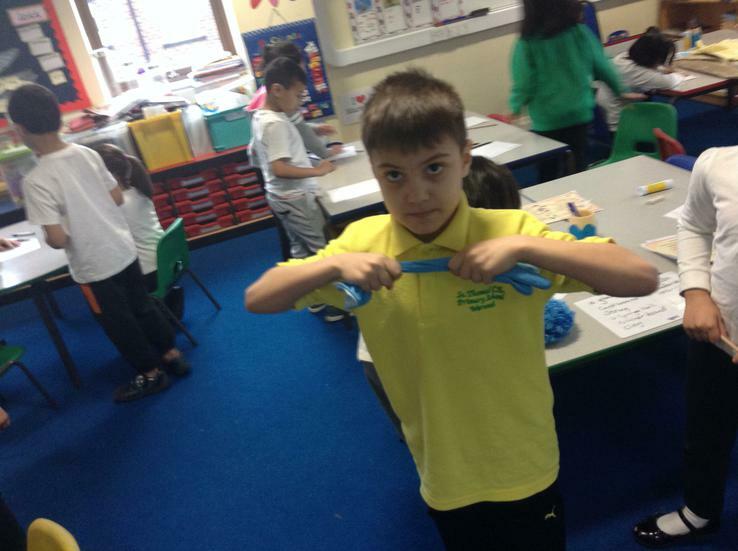 Please make sure that you have your PE kit in school at all times. 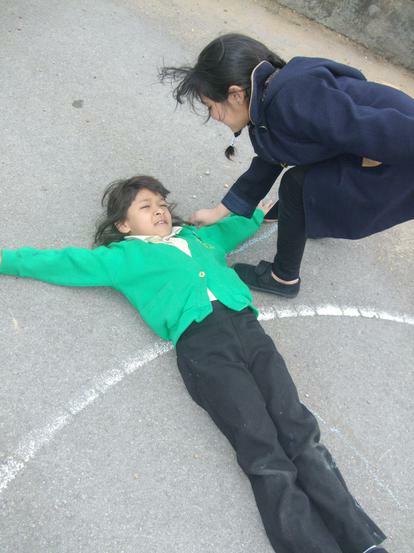 PE is on a Thursday morning and a Friday afternoon. 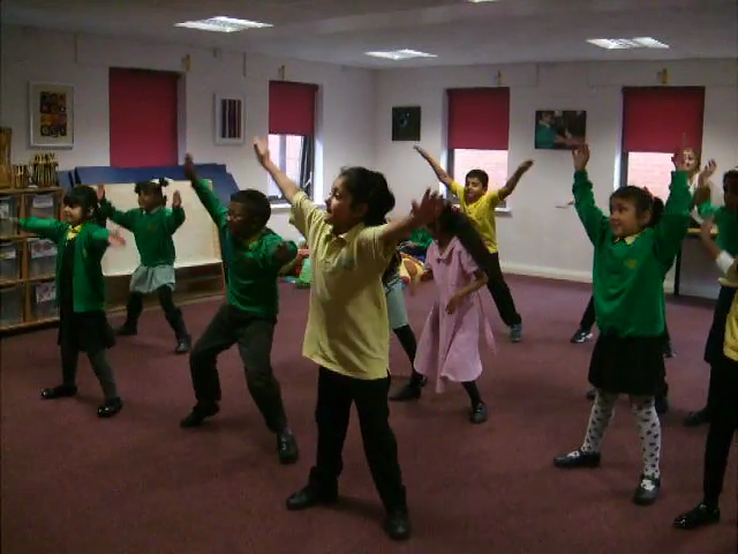 An extra dance session is on Thursday afternoons for 2JW. 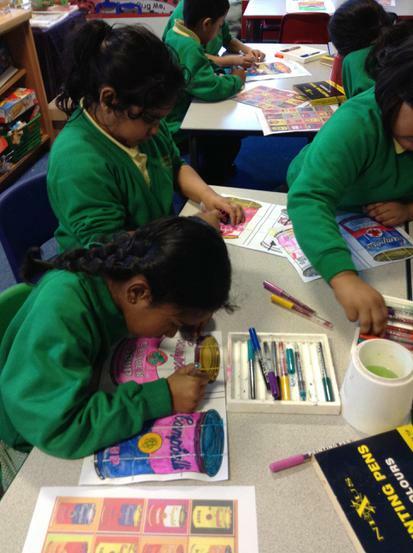 Please make sure book bags are brought to school every day! 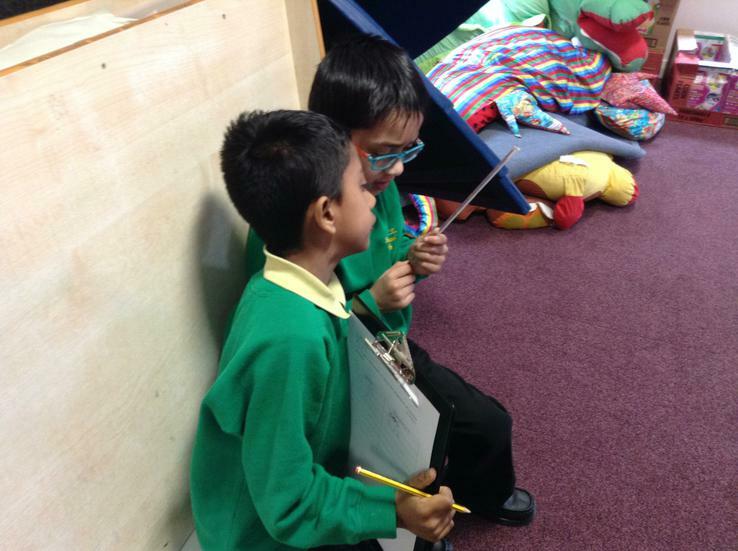 Continue to listen to your child reading at home and write a comment in their reading record so we can change their books regularly. 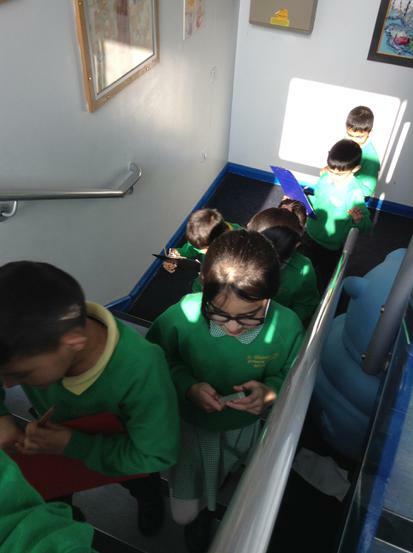 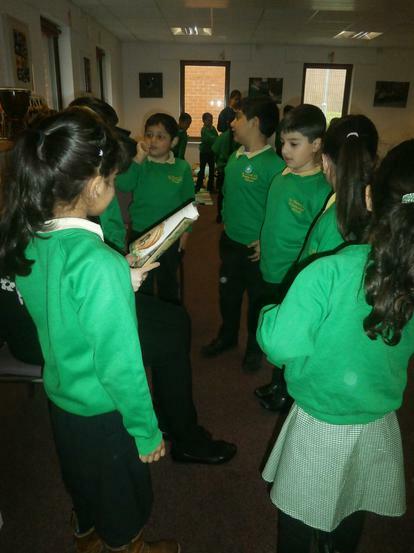 Year 2 go to the library on a Thursday. 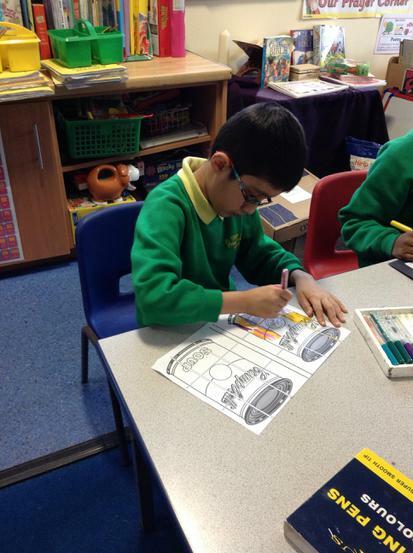 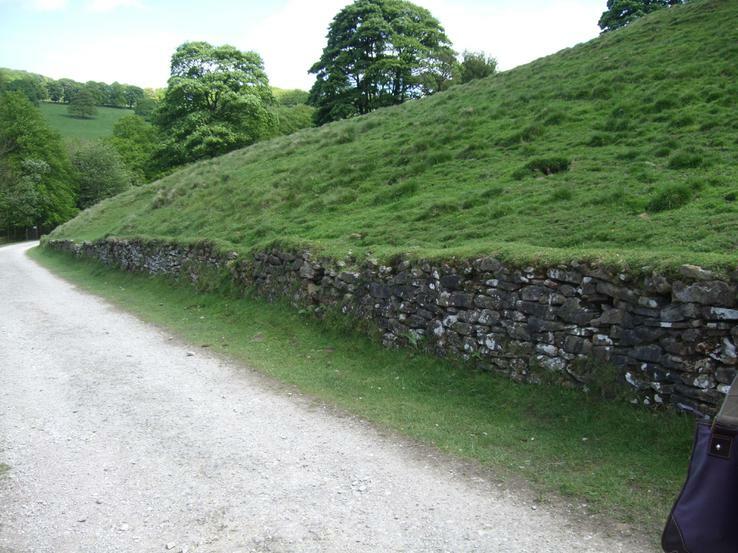 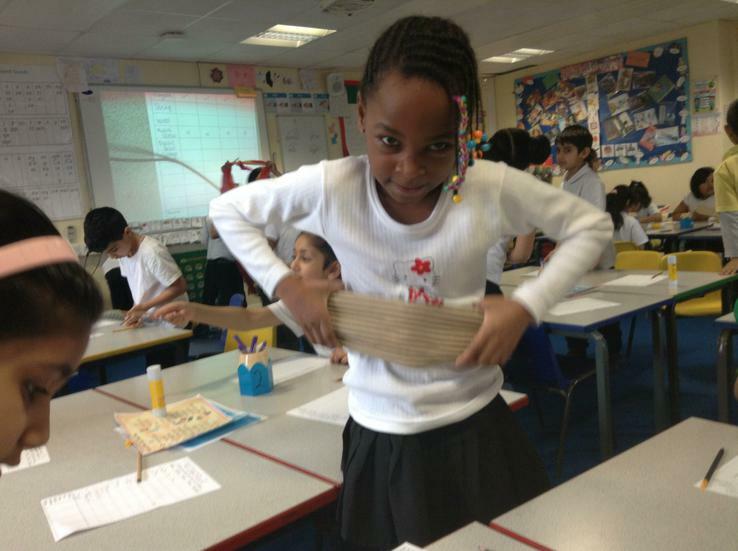 As you are aware homework in Year 2 has changed so that the children are taking responsibility for their own learning. 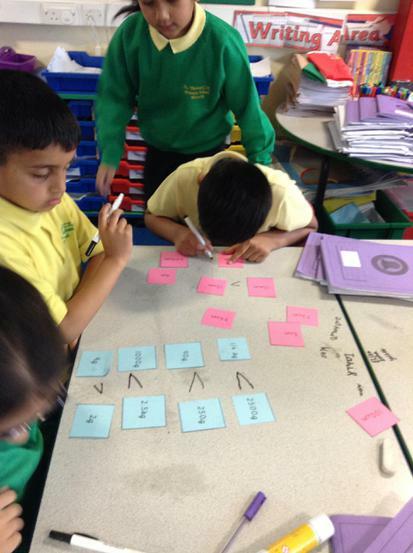 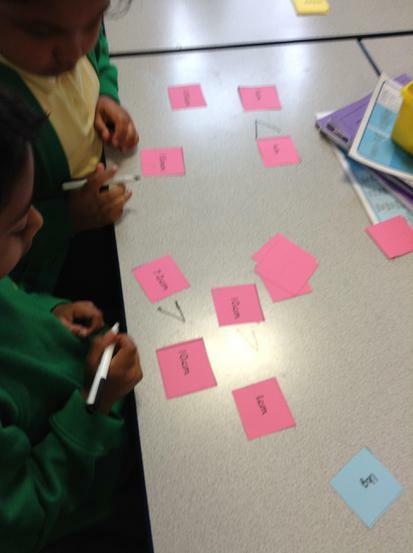 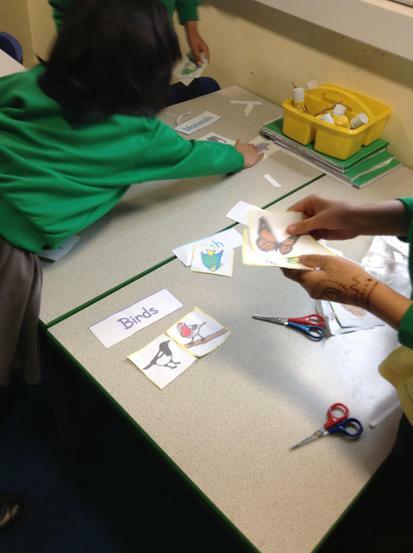 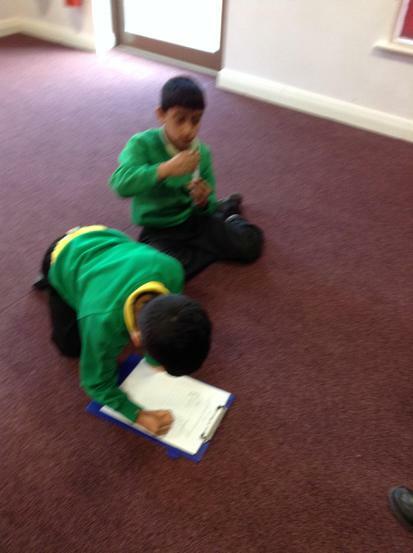 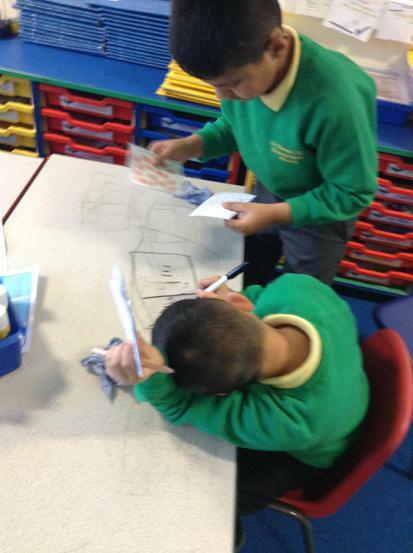 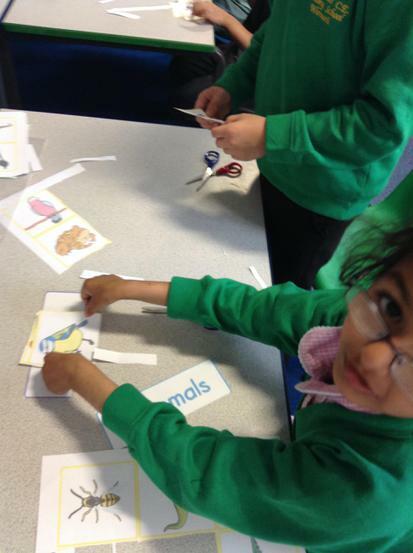 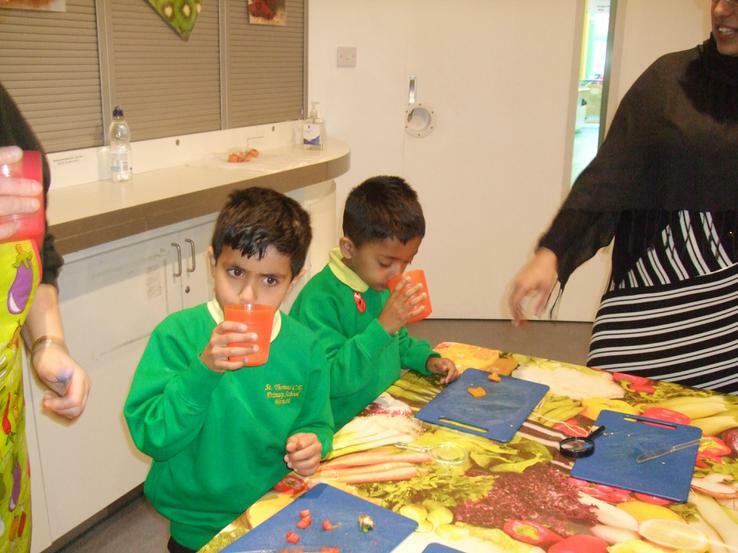 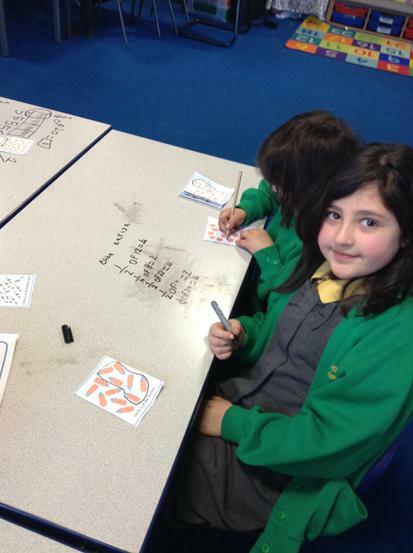 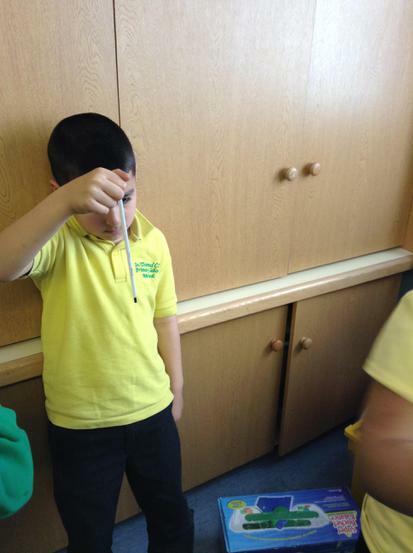 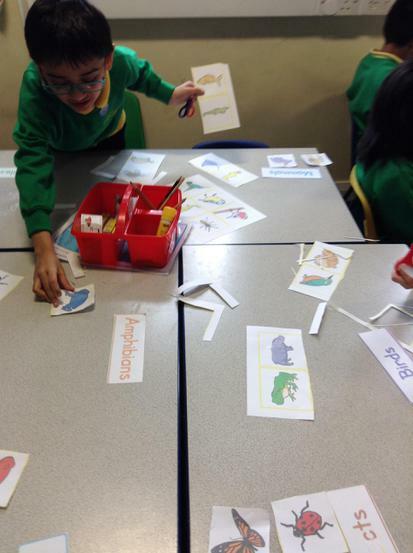 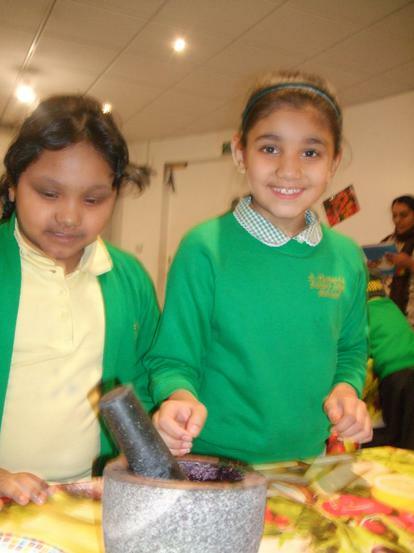 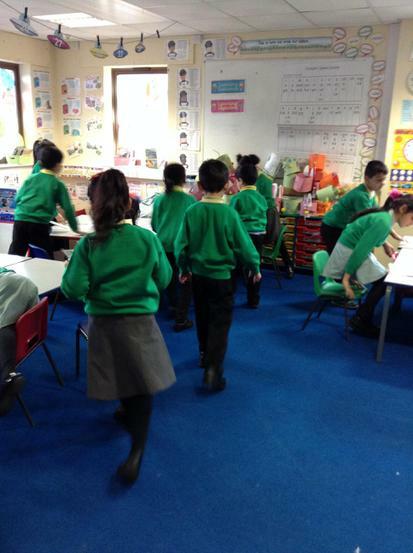 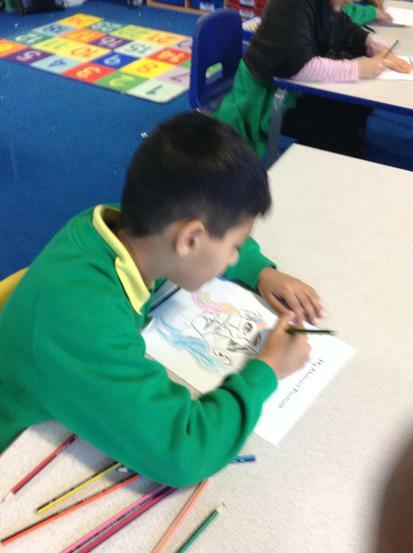 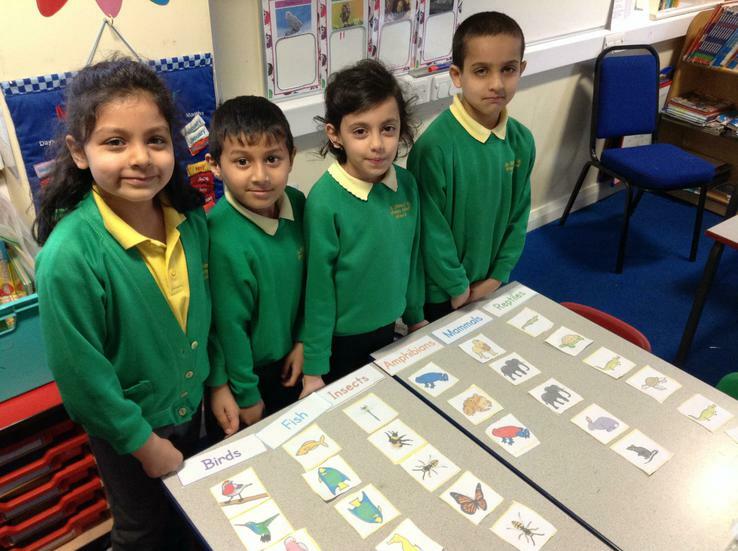 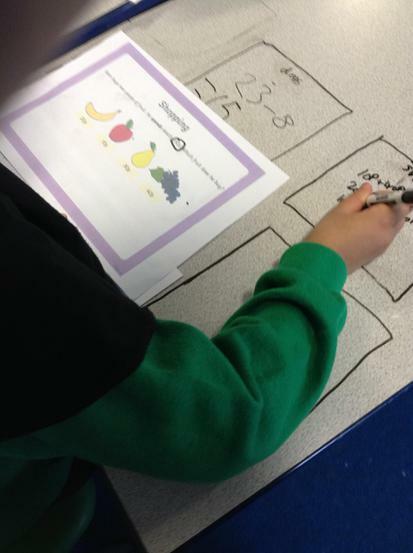 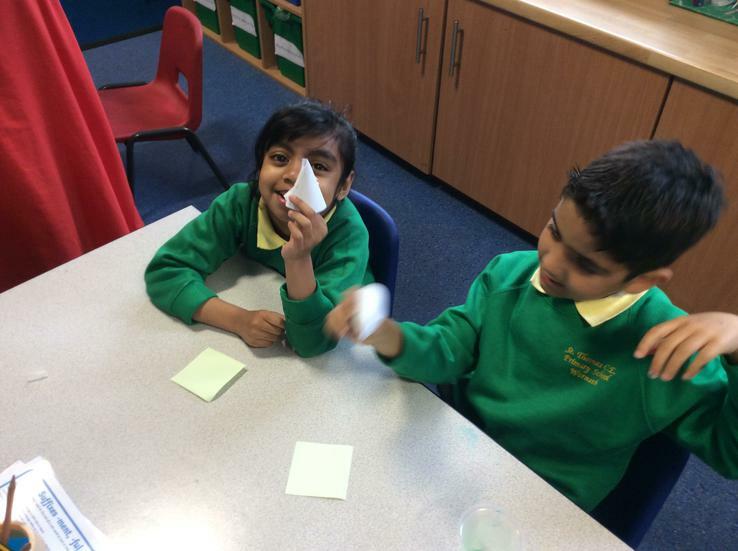 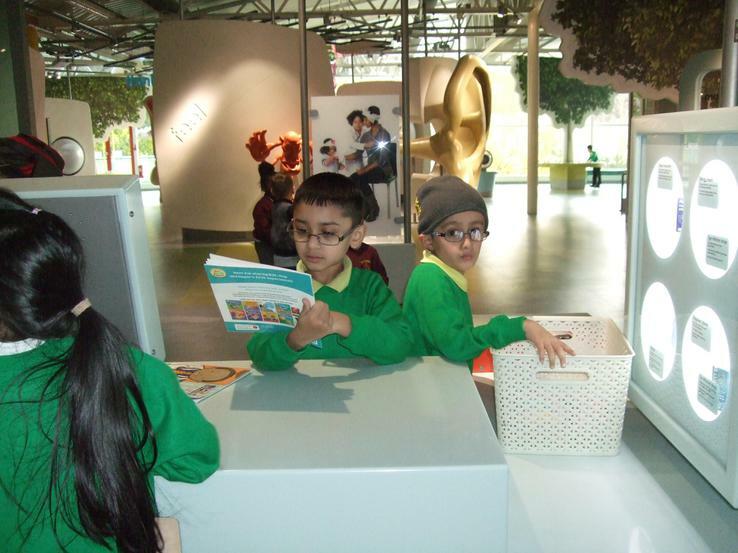 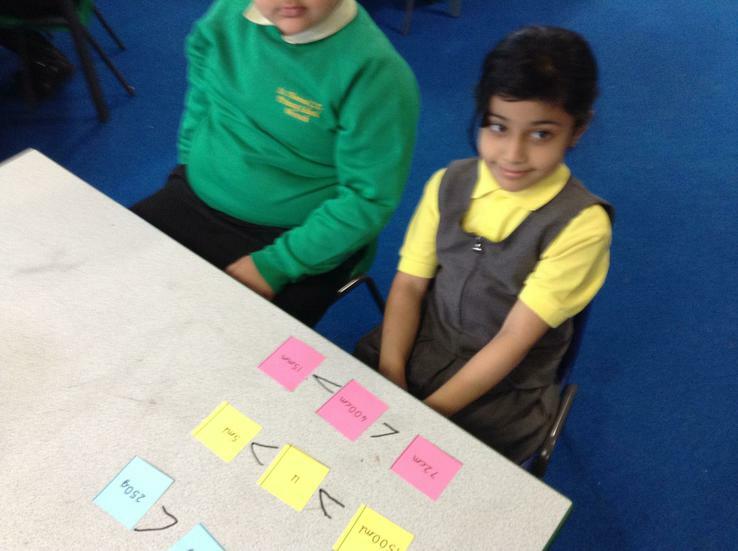 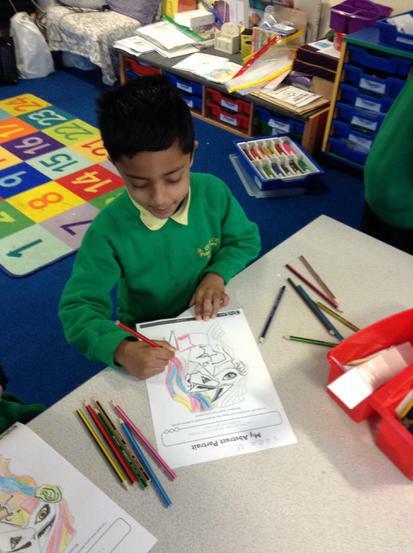 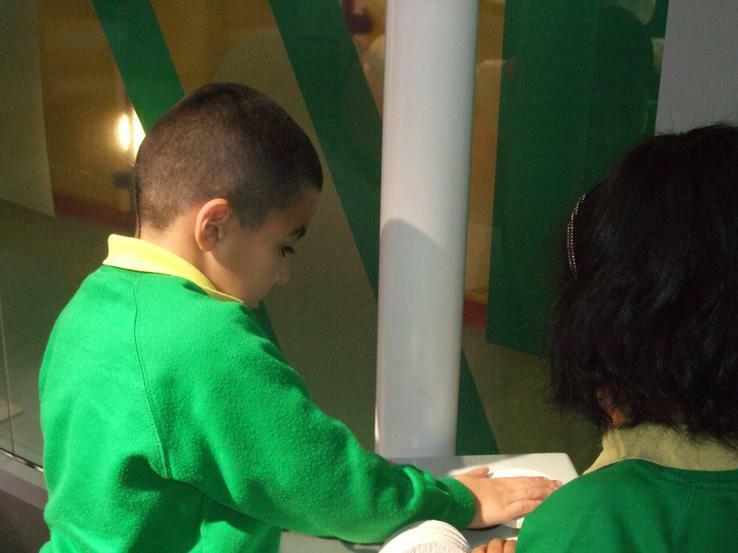 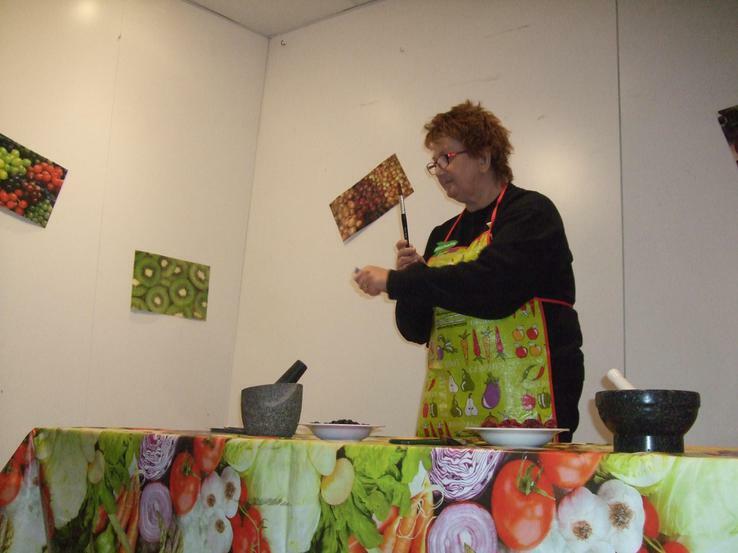 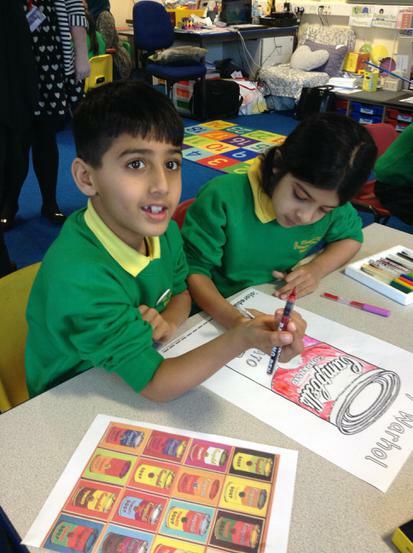 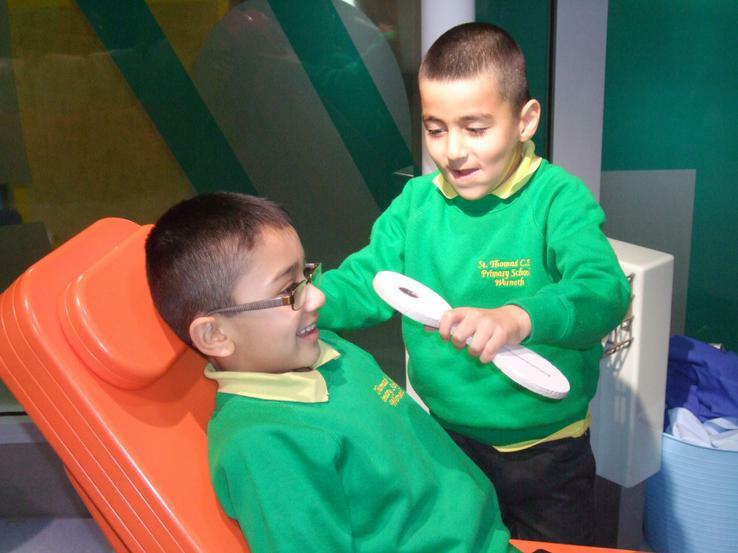 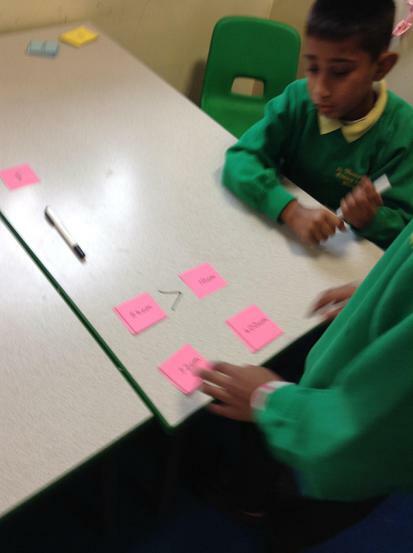 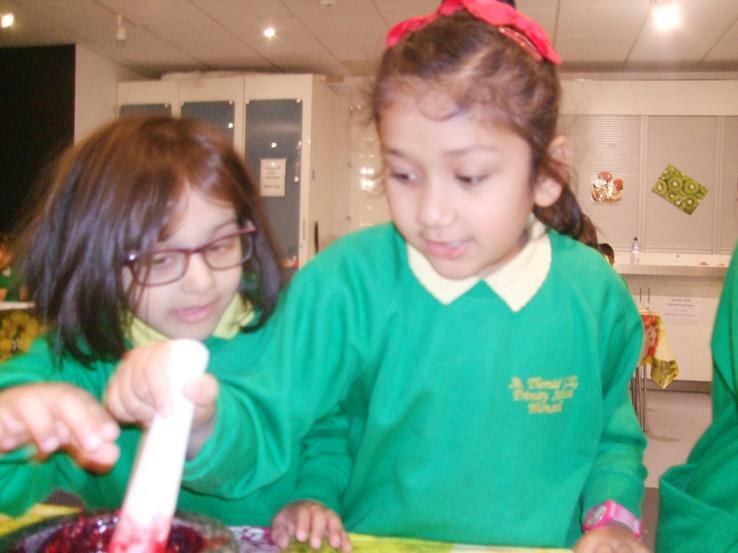 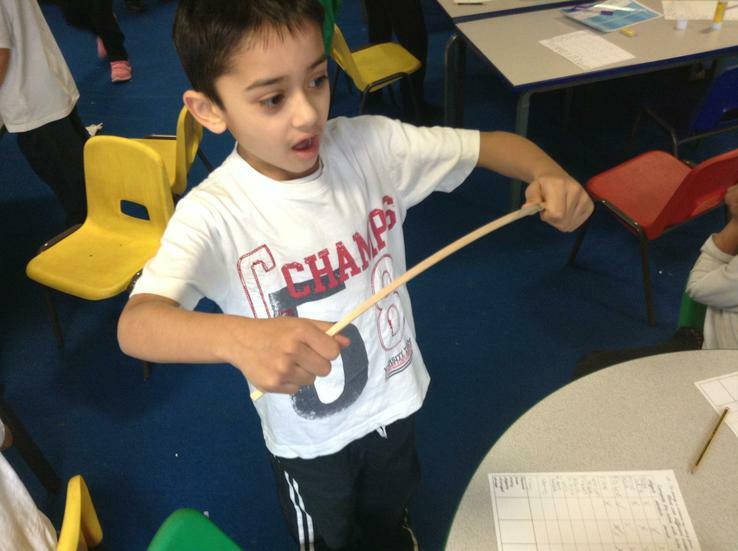 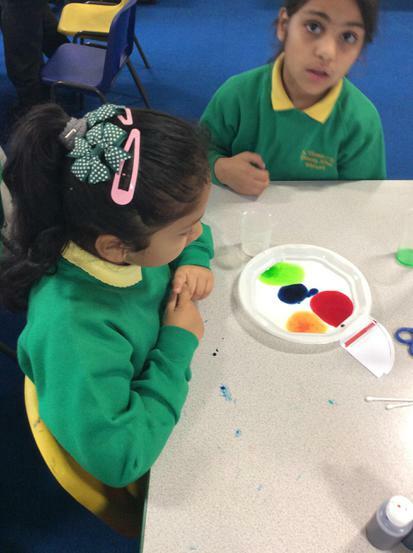 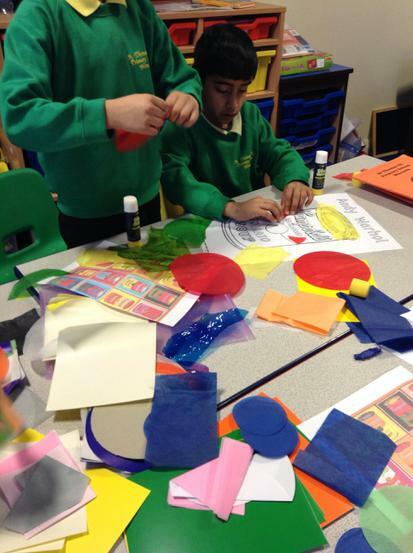 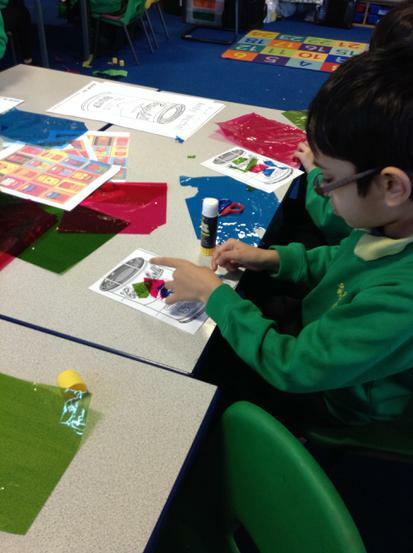 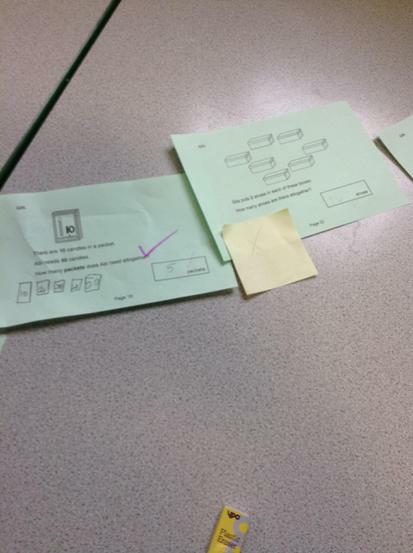 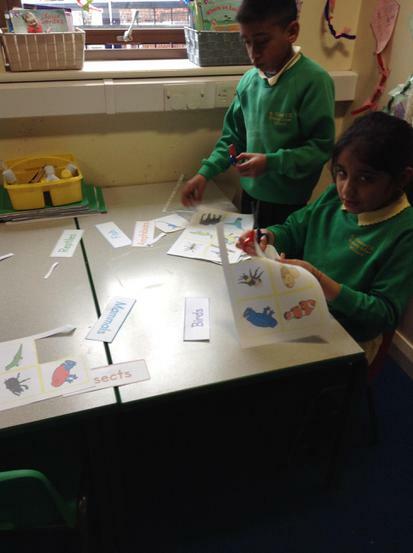 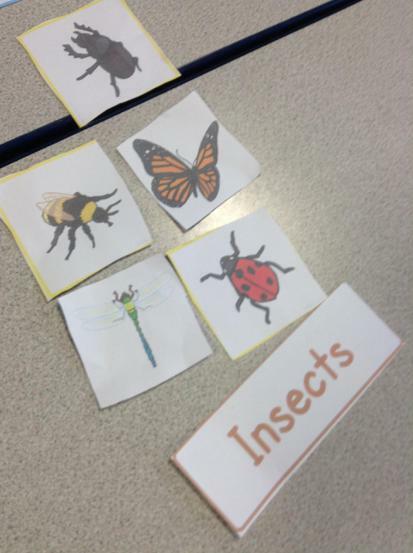 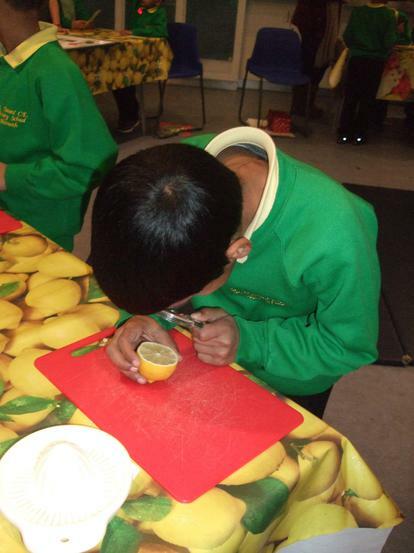 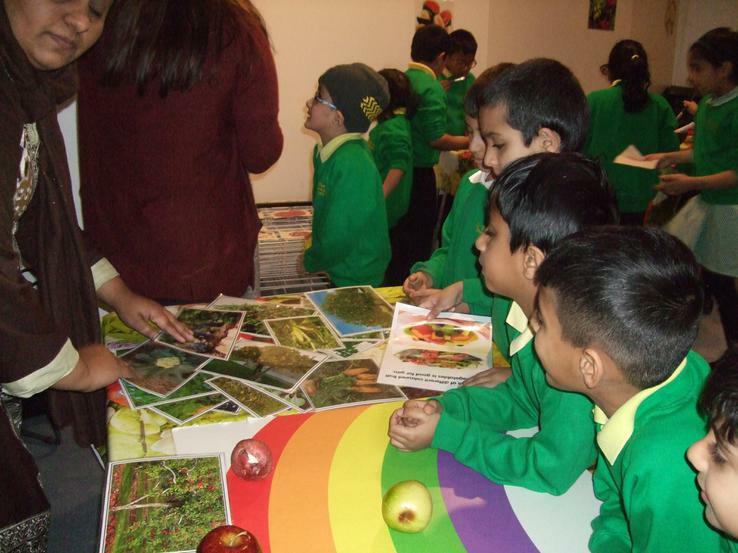 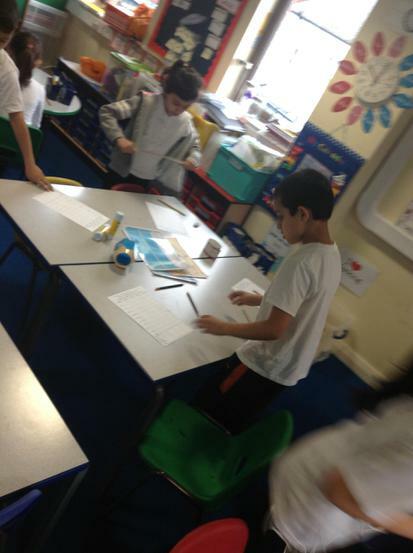 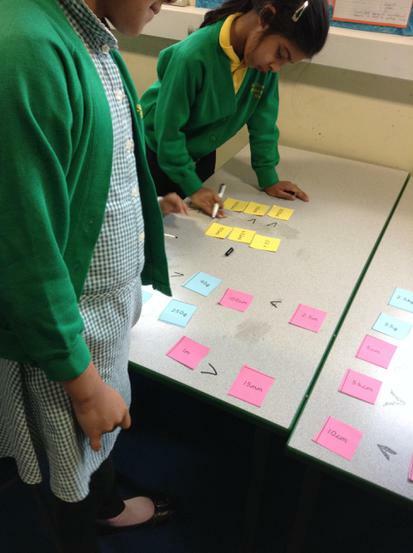 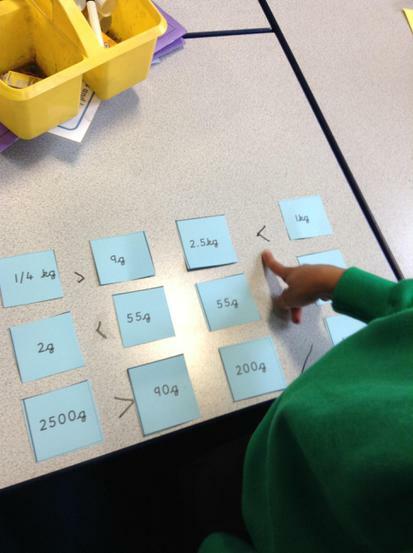 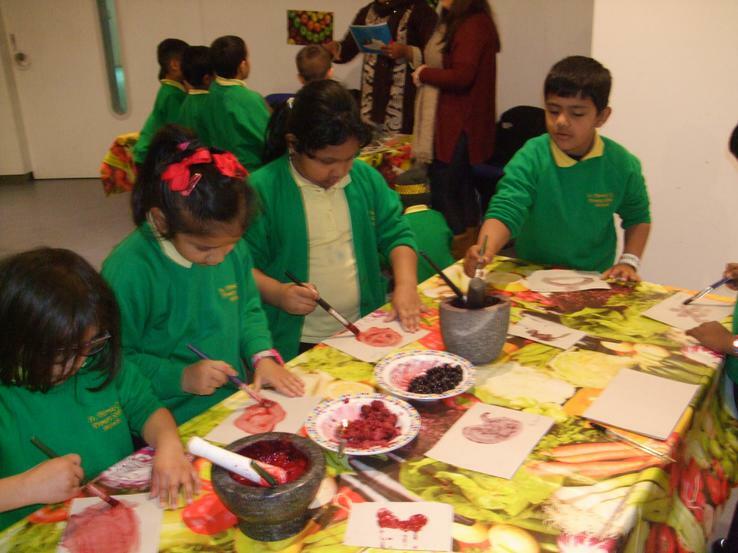 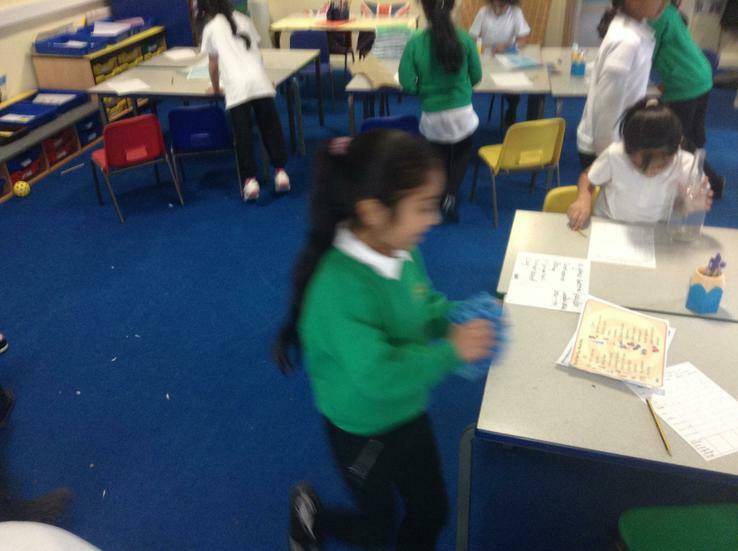 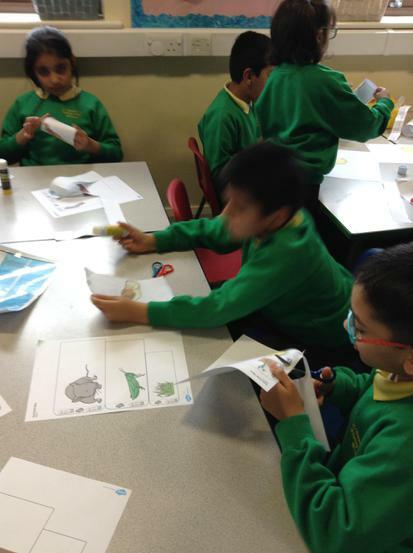 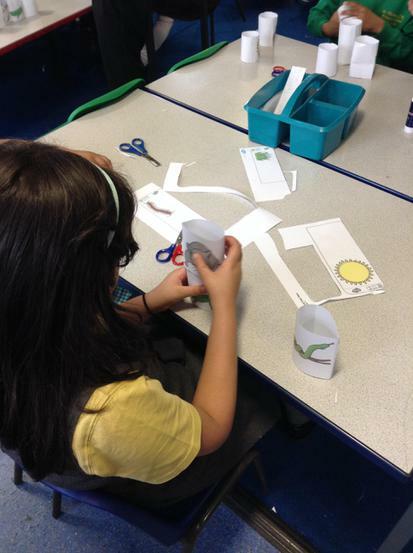 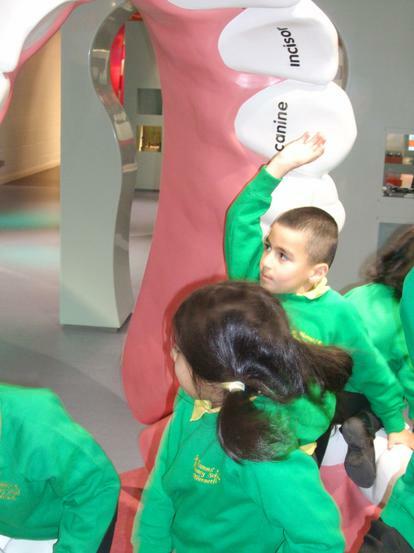 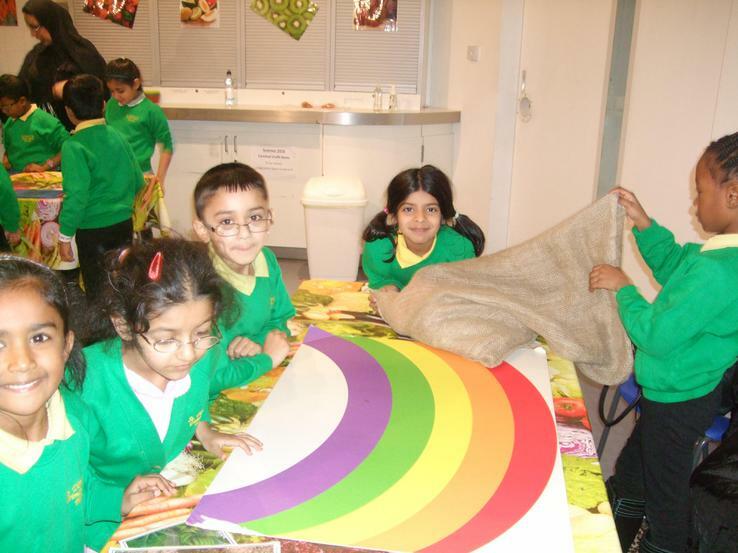 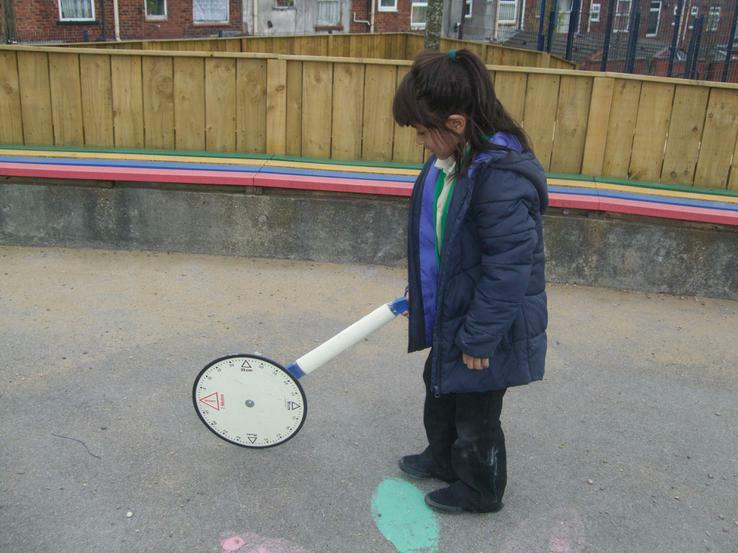 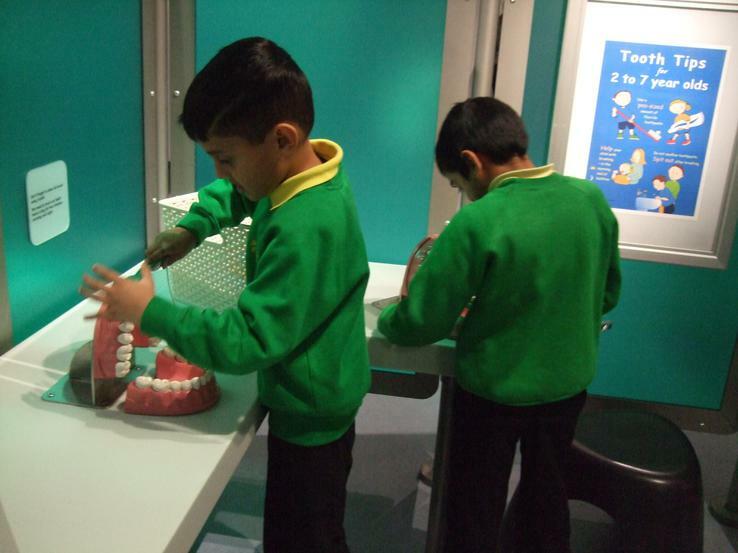 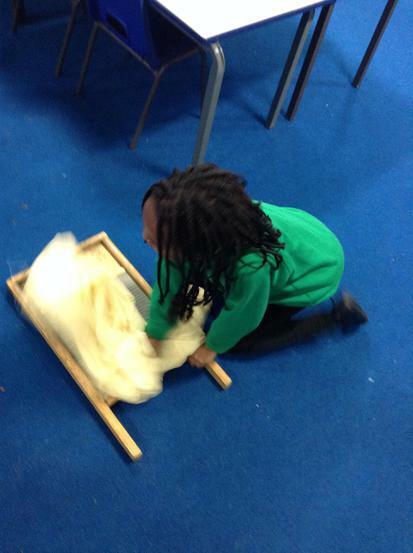 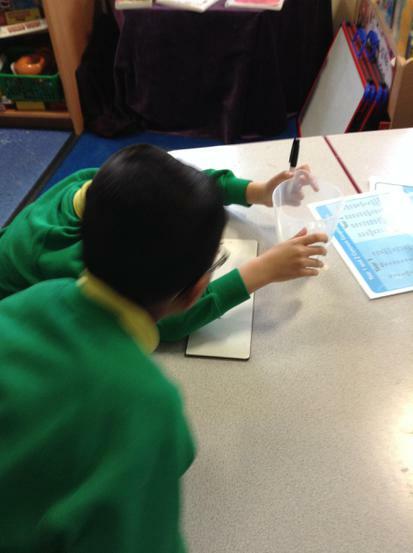 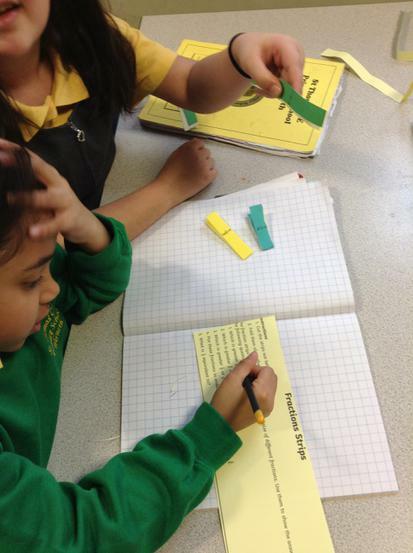 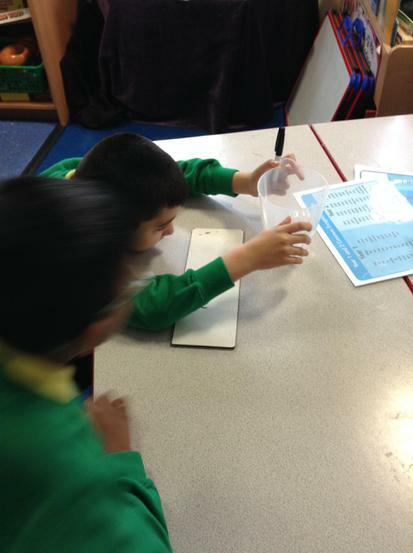 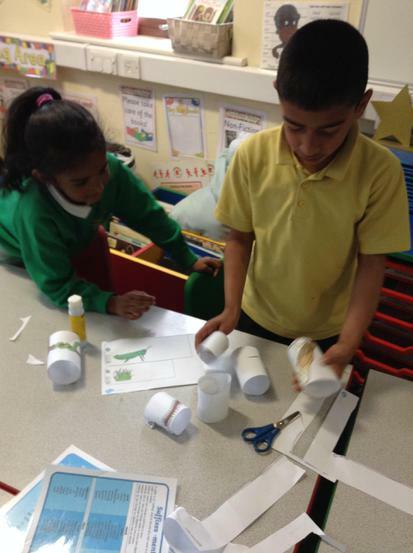 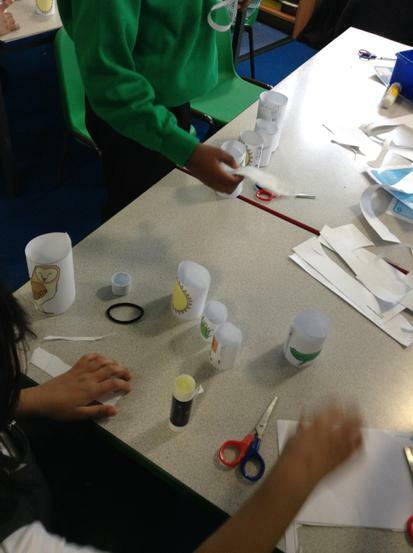 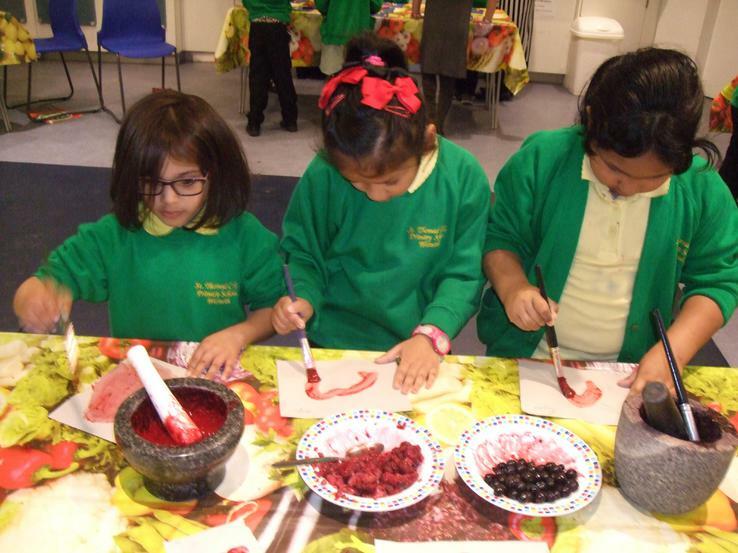 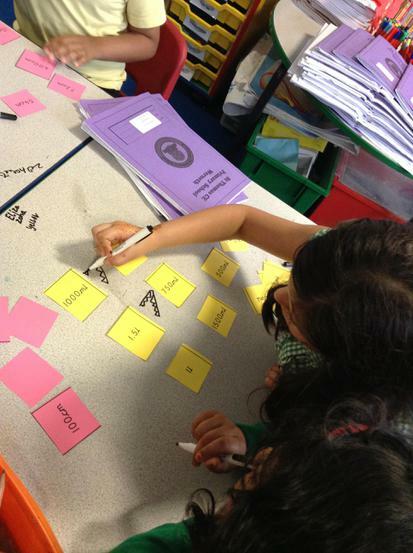 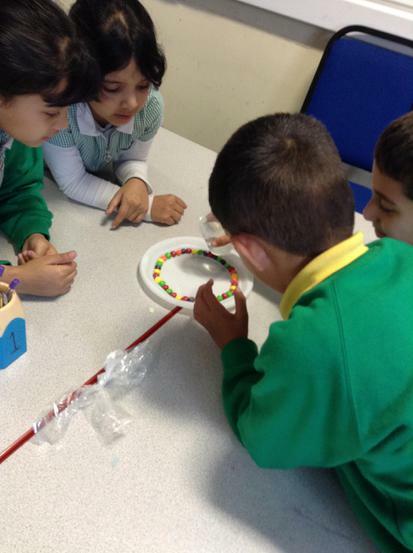 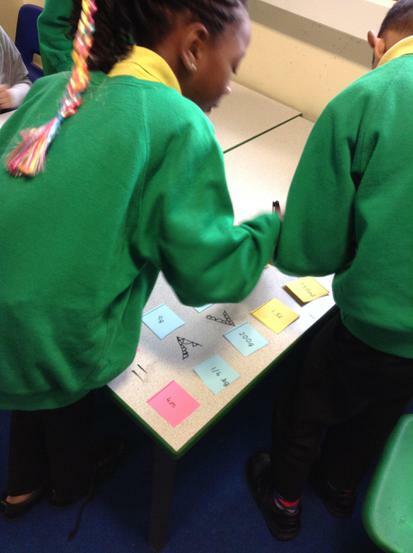 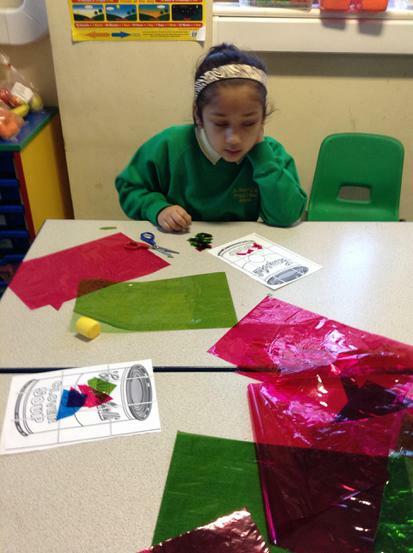 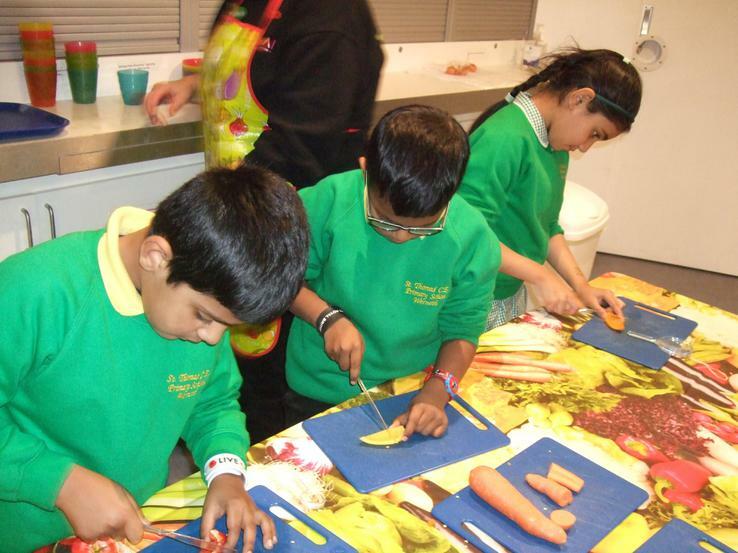 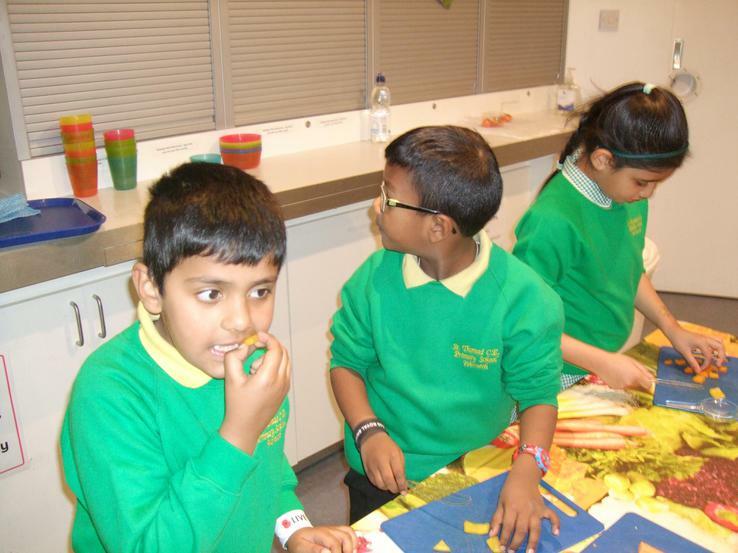 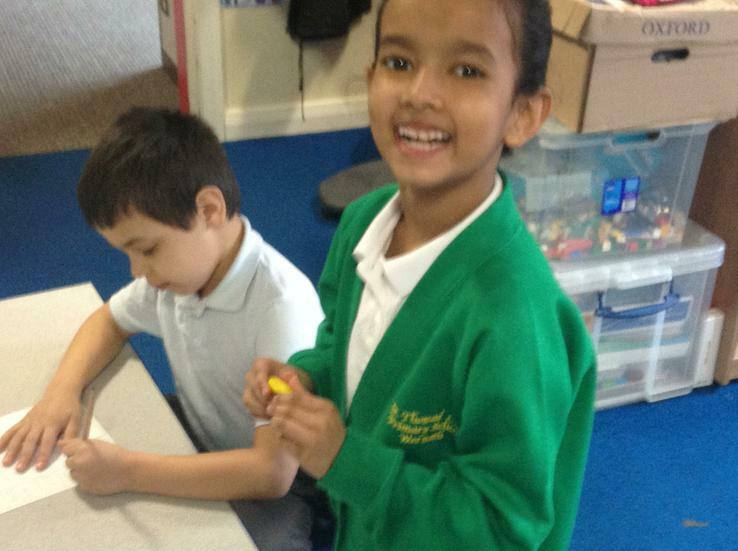 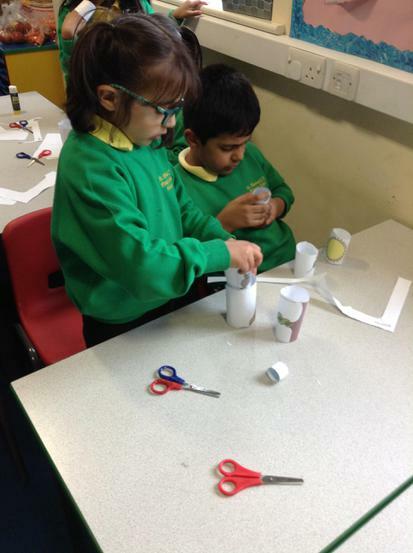 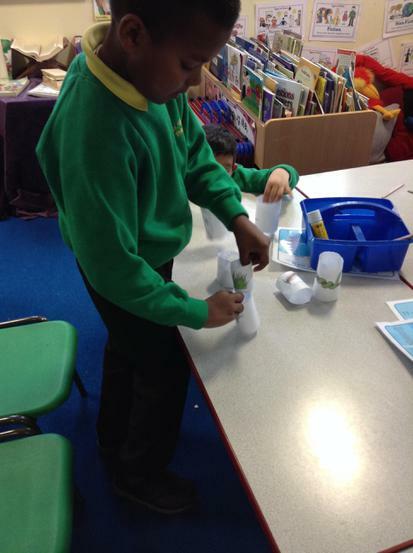 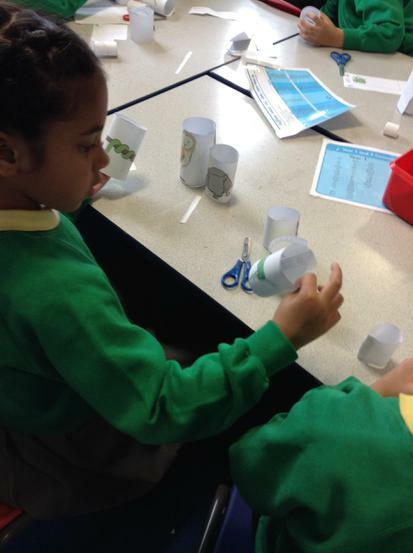 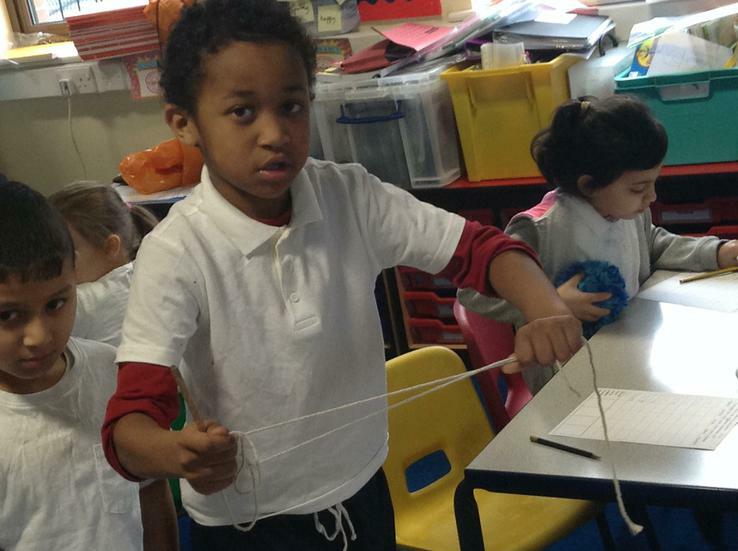 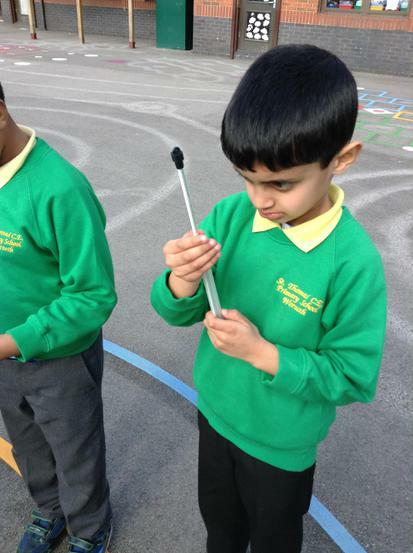 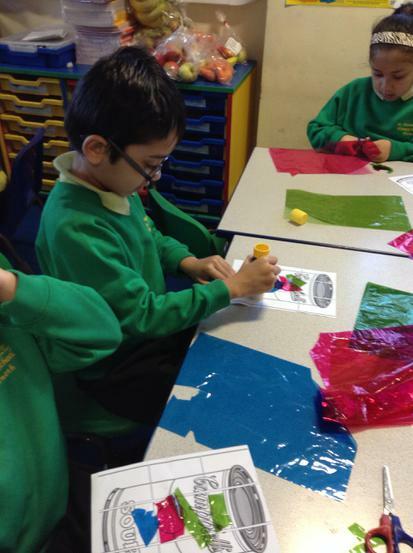 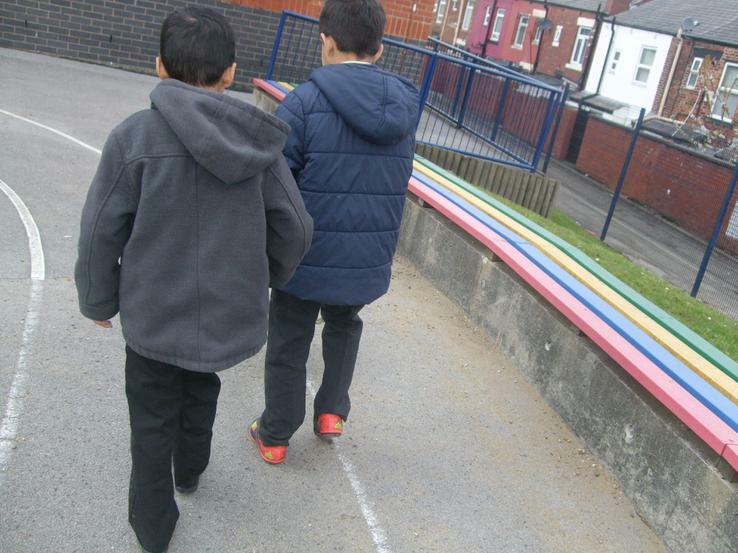 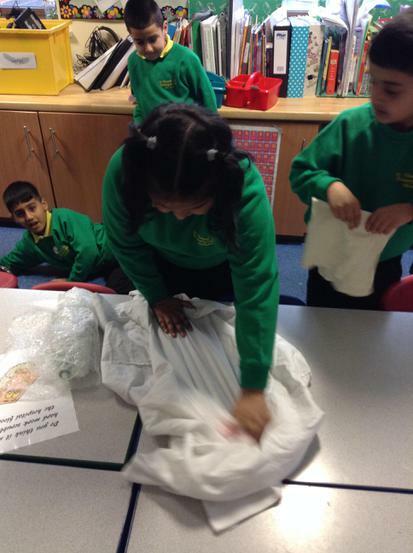 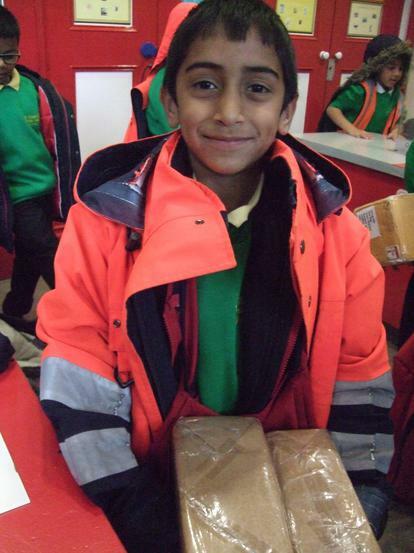 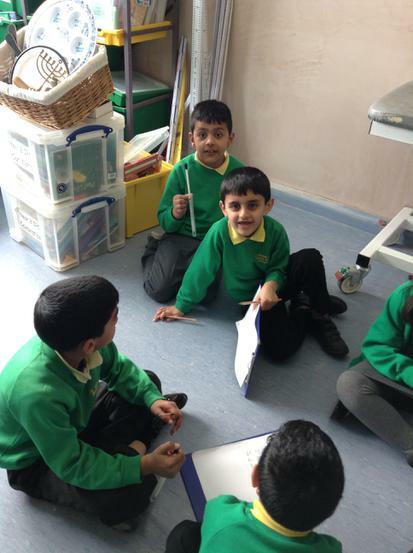 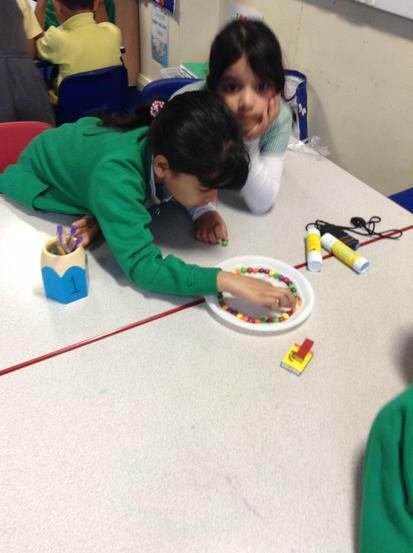 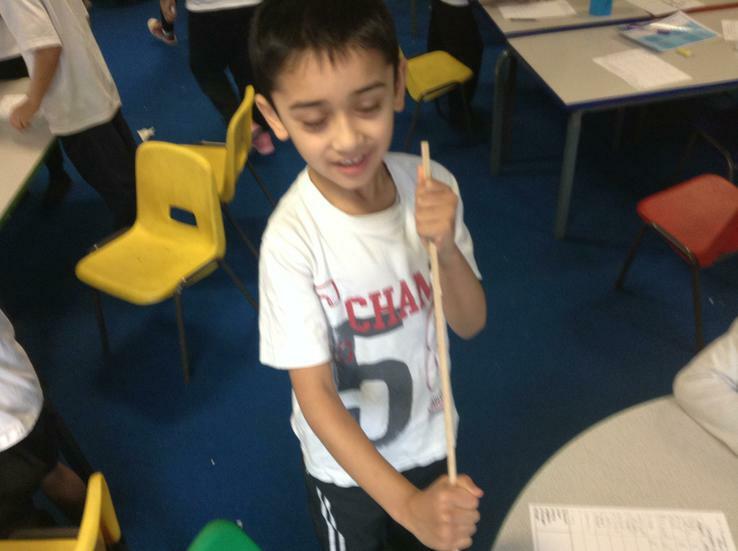 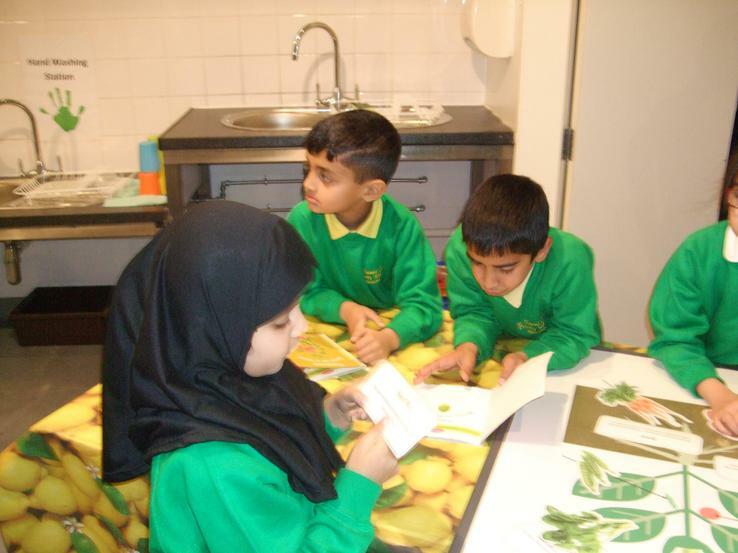 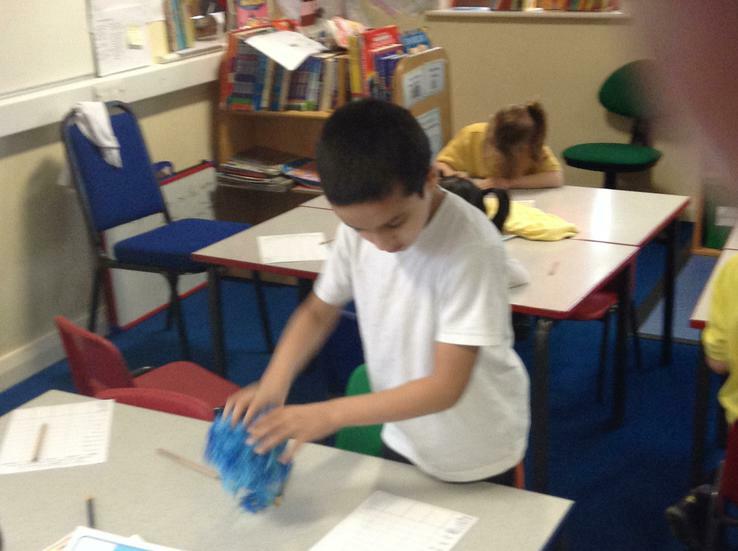 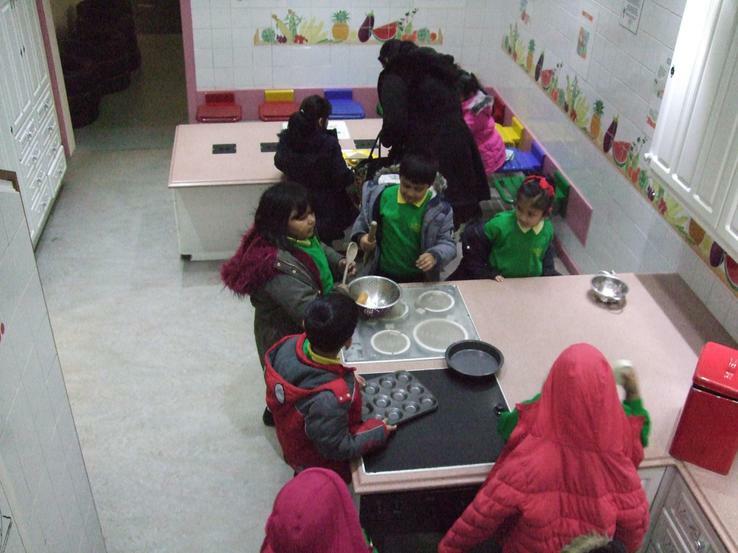 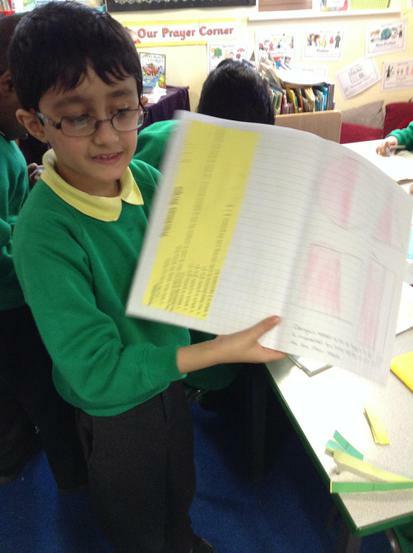 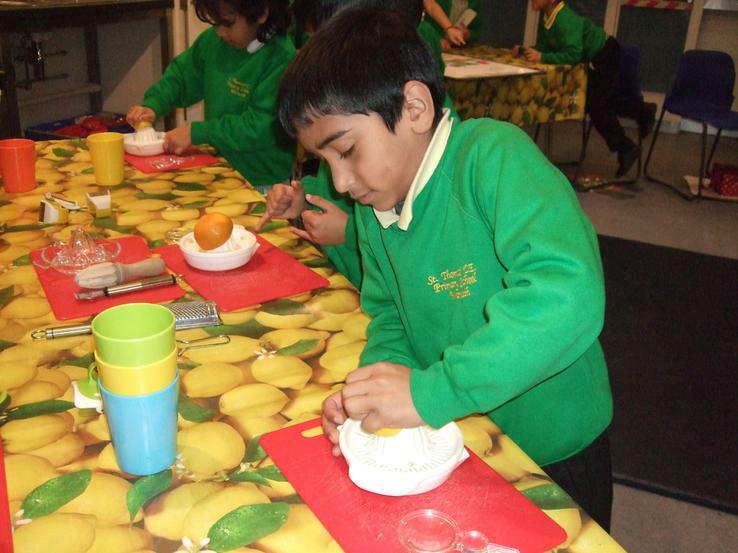 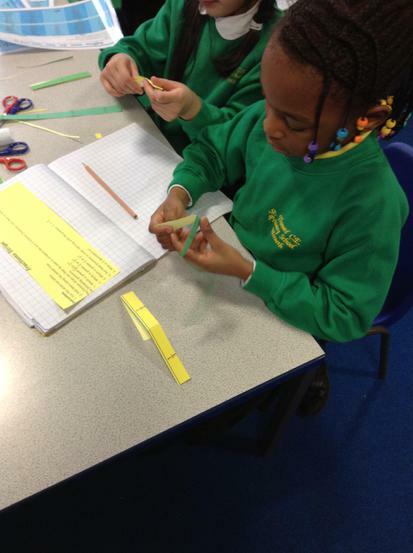 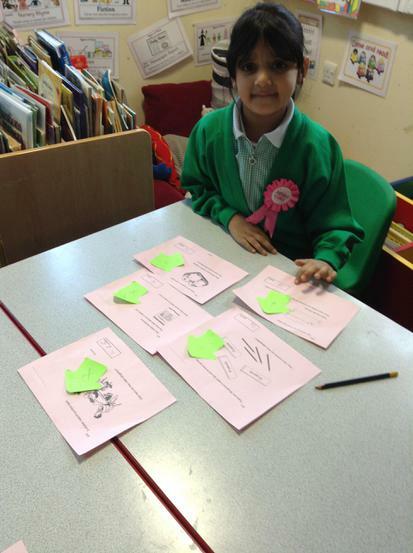 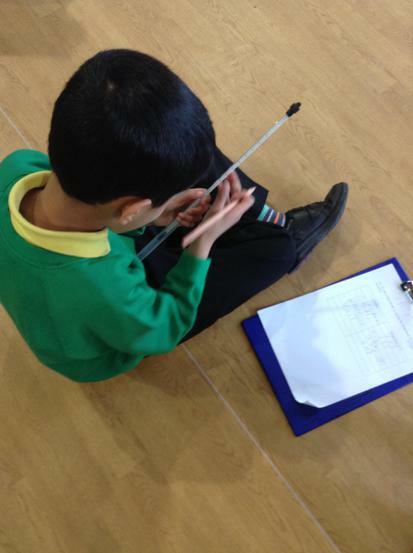 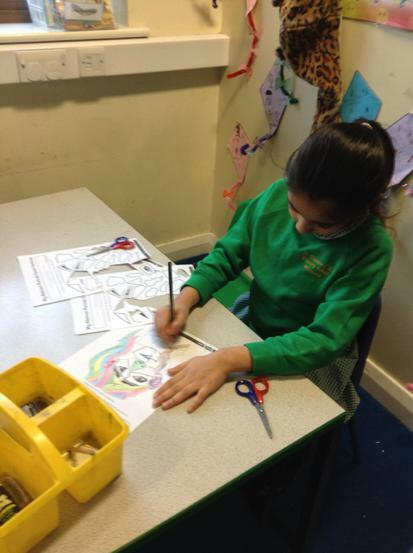 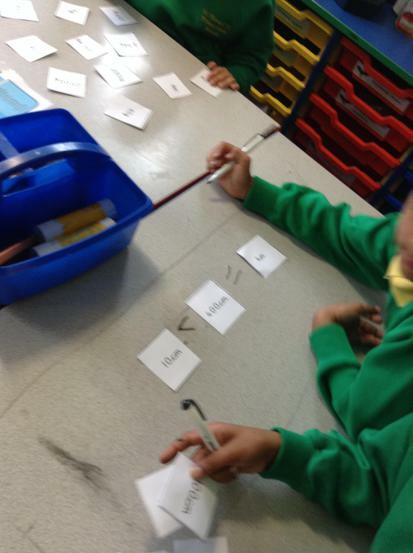 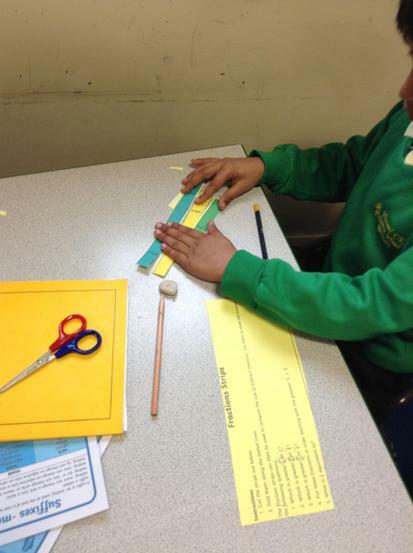 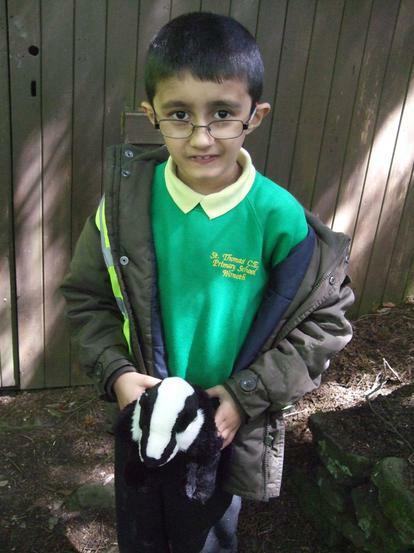 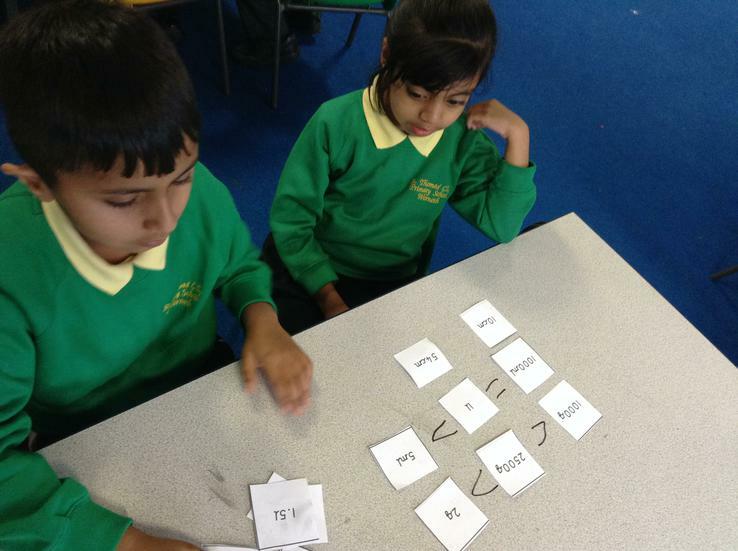 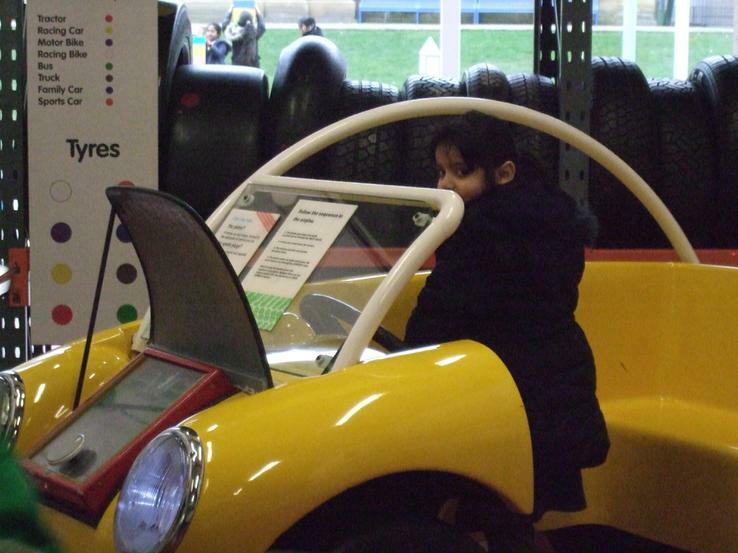 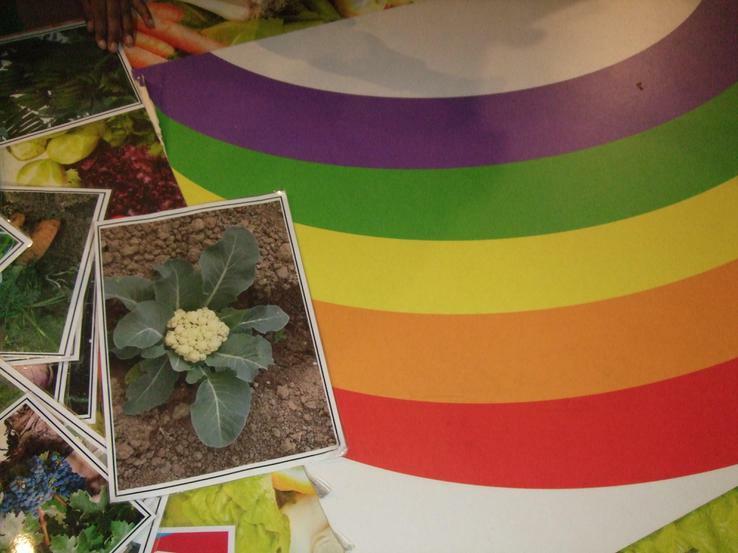 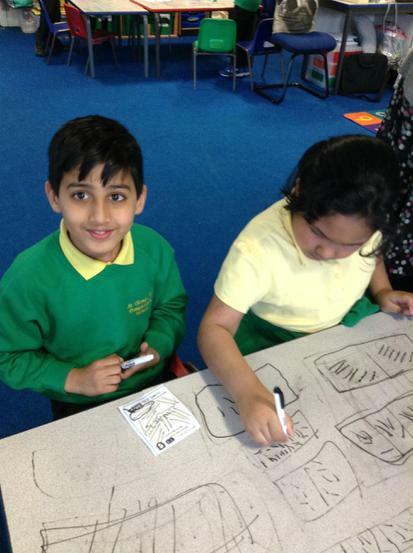 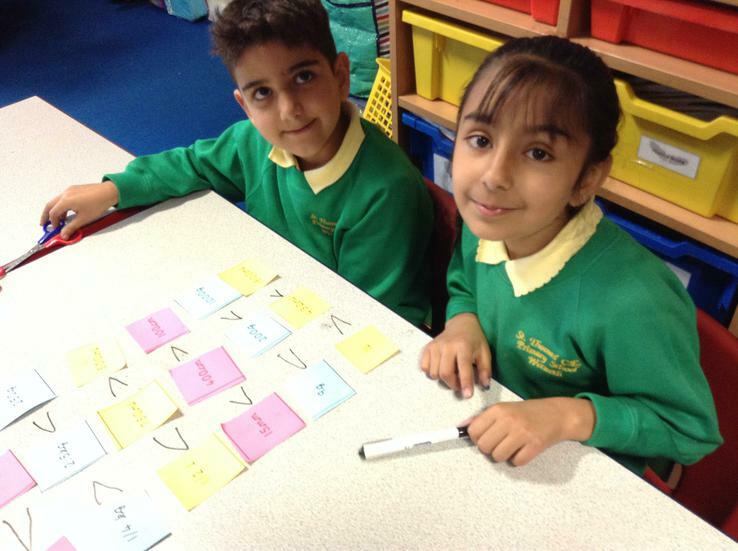 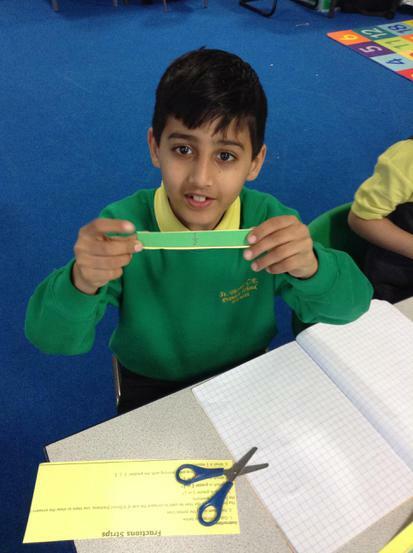 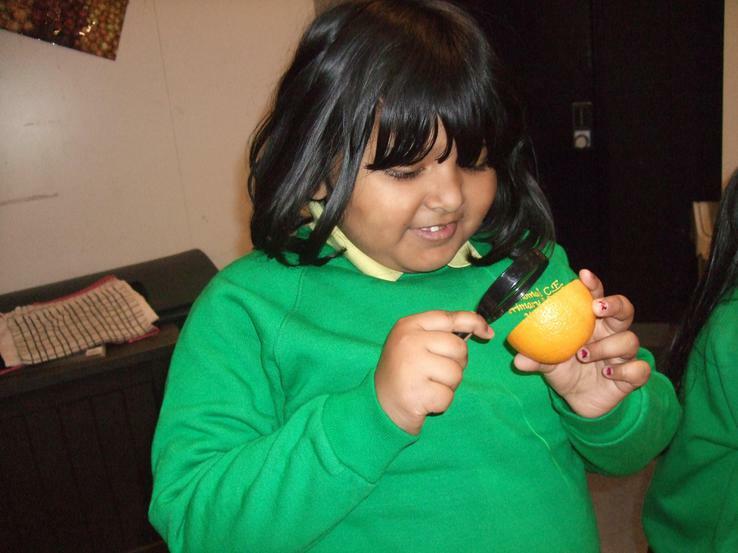 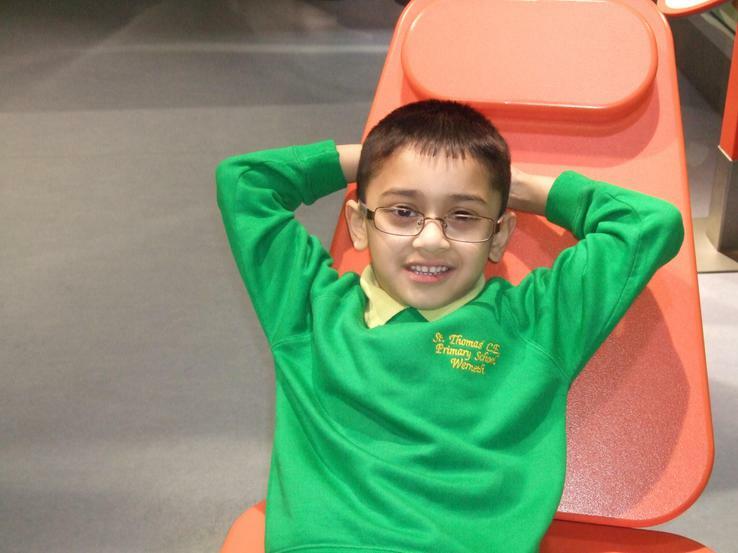 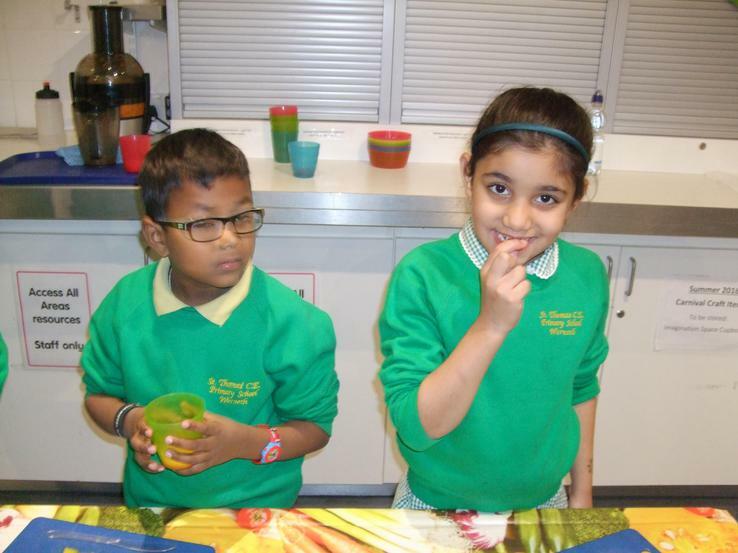 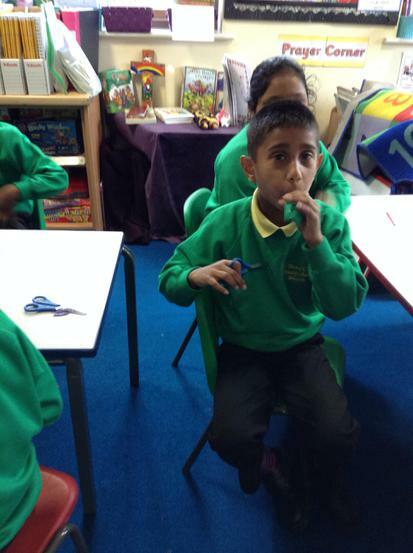 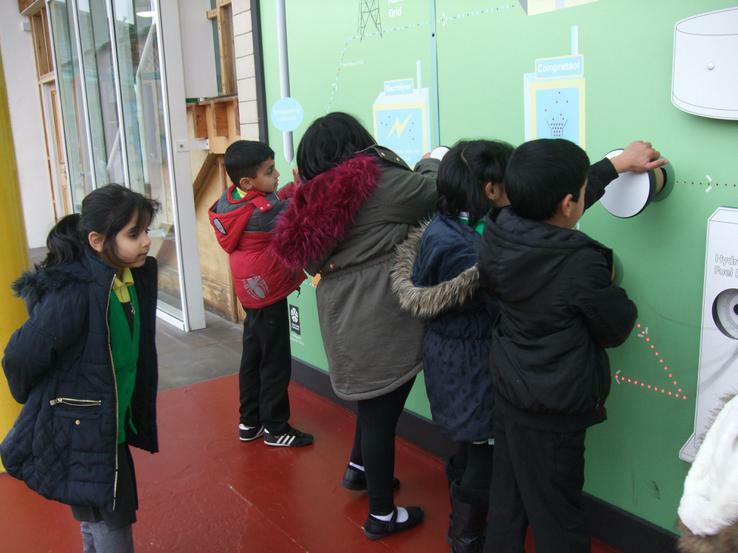 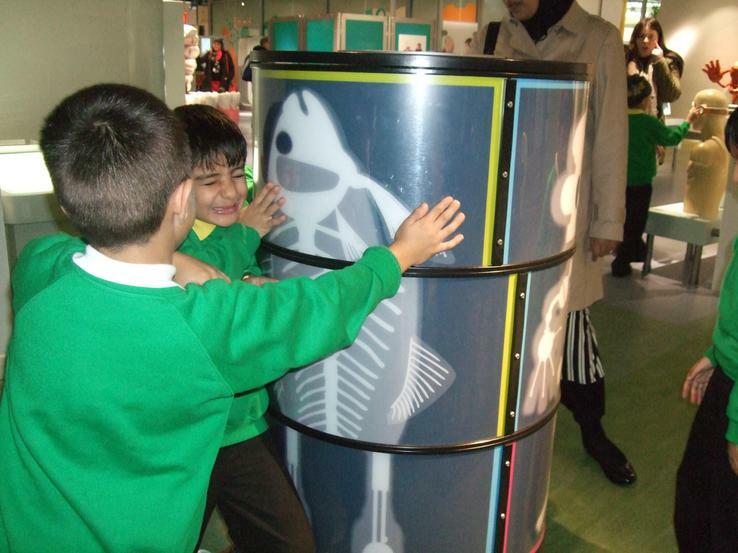 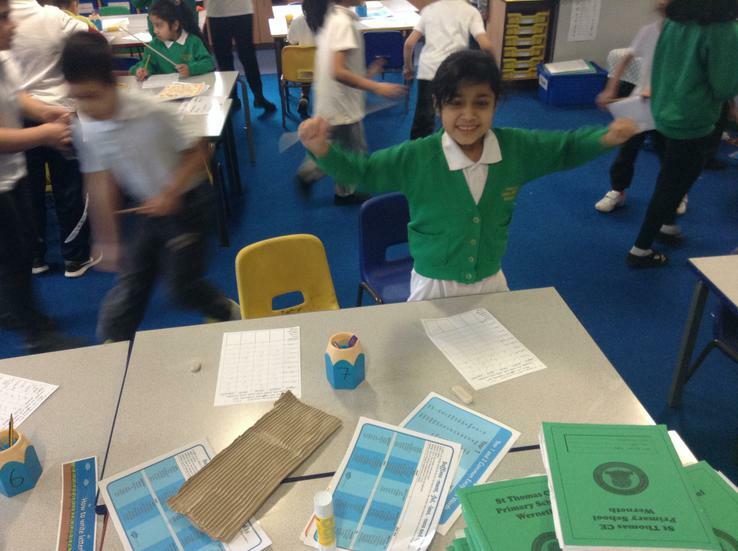 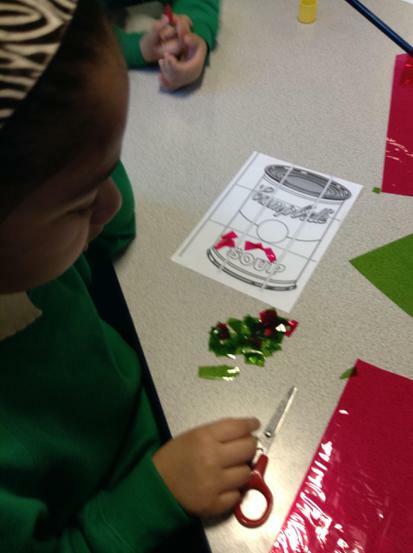 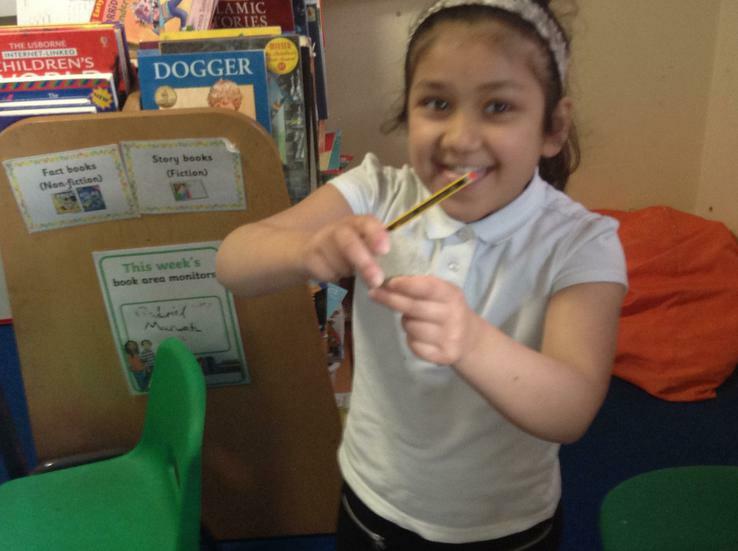 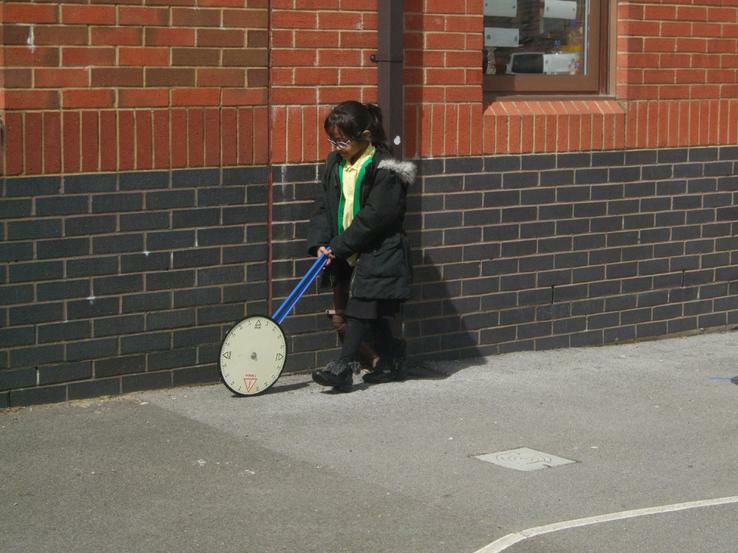 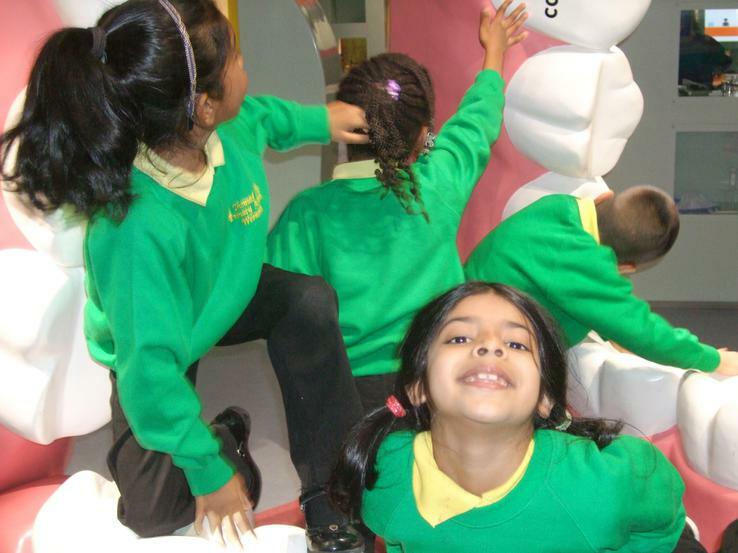 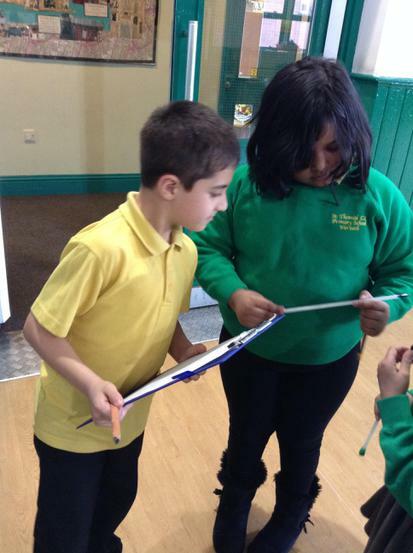 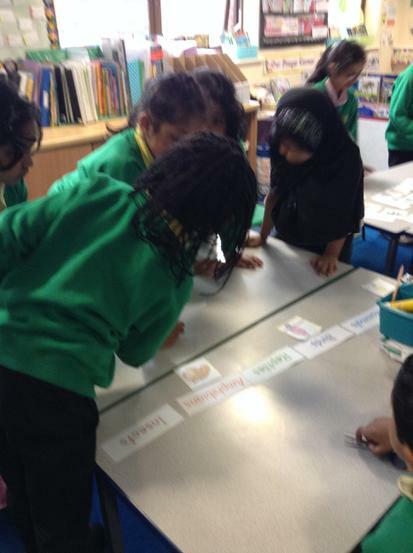 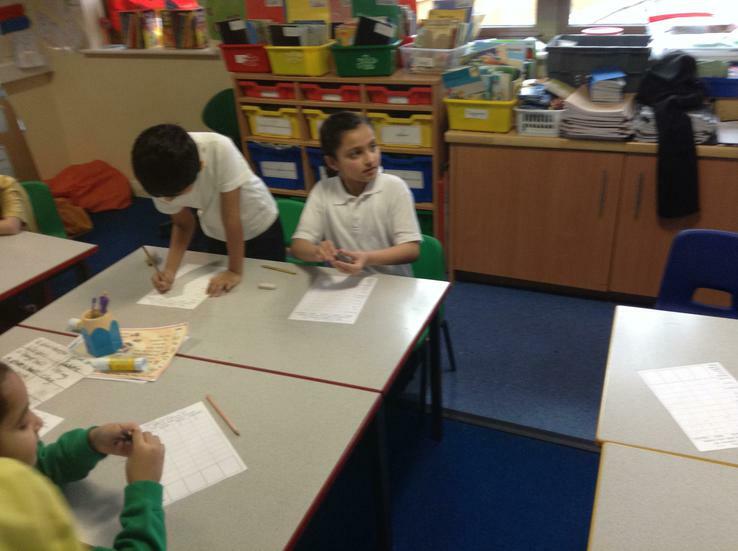 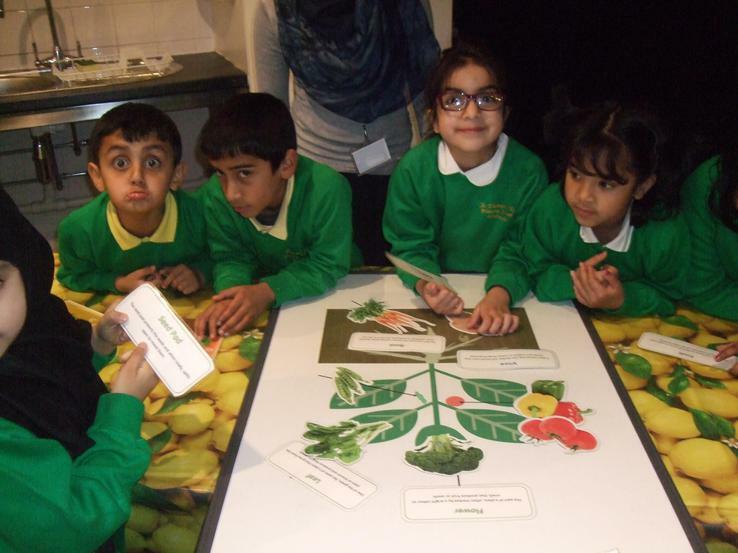 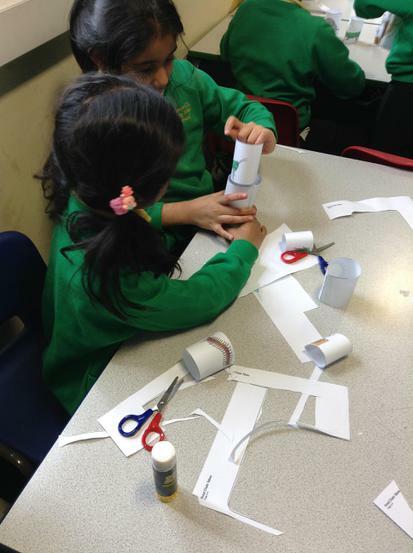 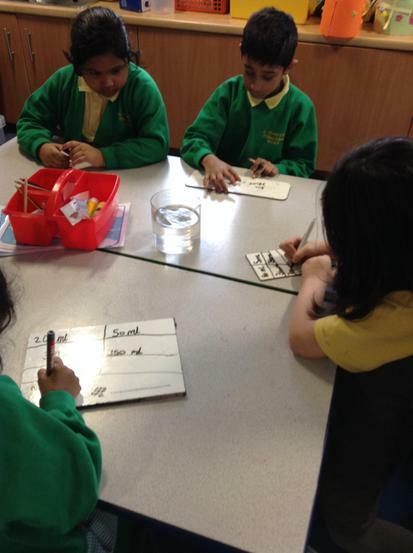 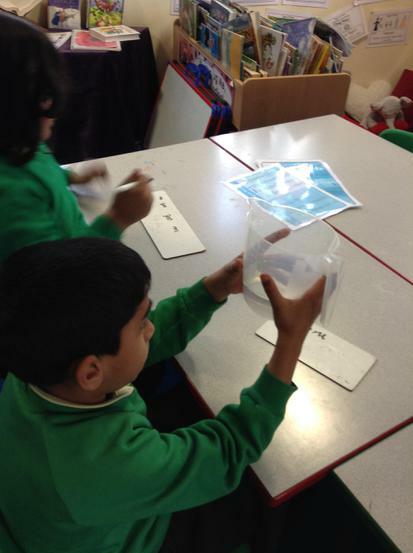 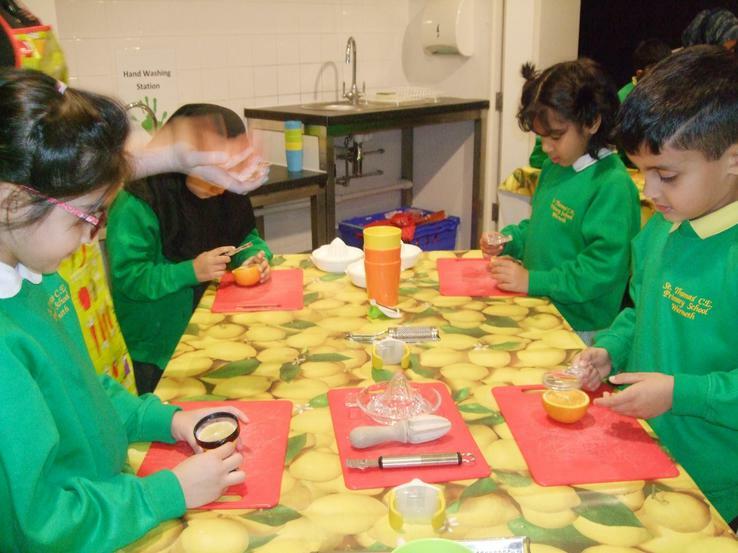 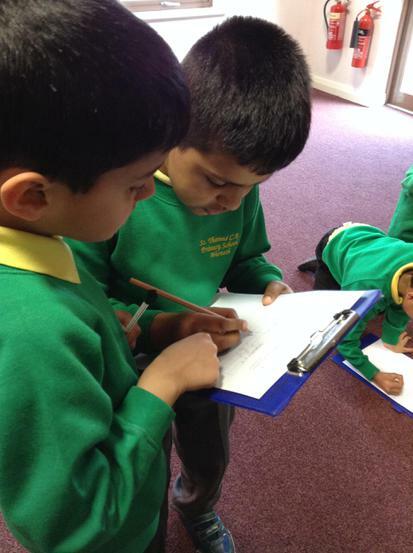 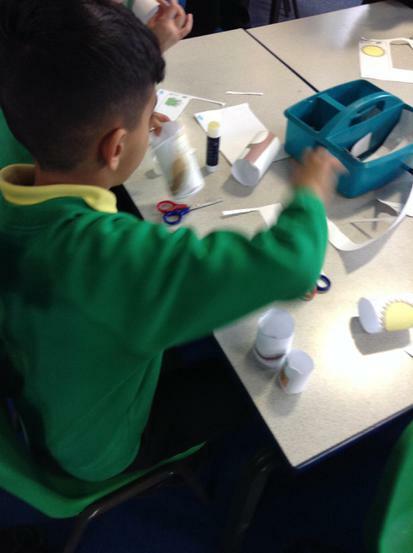 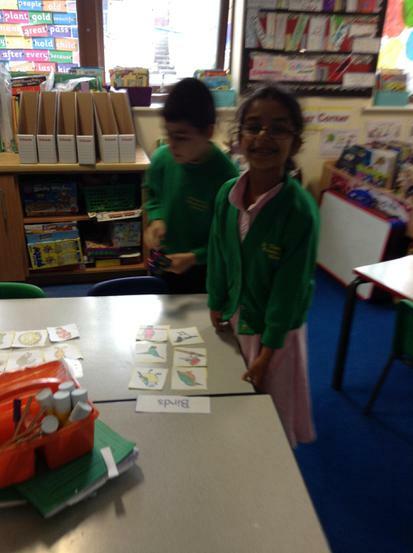 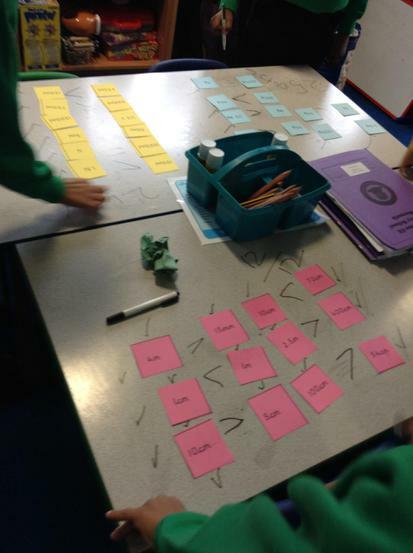 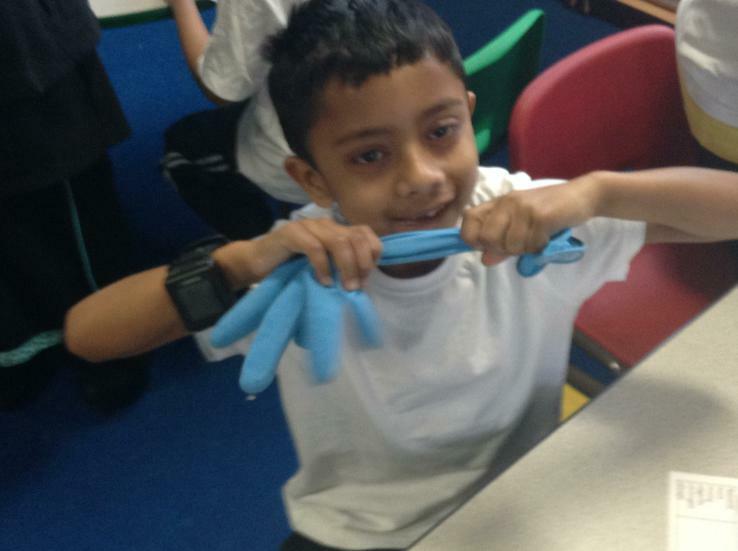 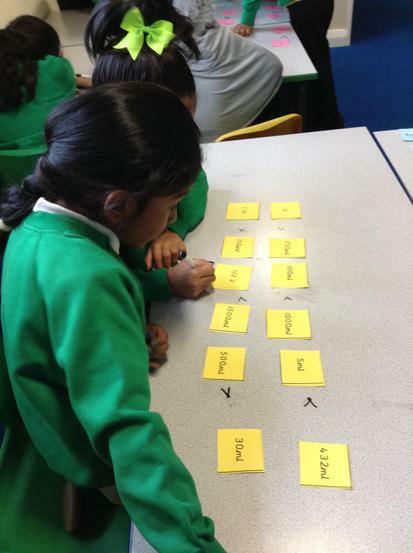 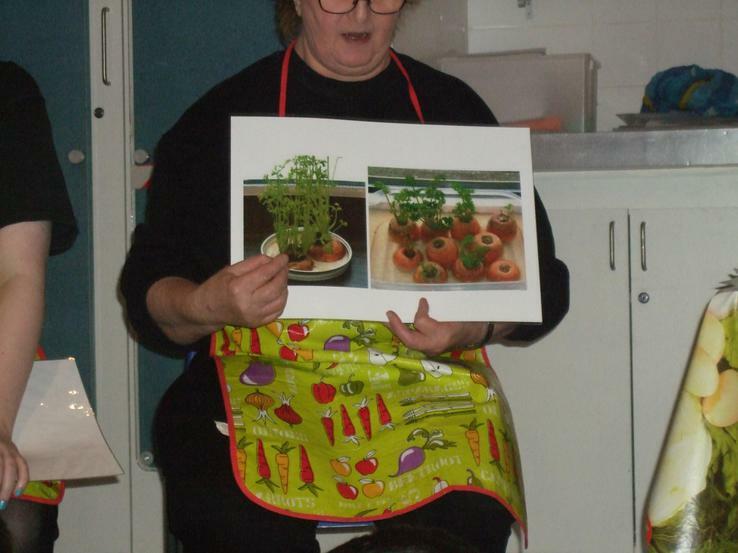 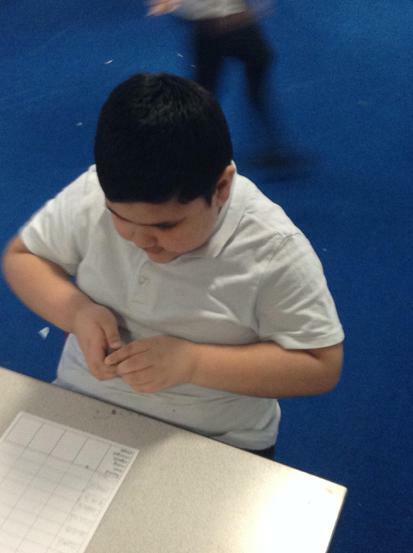 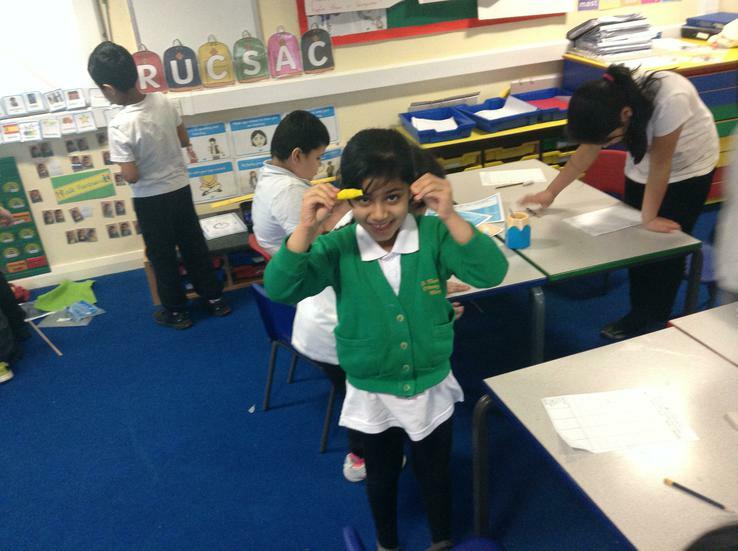 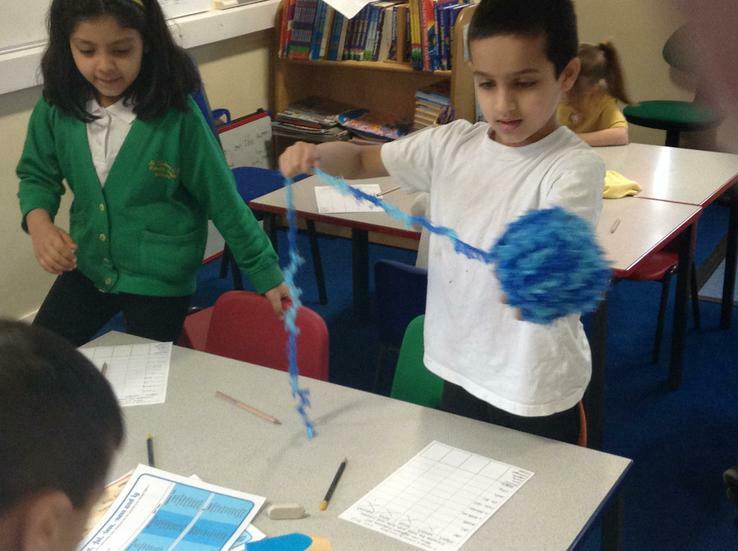 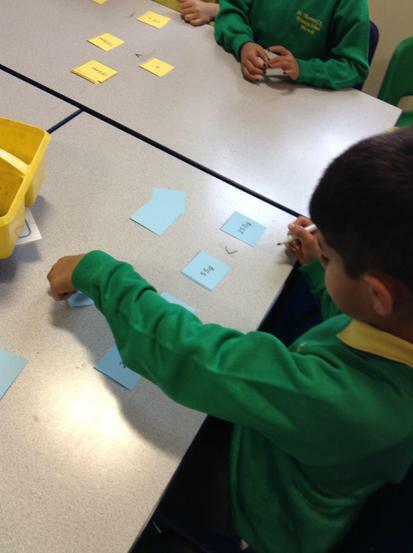 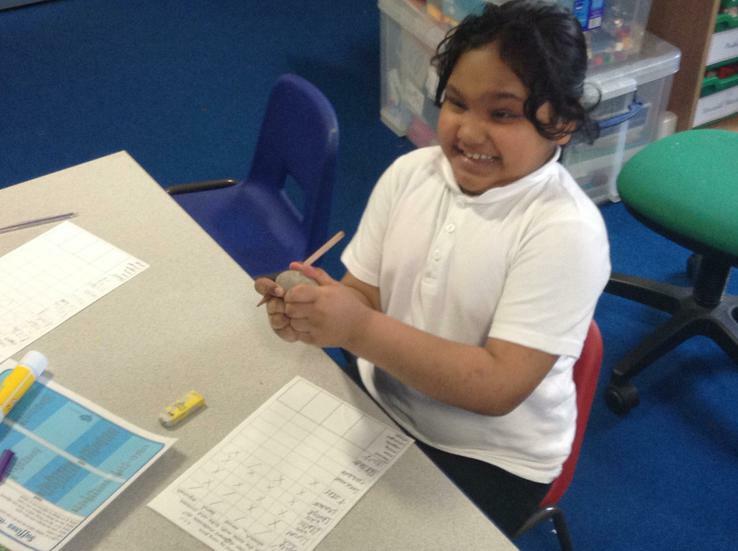 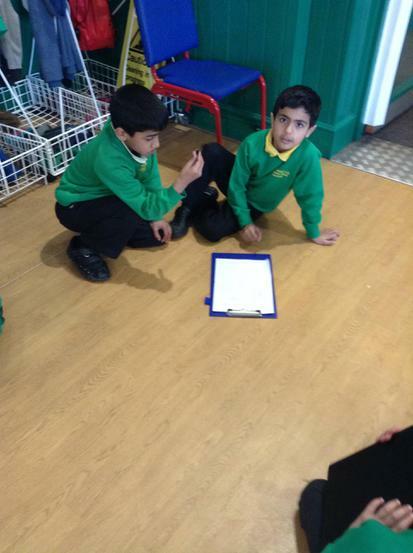 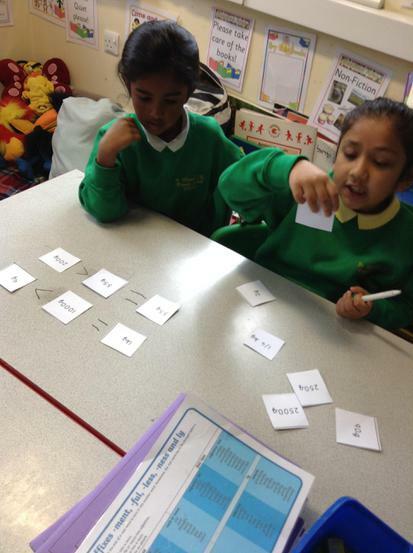 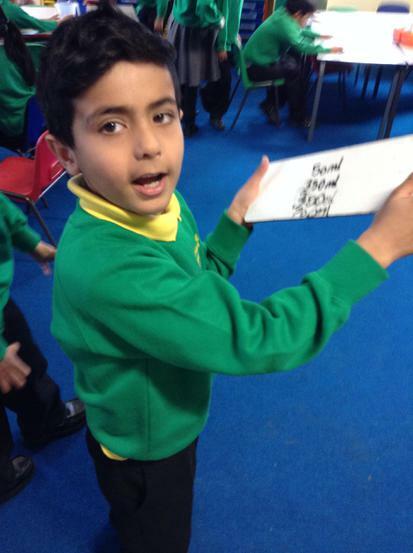 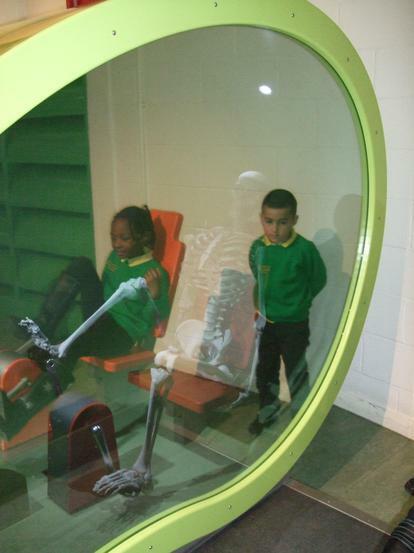 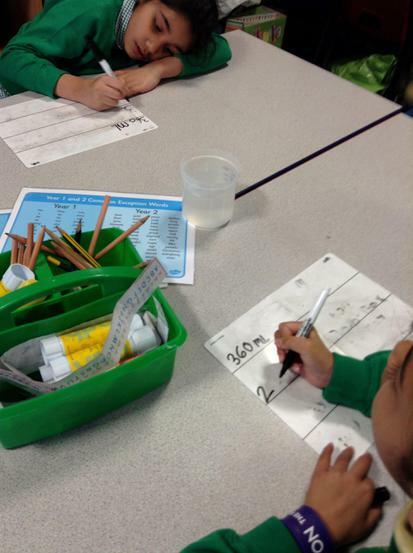 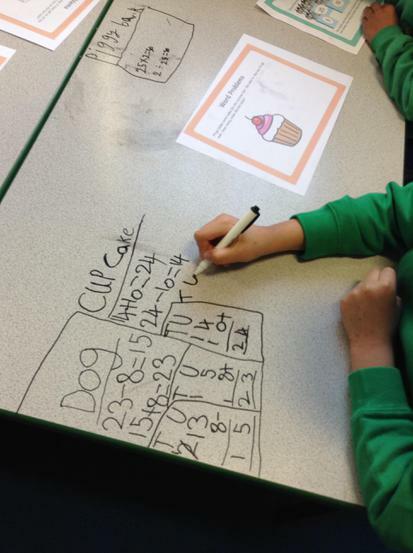 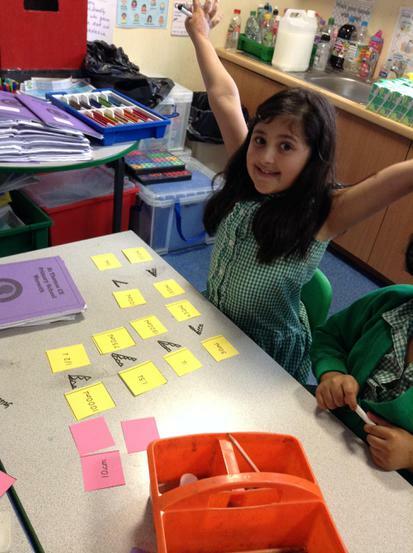 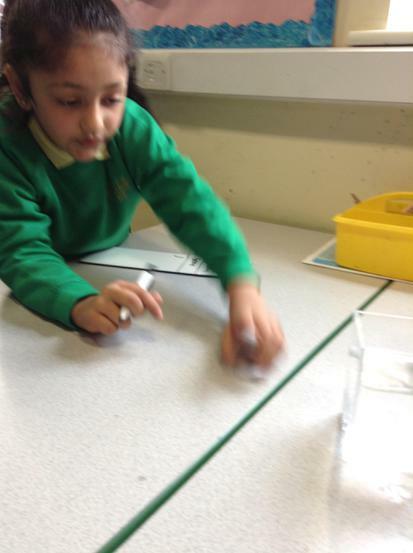 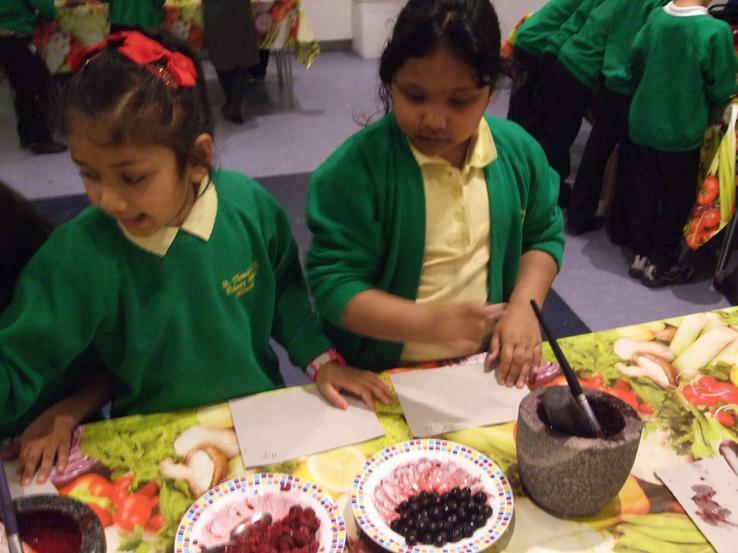 The children can choose 1 task each week in any order across different subject areas. 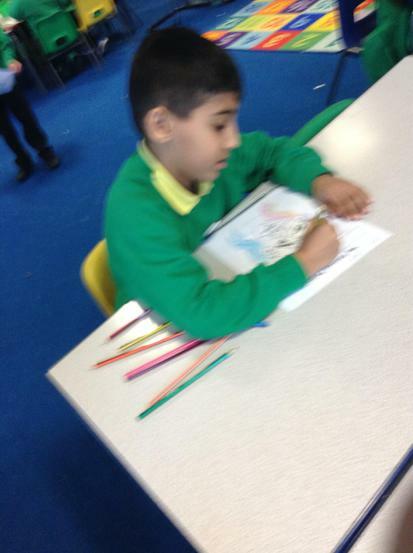 The children can also bring in their book throughout the half term to show their friends. 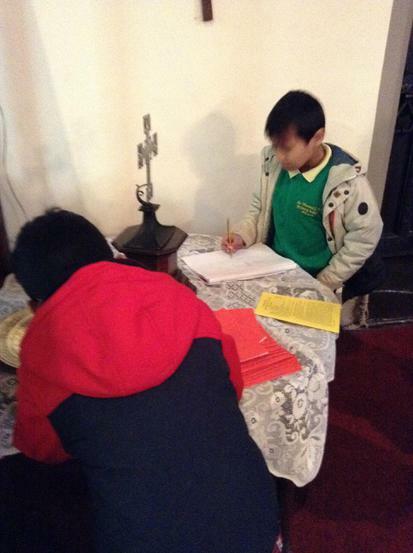 Certificates and prizes will be given to children who have completed all of their homework to a good standard. 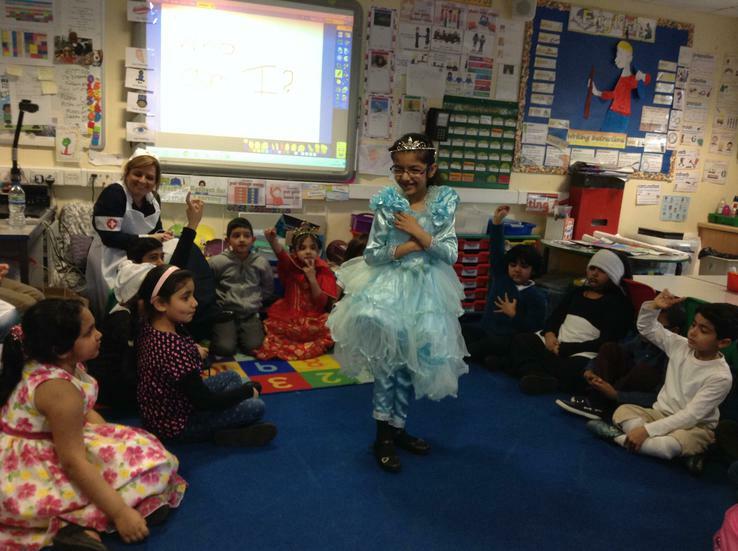 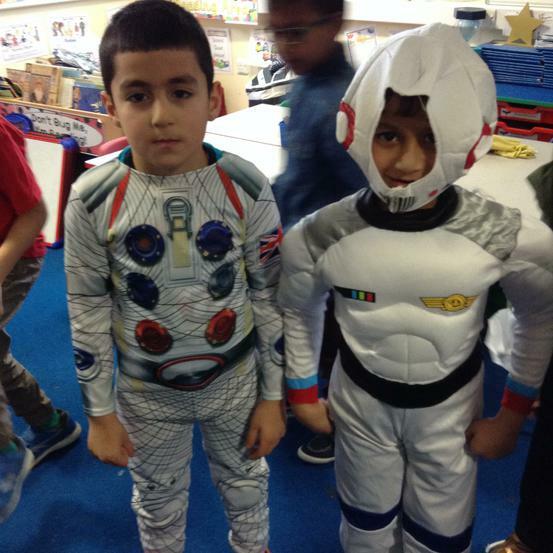 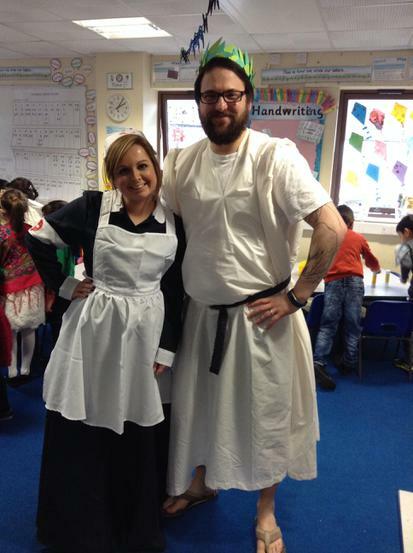 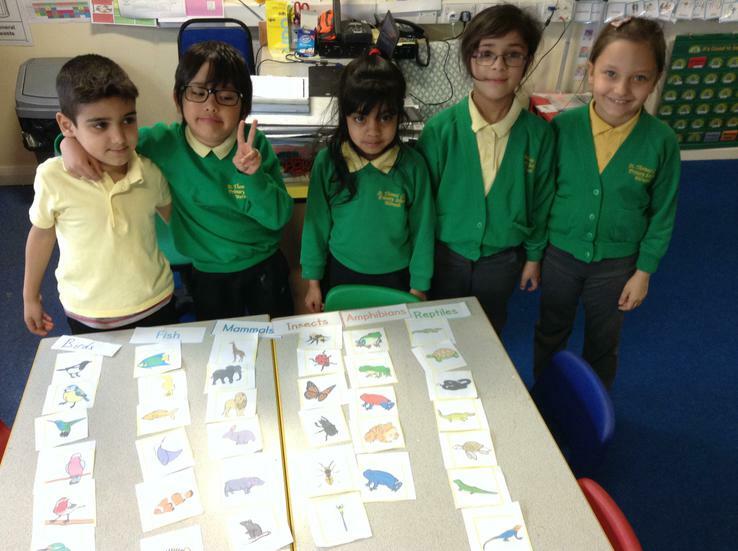 Find out what Year 2 are learning about this year!! 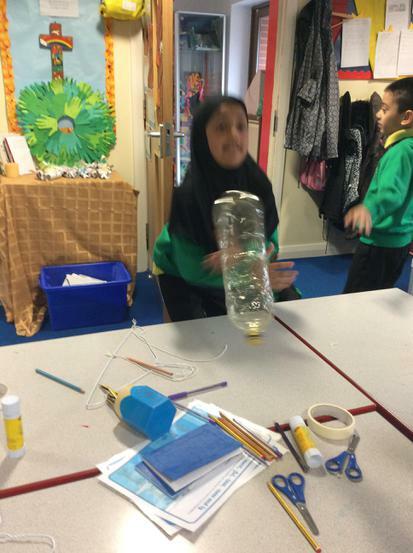 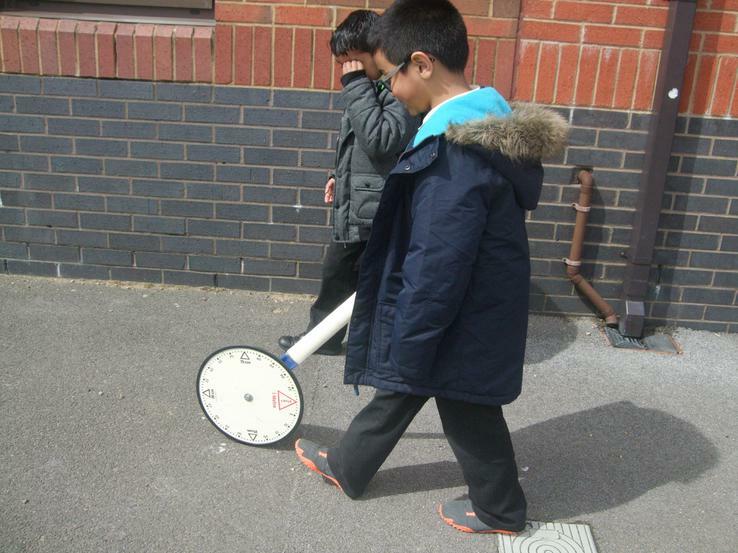 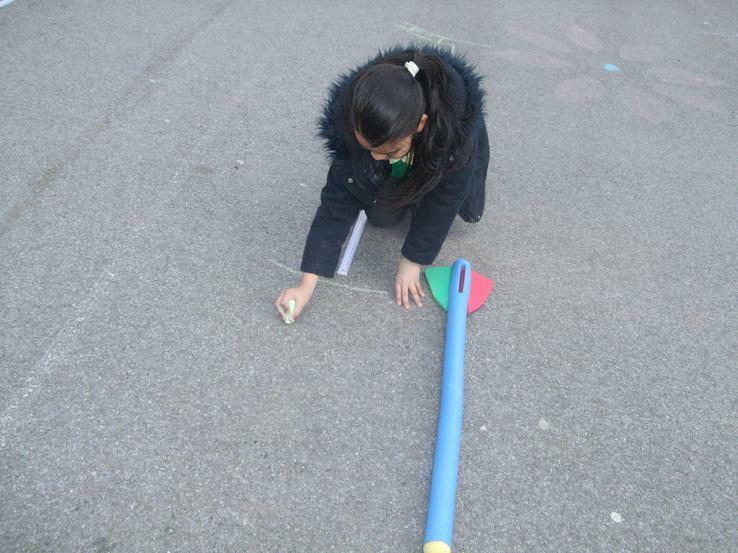 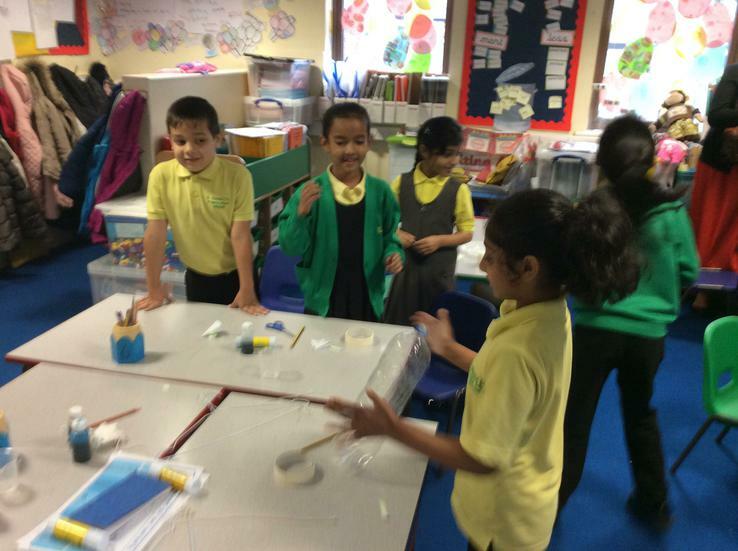 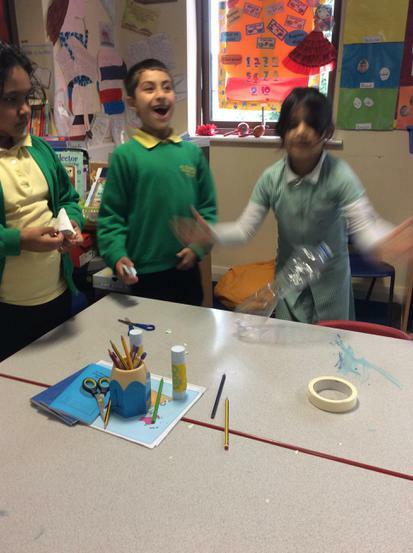 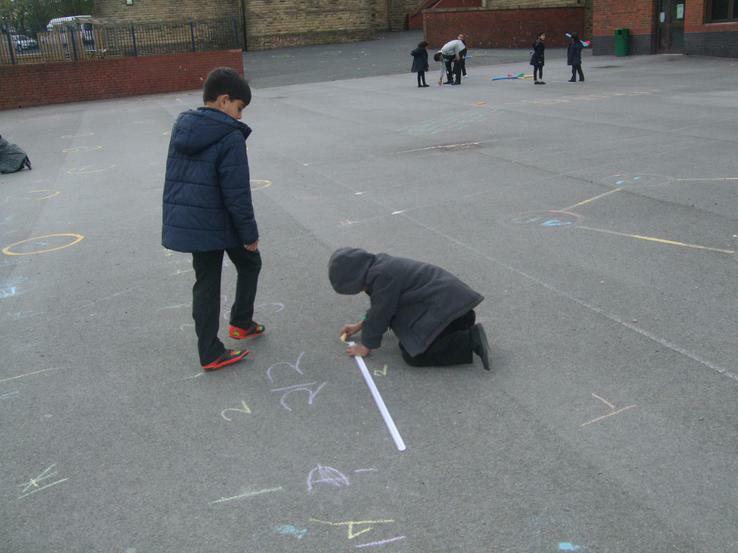 We've been challenging ourselves to design and make a car that will travel the furthest whilst staying in a straight line. 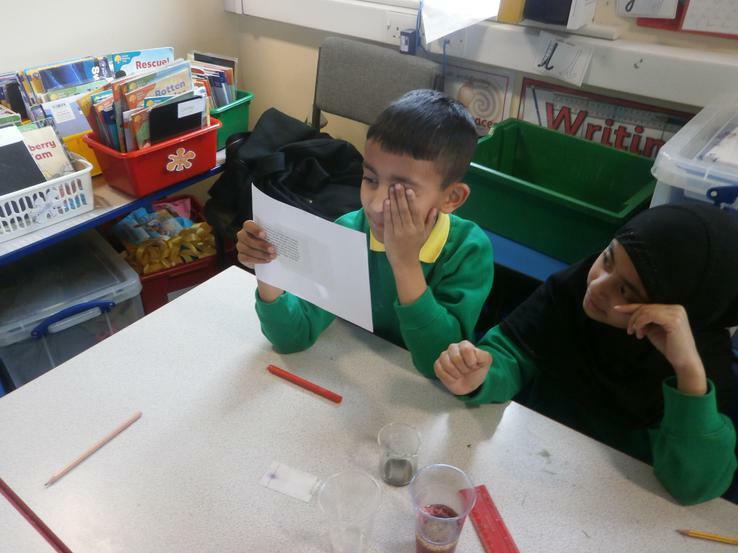 We had a wonderful time predicting the outcome to science investigations and then conducting investigations to see if we were correct! 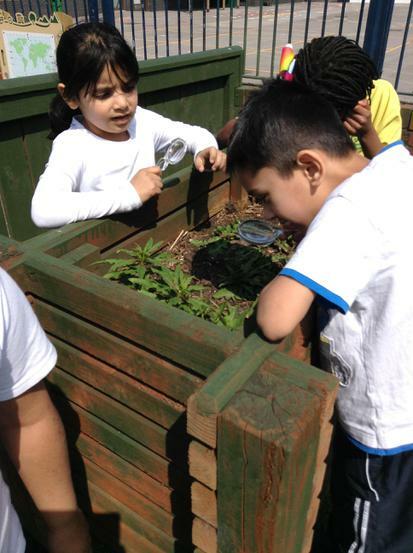 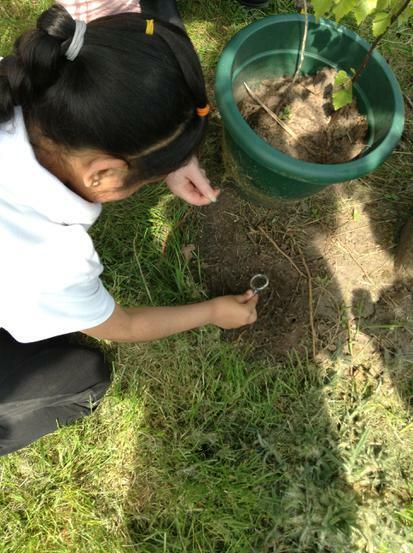 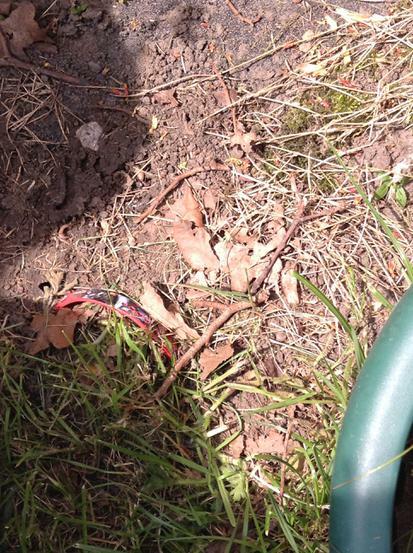 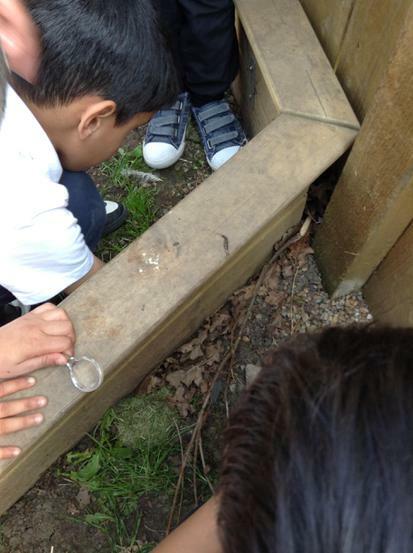 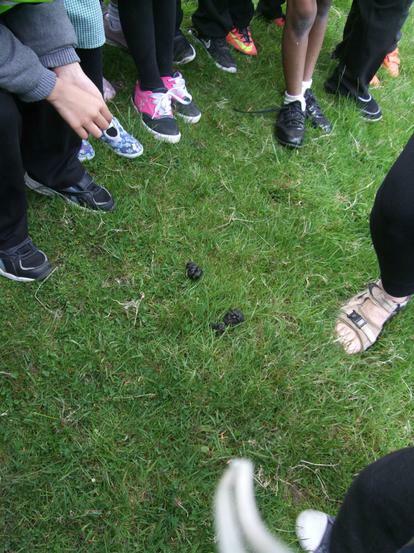 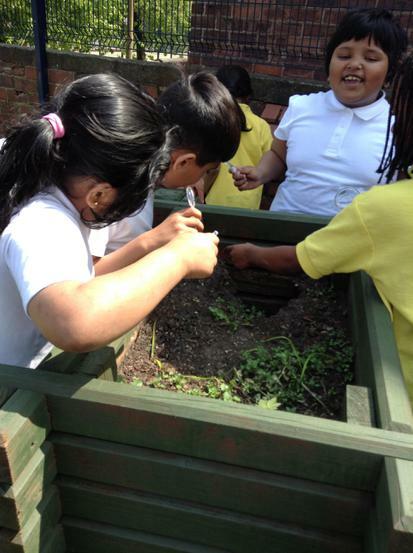 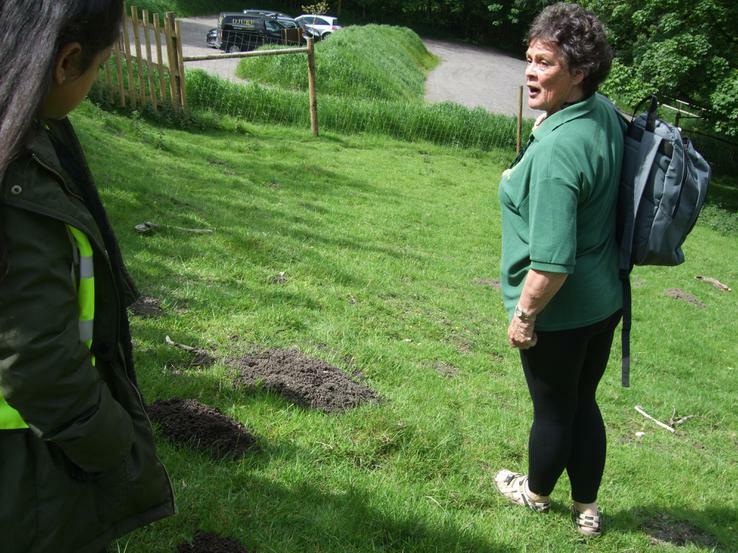 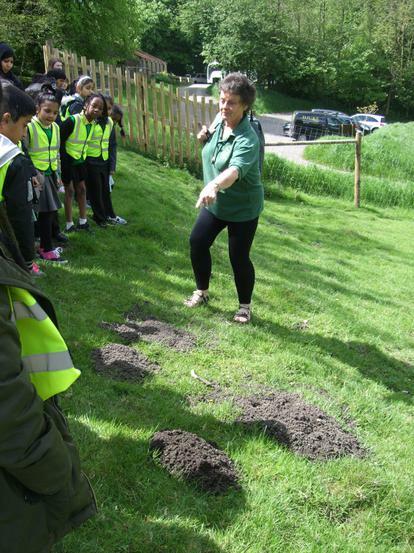 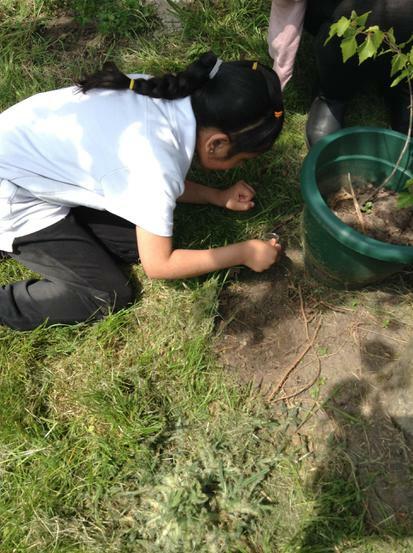 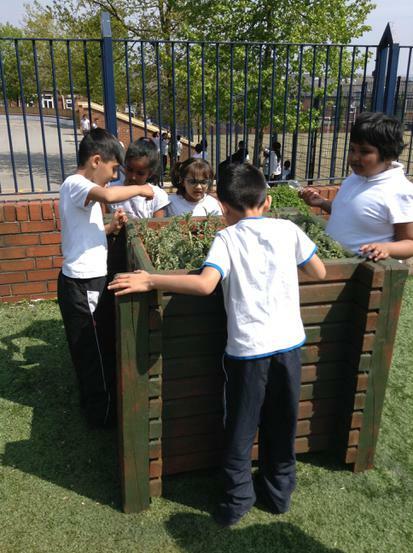 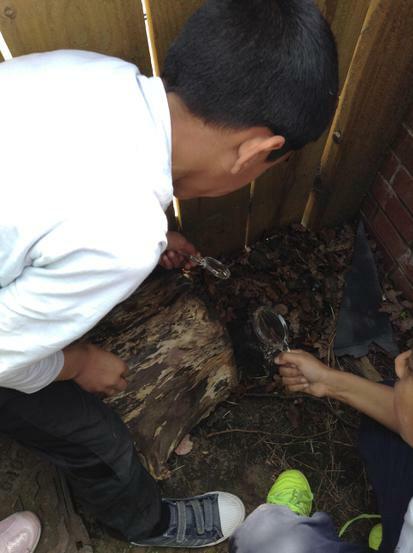 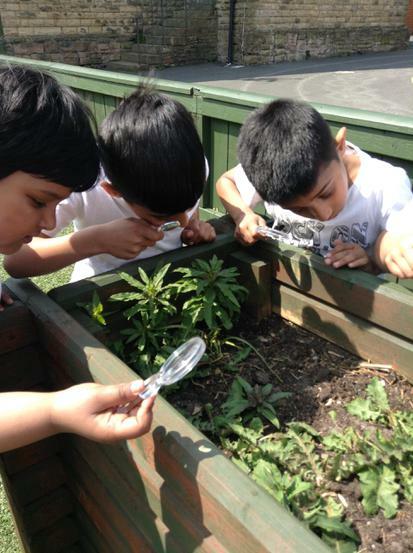 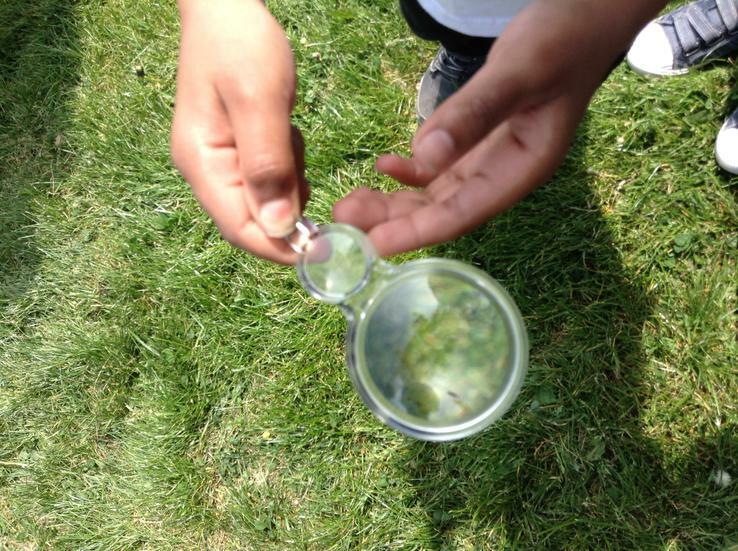 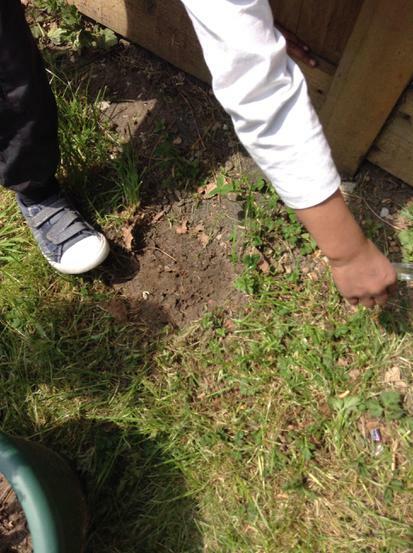 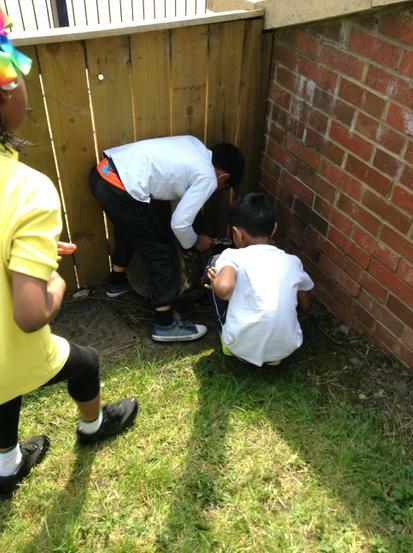 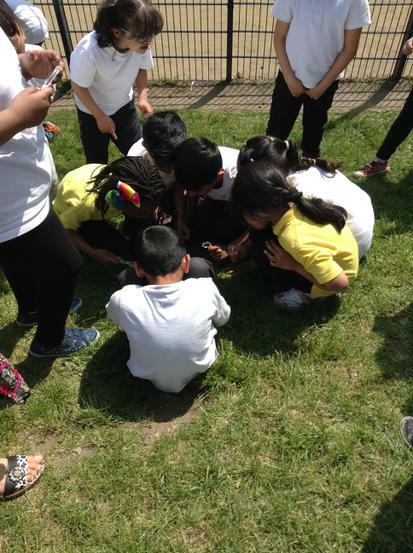 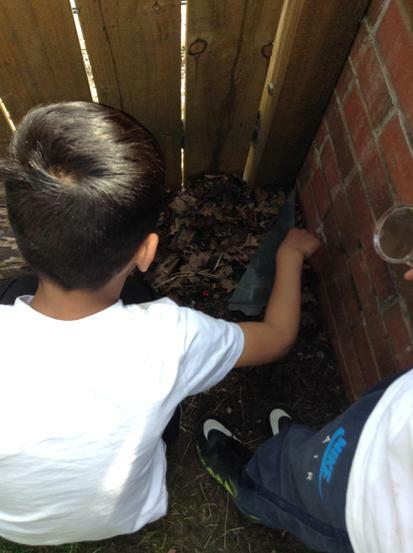 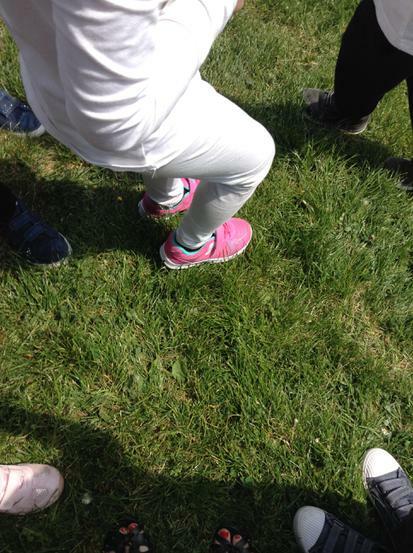 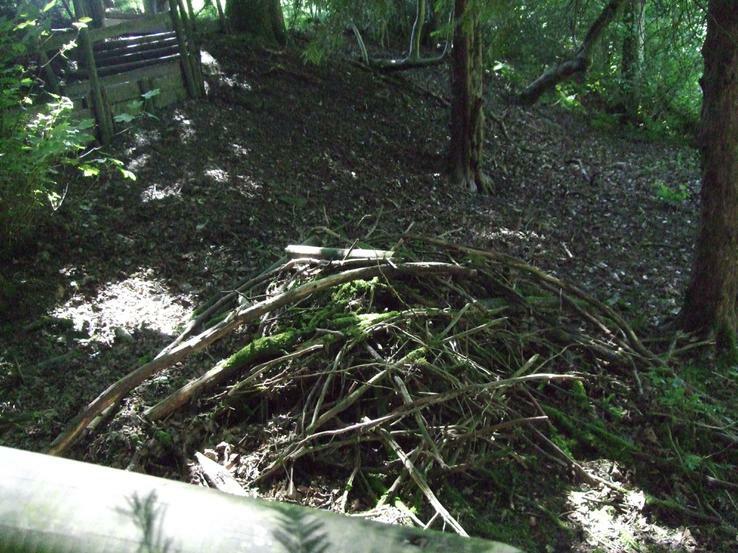 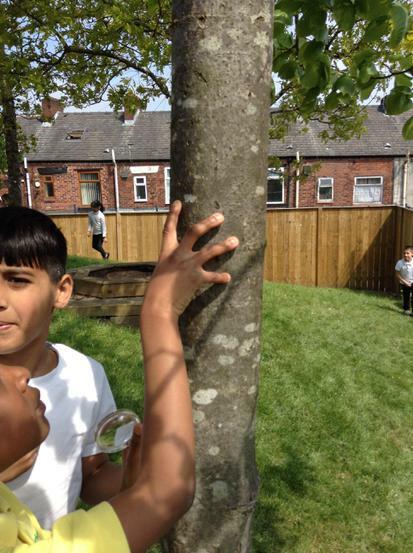 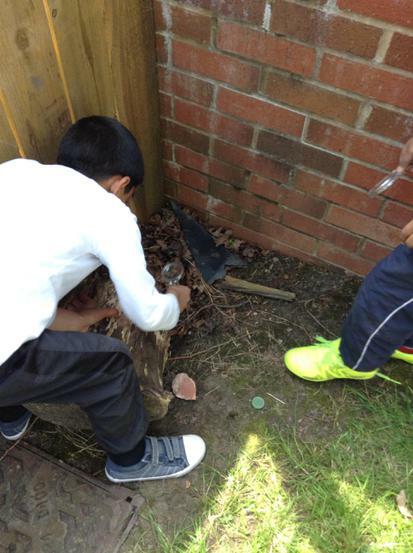 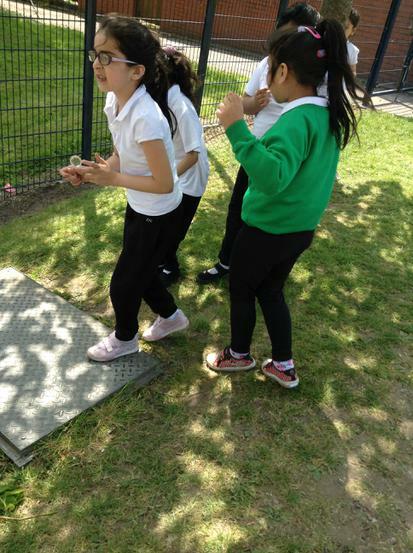 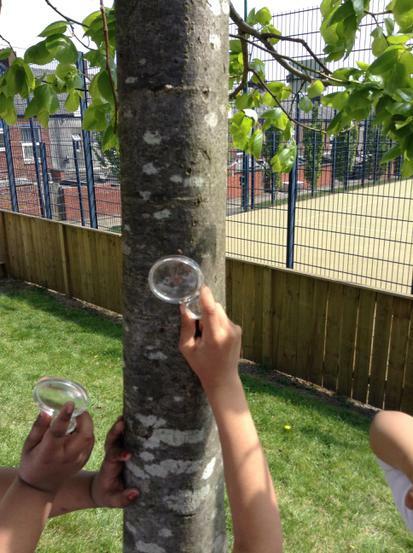 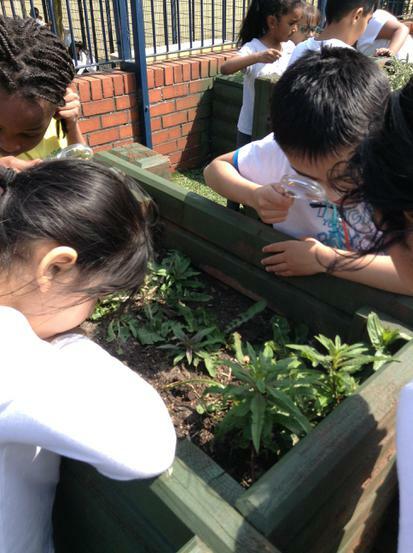 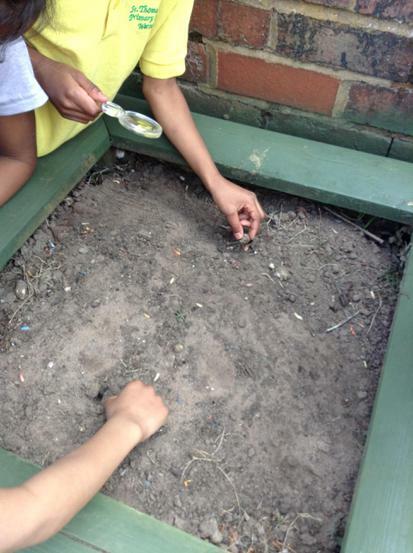 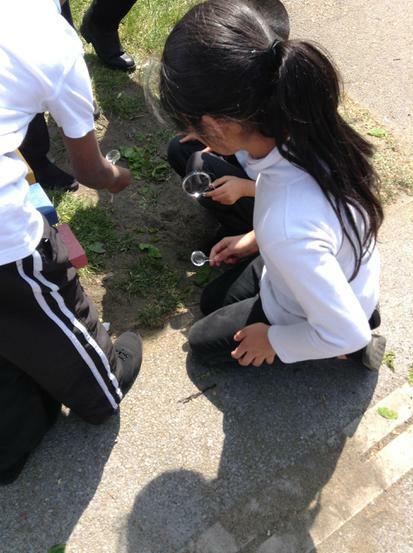 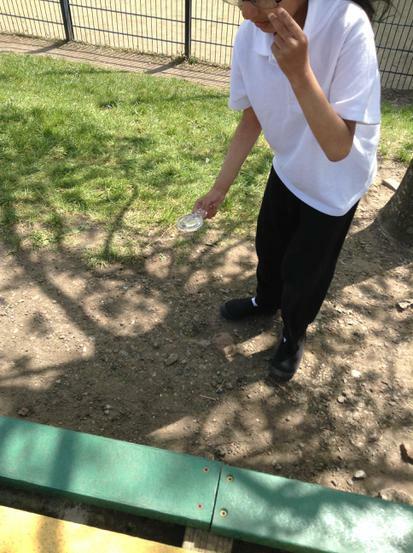 Exploring microhabitats in our school grounds! 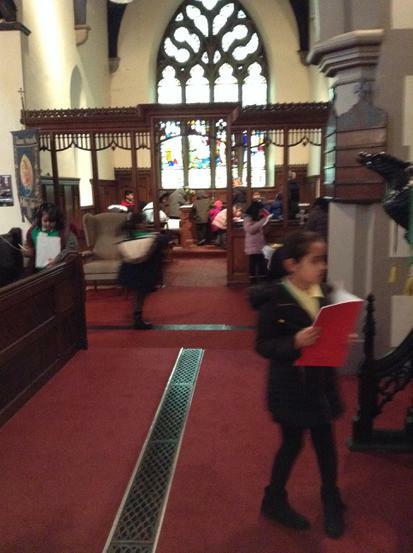 Our Christian value for this half term has been compassion. 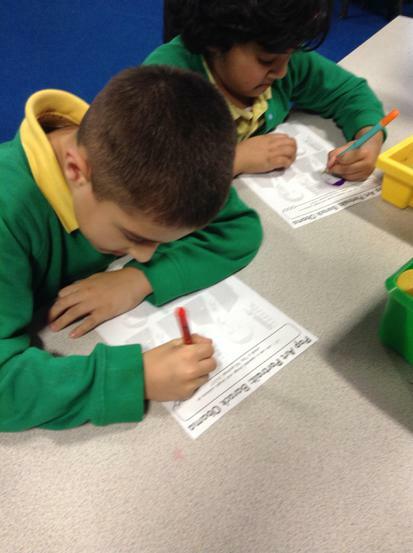 2JW made posters about what compassion means to us for our class assembly. 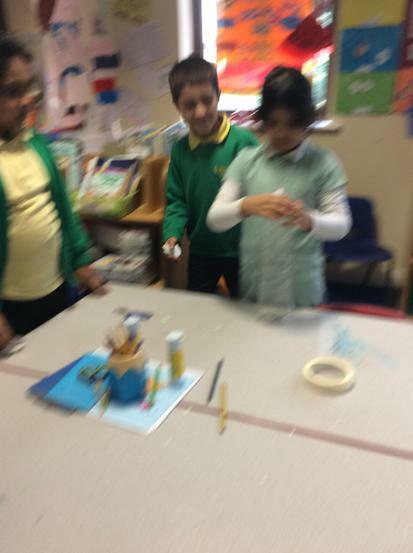 We thought of lovely ideas! 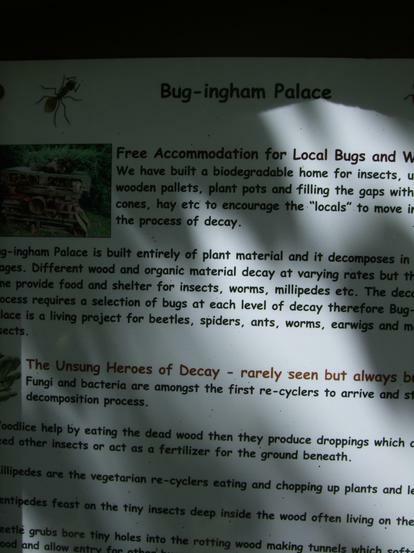 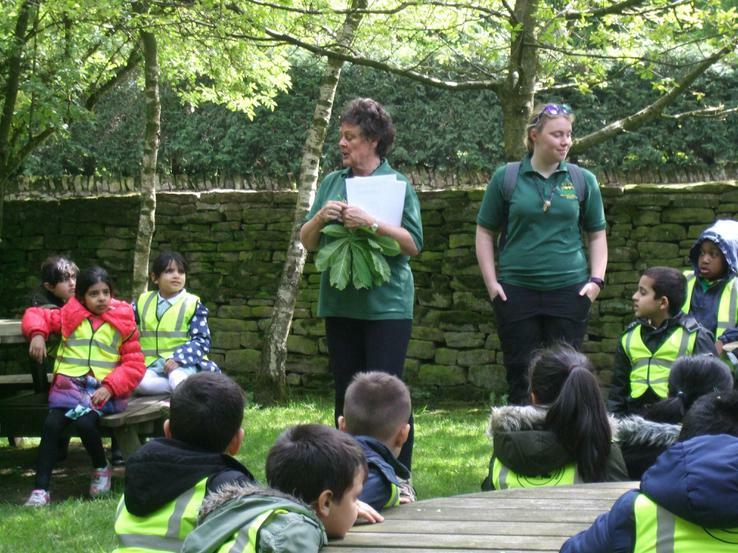 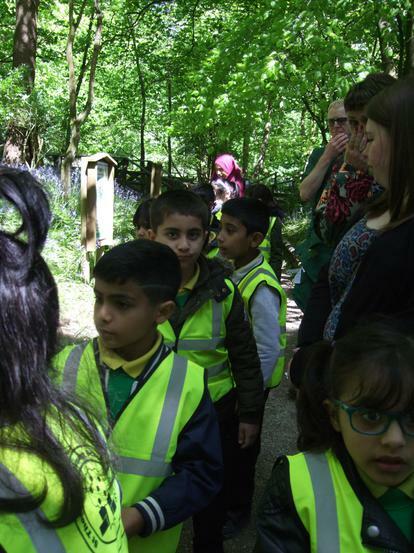 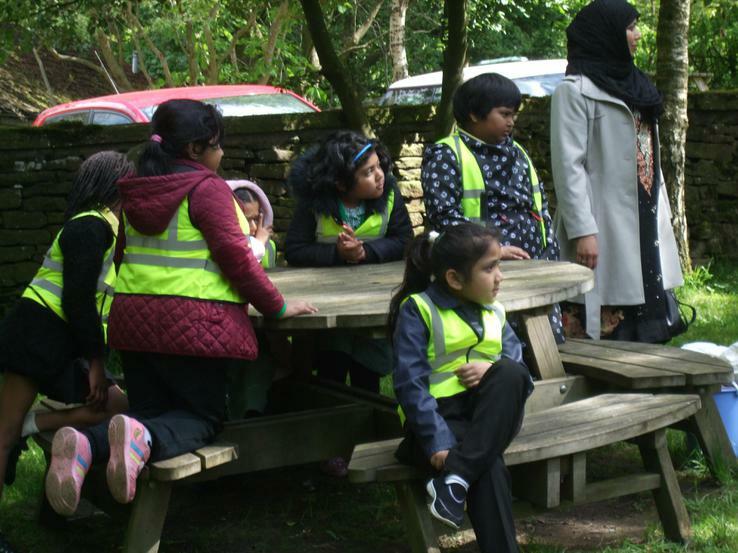 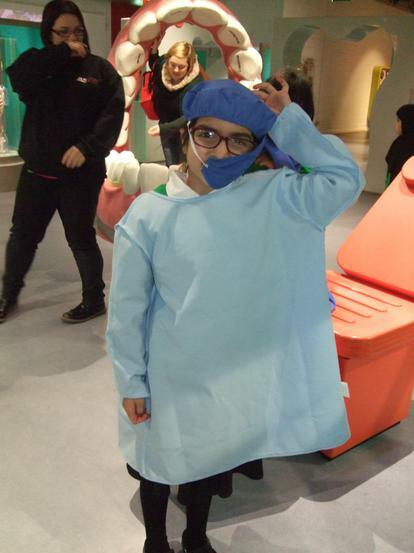 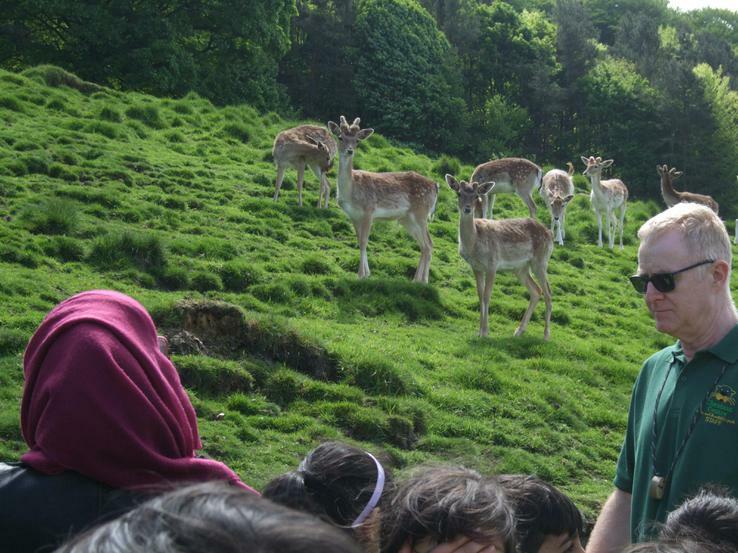 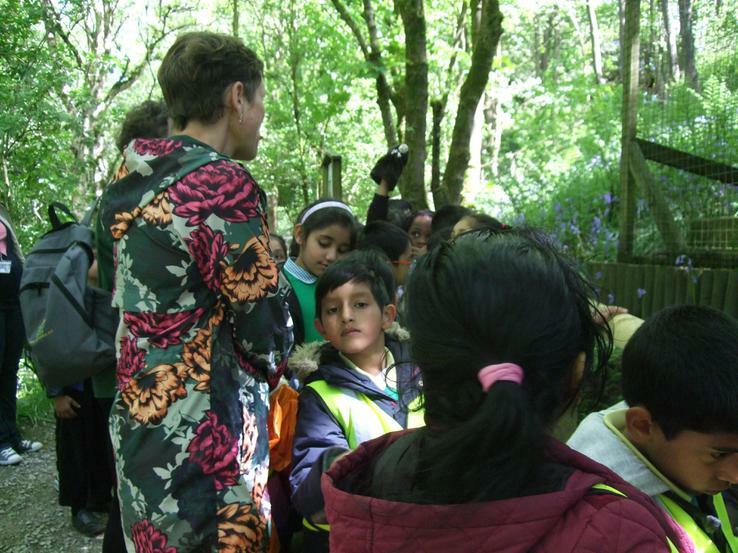 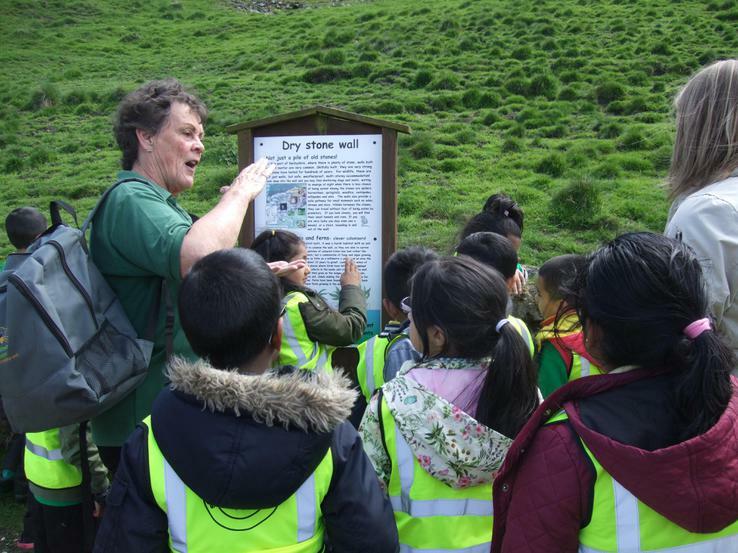 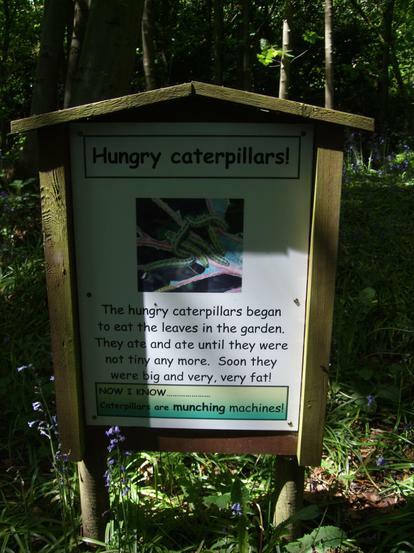 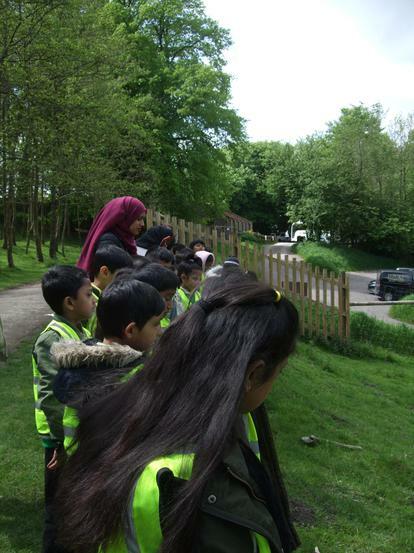 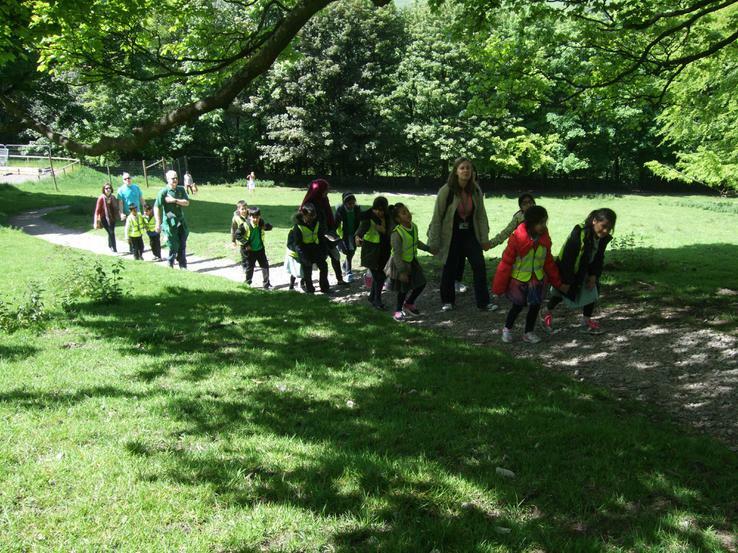 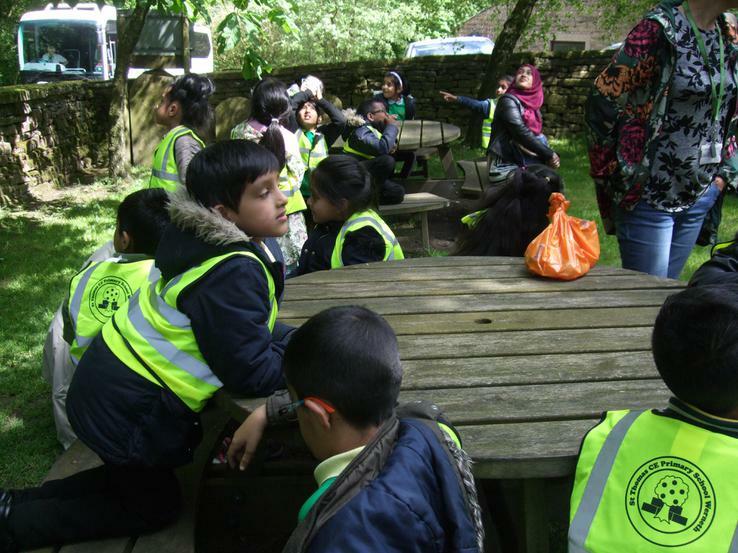 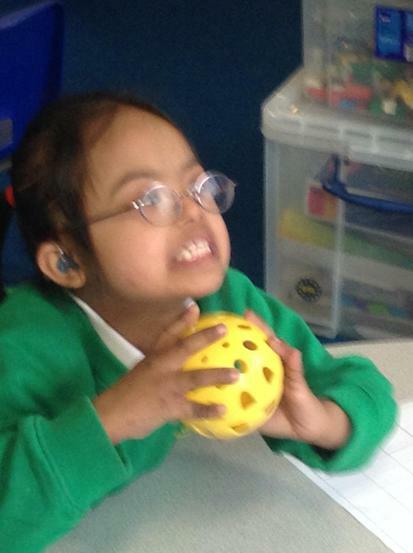 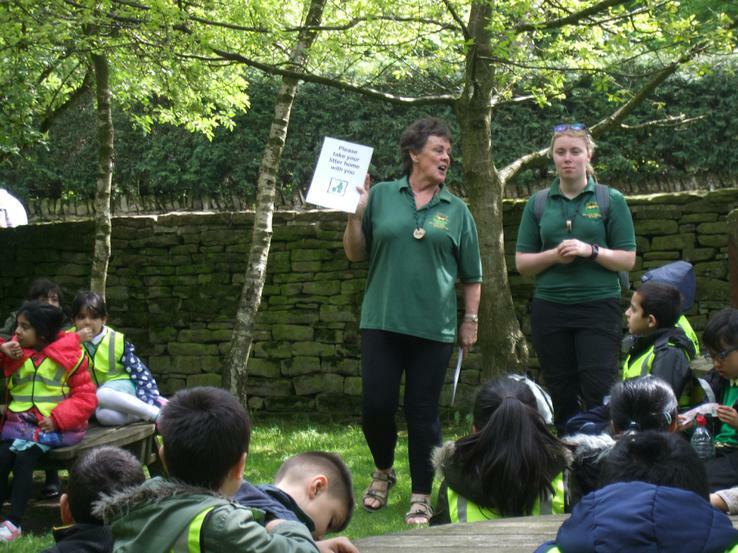 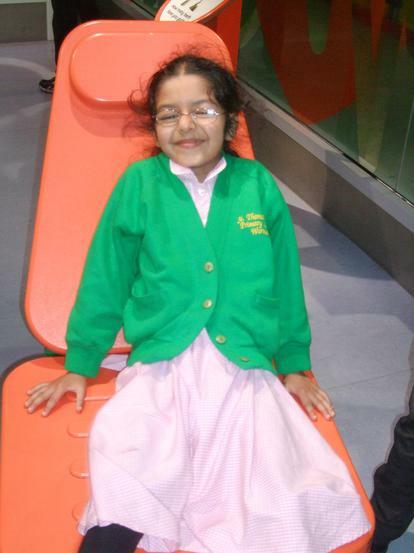 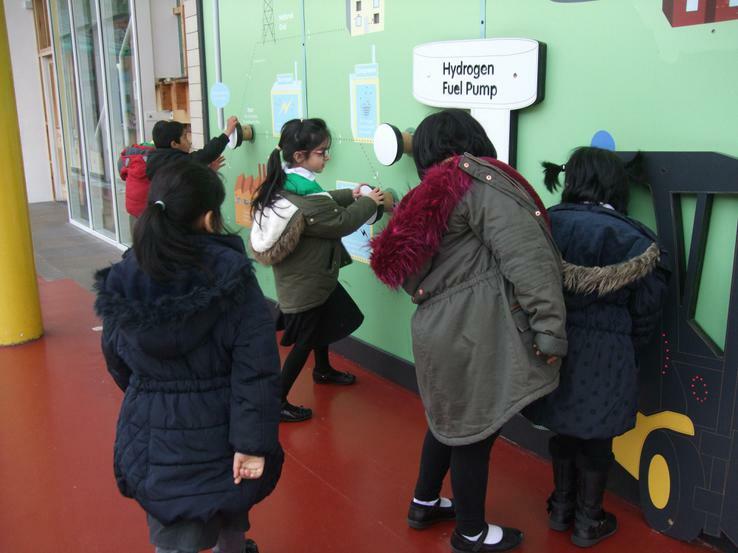 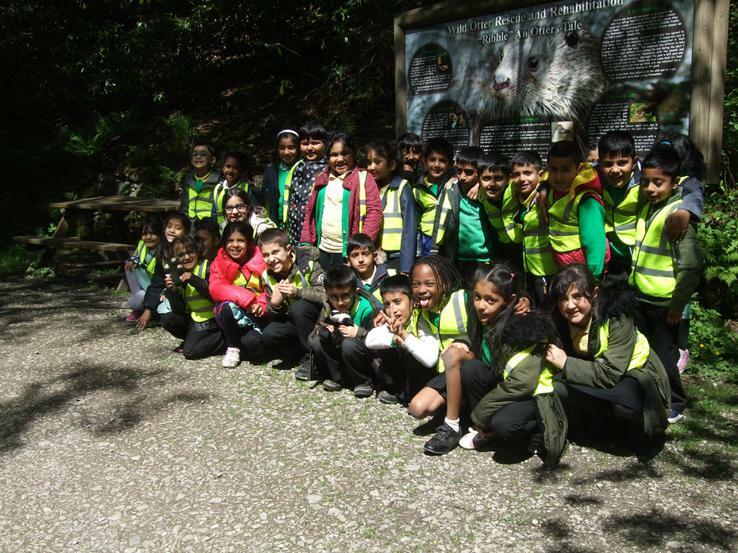 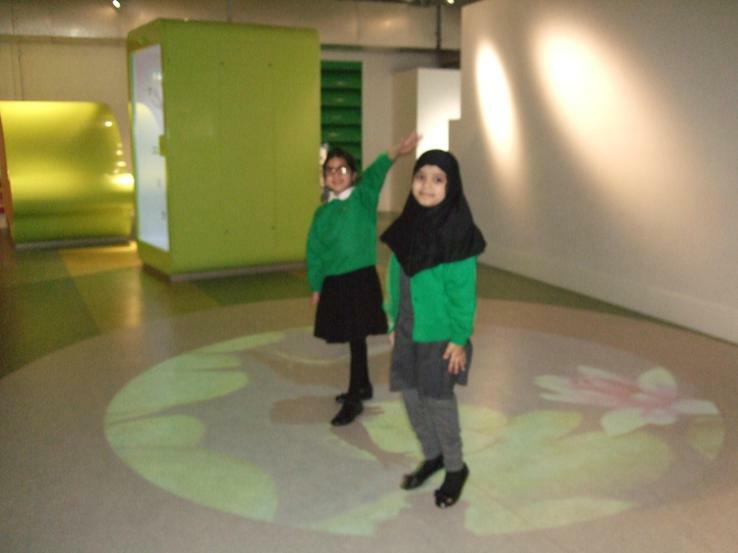 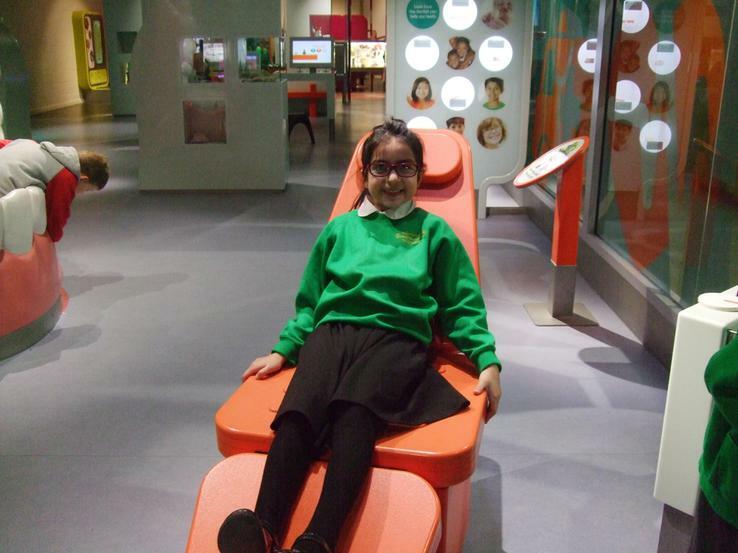 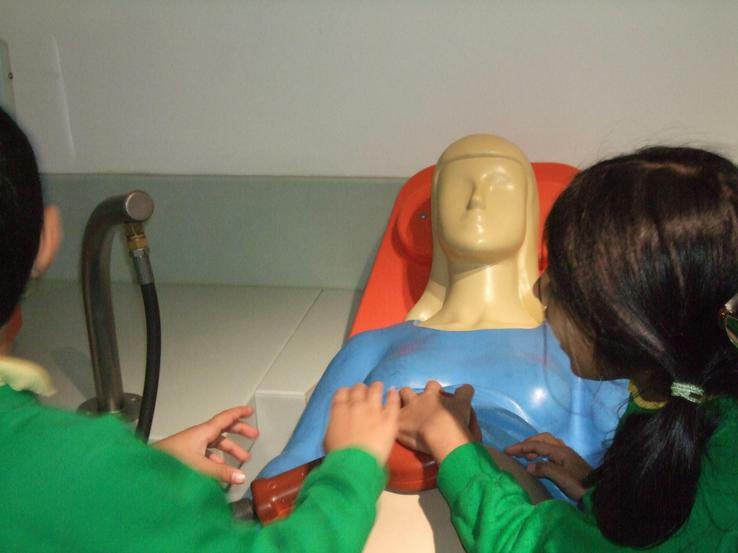 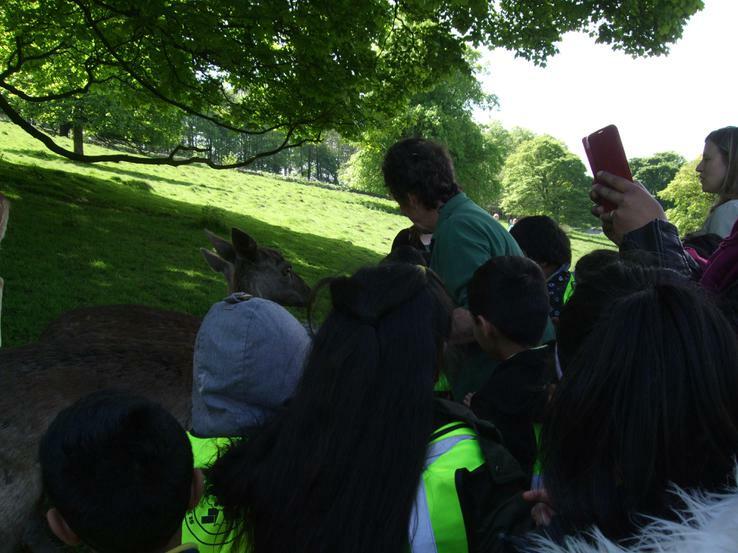 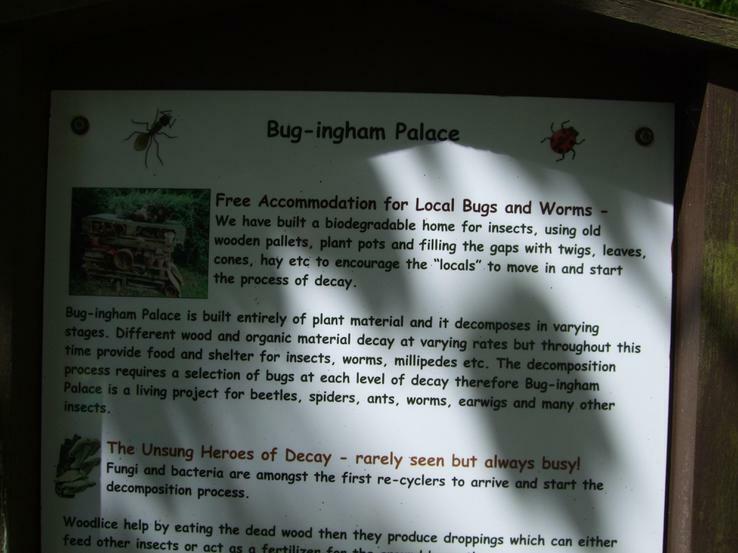 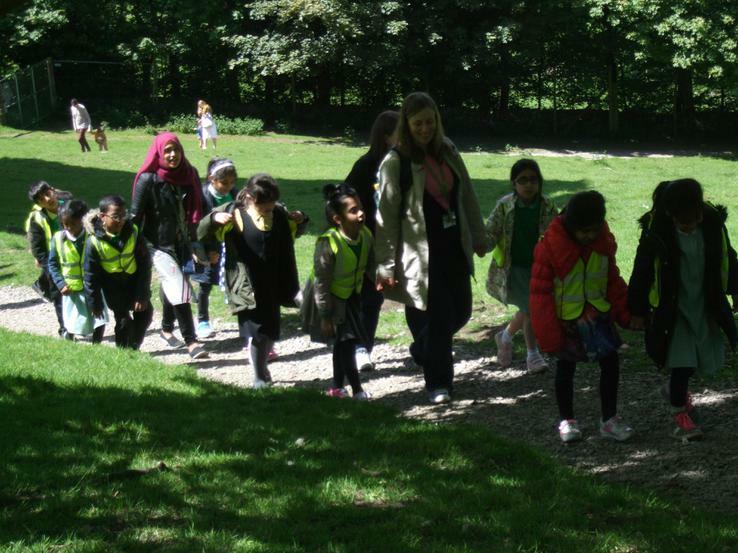 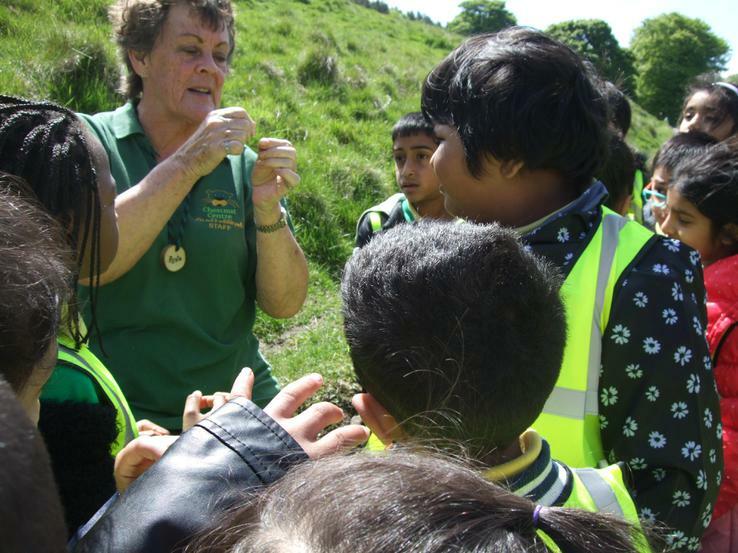 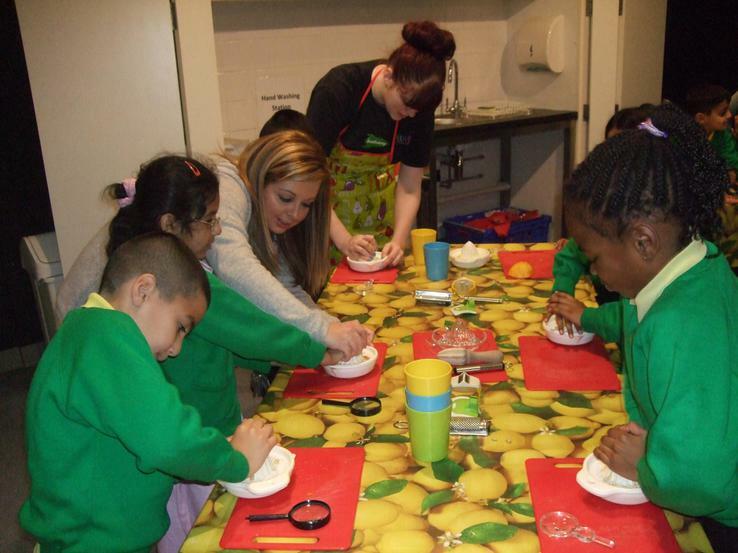 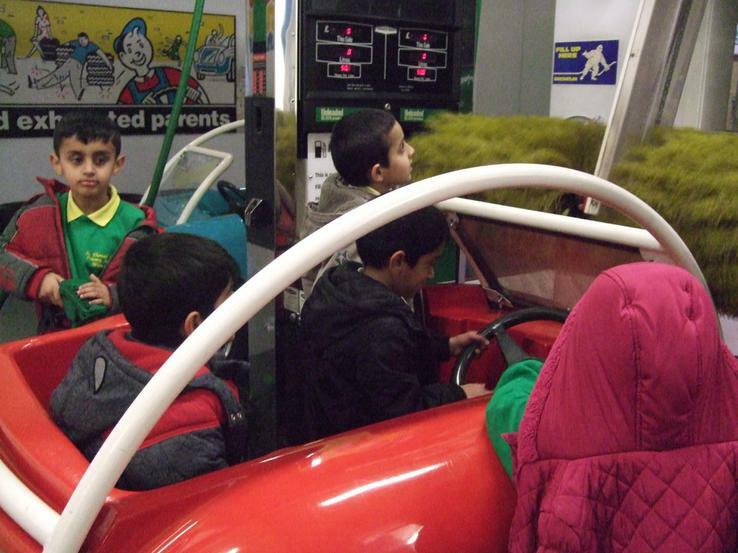 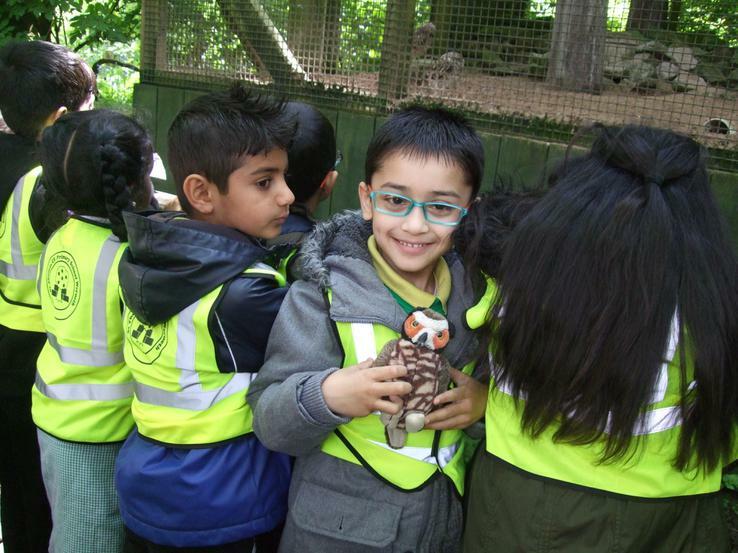 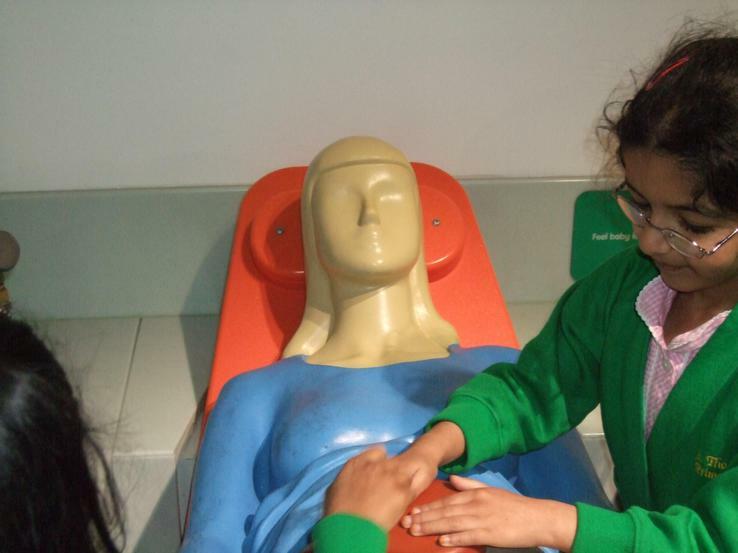 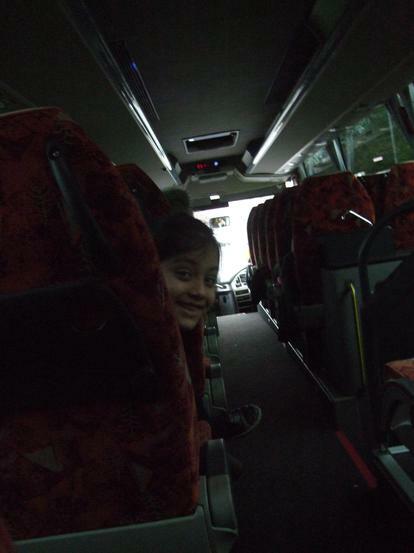 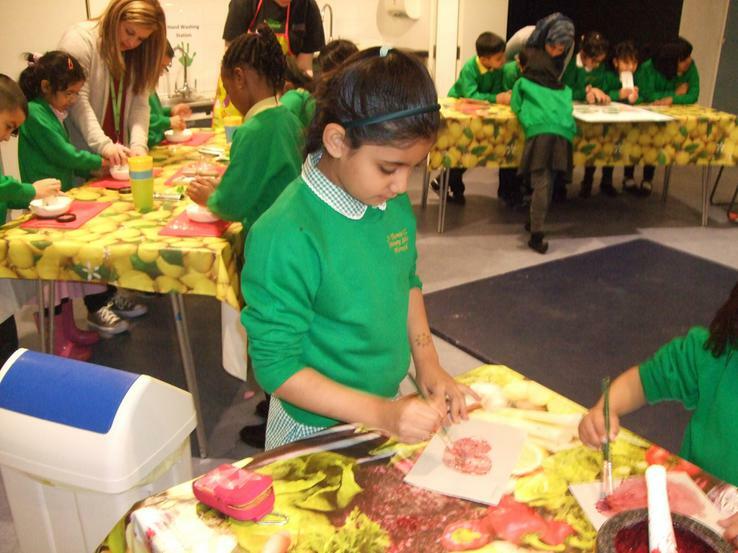 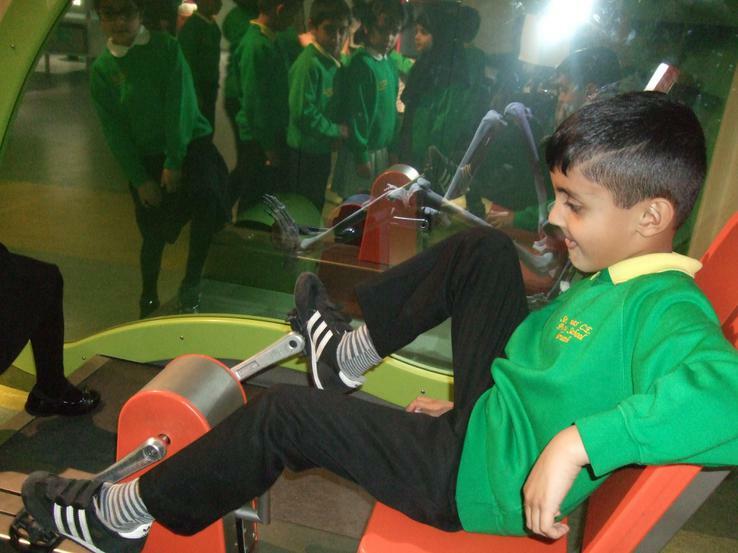 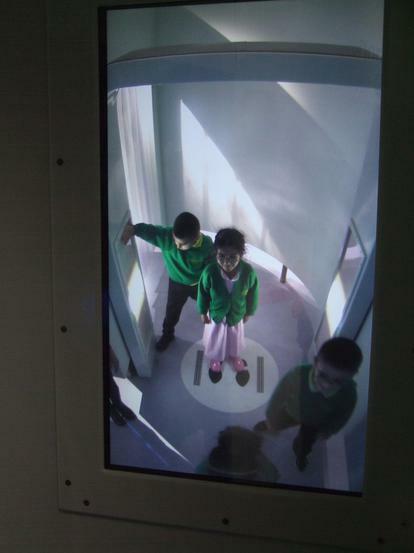 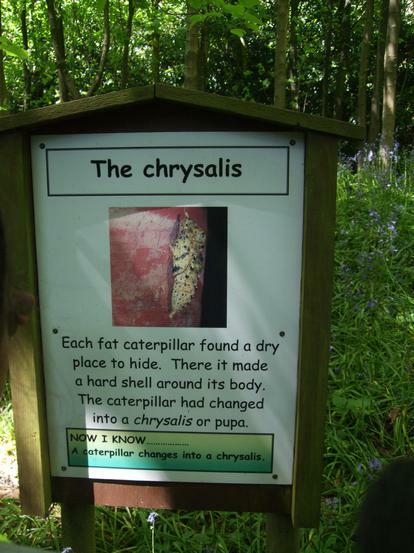 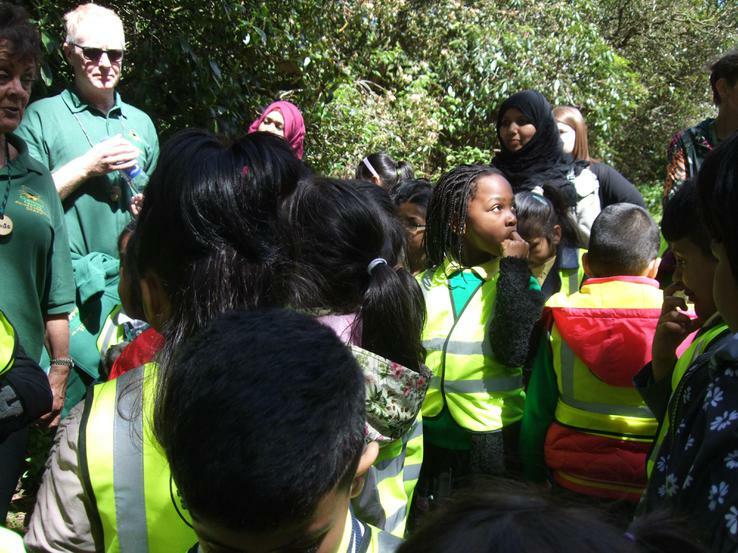 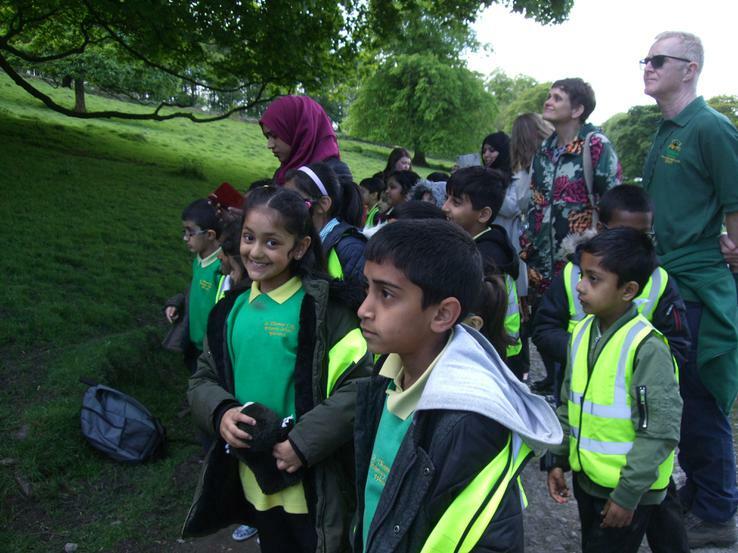 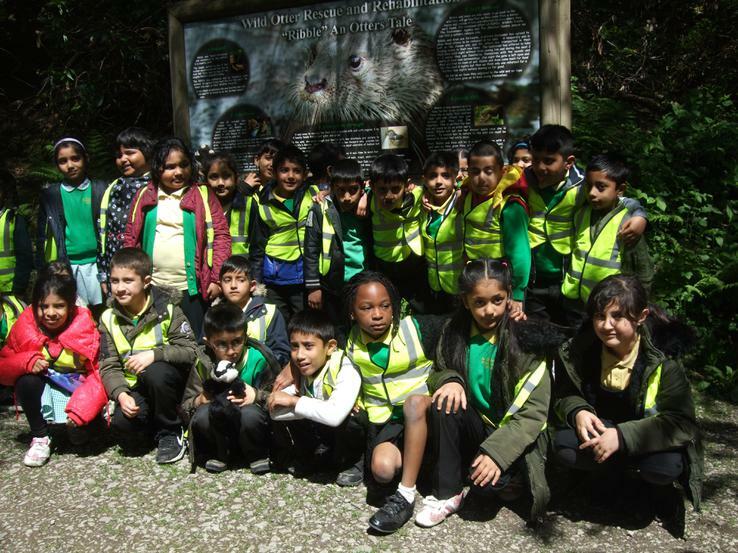 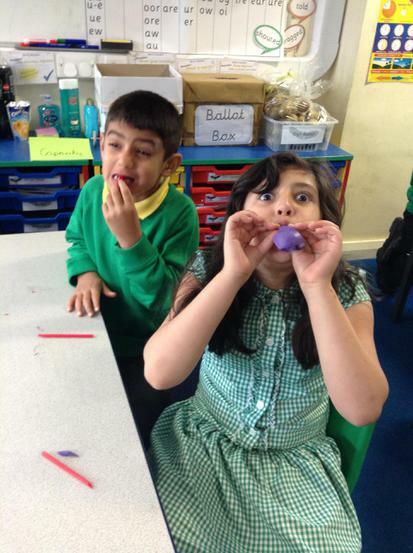 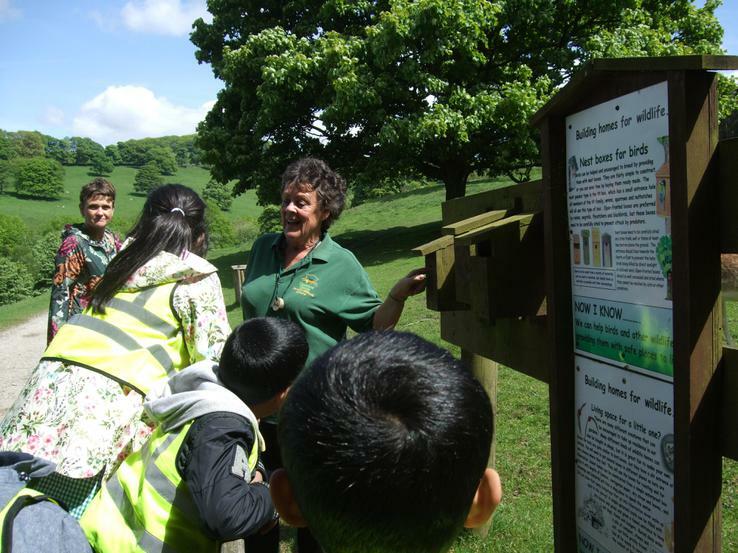 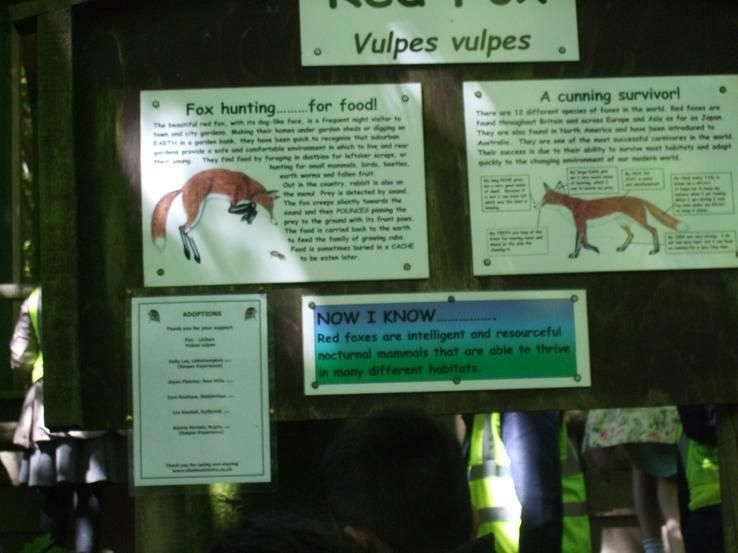 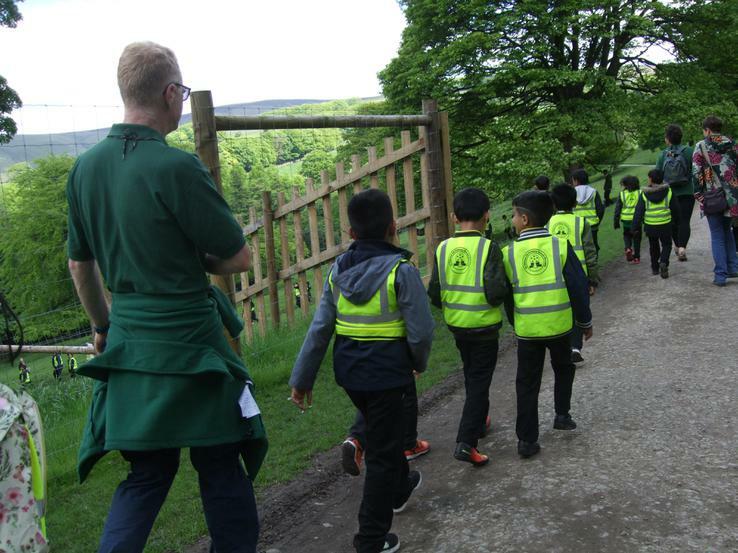 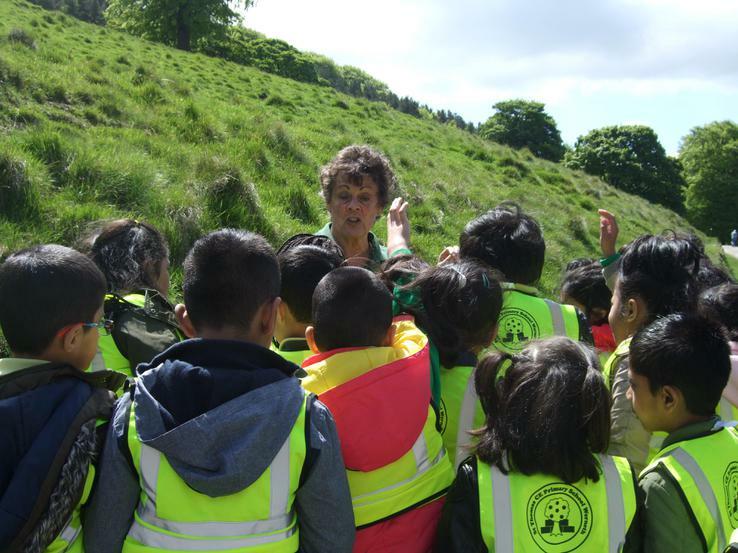 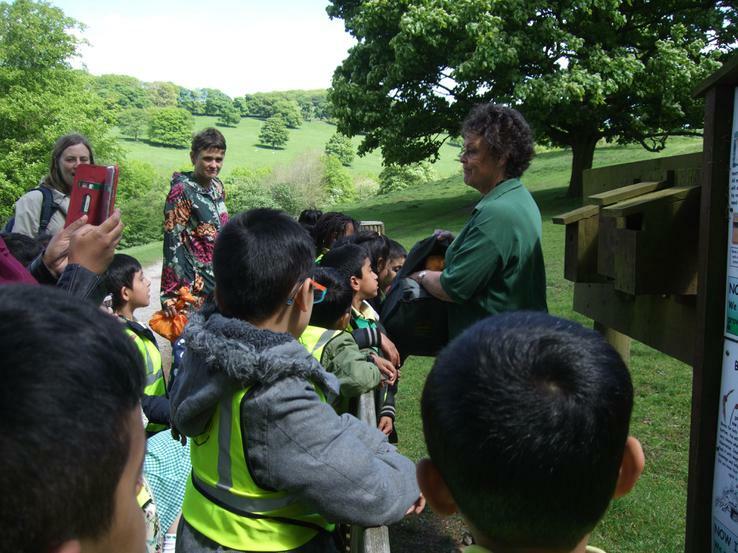 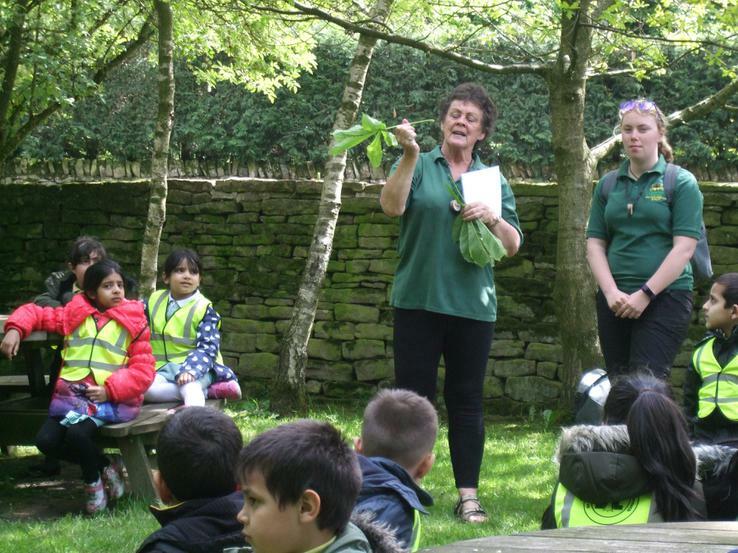 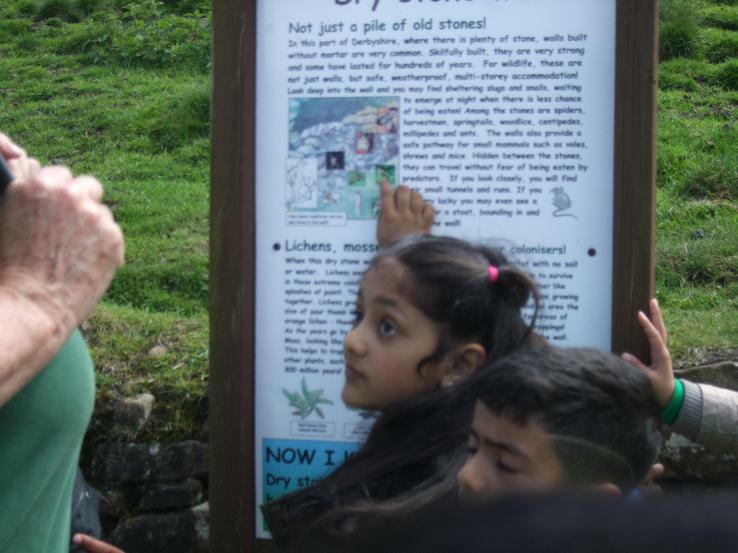 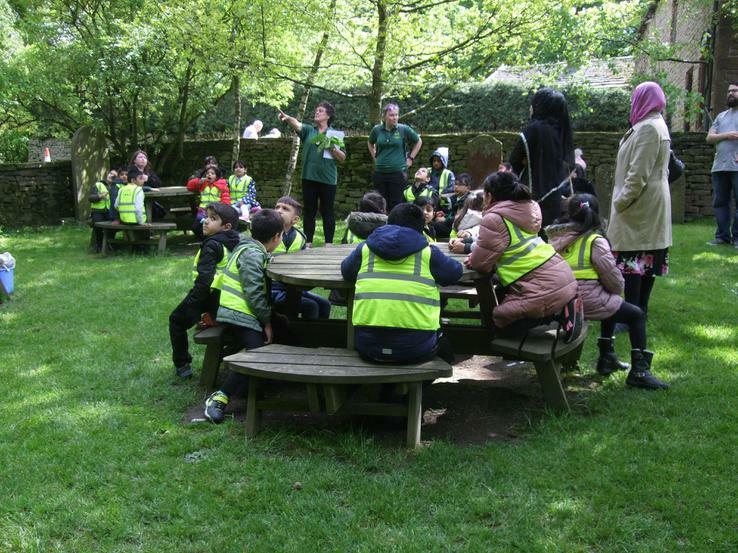 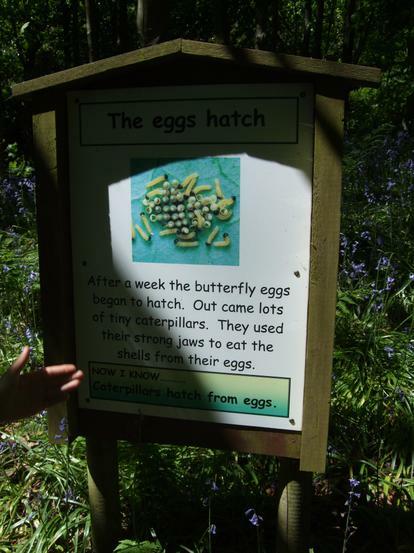 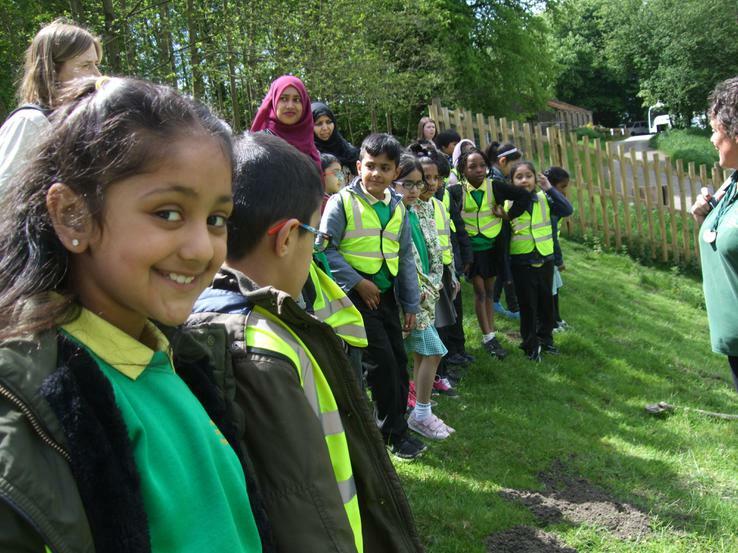 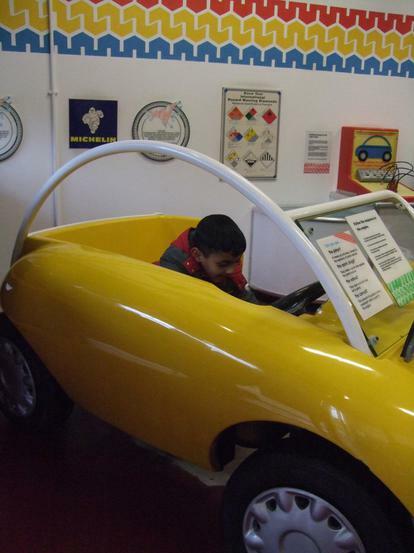 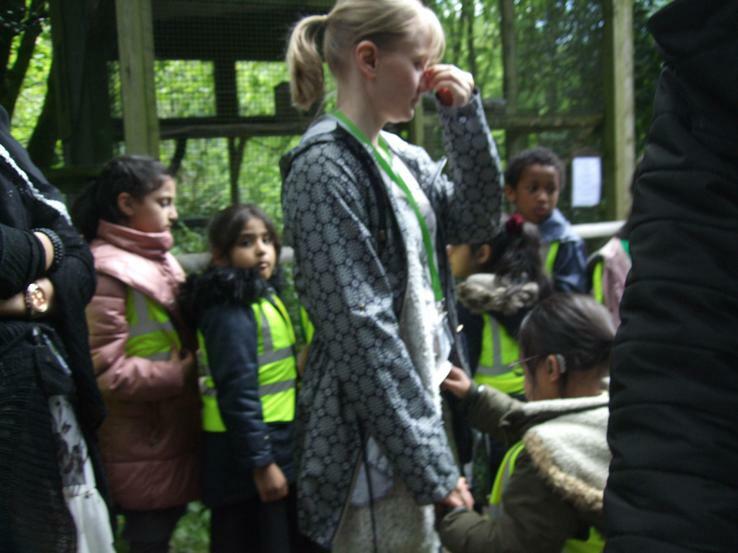 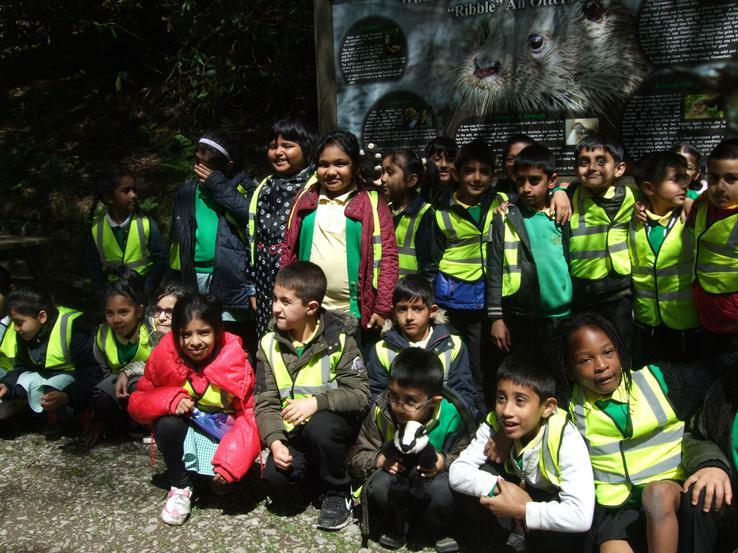 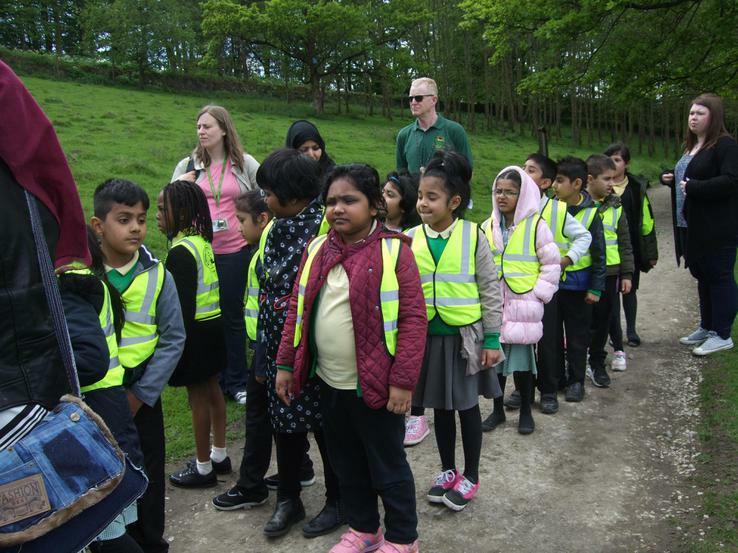 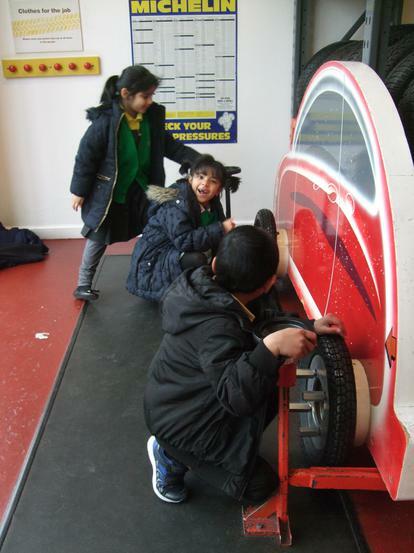 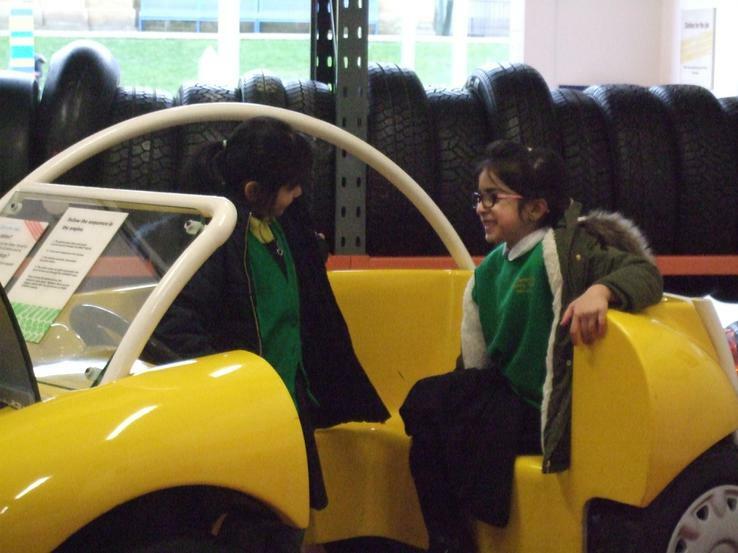 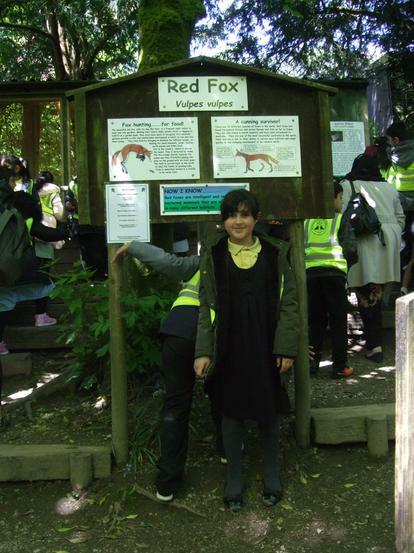 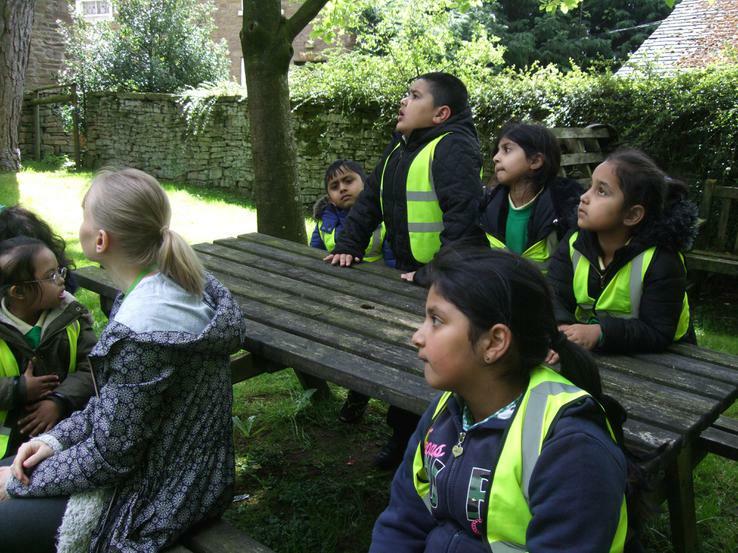 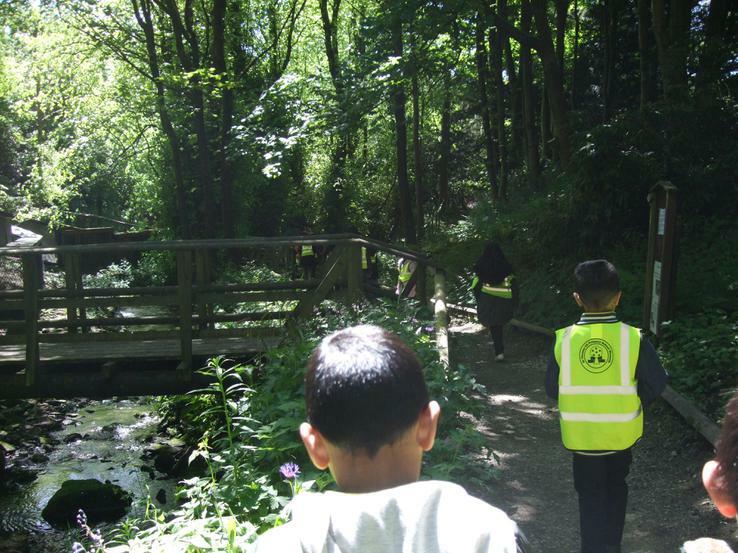 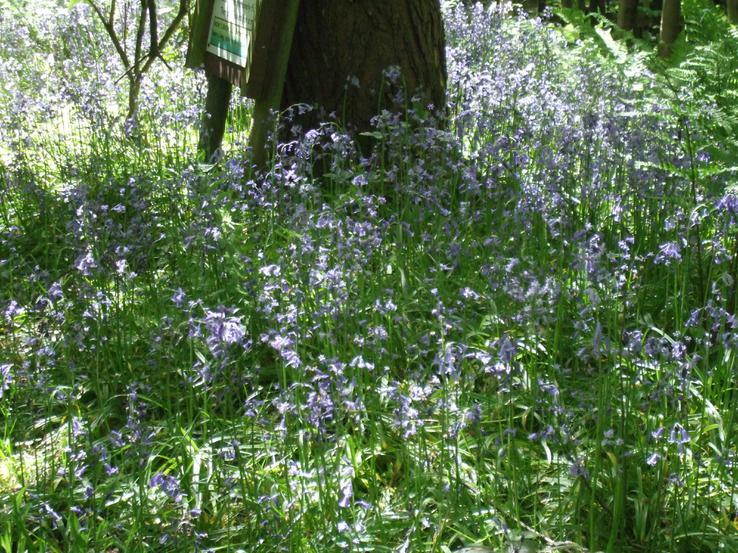 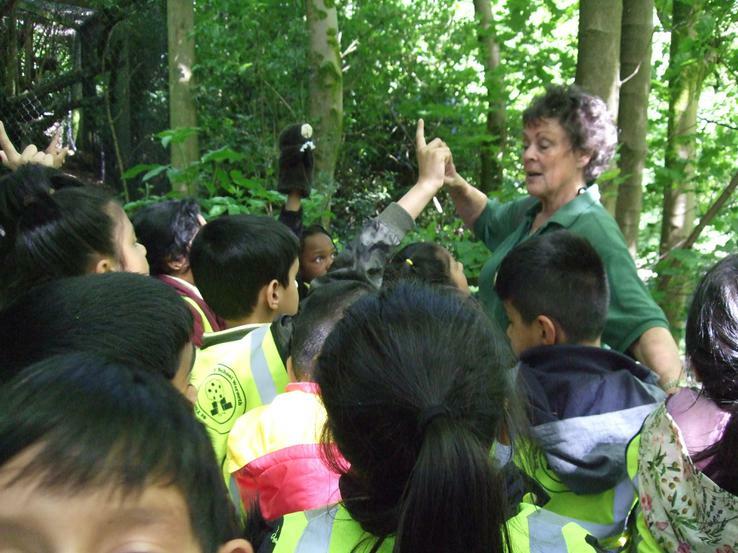 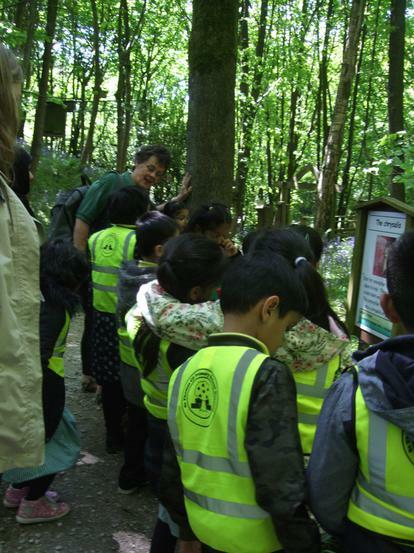 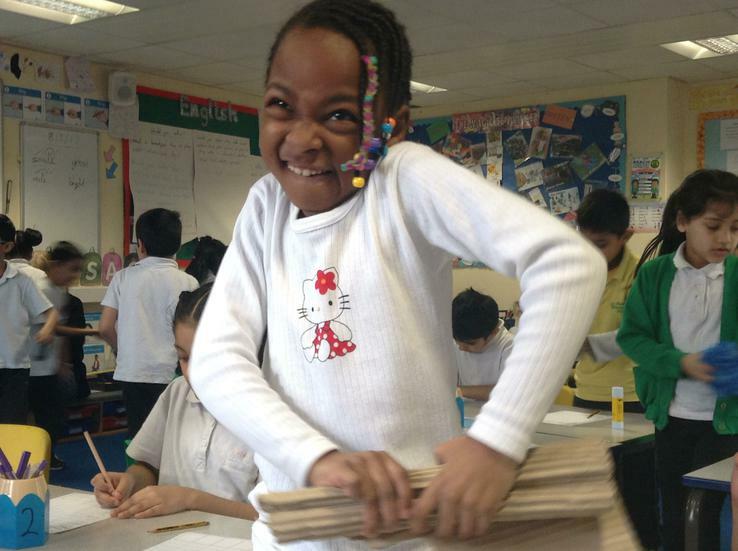 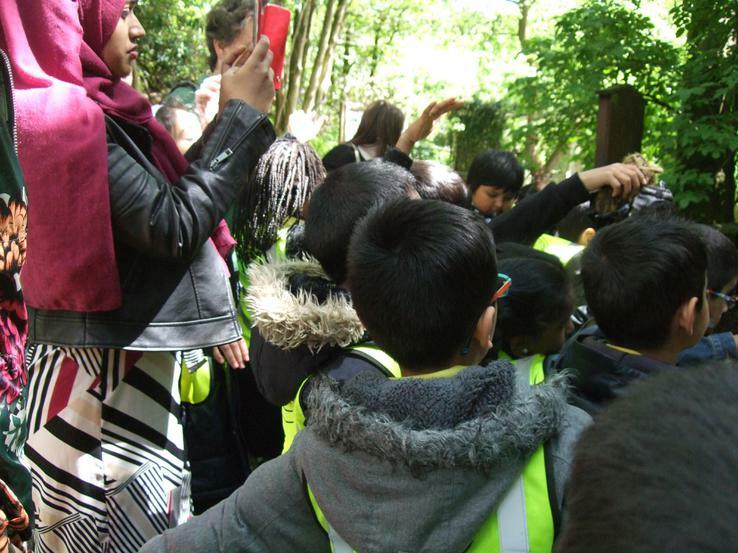 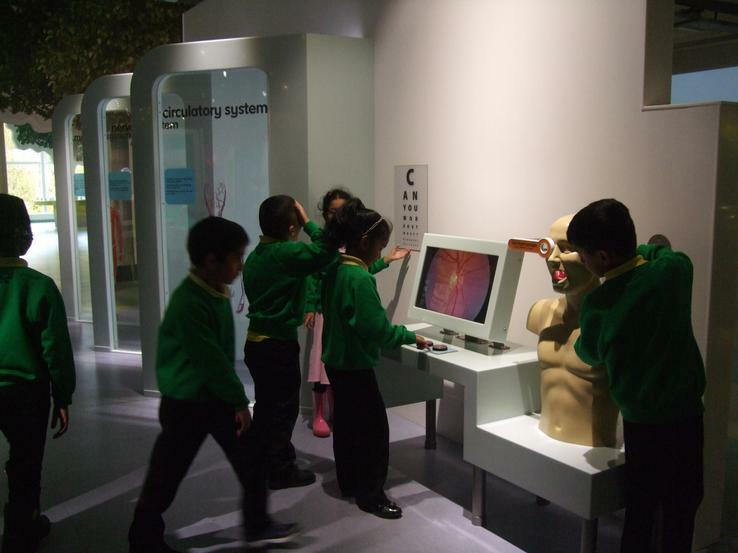 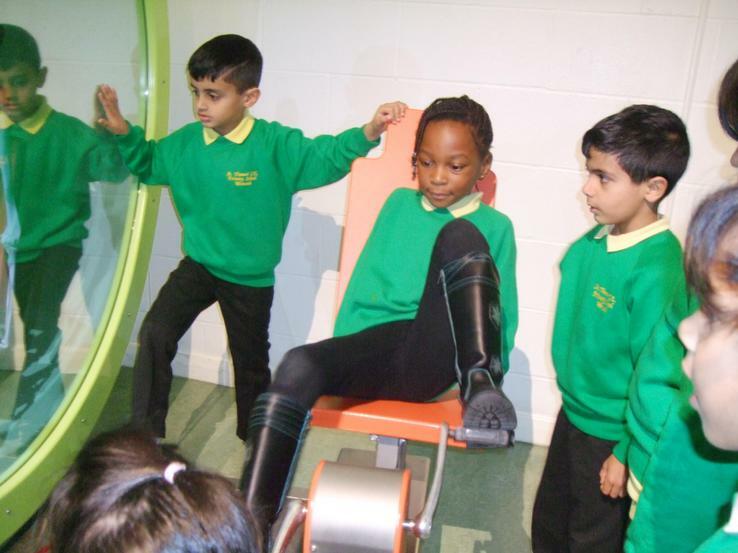 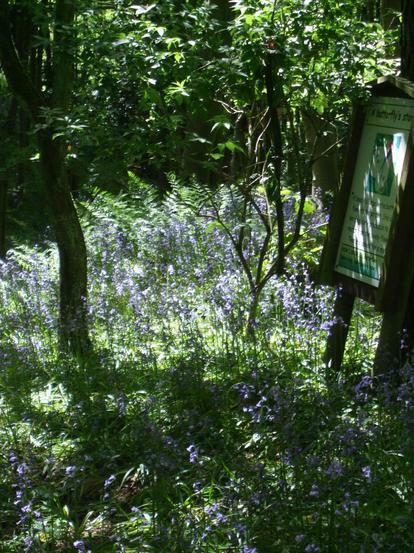 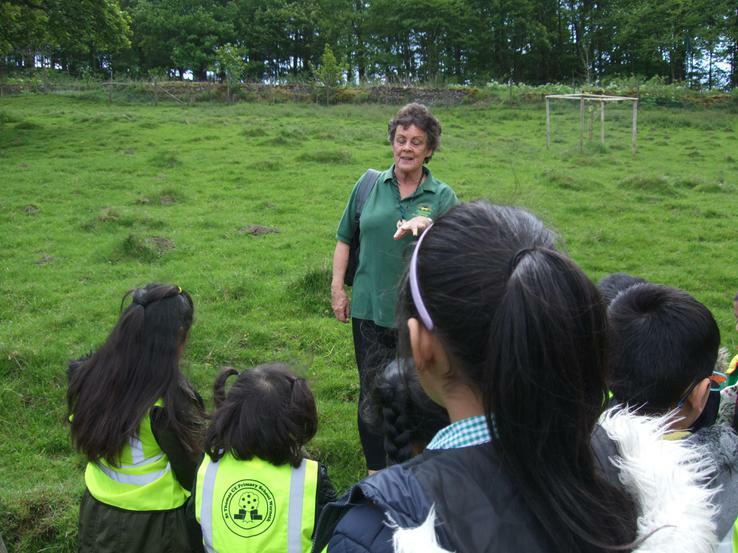 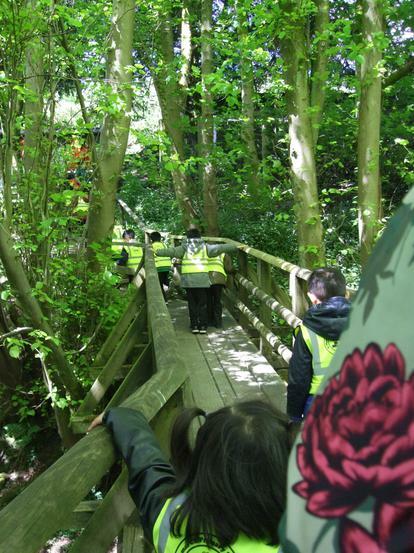 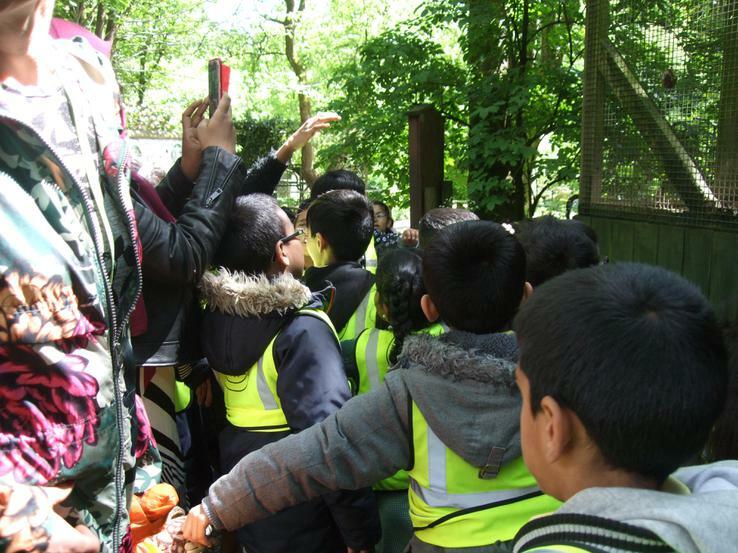 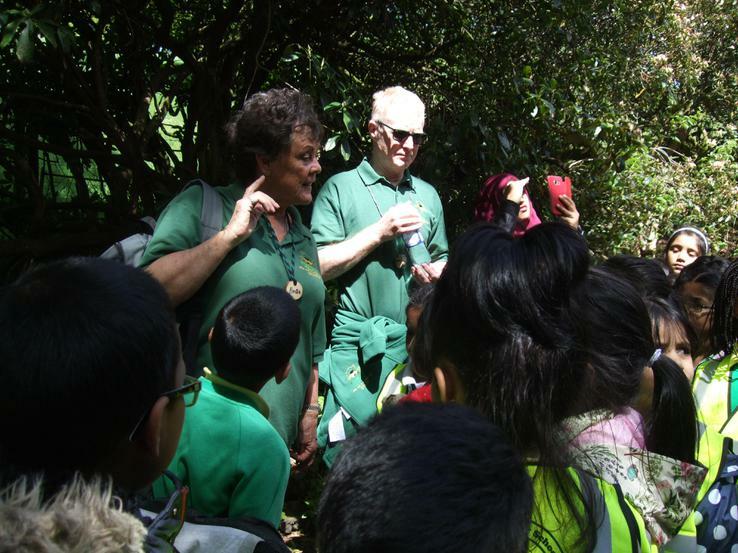 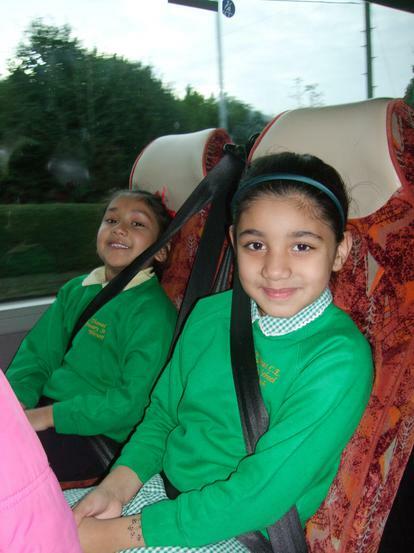 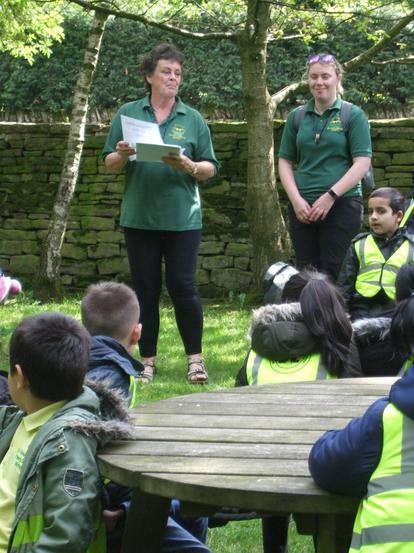 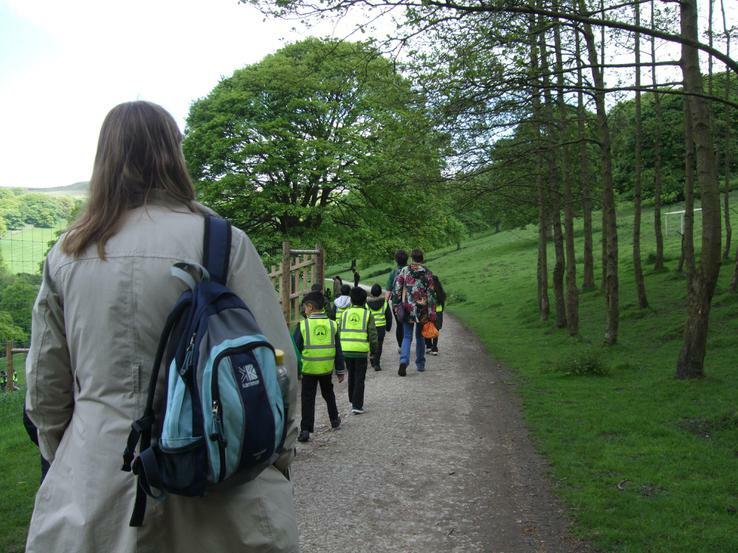 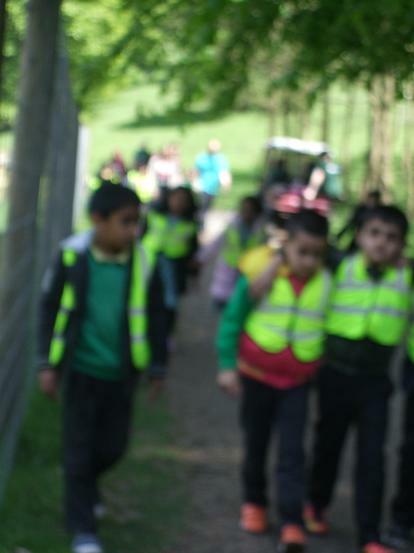 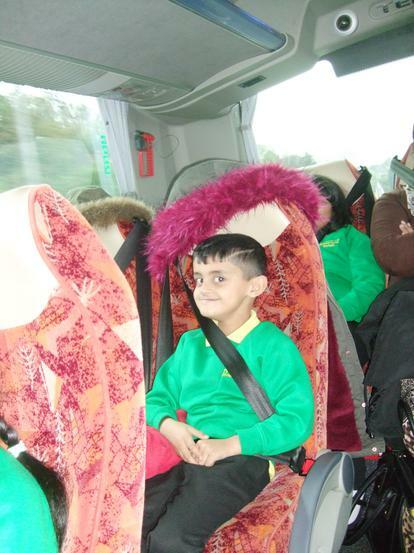 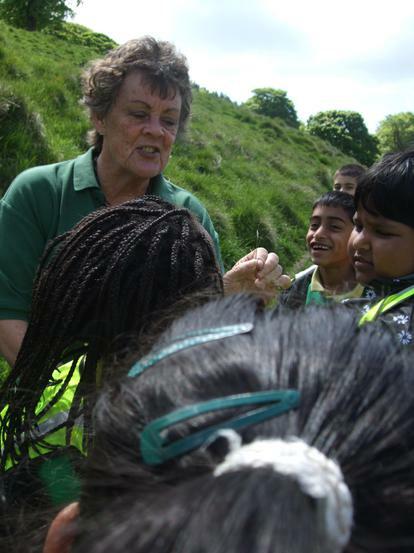 On Tuesday 23rd May we had an amazing class trip to the Chestnut Centre! 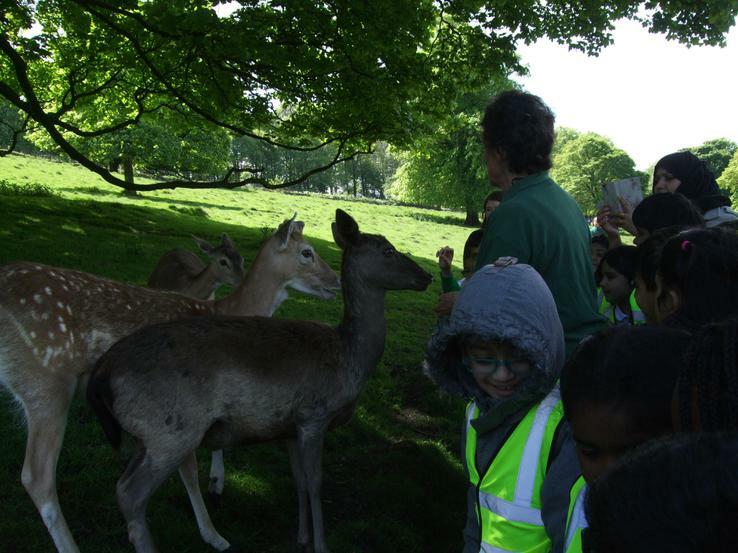 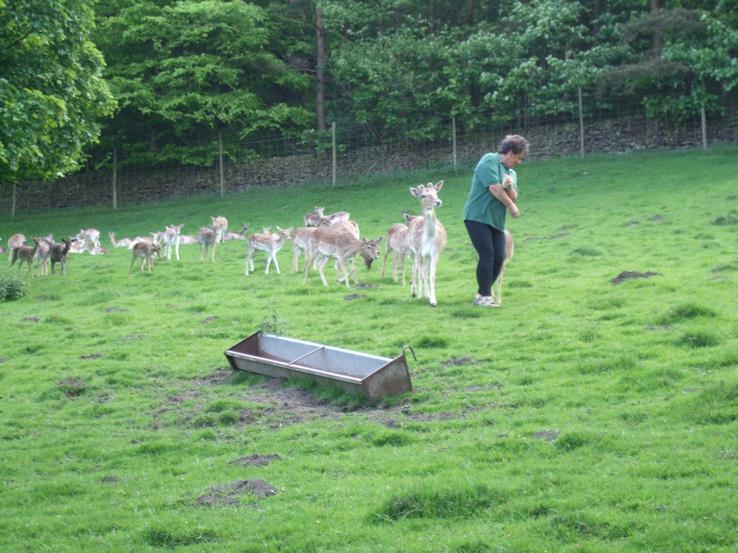 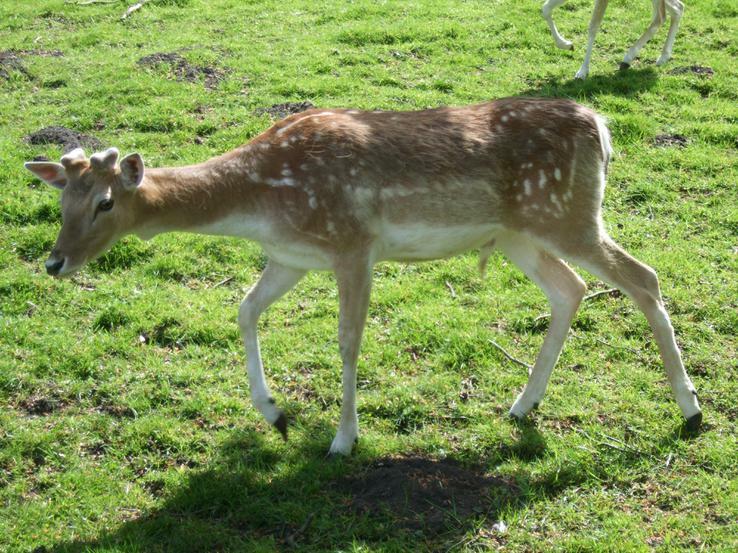 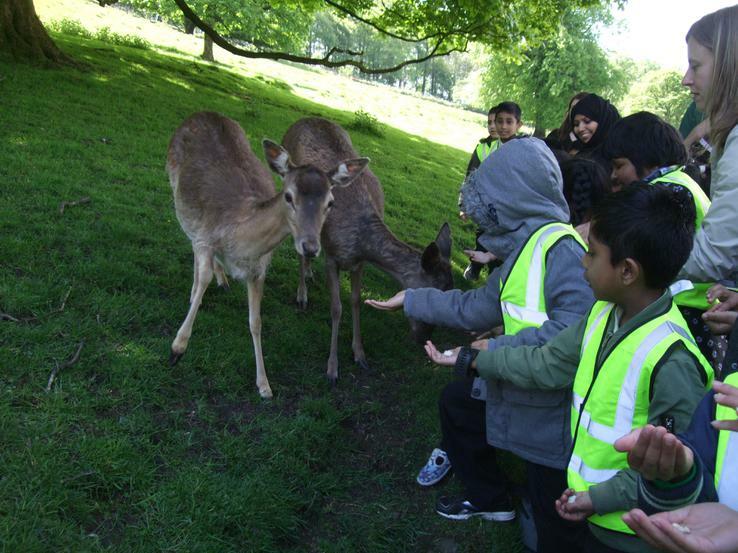 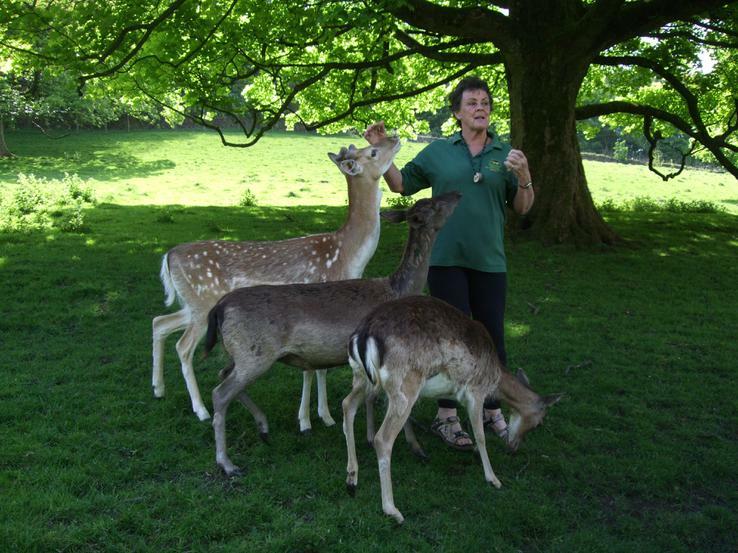 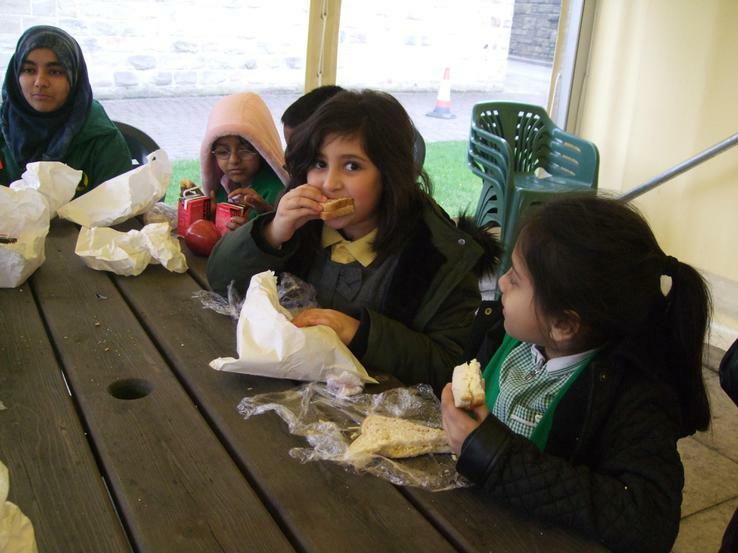 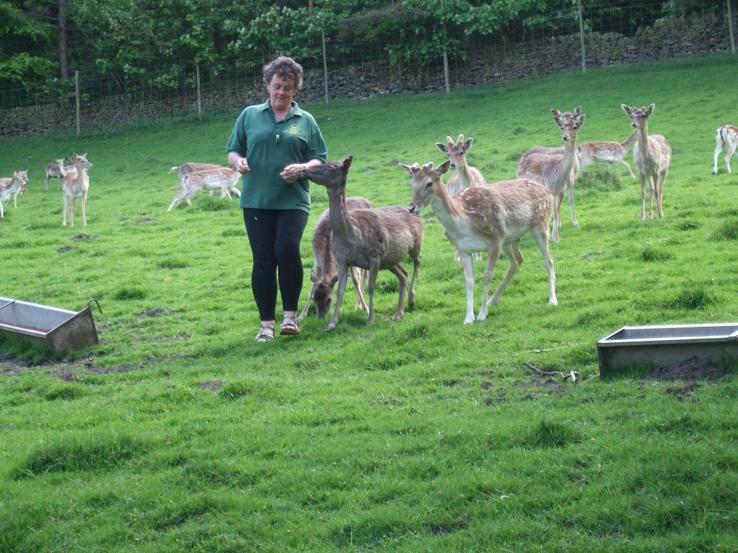 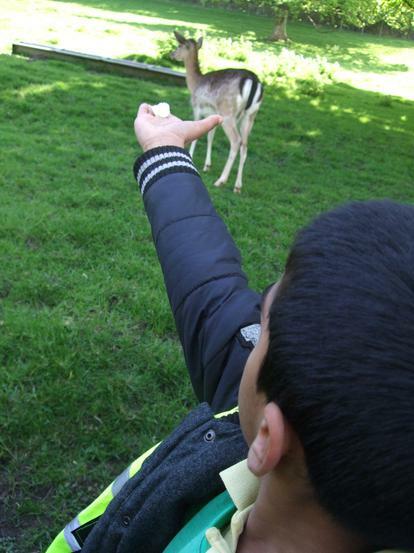 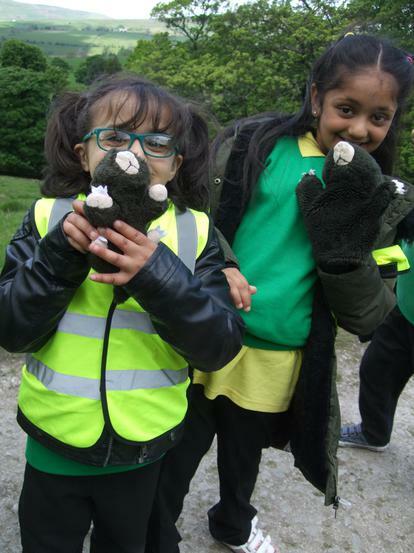 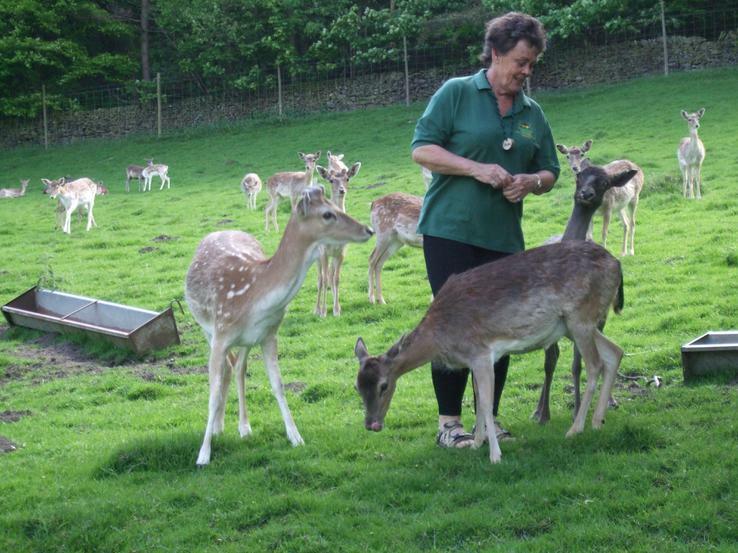 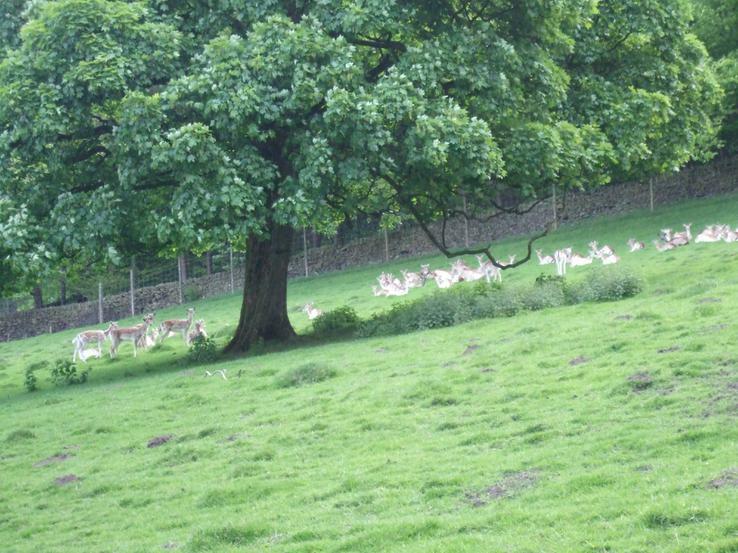 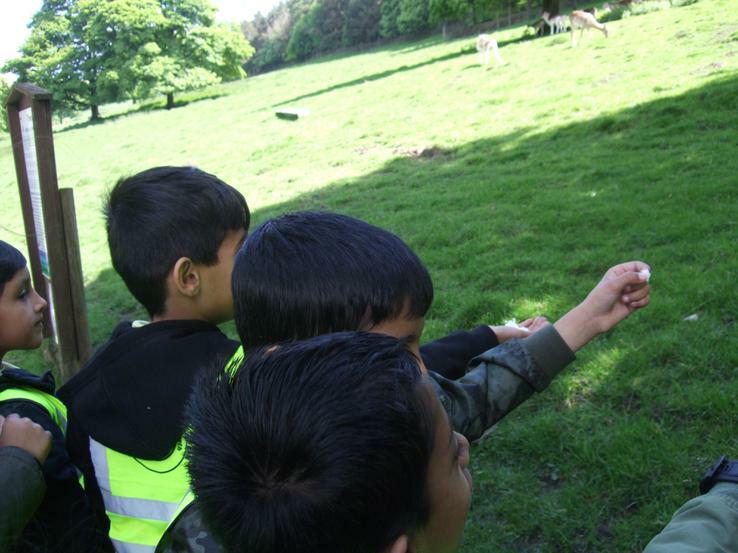 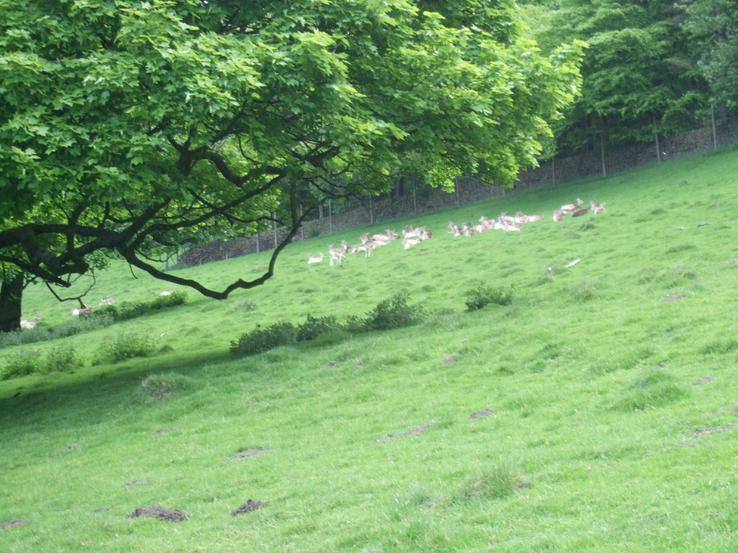 We learnt lots of new facts about different animals and even fed the deer some tasty, delicious scones! 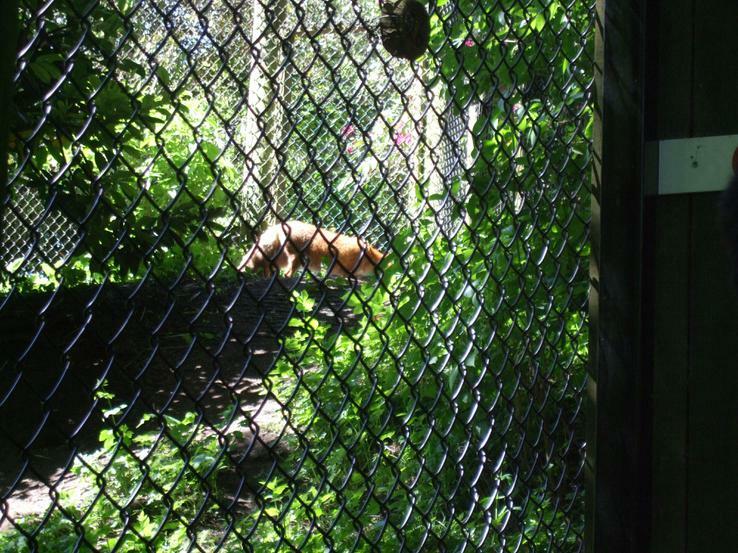 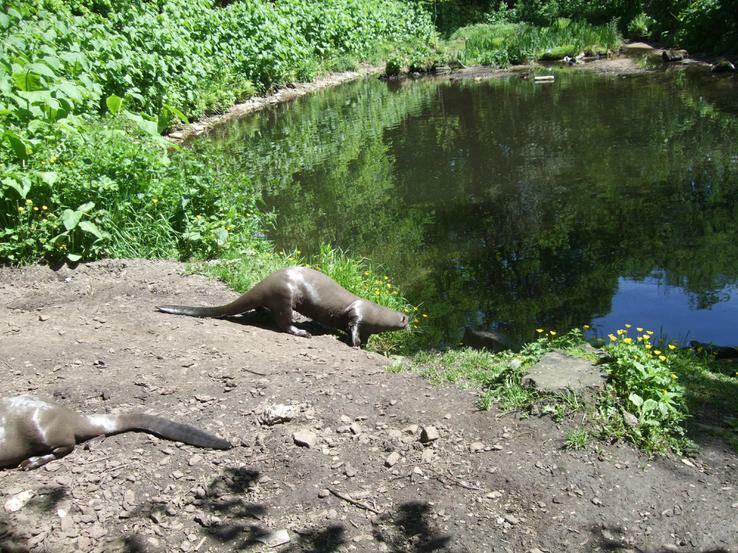 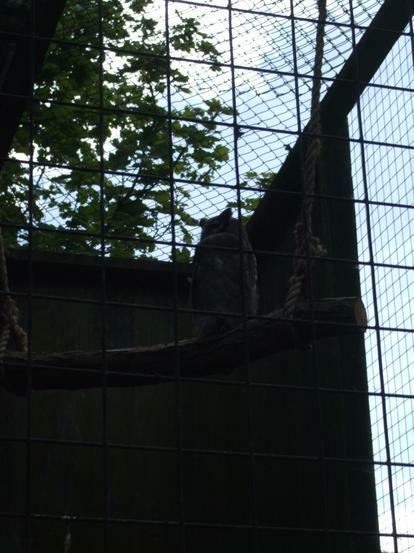 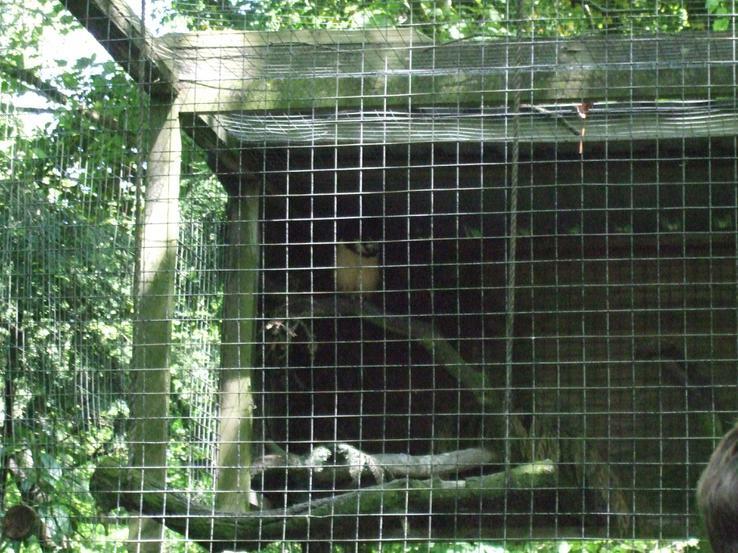 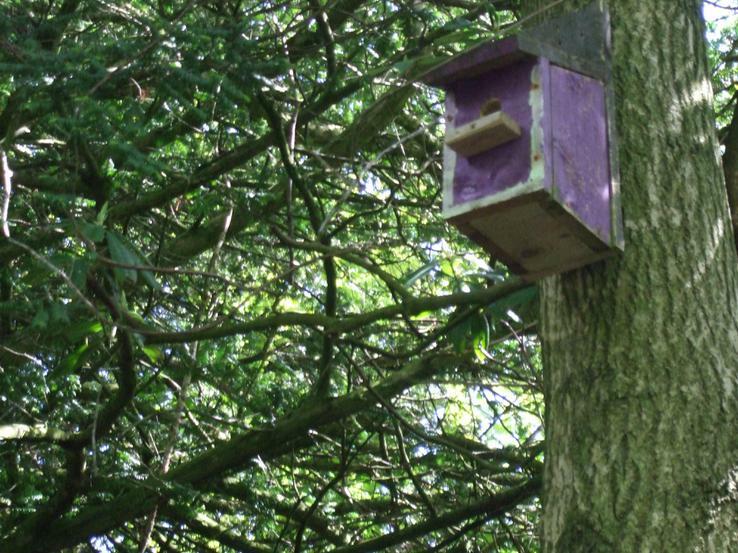 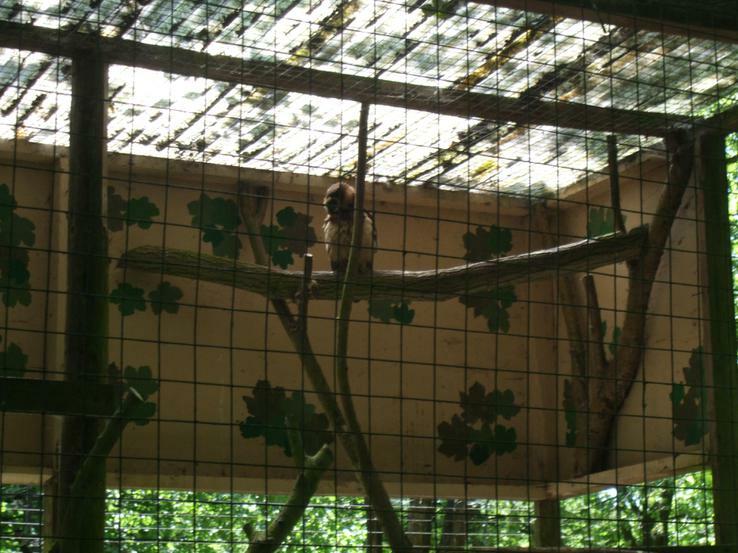 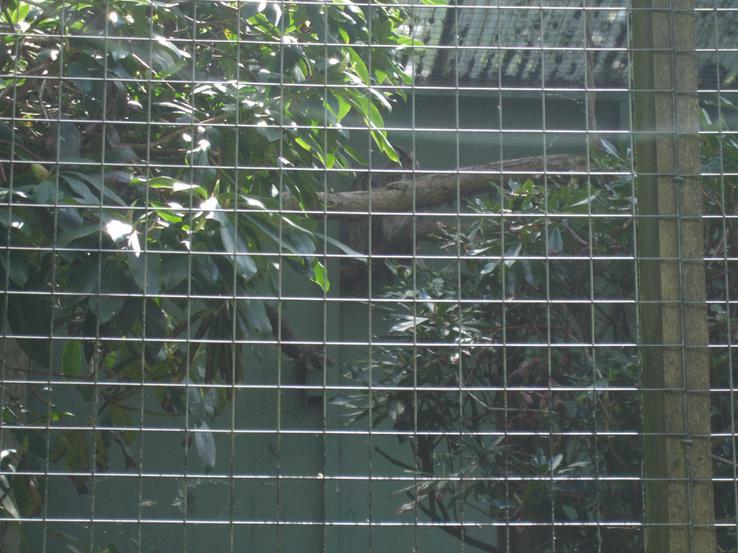 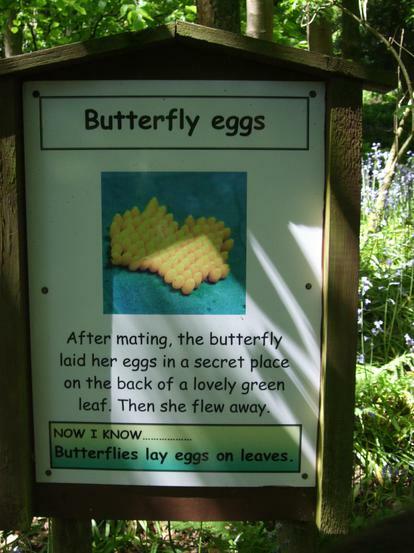 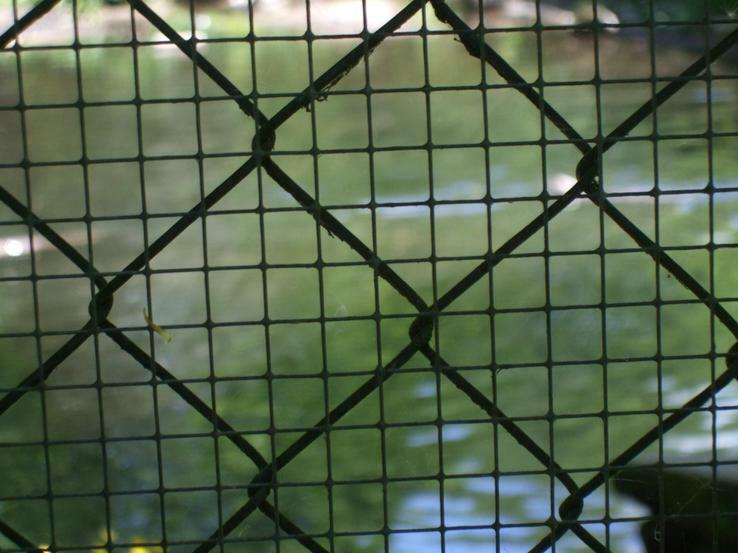 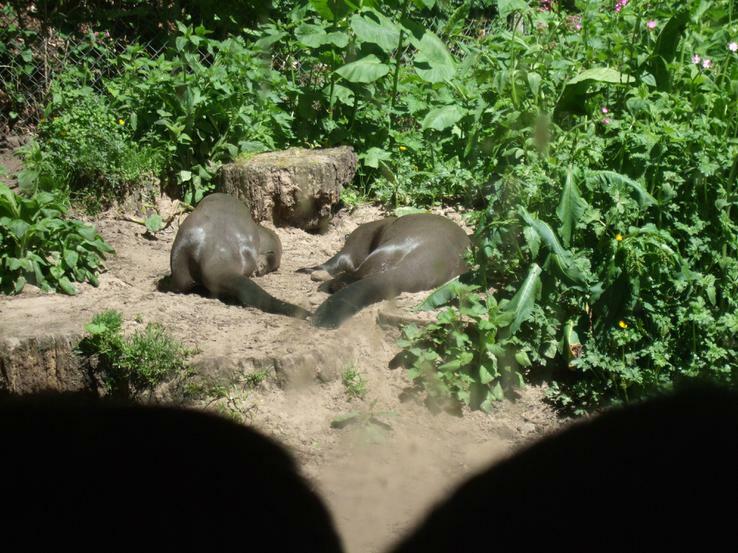 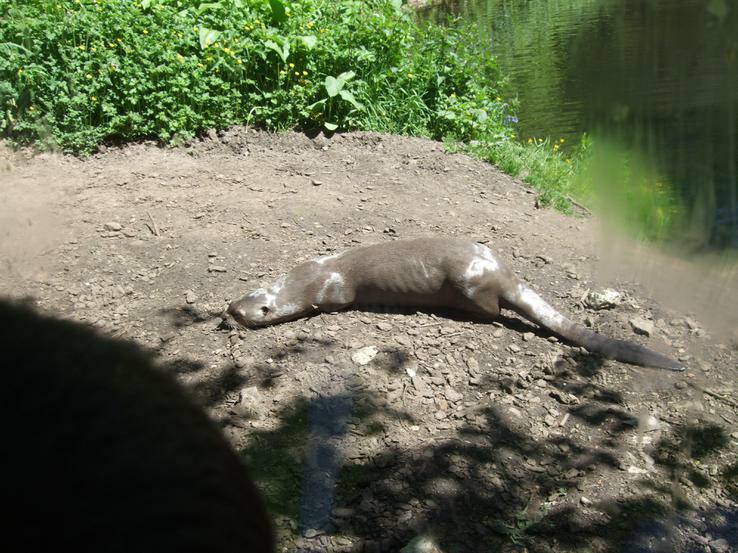 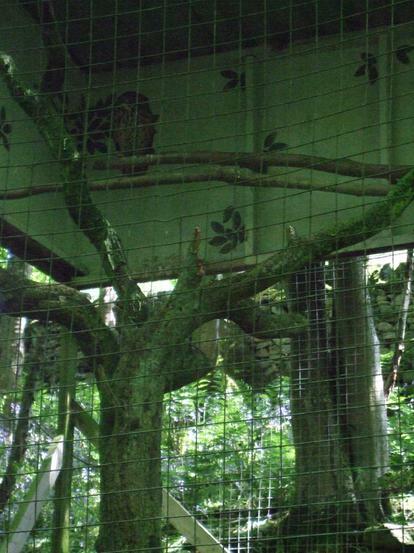 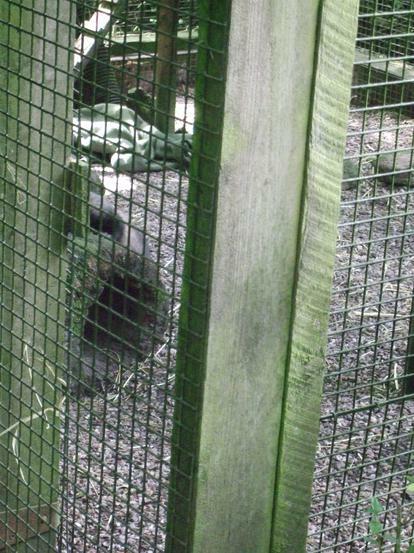 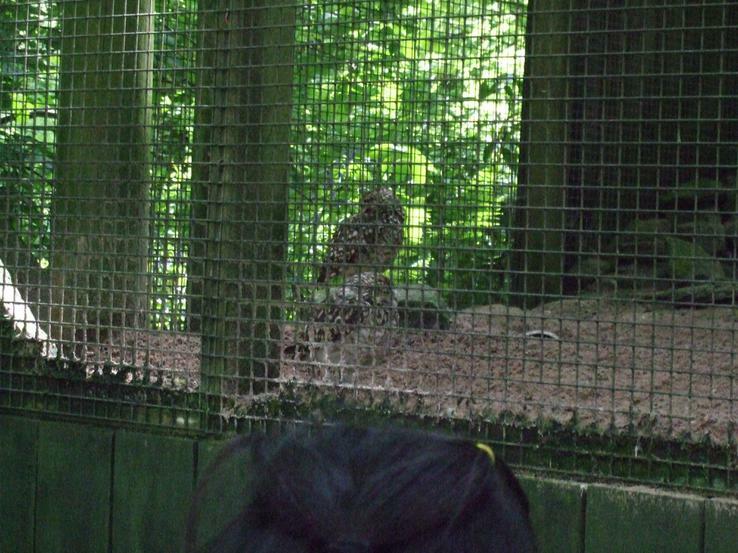 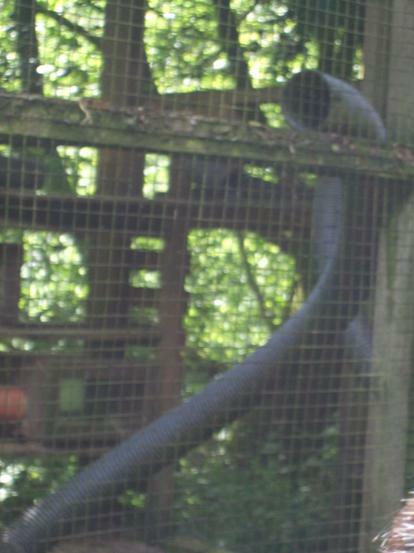 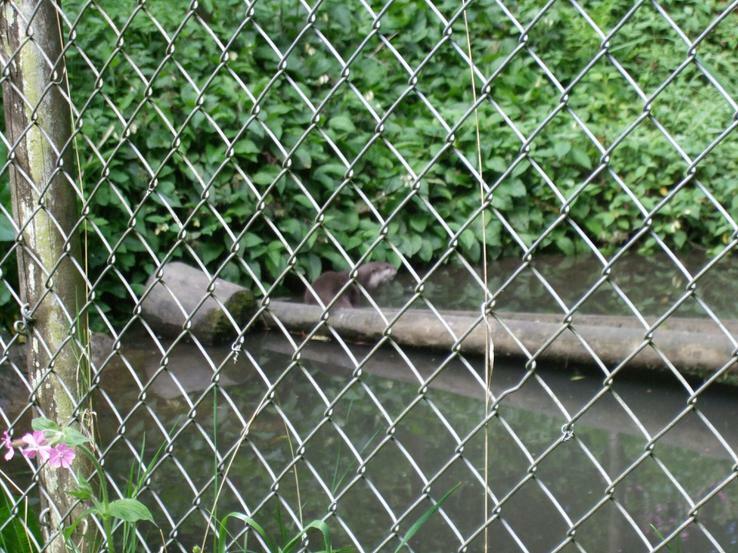 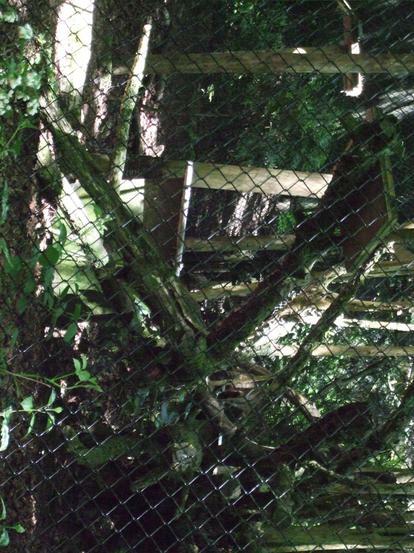 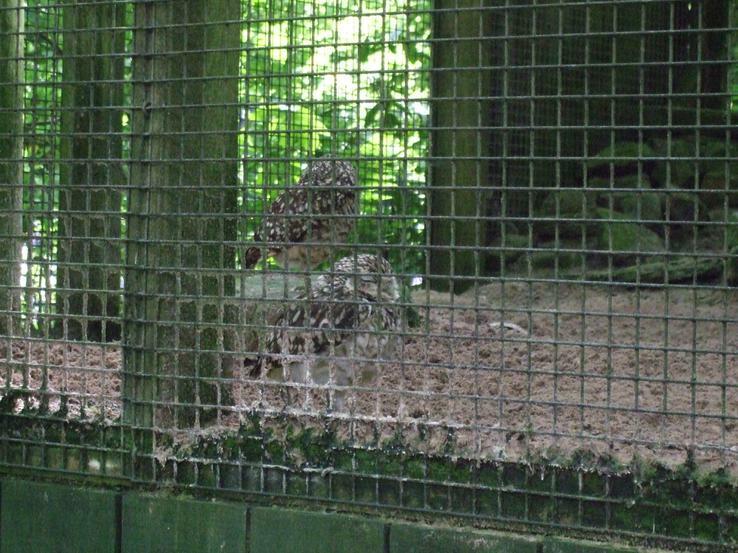 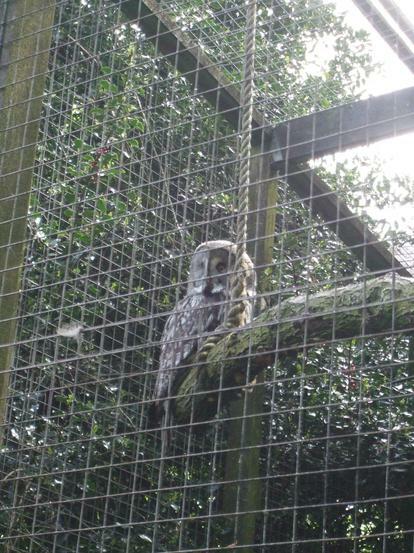 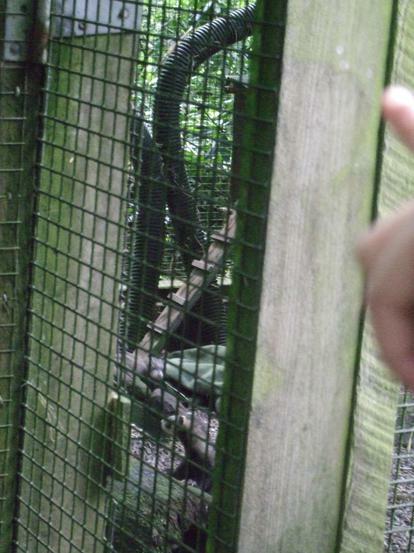 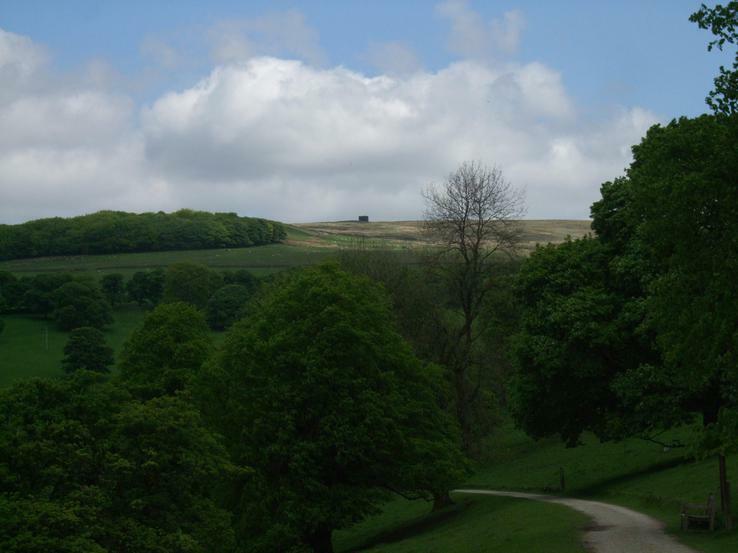 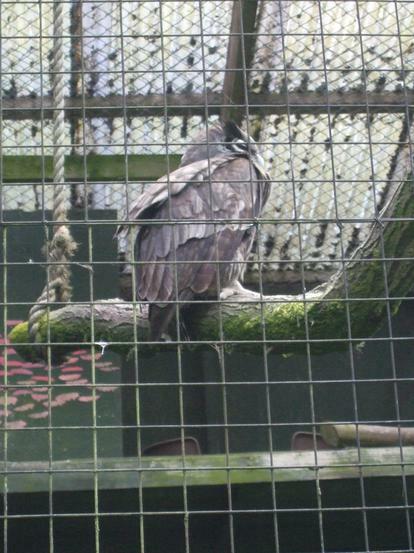 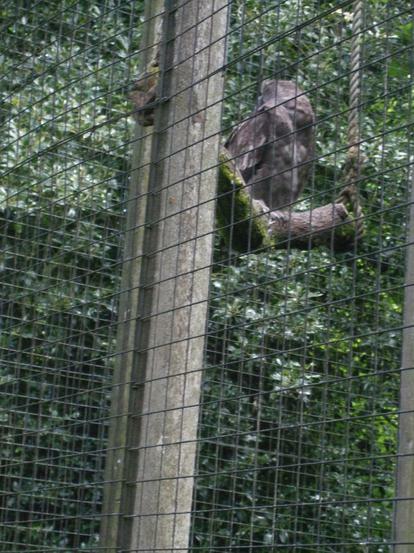 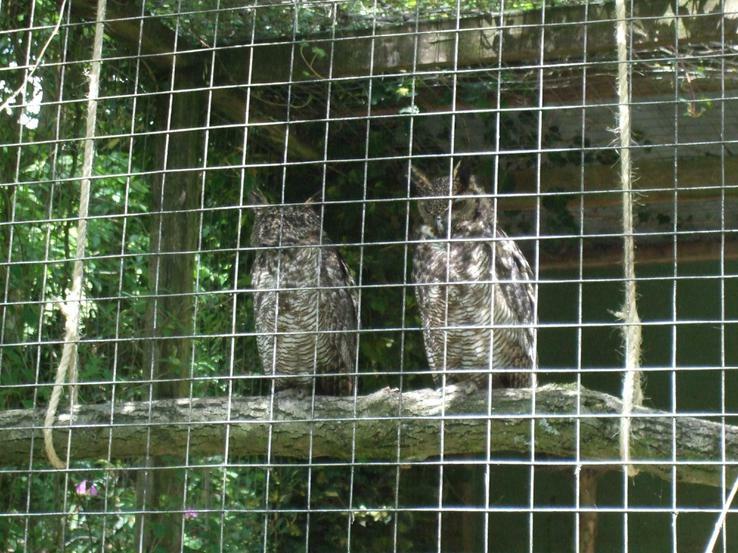 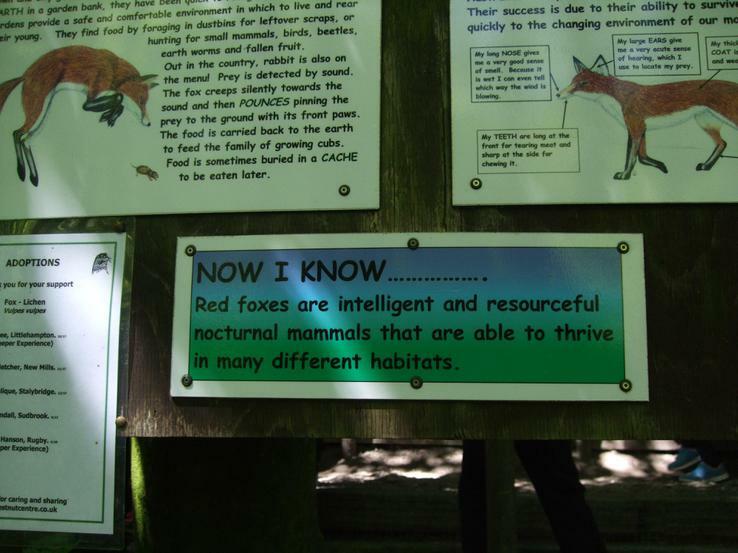 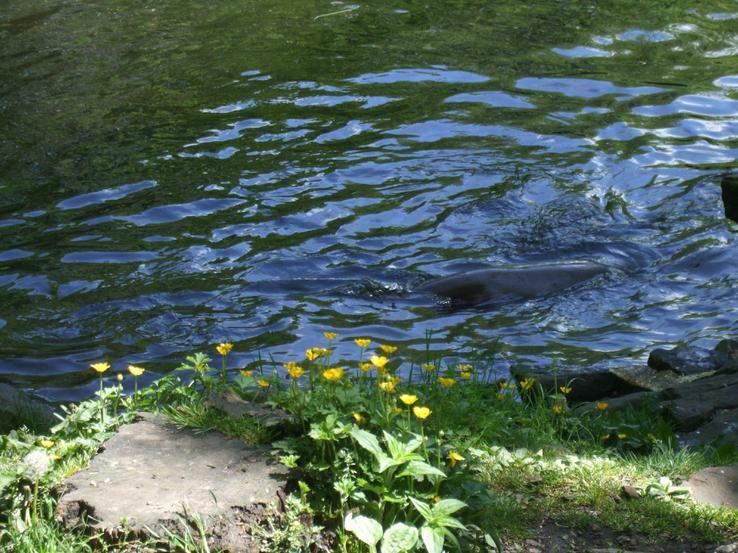 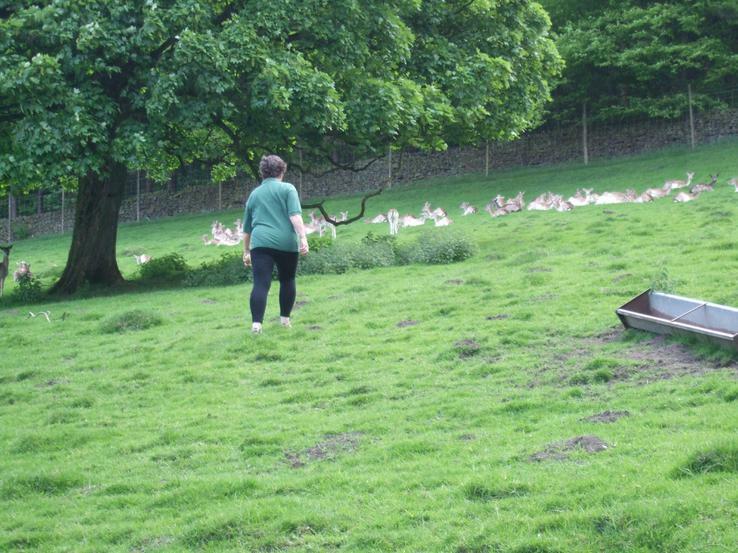 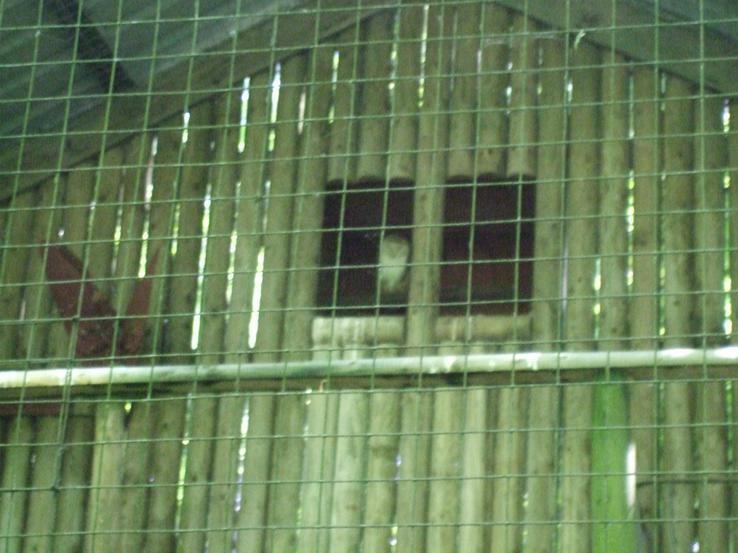 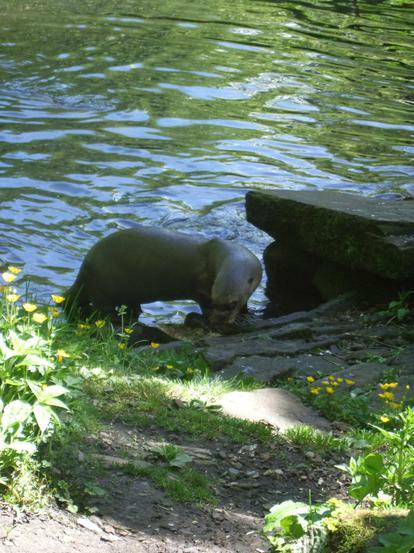 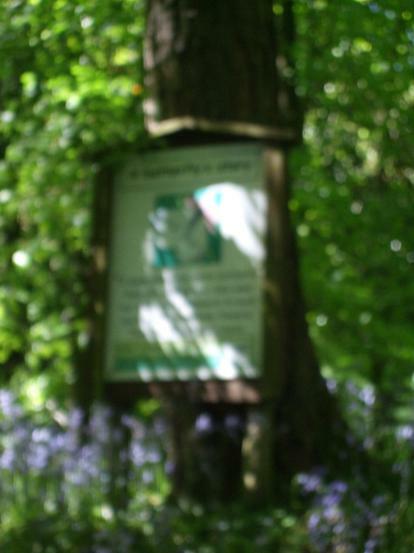 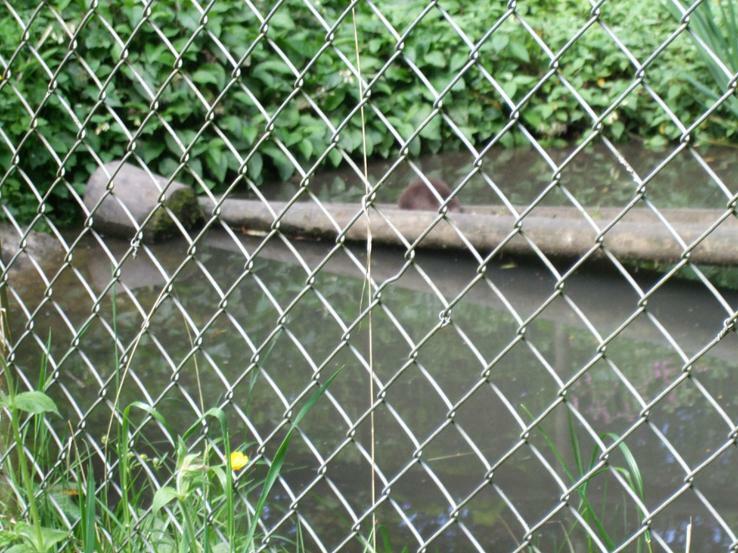 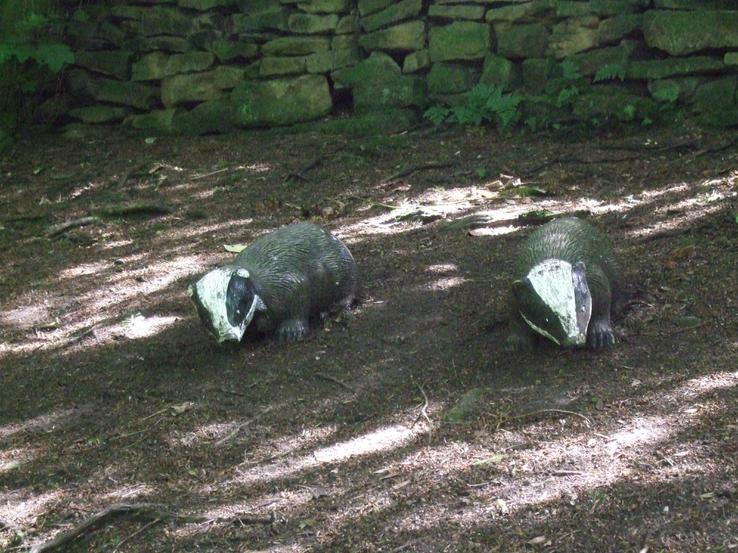 The chestnut centre, otter and owl wildlife park. 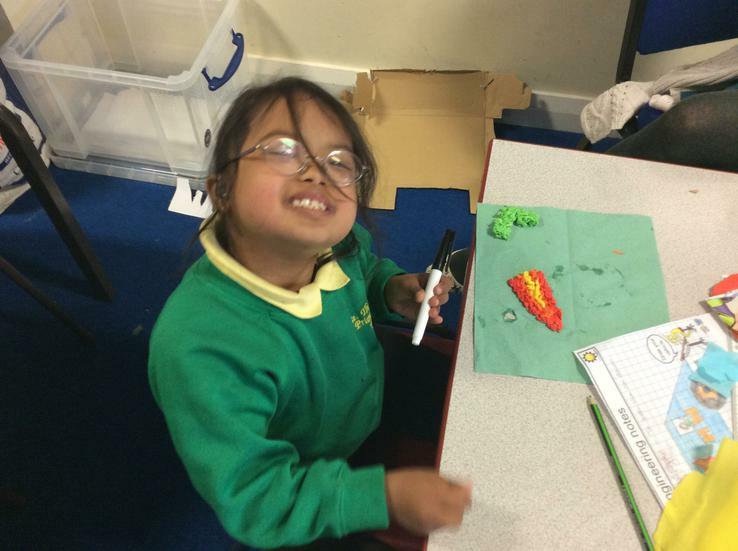 Have a look at where we are going! 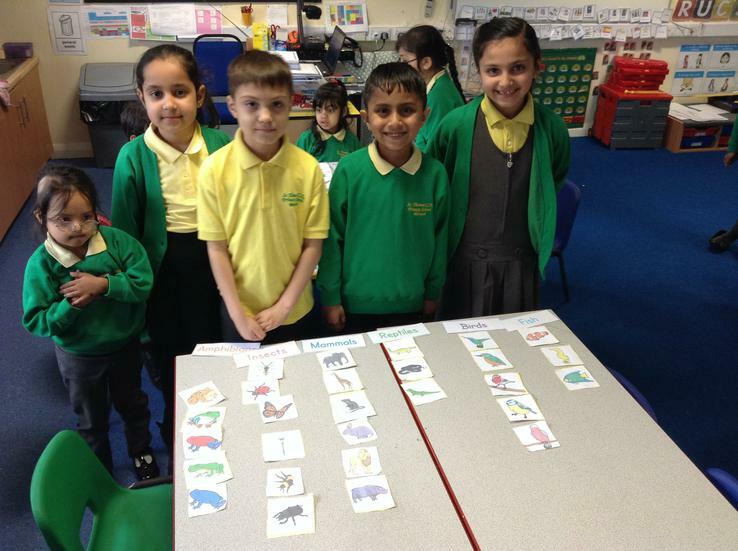 Collecting tallies about our favourite animals! 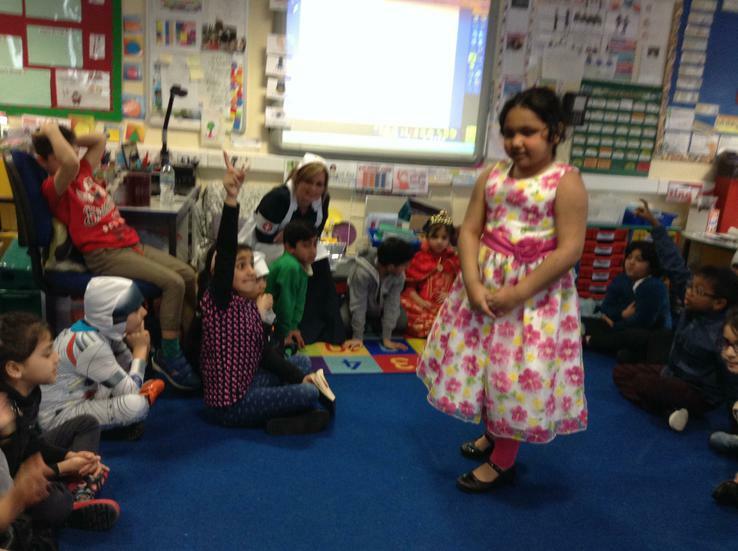 Miss Grace visited 2JW to teach us all about drama and improvisation. 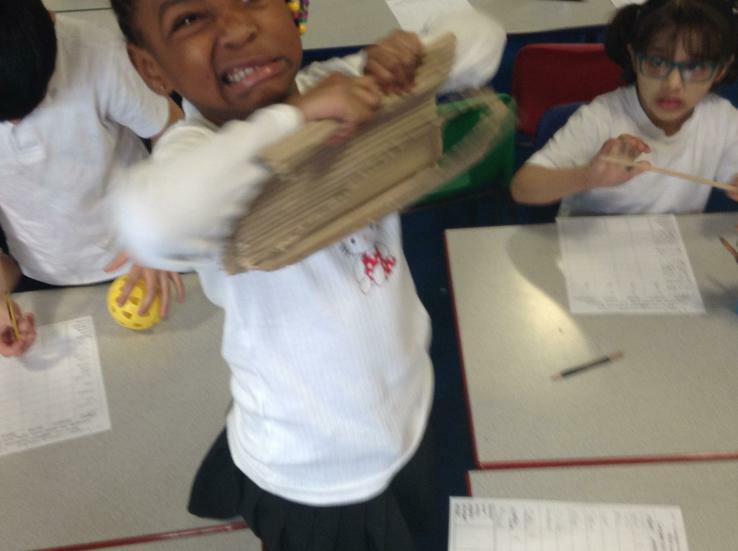 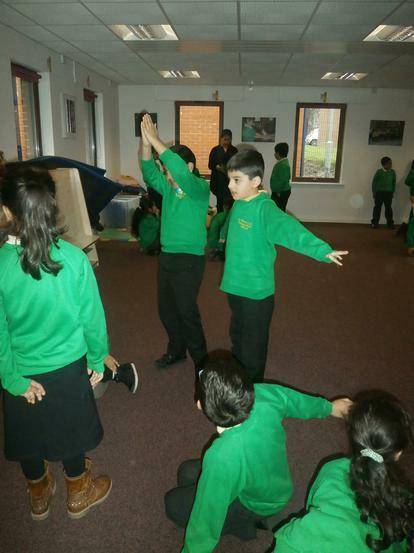 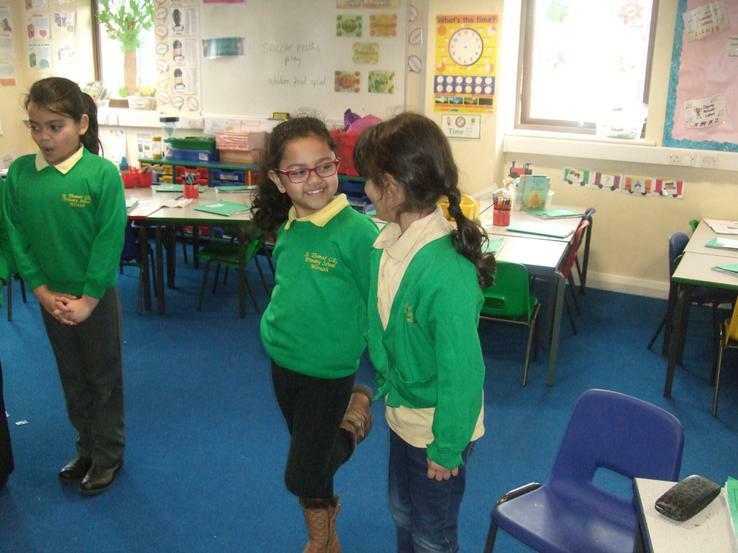 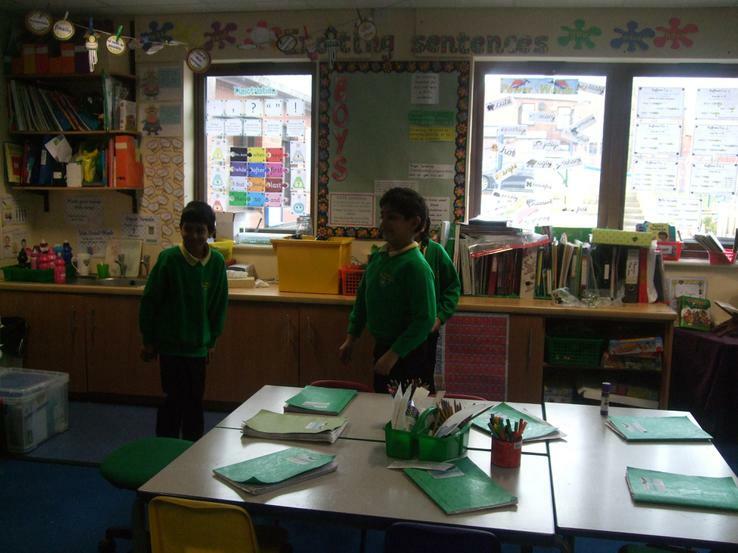 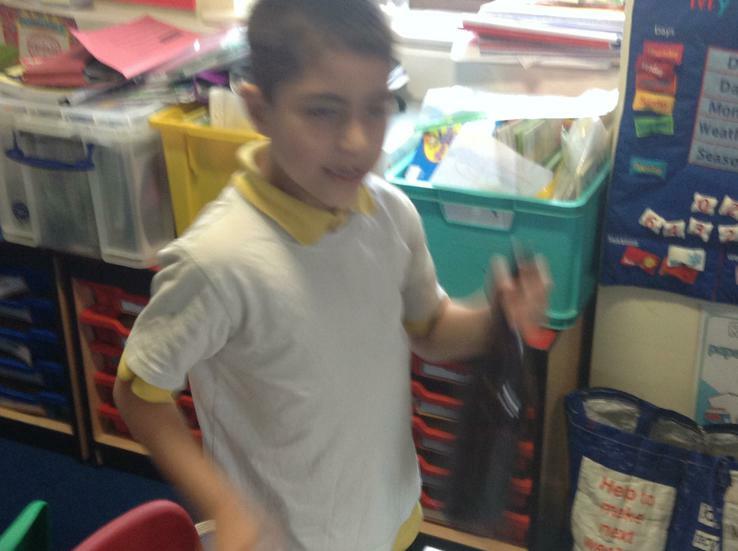 We had to create freeze frames from traditional tale stories. 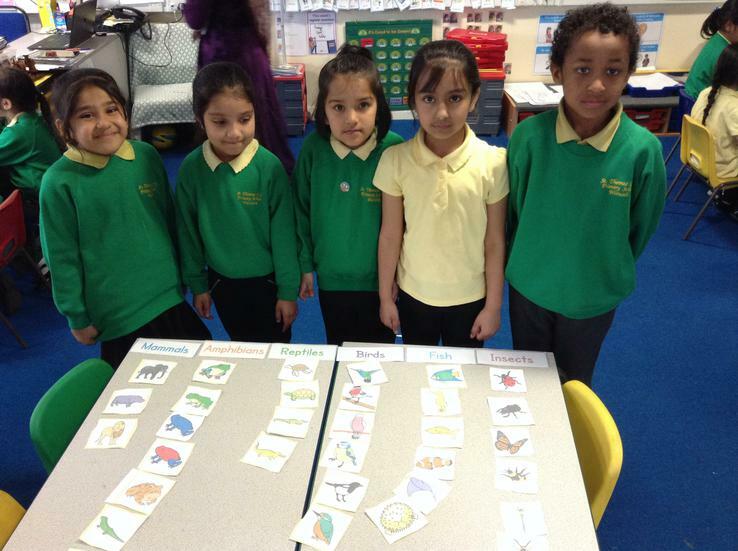 Can you guess which story we have picked? 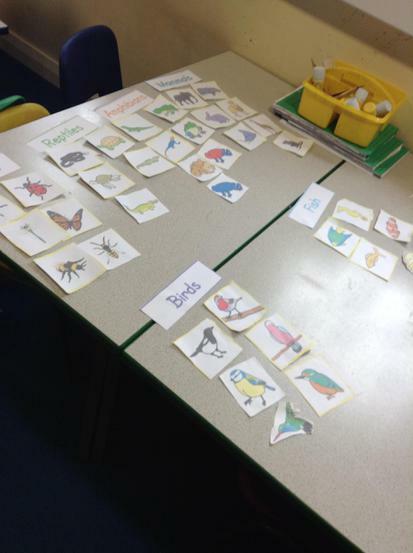 We had to sort animals into different groups according to their characteristics. 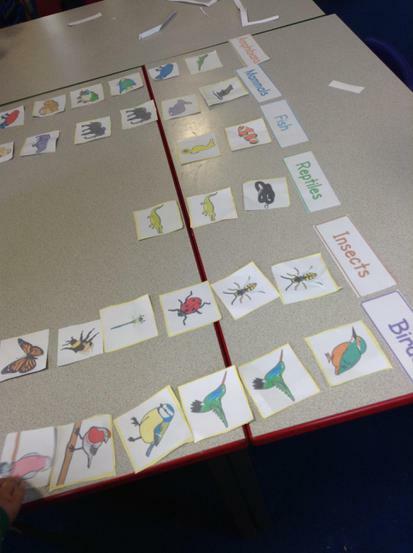 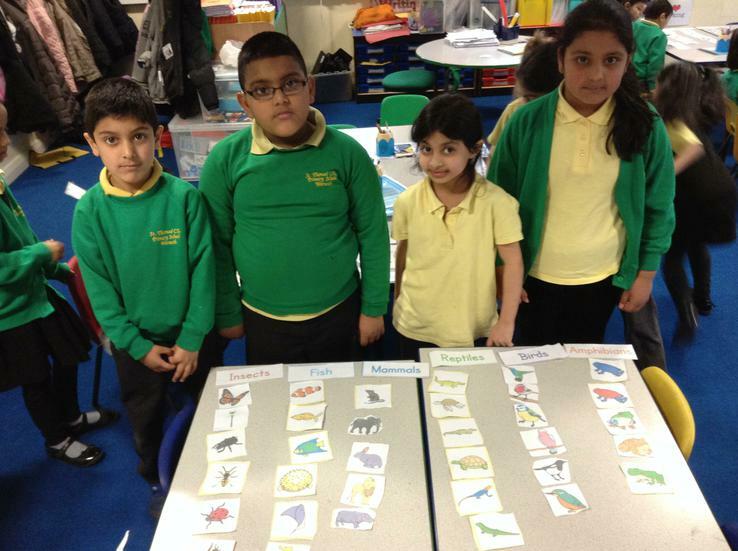 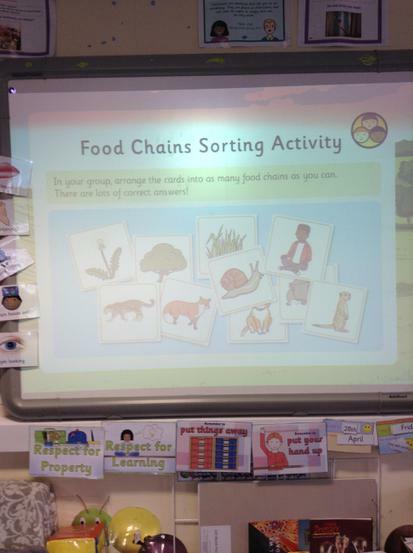 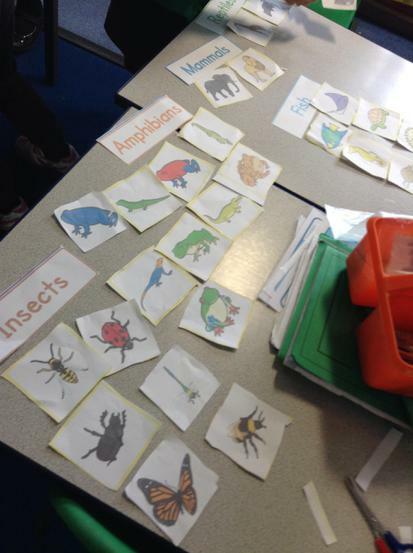 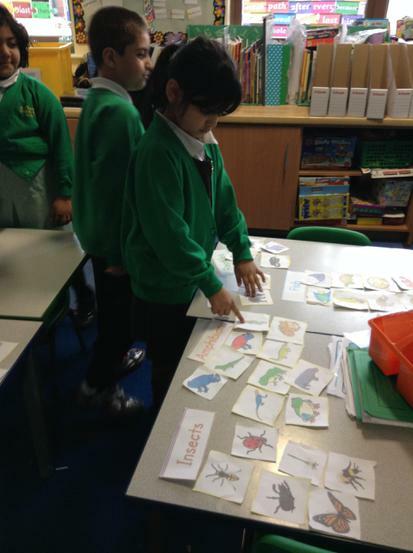 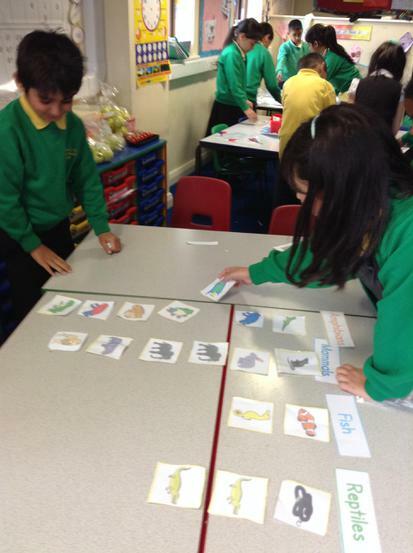 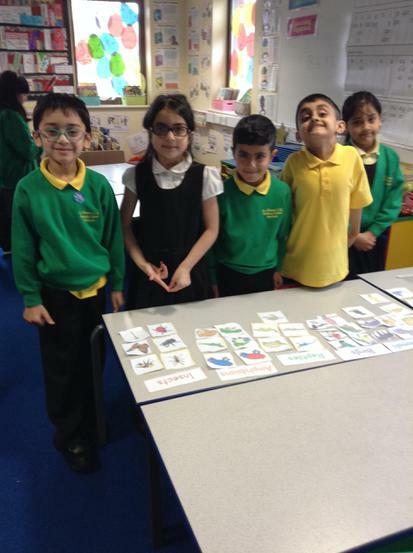 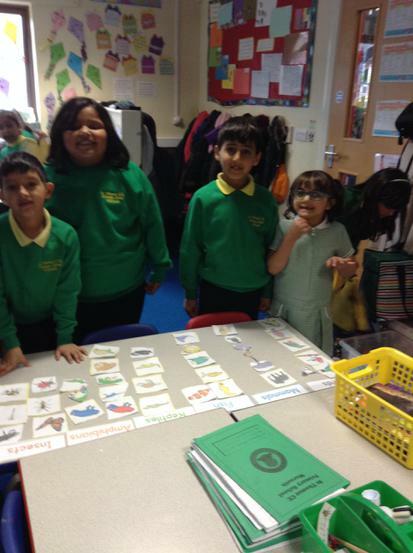 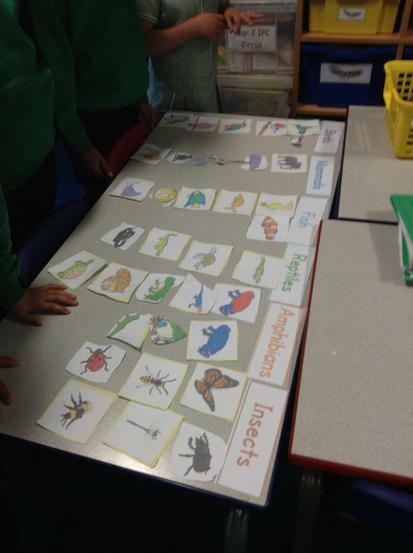 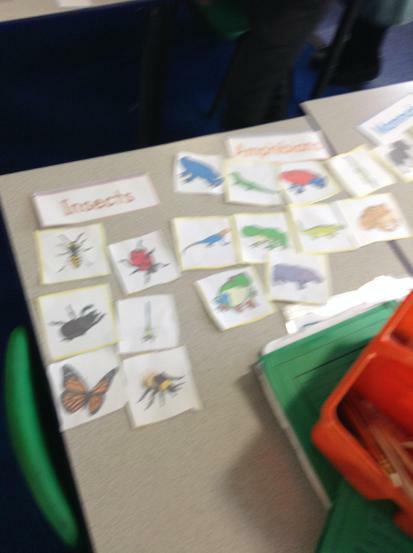 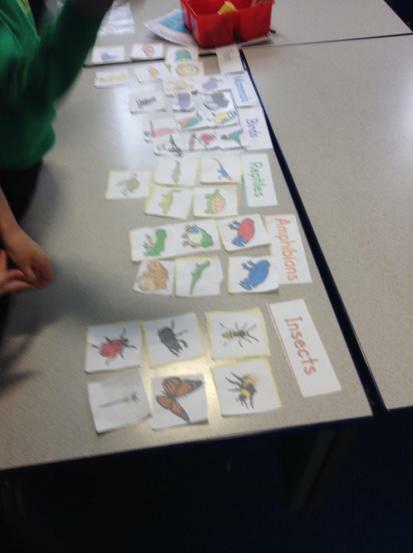 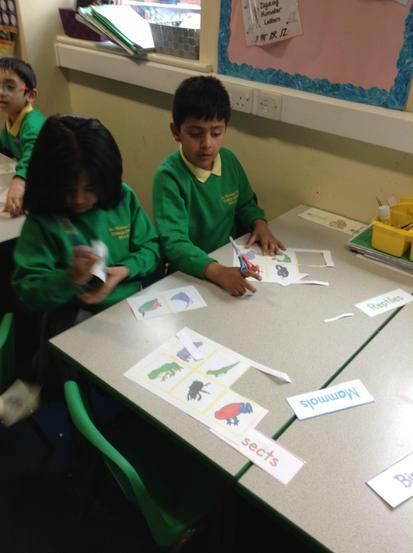 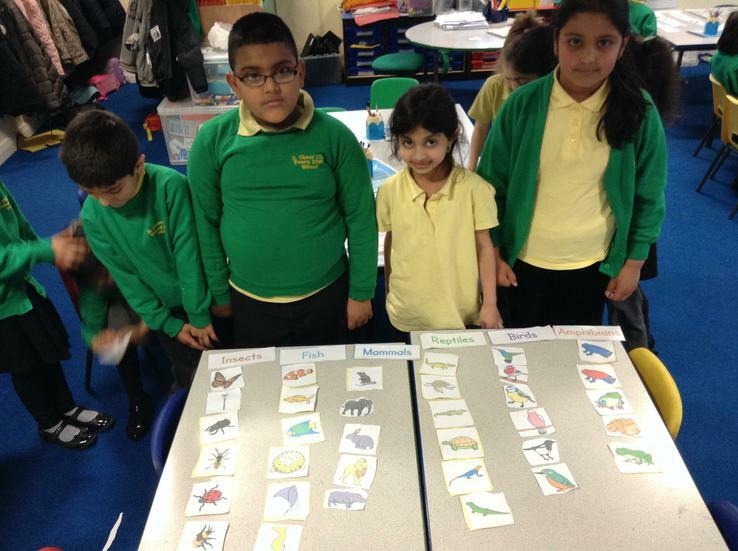 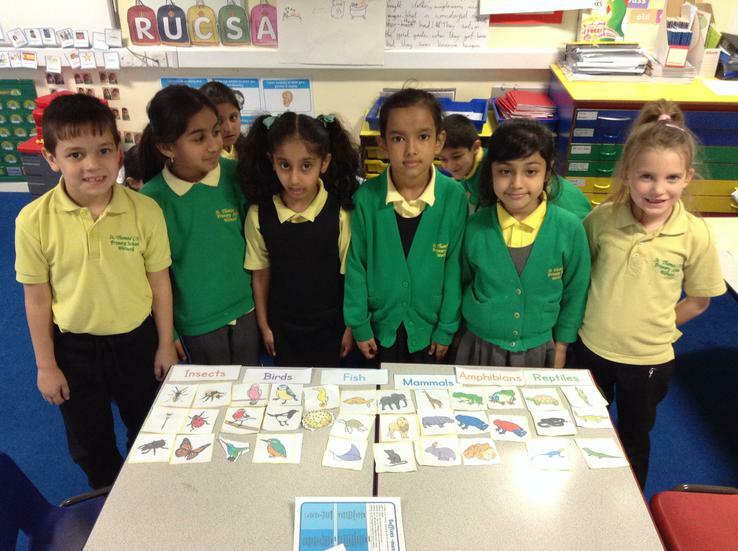 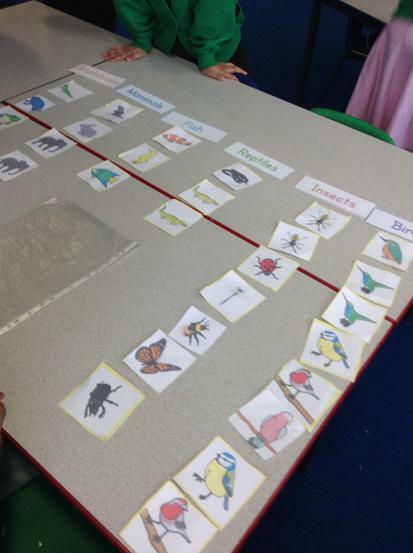 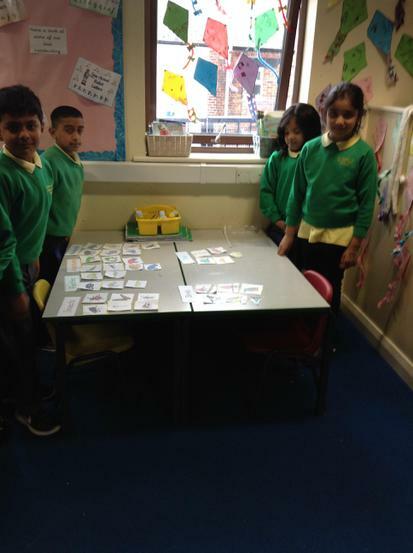 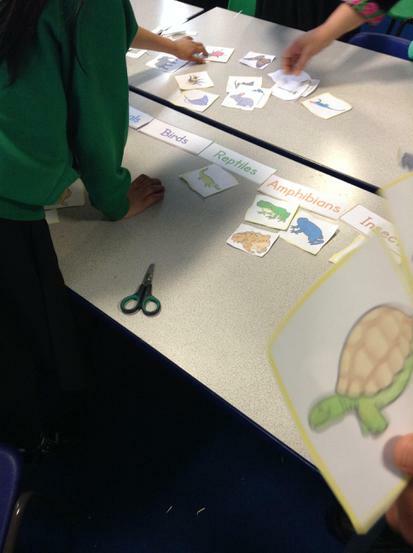 We worked together as a team to sort the animals. 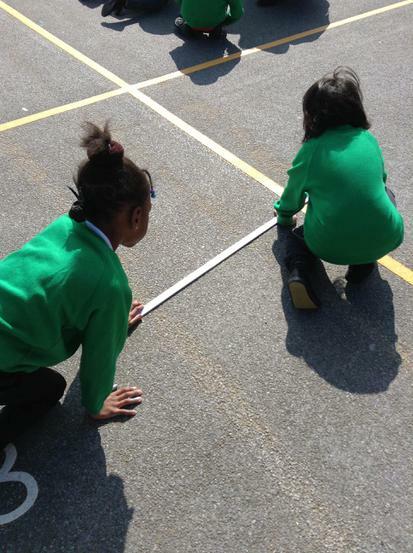 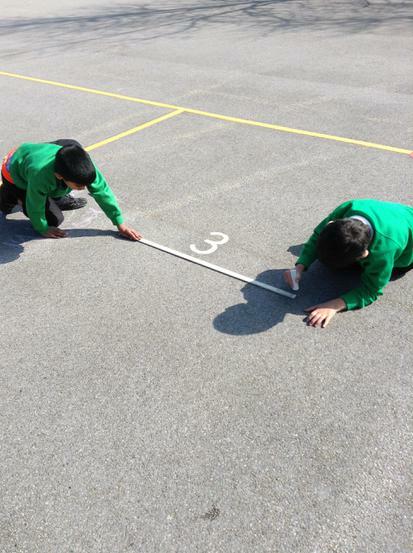 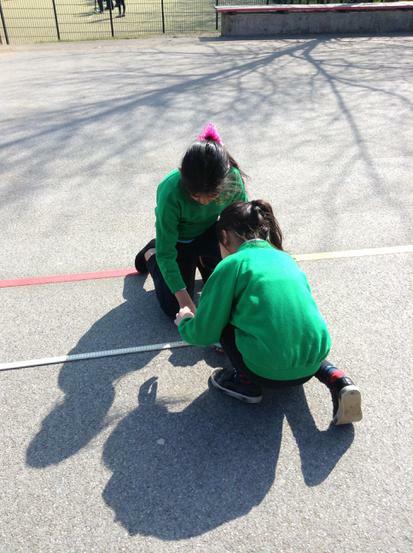 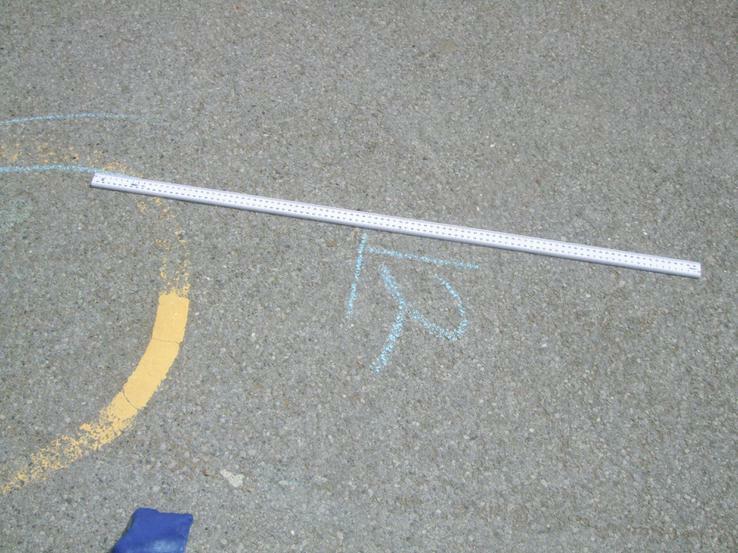 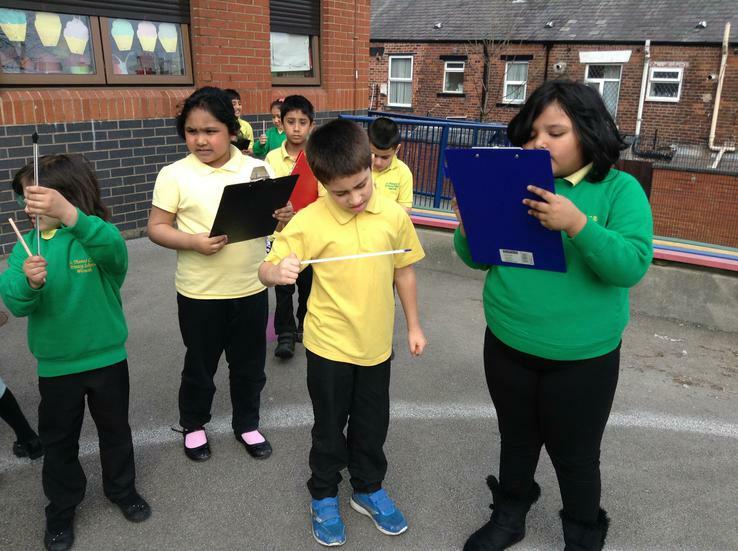 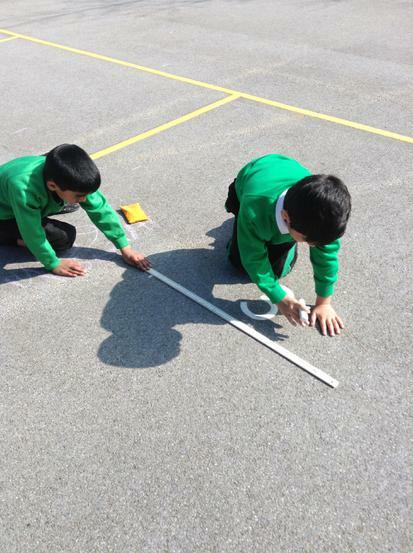 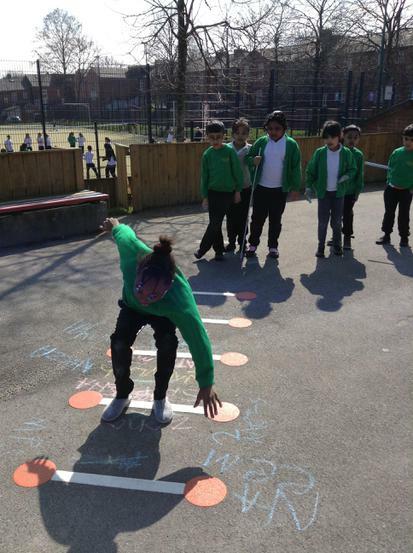 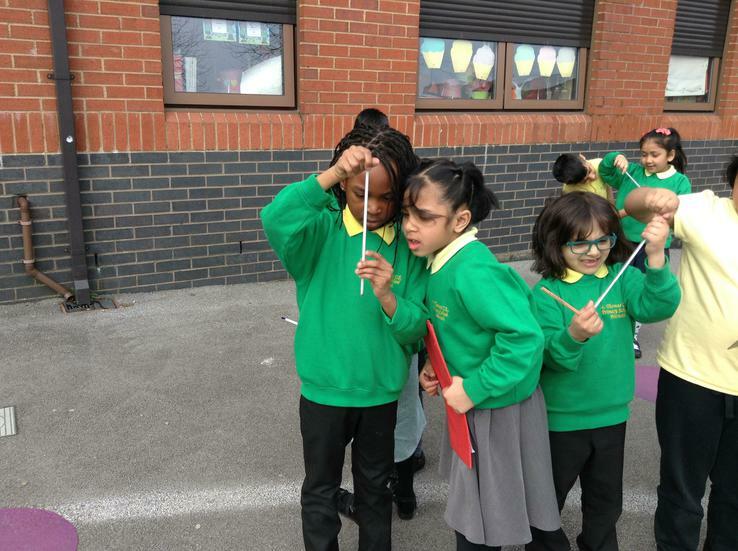 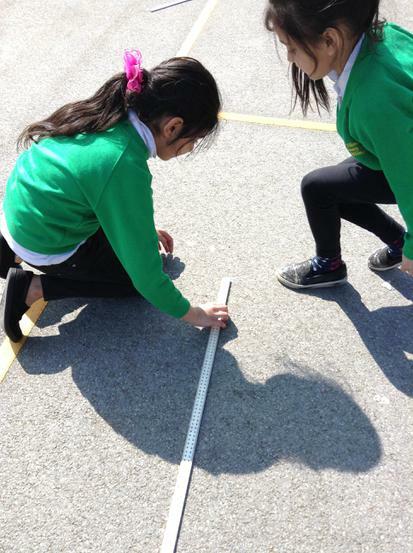 We made use of the fantastic weather and took our learning outside to measure using cm and m. We measured how far we can jump and throw a beanbag. 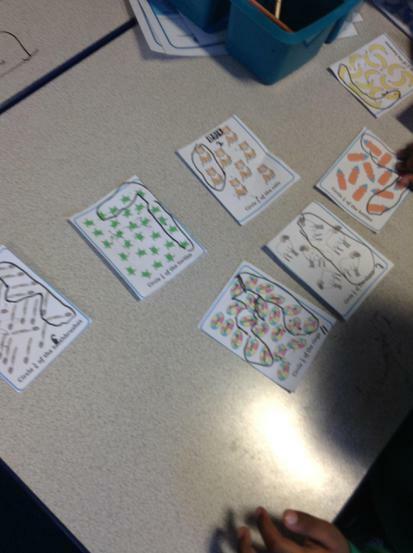 We had lots of fun and we are going to be reading different types of scales all week!! 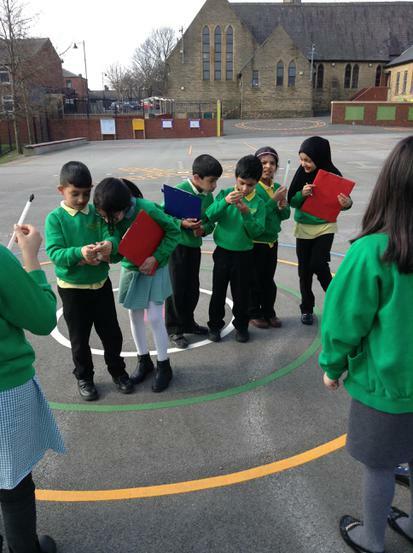 Measuring the temperature around St Thomas! 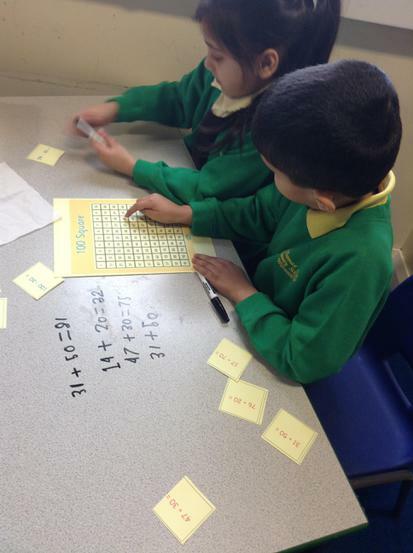 Adding multiples of 10 to a 2 digit number! 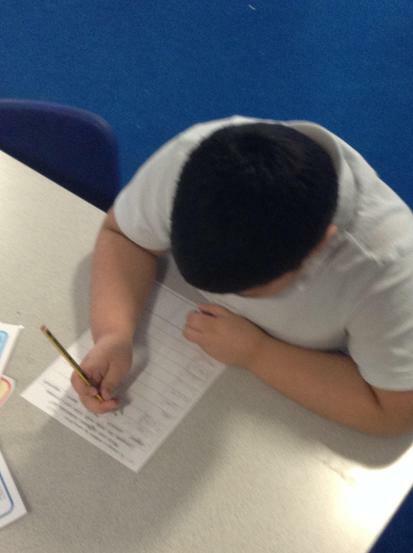 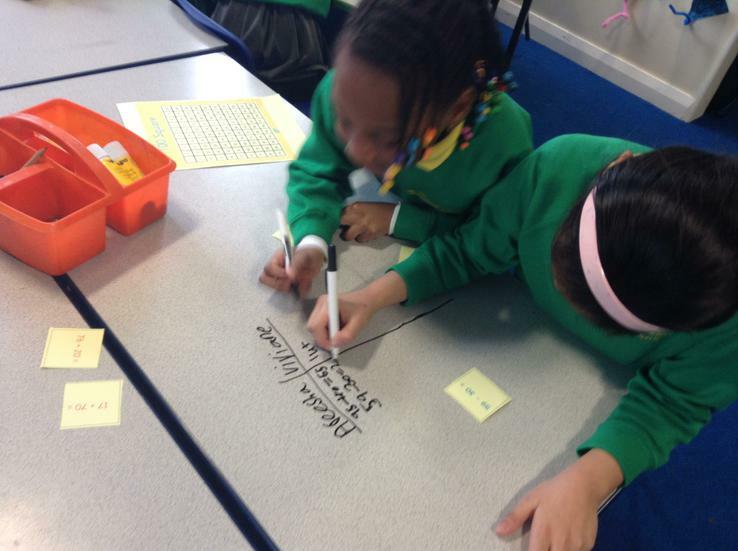 Writing lists for our pancake toppings and eating delicious, tasty pancakes on Shrove Tuesday! 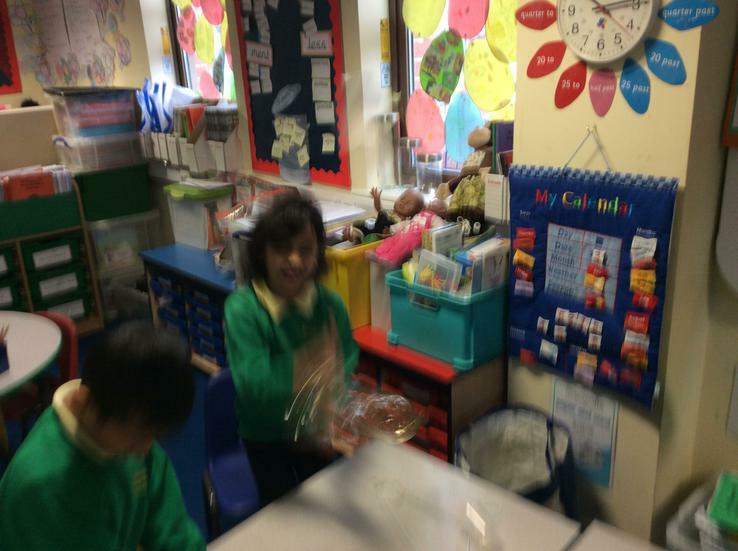 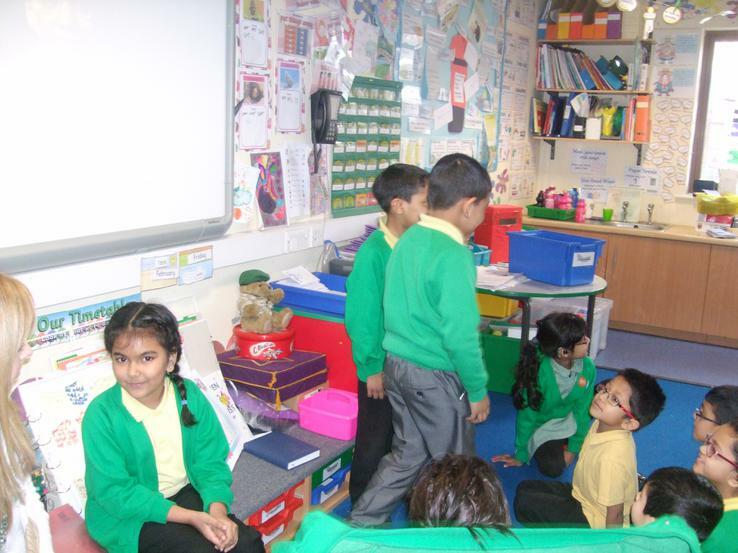 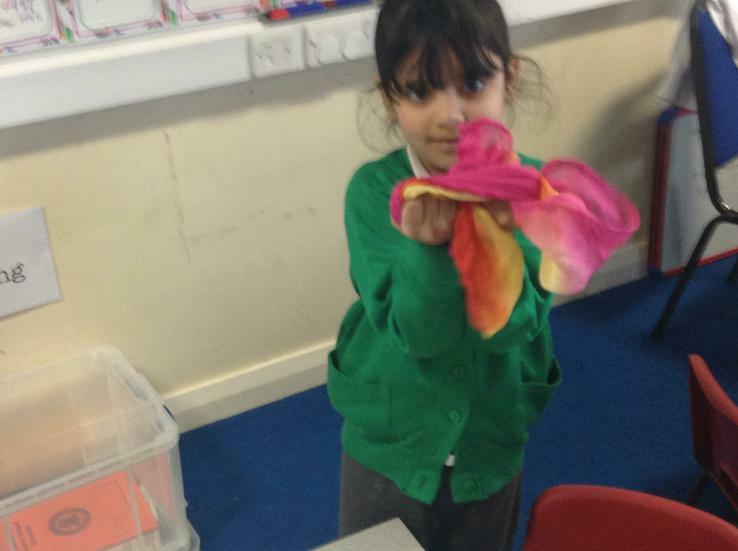 As part of our new topic the children brought in their favourite toy from home to show the class and ask and answer questions. 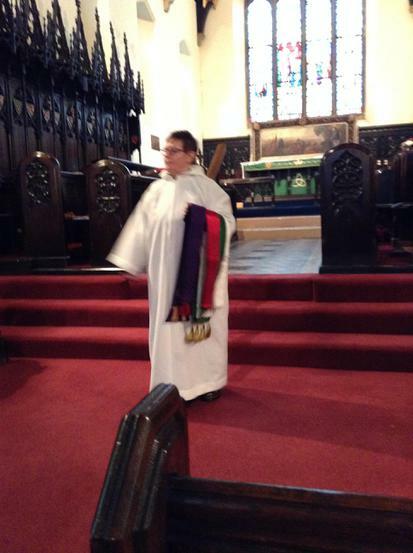 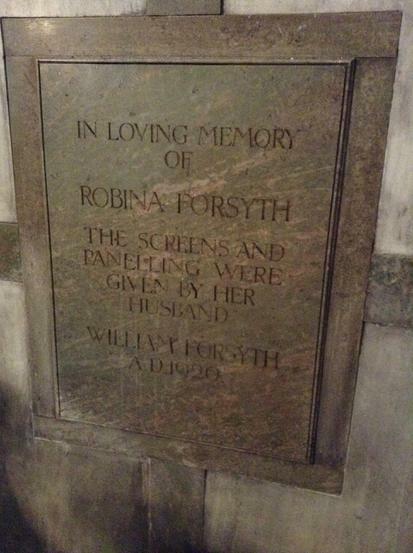 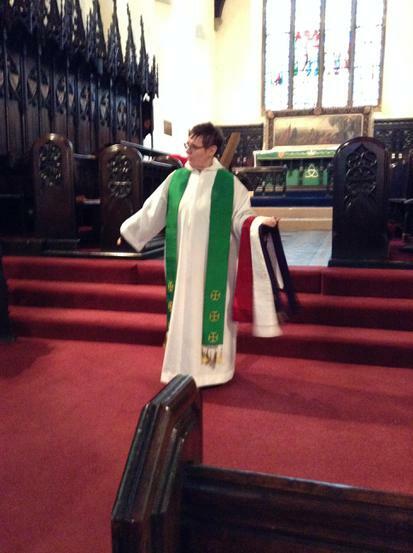 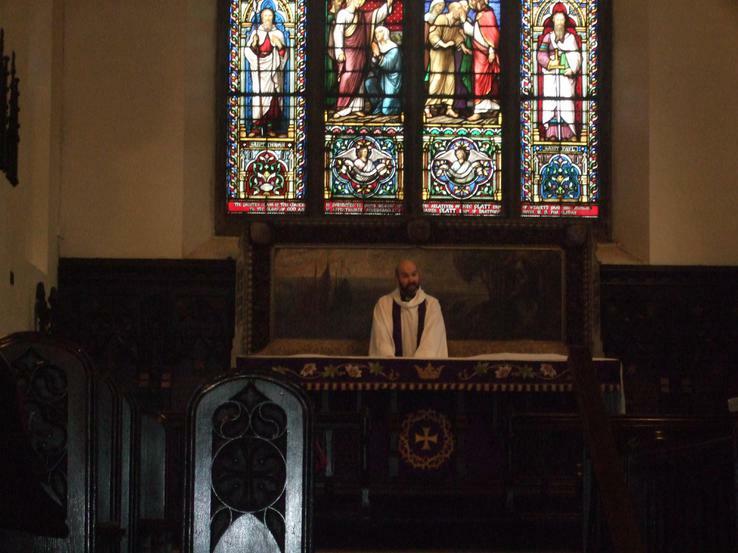 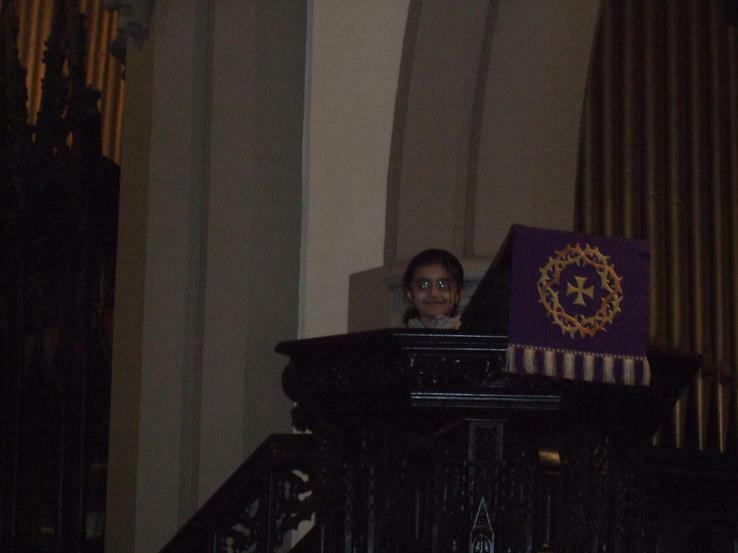 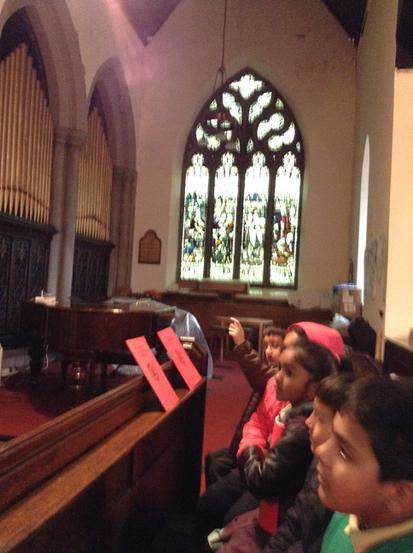 Our visit to St Thomas' Church! 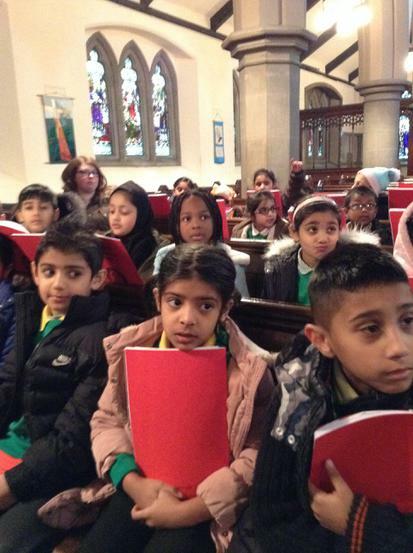 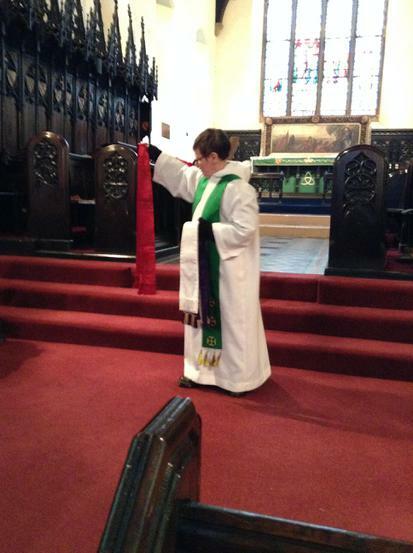 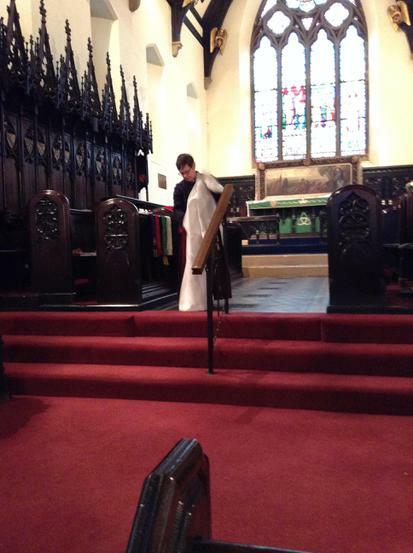 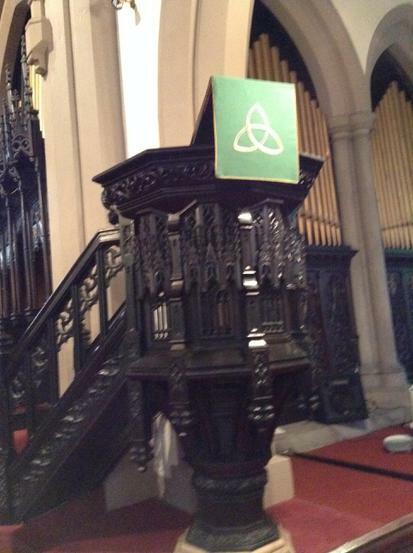 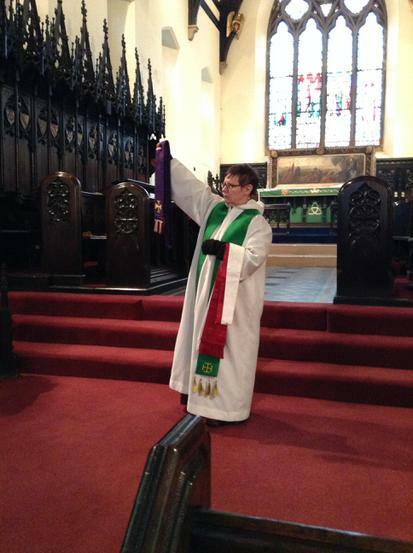 We had a great time at St Thomas' Church. 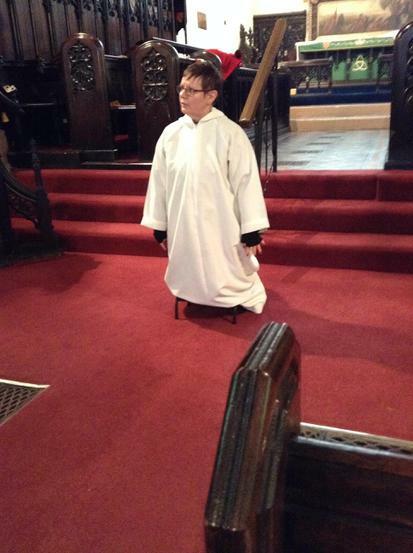 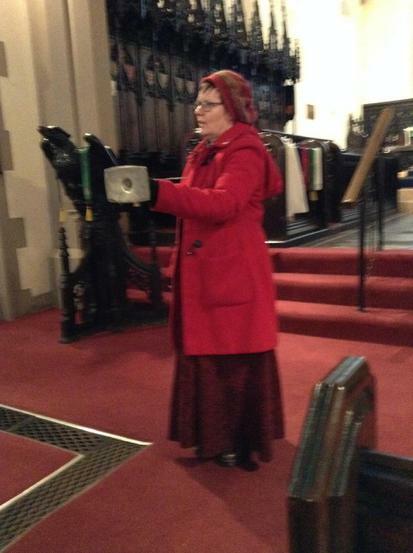 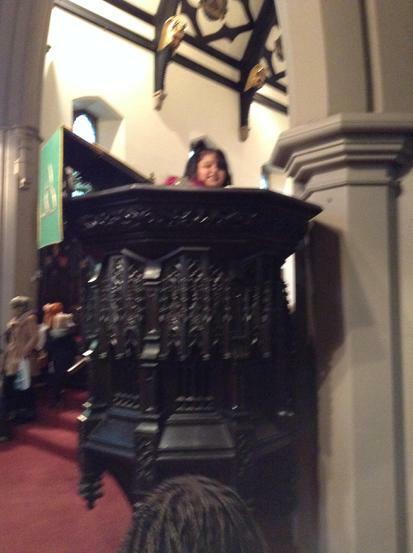 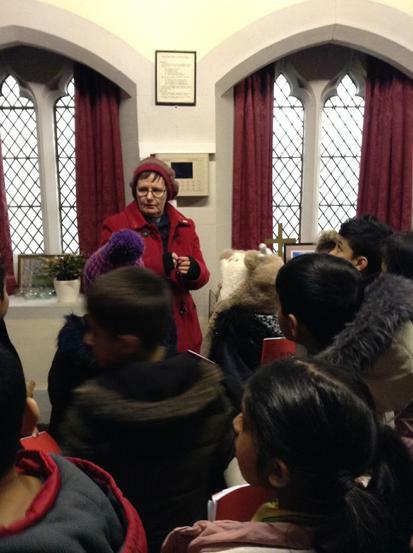 Mrs Pitman told us all about the important objects that were in the Church and what they were used for. 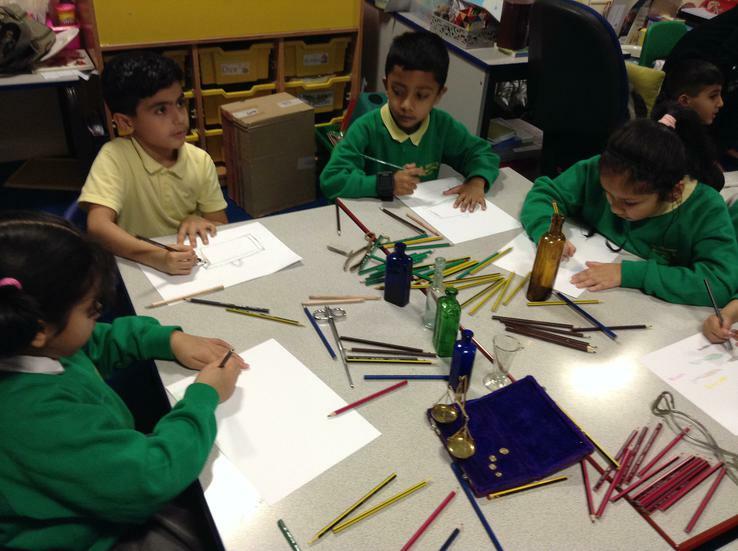 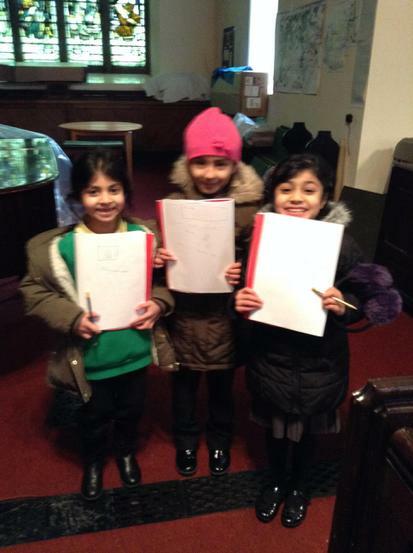 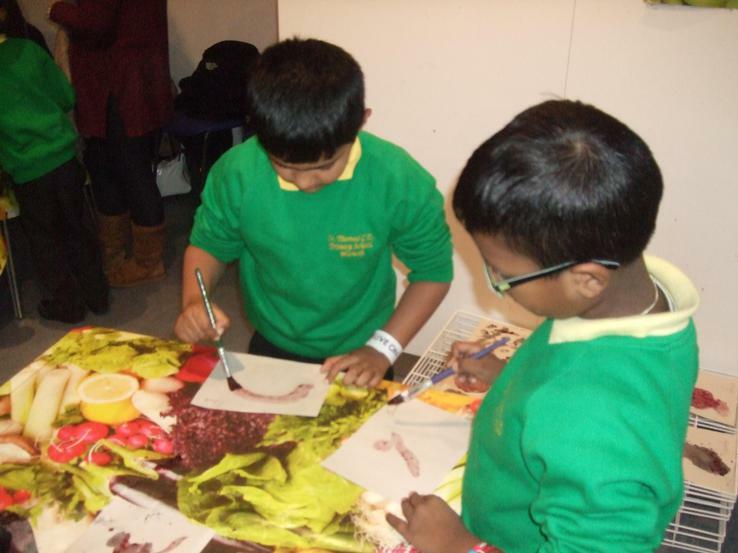 We drew some amazing sketches of what we saw! 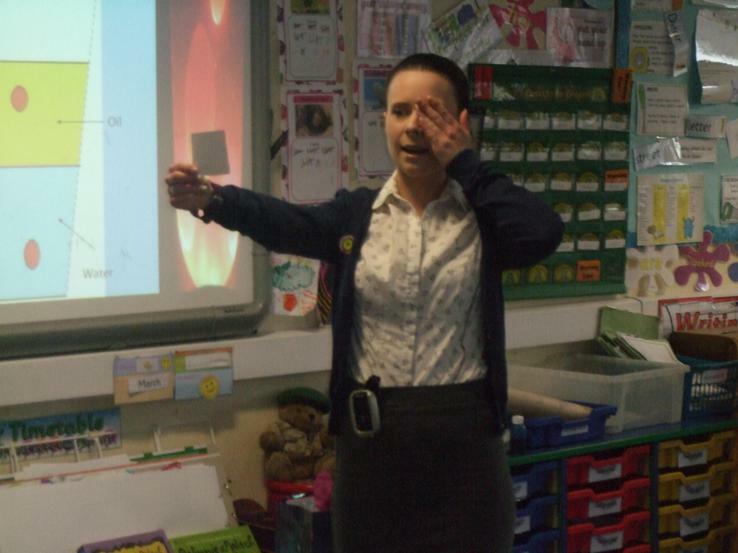 As it has been E-Safety week the children learnt all about how to stay safe on the internet and what to do if they see something that makes them upset. 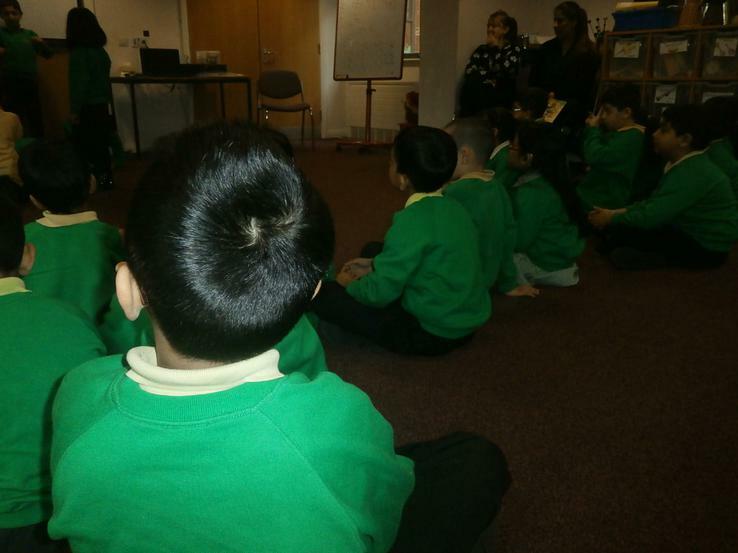 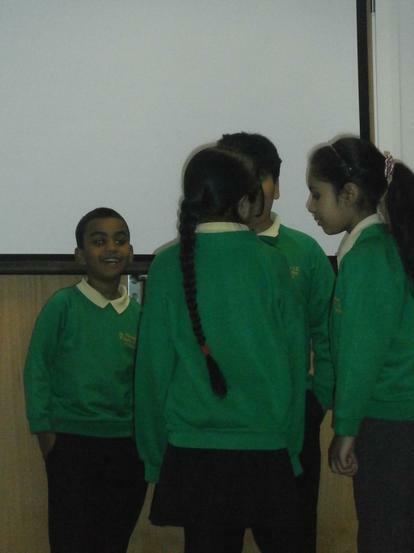 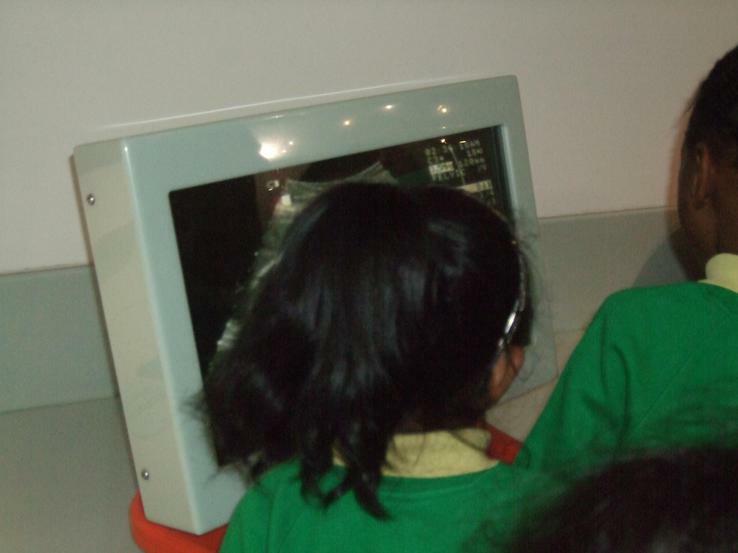 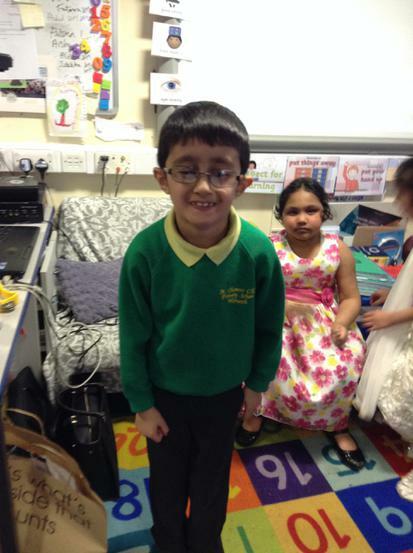 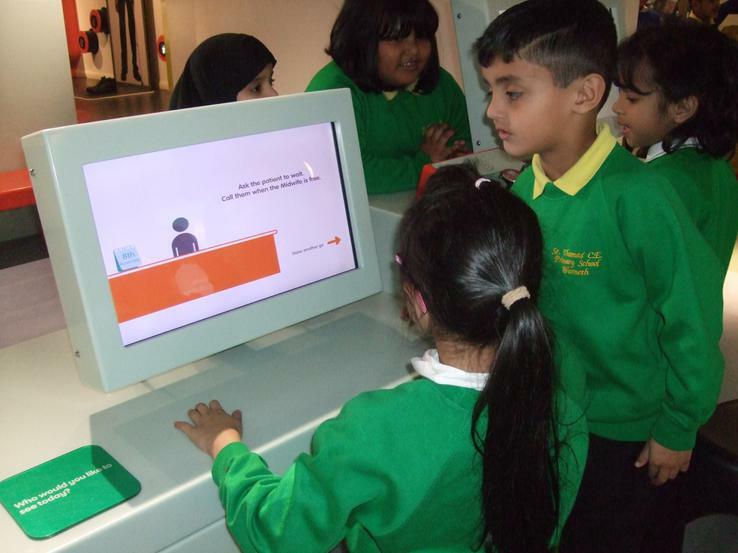 The children discussed how they would tell a trusted adult or move away from the computer or IPAD. 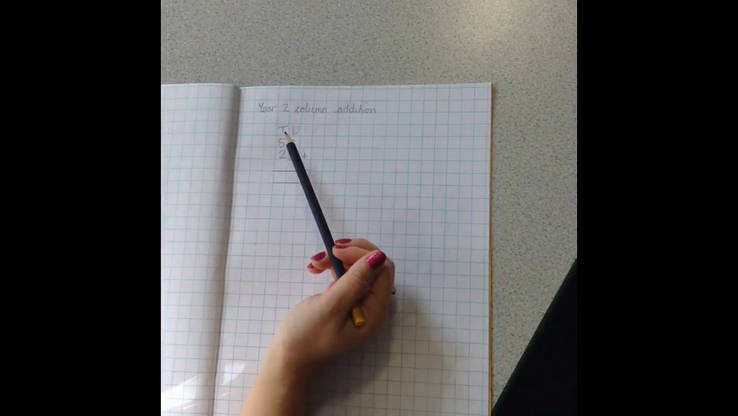 Please watch this video at home with your children and talk about what they should do in this situation. 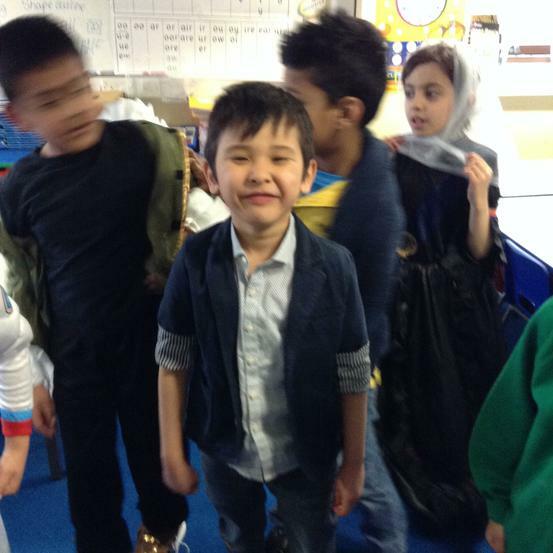 We had a fantastic party where we had to dress up as famous people. 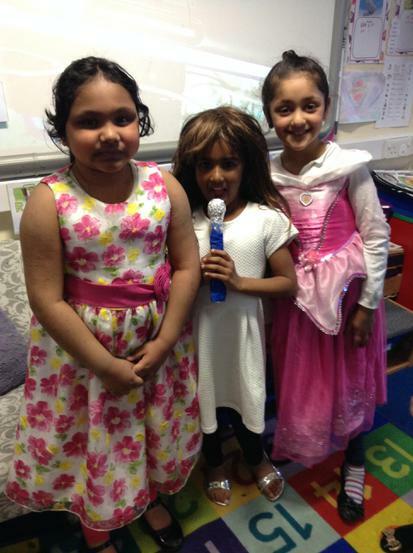 We had such a variety from footballers to queens to singers! 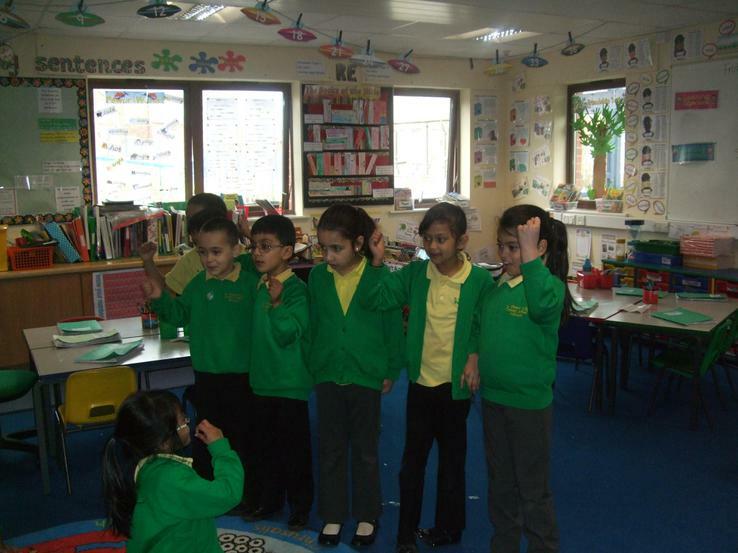 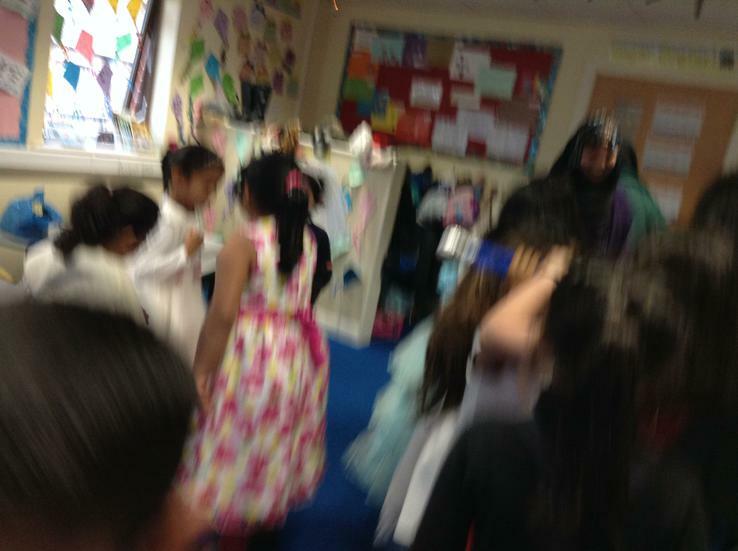 The children had to guess first who their friend was by listening to the clues and then we had lots of fun and dancing! 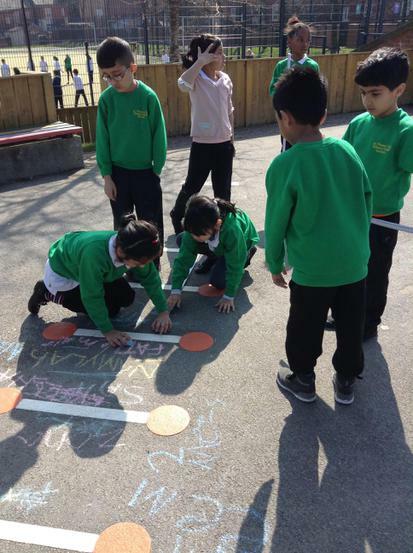 We took our learning outside to learn all about arrays! 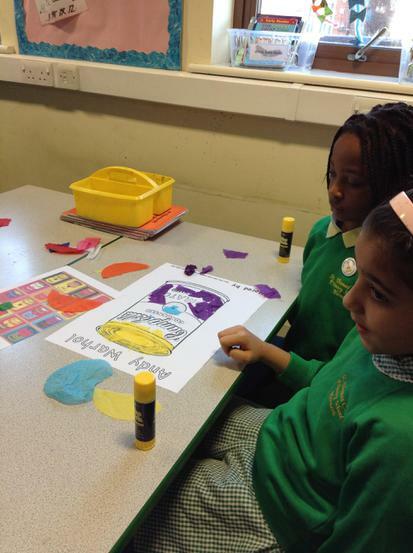 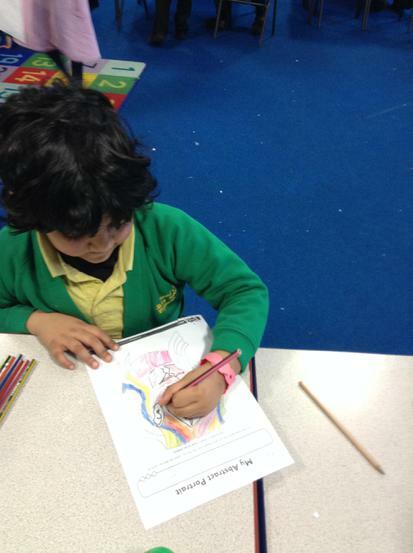 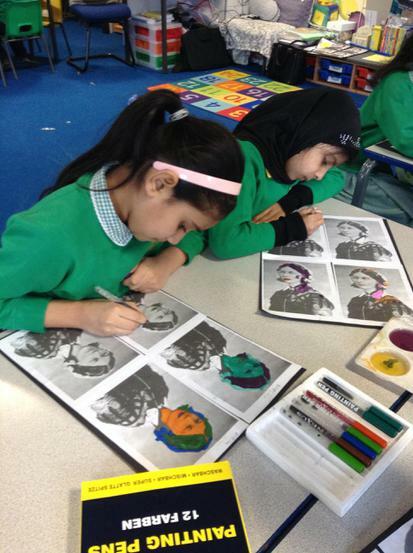 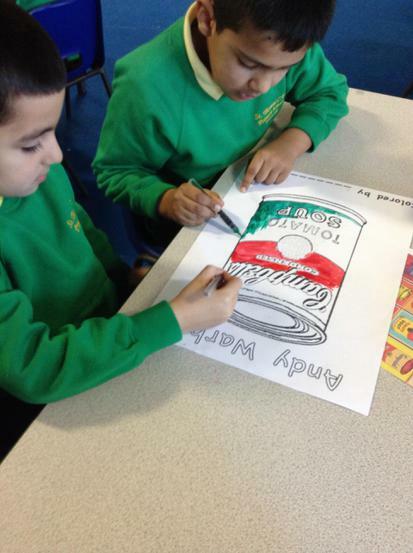 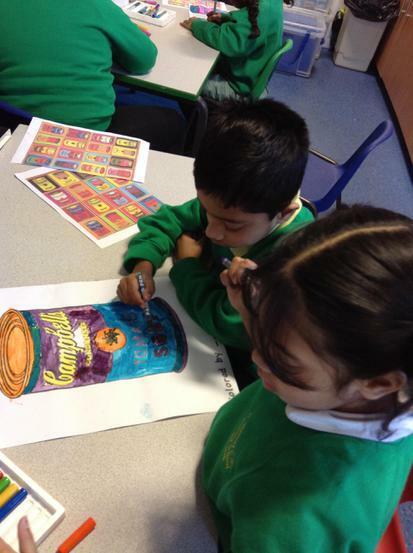 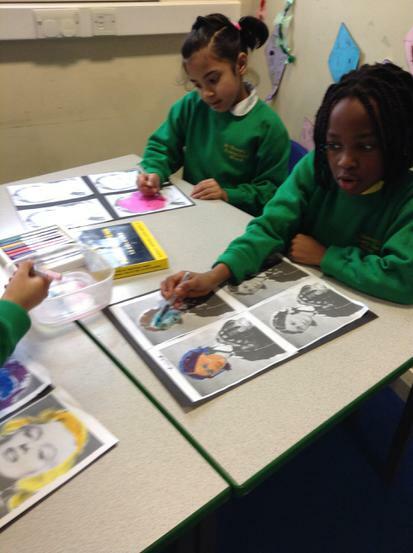 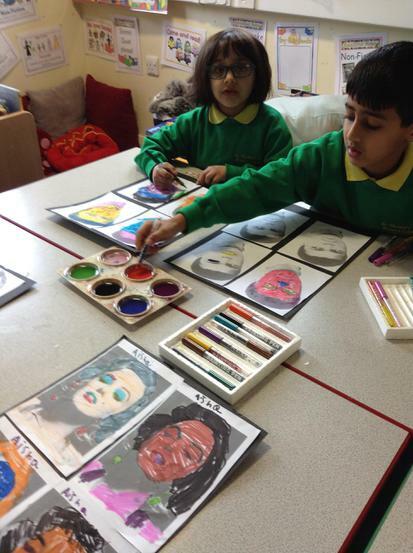 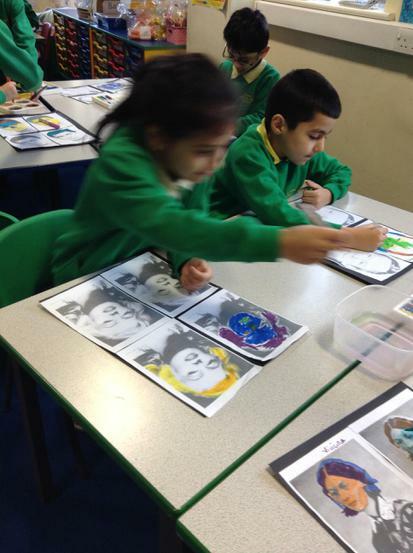 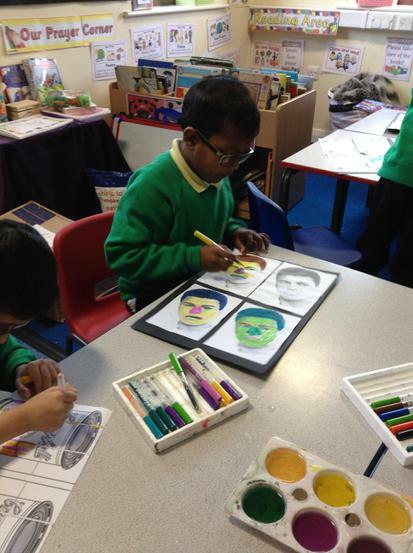 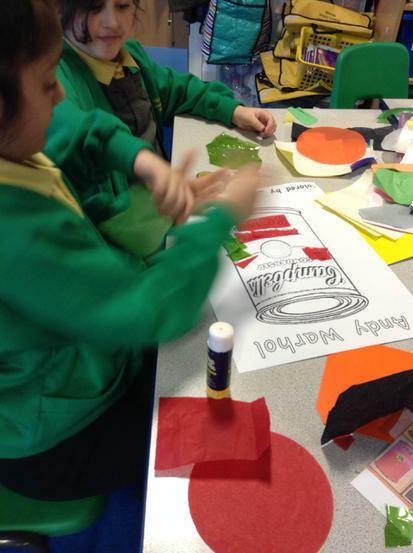 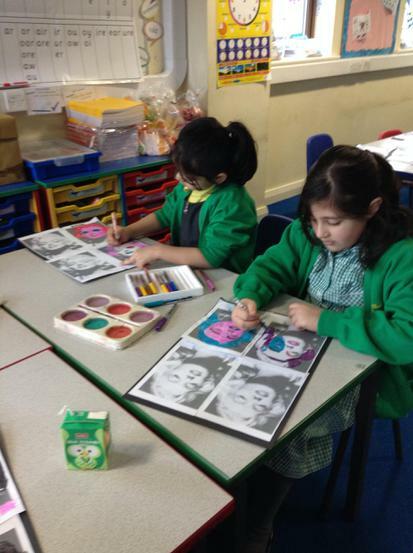 We have been learning about Andy Warhol and Pablo Picasso in Art week. 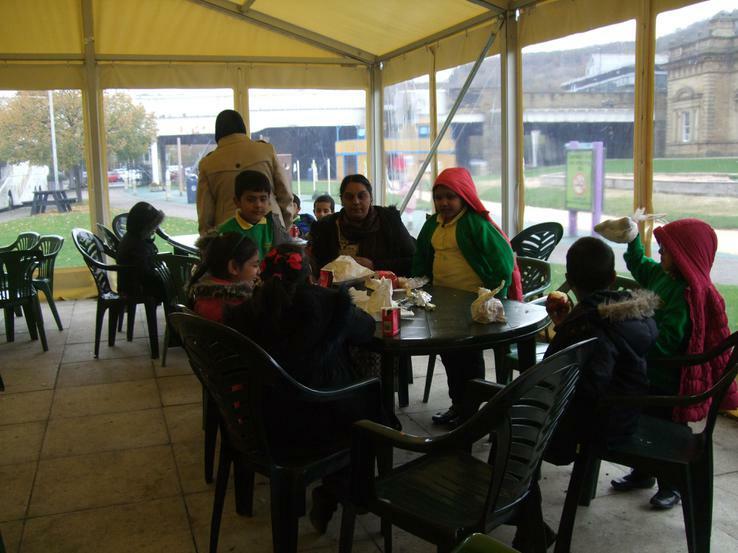 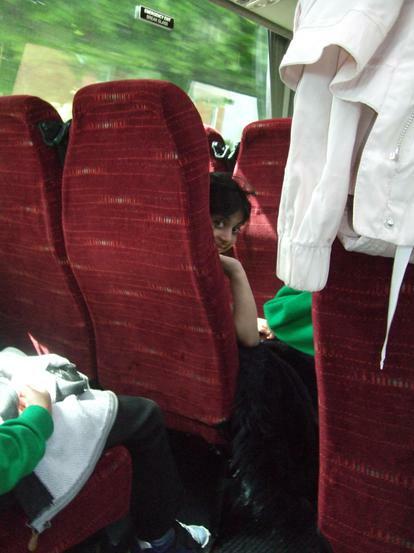 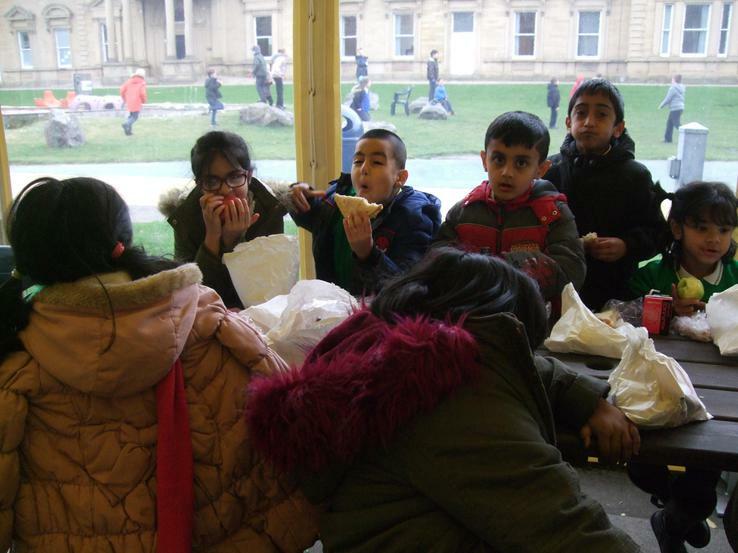 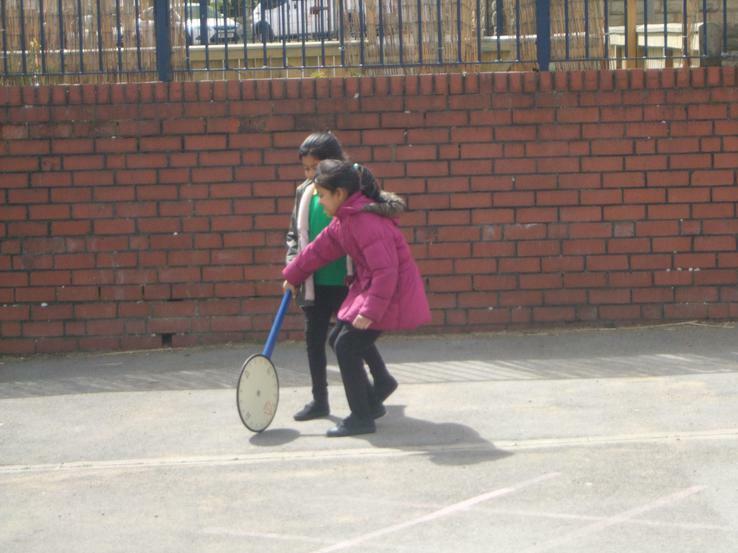 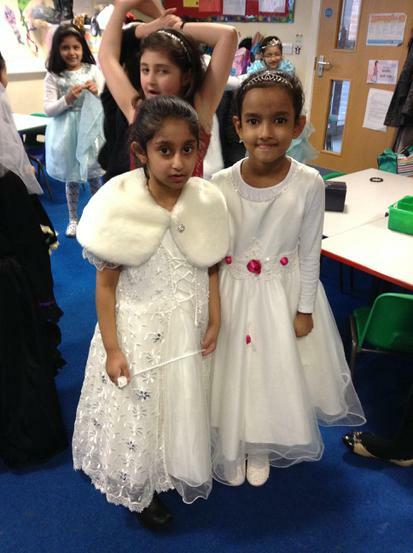 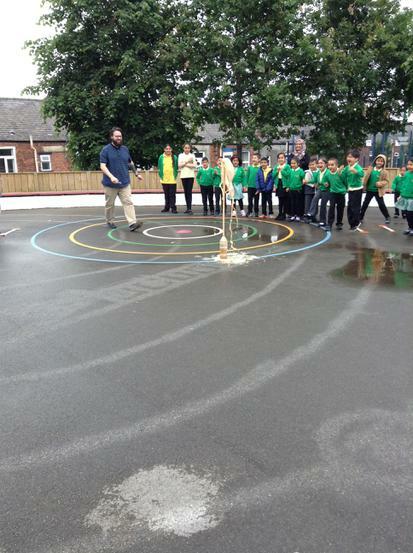 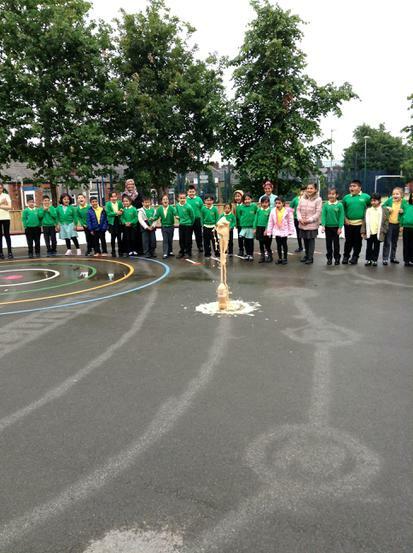 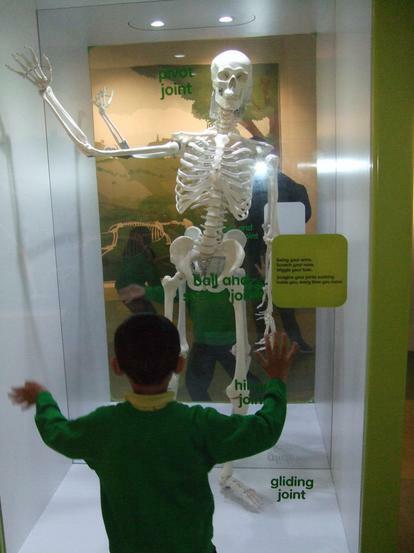 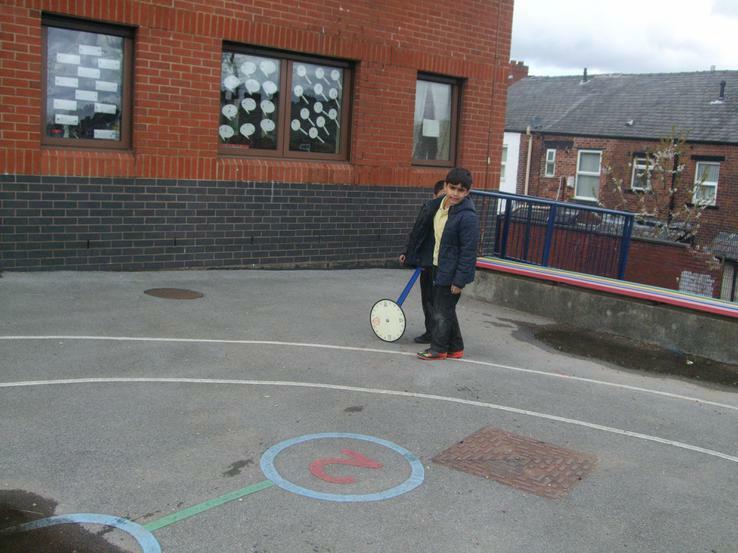 The children have enjoyed taking part in all the different activities! 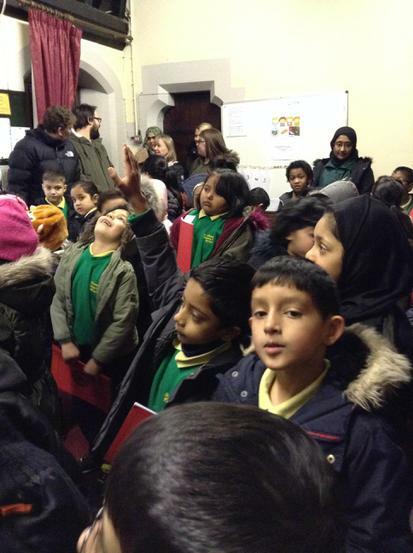 Thank you for all your support and kind words at Parents meeting. 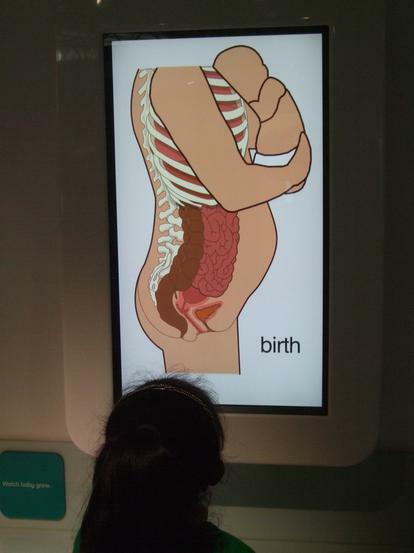 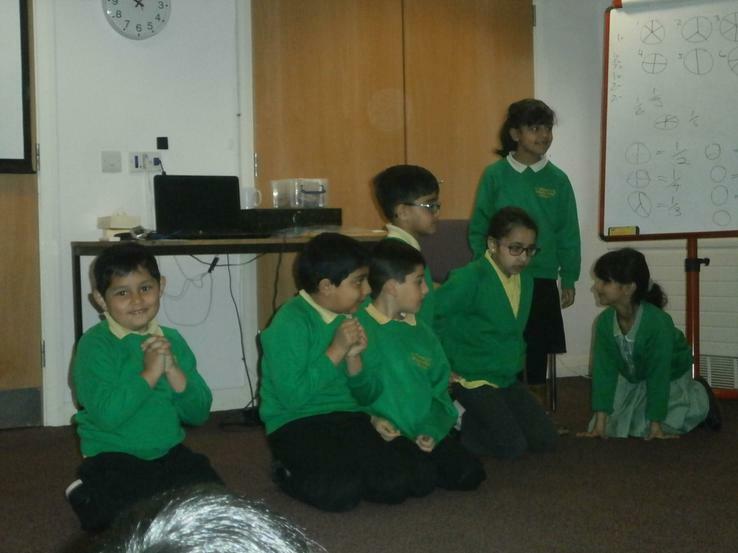 It was lovely to see you all and inform you of the progress your child is making. 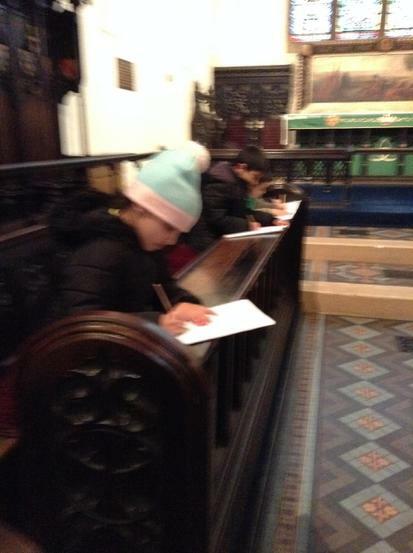 Many parents commented on how the mid term reports were useful. 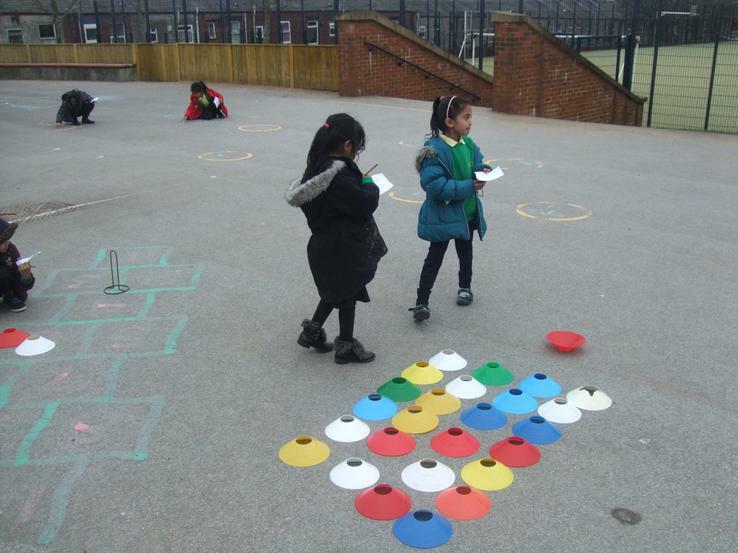 Test your multiplication skills Complete these different games to help you with your timetables!! 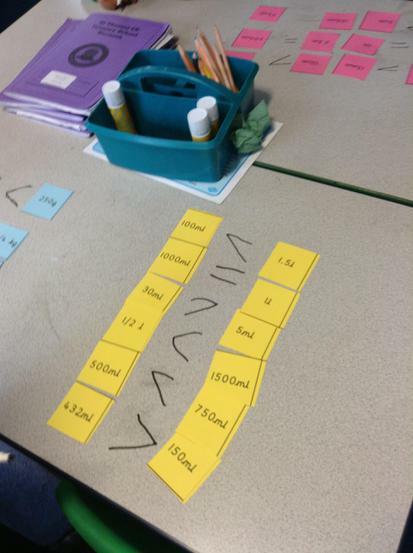 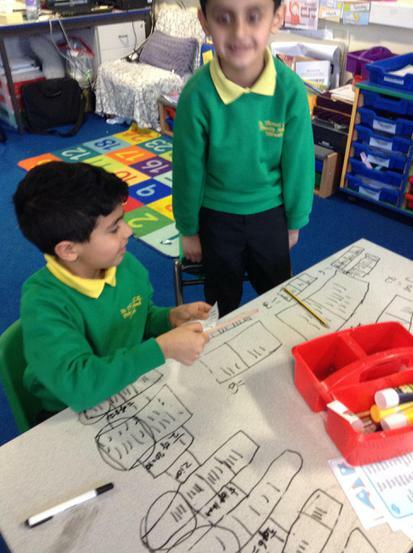 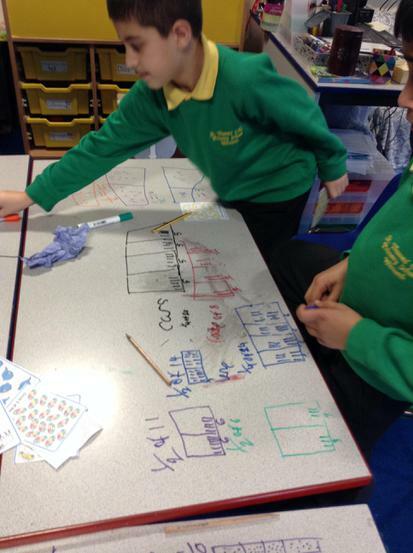 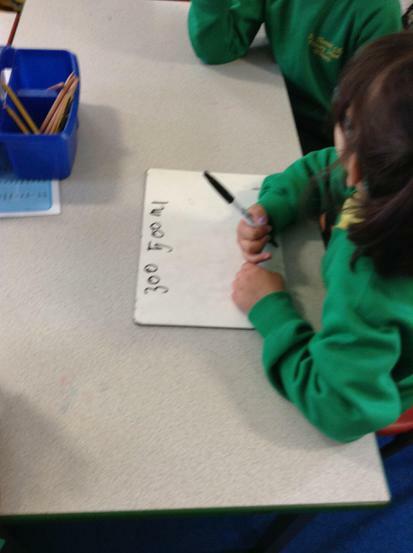 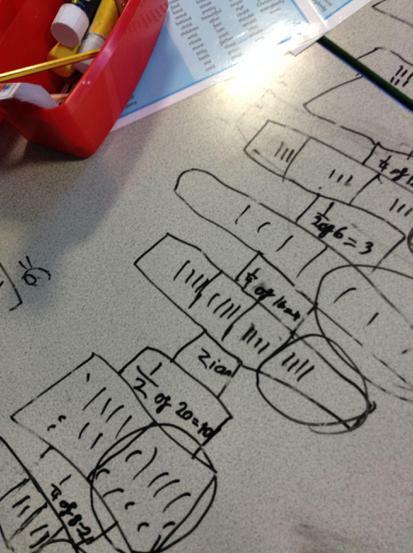 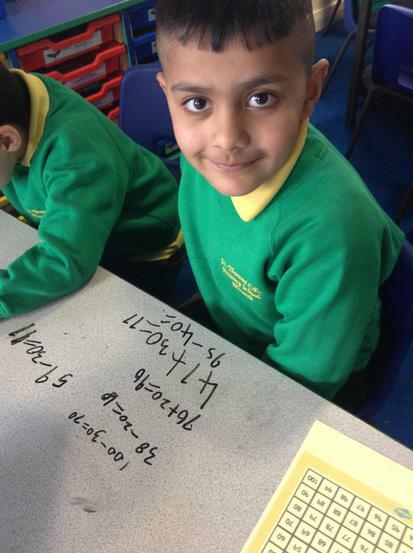 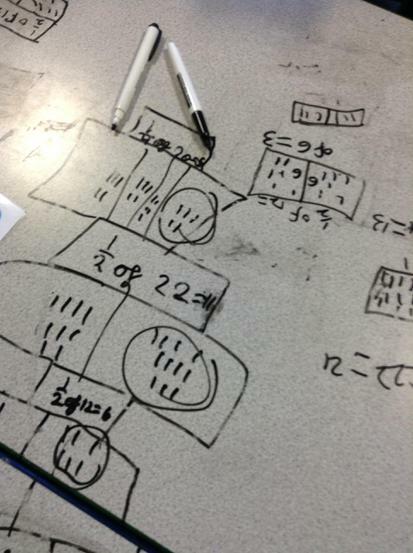 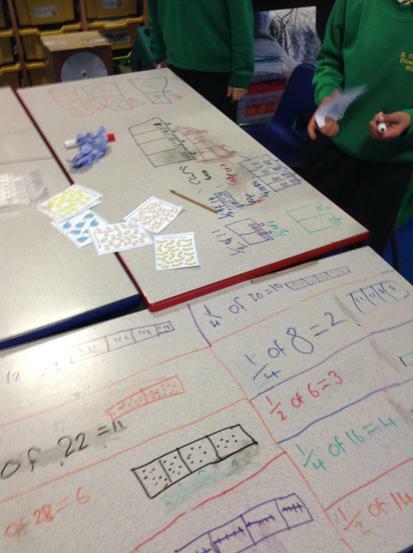 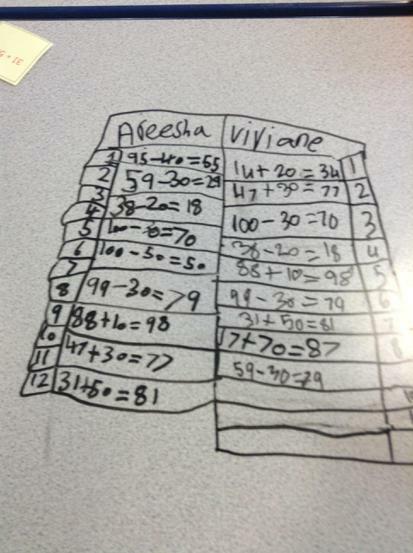 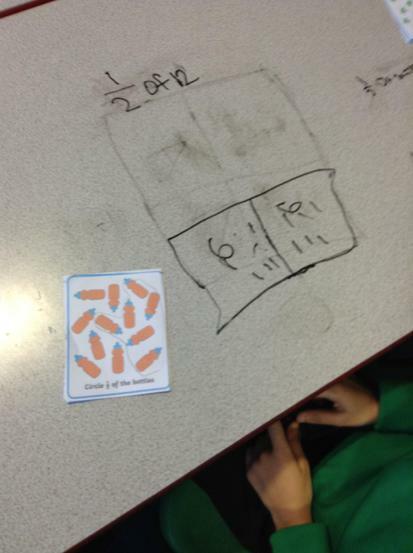 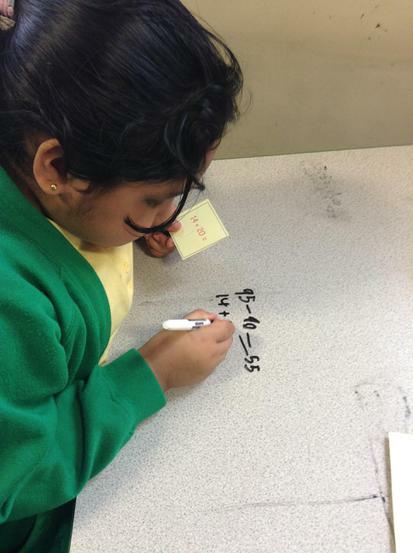 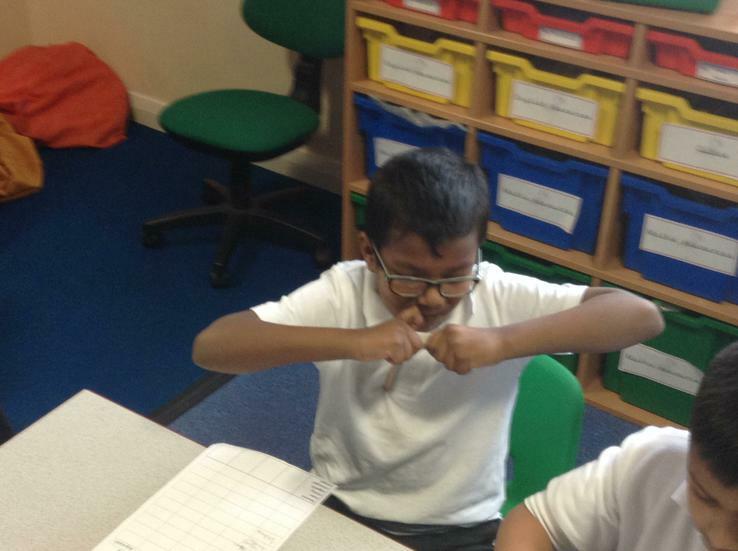 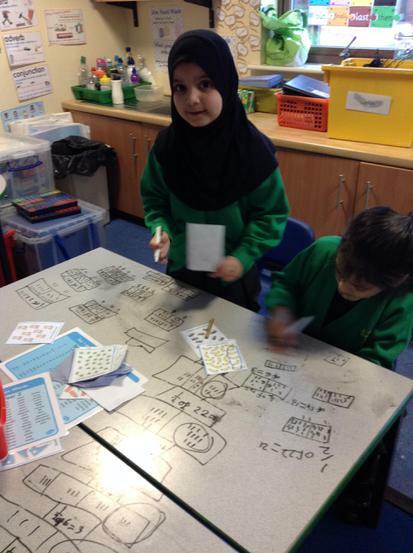 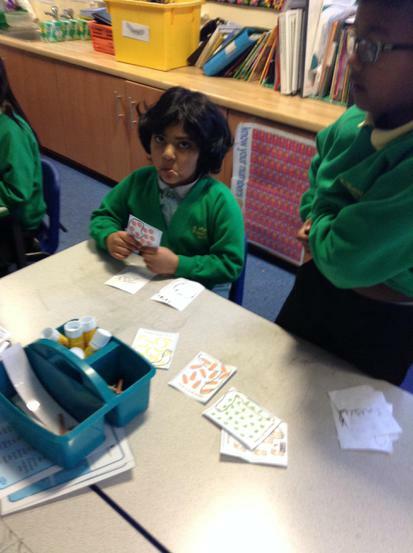 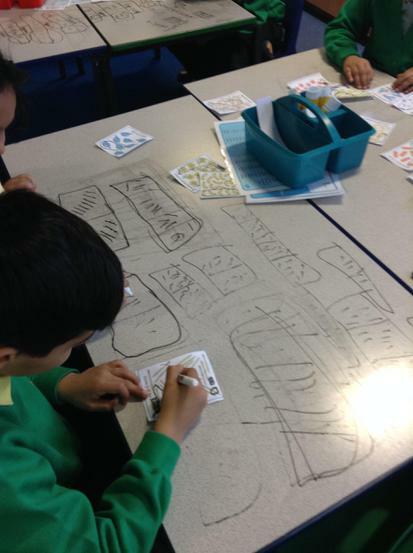 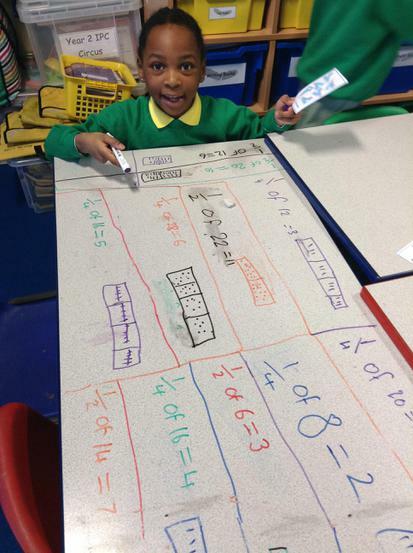 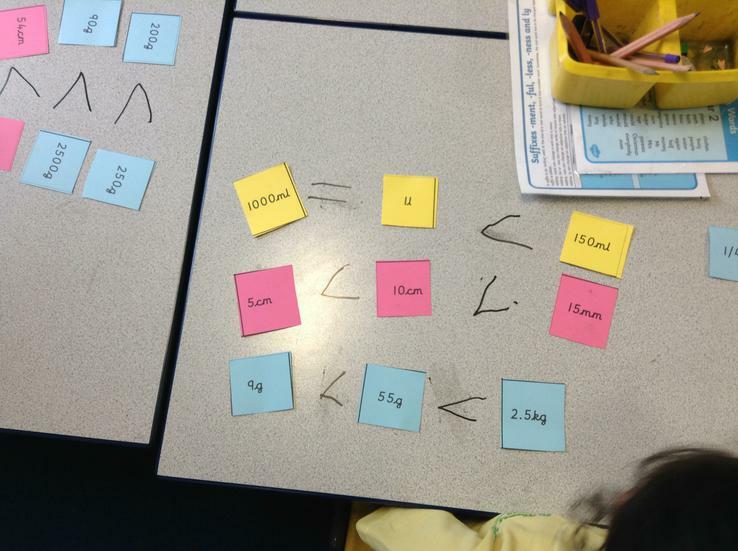 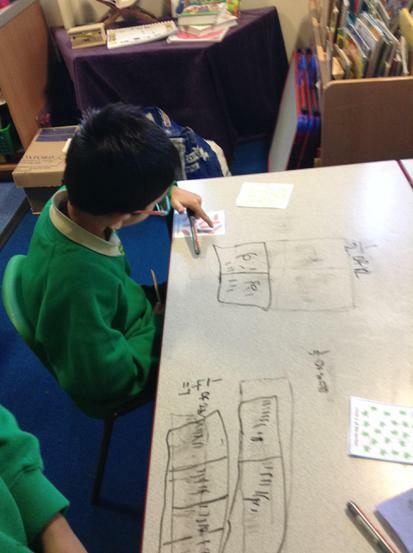 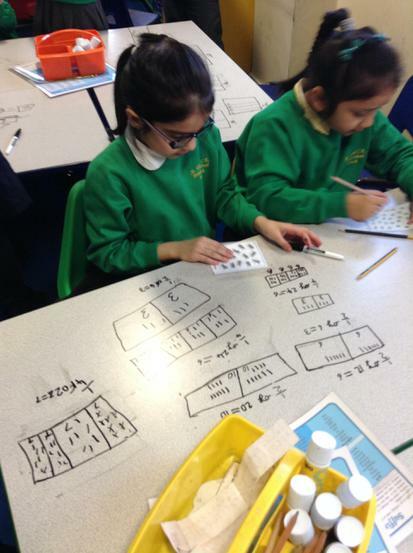 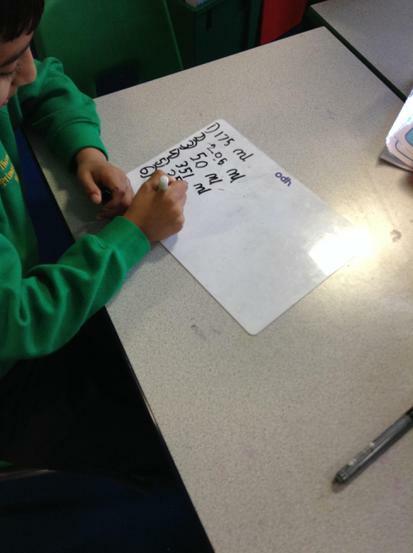 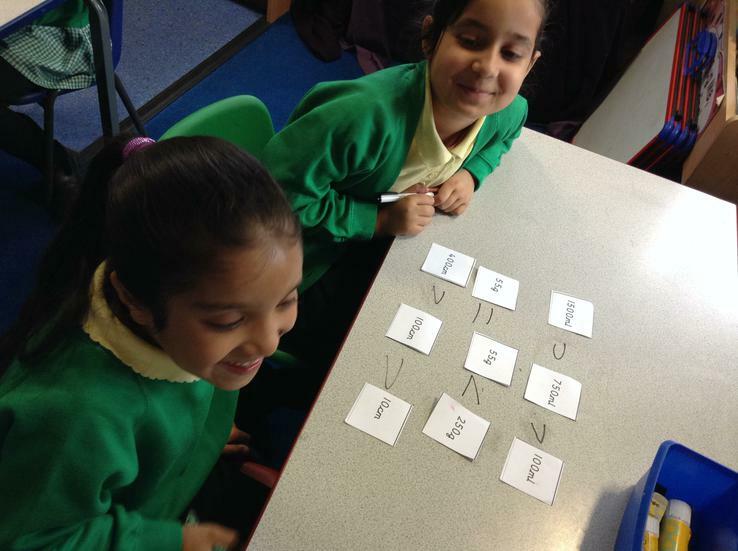 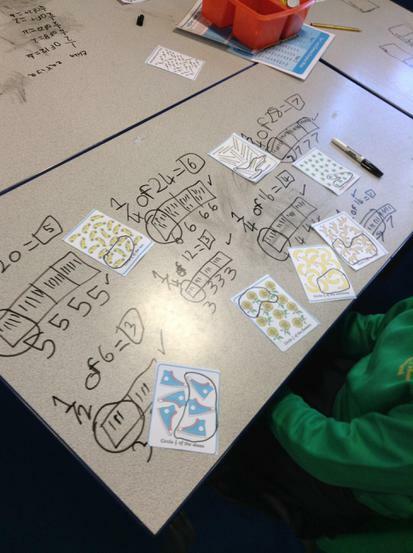 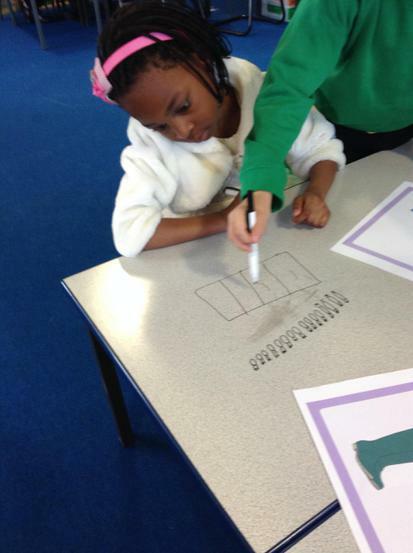 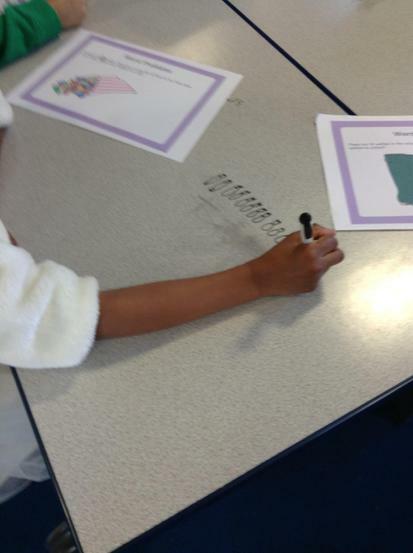 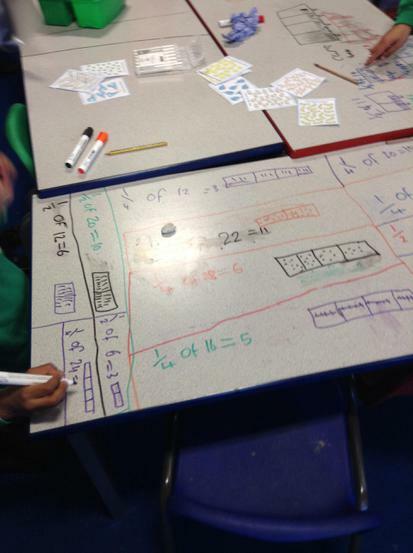 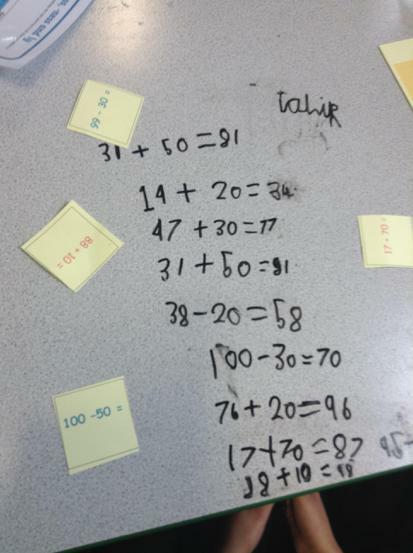 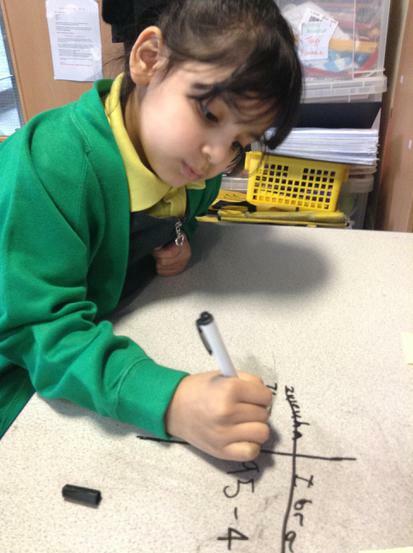 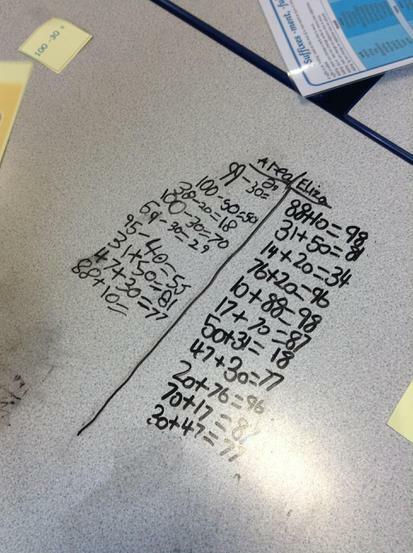 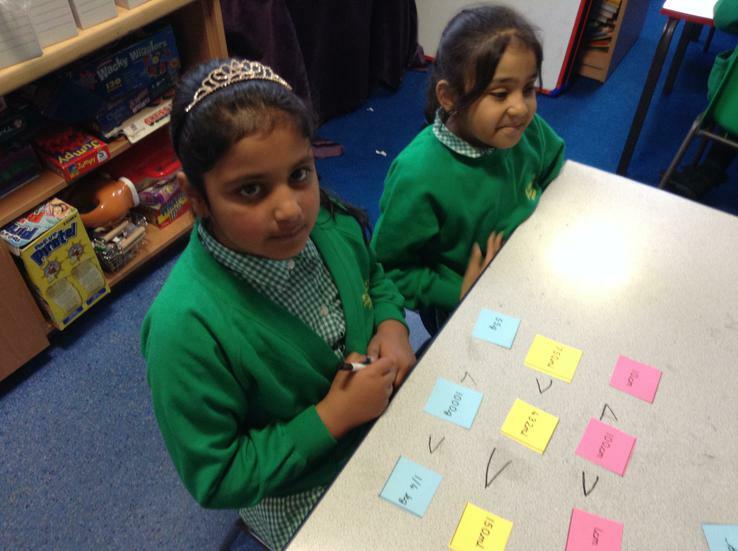 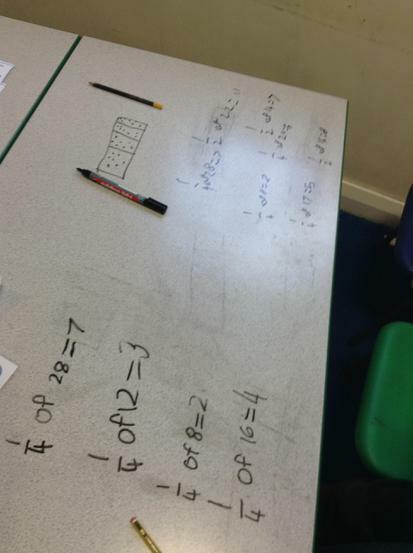 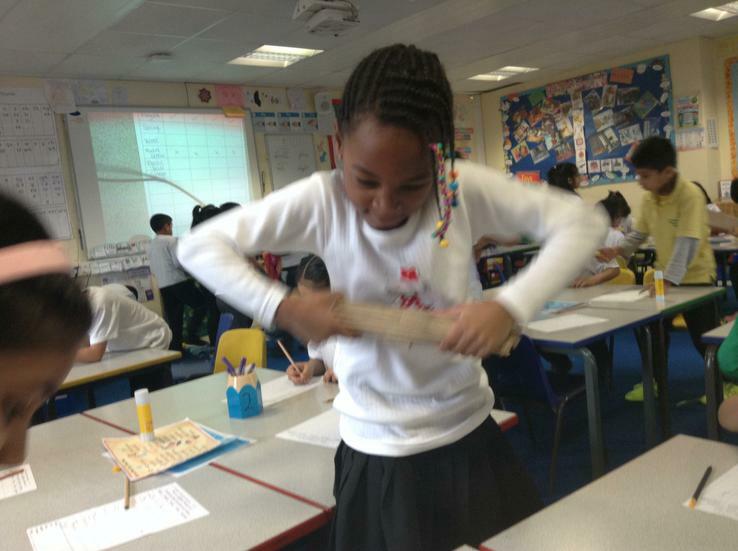 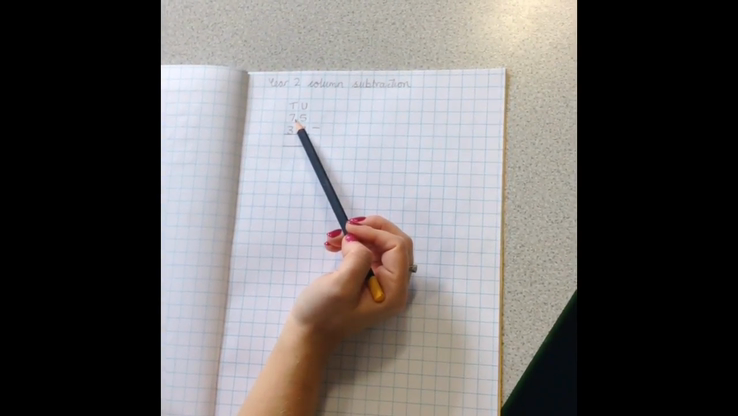 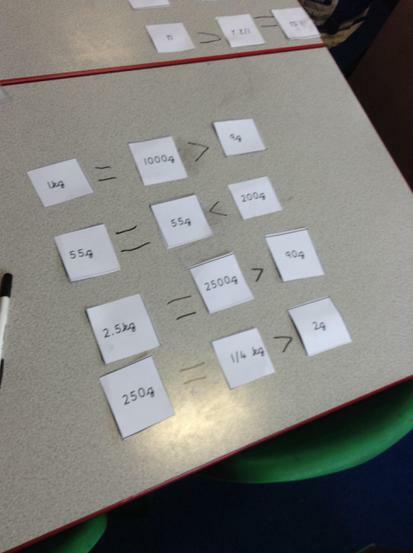 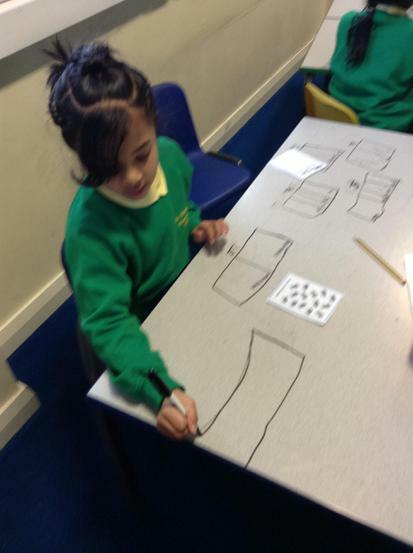 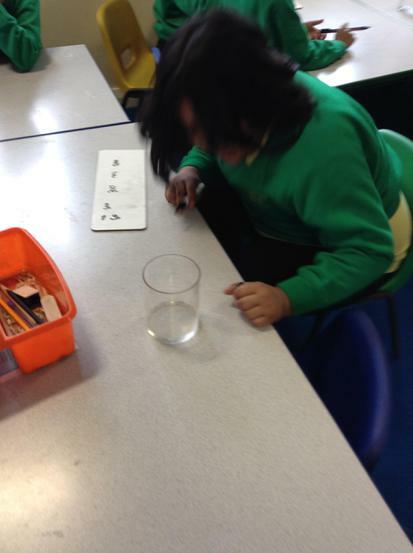 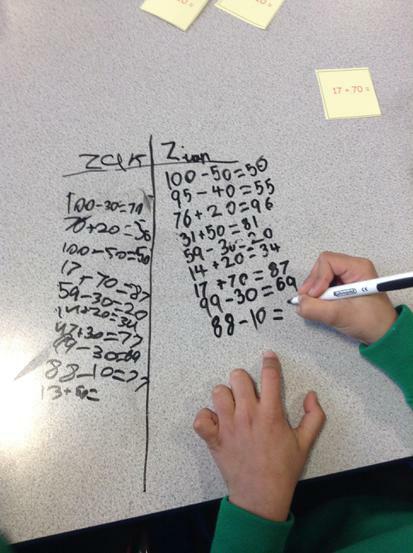 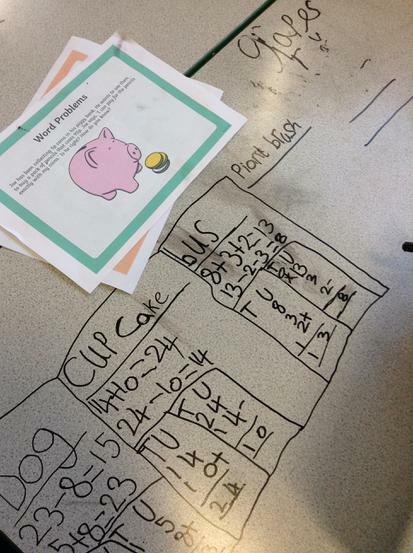 Look at how we subtract in Year 2! 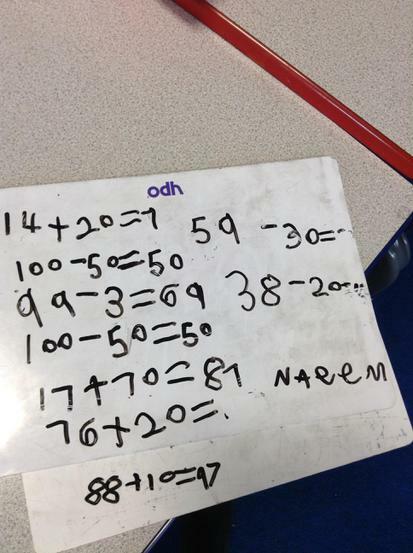 Look at how we add in Year 2! 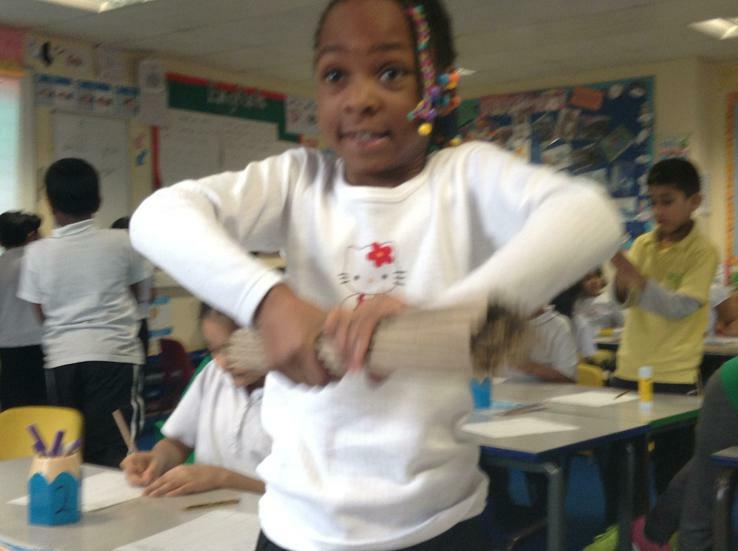 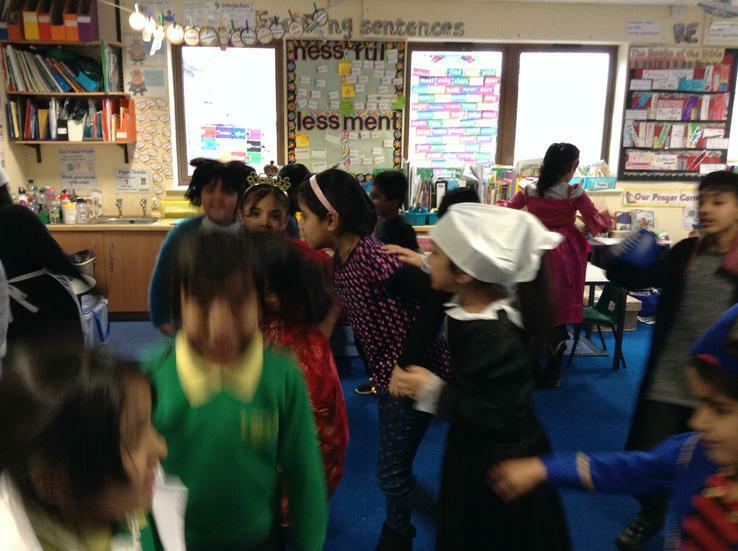 We learnt a whole new dance to an African song! 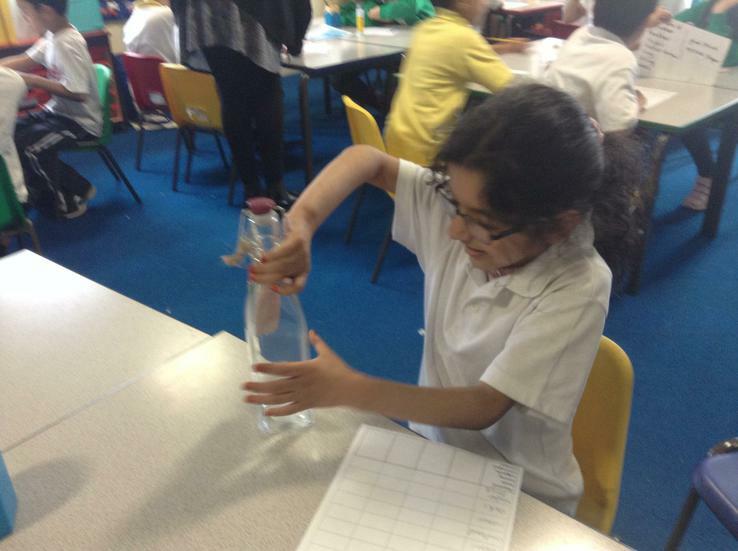 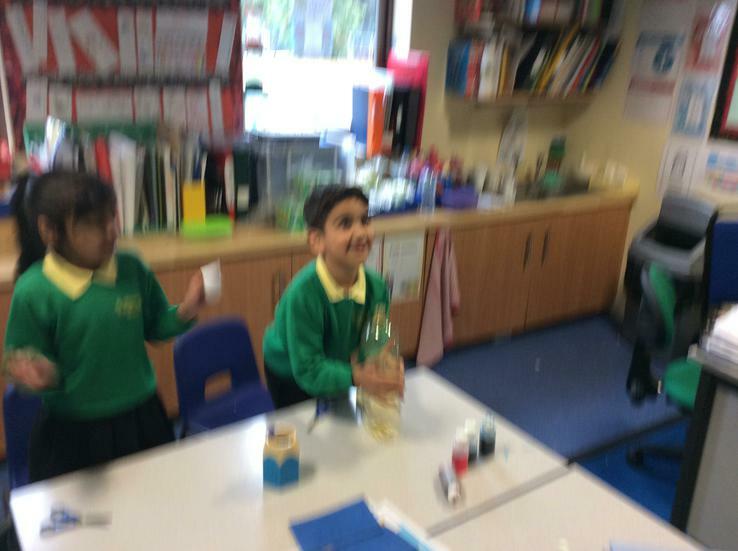 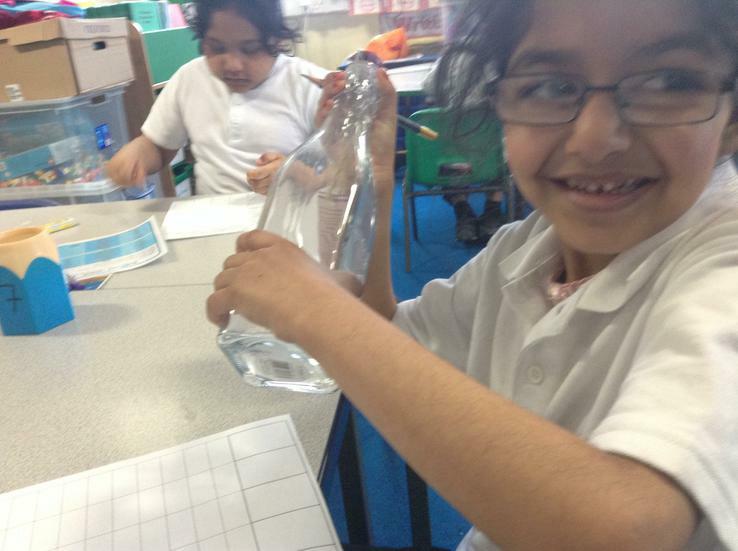 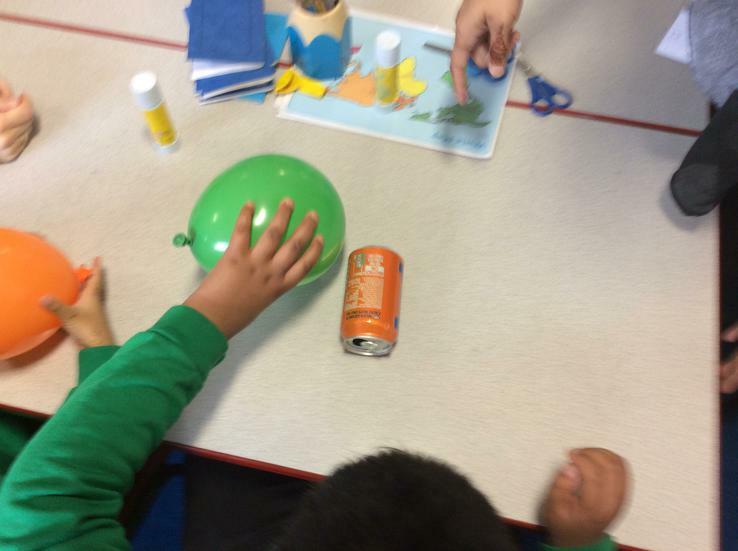 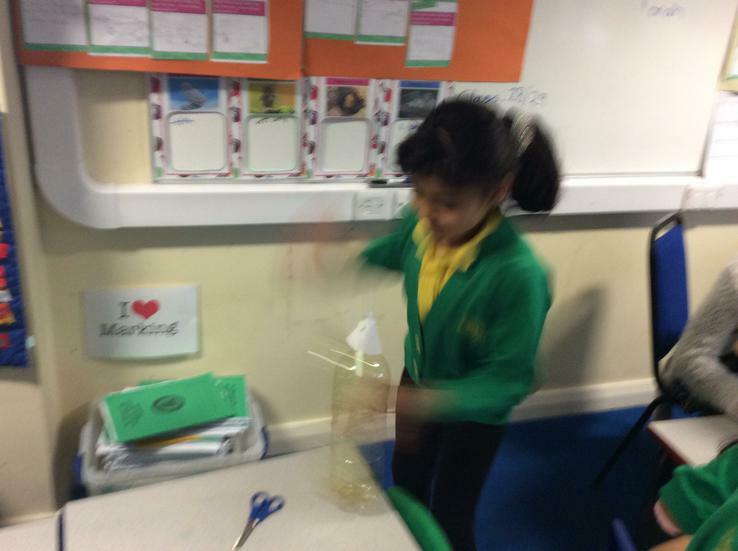 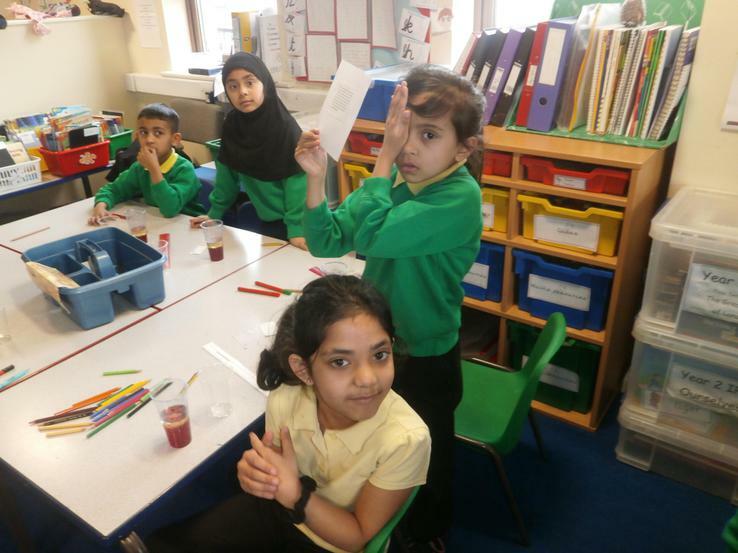 Creating our own space juices on Maths Measures Day!! 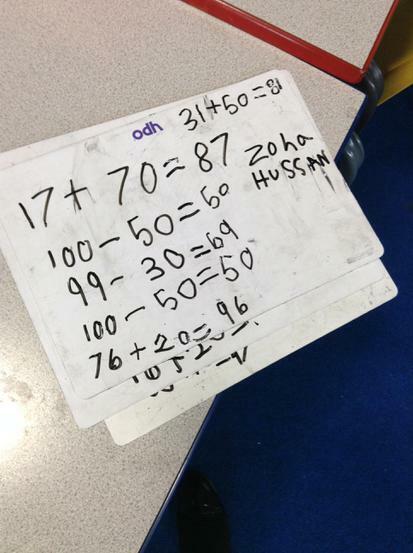 We can order numbers to 100! 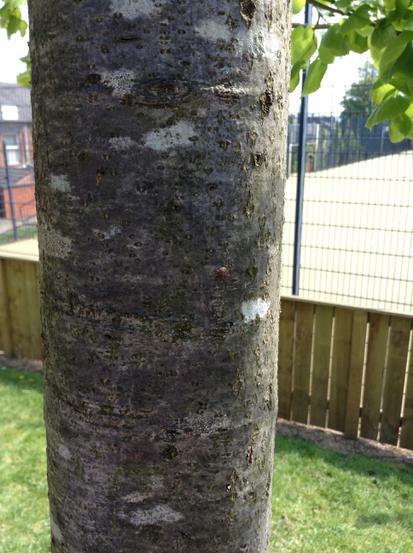 Uploaded by Senior Management Team on 2016-07-13. 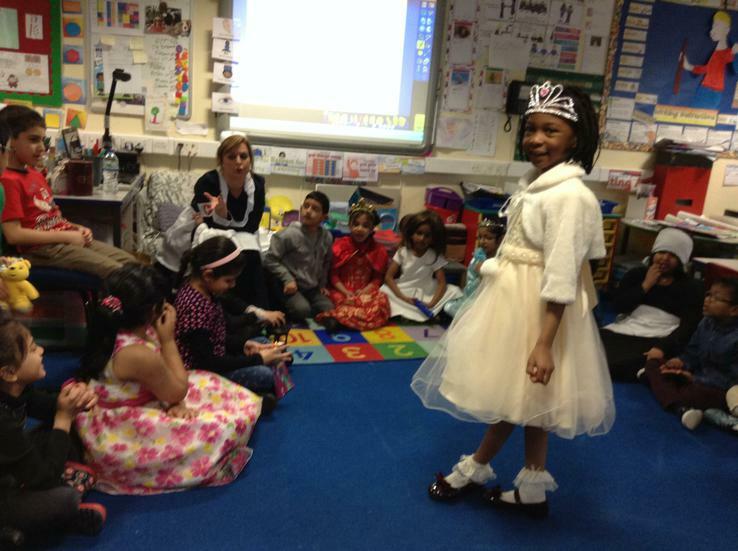 Happy 90th birthday Queen Elizabeth! 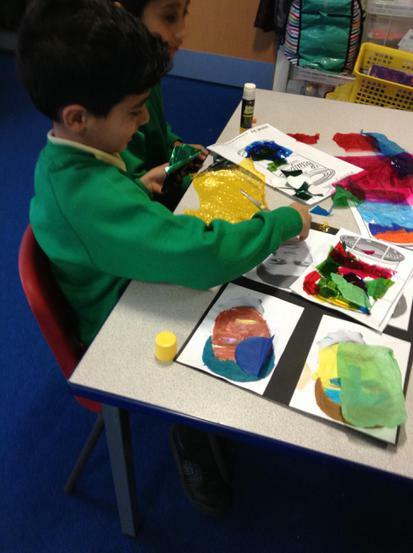 From year 2! 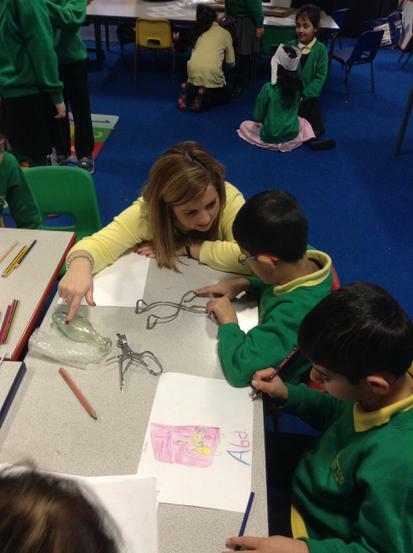 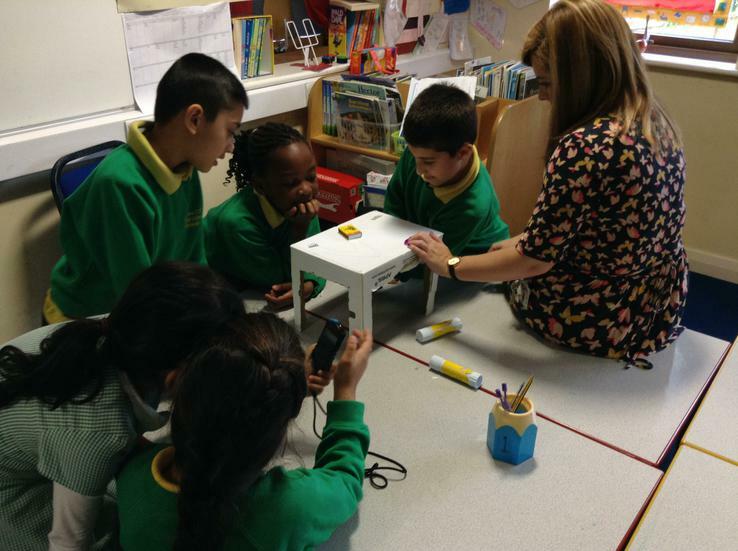 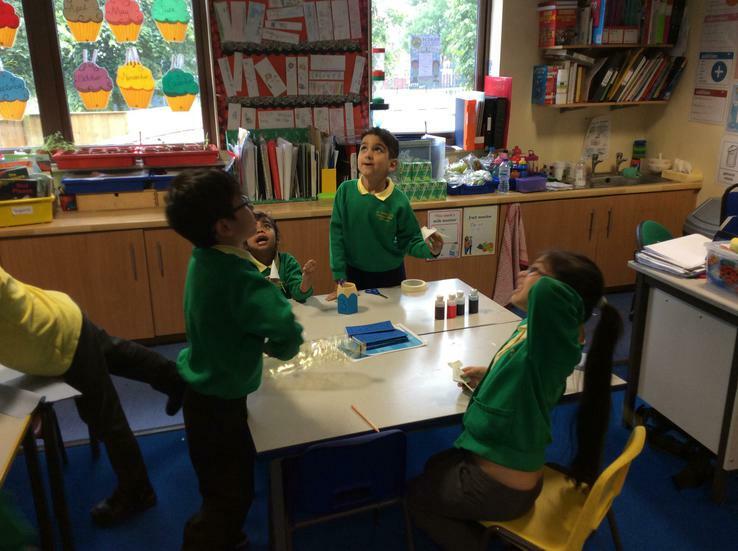 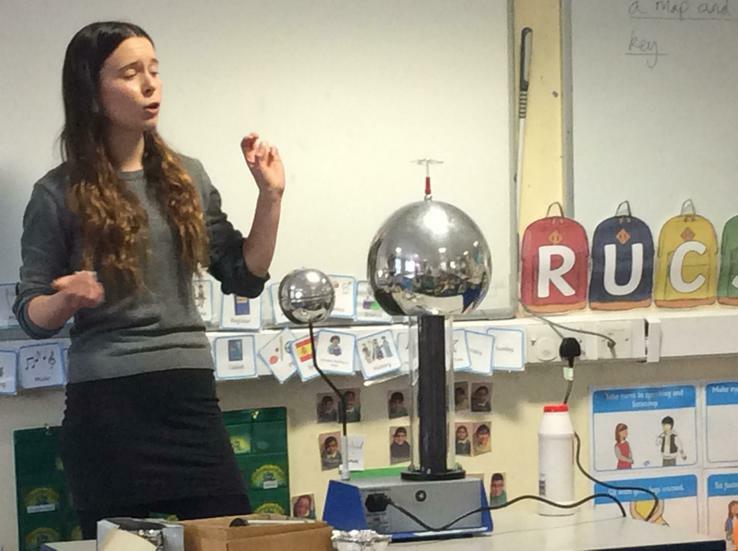 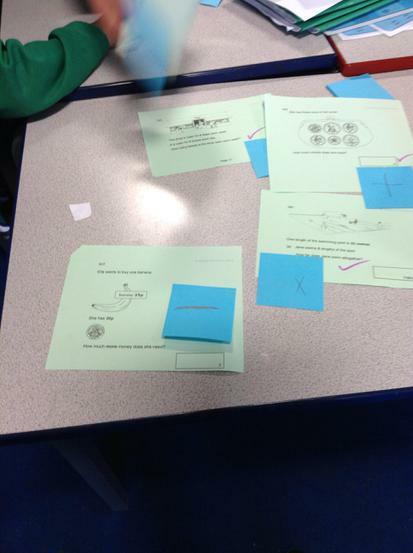 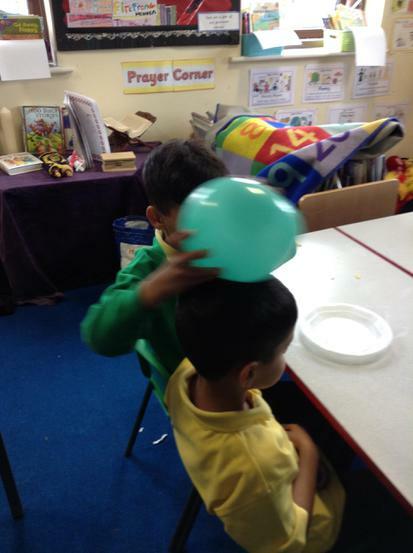 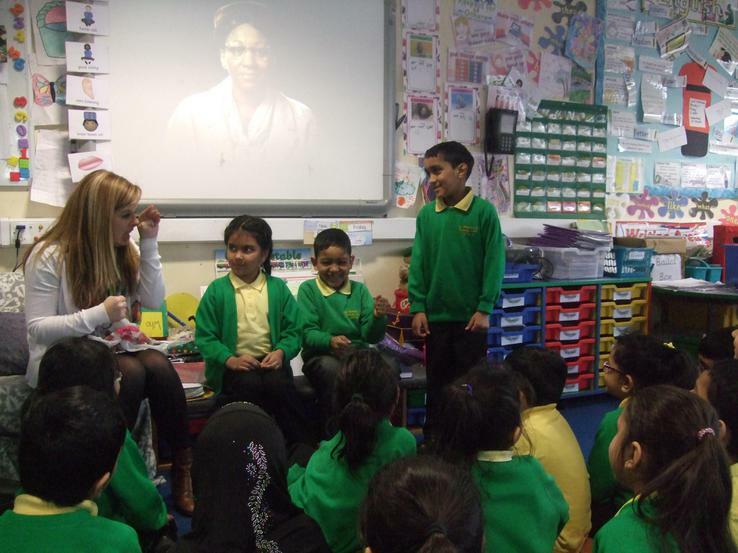 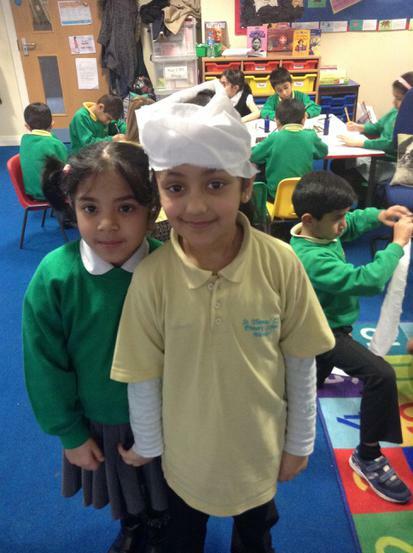 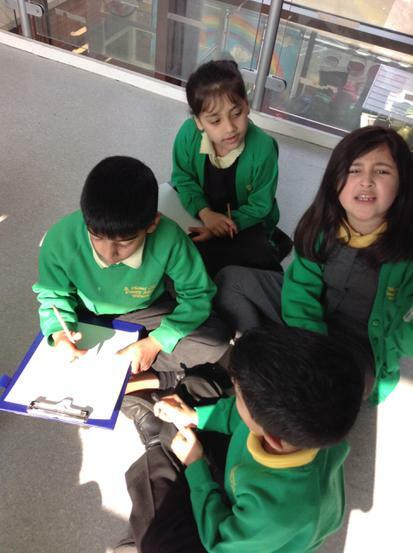 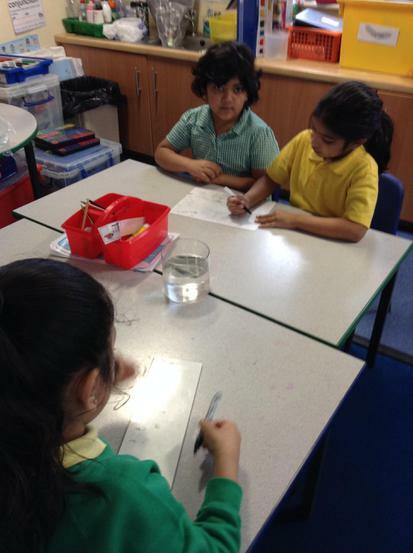 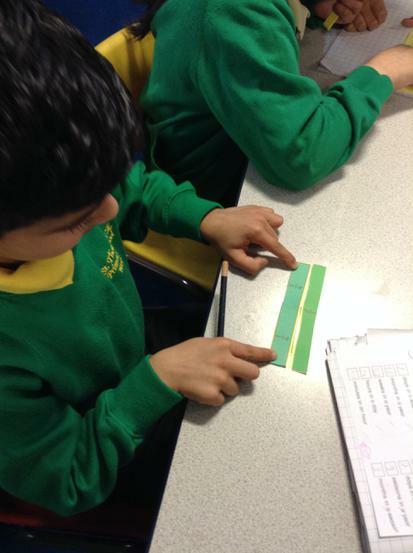 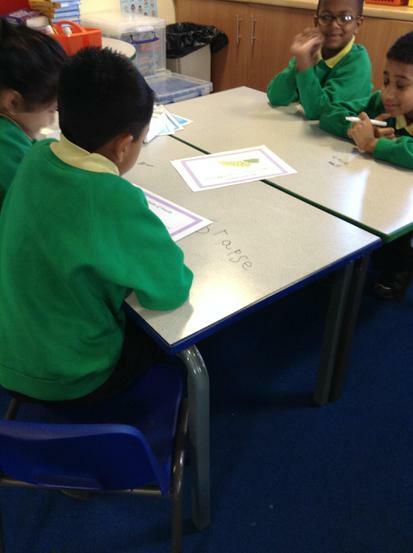 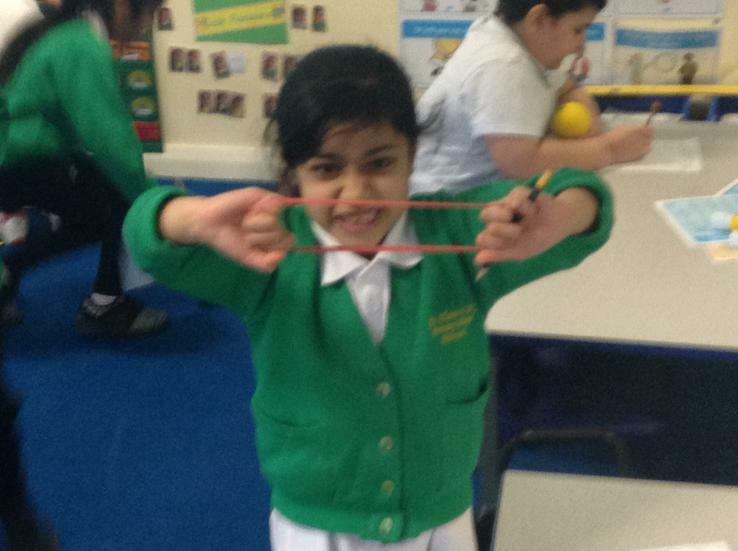 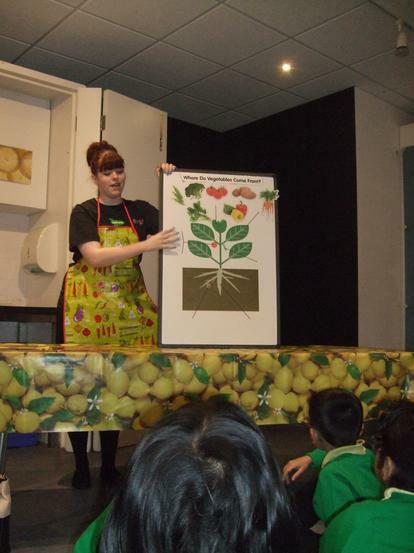 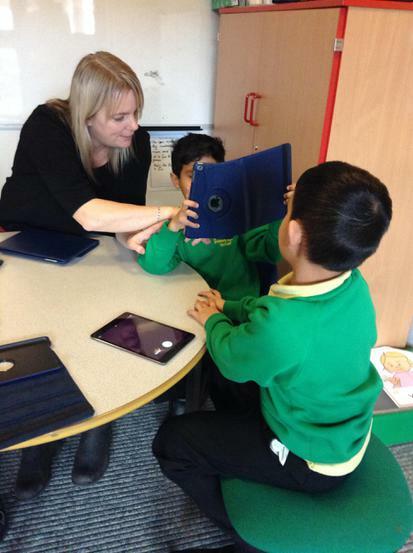 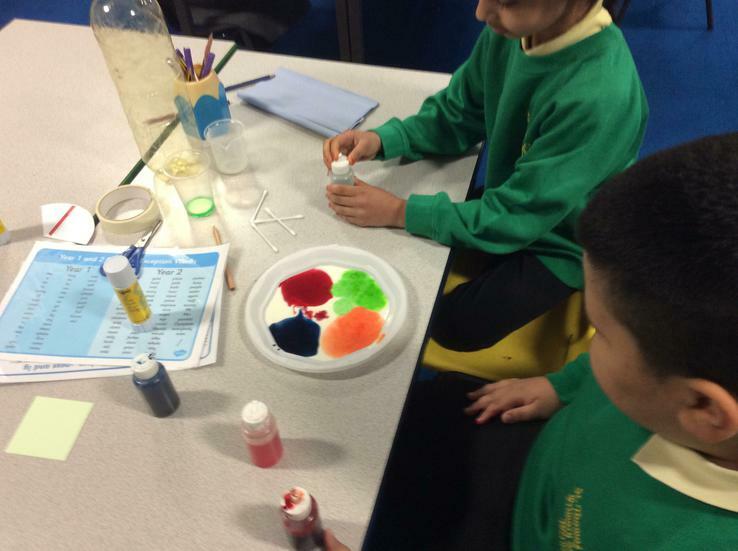 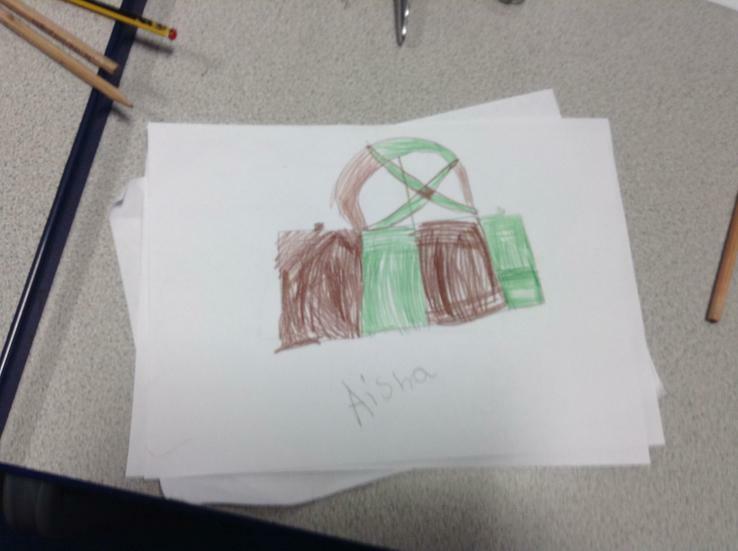 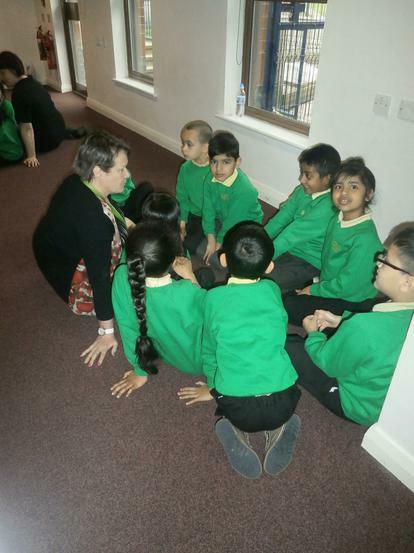 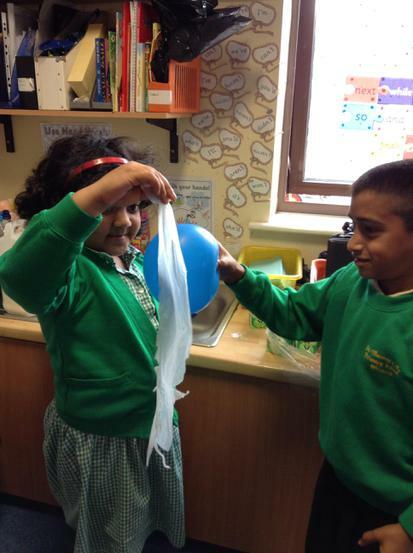 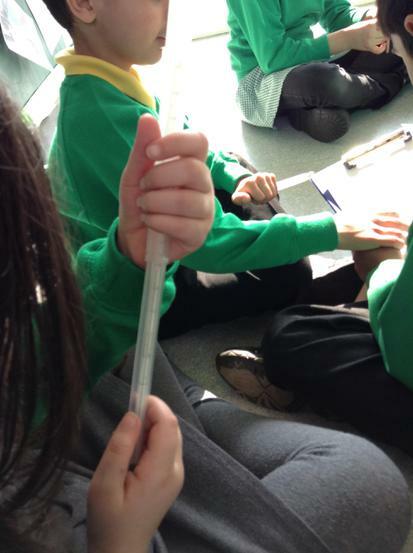 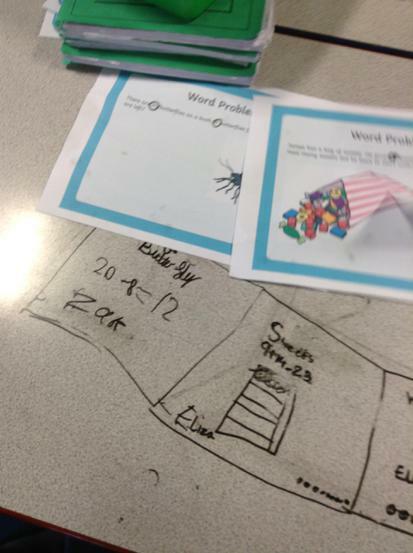 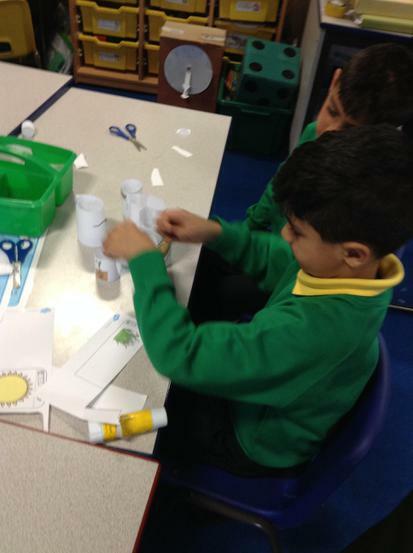 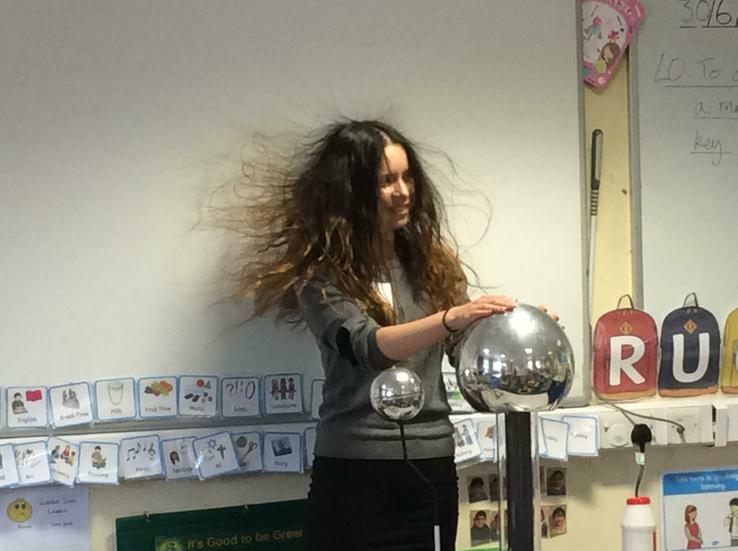 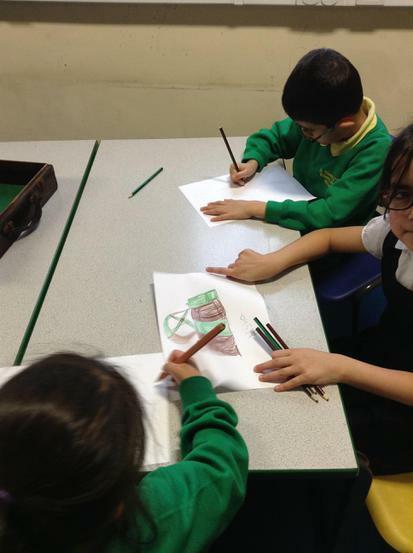 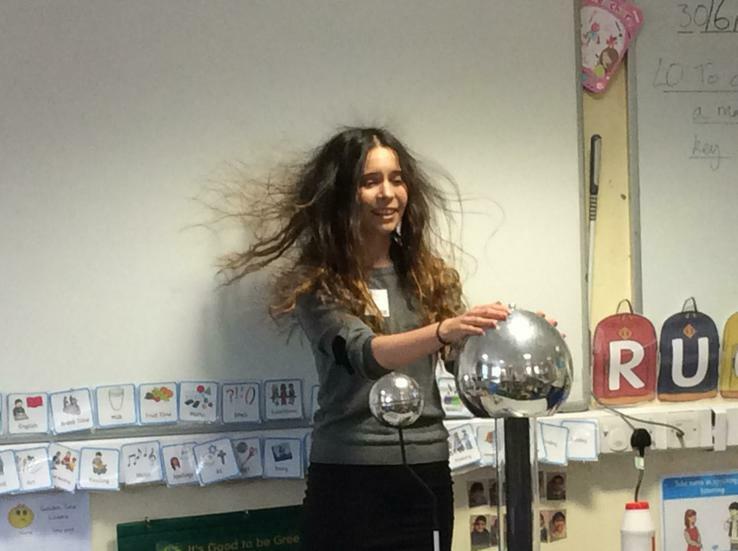 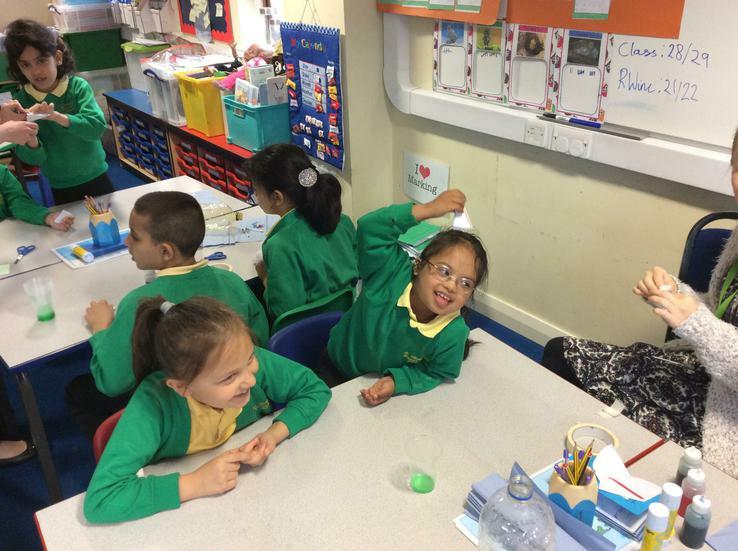 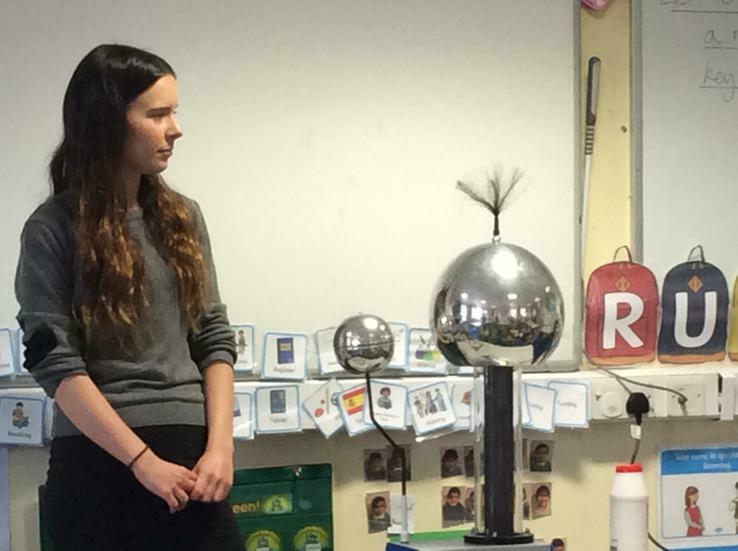 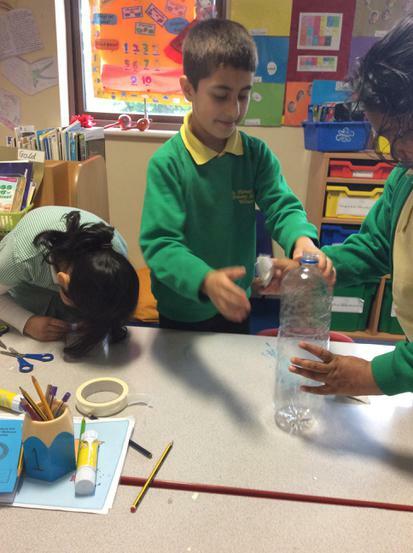 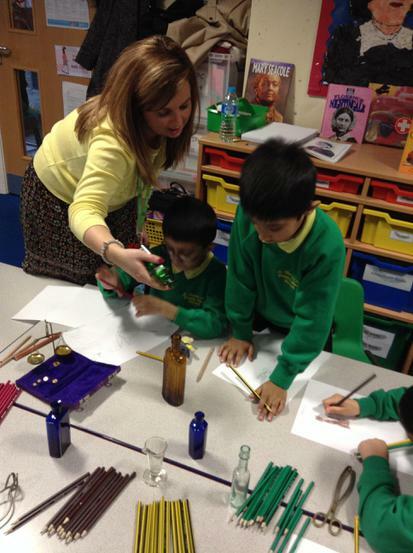 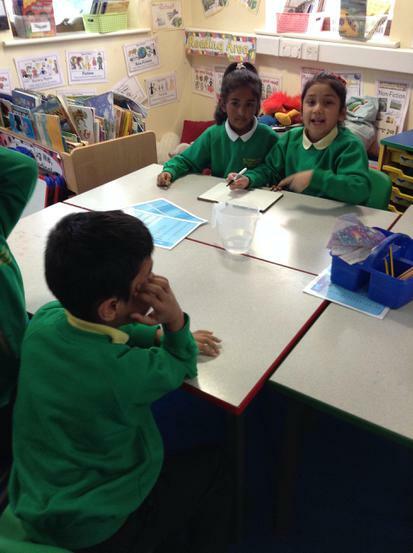 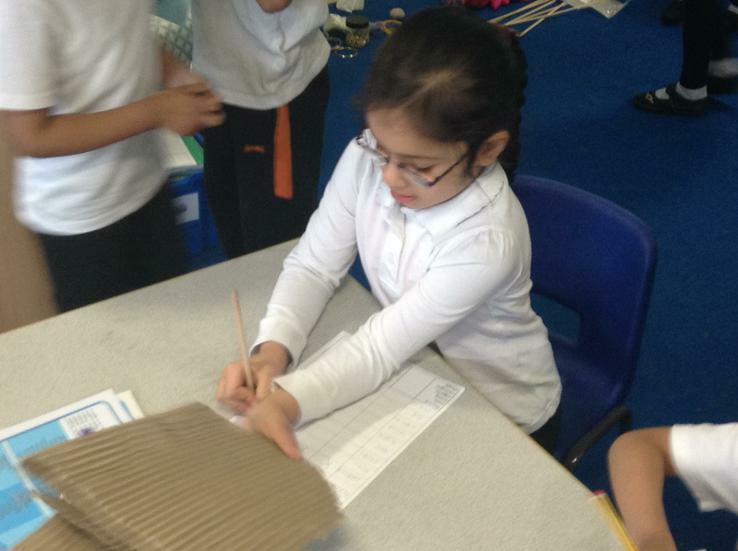 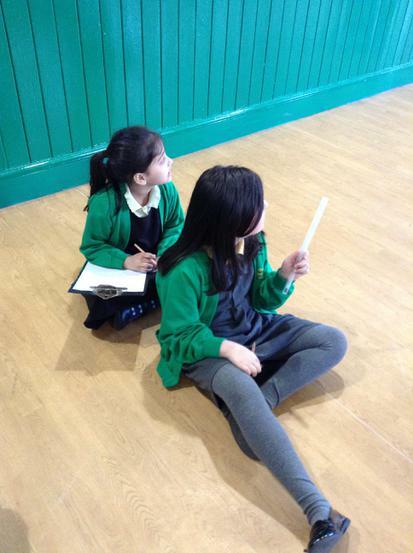 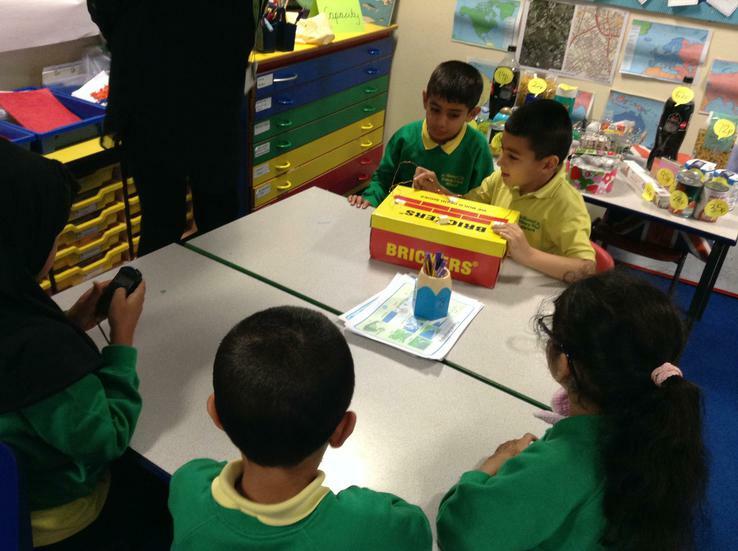 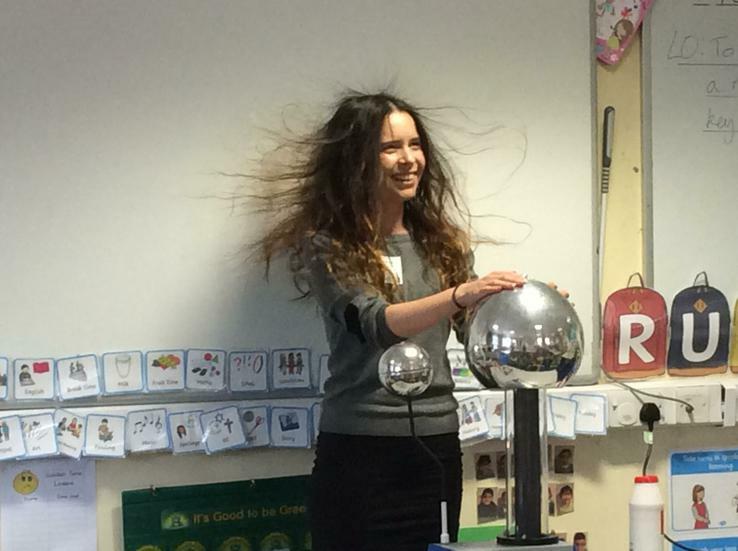 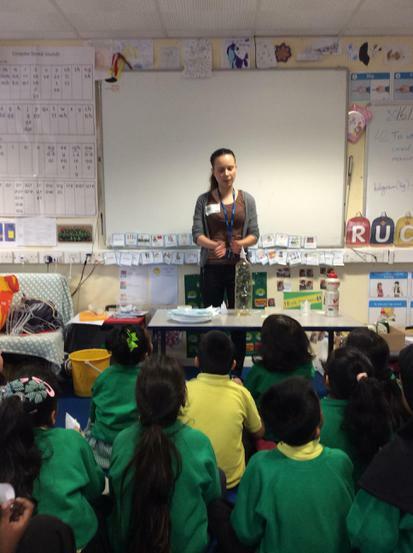 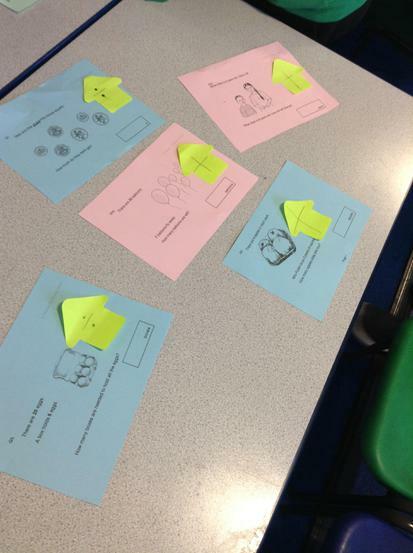 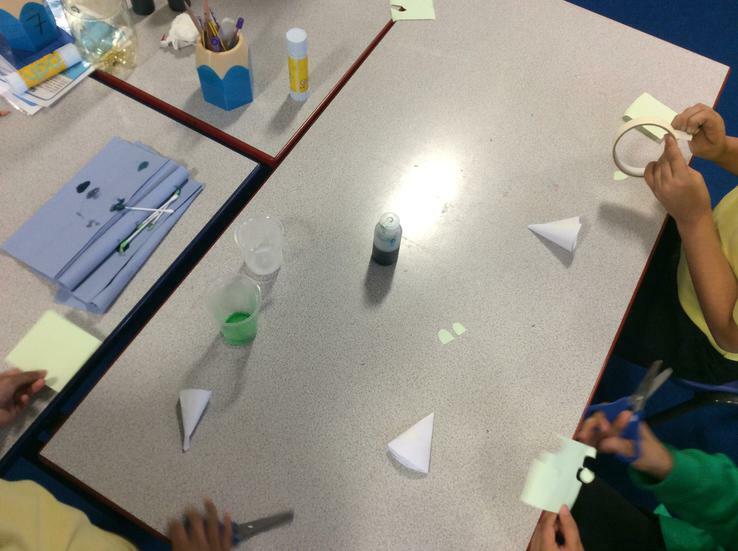 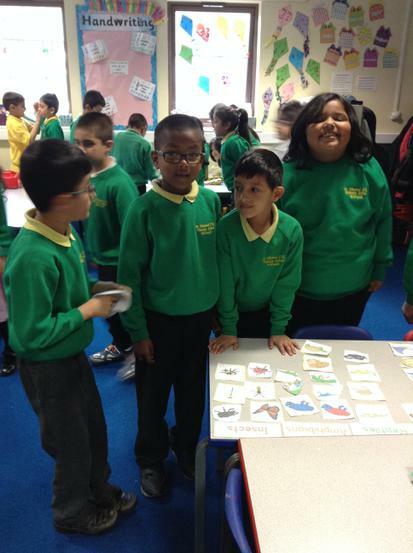 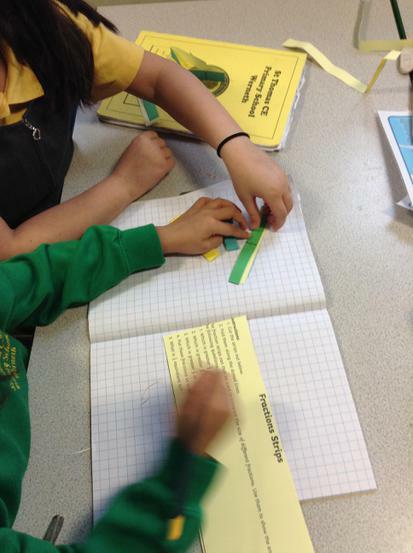 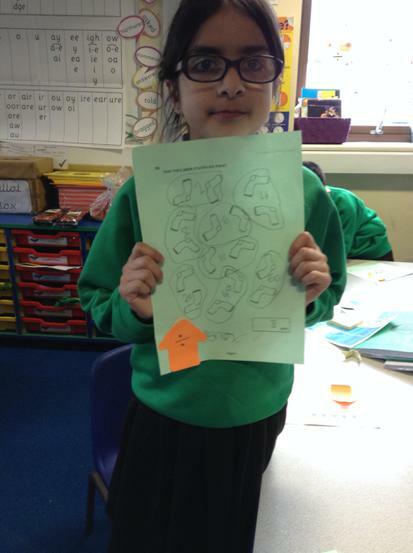 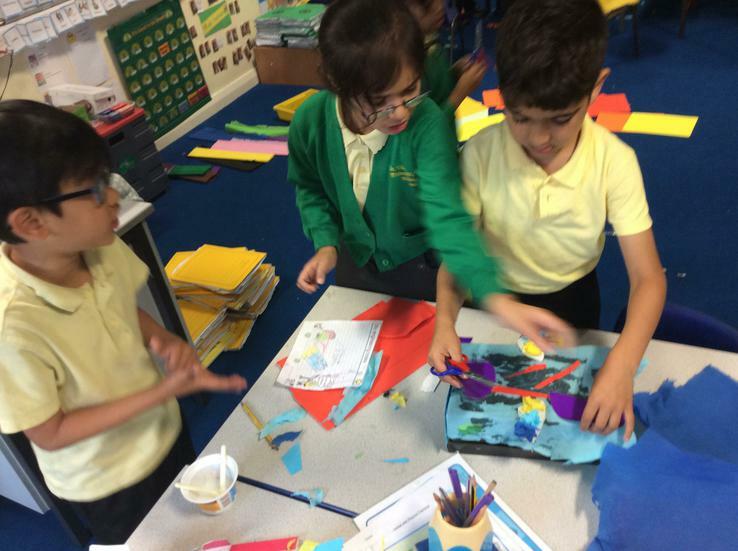 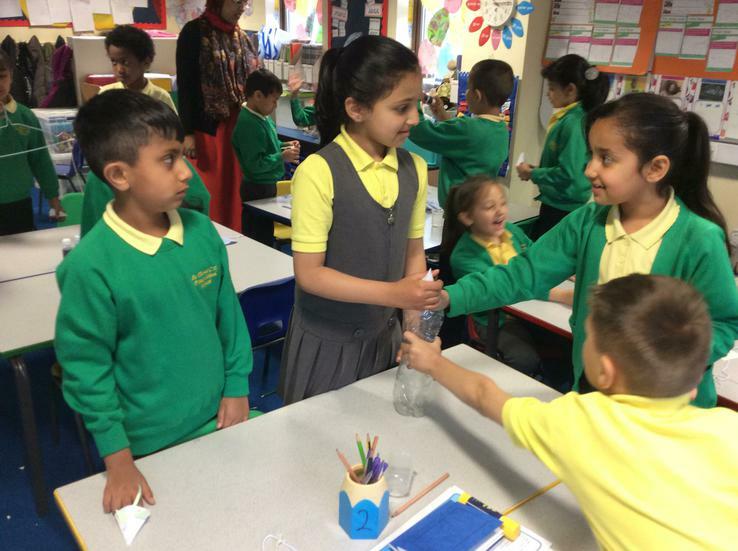 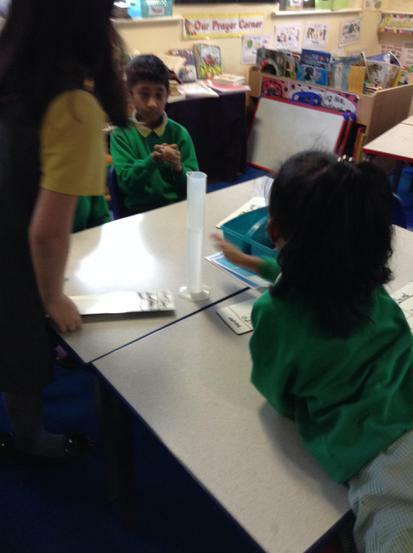 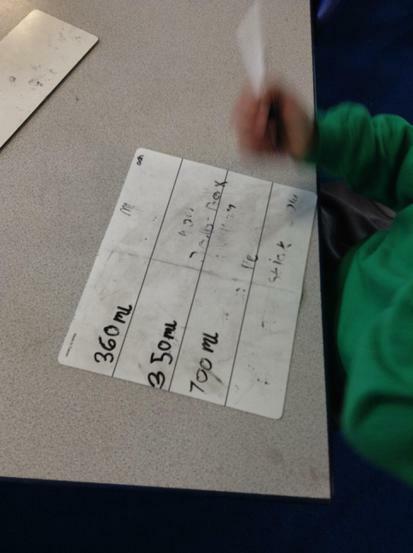 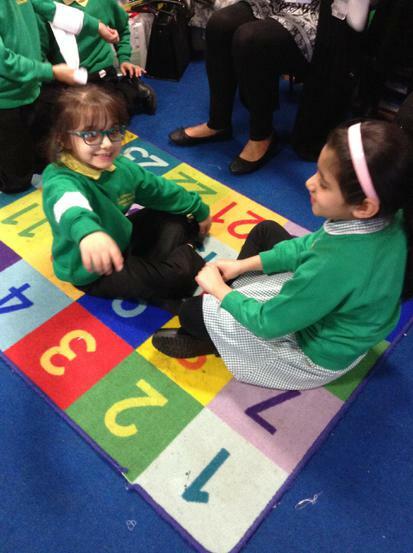 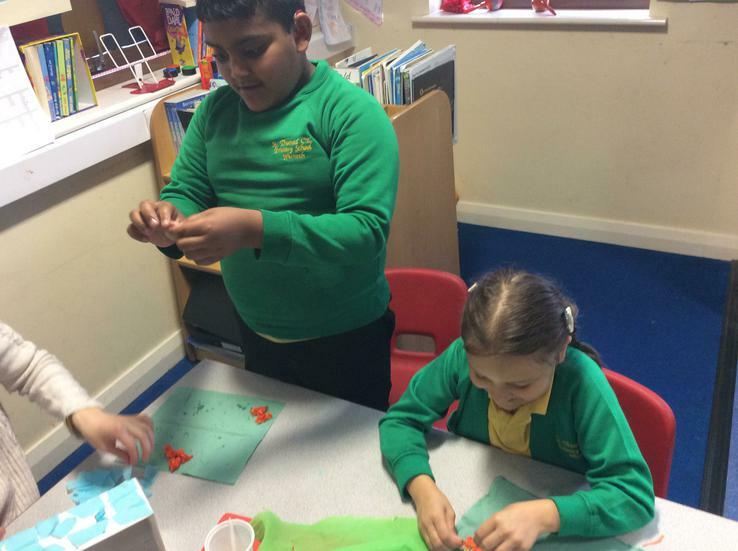 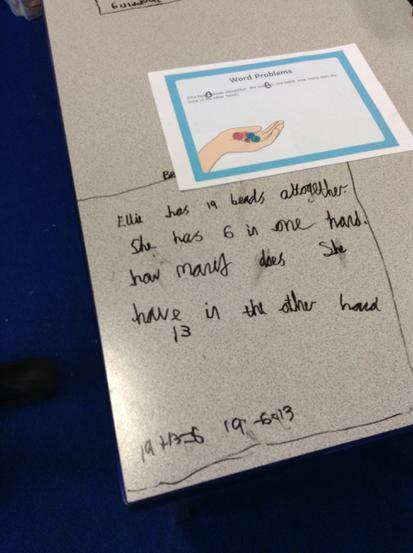 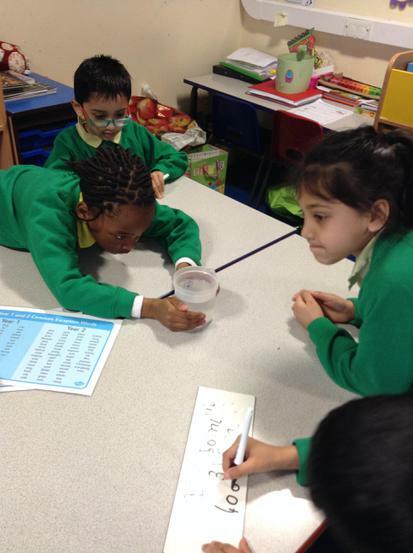 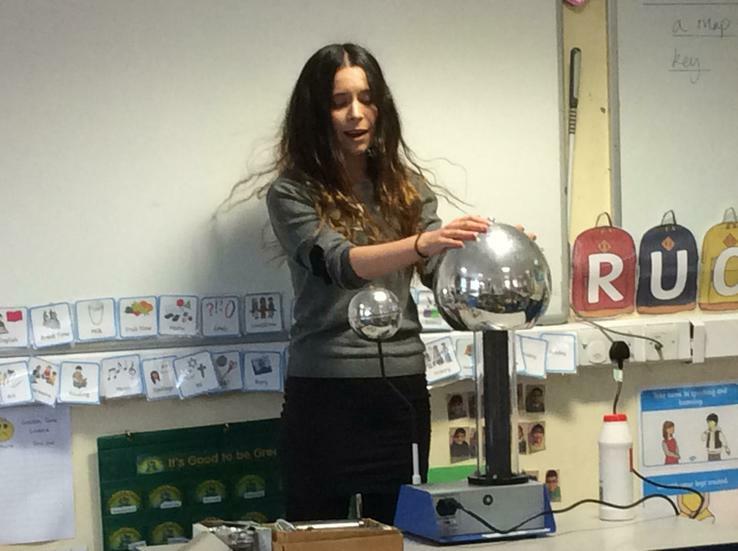 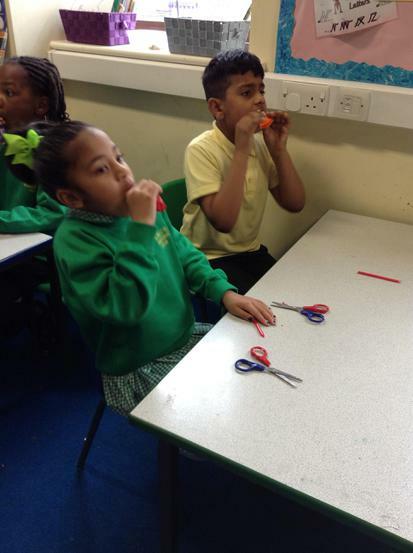 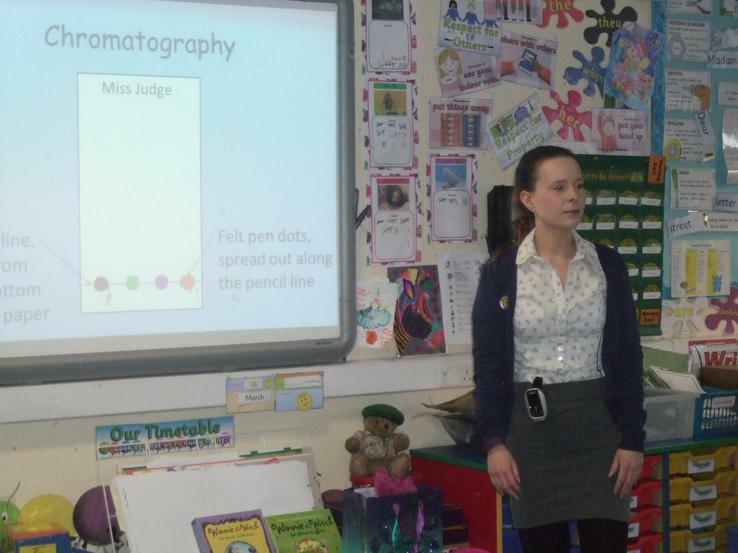 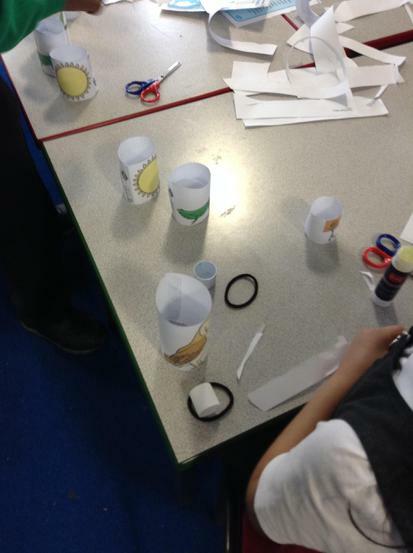 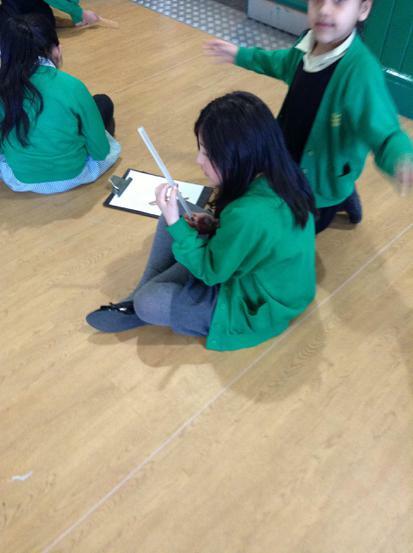 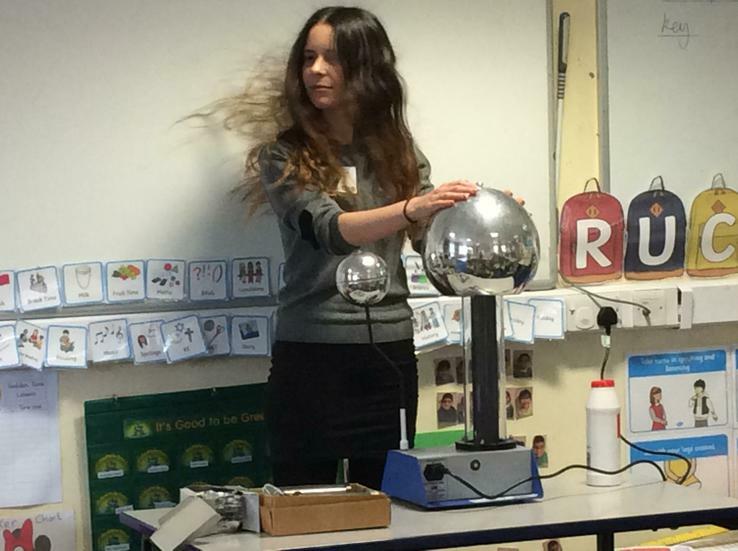 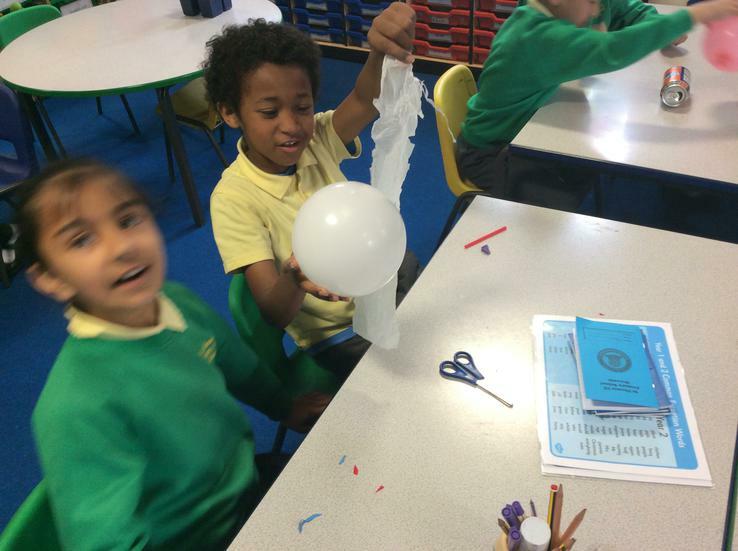 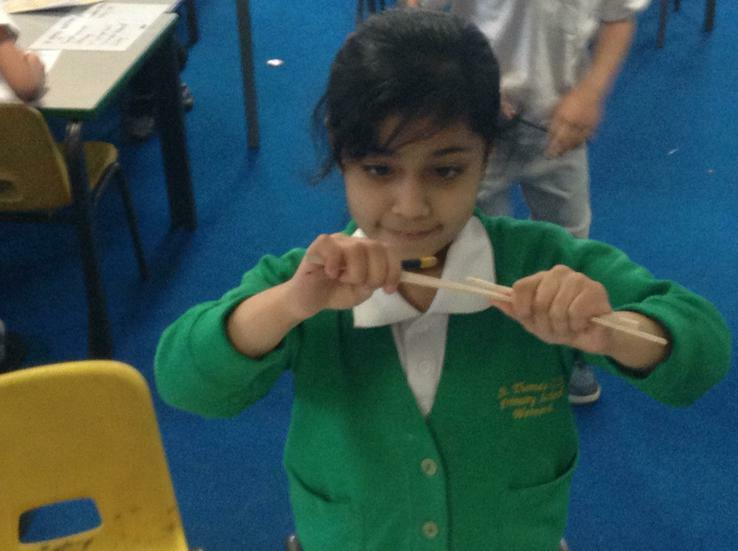 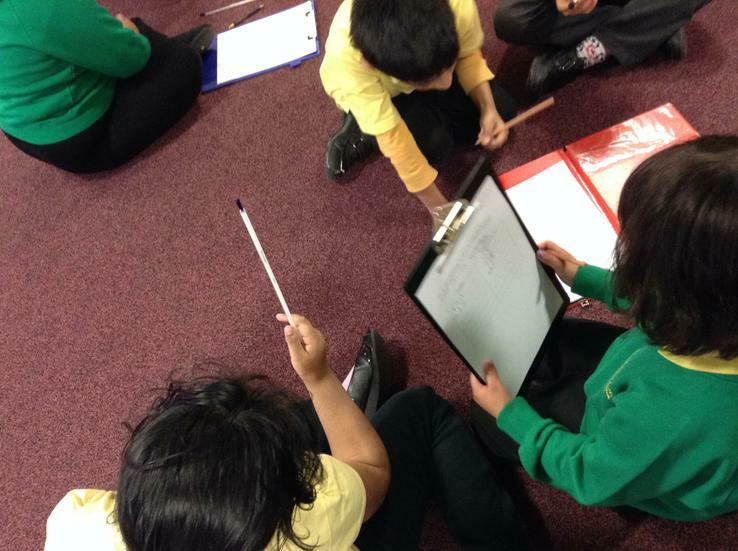 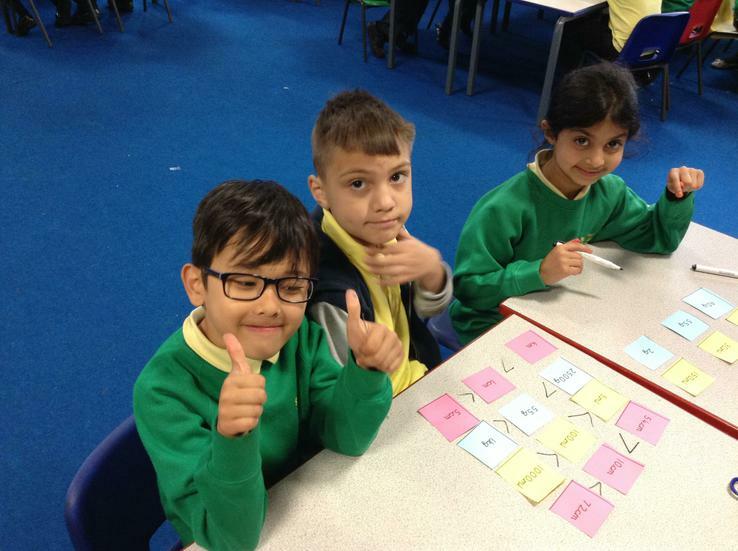 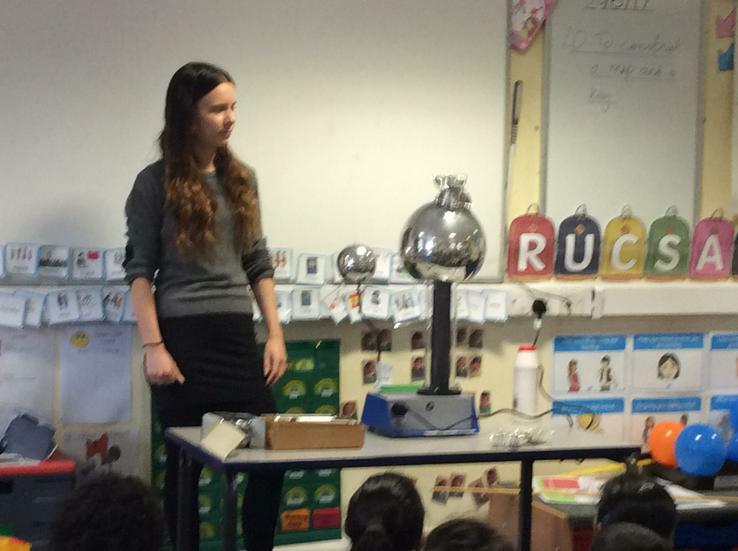 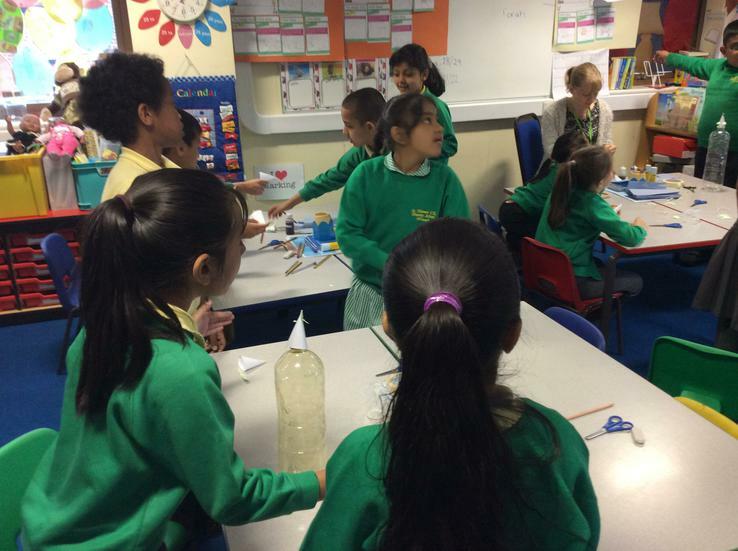 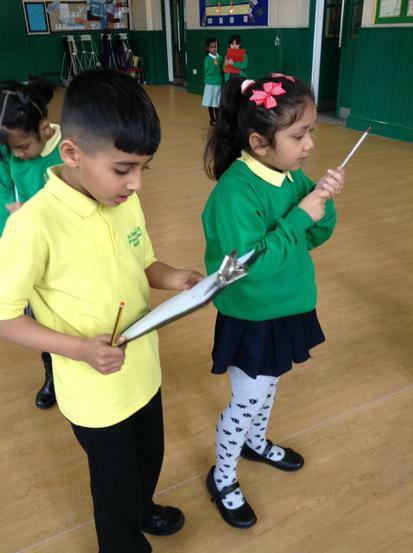 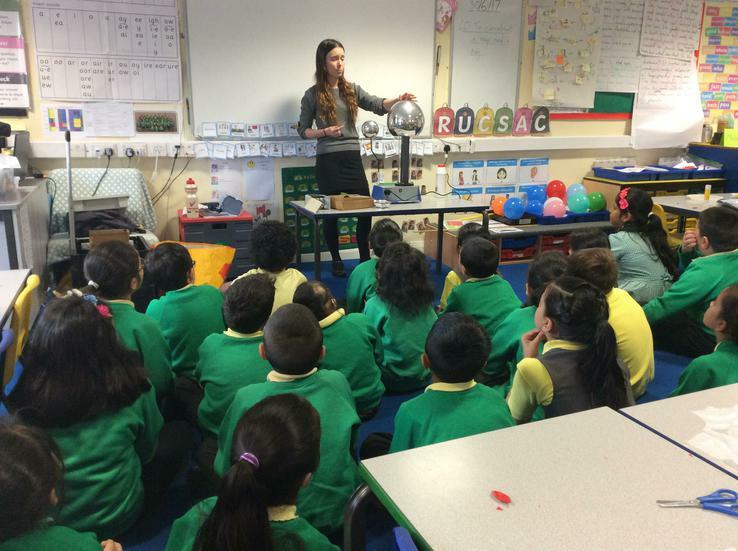 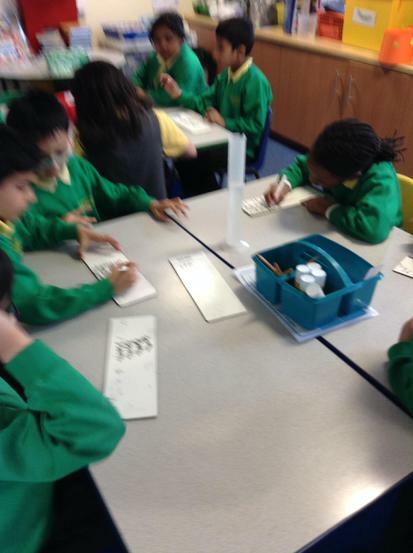 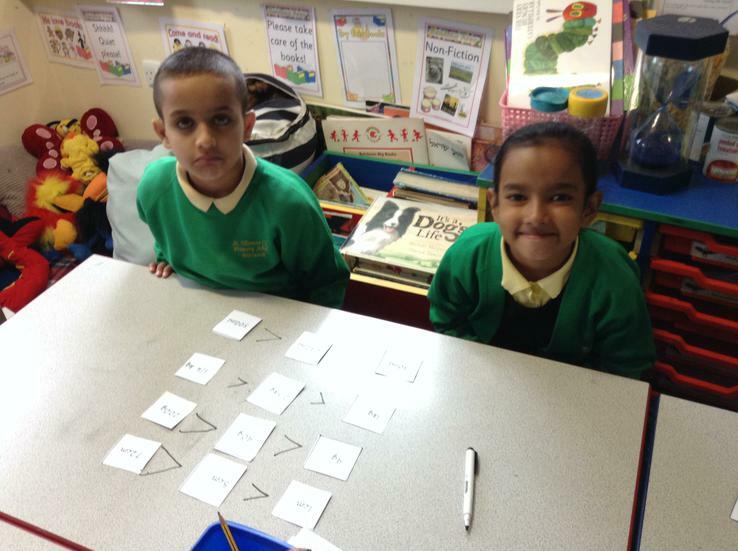 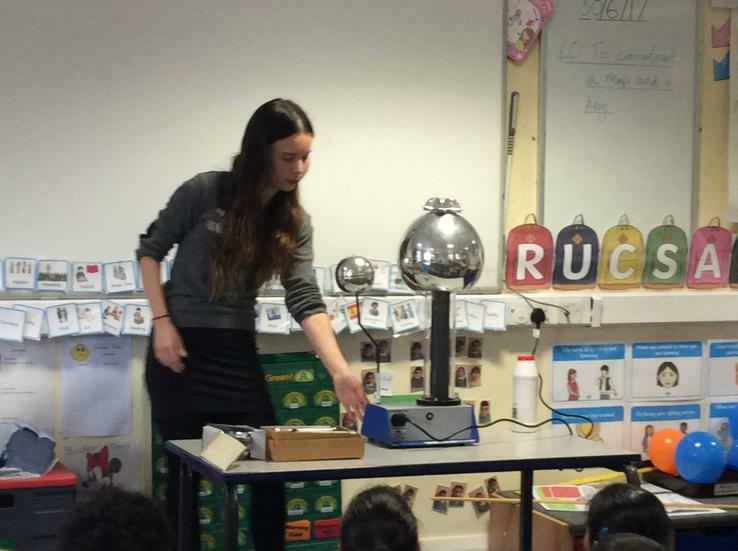 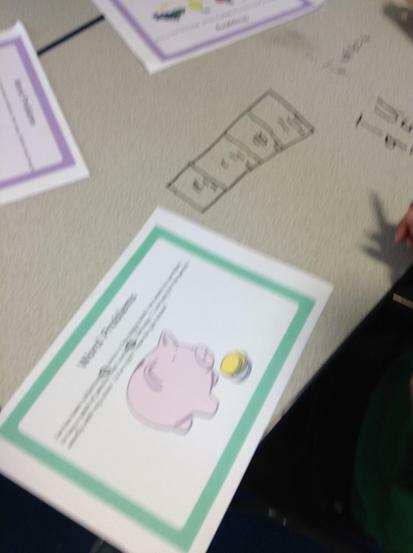 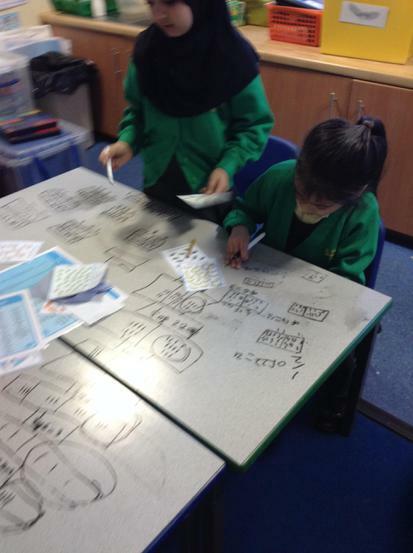 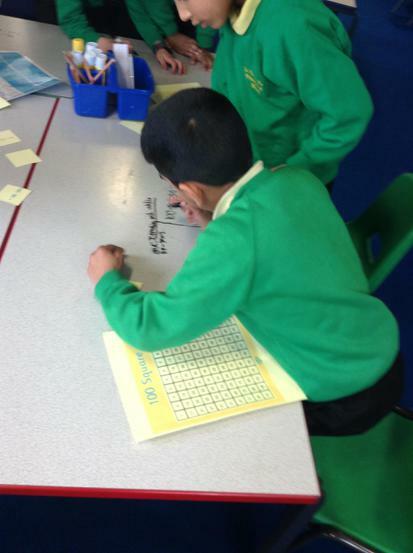 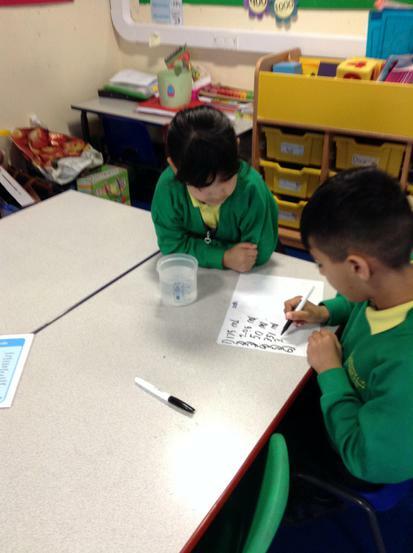 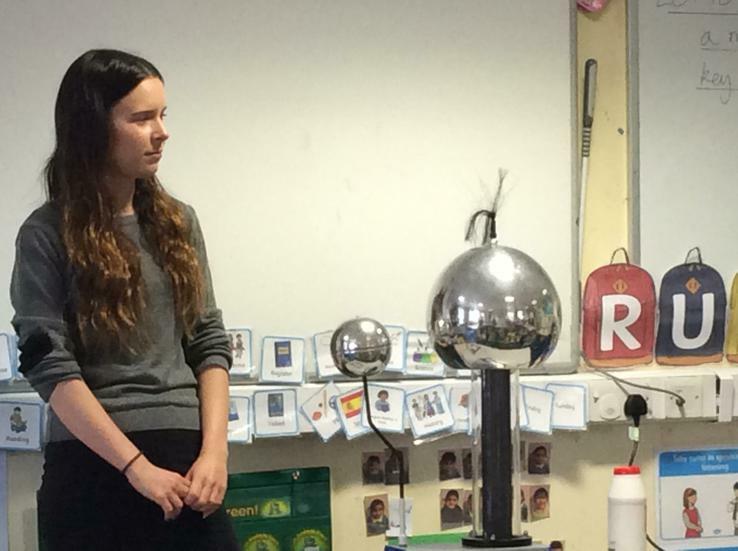 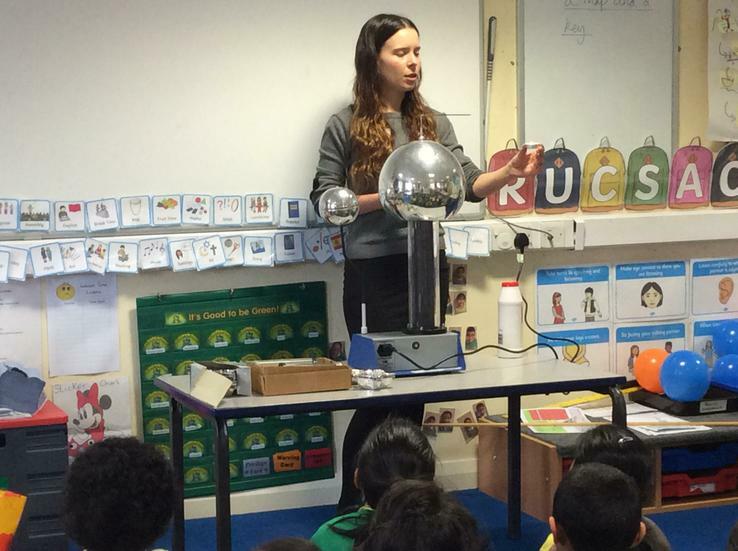 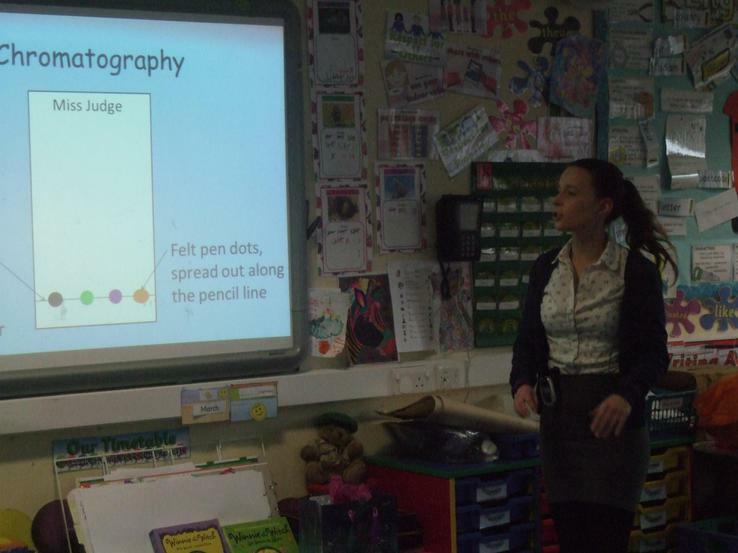 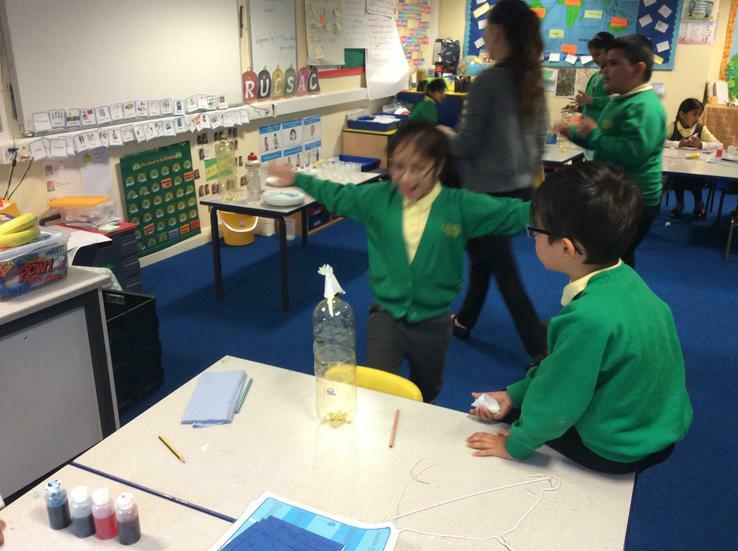 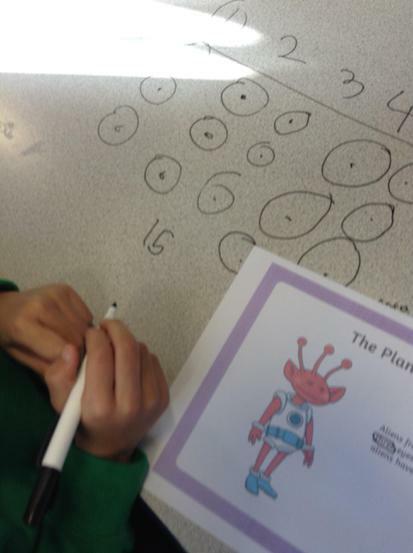 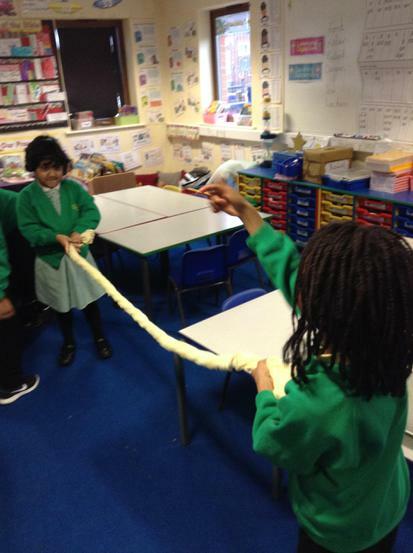 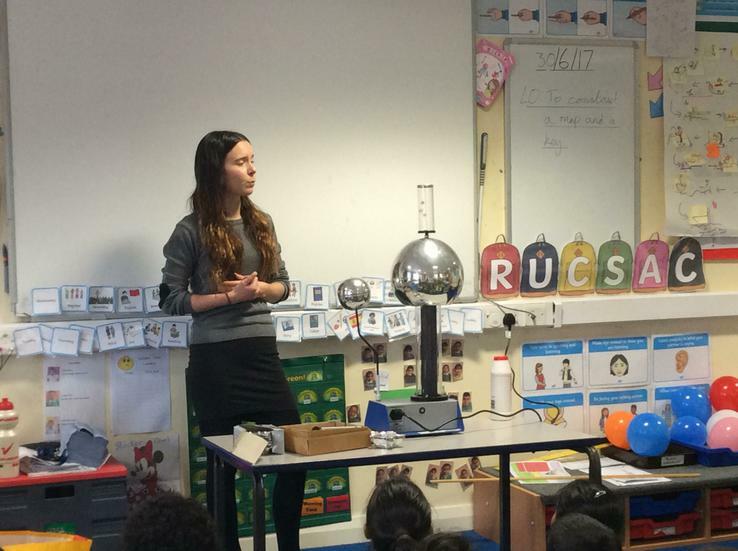 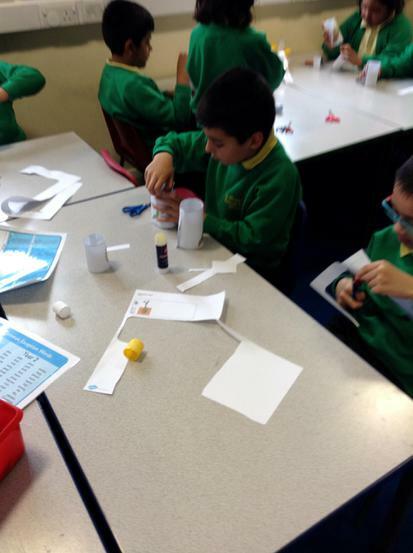 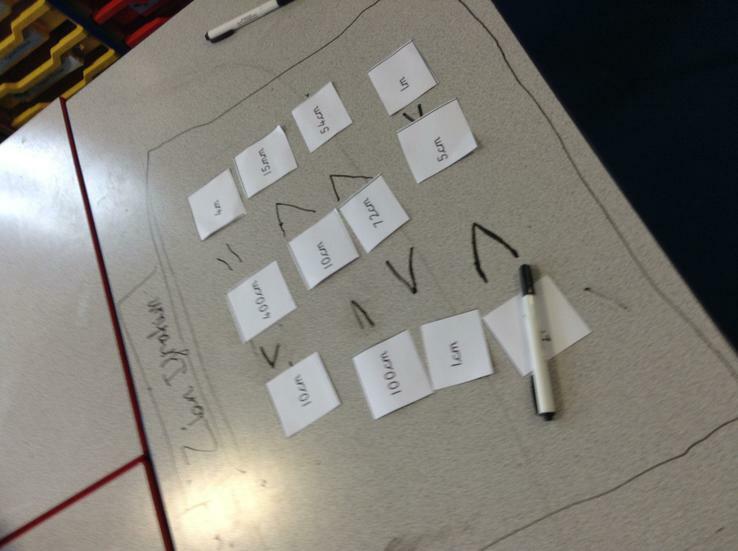 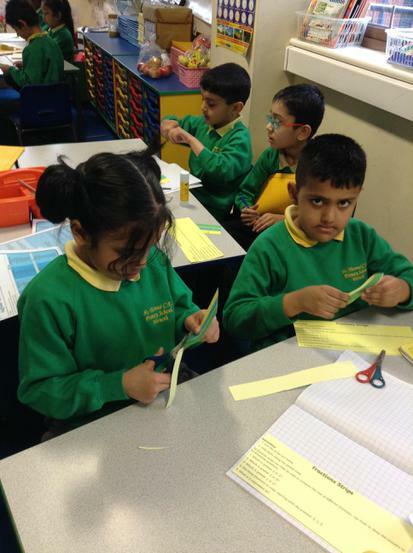 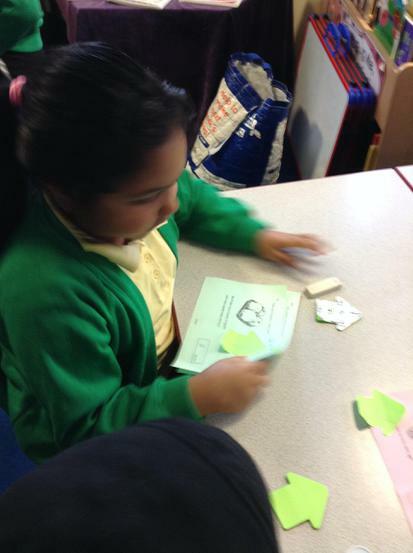 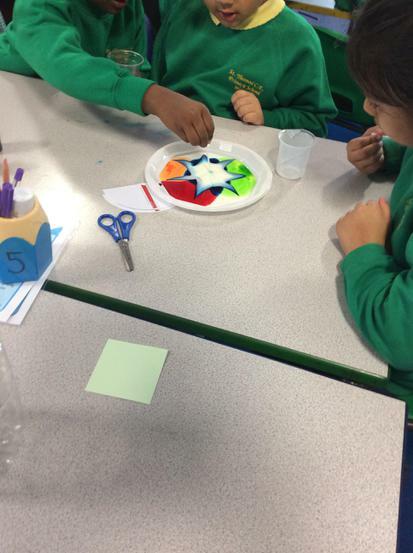 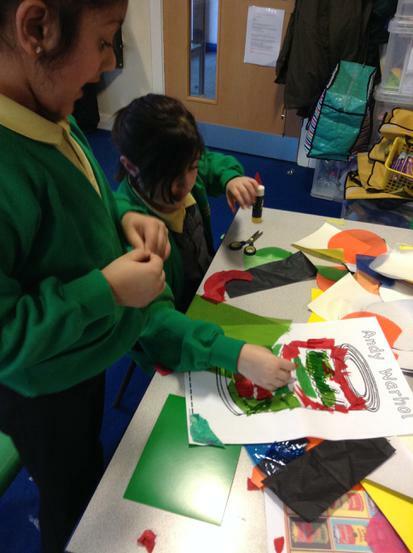 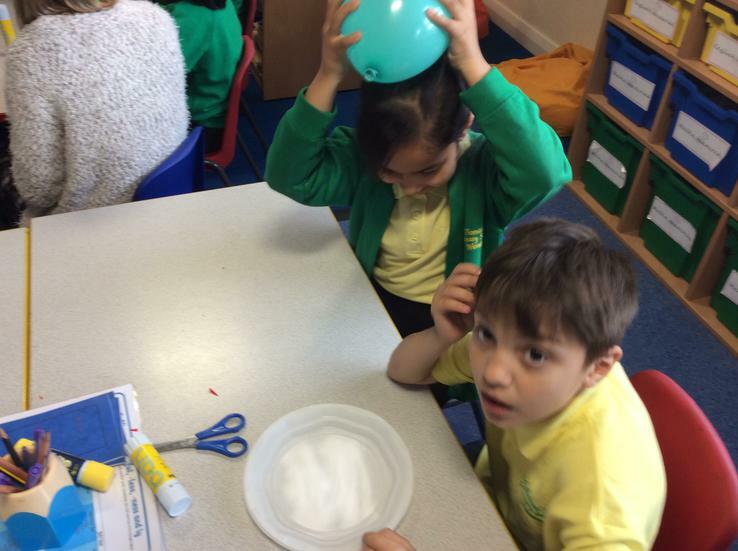 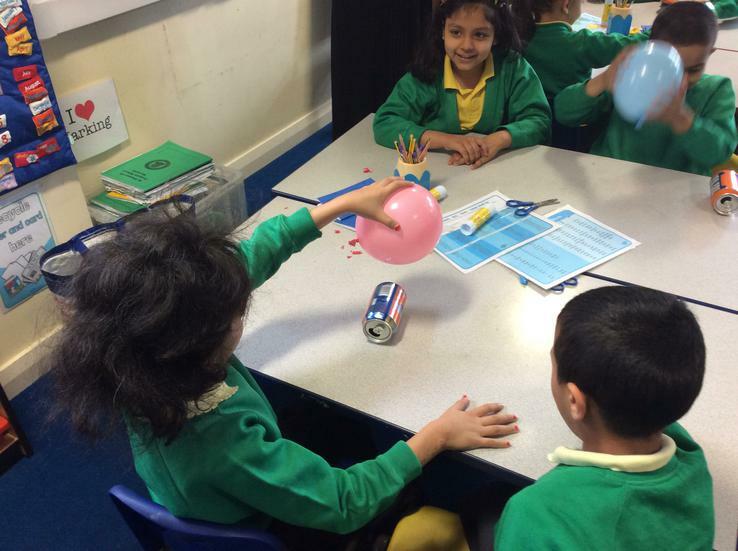 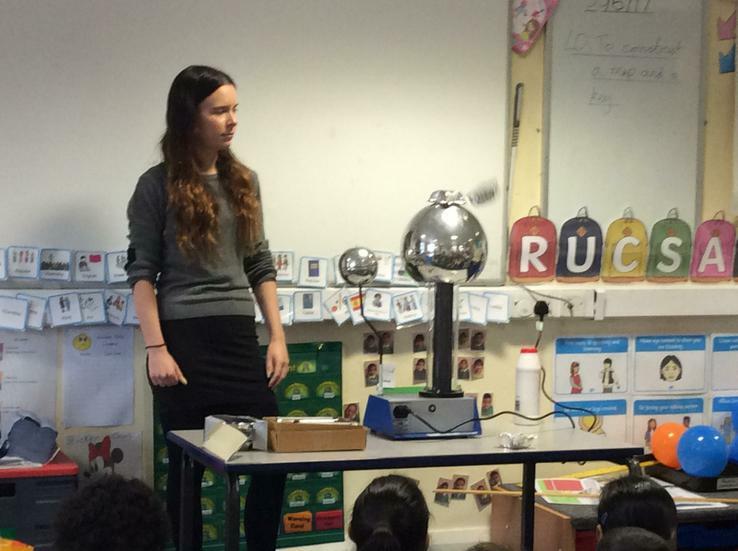 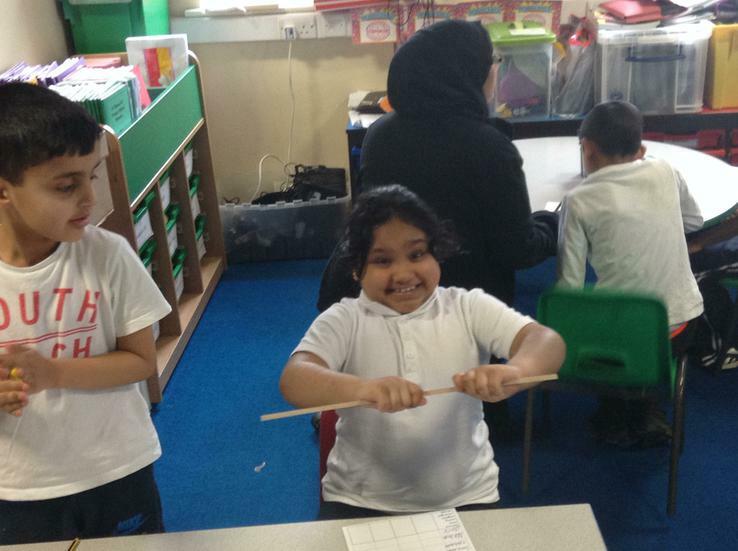 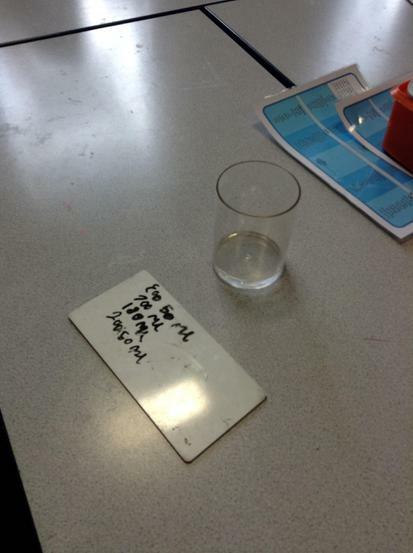 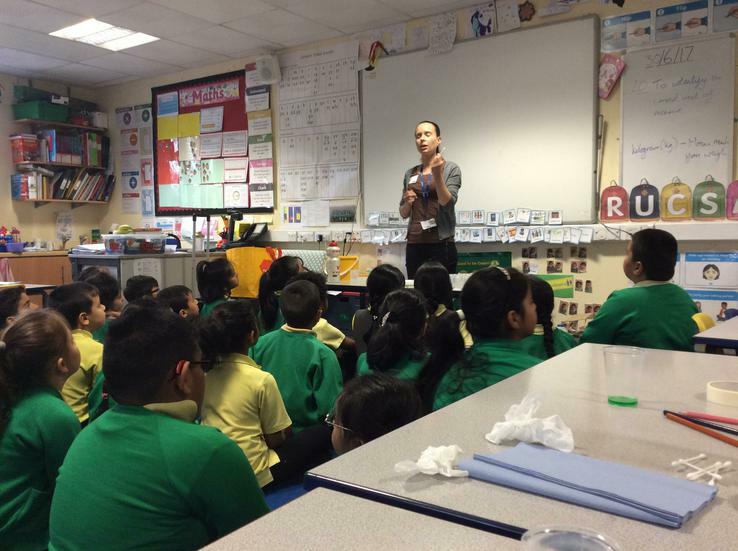 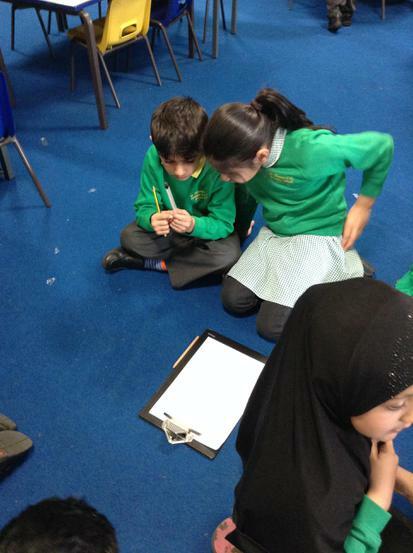 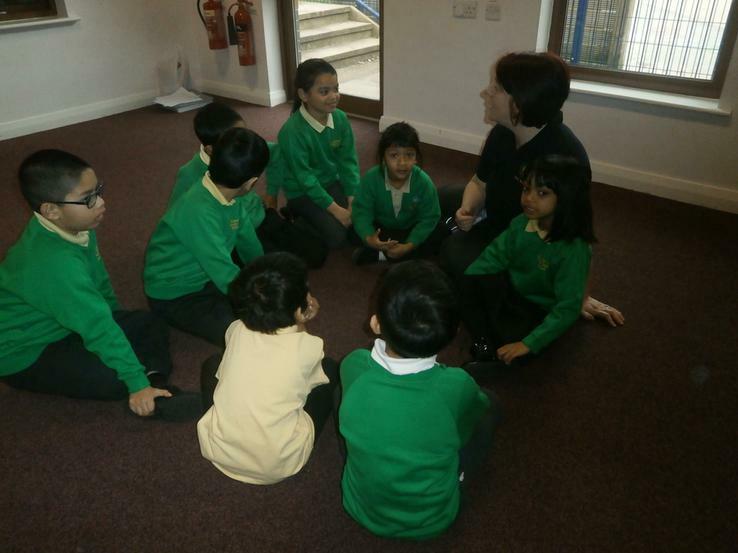 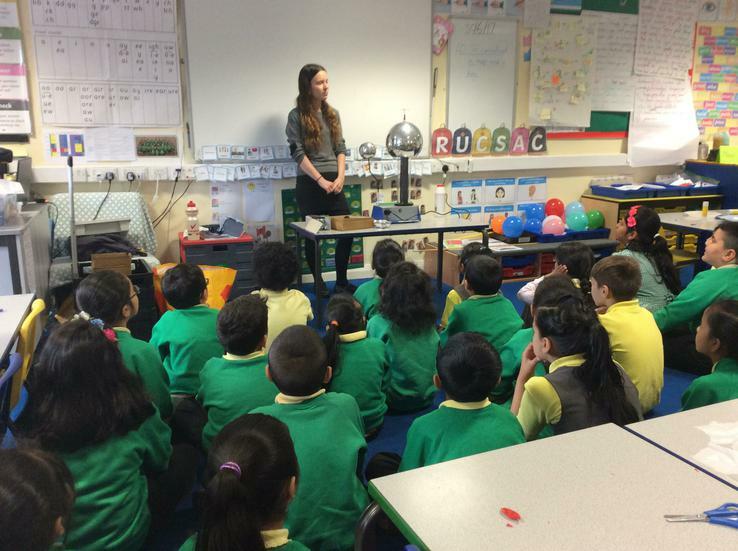 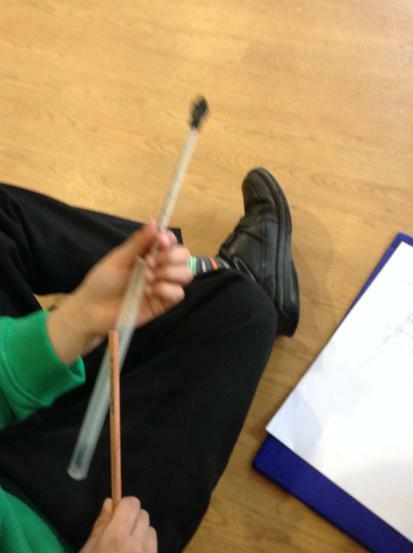 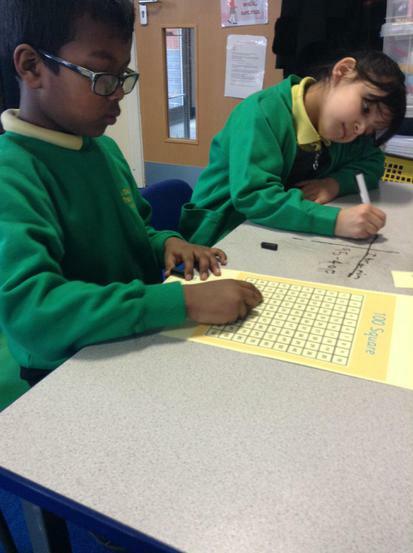 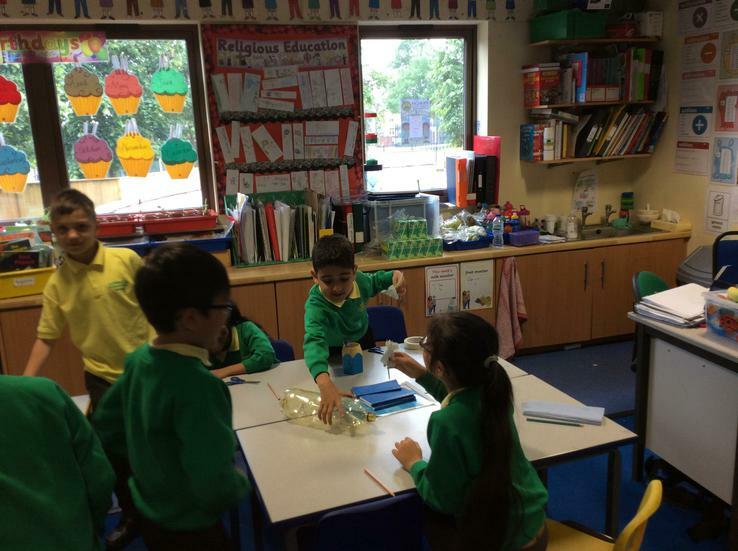 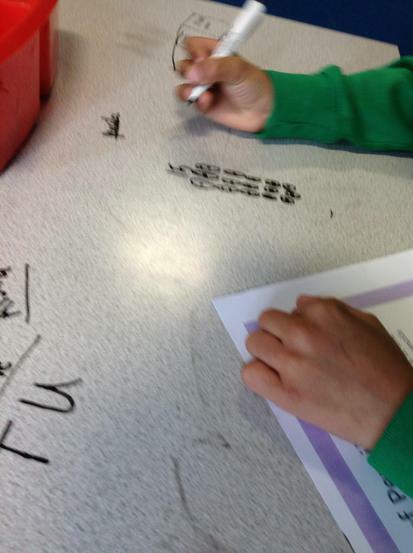 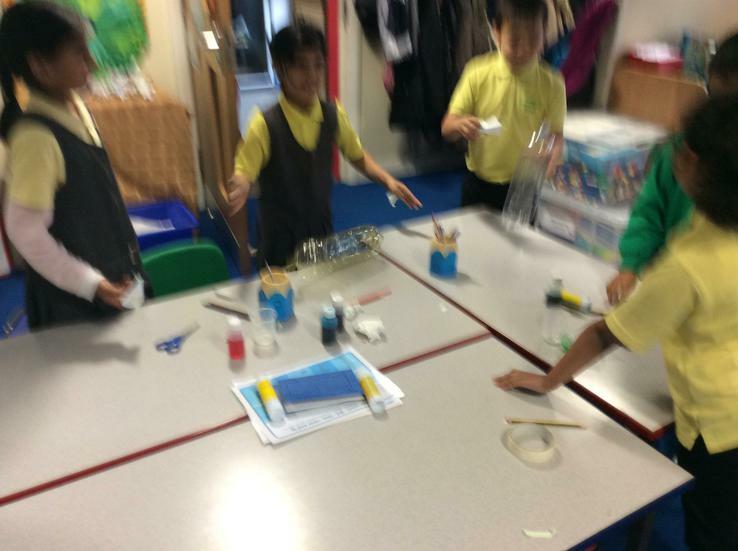 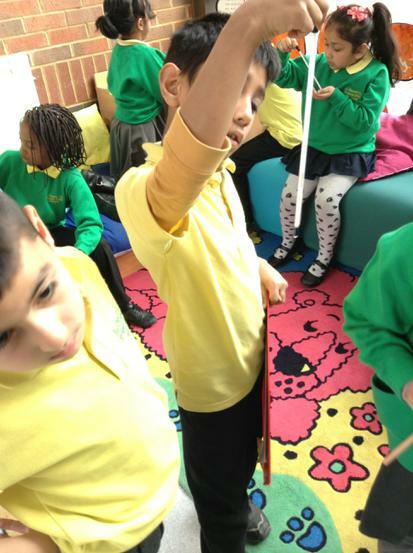 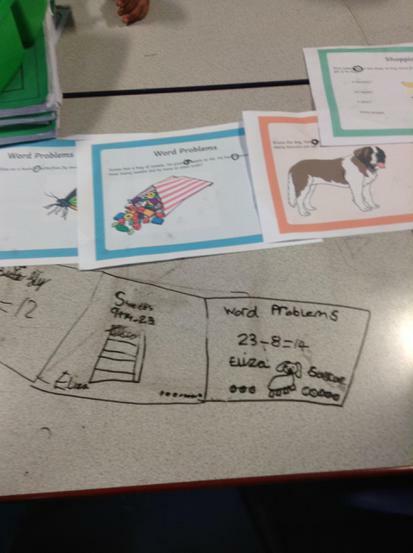 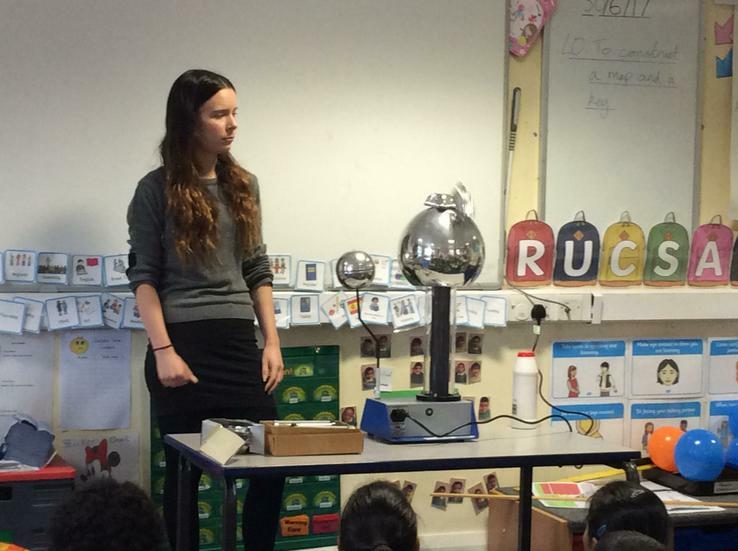 Last week, Miss Lee worked with some of the year 2 pupils. 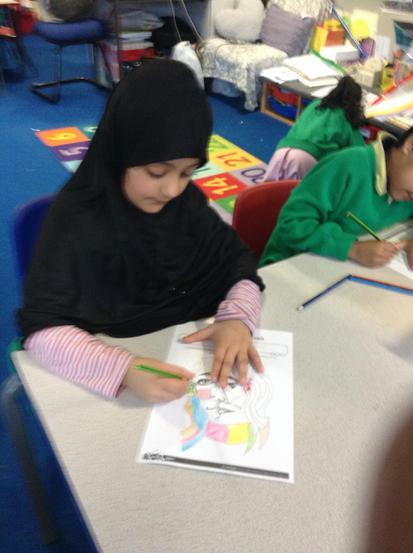 We looked at Winnie the Witch and depicted scenes from the story. 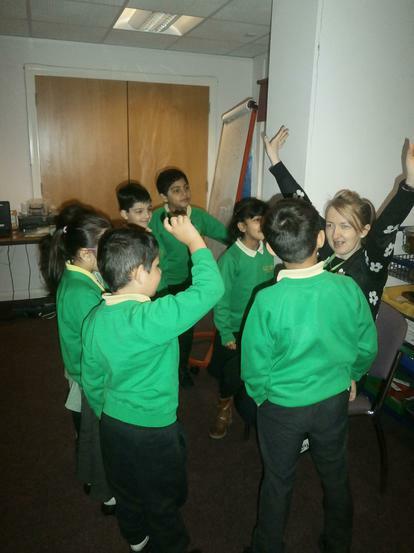 We will like to say a big thank you and a huge good luck to Miss L. Wood who has been teaching the Eagles Class over the last nine weeks! 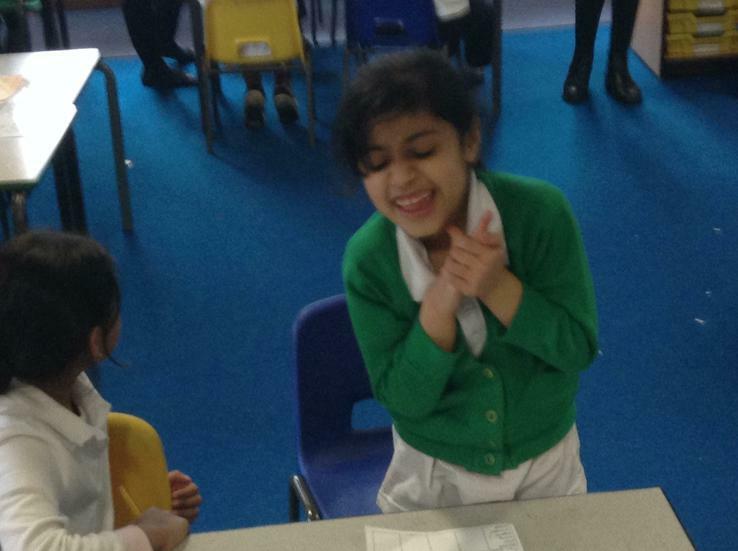 We have really enjoyed all your amazing lessons and hope that you come and visit us again soon! 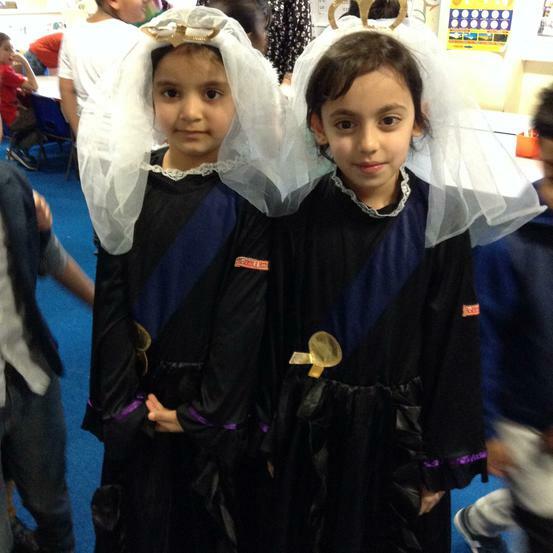 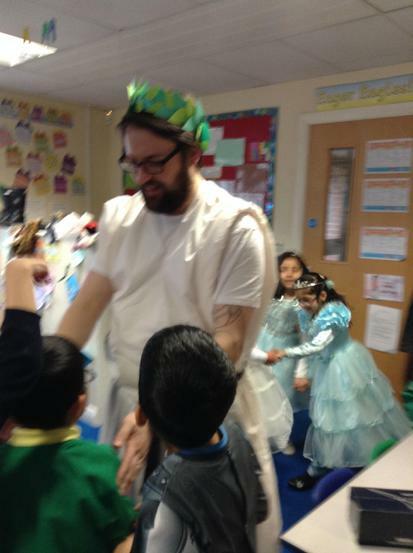 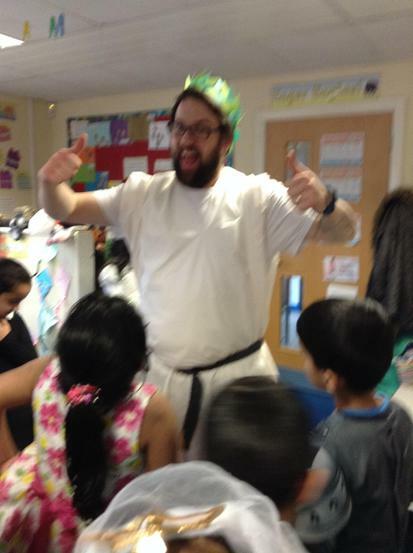 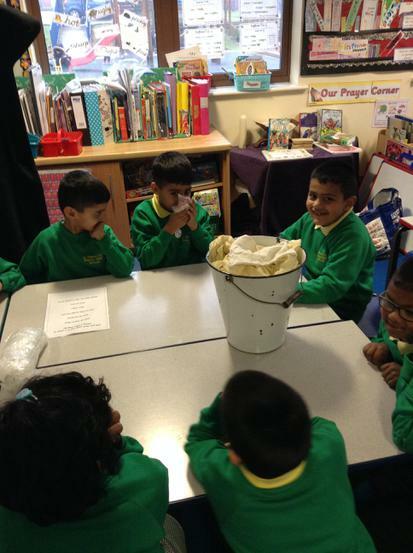 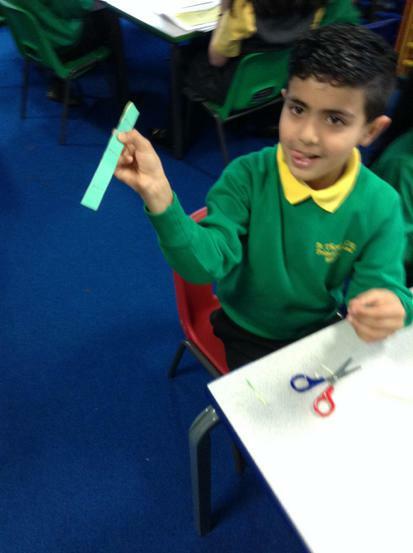 Today, the children were learning all about Palm Sunday in RE which was yesterday (Sunday 20th March). 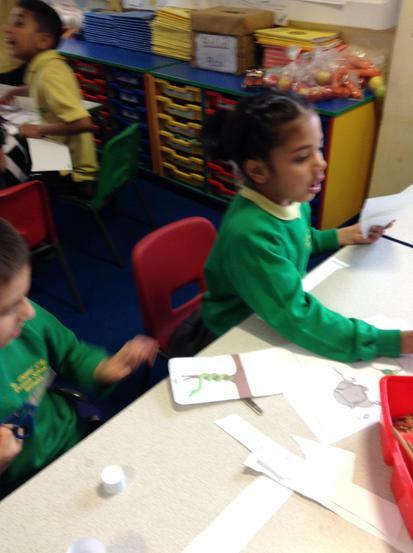 They made their own palm leaves and wrote words to describe the special day on them. 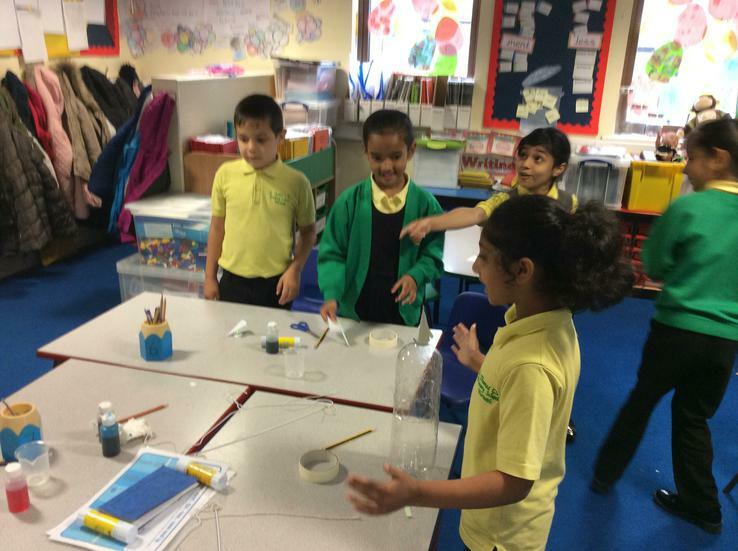 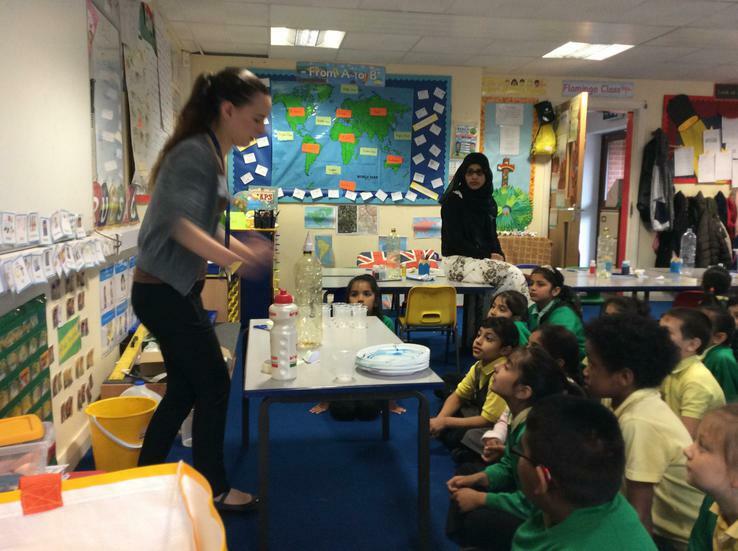 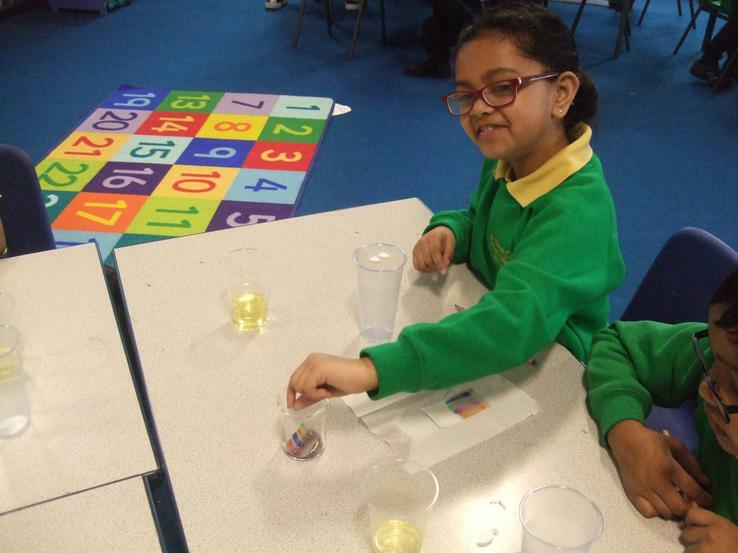 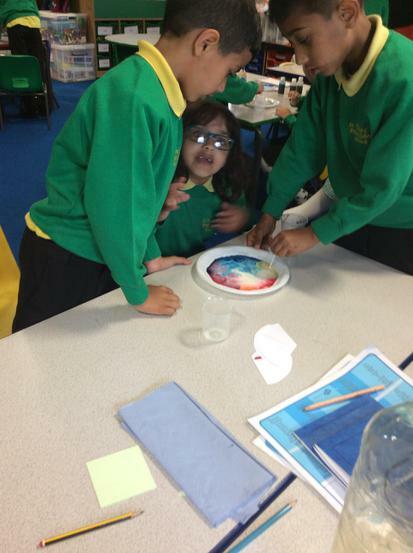 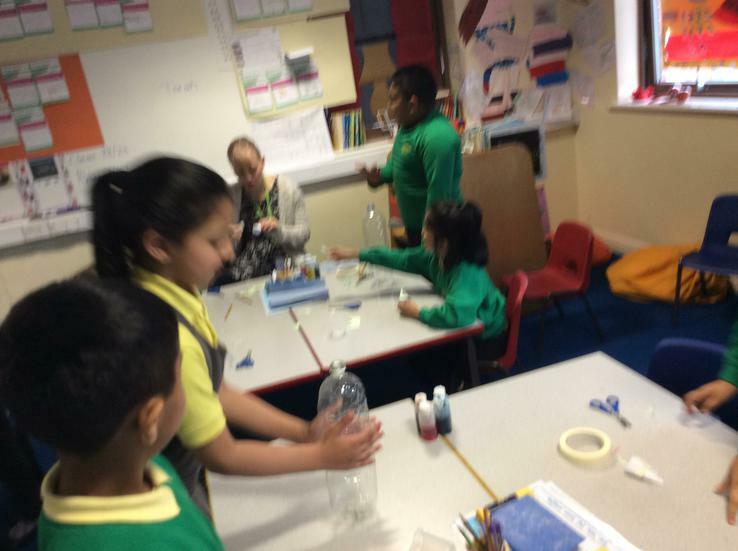 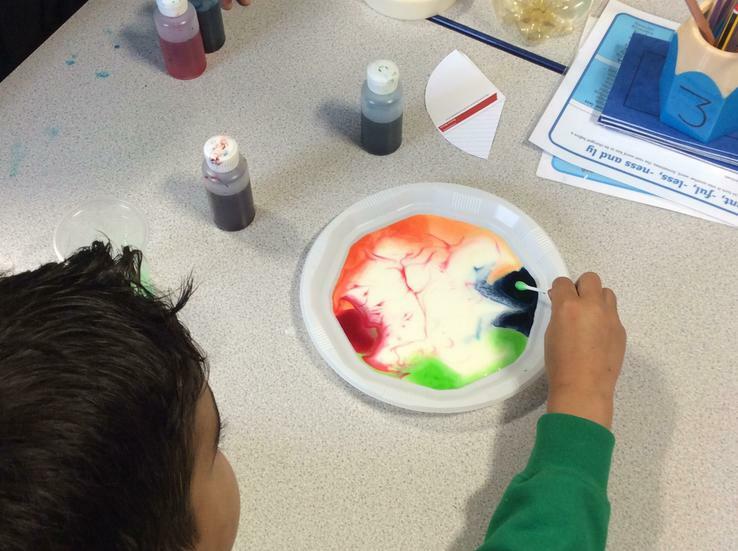 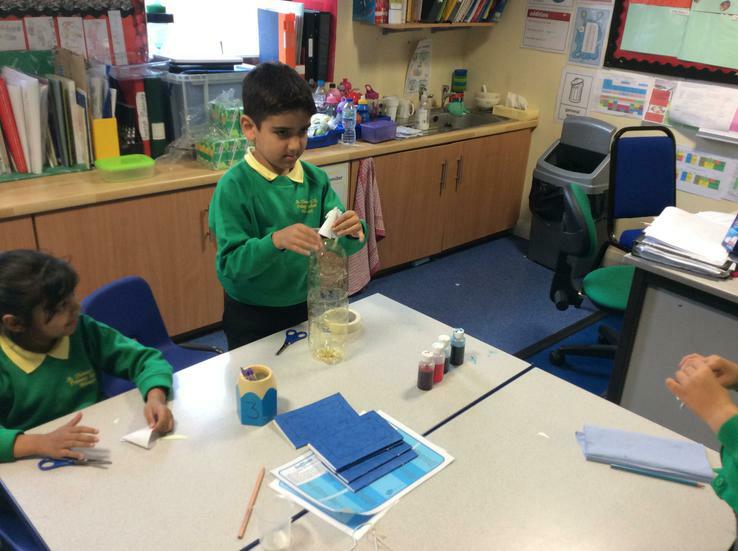 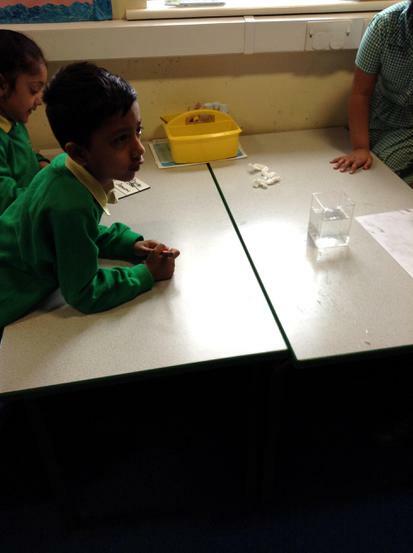 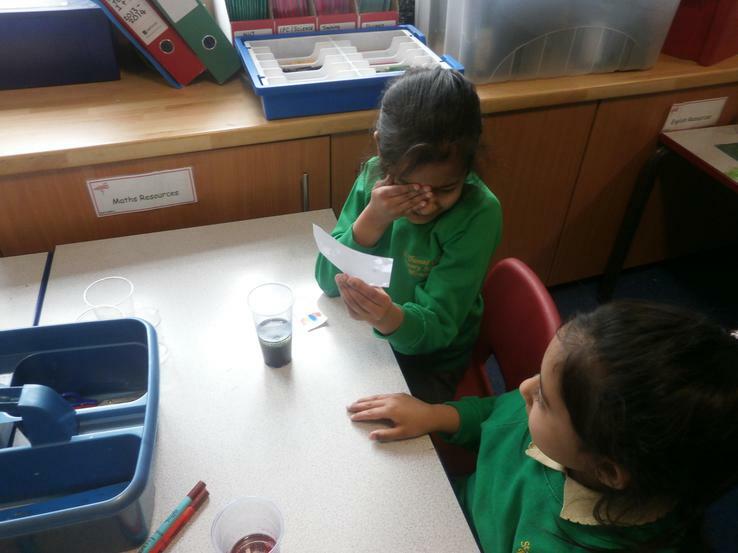 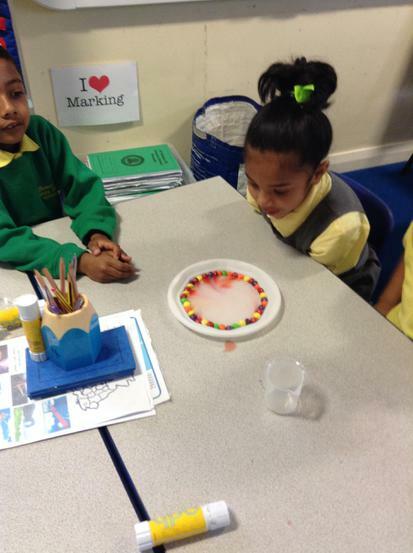 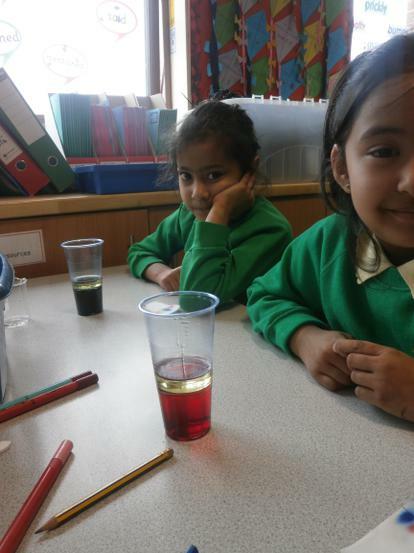 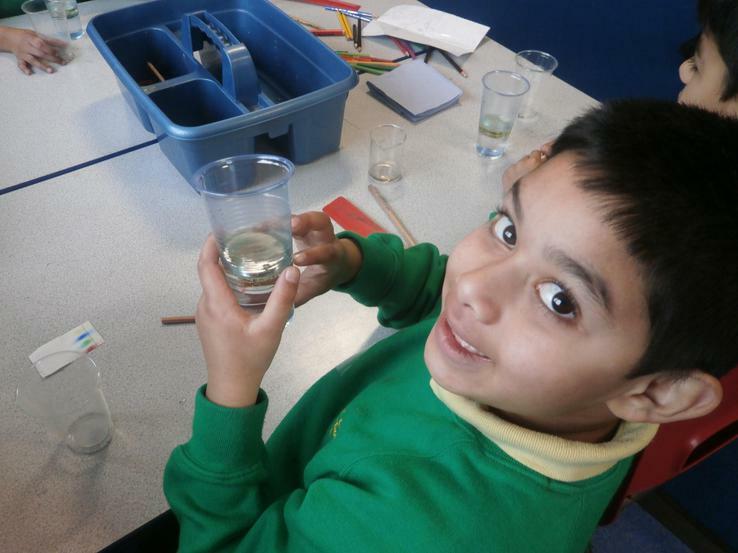 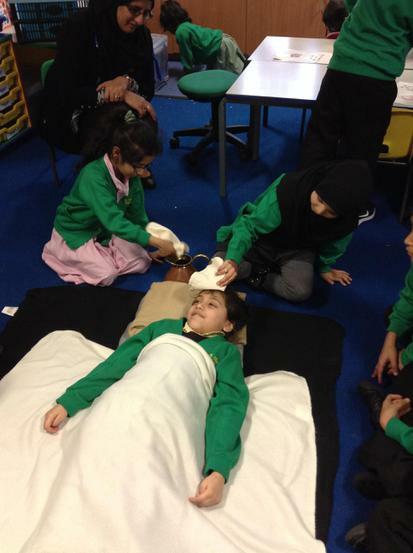 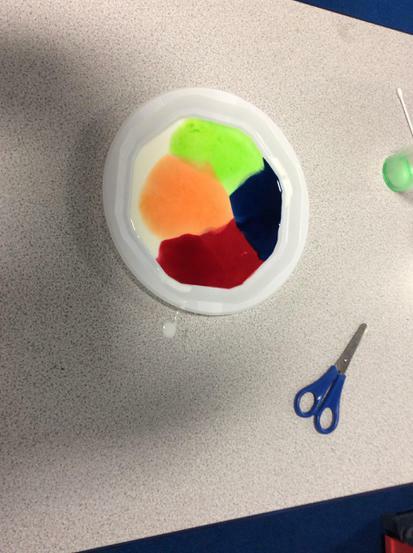 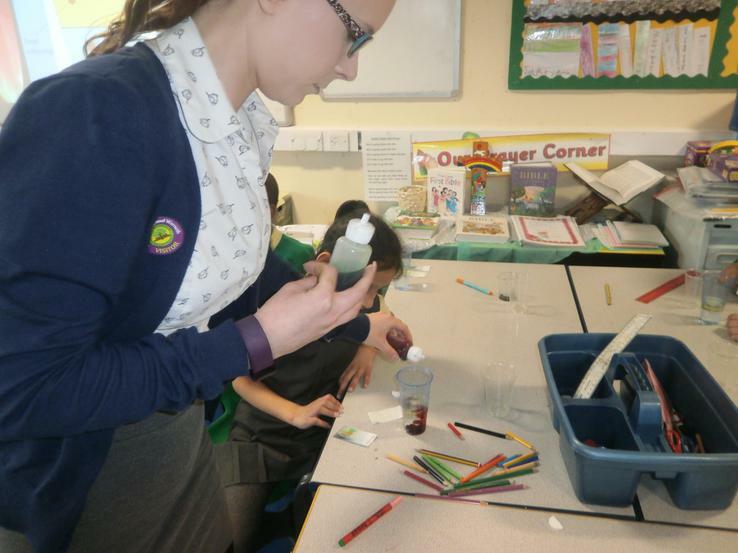 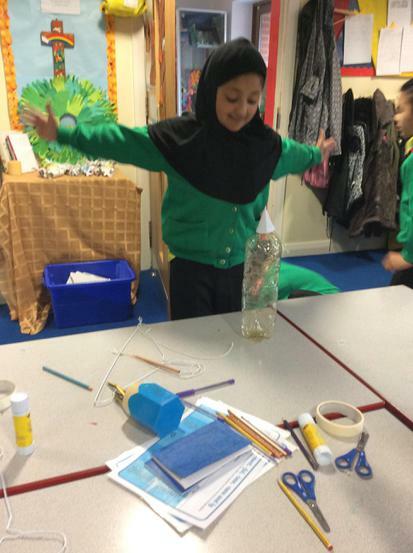 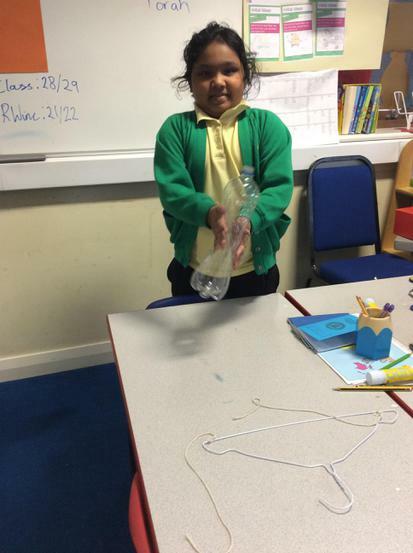 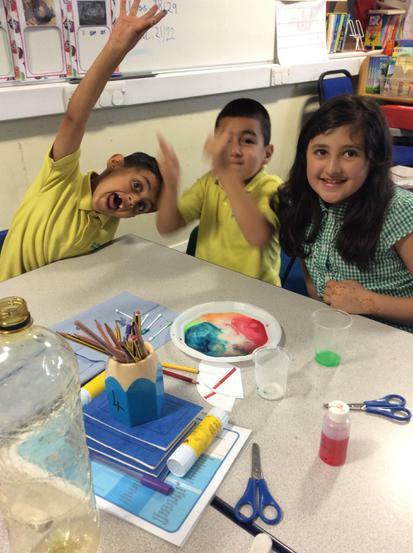 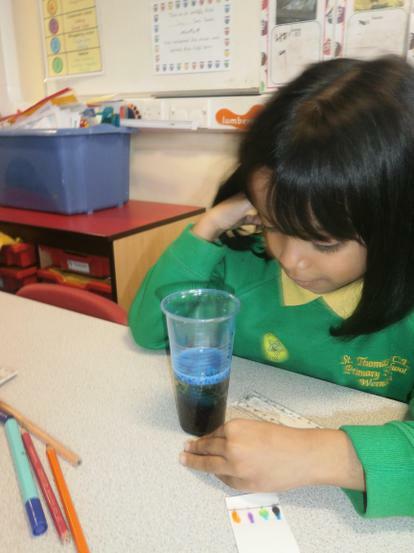 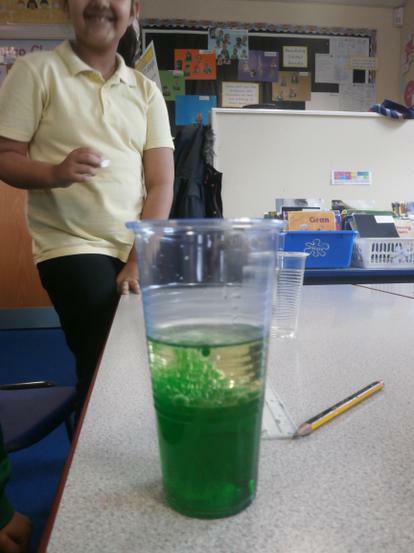 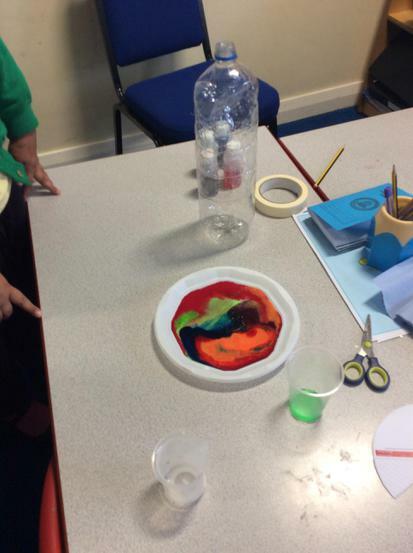 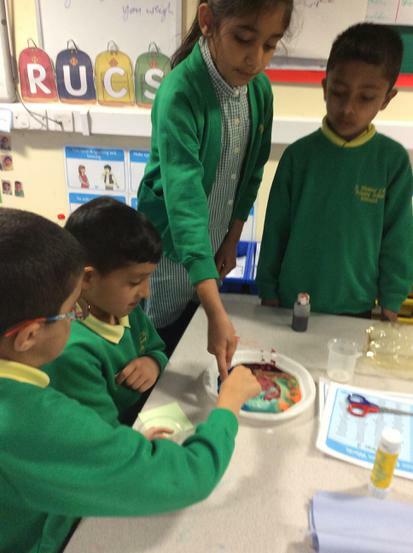 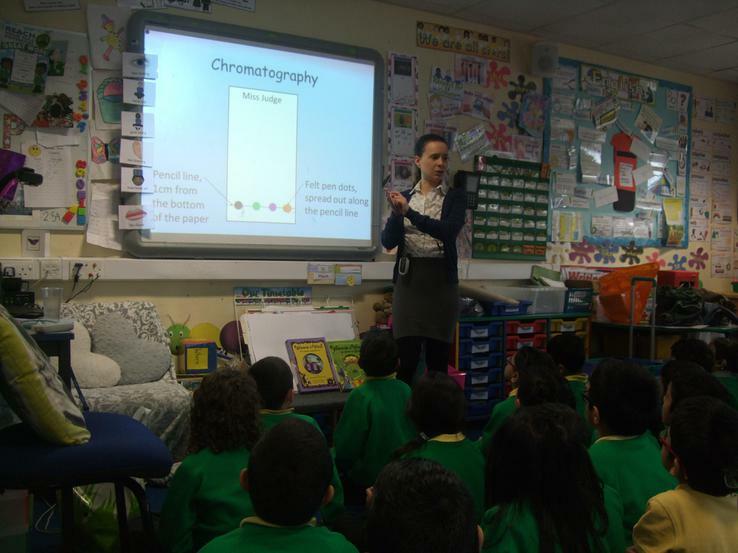 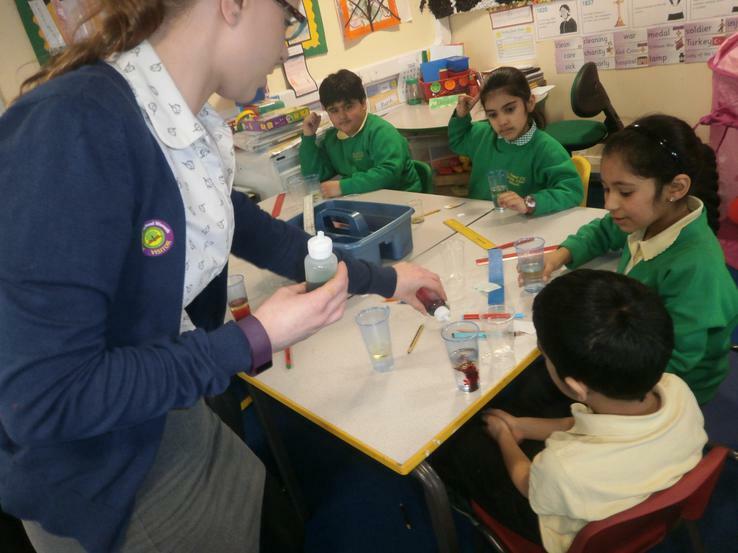 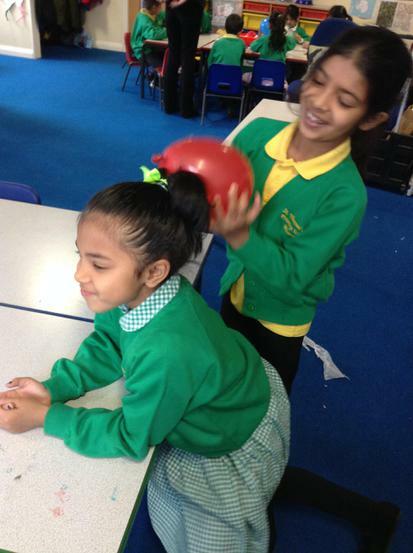 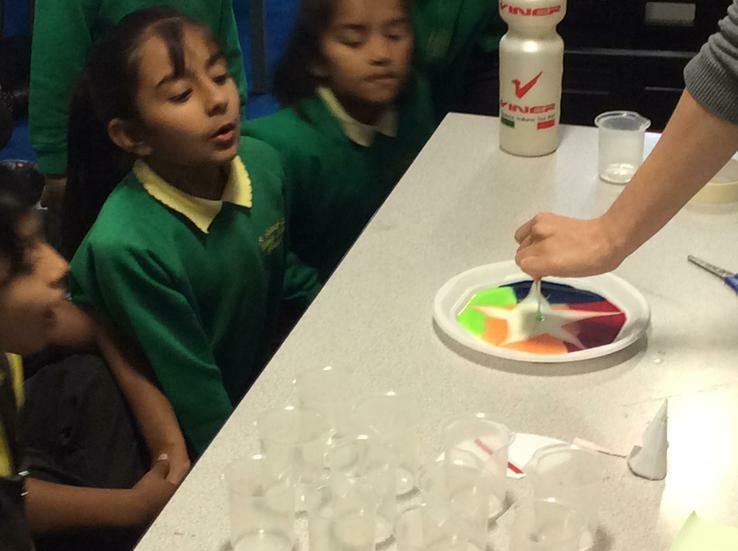 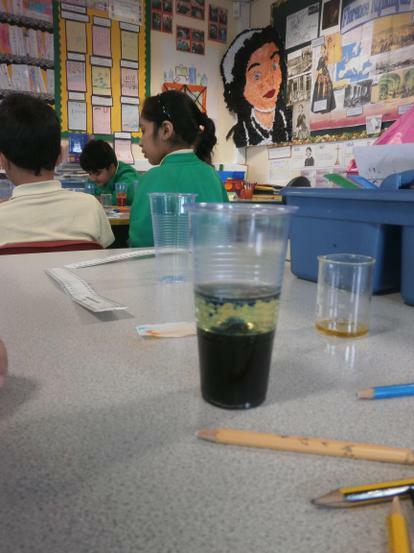 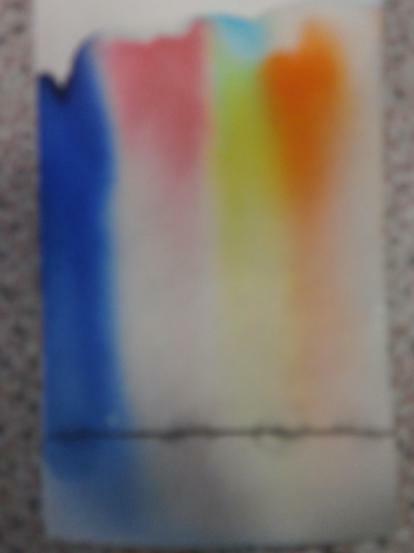 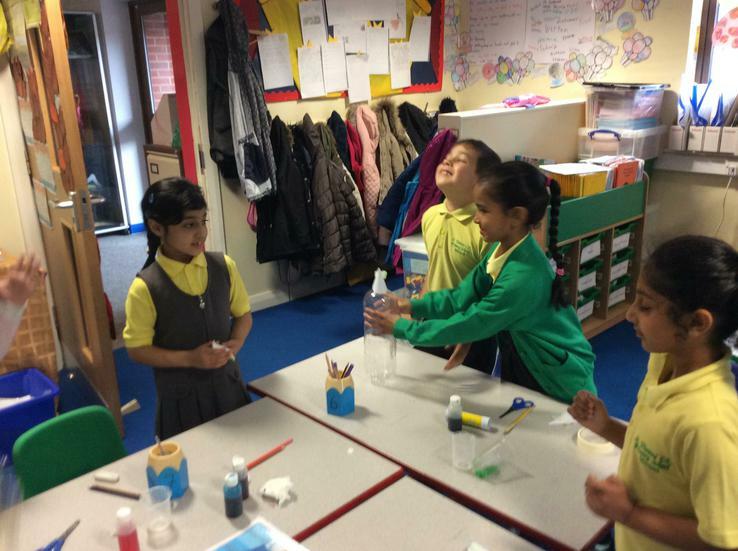 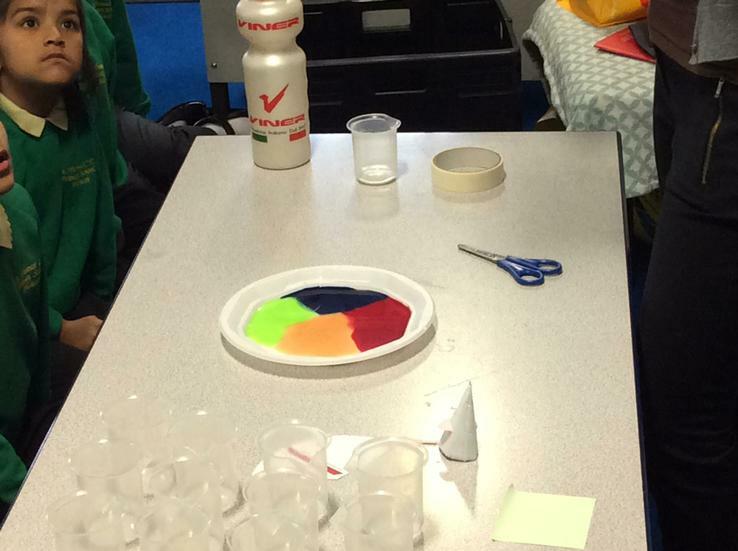 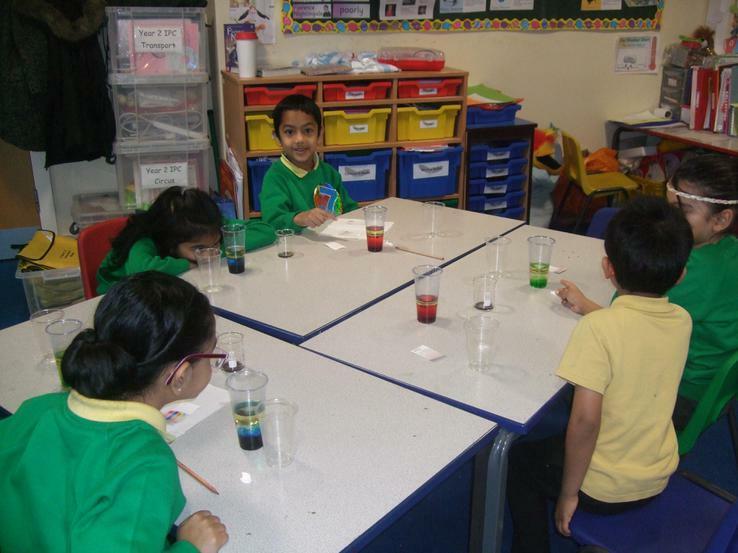 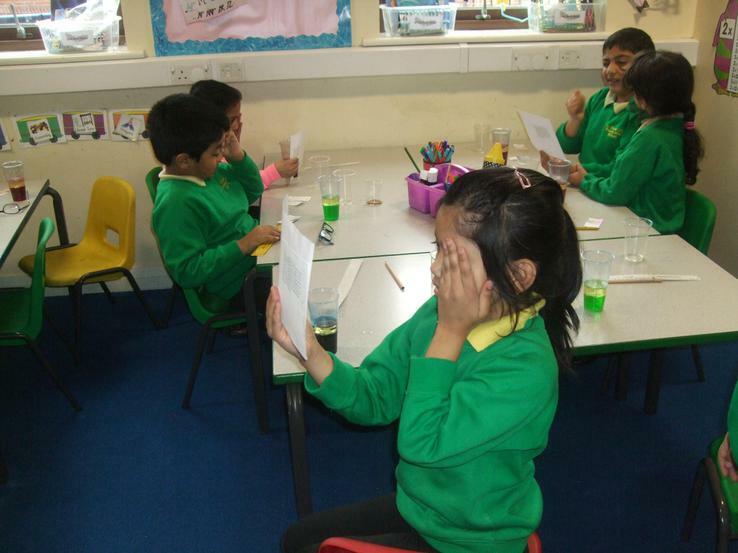 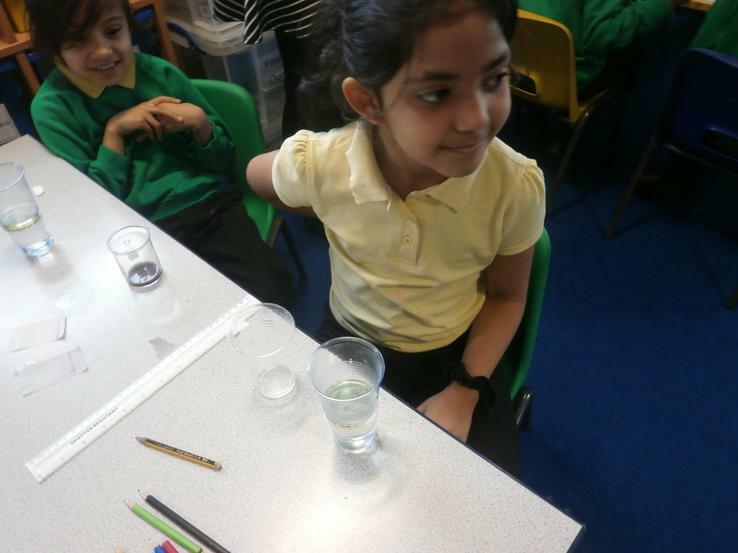 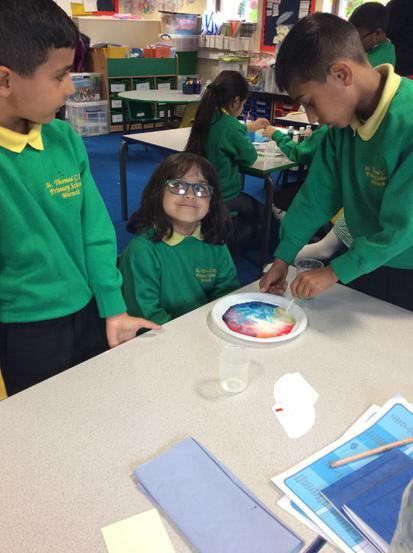 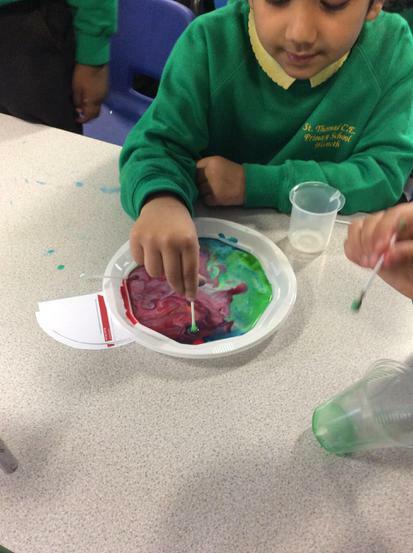 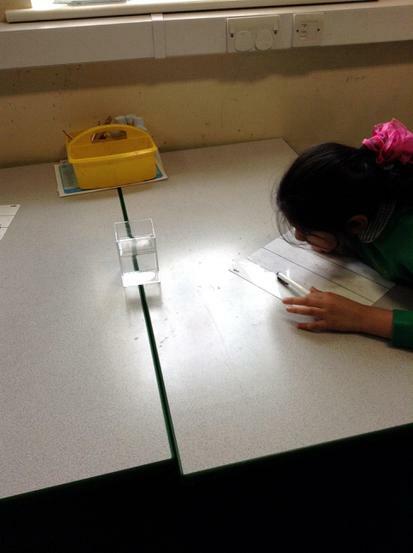 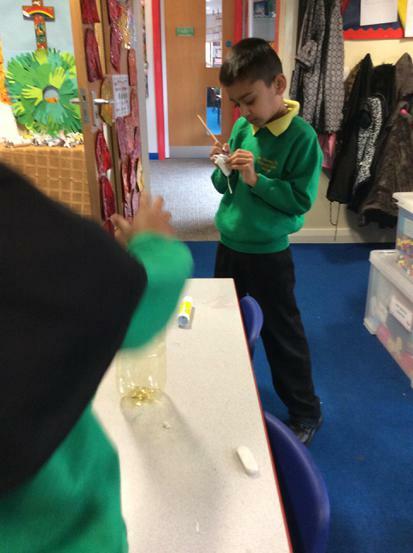 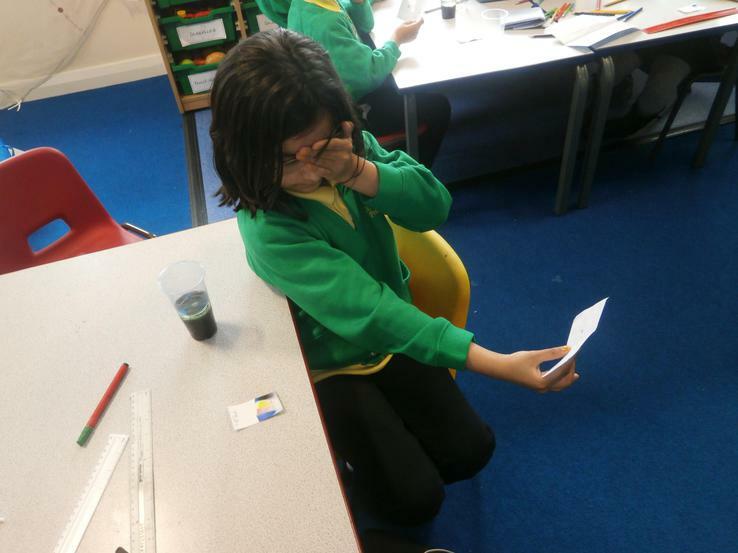 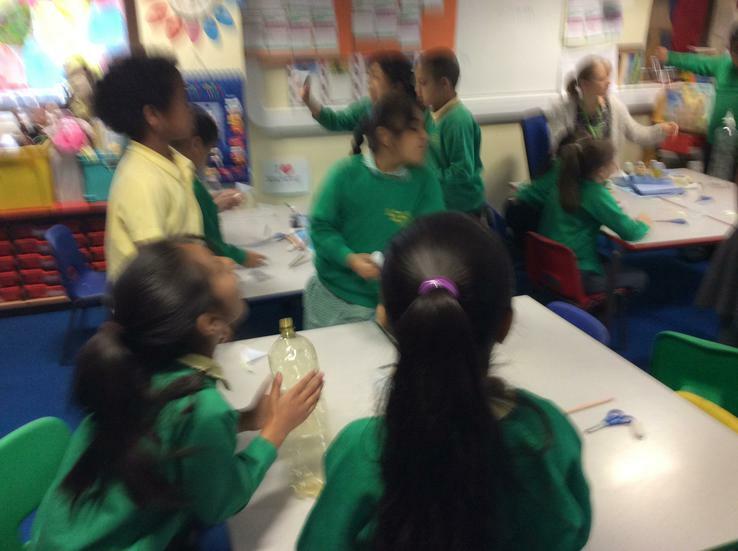 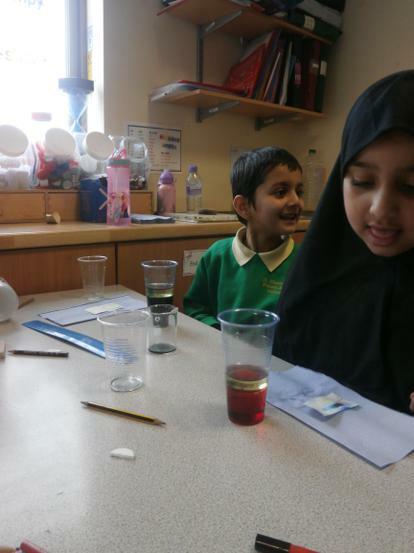 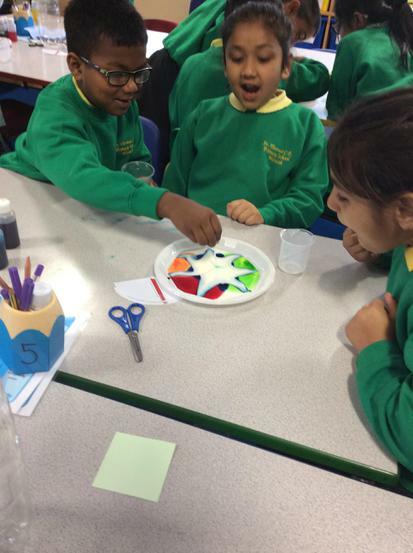 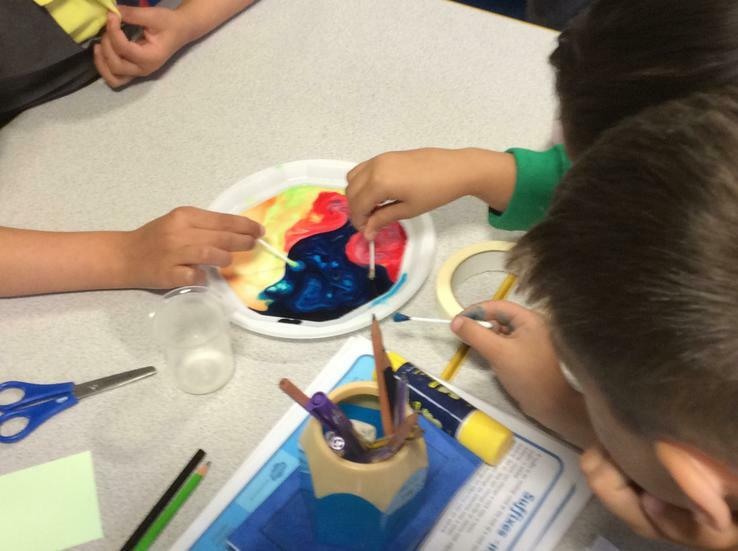 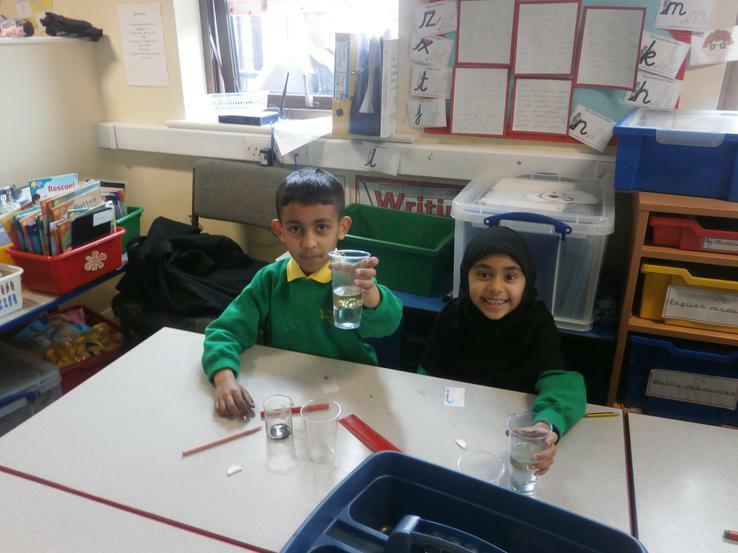 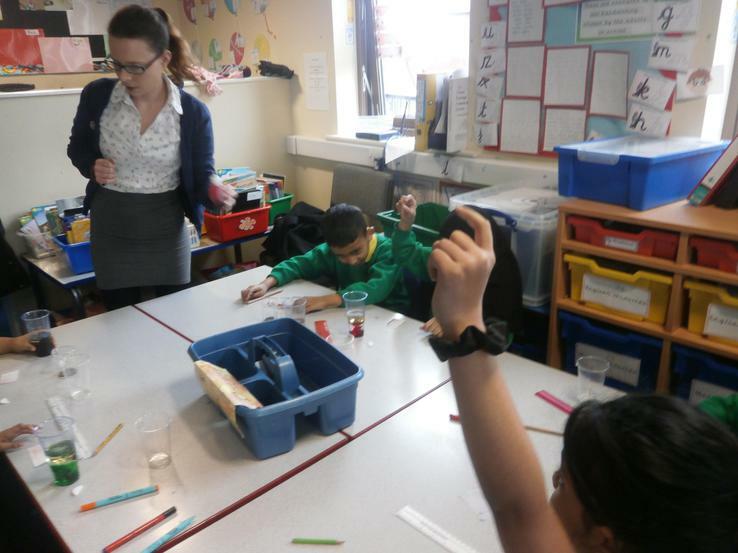 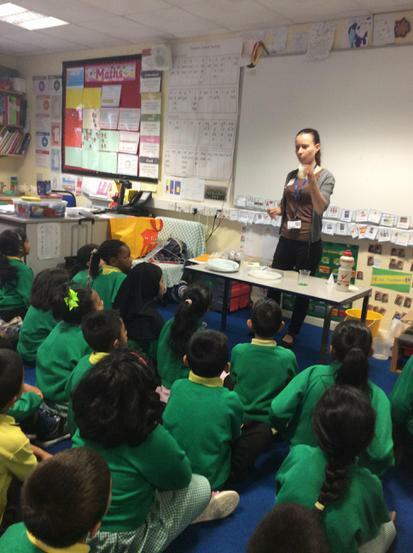 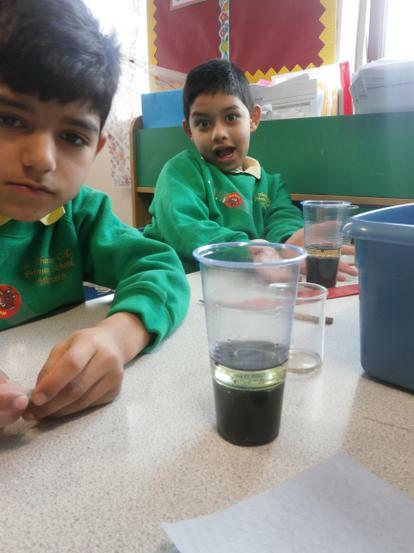 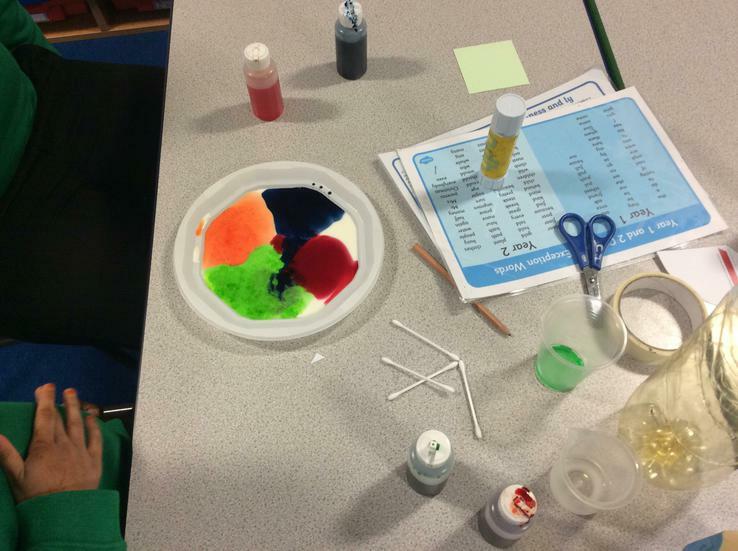 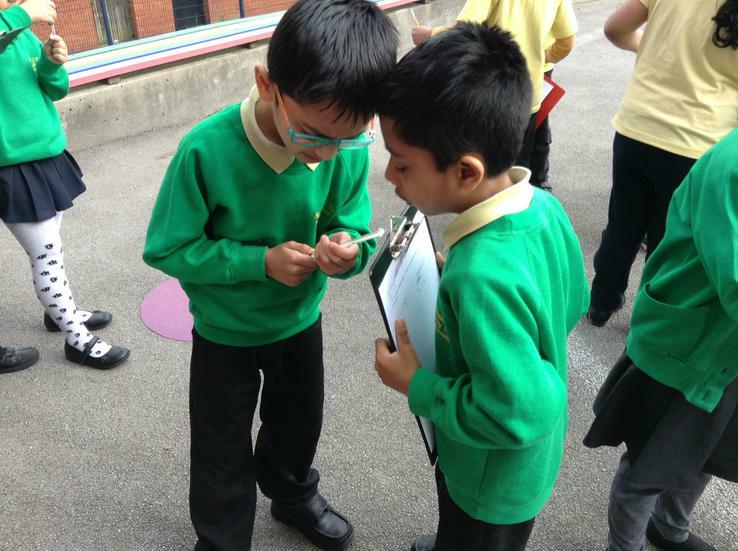 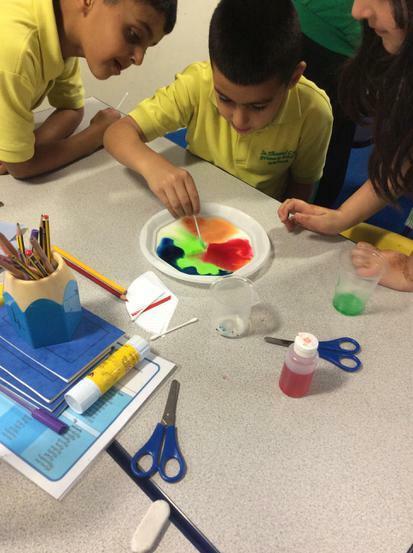 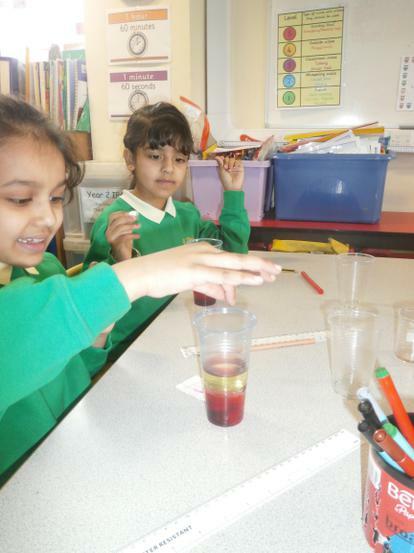 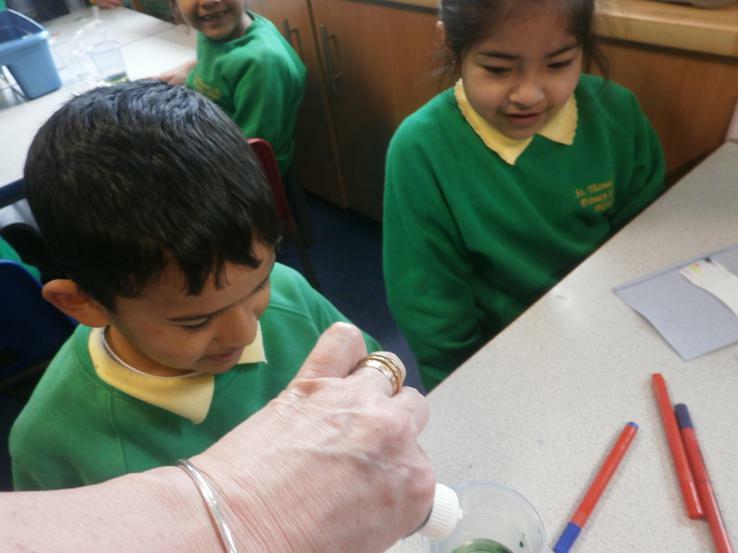 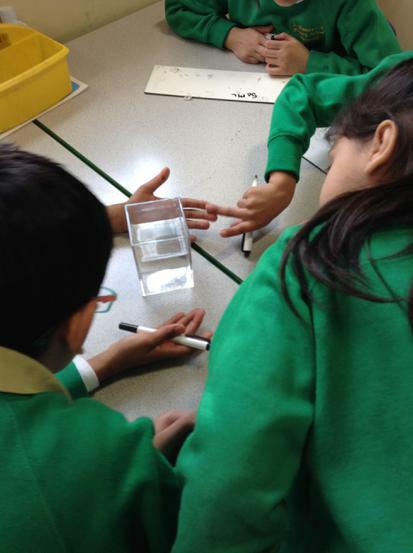 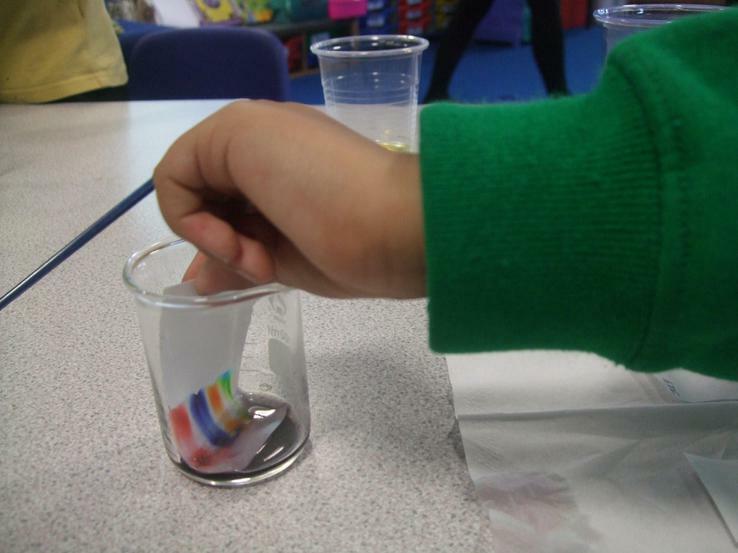 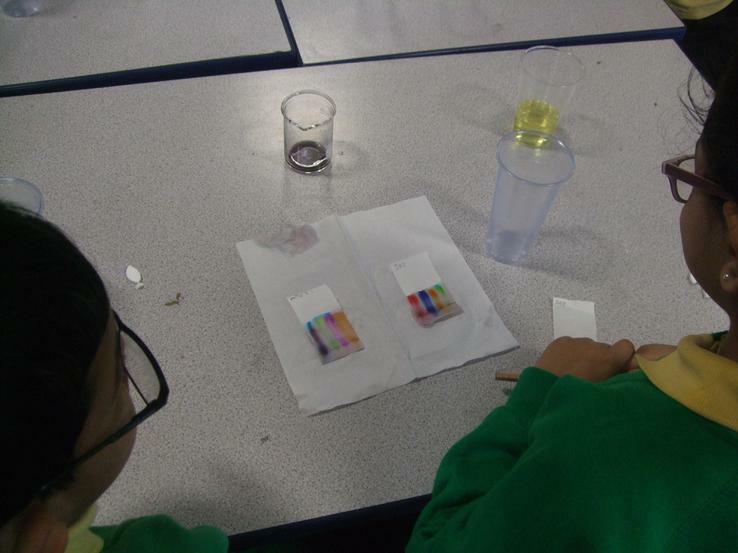 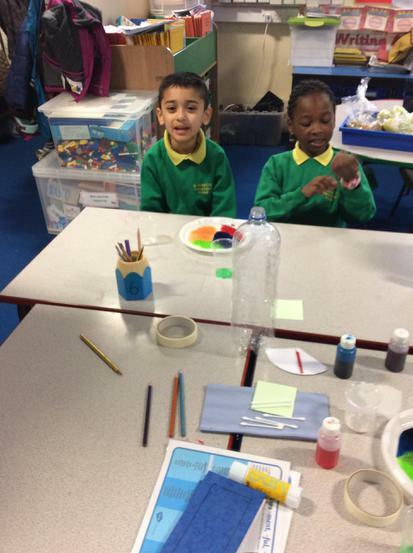 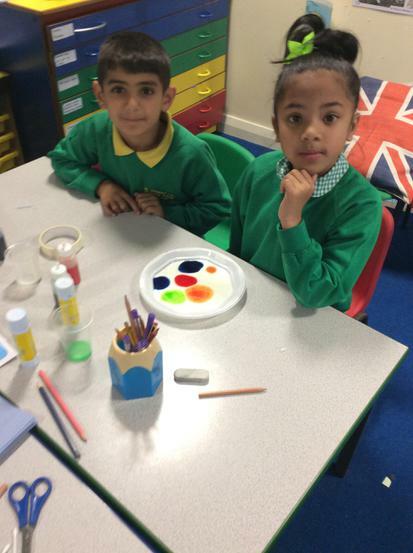 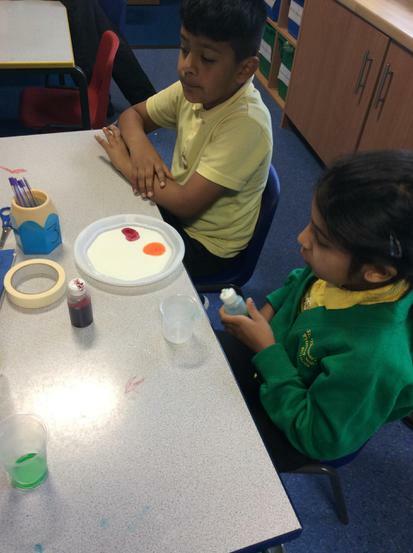 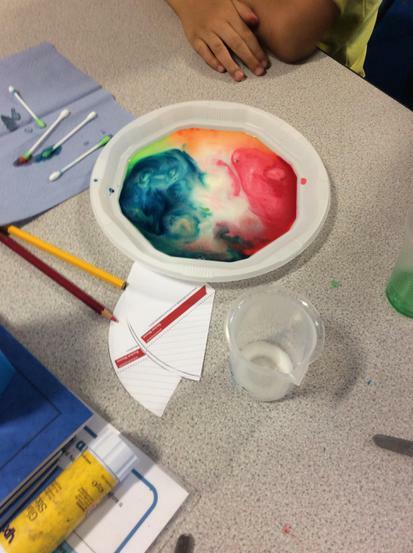 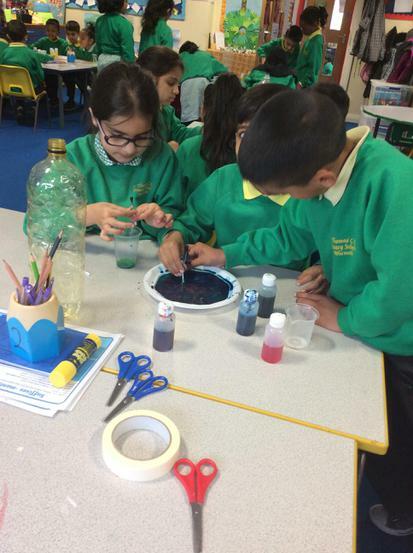 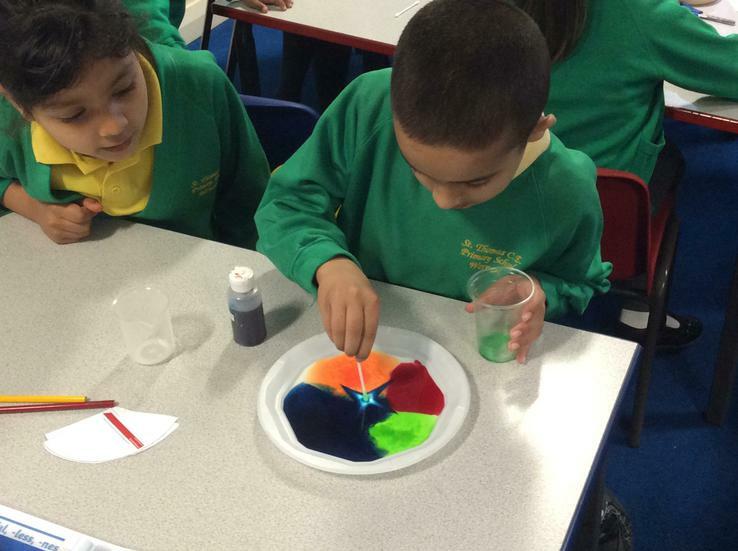 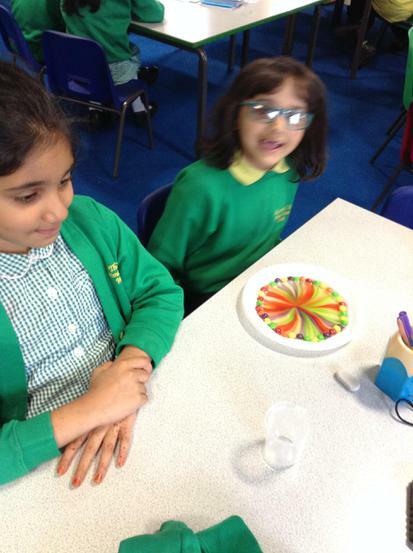 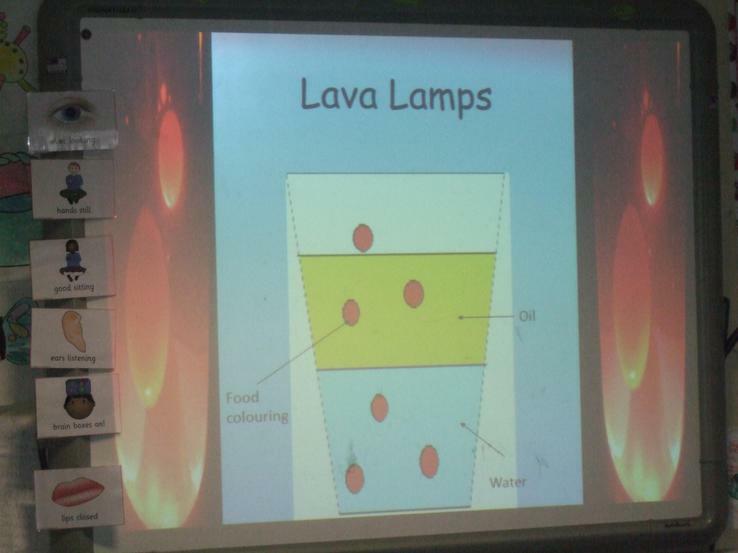 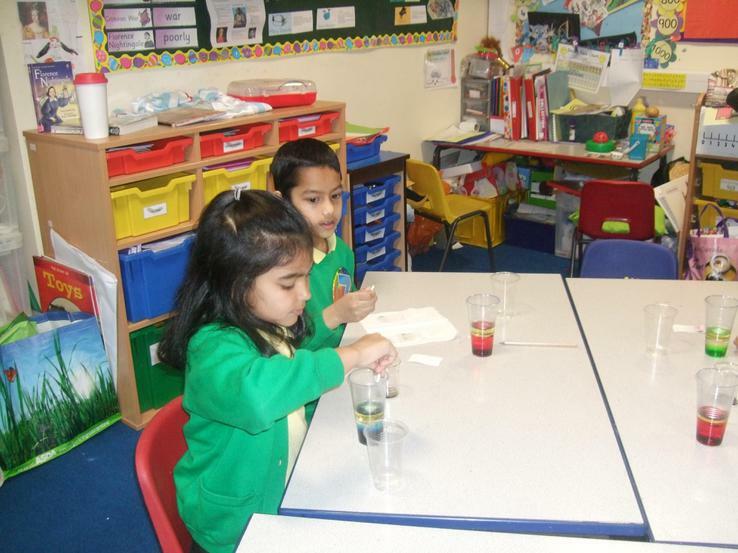 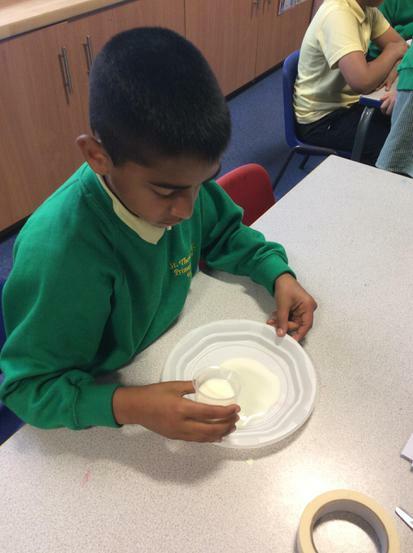 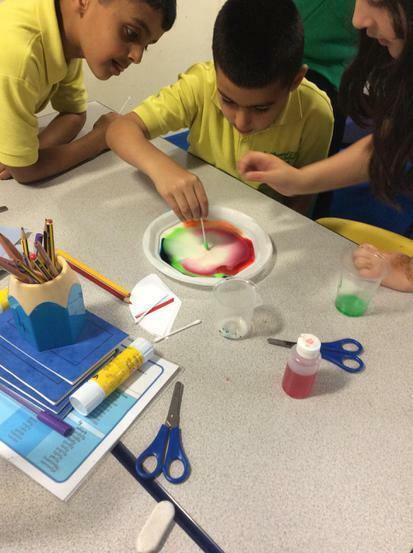 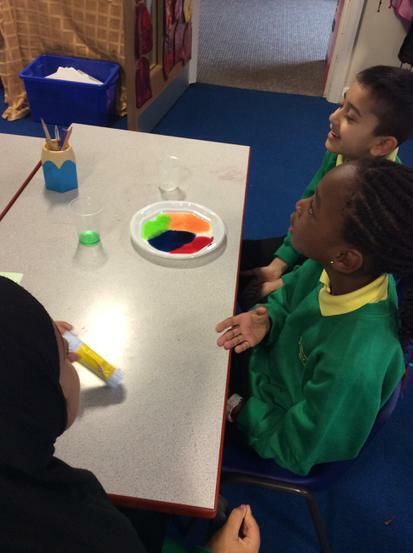 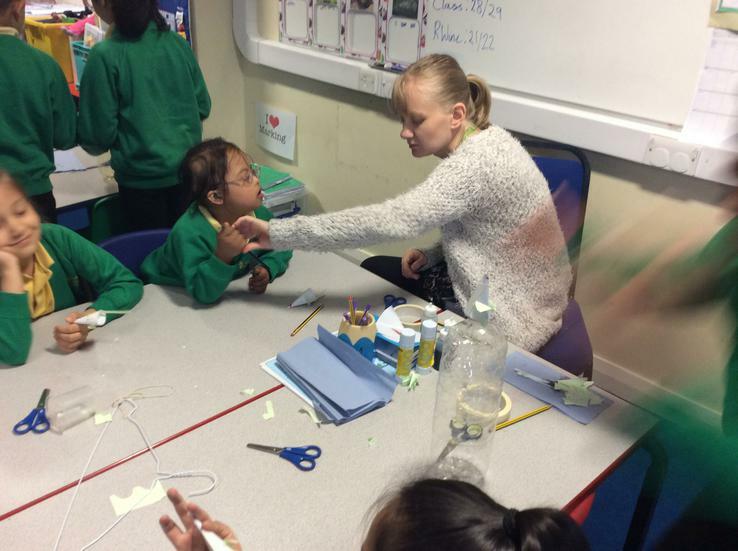 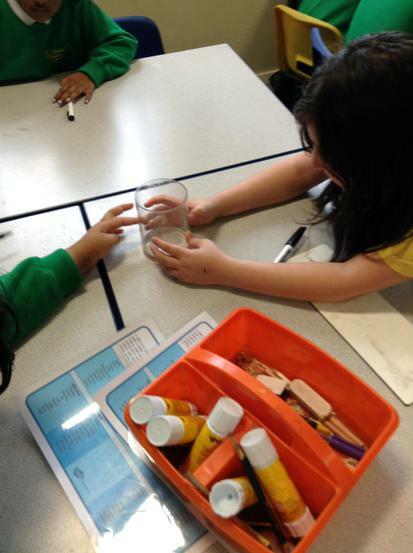 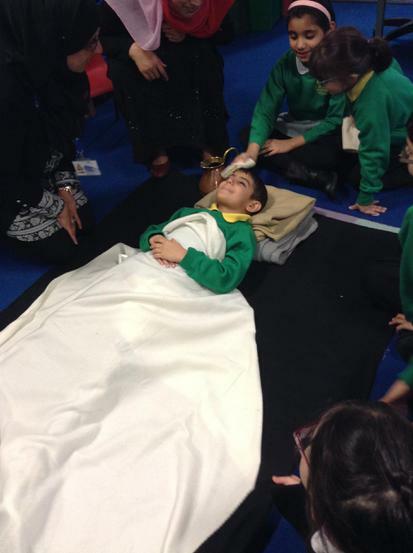 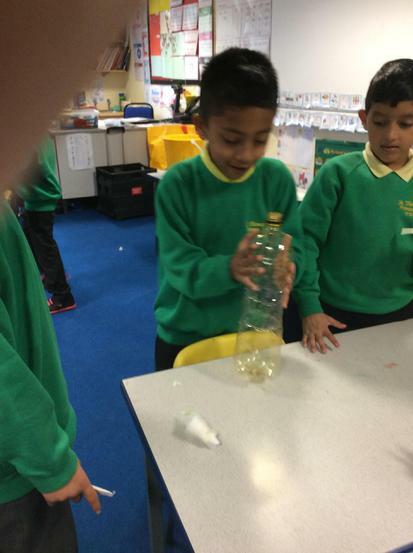 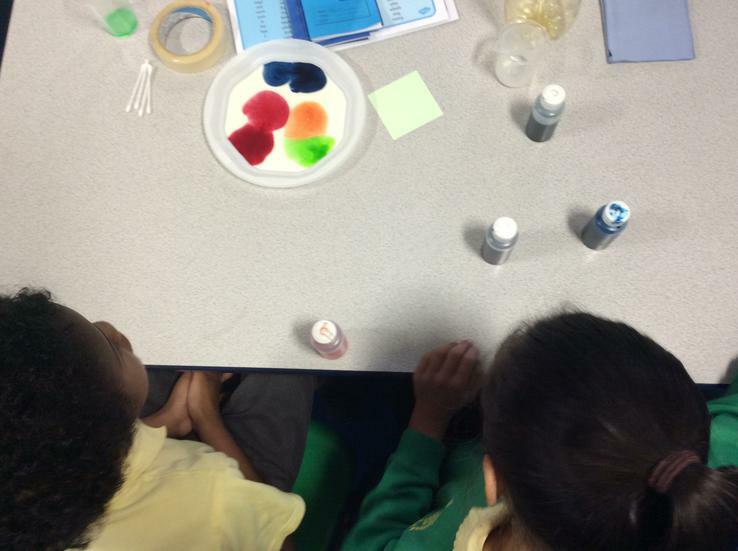 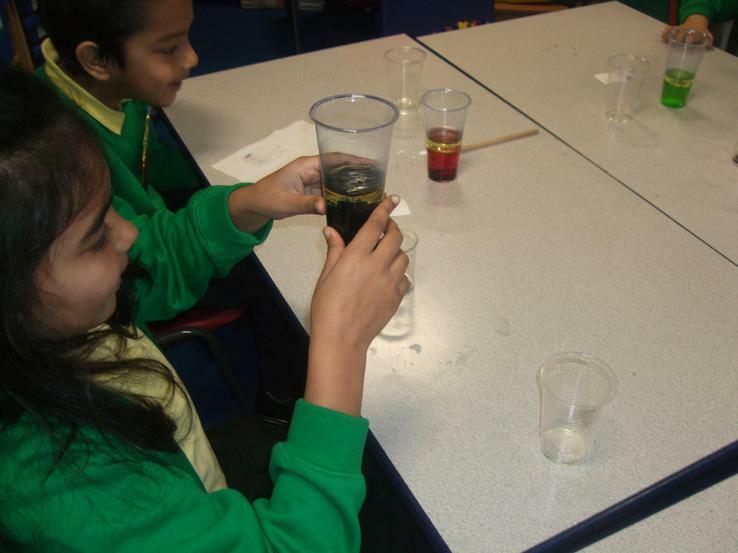 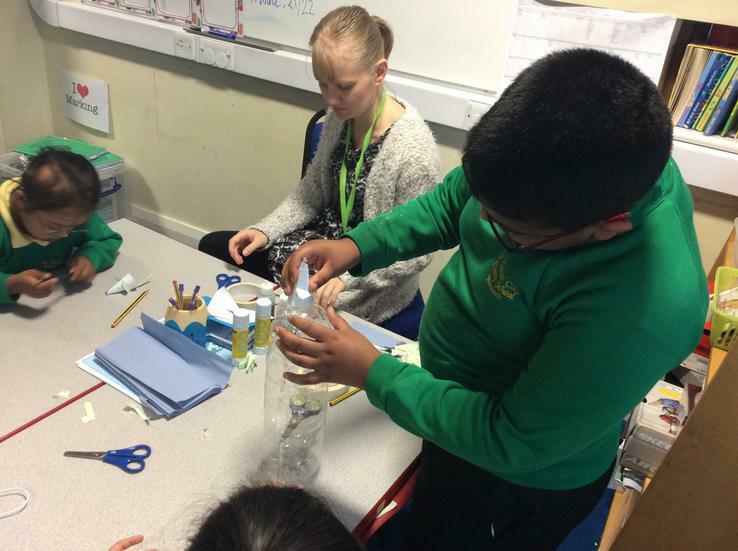 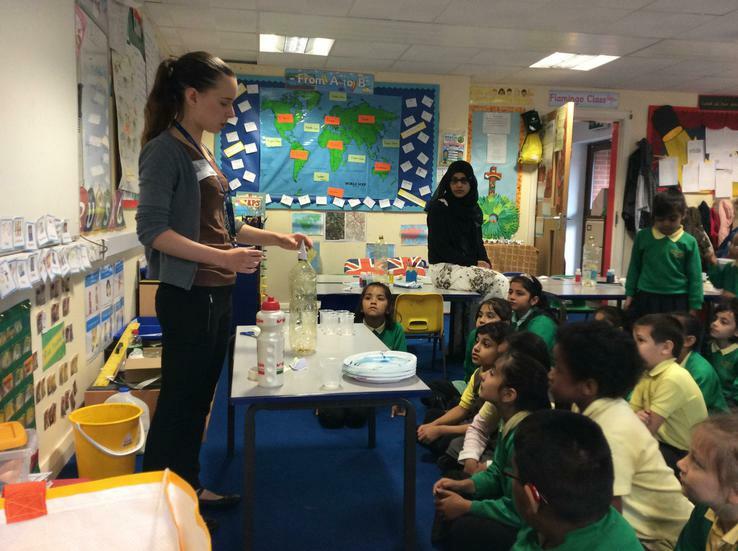 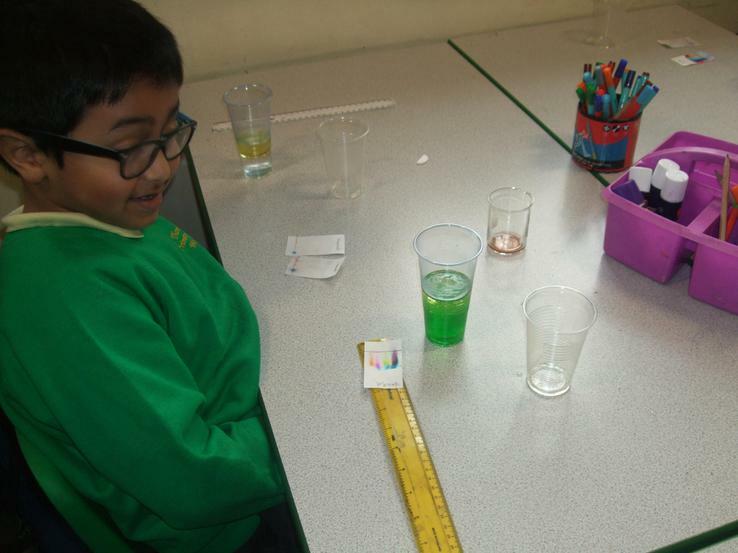 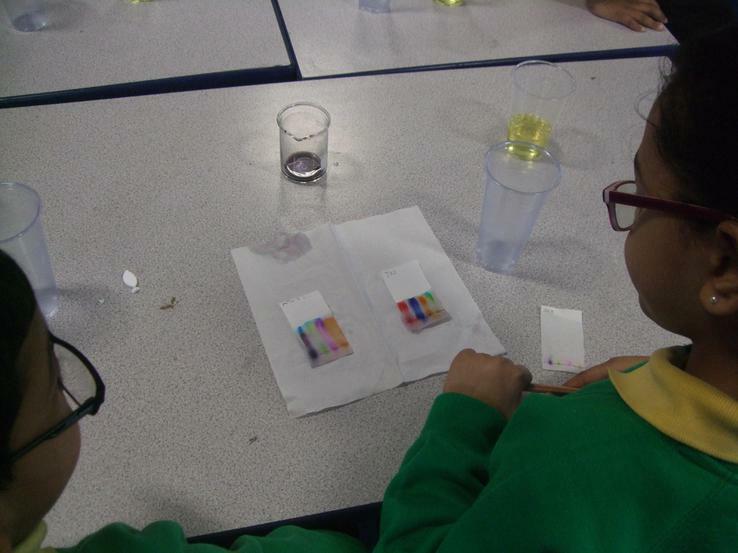 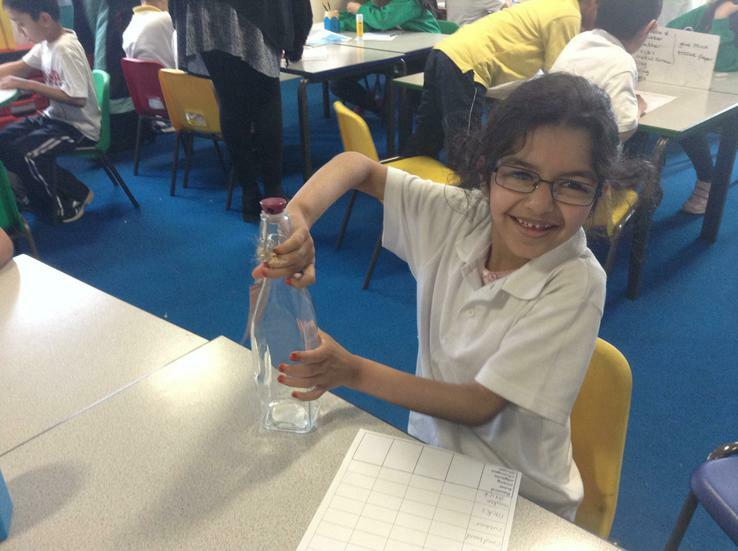 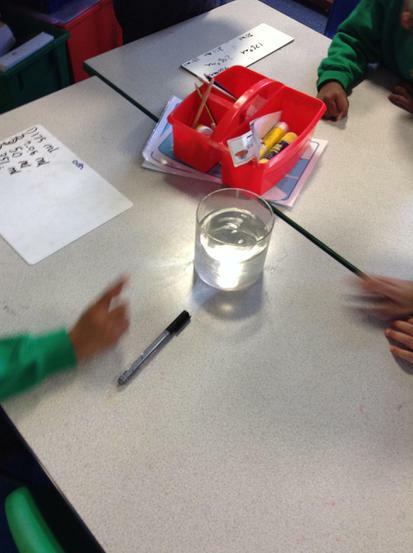 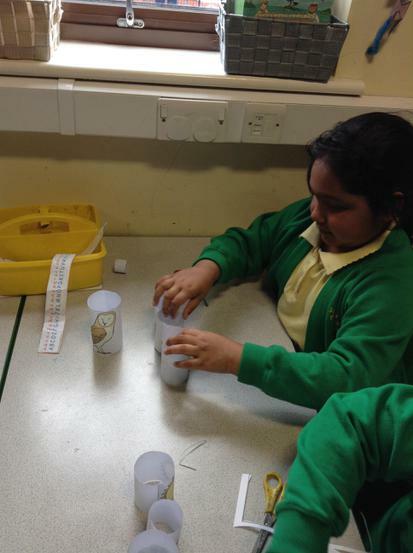 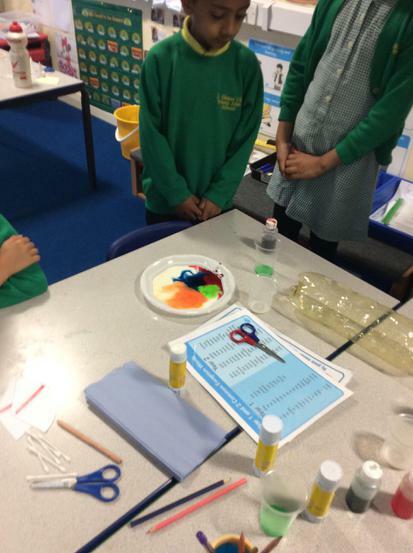 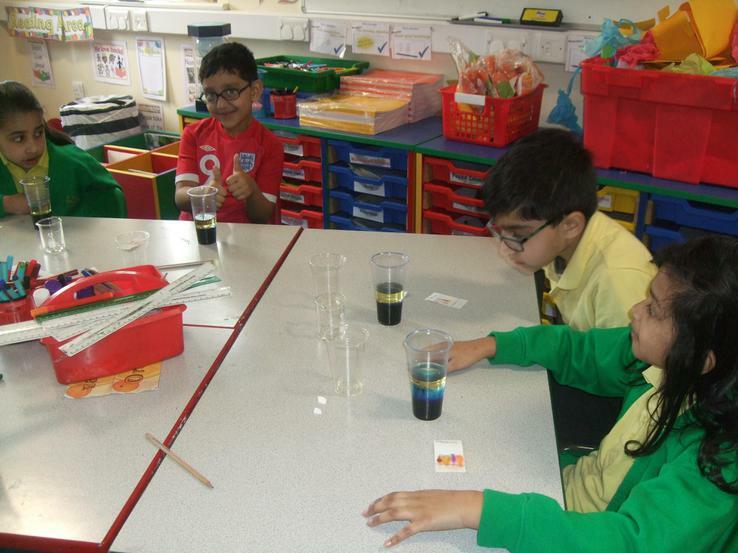 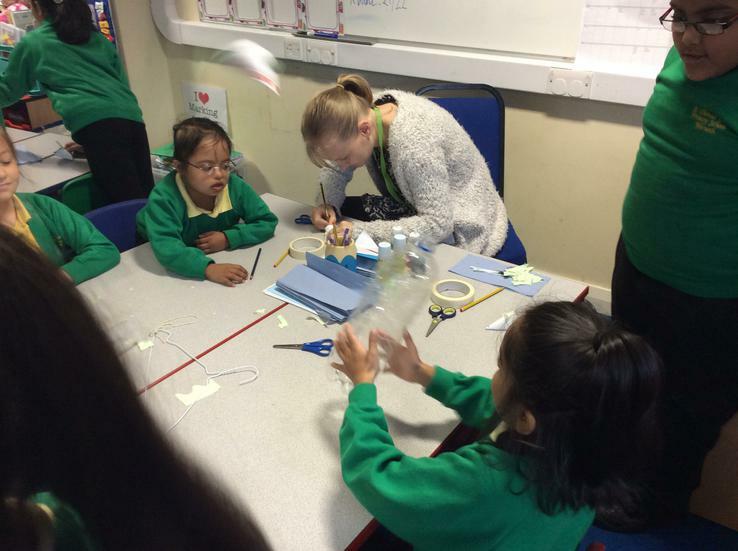 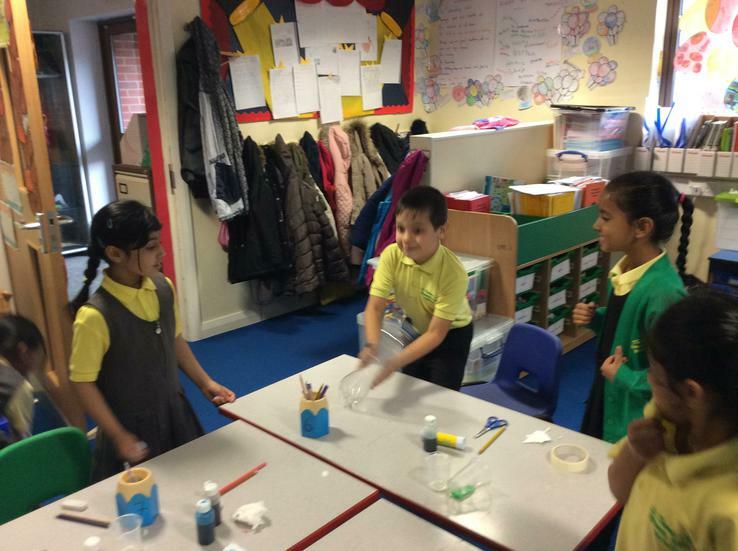 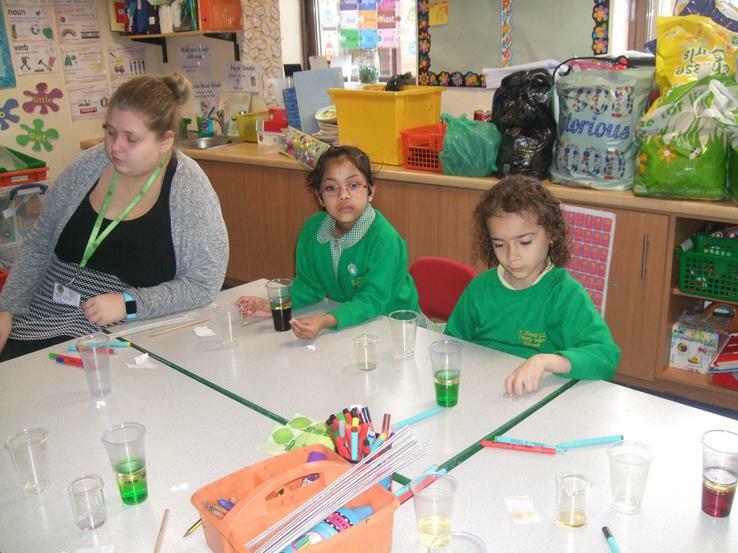 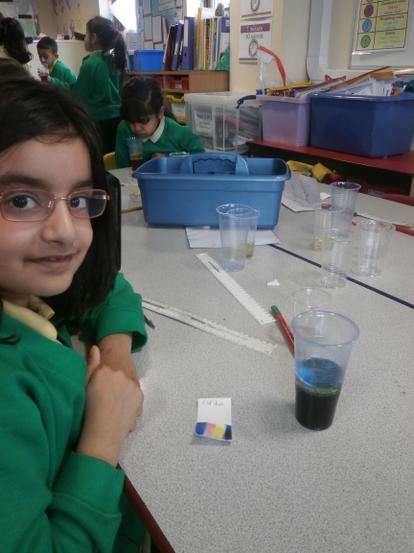 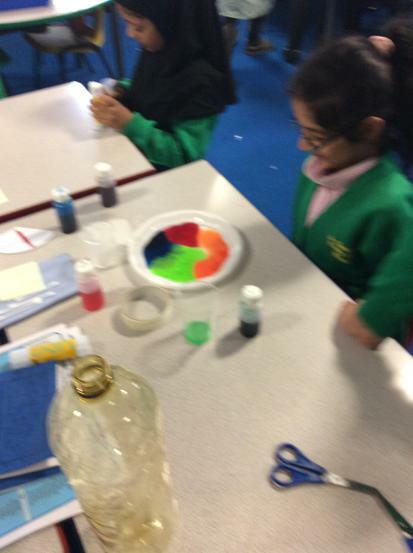 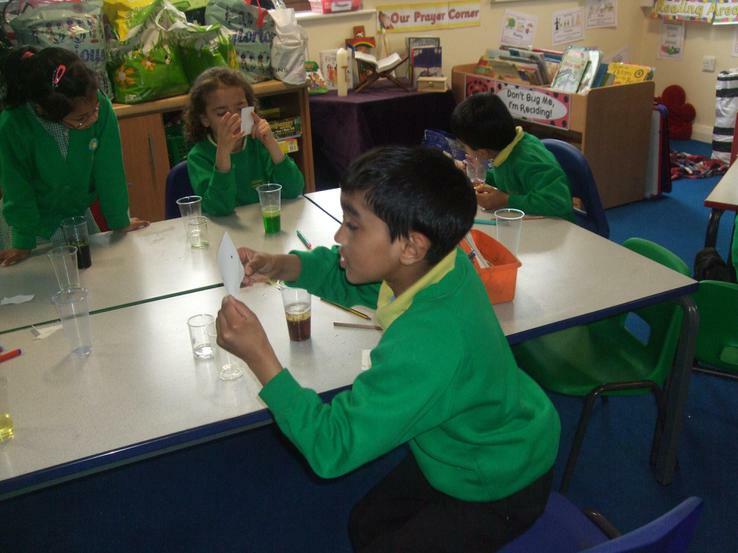 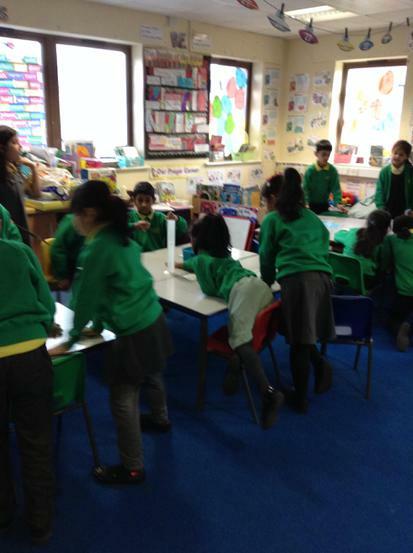 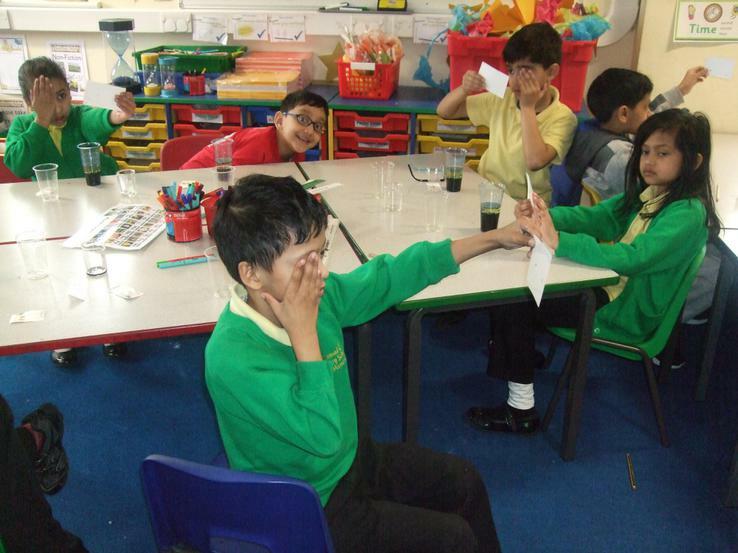 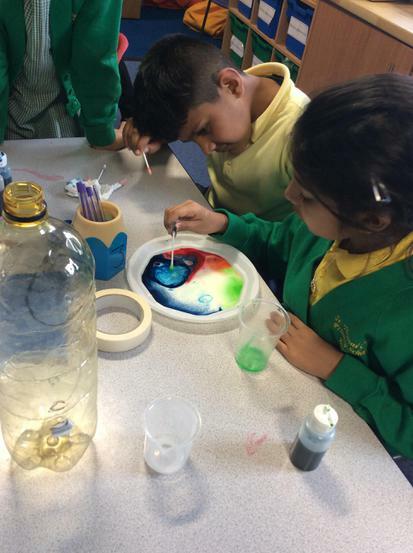 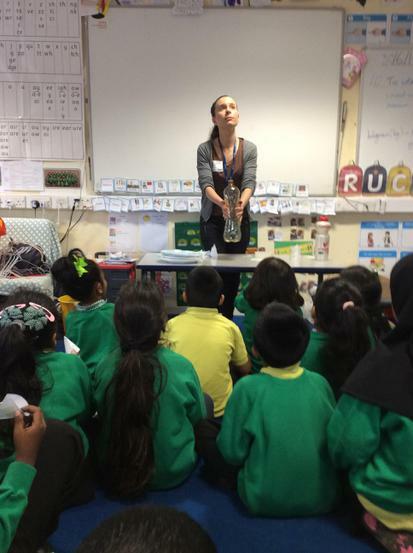 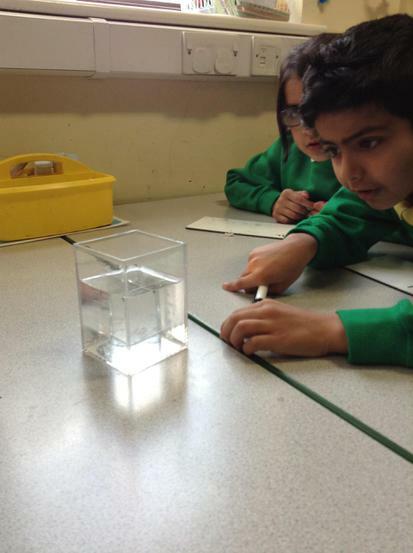 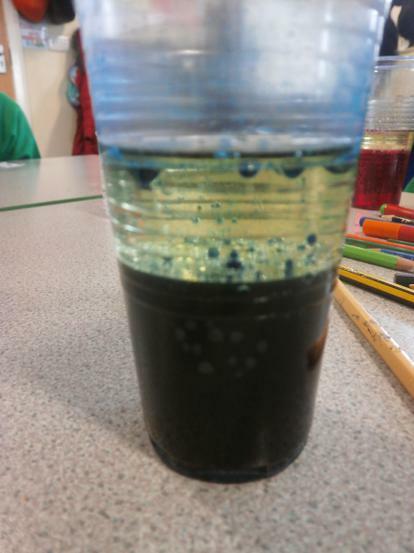 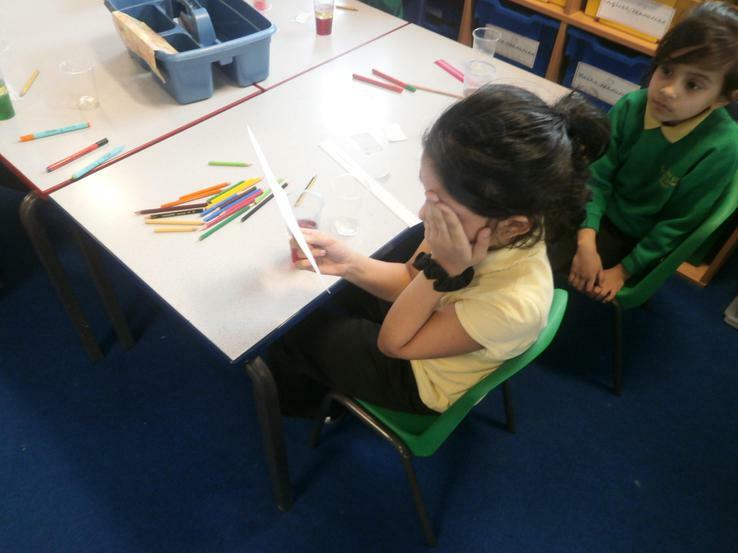 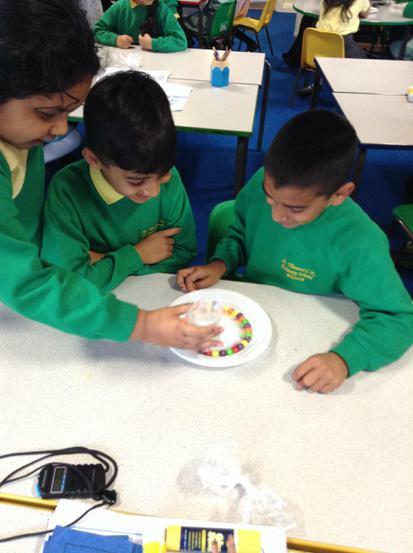 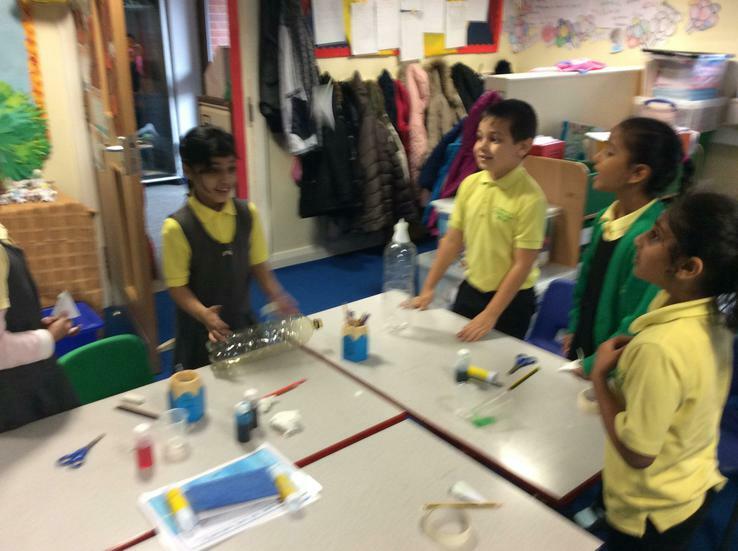 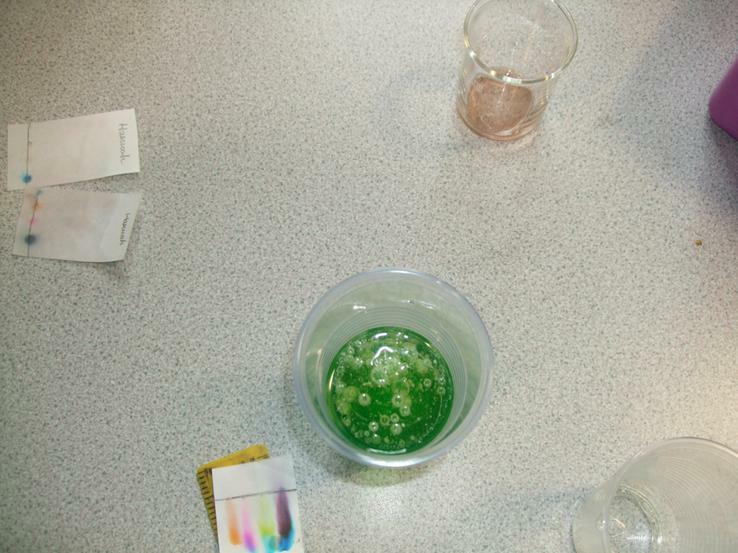 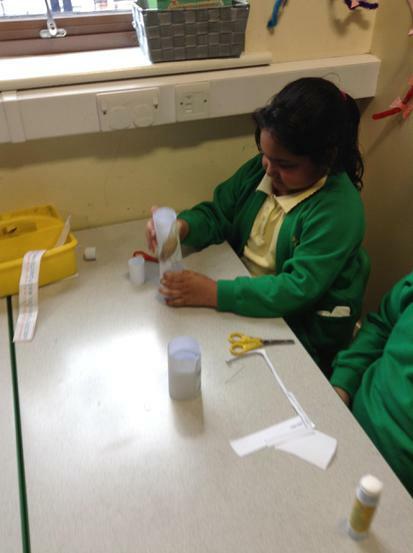 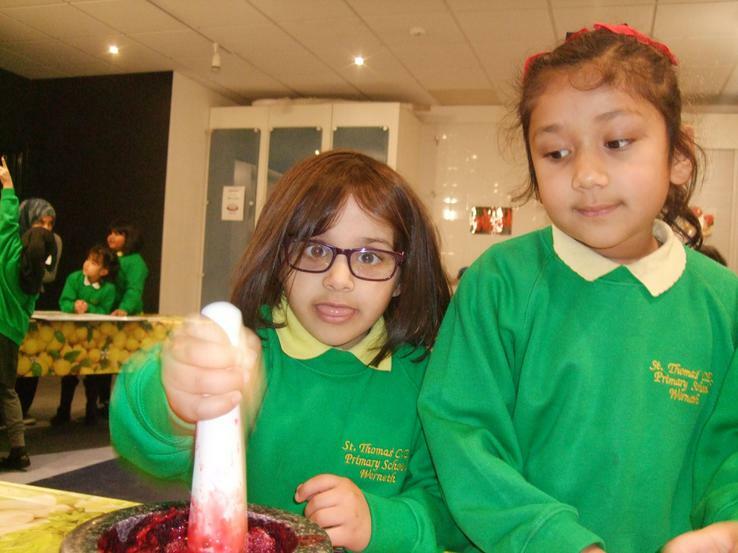 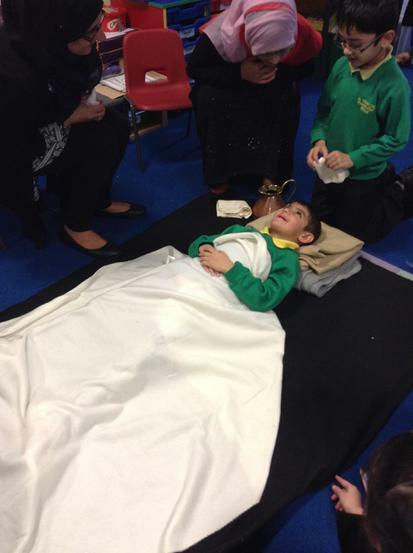 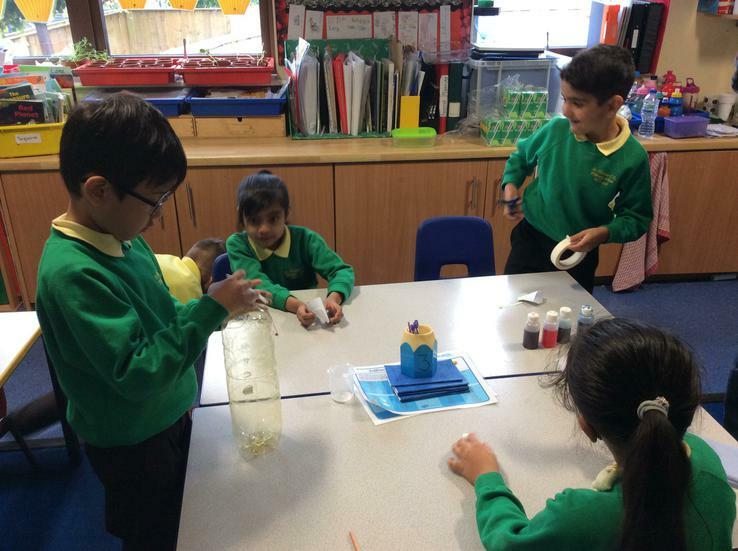 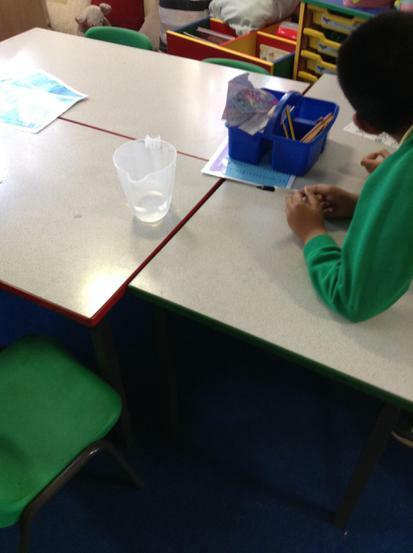 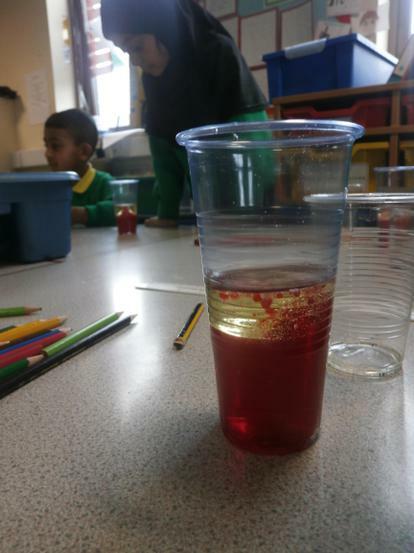 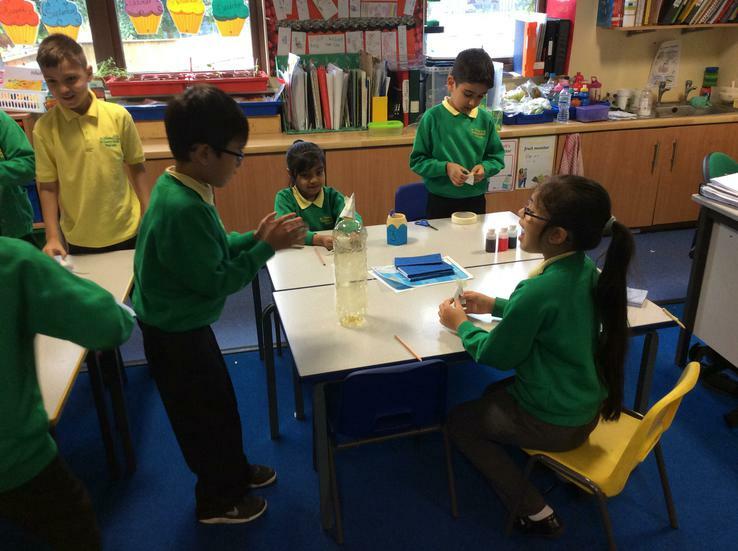 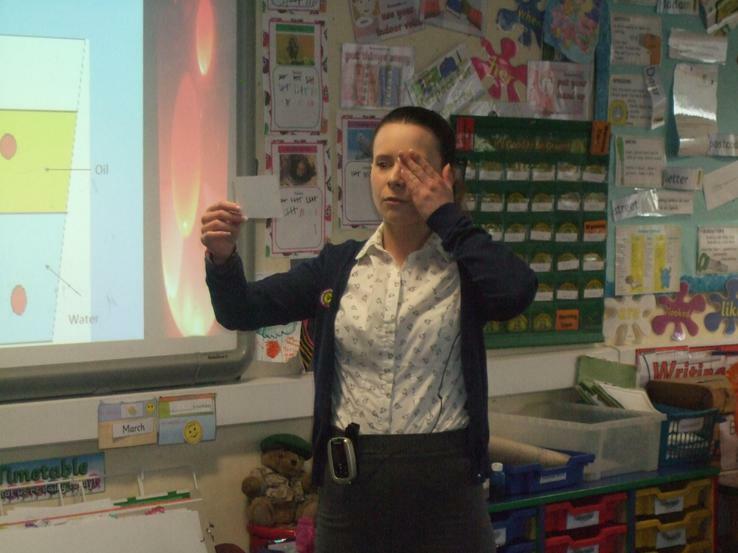 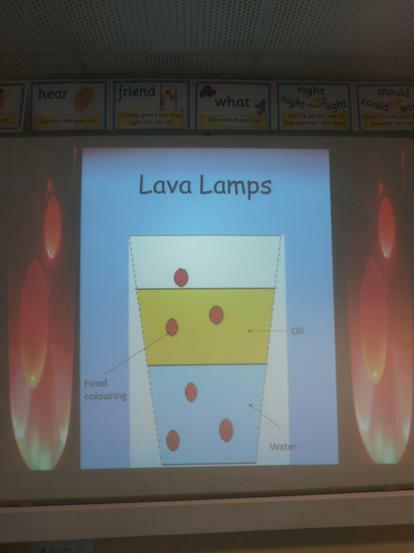 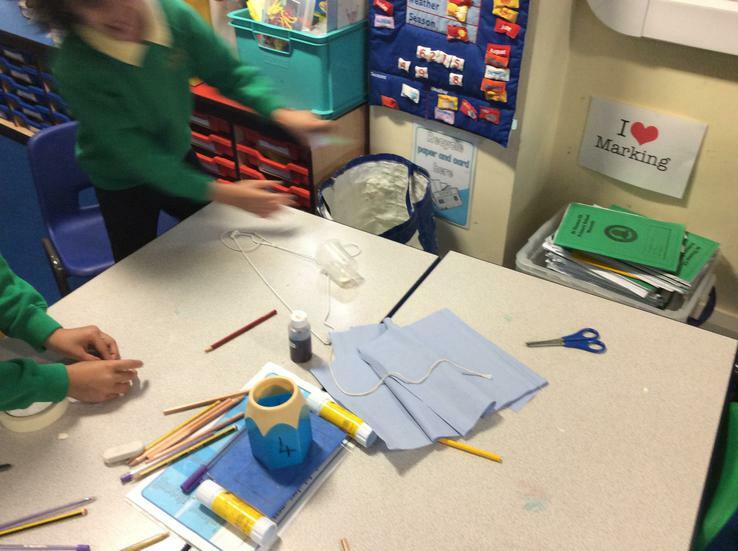 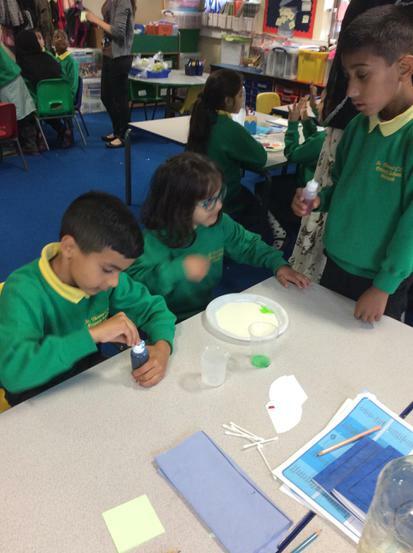 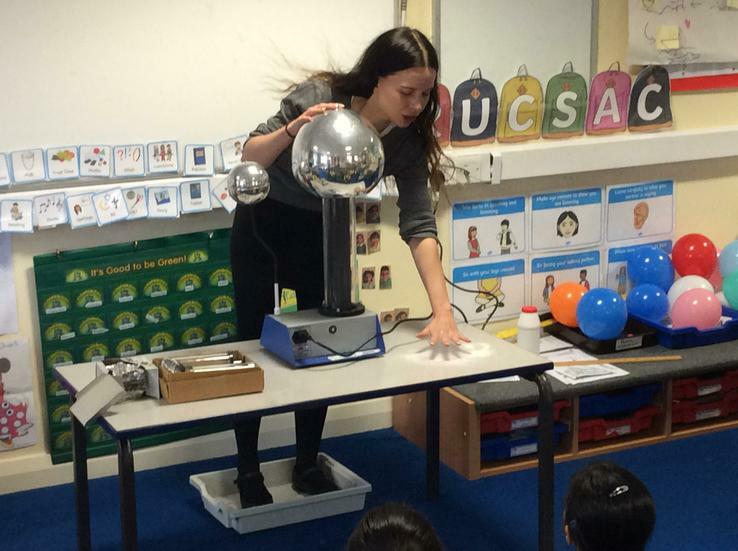 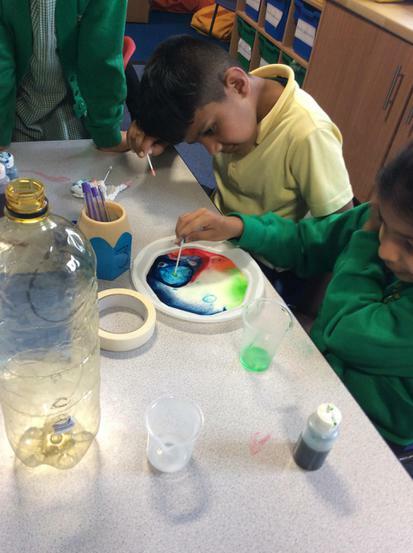 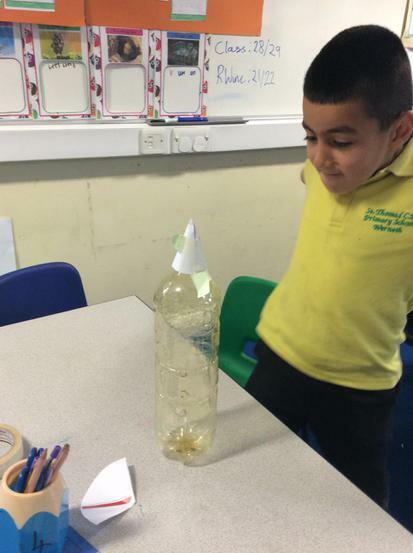 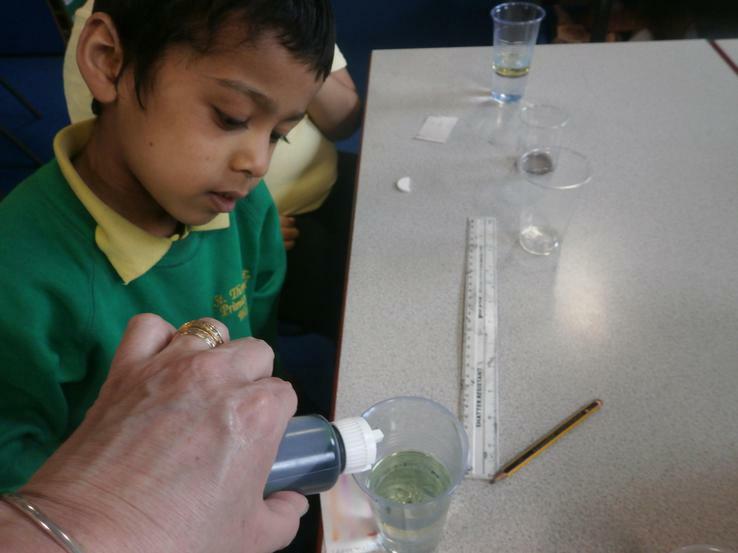 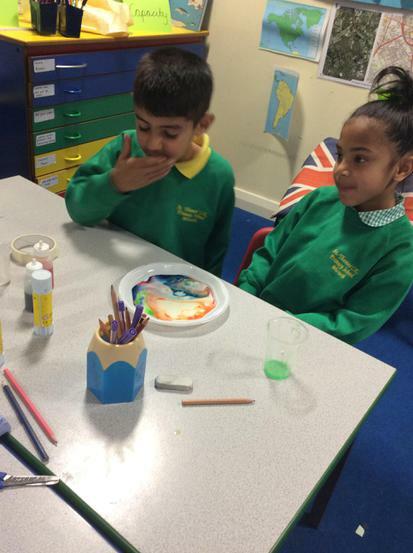 The children had a visit from a lady from Oldham Sixth Form, teaching them different experiments including chromatography, making lava lamps and testing their blind spot. 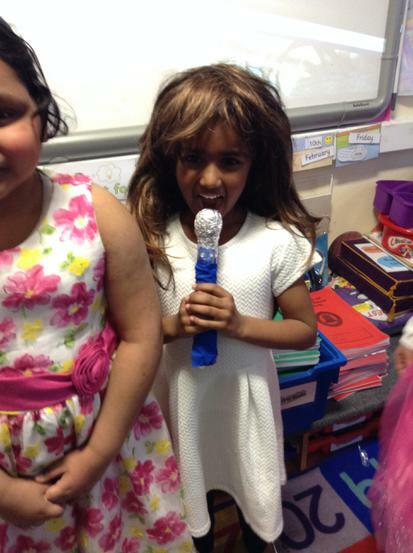 On Friday 18th March in the afternoon we will be having a famous persons party. 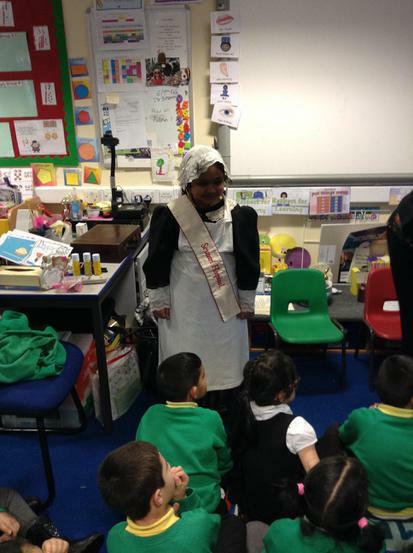 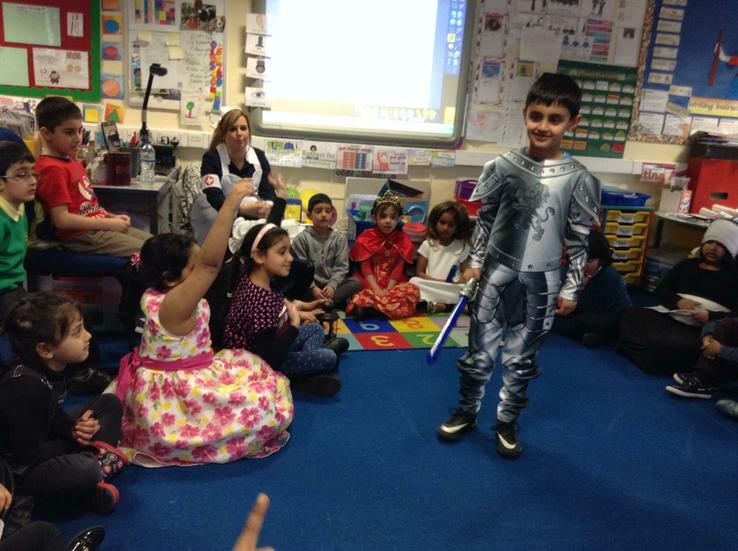 Children can bring an outfit for the afternoon in a carrier bag to dress up as somebody famous from the past. 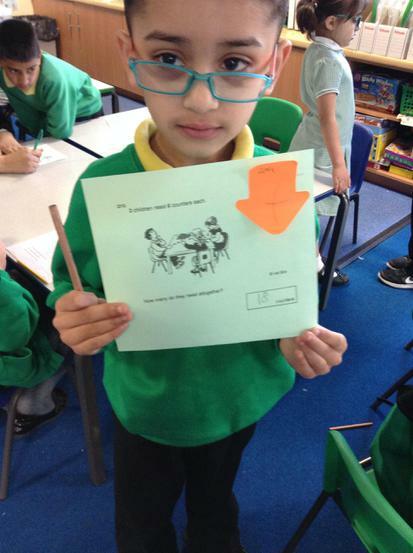 Your child will get a letter this week with more information but please ask the class teacher if you have any questions. 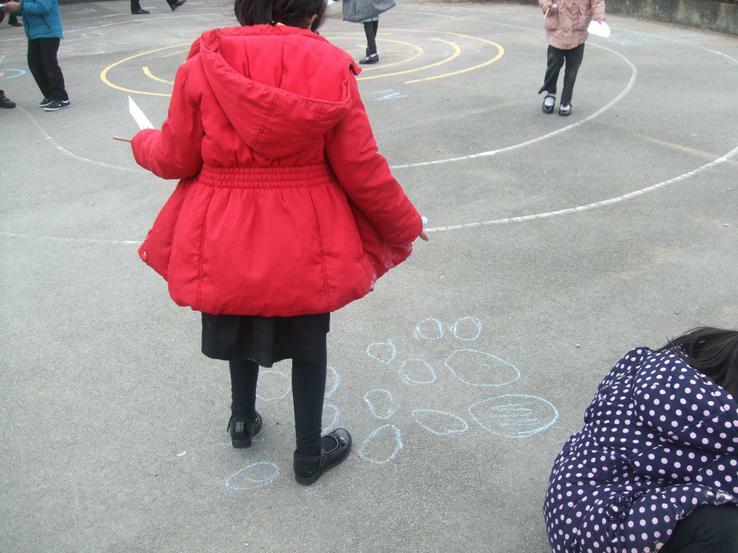 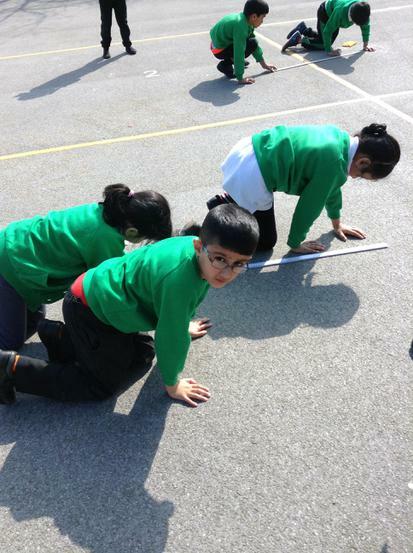 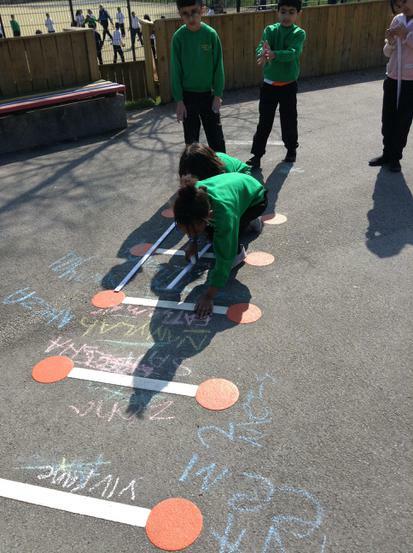 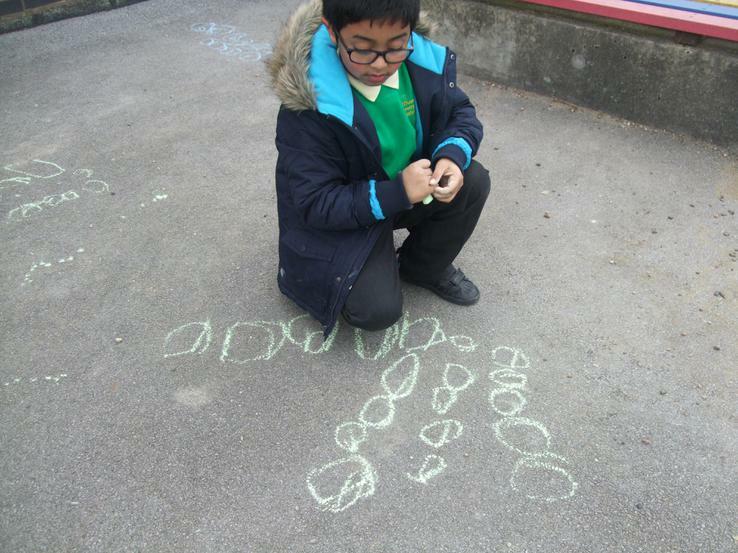 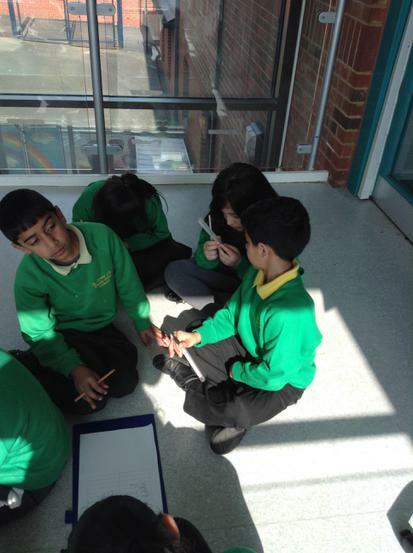 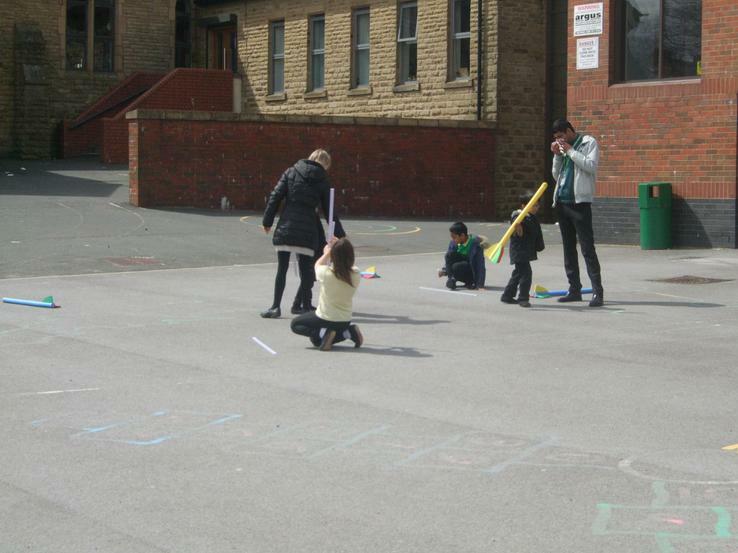 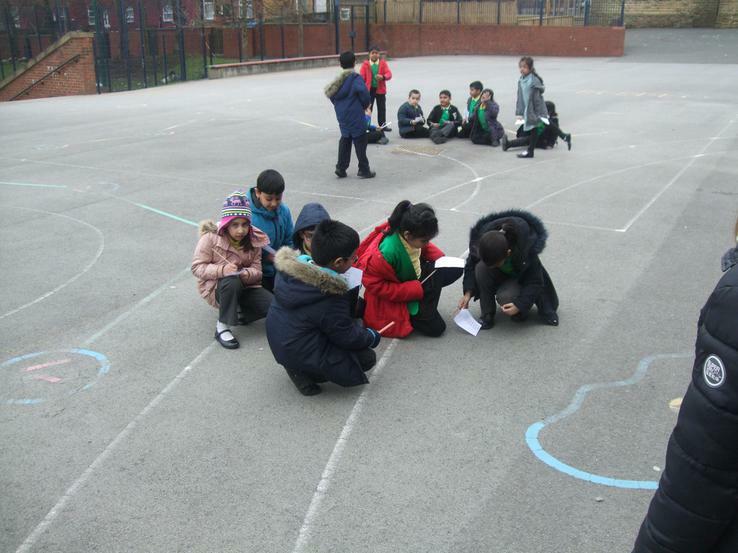 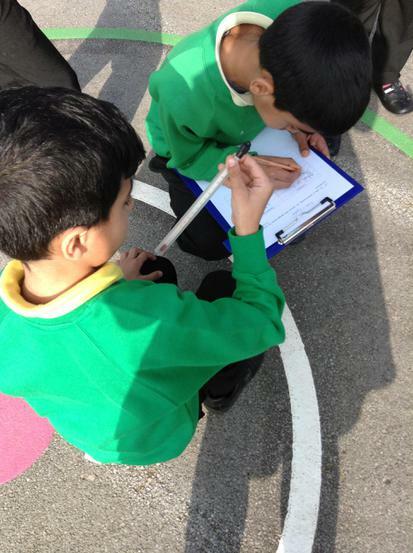 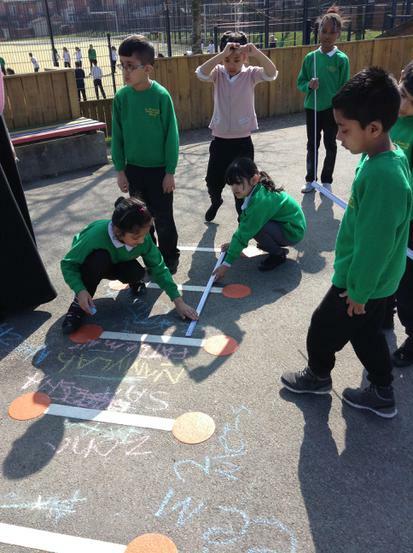 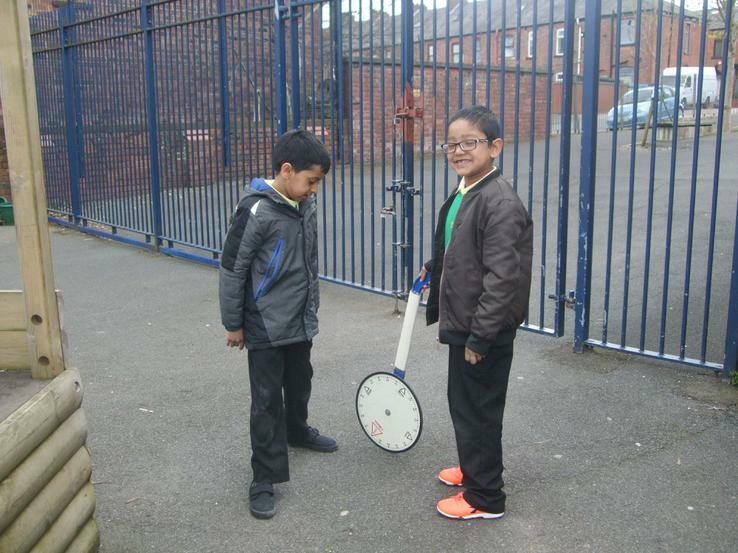 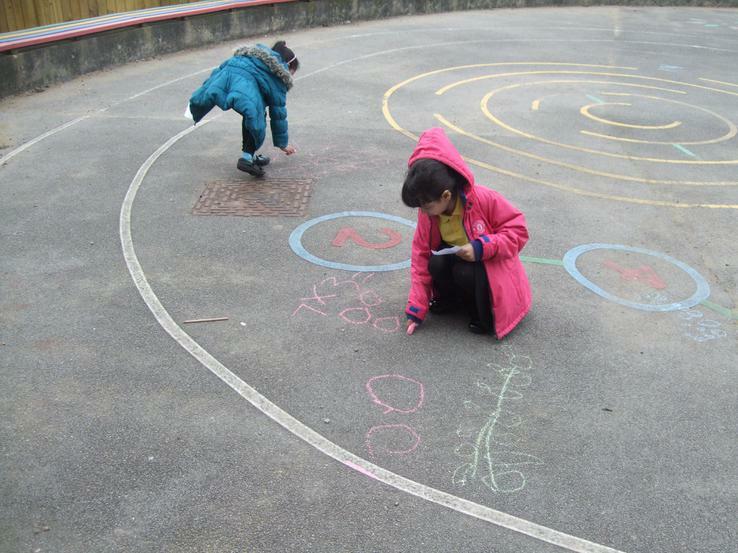 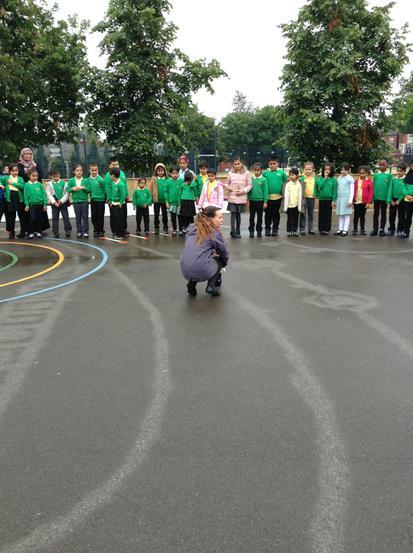 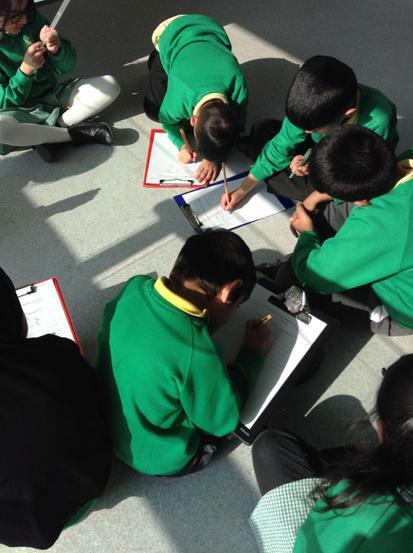 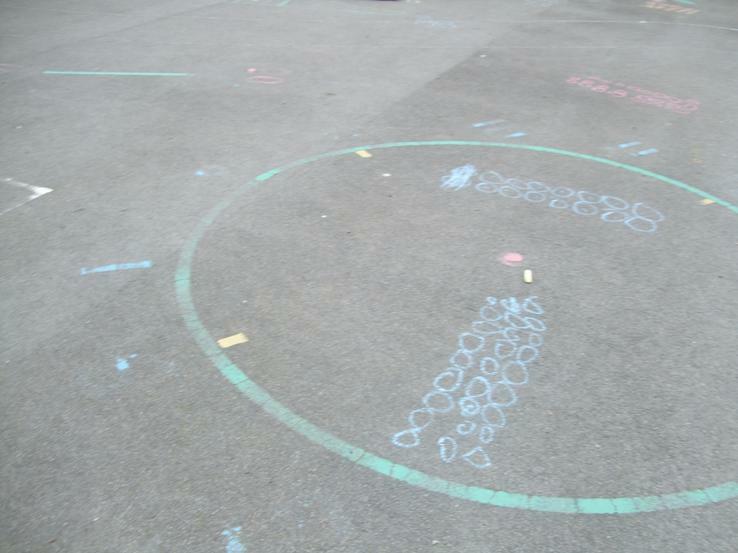 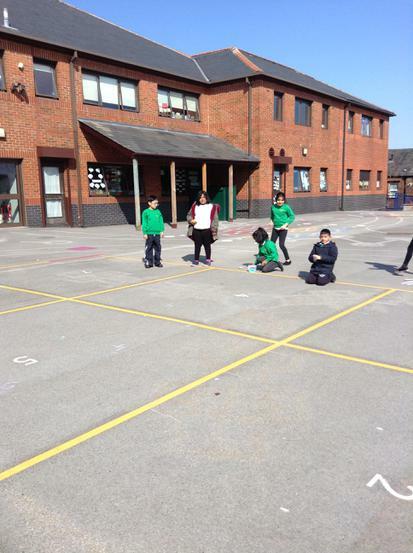 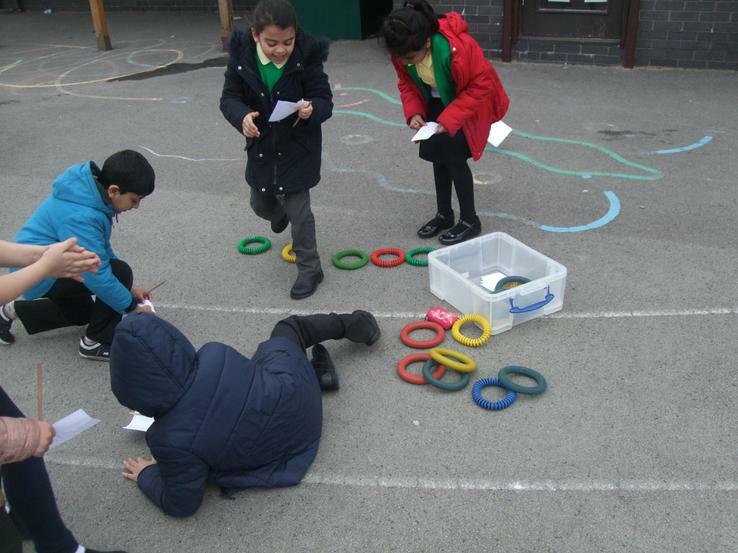 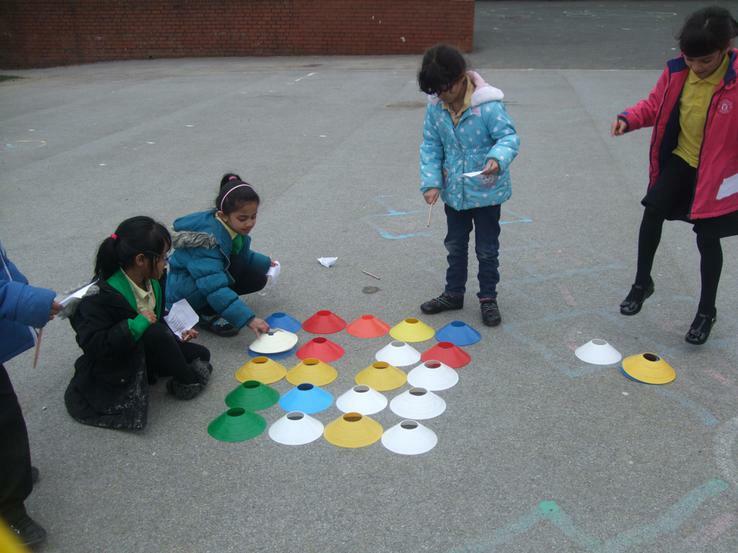 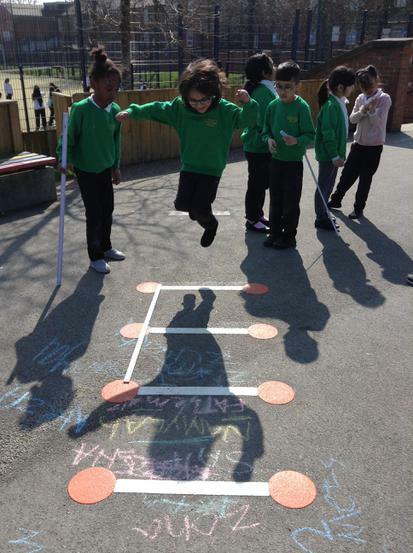 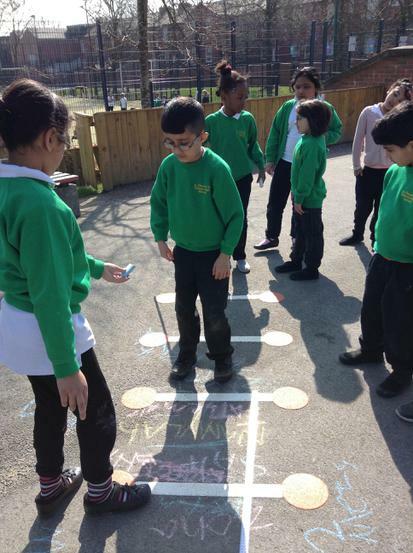 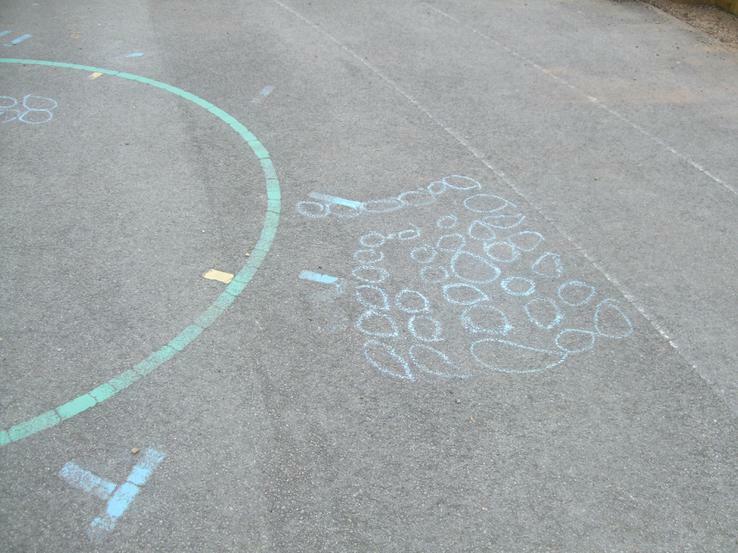 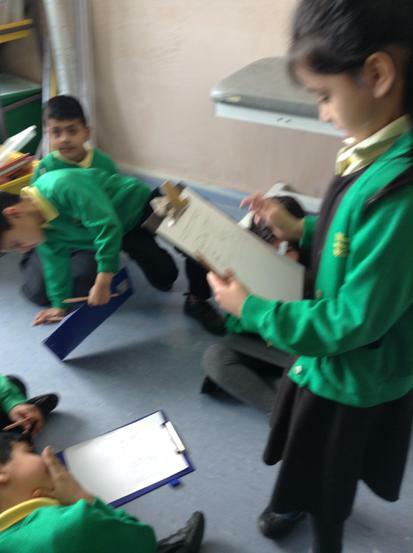 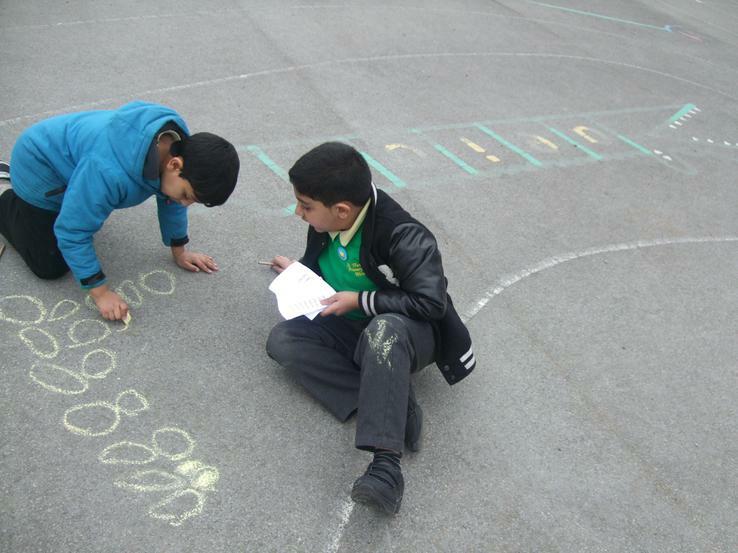 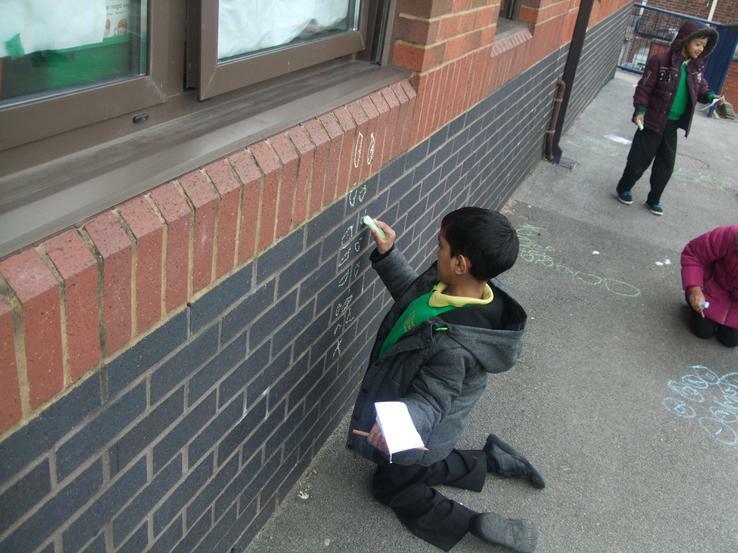 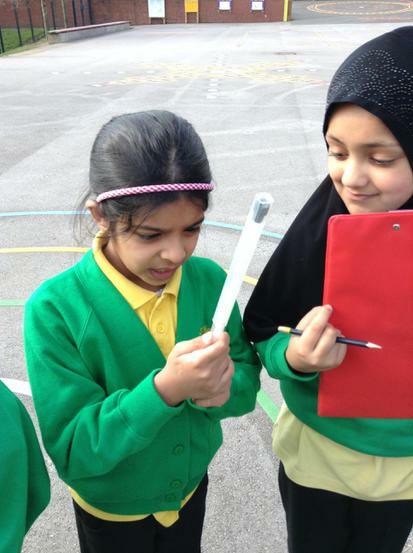 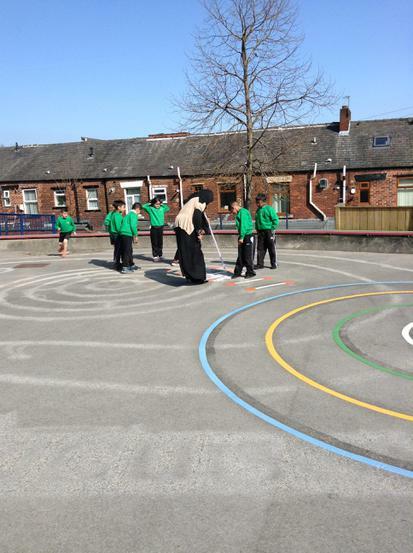 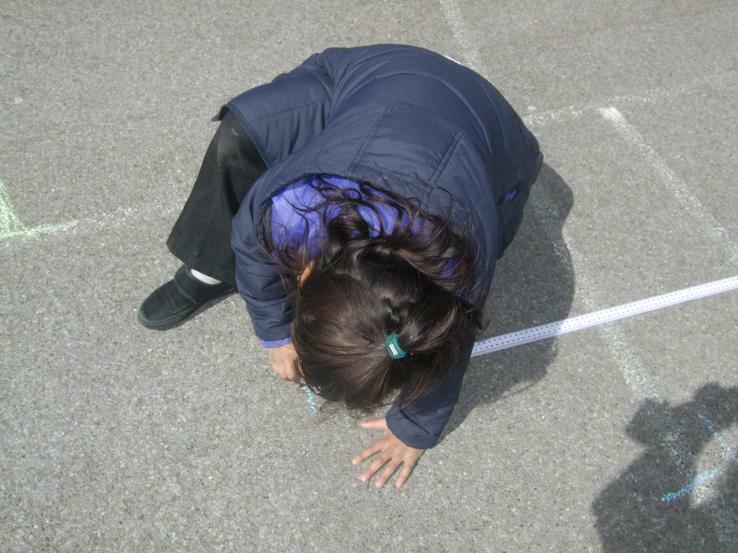 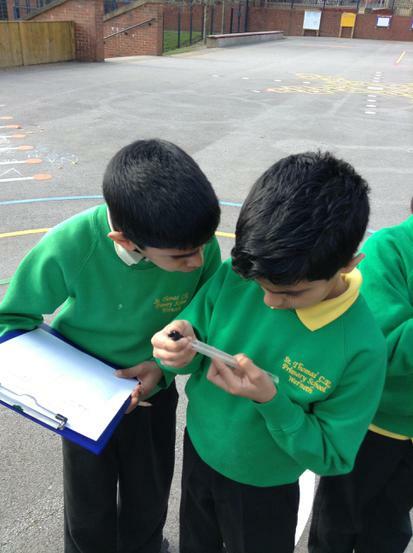 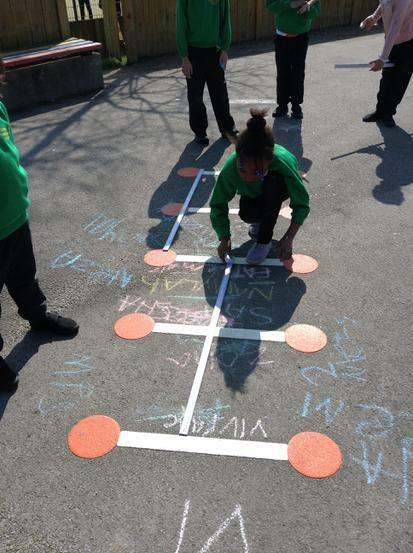 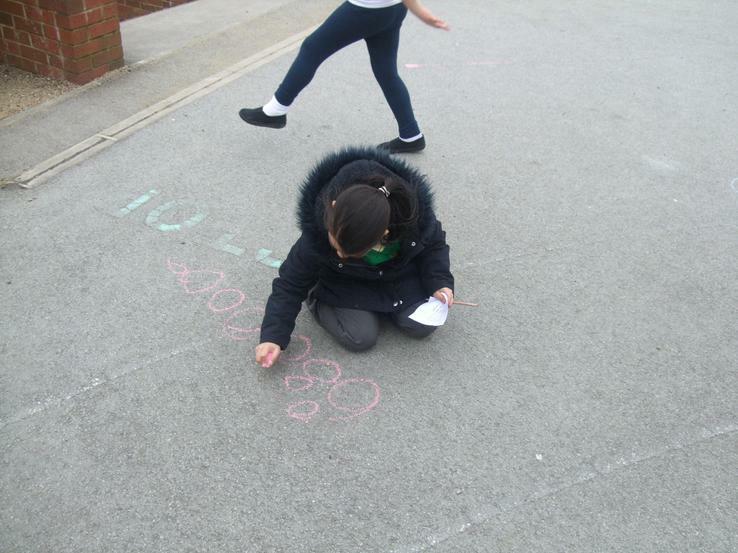 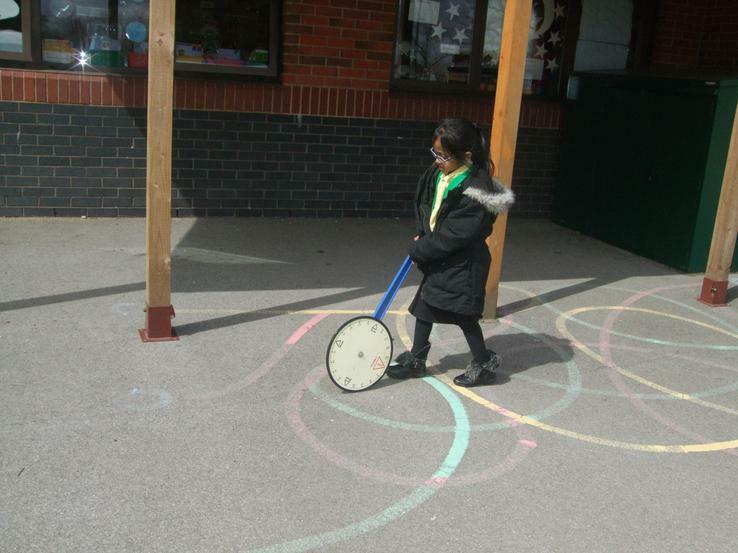 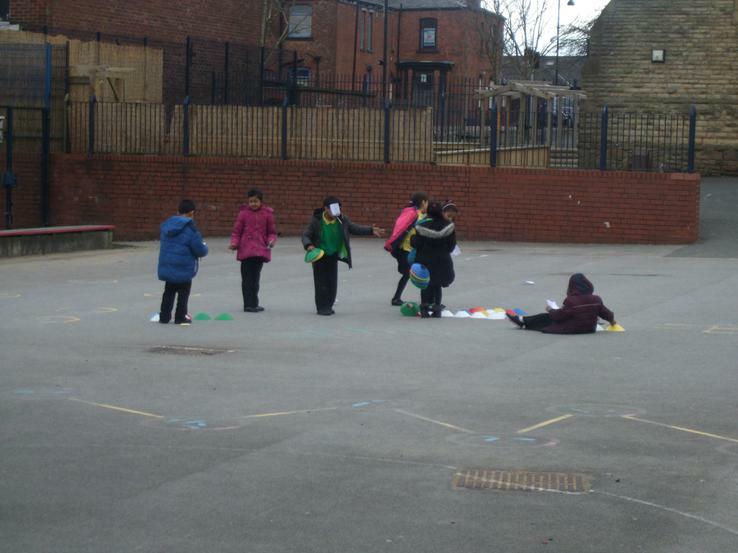 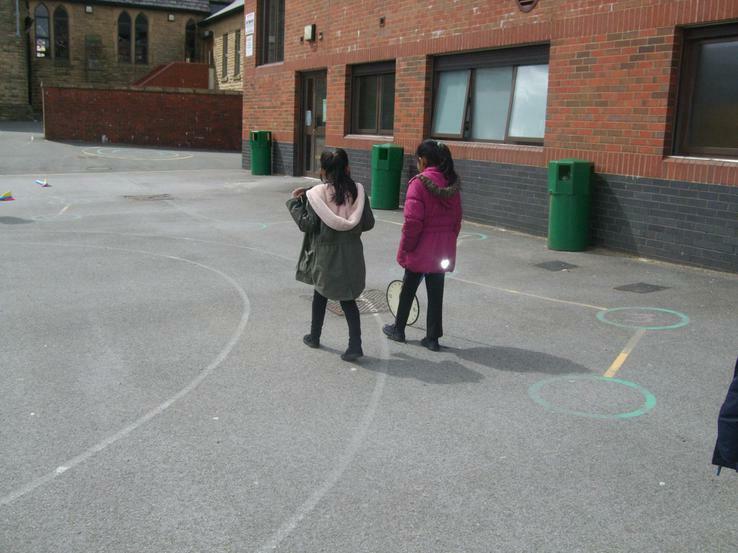 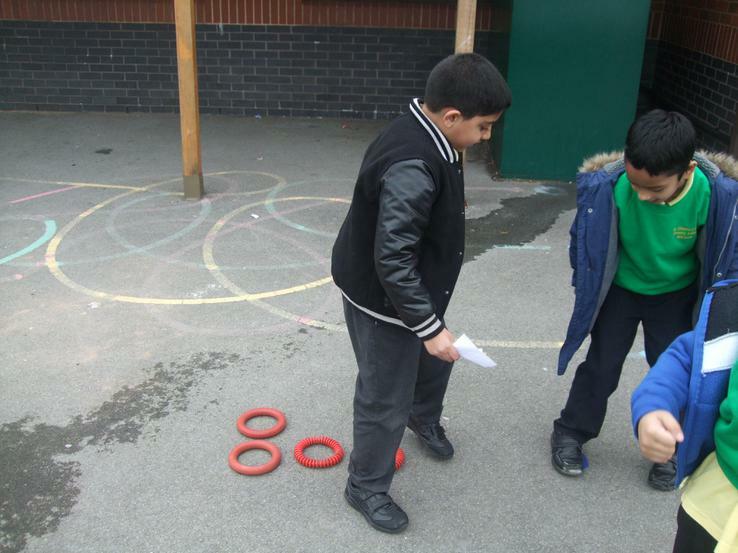 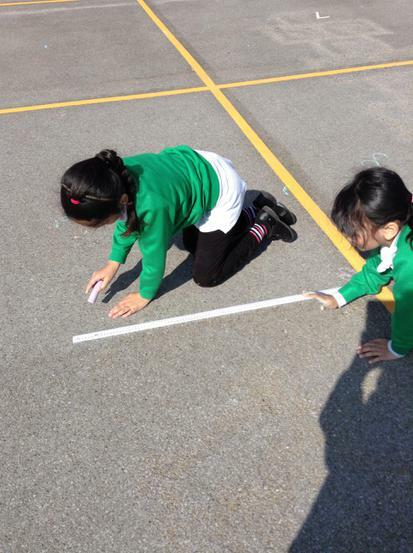 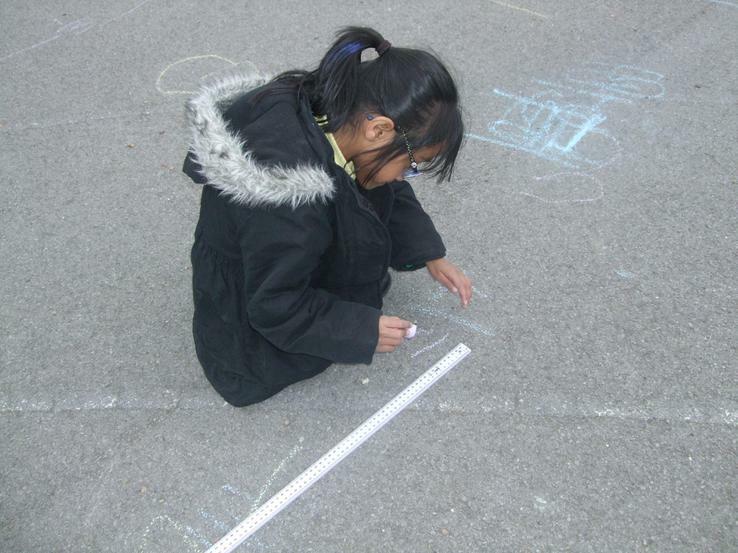 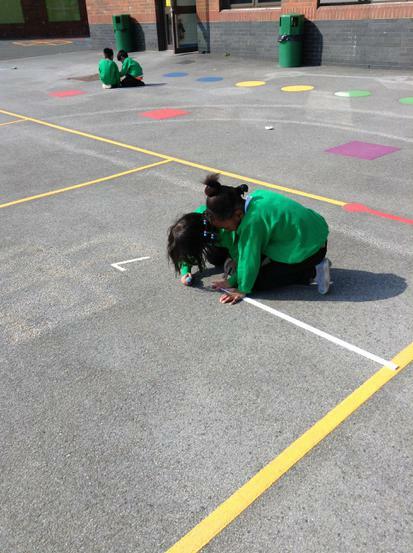 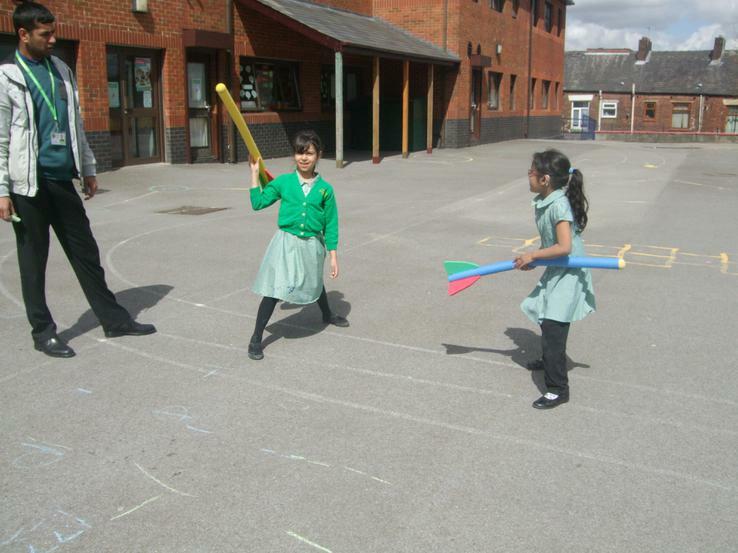 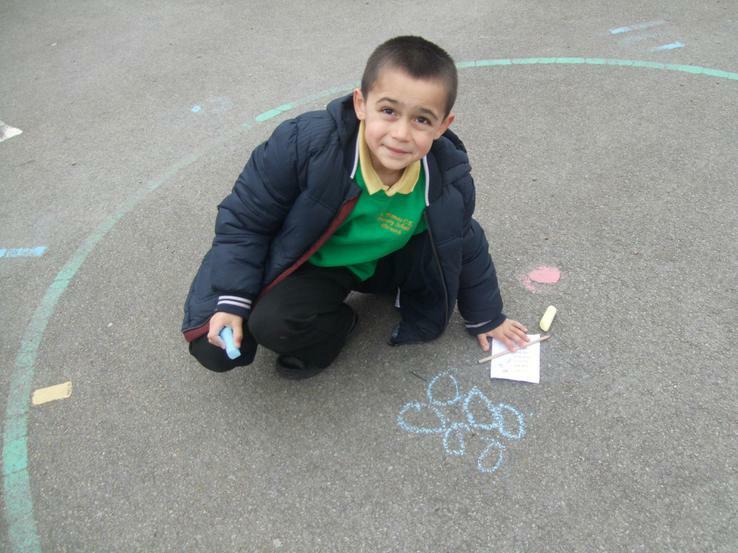 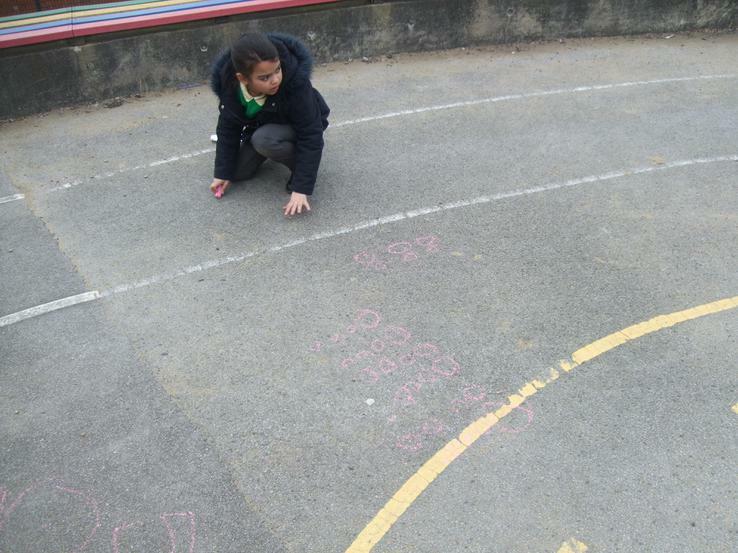 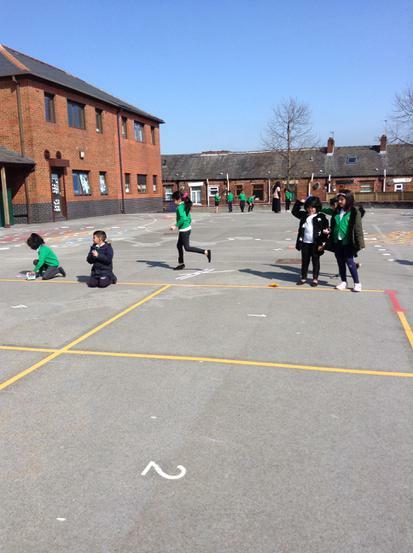 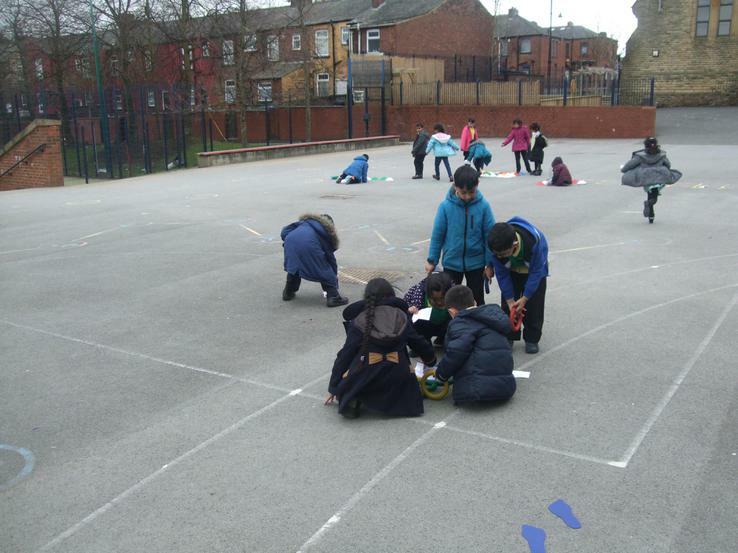 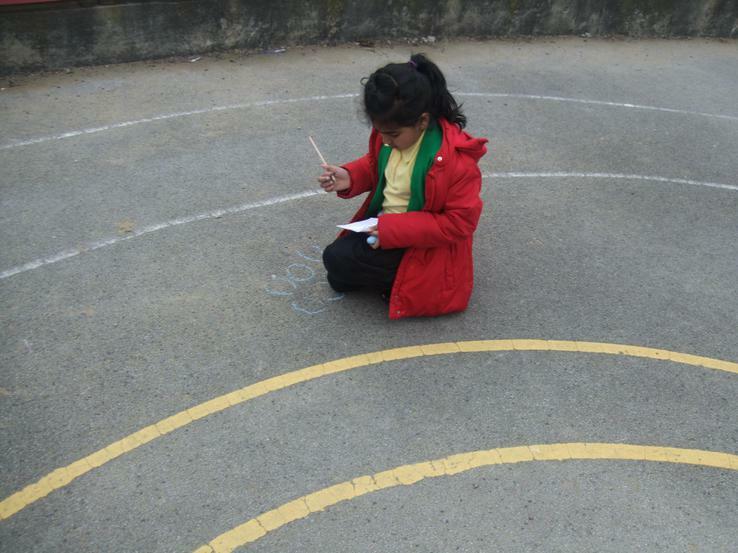 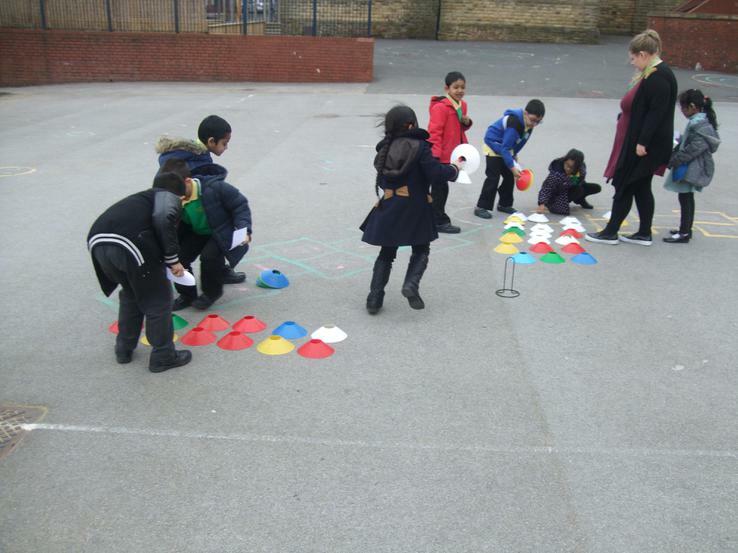 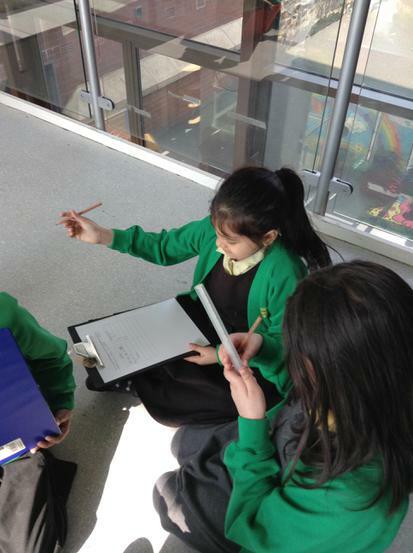 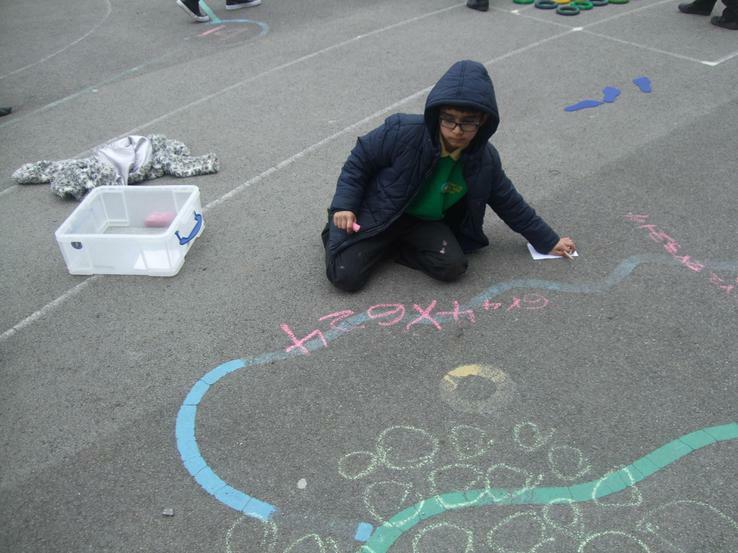 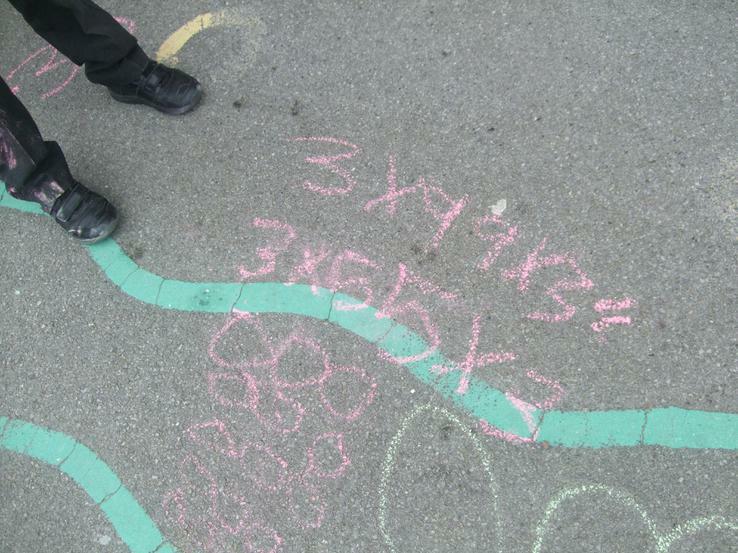 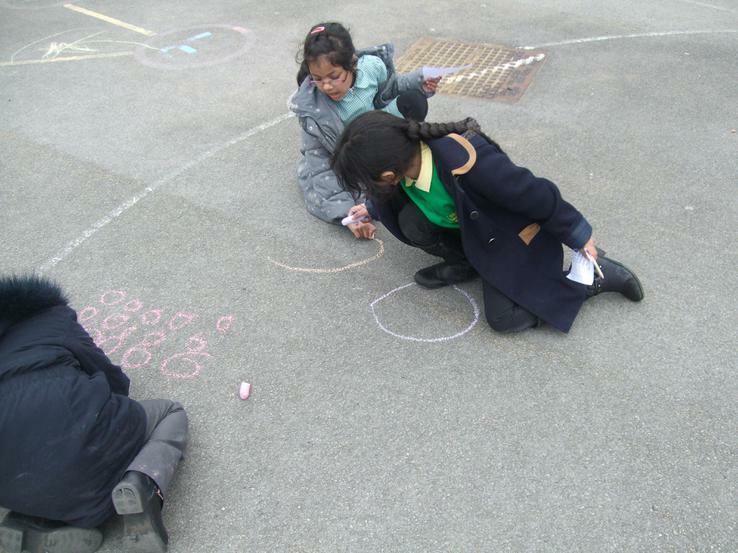 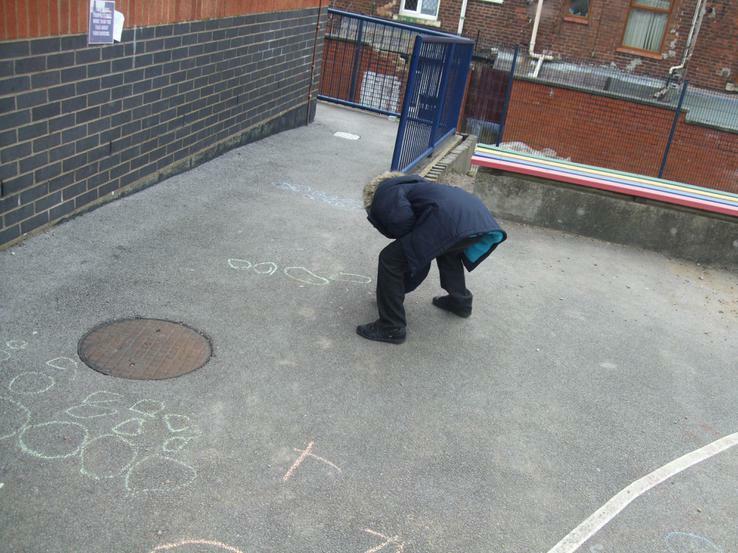 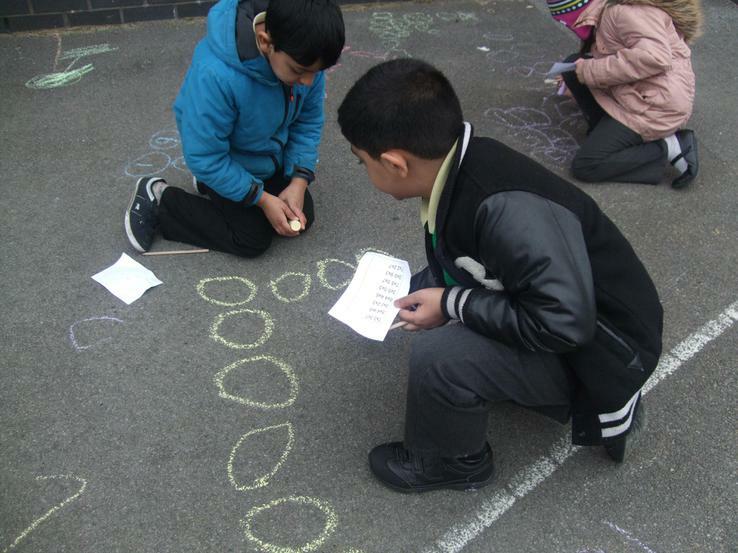 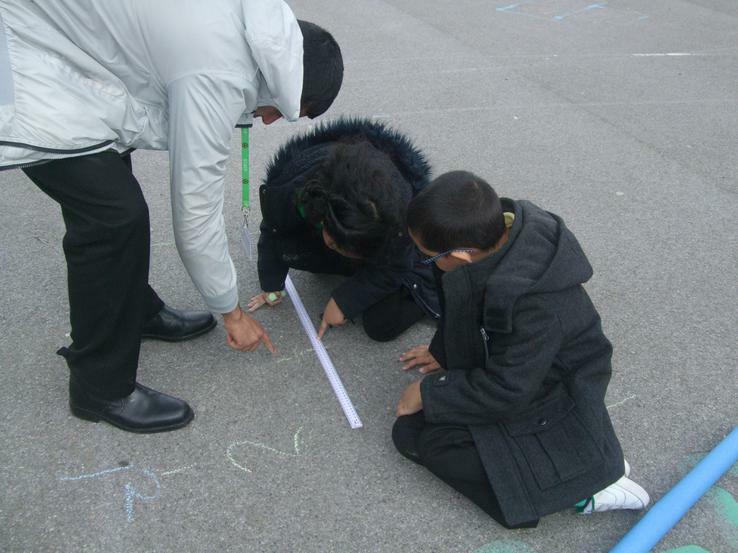 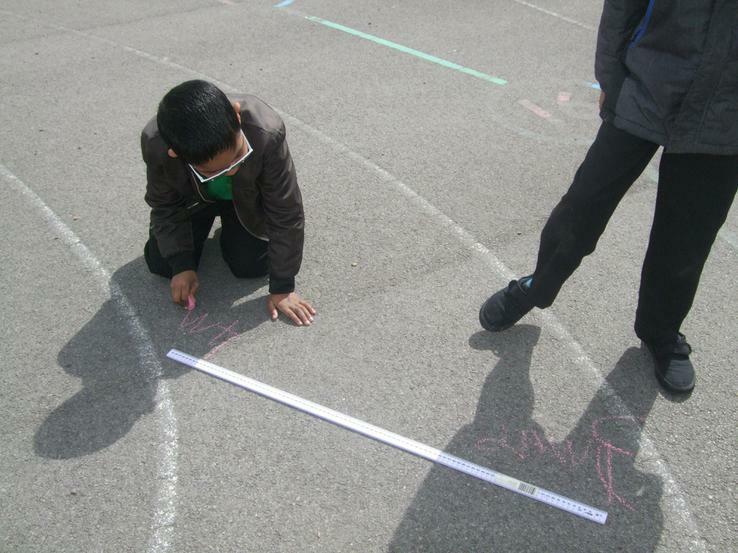 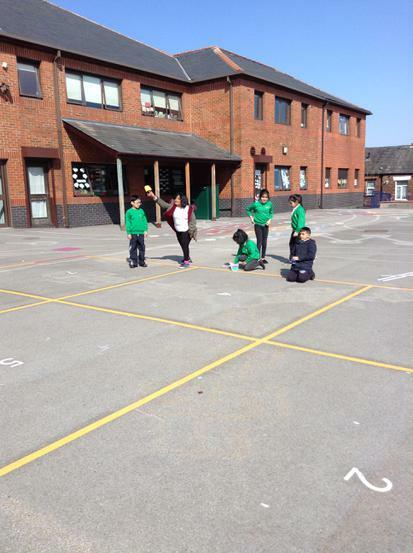 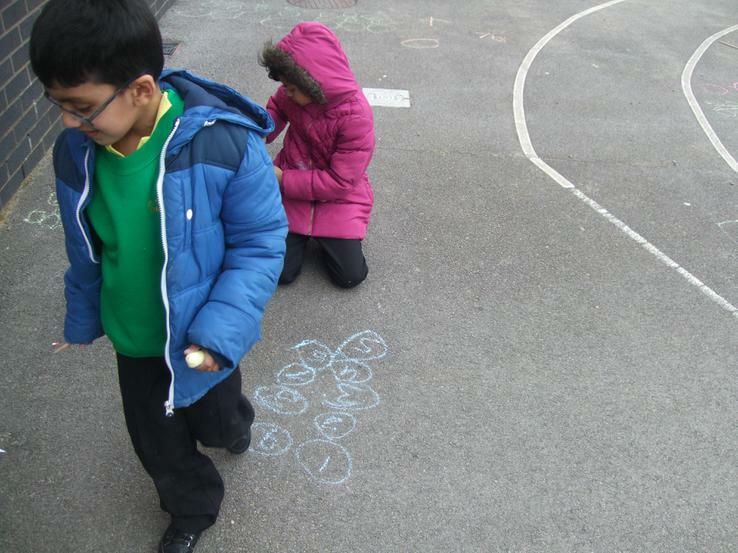 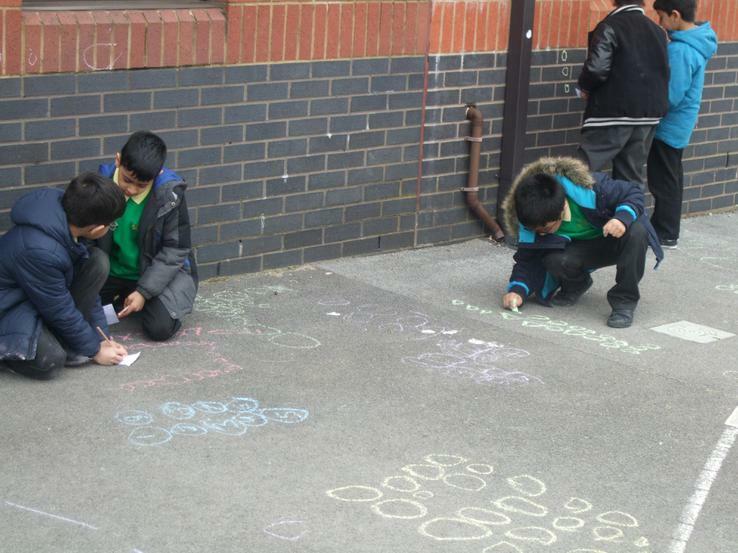 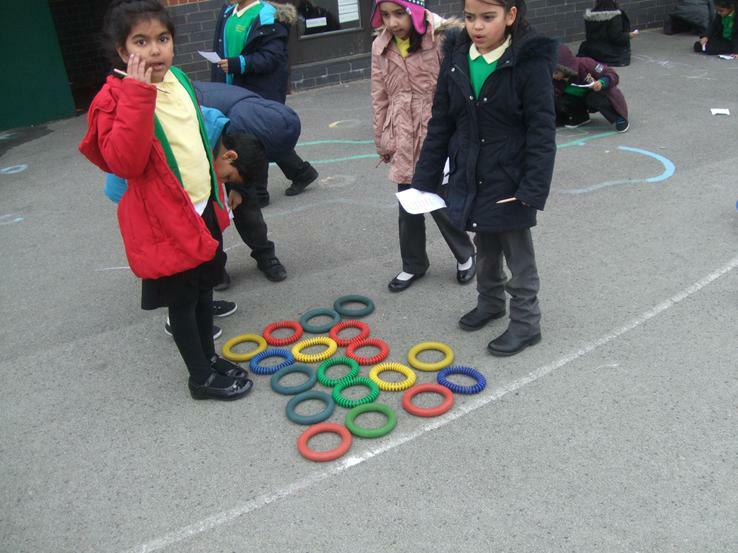 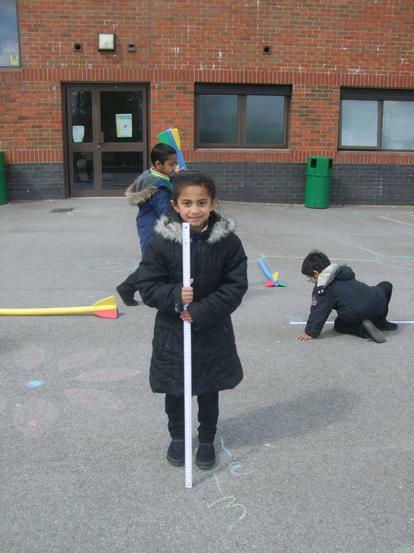 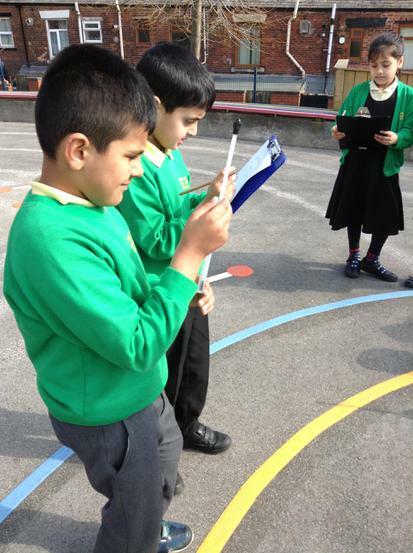 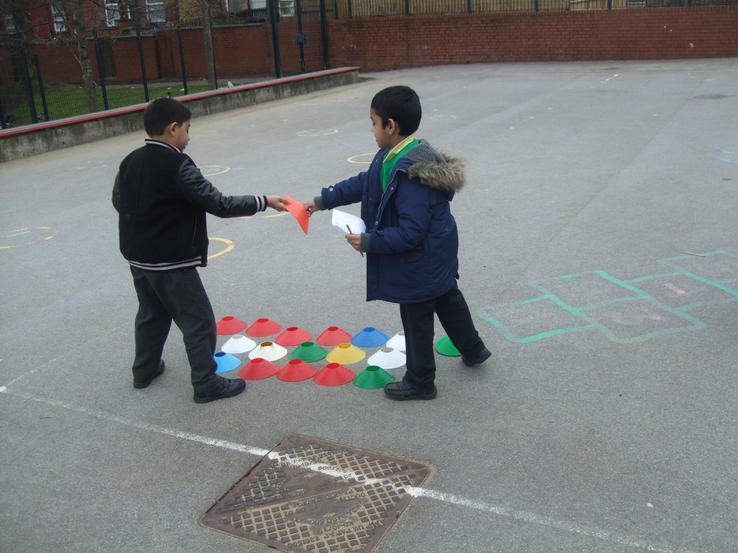 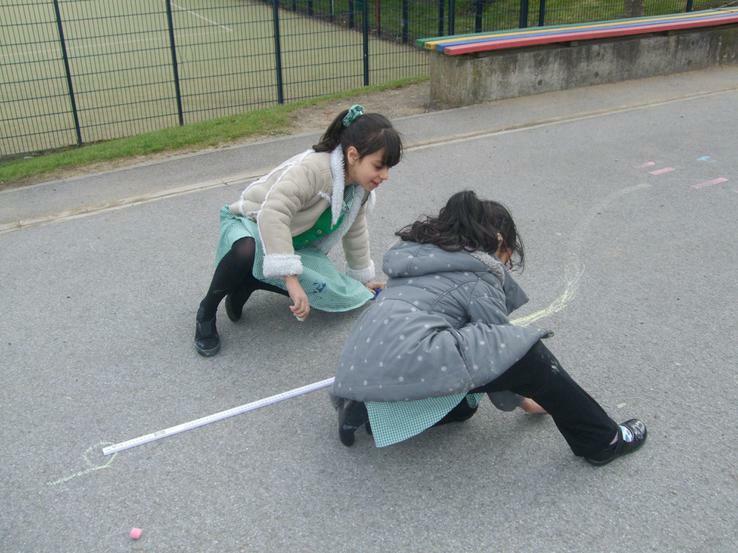 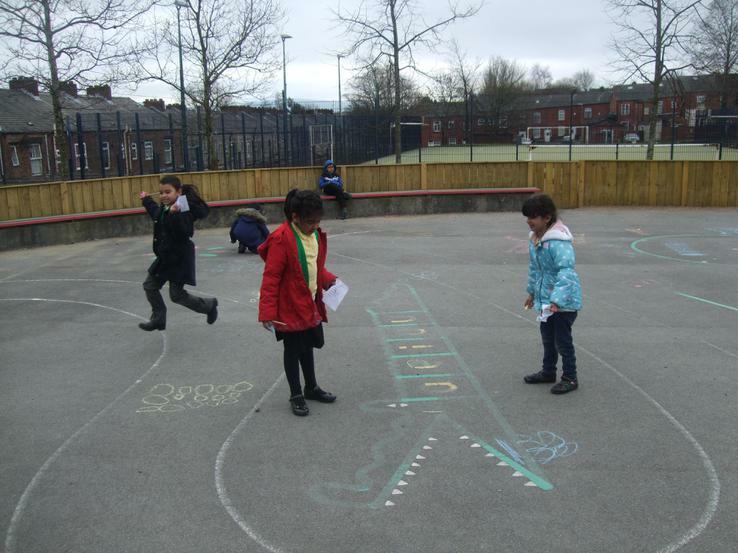 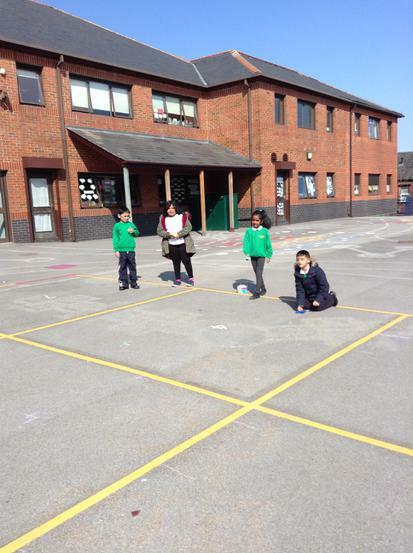 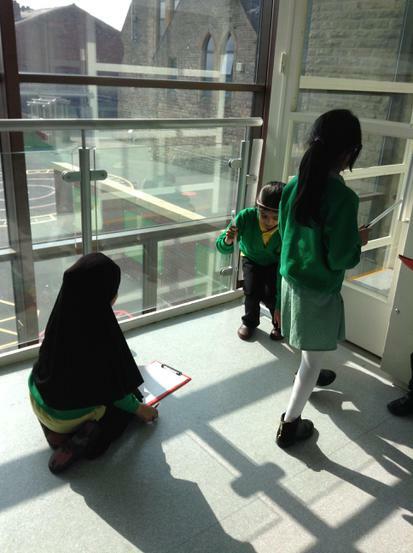 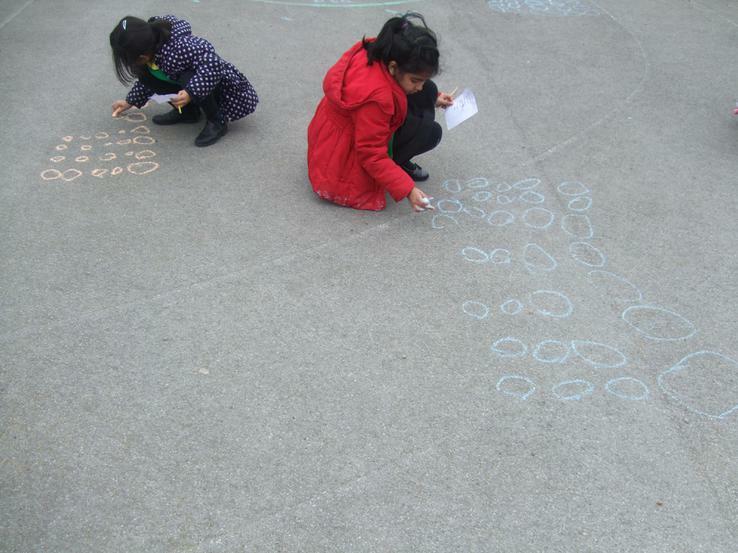 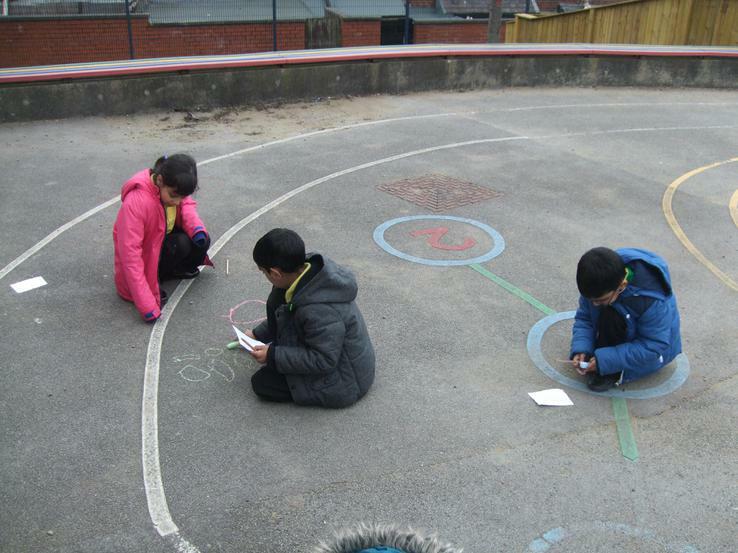 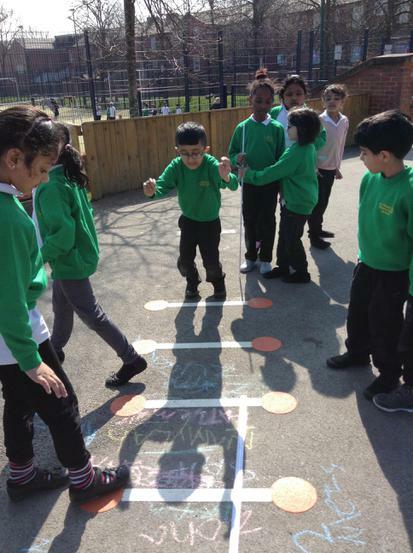 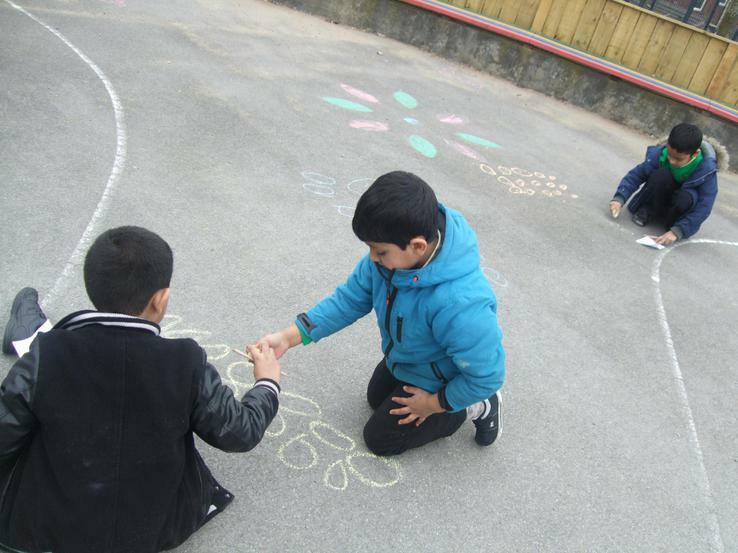 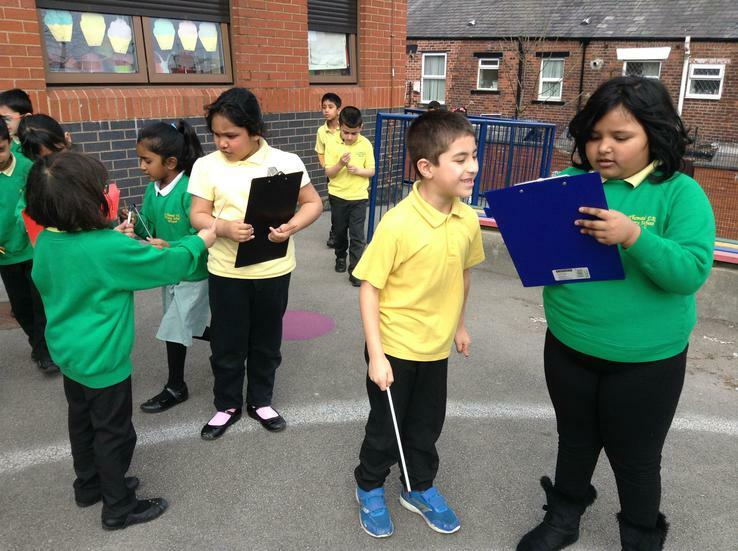 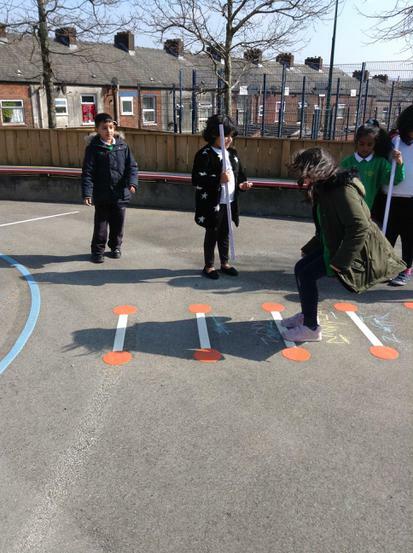 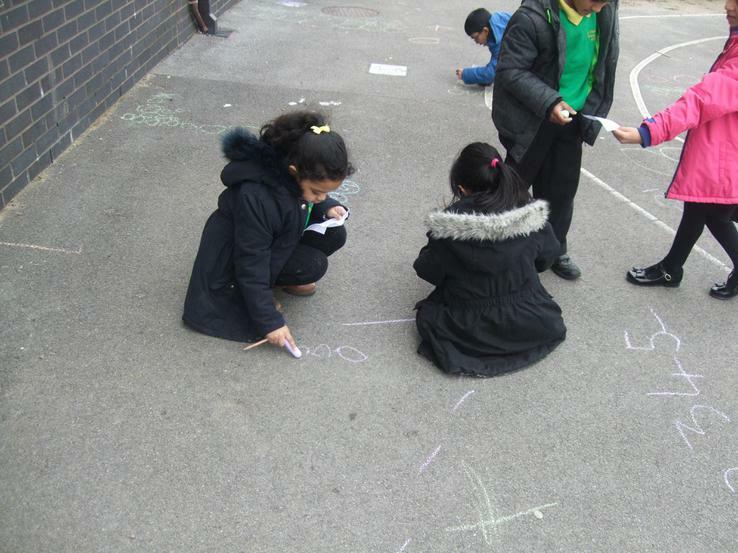 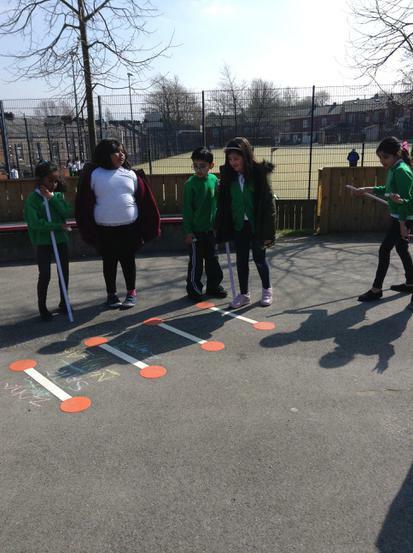 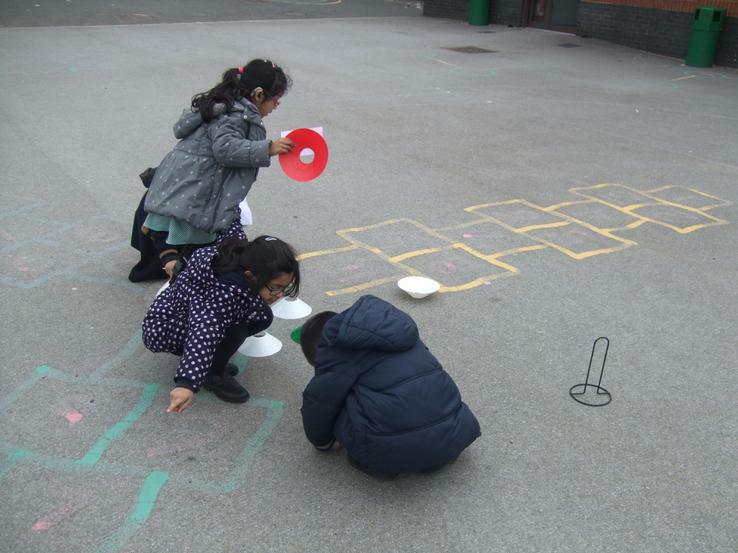 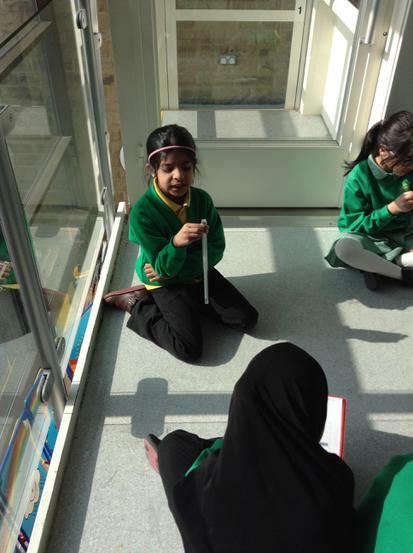 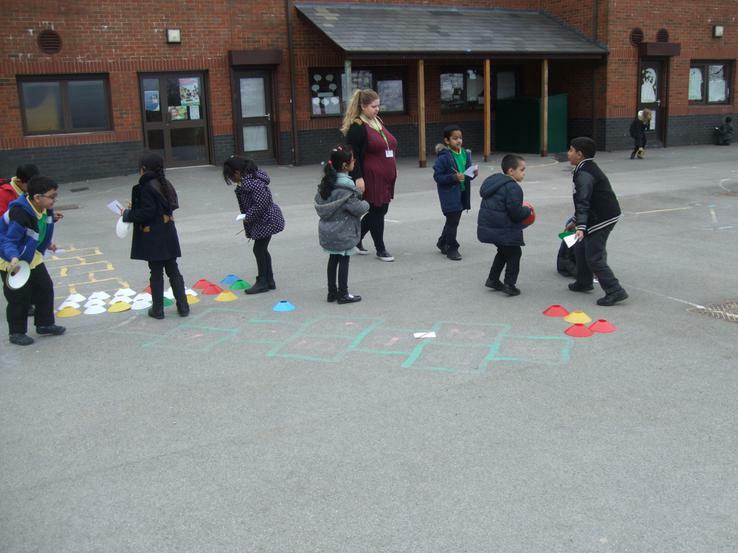 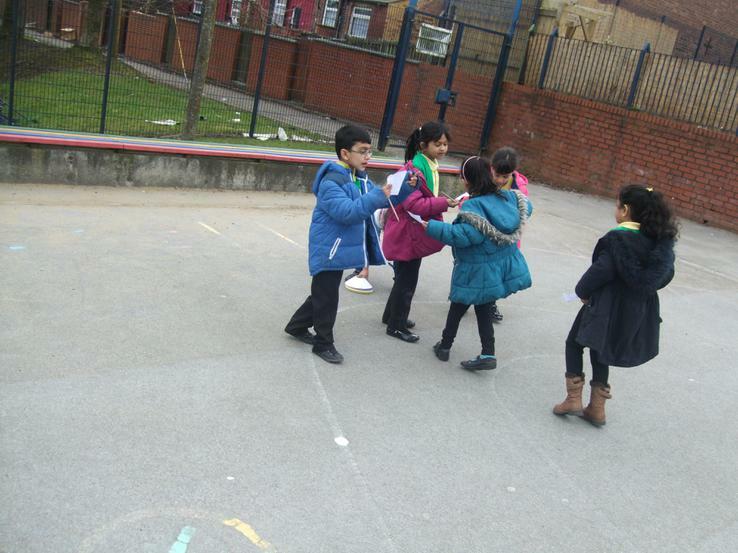 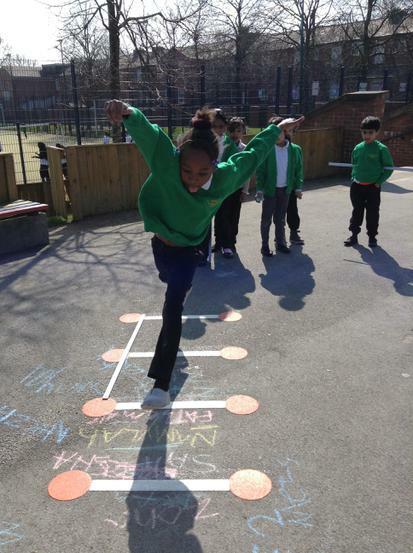 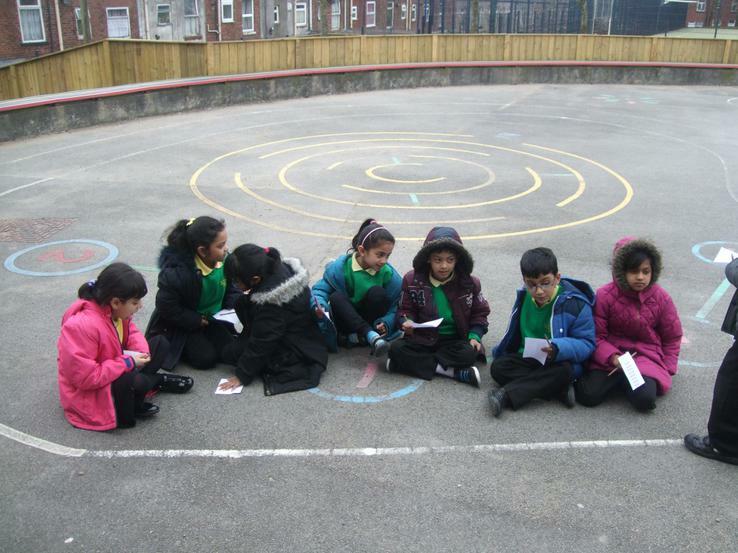 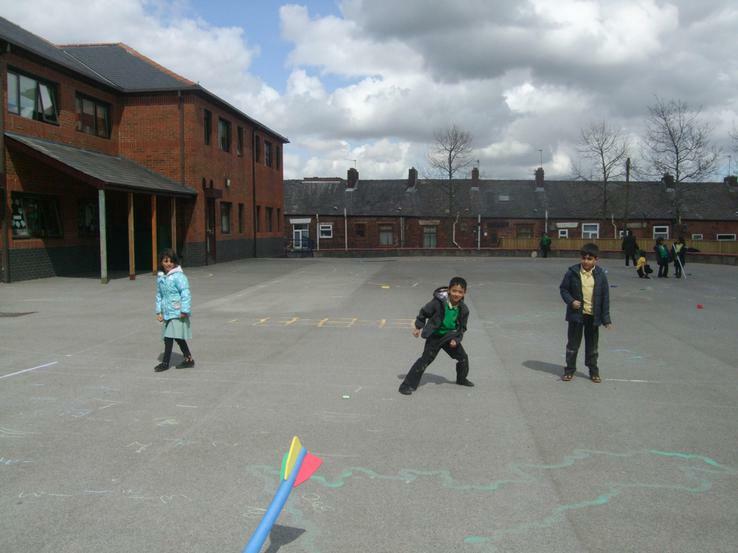 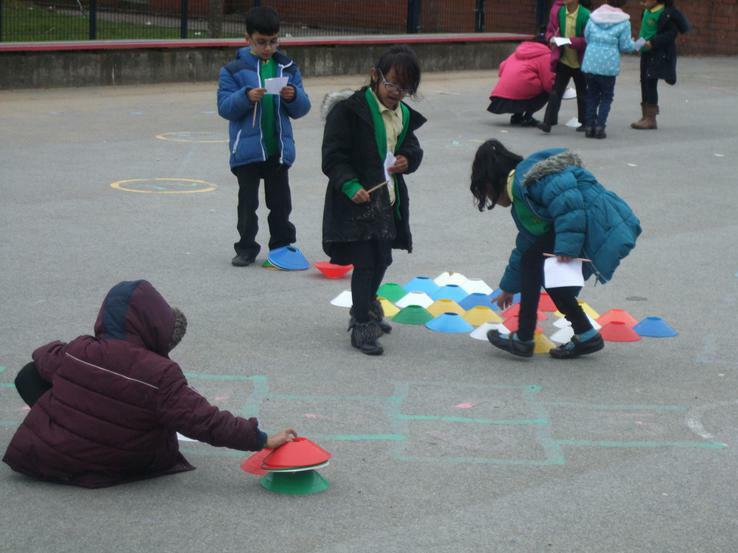 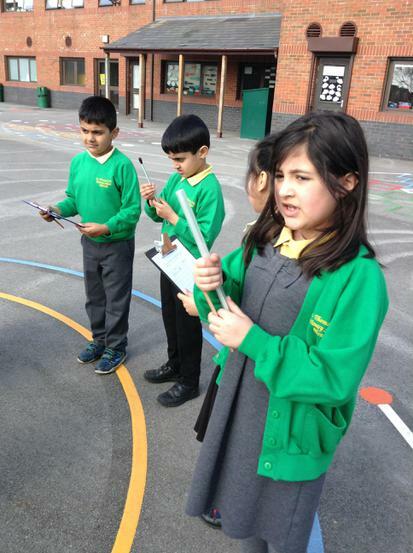 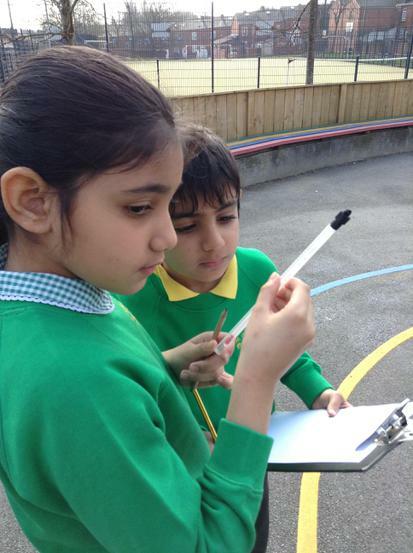 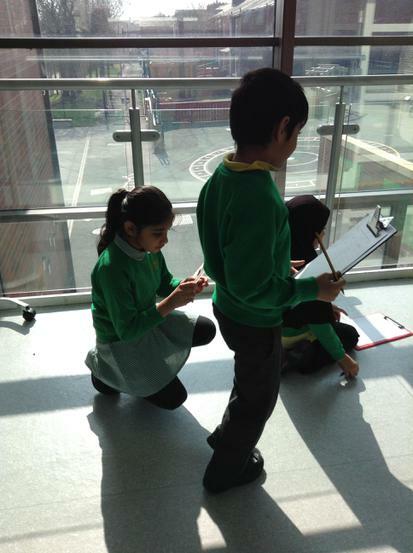 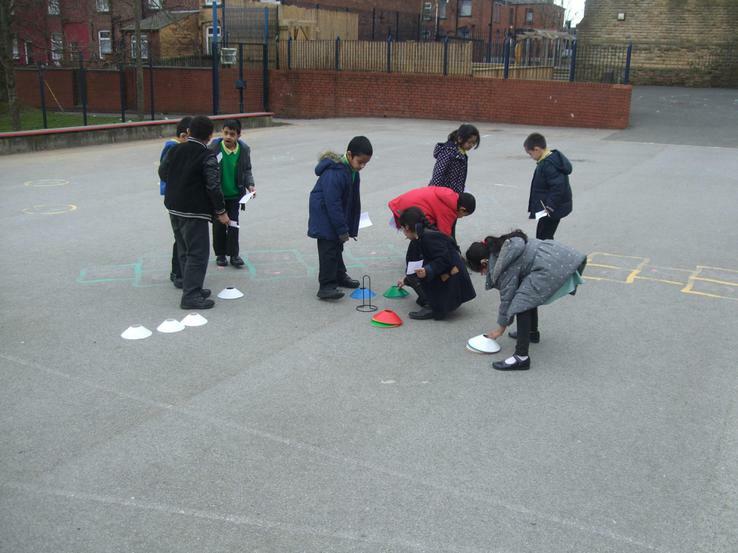 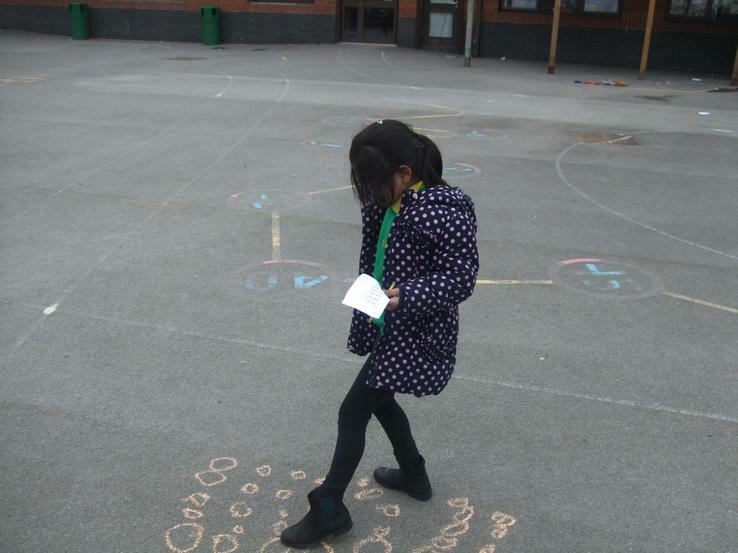 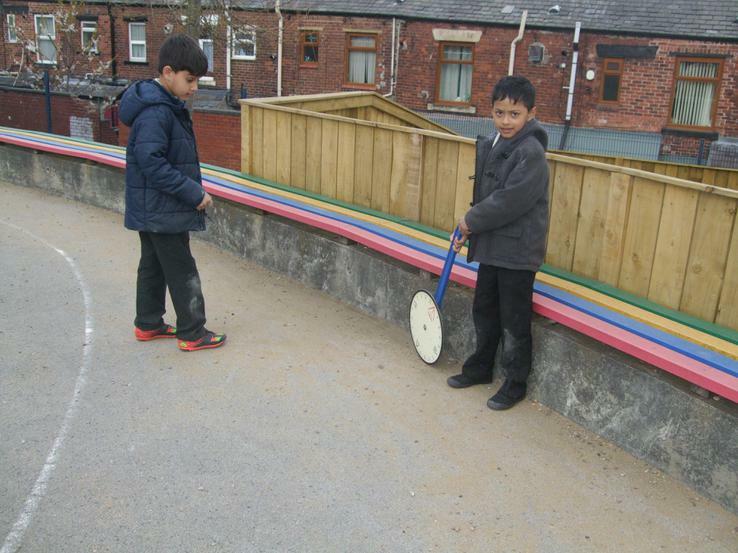 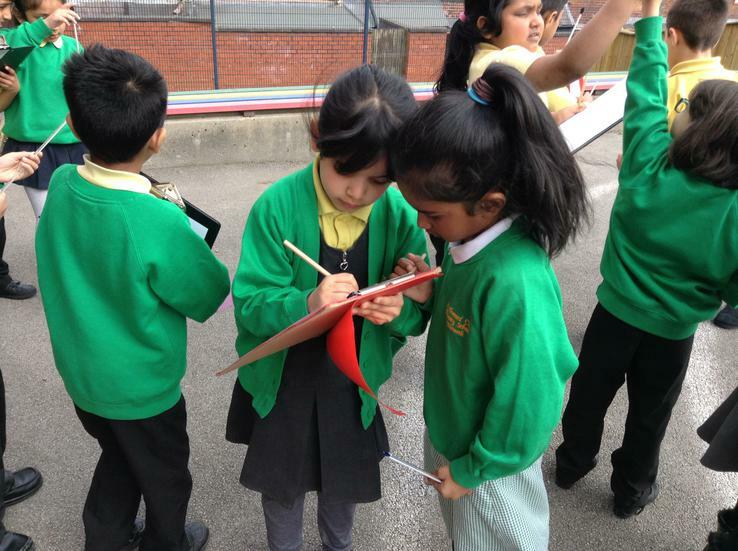 We have been taking our learning outside to draw and make arrays to help us multiply! 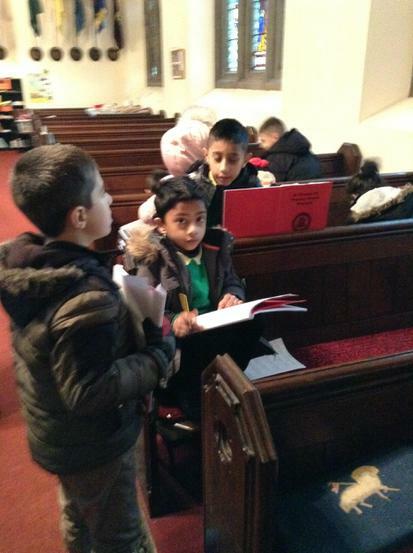 Visit to St Thomas' Church. 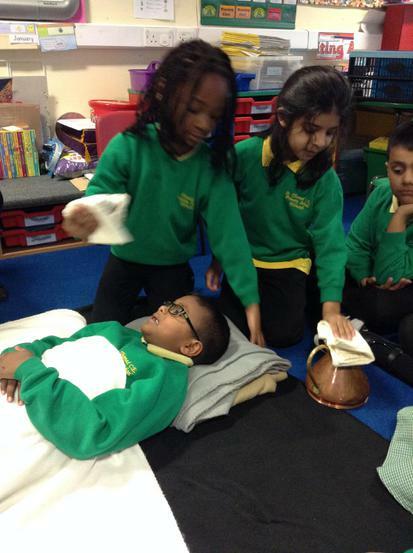 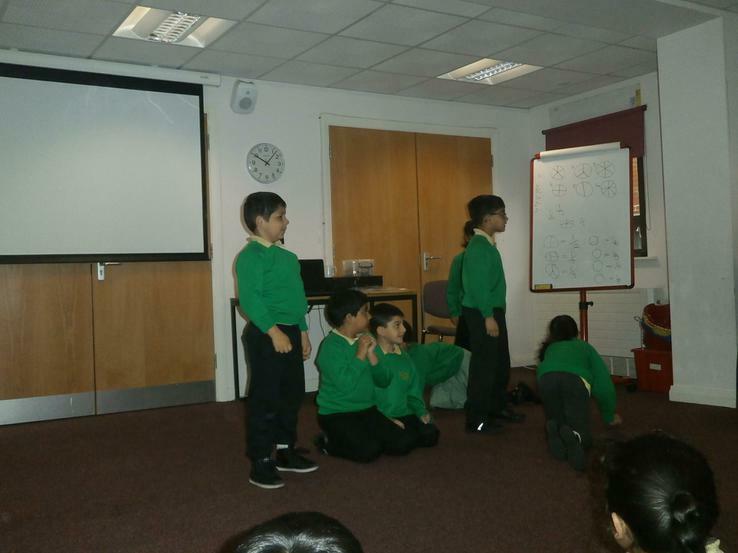 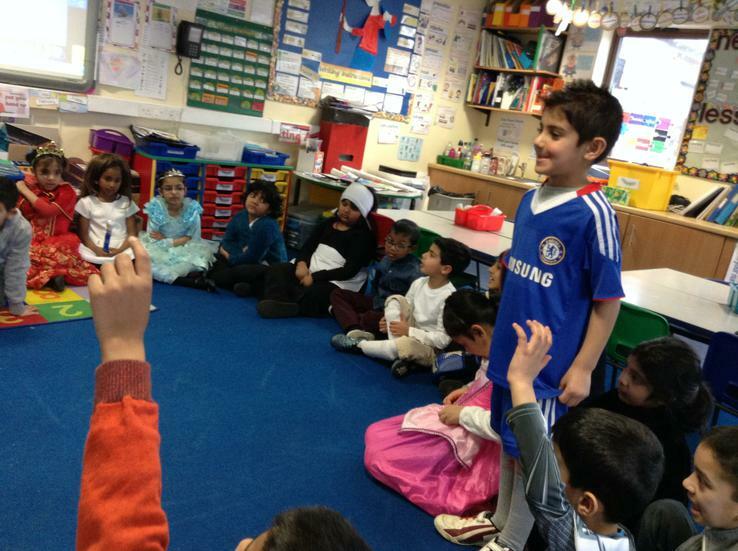 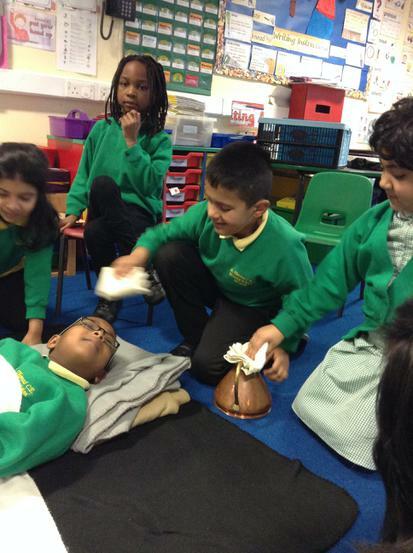 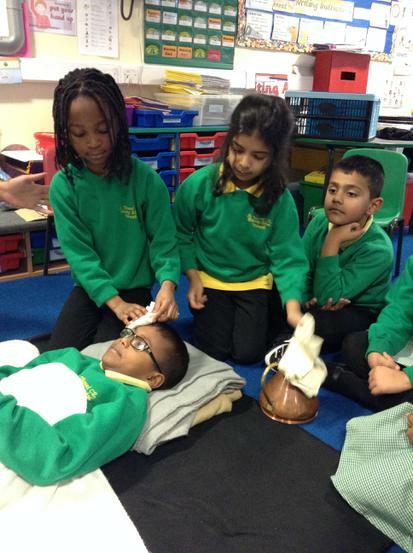 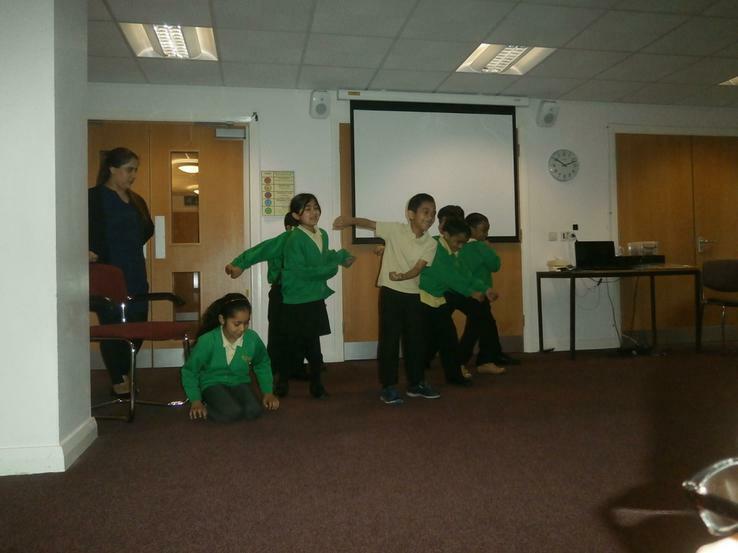 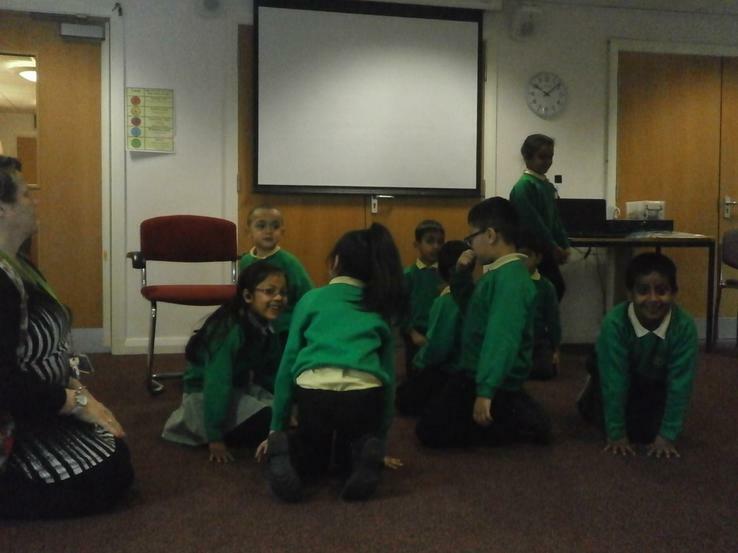 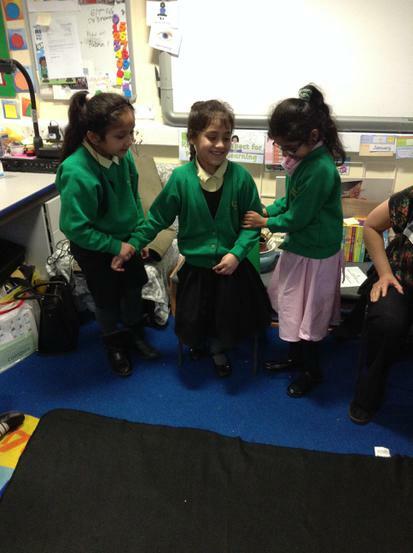 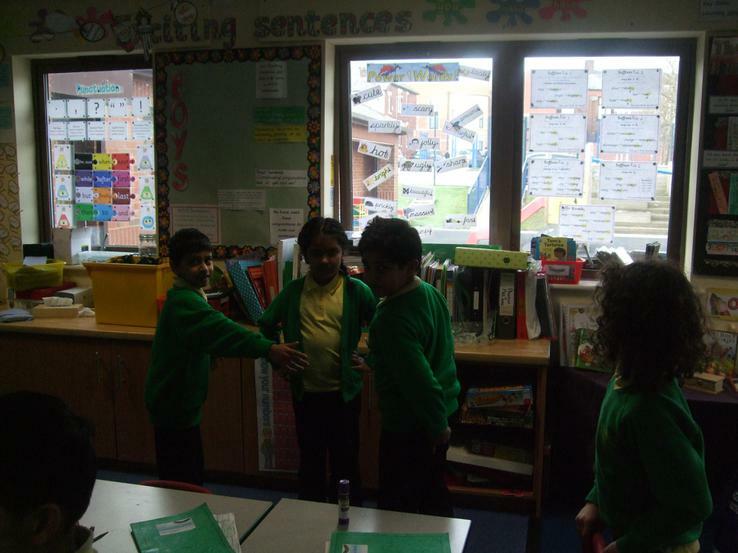 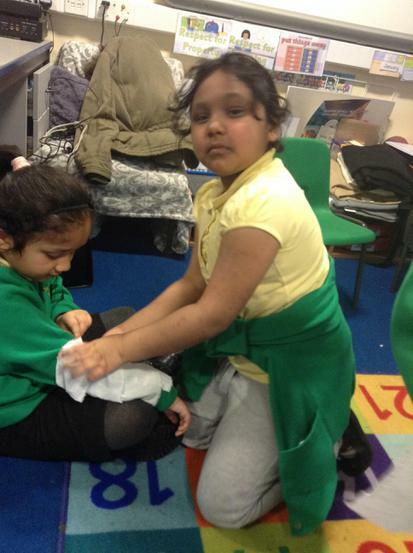 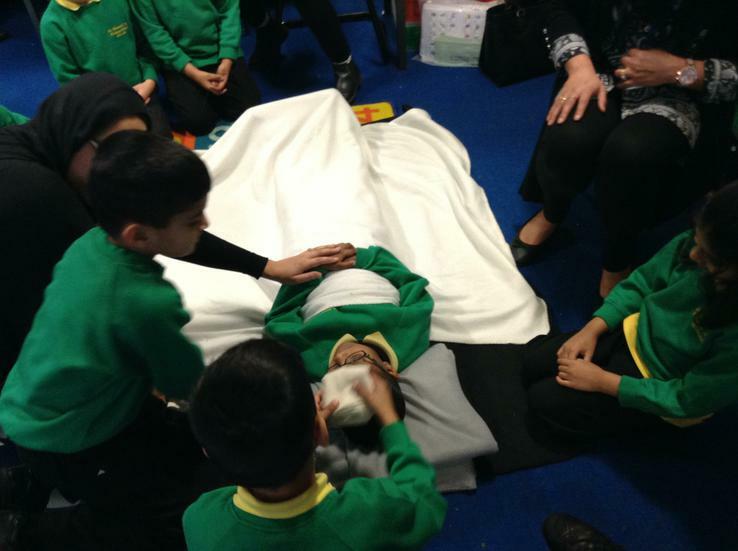 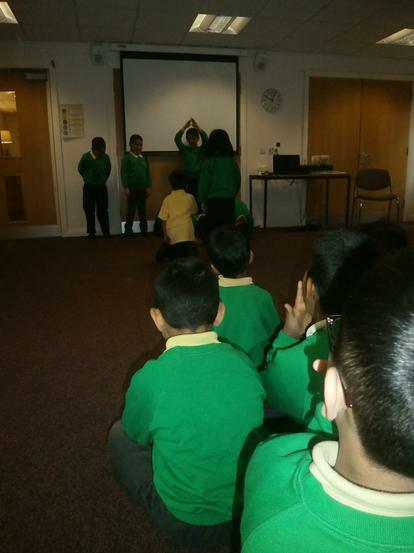 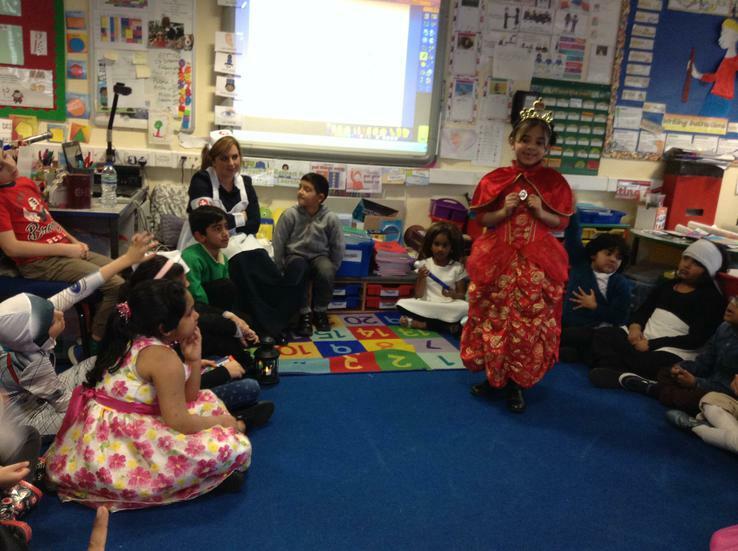 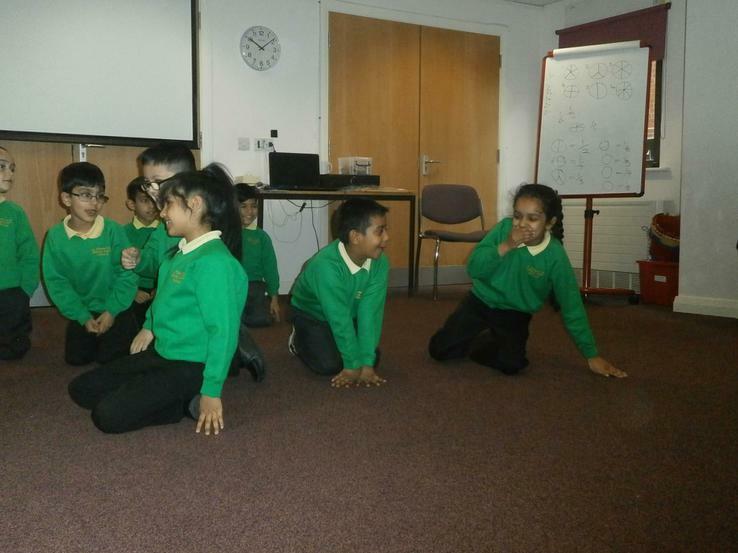 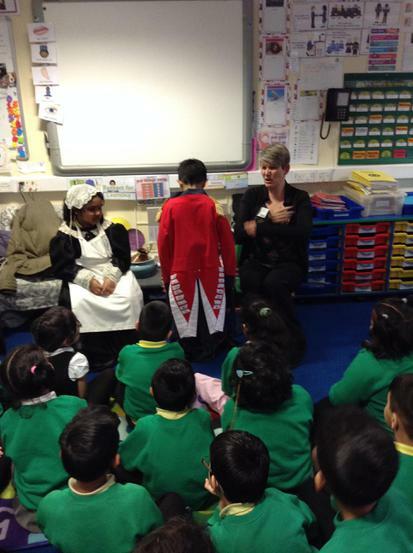 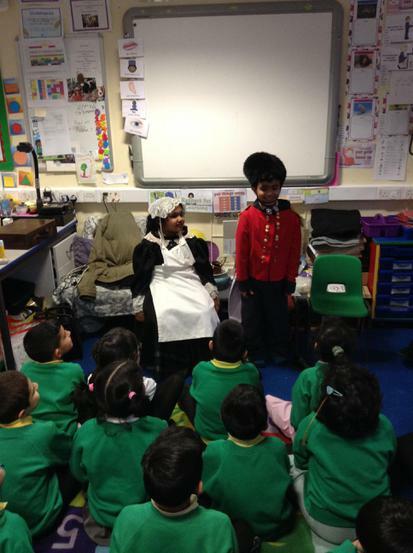 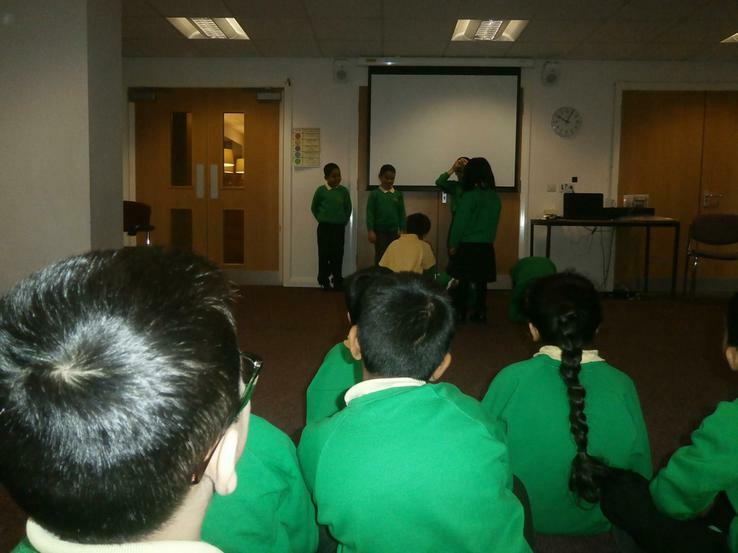 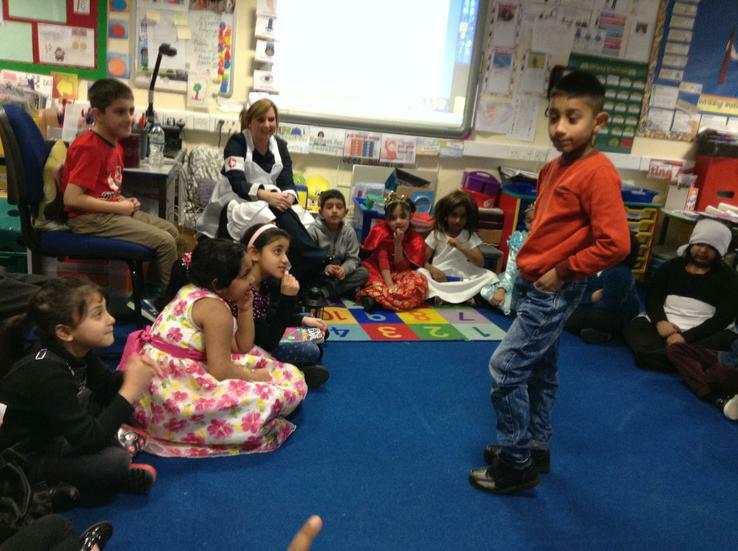 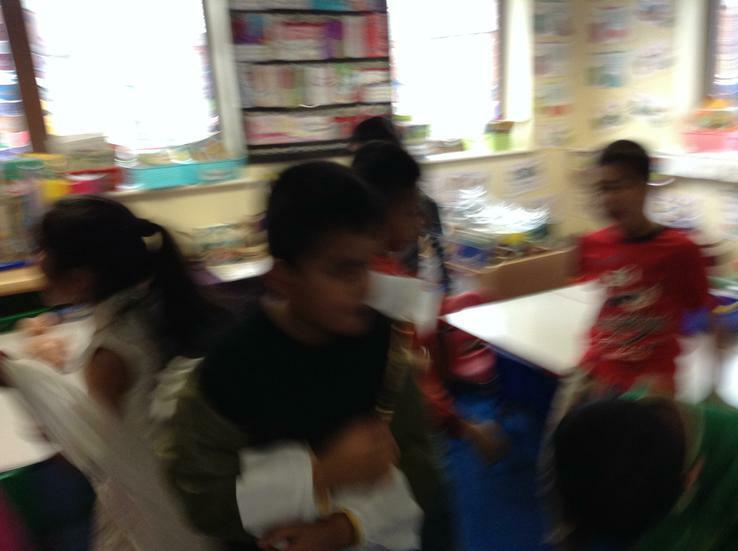 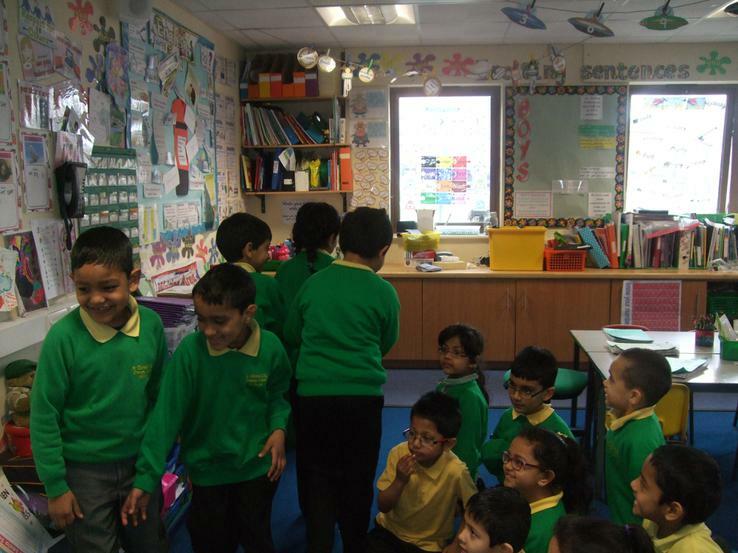 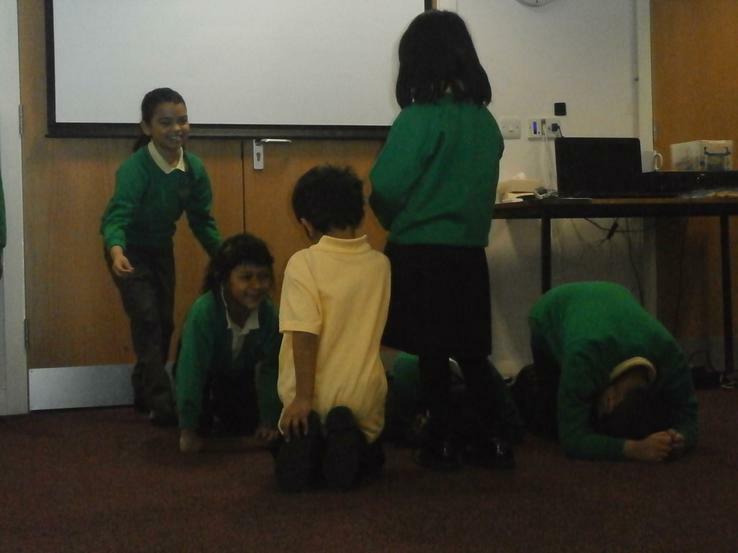 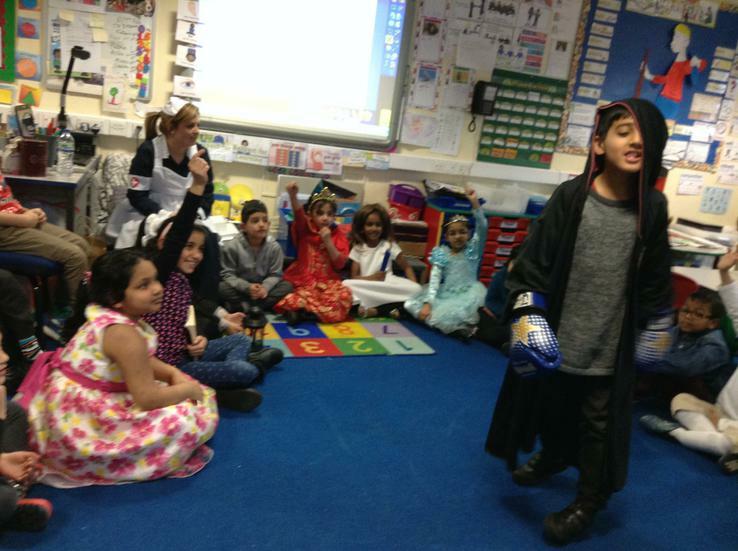 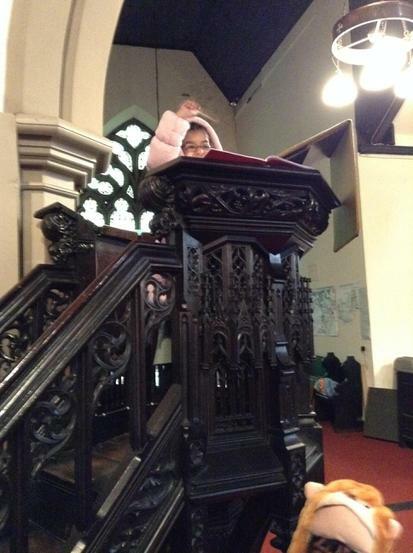 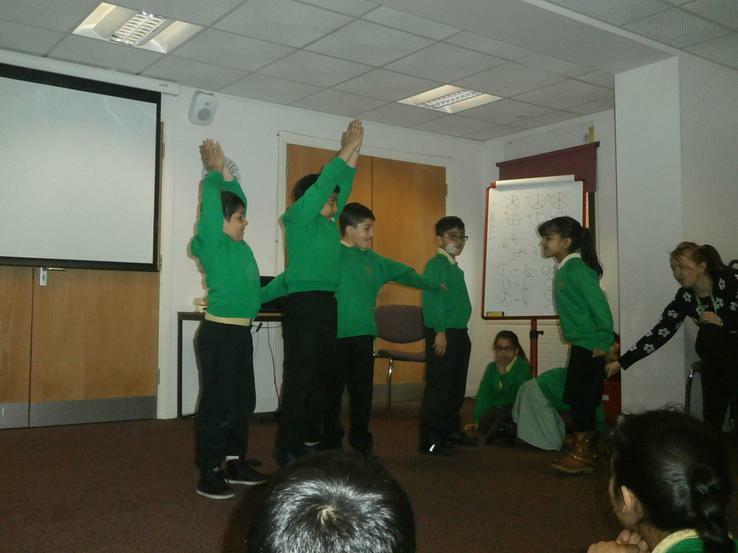 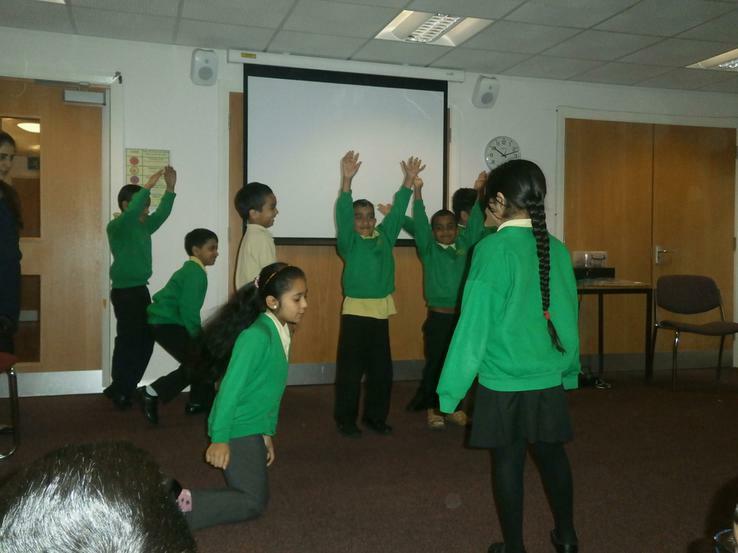 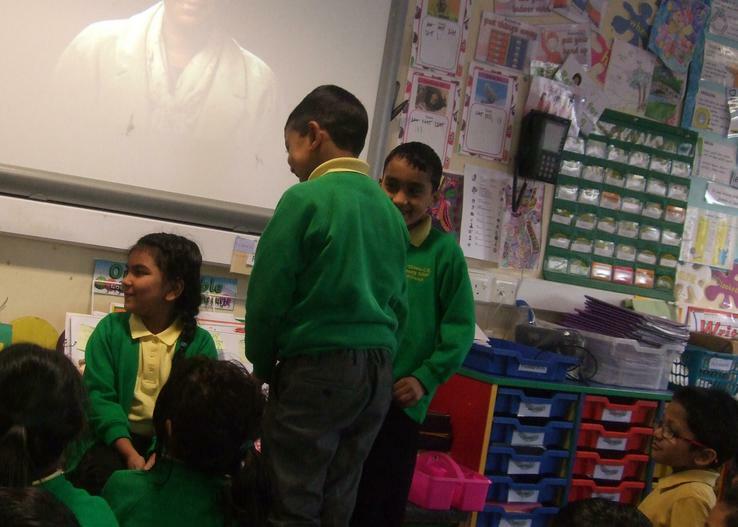 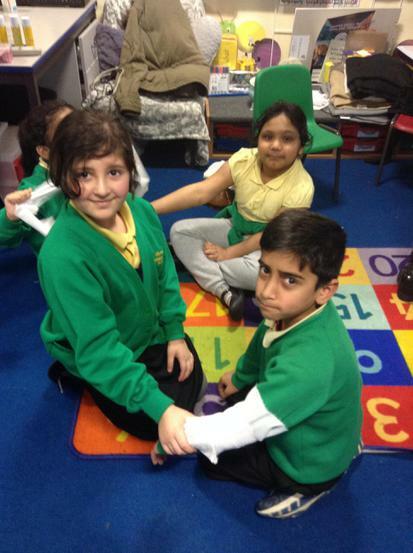 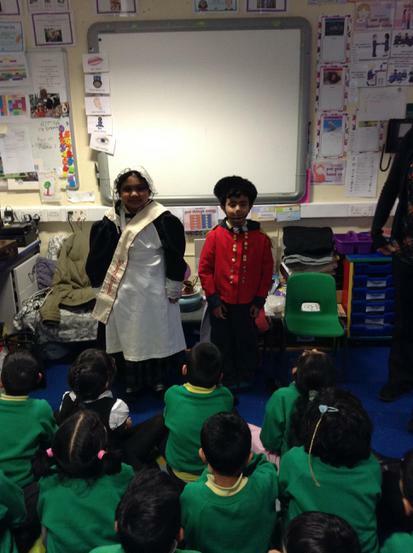 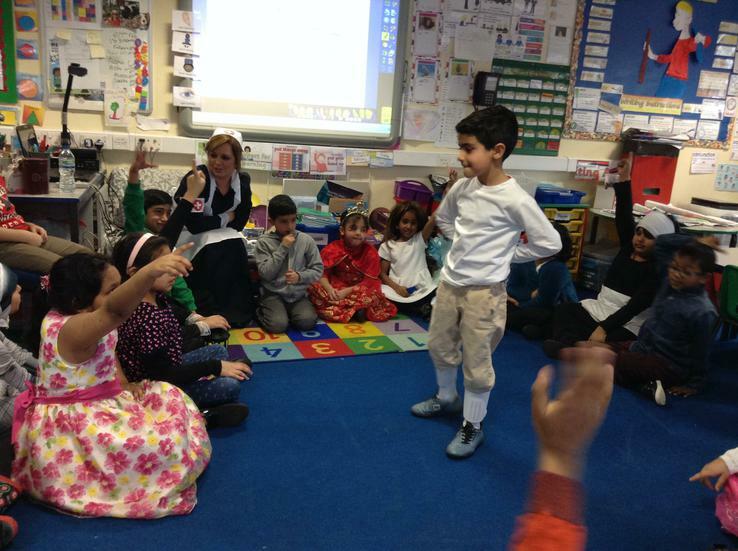 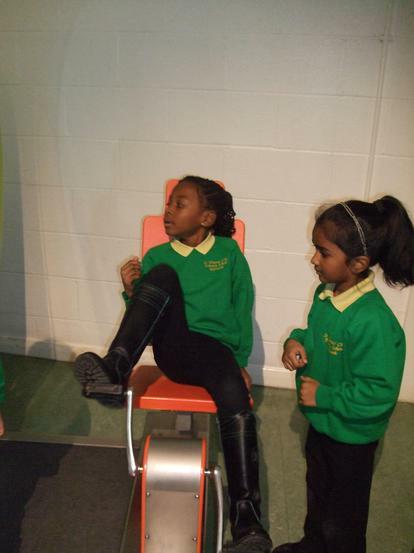 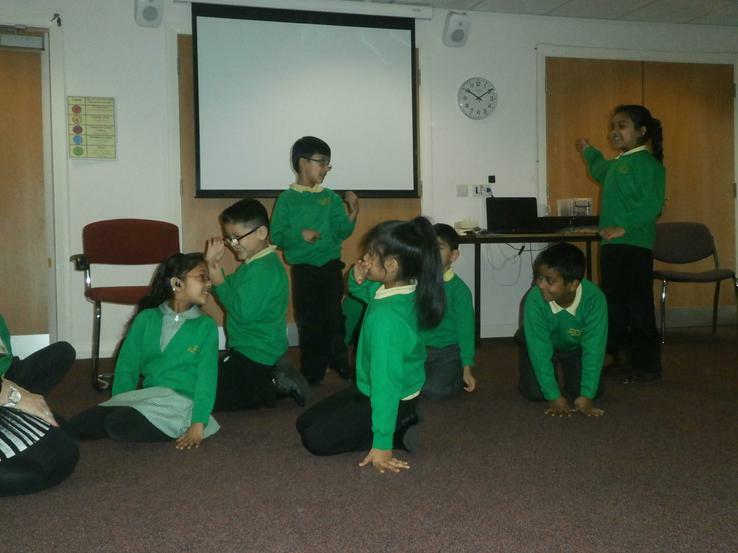 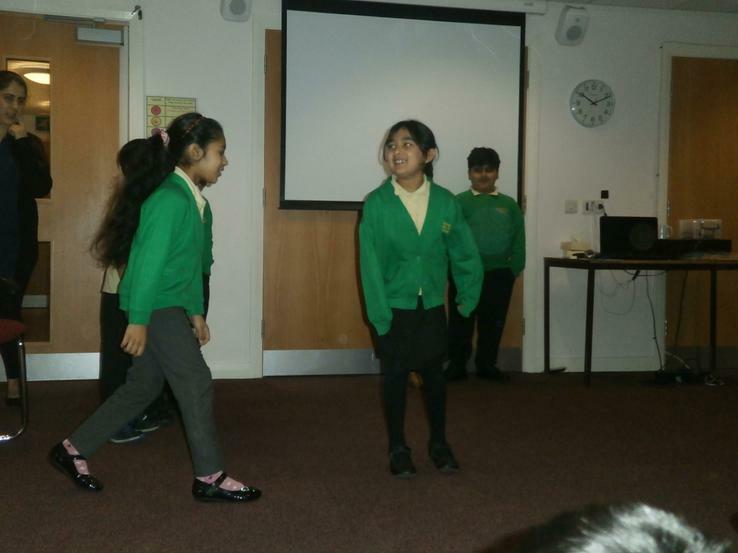 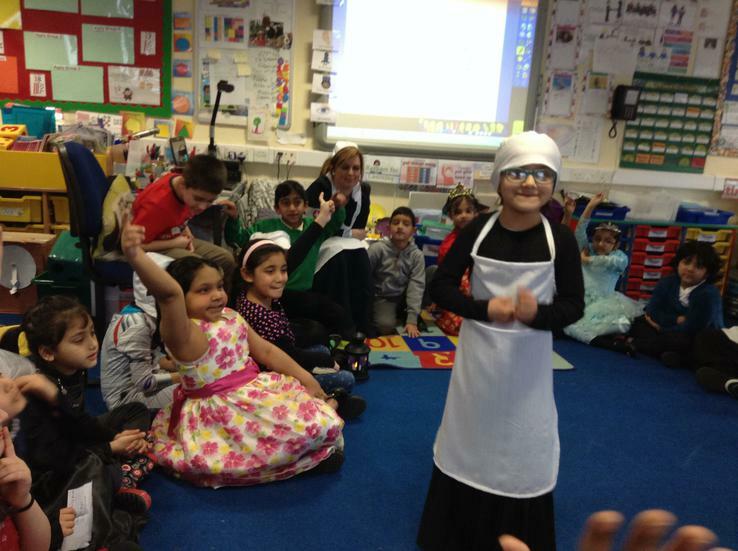 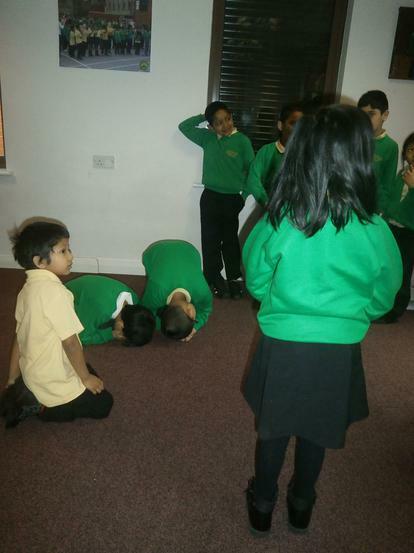 We learnt all about Rosa Parks life through drama! 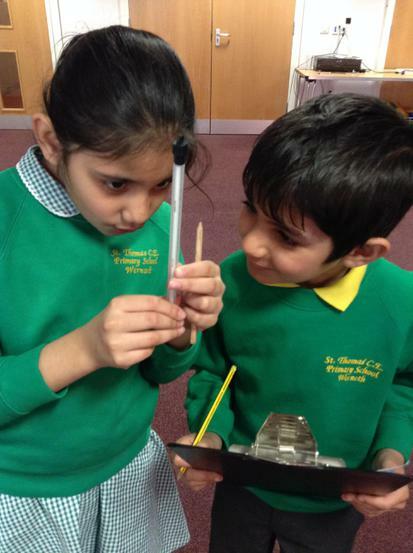 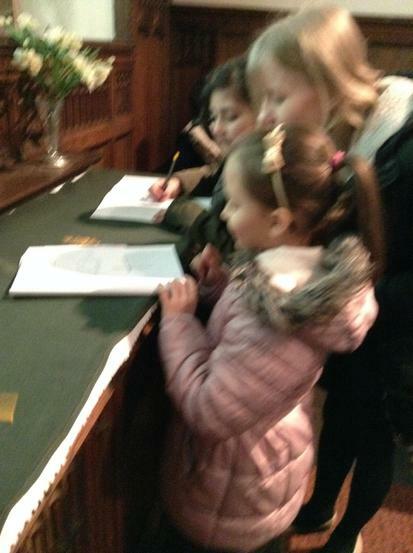 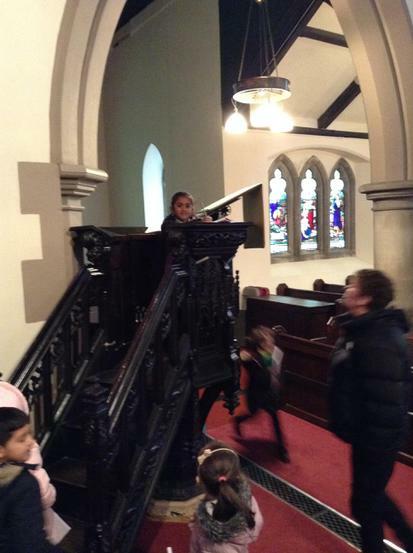 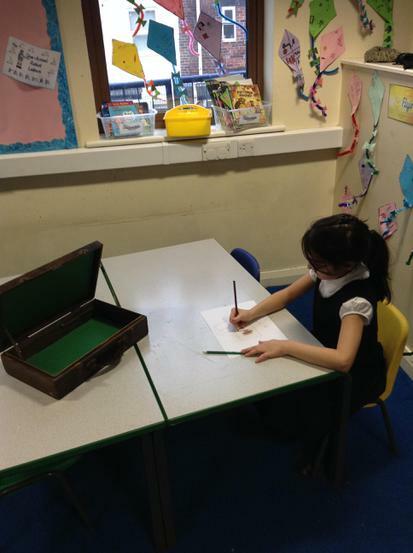 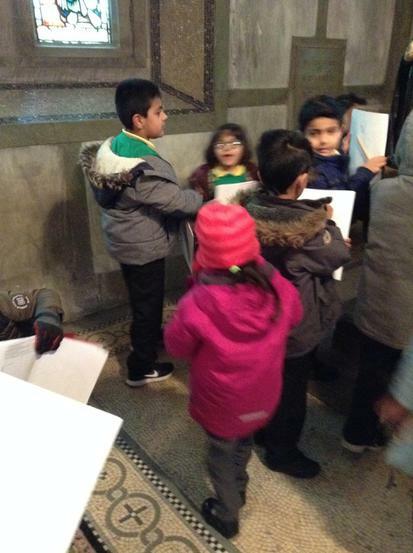 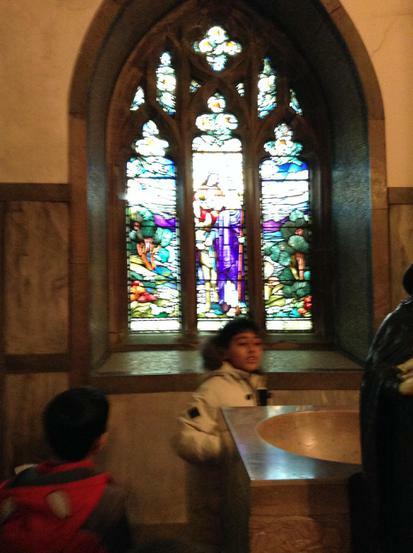 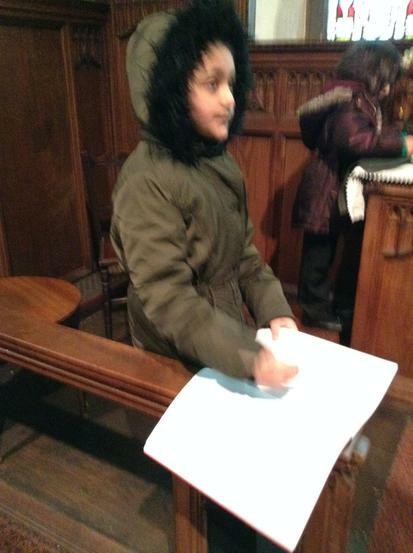 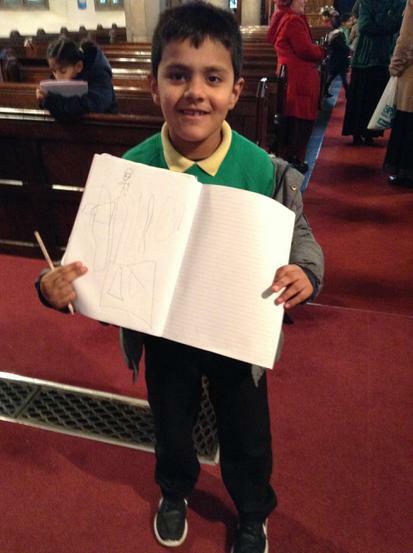 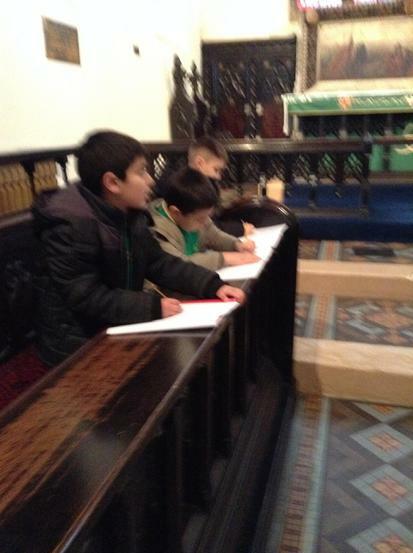 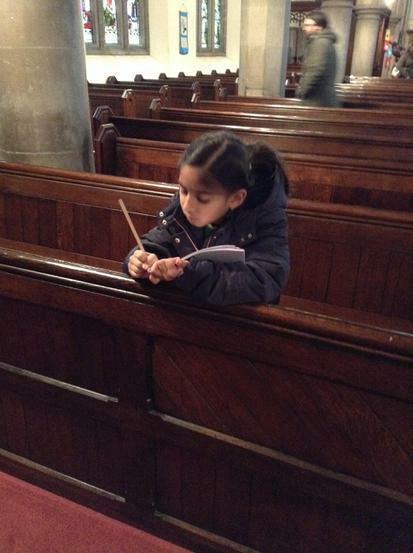 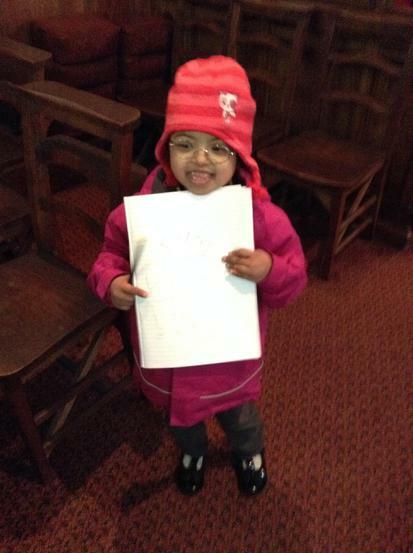 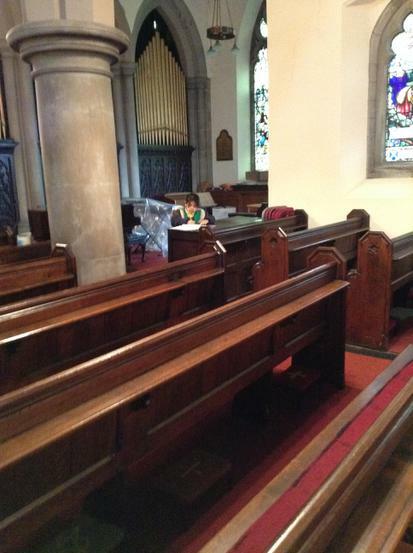 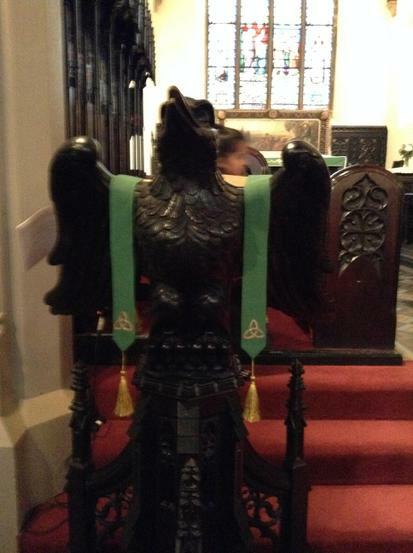 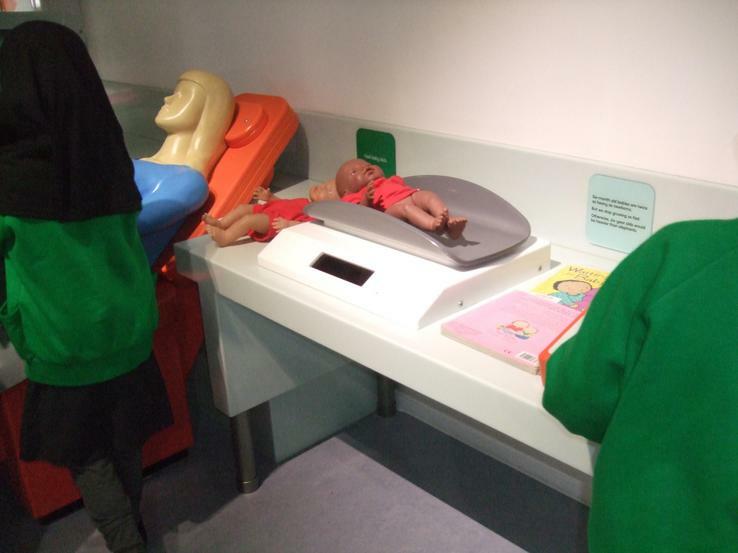 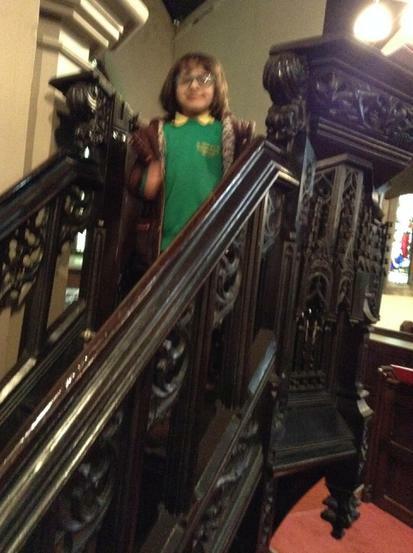 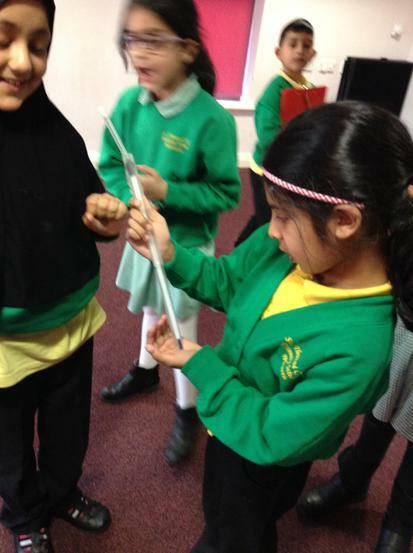 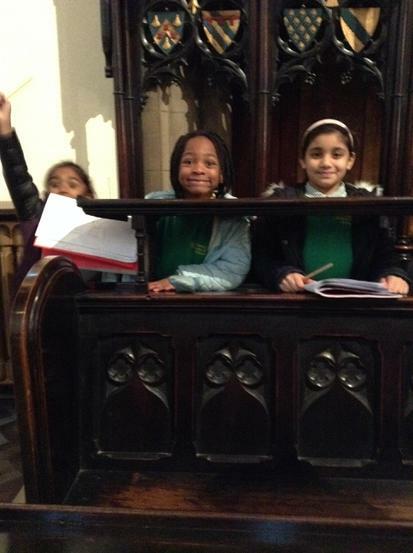 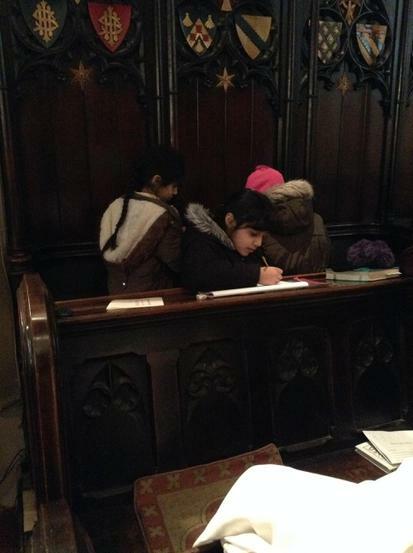 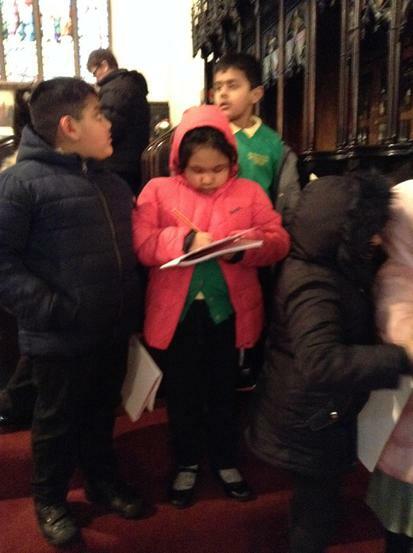 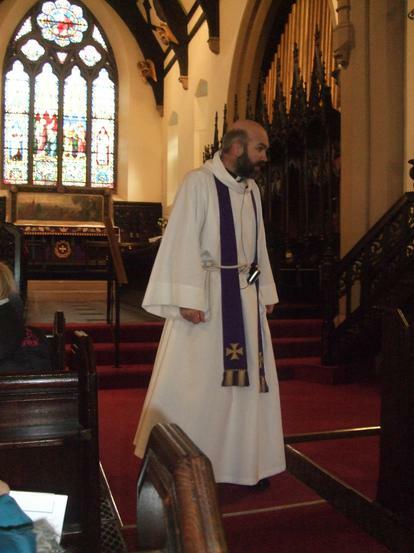 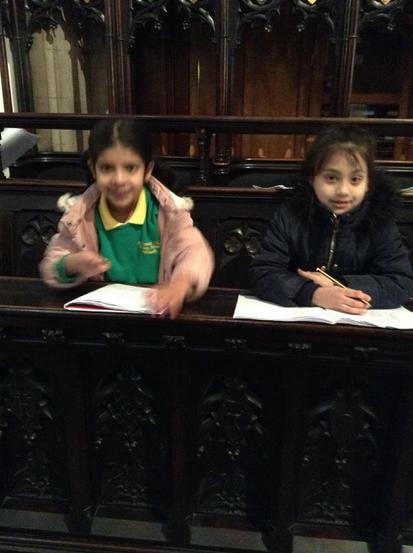 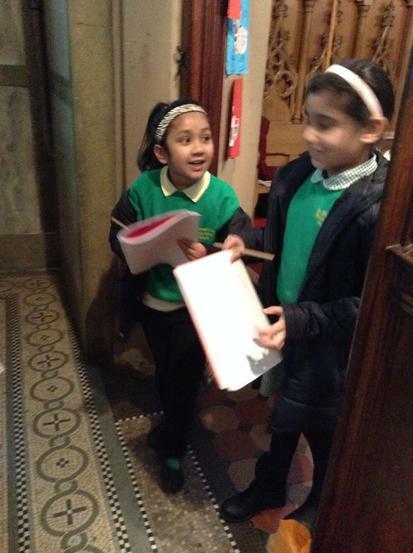 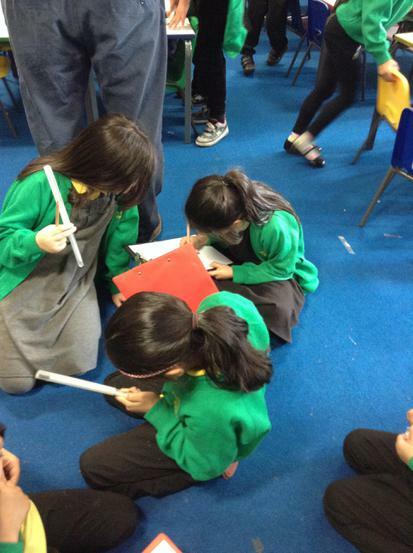 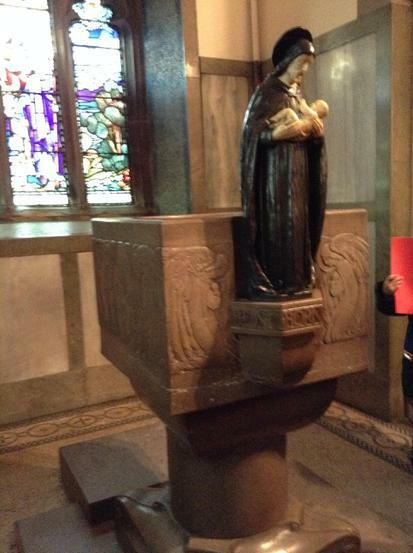 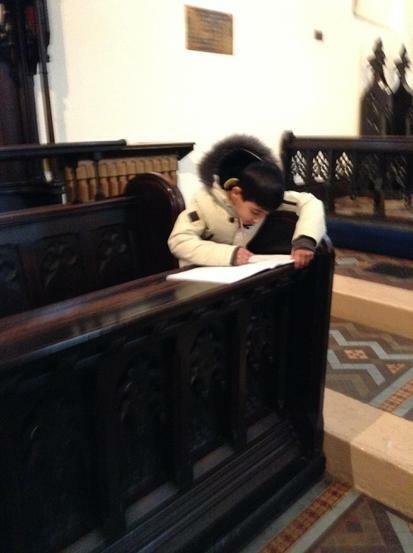 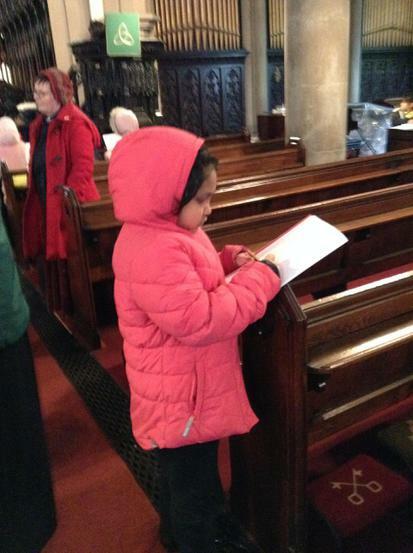 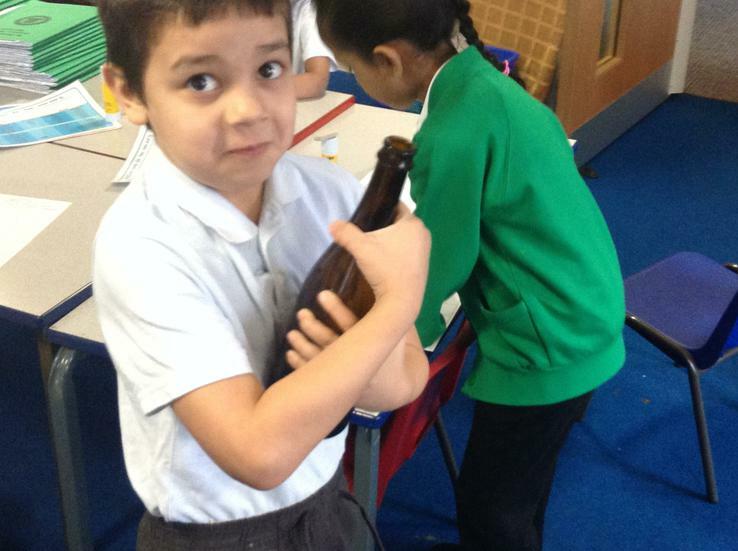 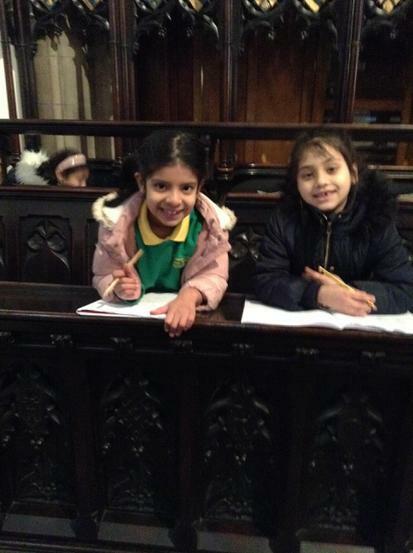 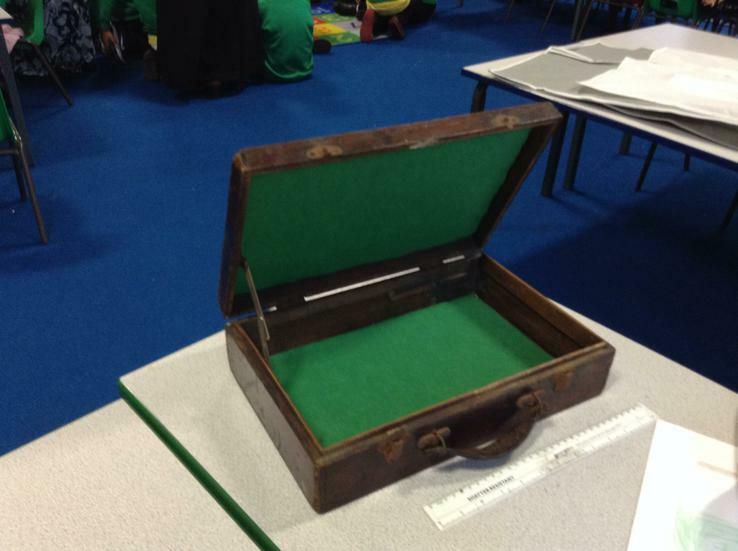 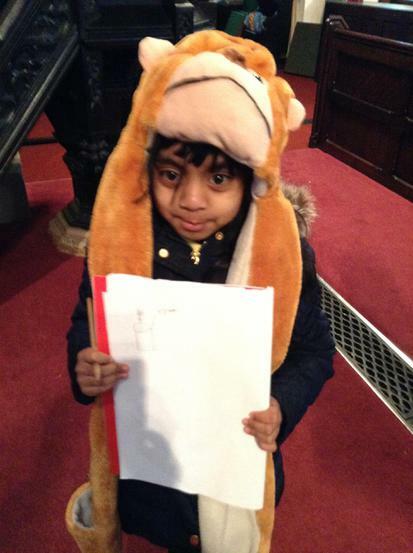 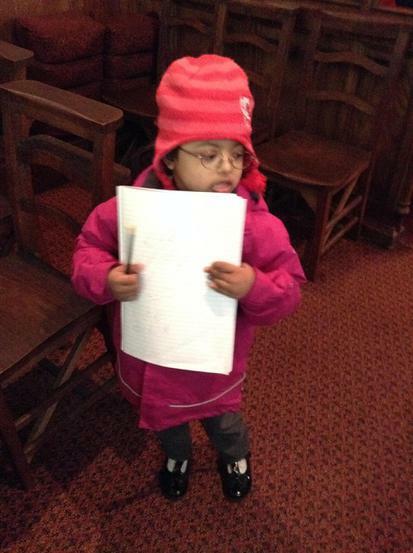 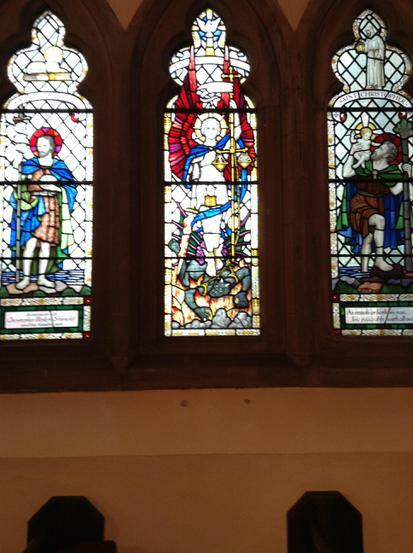 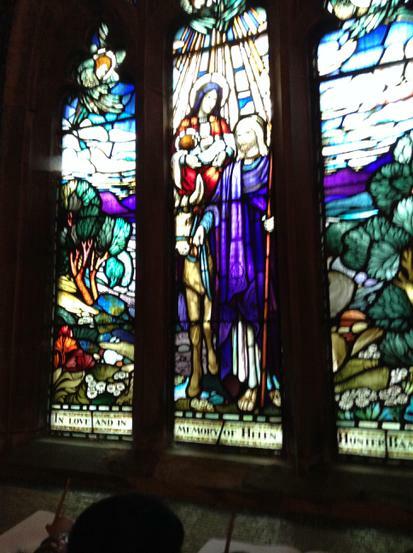 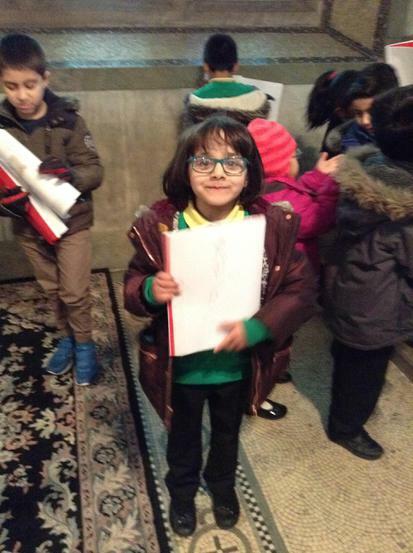 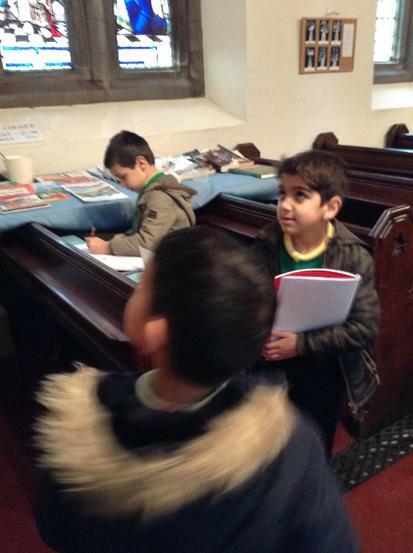 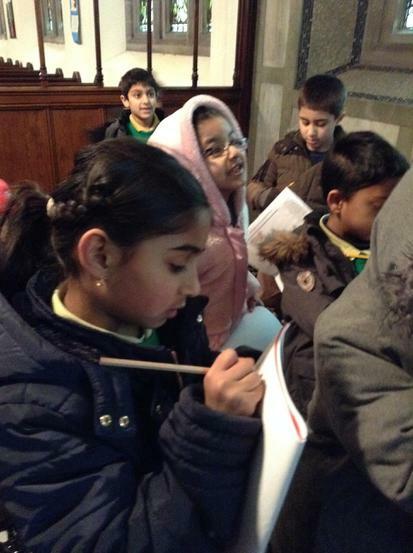 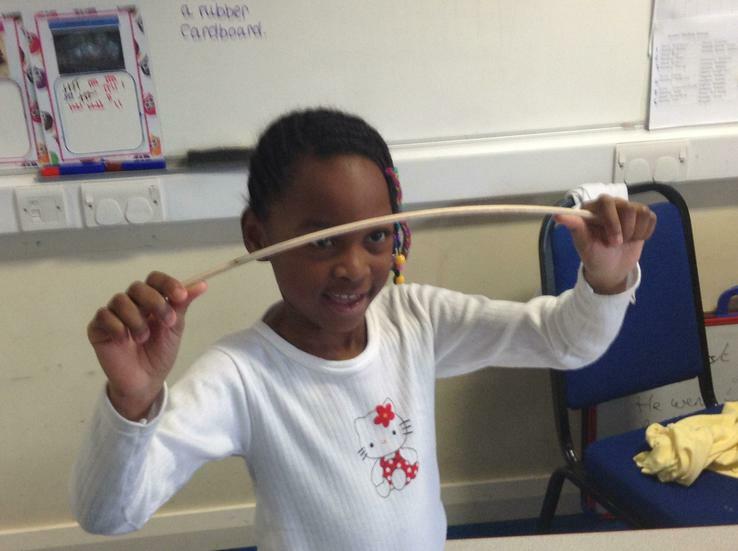 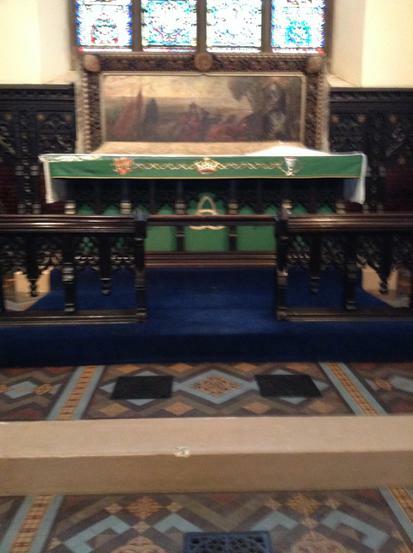 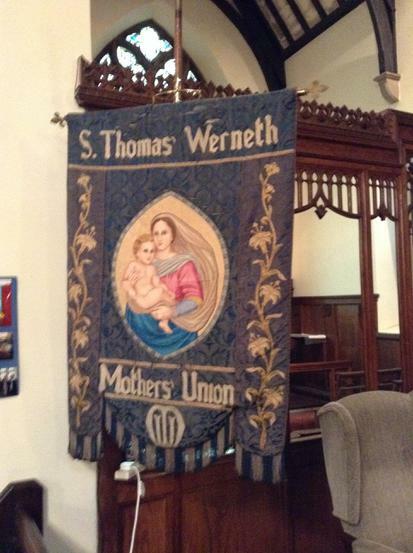 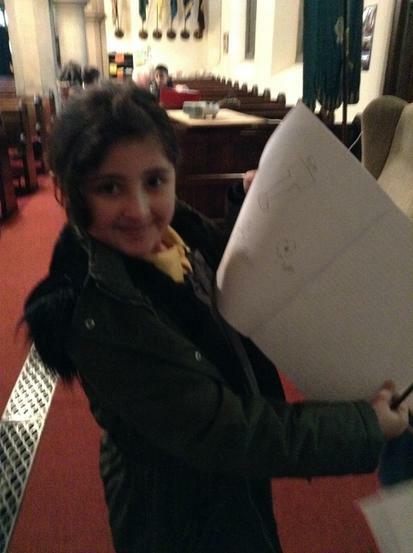 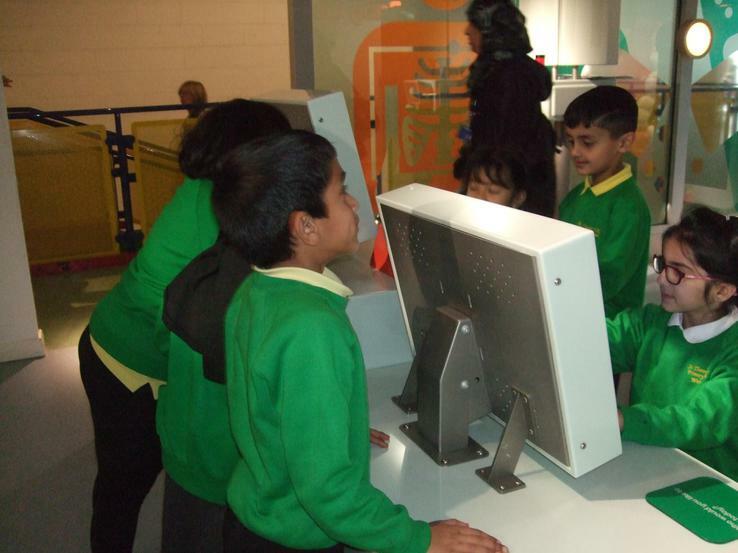 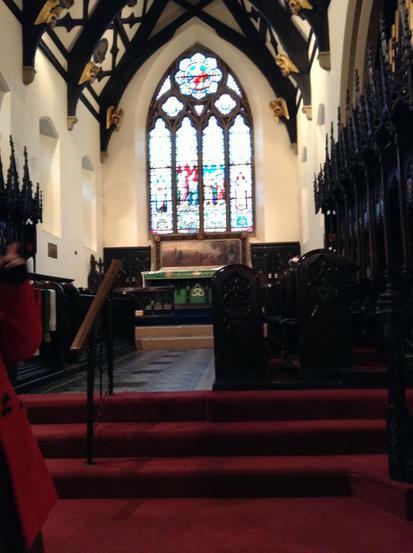 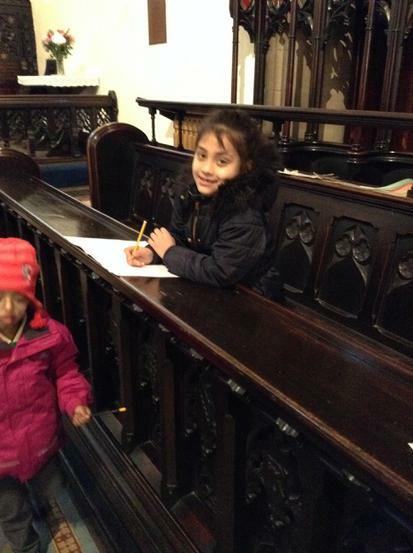 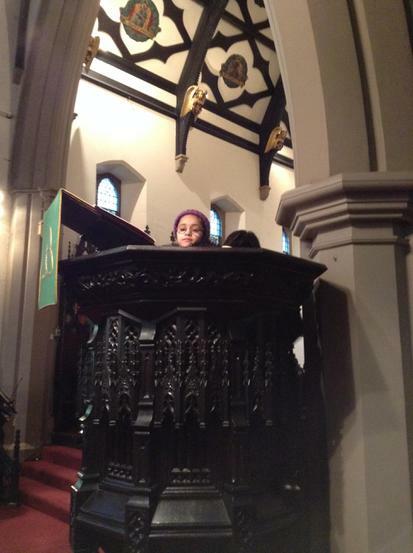 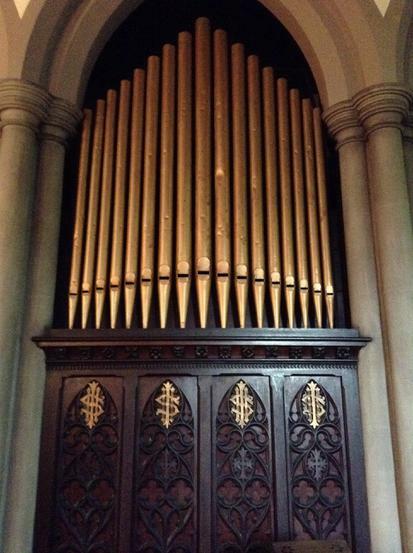 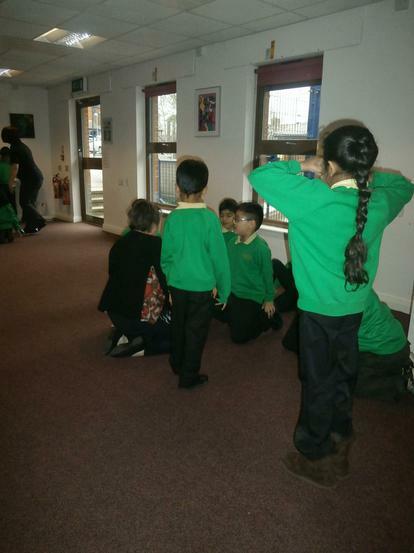 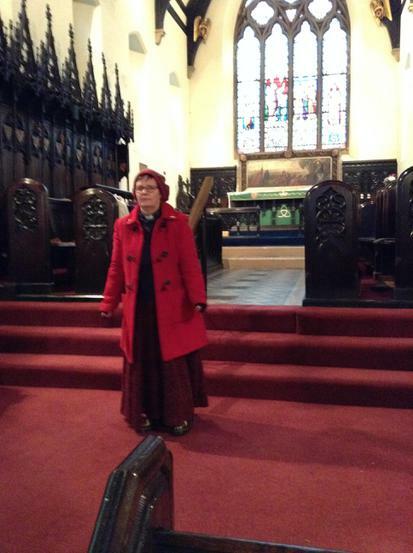 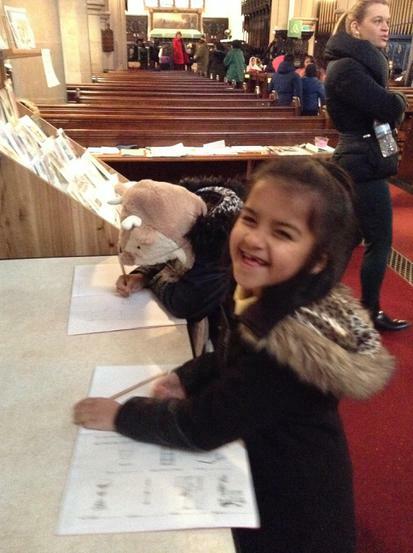 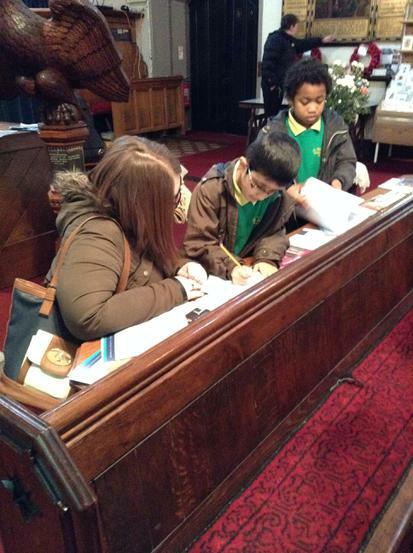 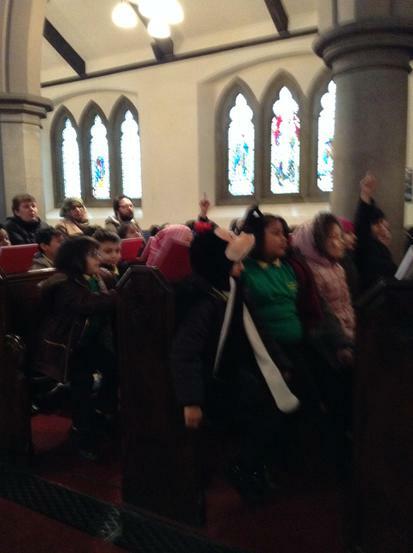 On Wednesday 24th February we visited St Thomas Church to look at all the important objects!